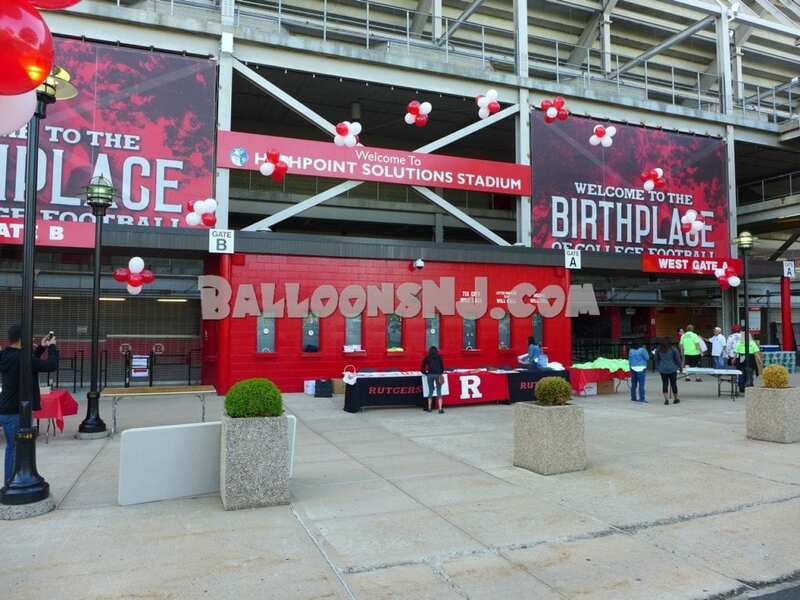 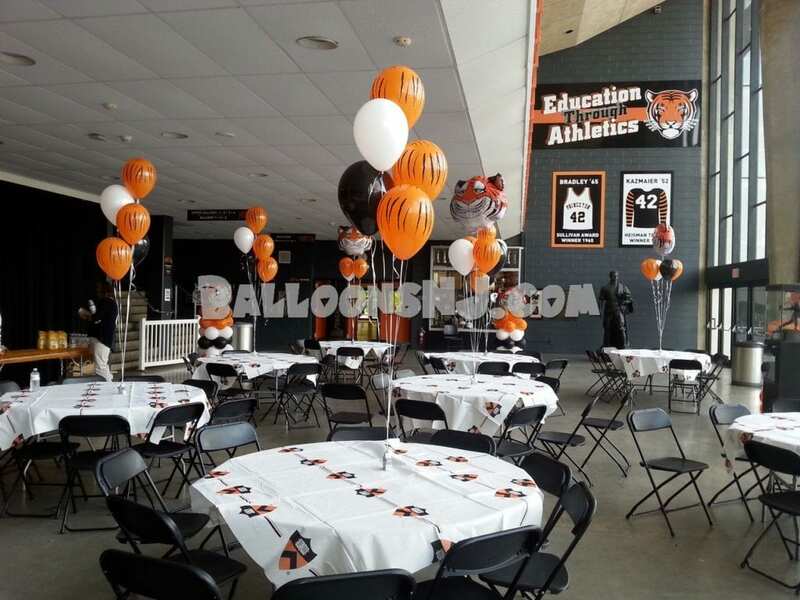 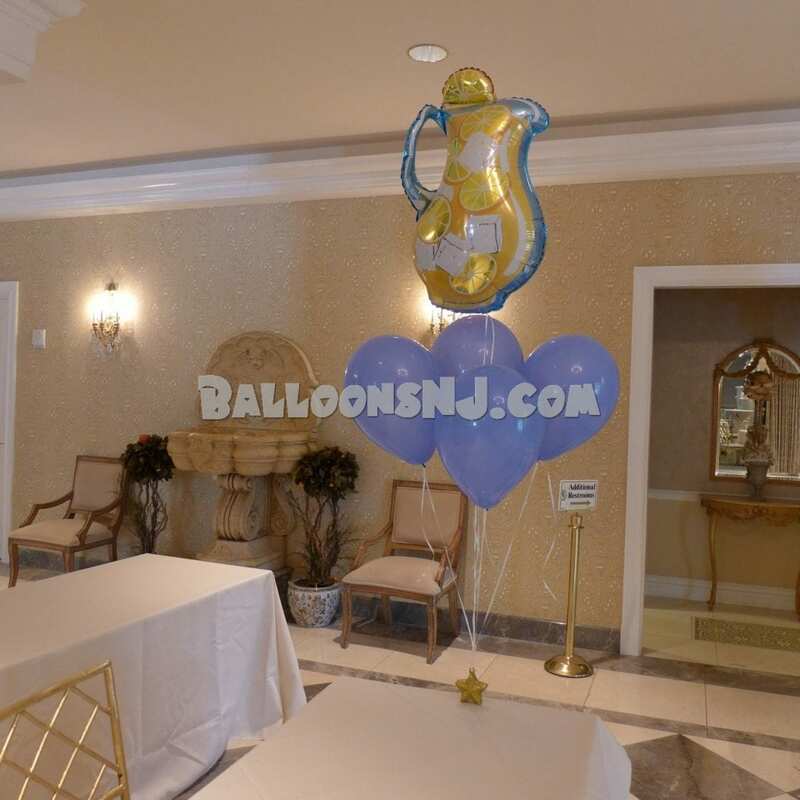 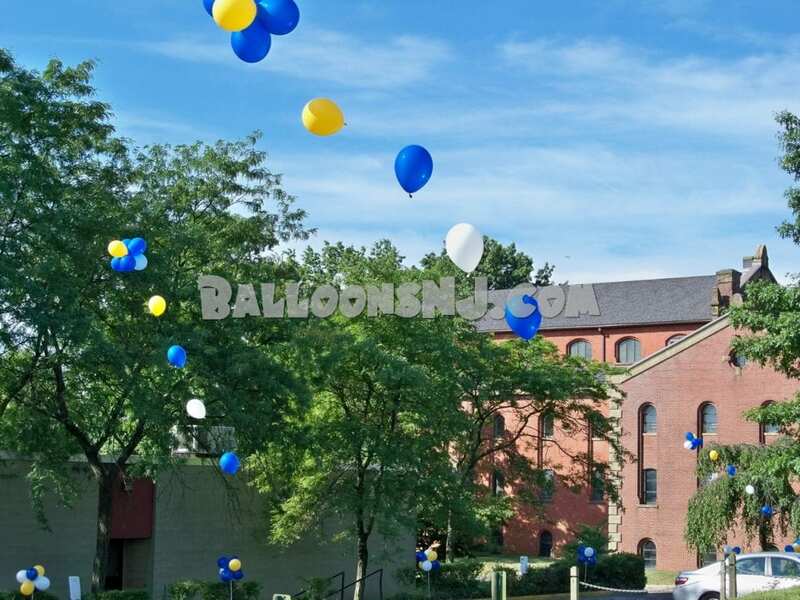 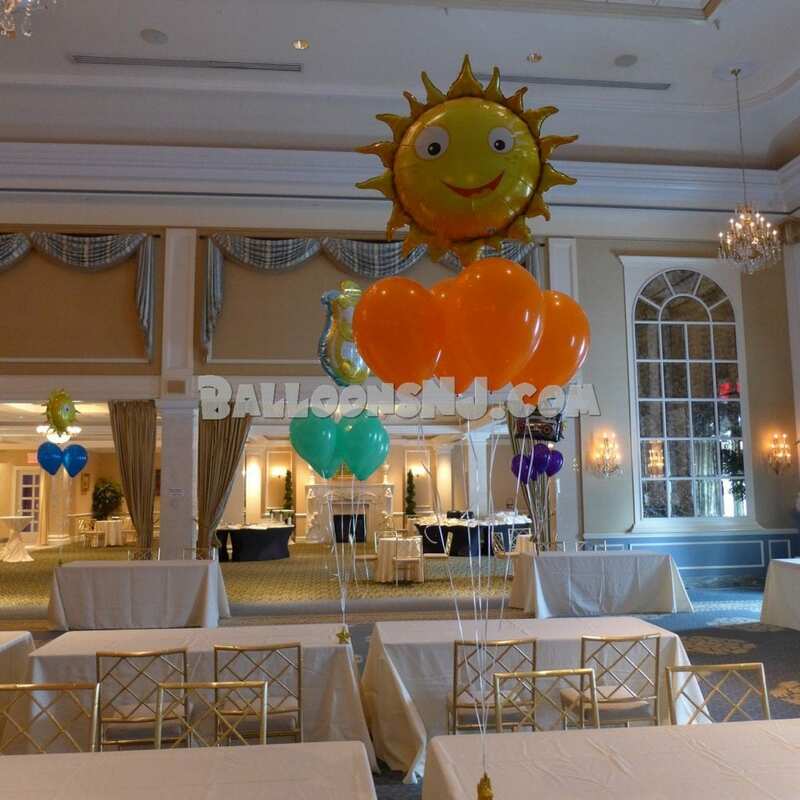 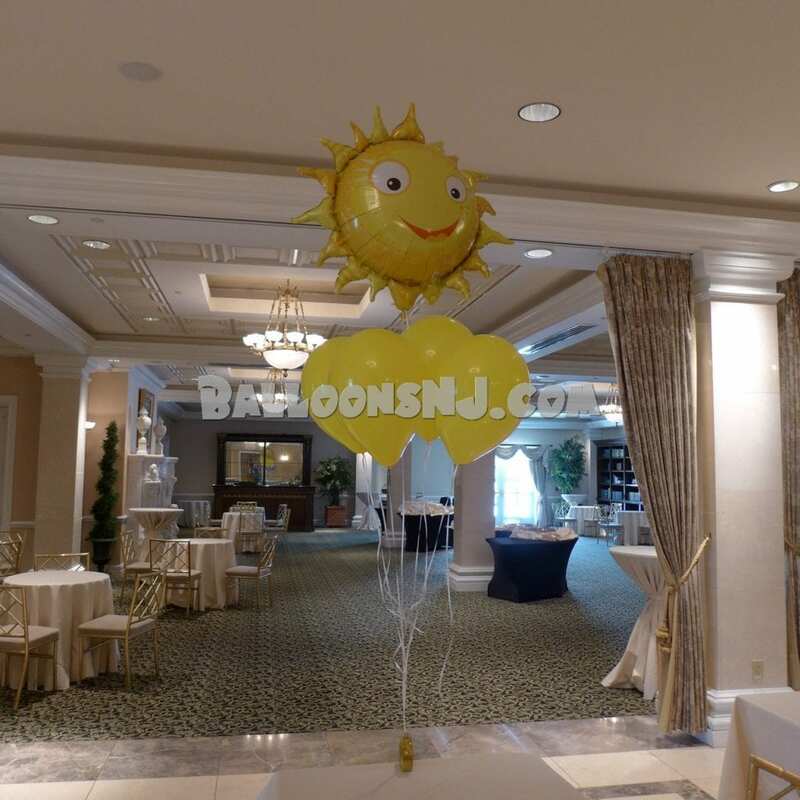 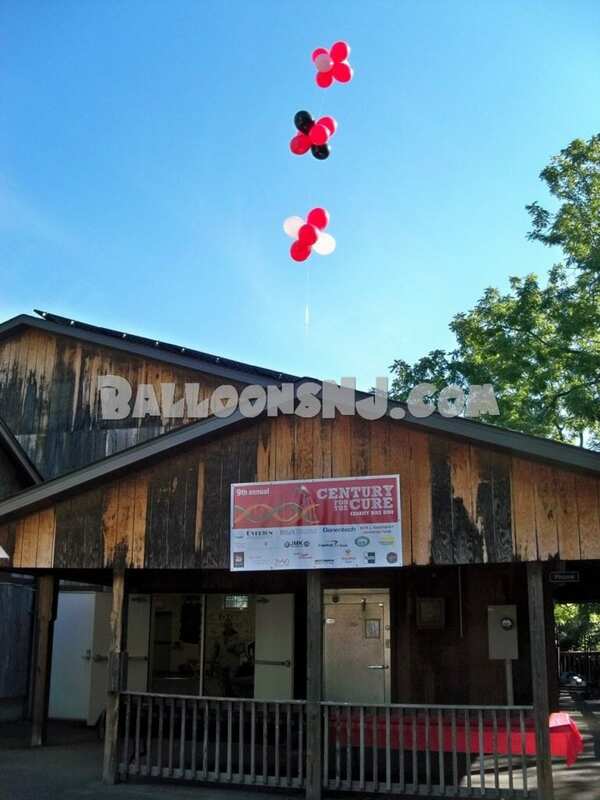 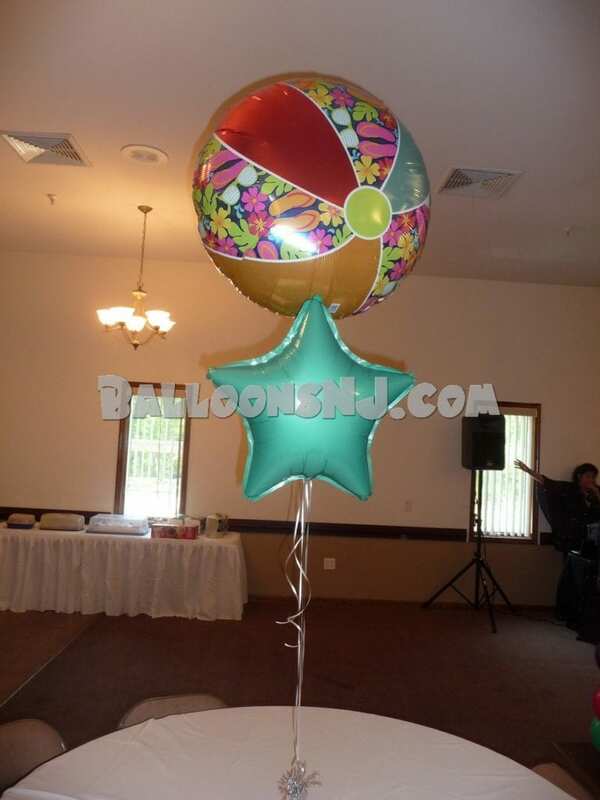 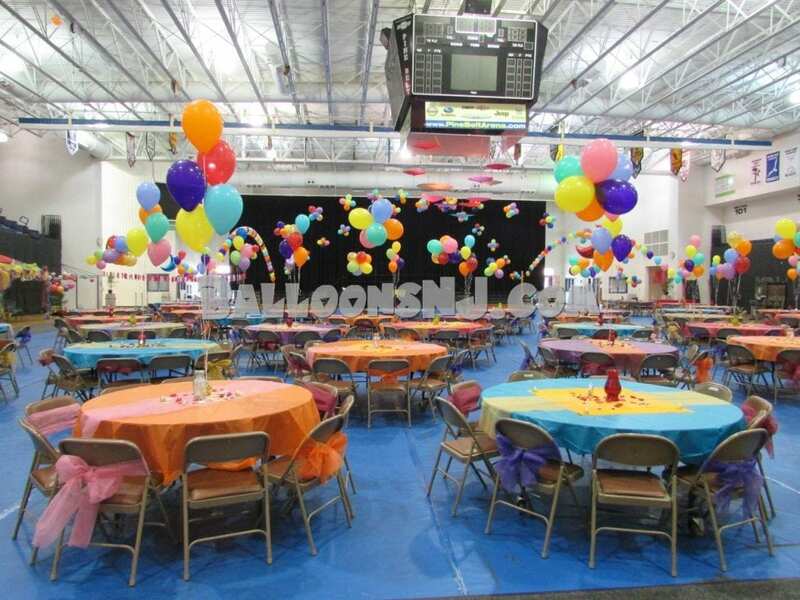 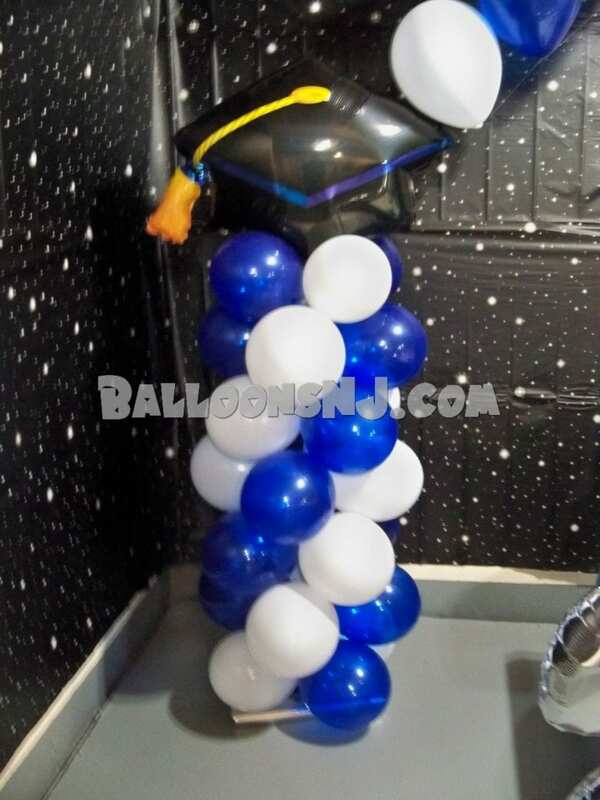 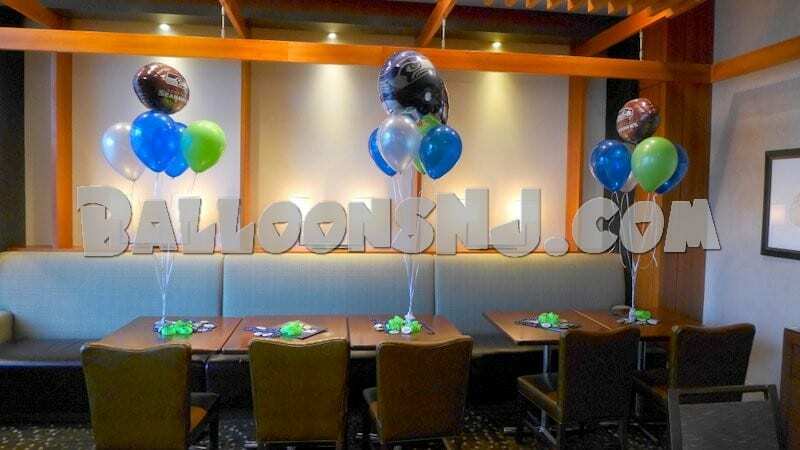 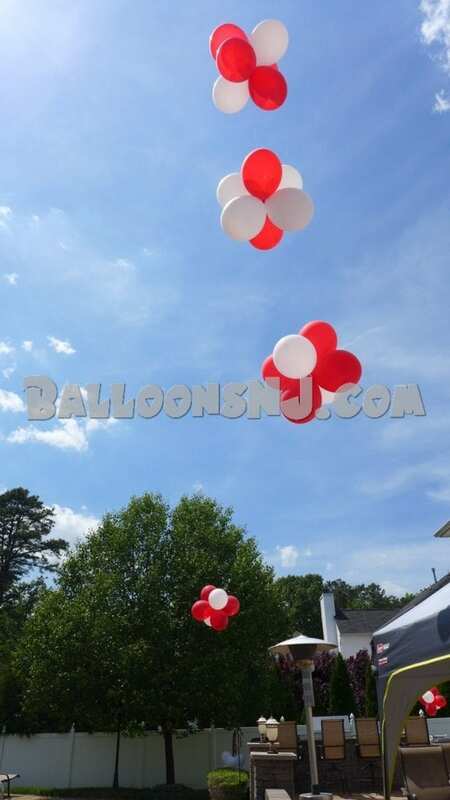 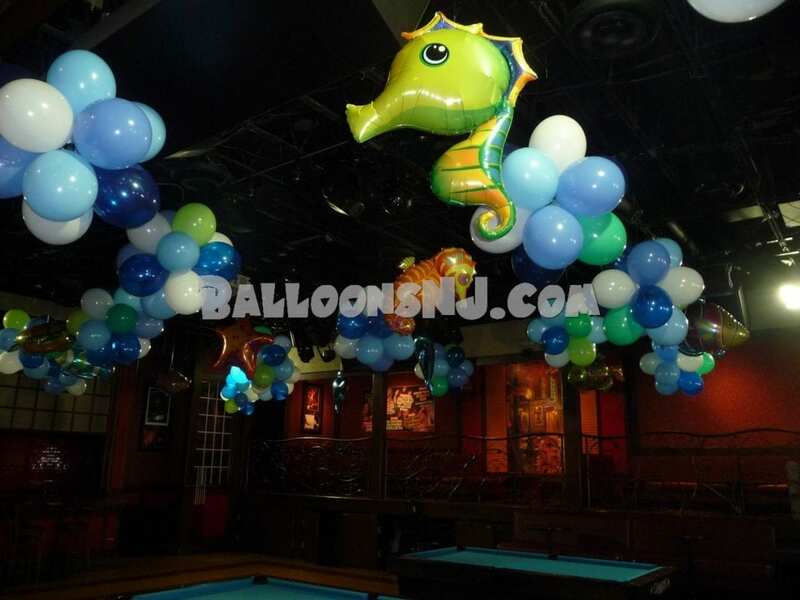 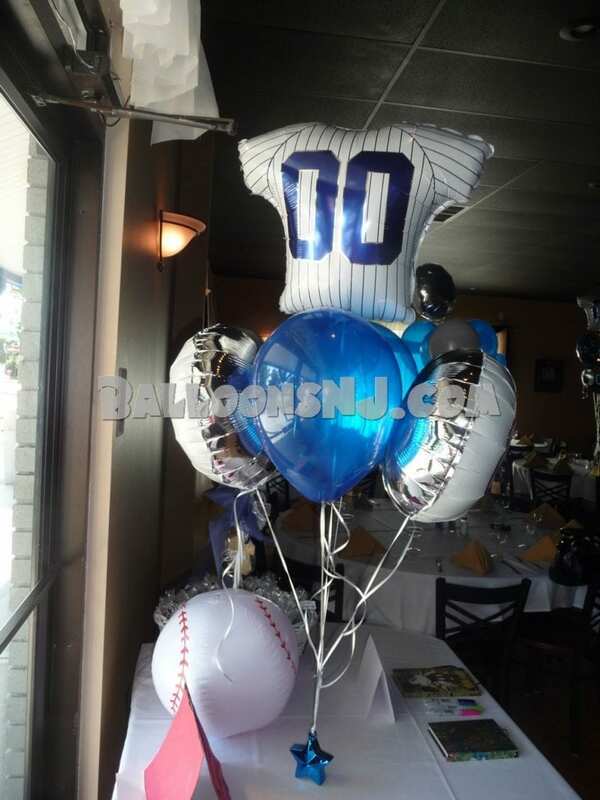 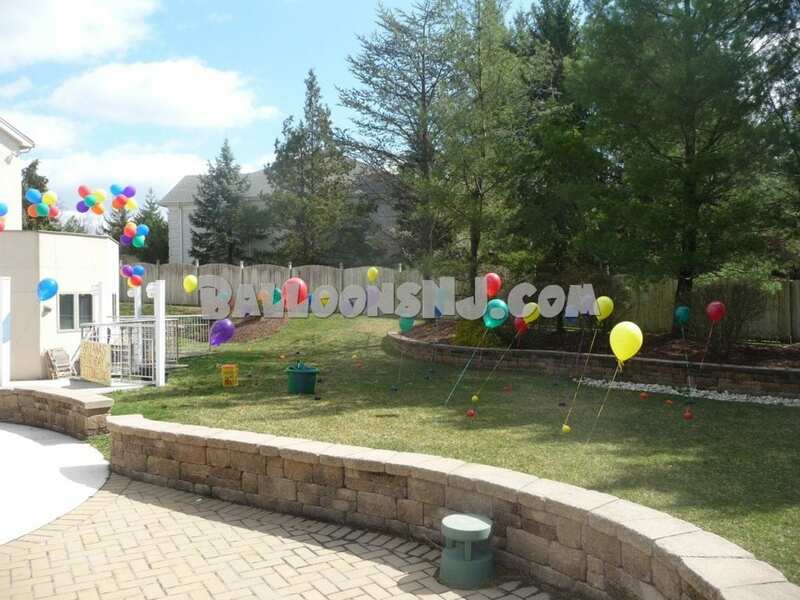 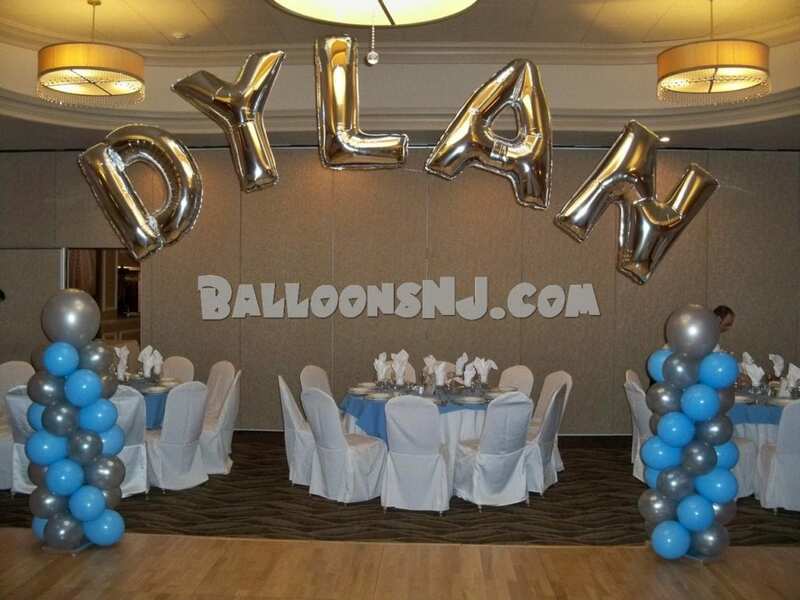 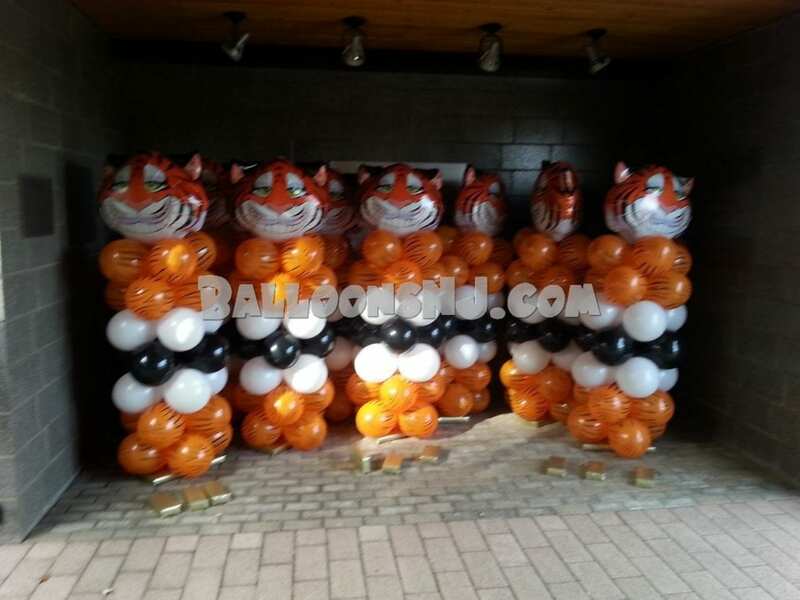 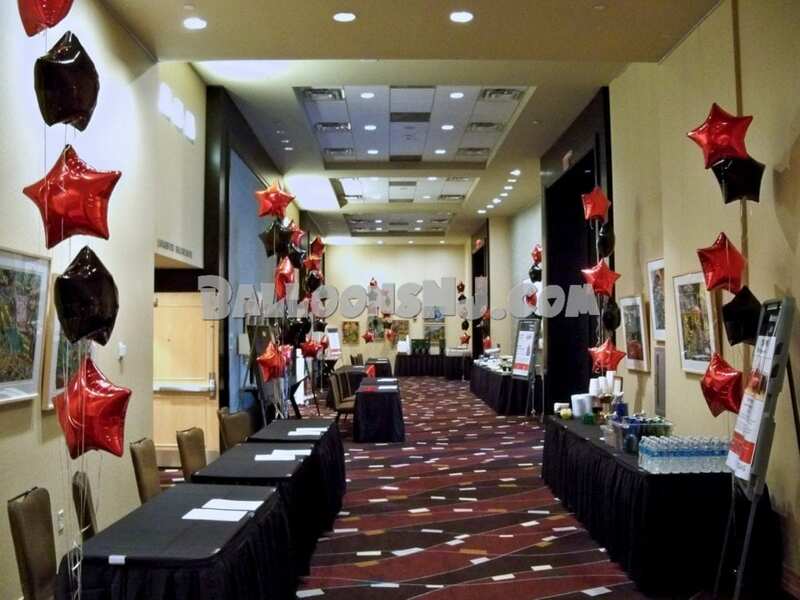 Essential Elements of Balloon Decorating- Balloons add excitement and boldly say “Celebrate!” Here is a list of the essential elements of balloon decorating that the pros rely upon to decorate most events. 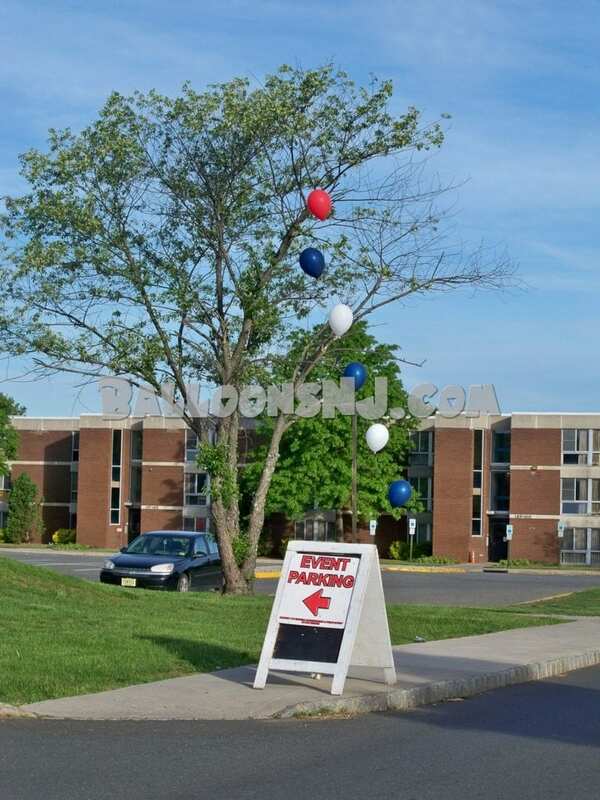 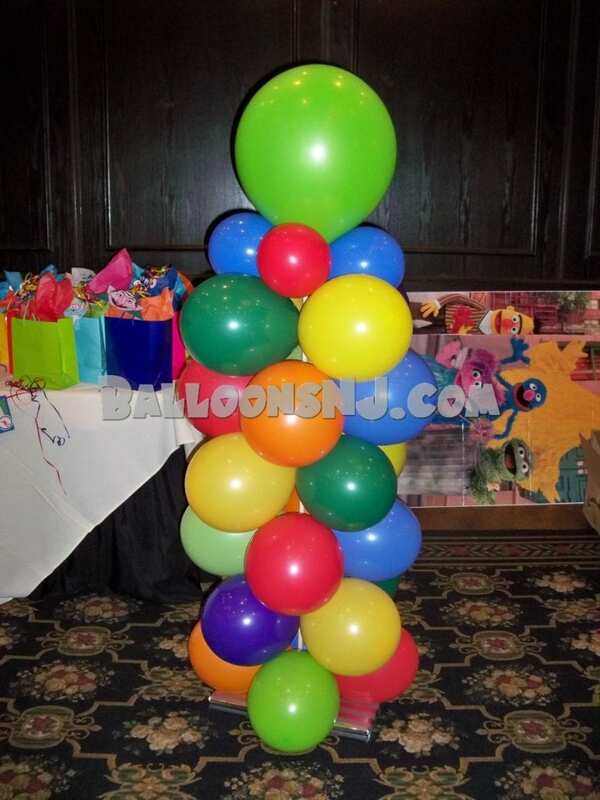 Balloon Trees – Perhaps the most flexible decor type is the balloon tree, also called a balloon bouquet. 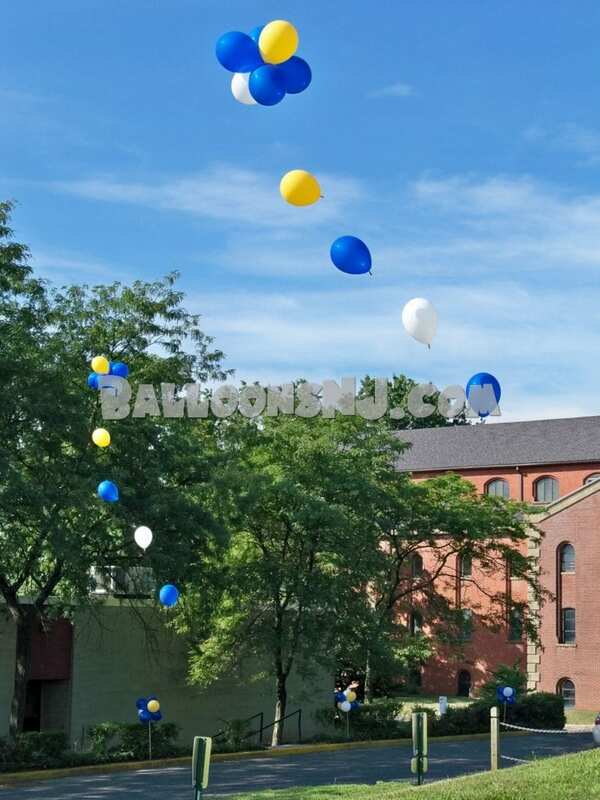 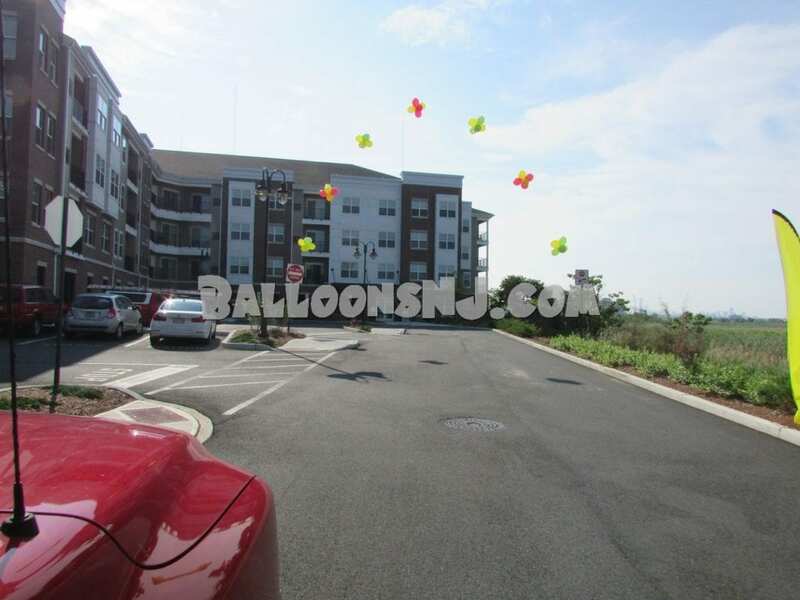 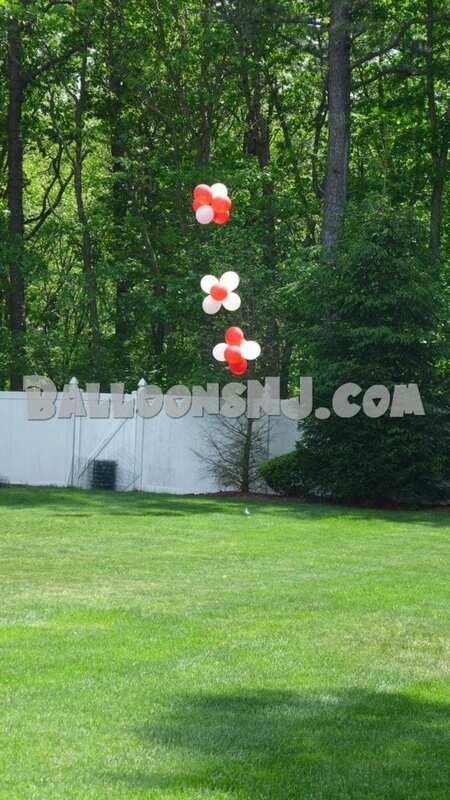 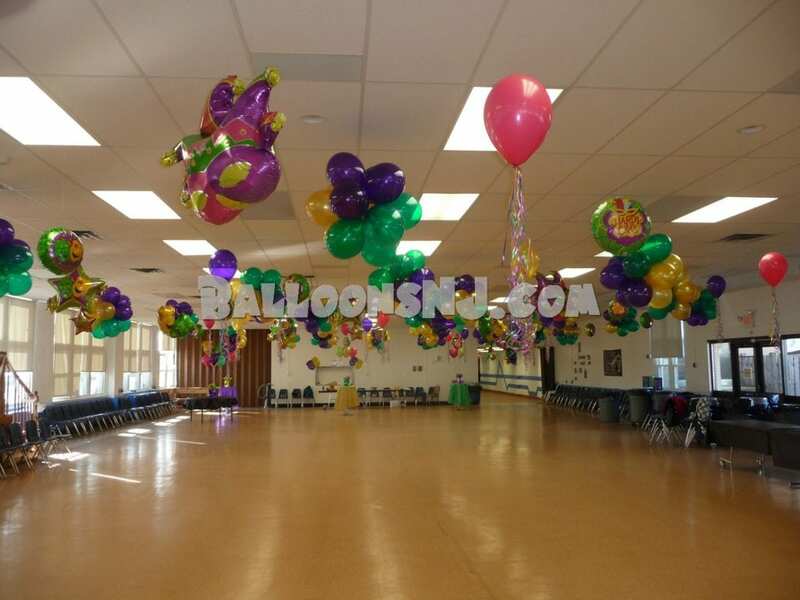 It is anywhere from 5 to 10 balloons attached by ribbons to a weight and is usually meant to be placed on the ground. 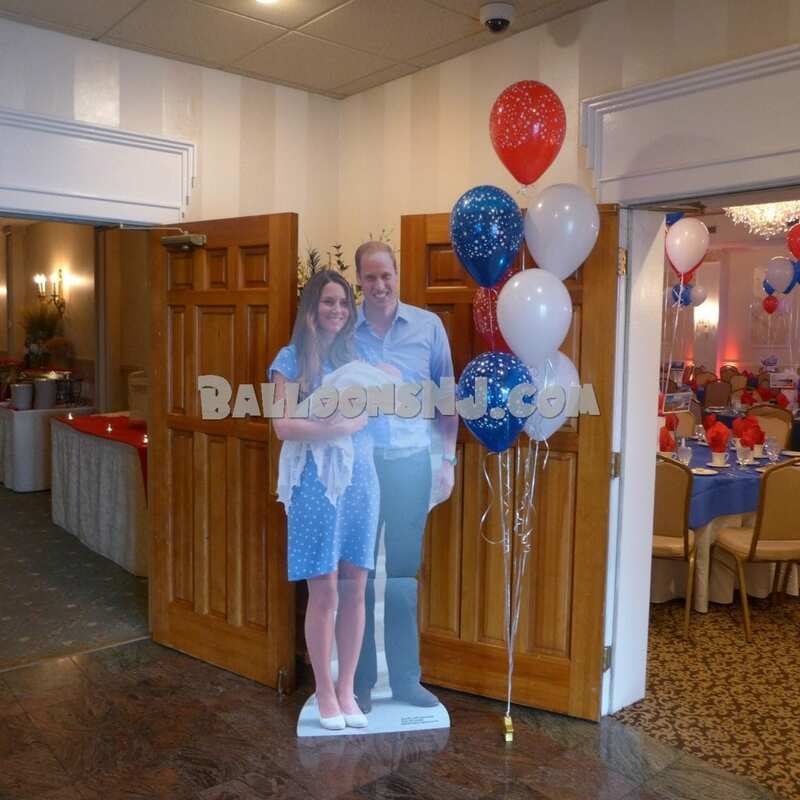 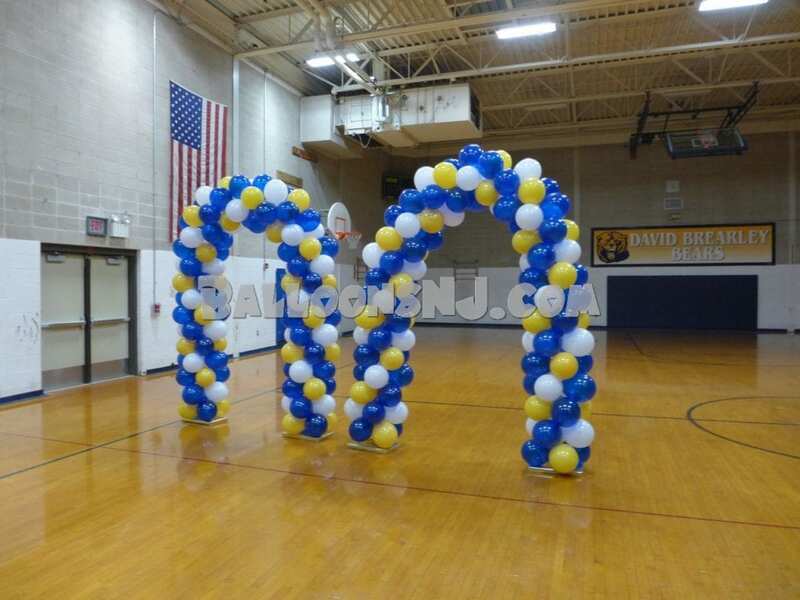 They can be used to mark an entrance or aisle, surround the dance floor, decorate ,structural columns, blank walls and dull corners. 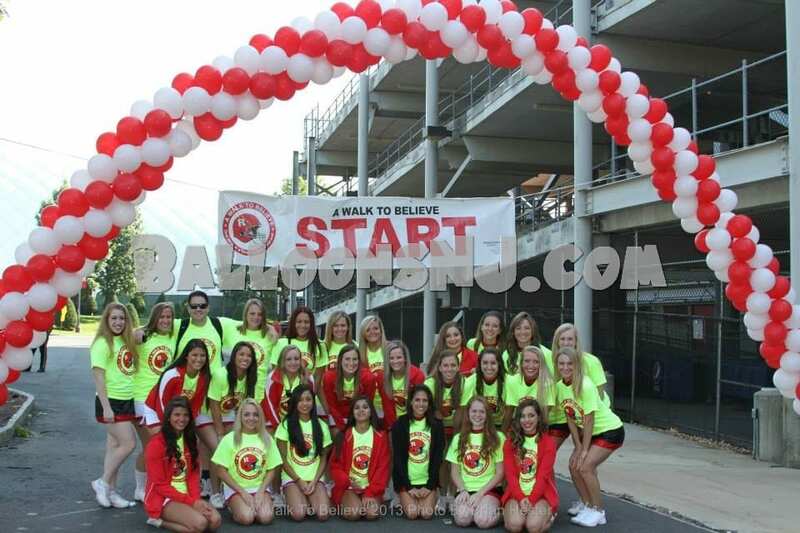 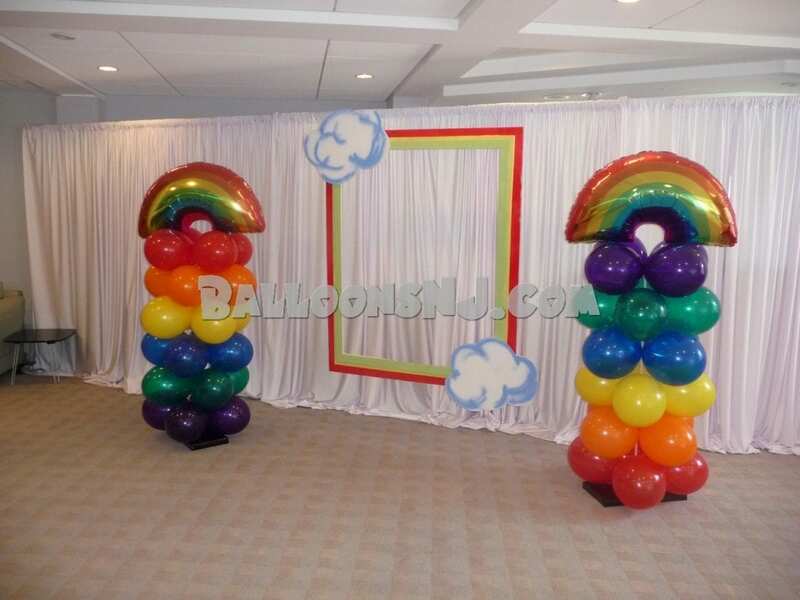 They are easily moved, so you can gather them together to form a balloon wall to act as a backdrop for group photos. 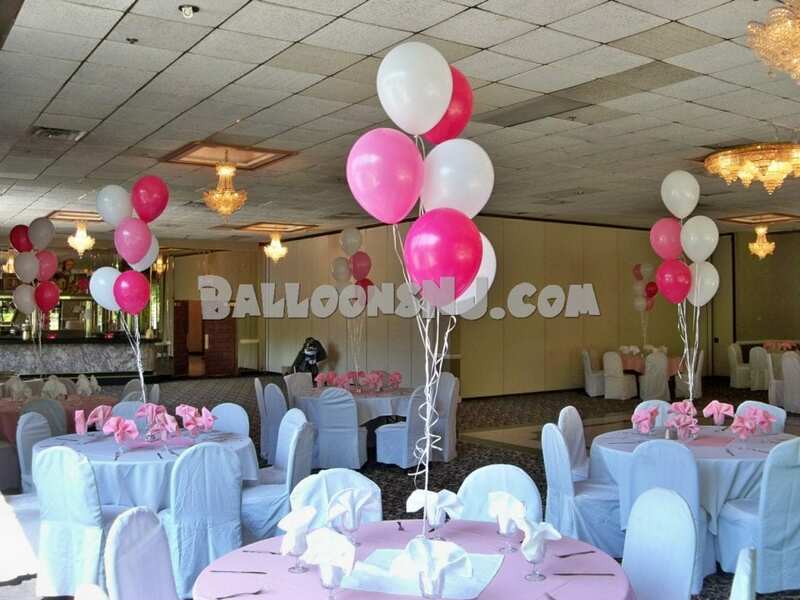 Centerpieces – are usually 5 or 6 balloons attached by ribbons to a simple weight which may or may not be hidden in, or tied to, some other table display piece.. like a flower arrangement. 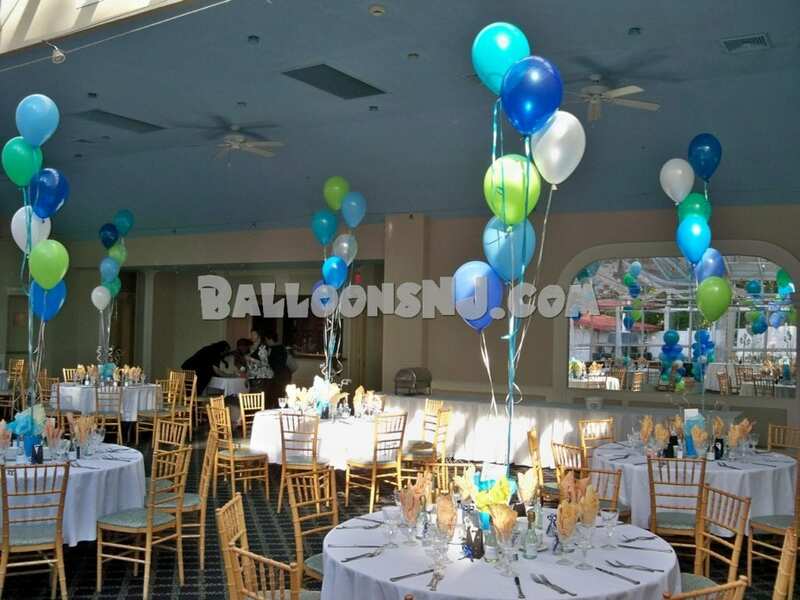 The best thing about balloon centerpieces is that the weight can be unobtrusive and the ribbons at eye-level will not block the view of your guests while the balloons above them decorate the air and fill the room with color. 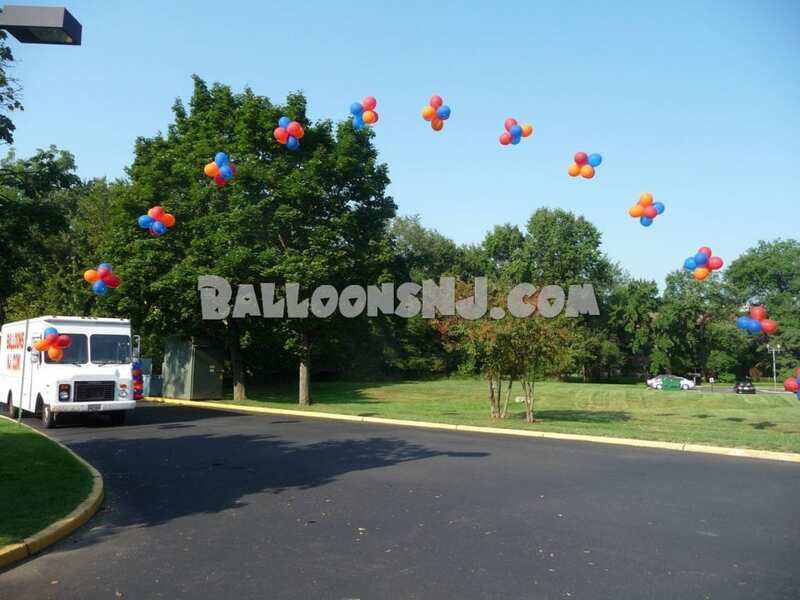 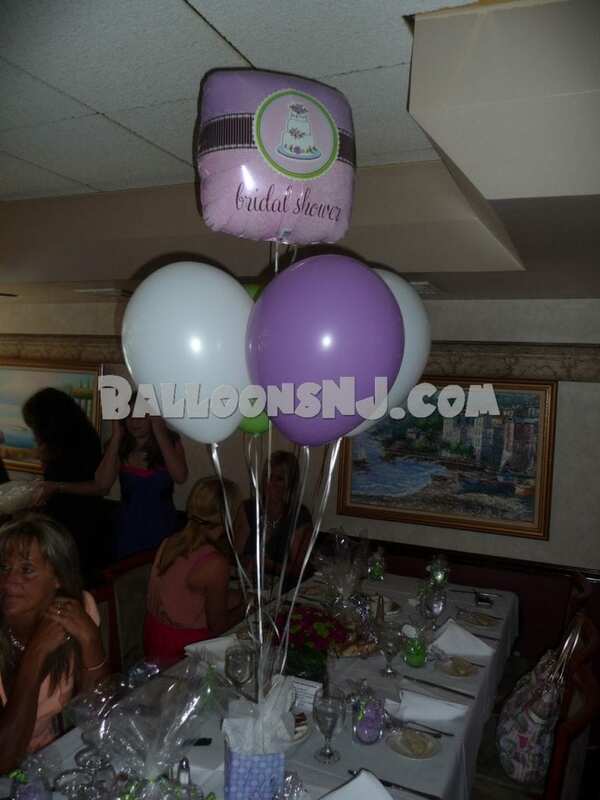 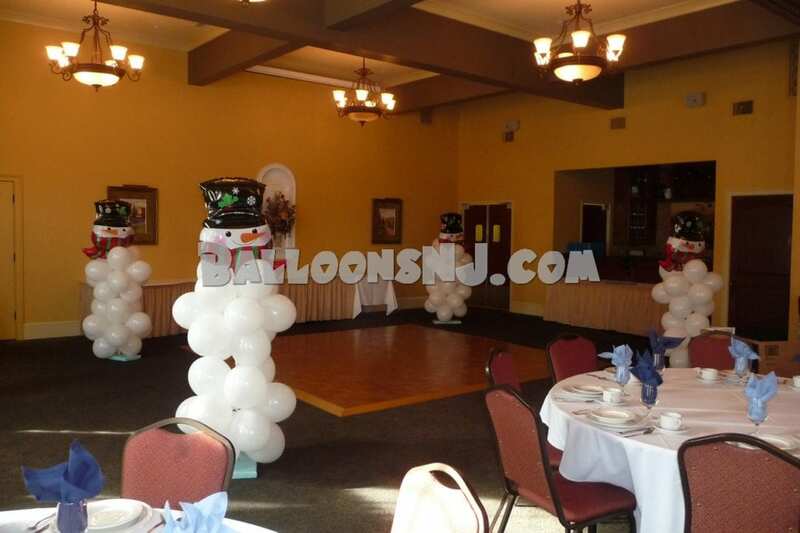 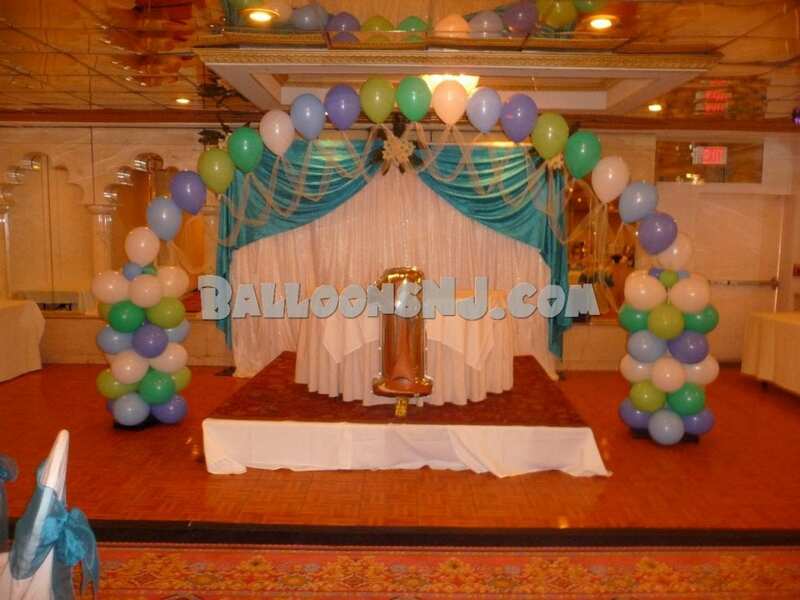 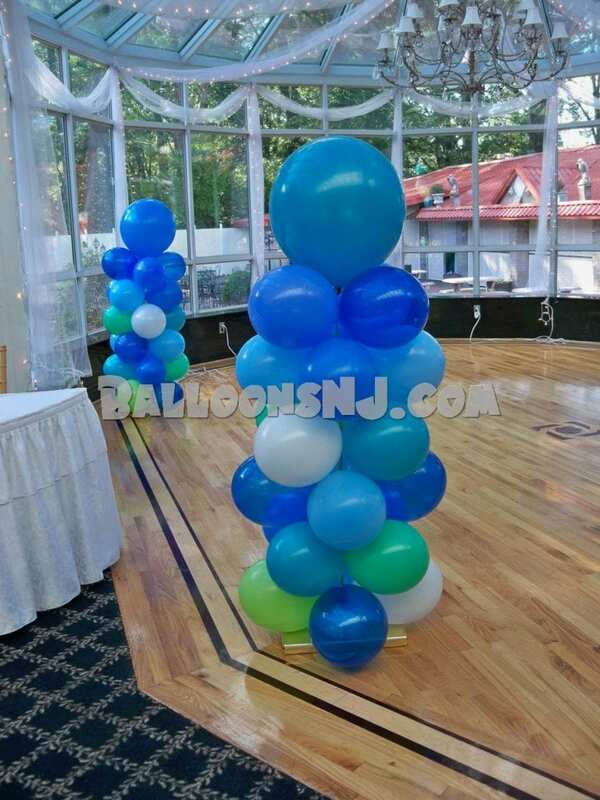 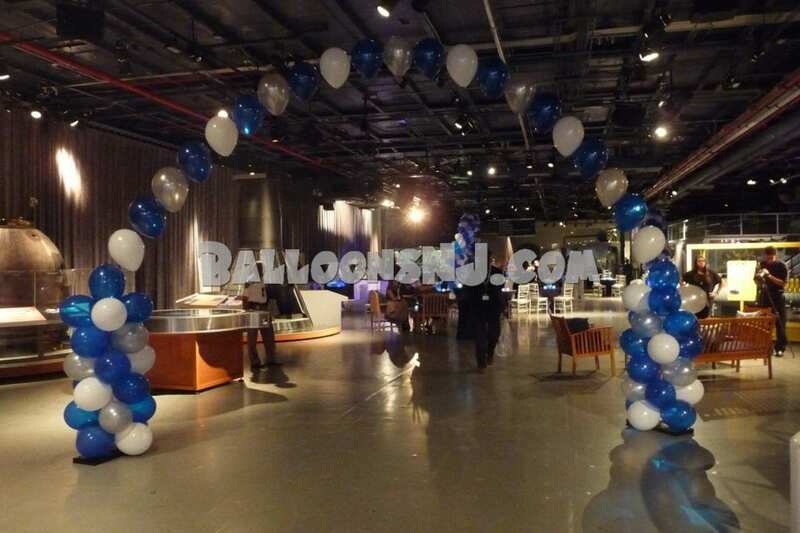 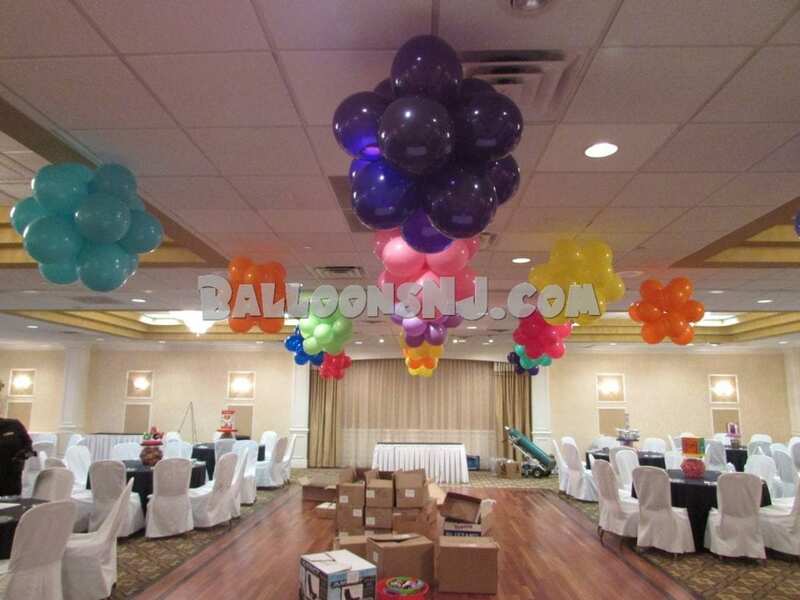 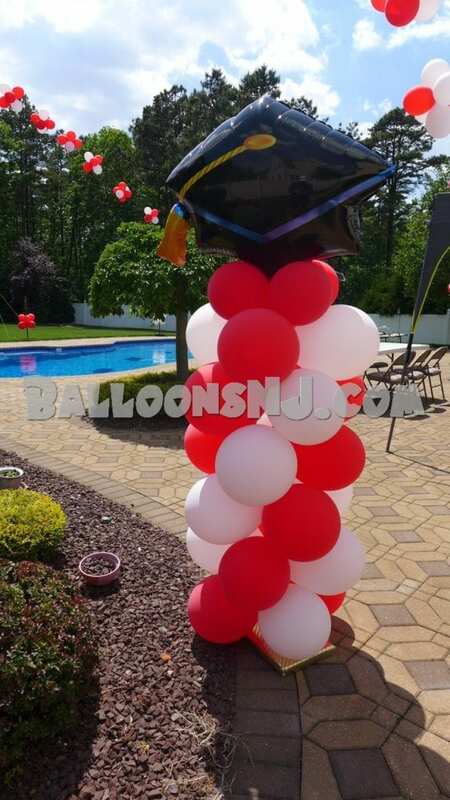 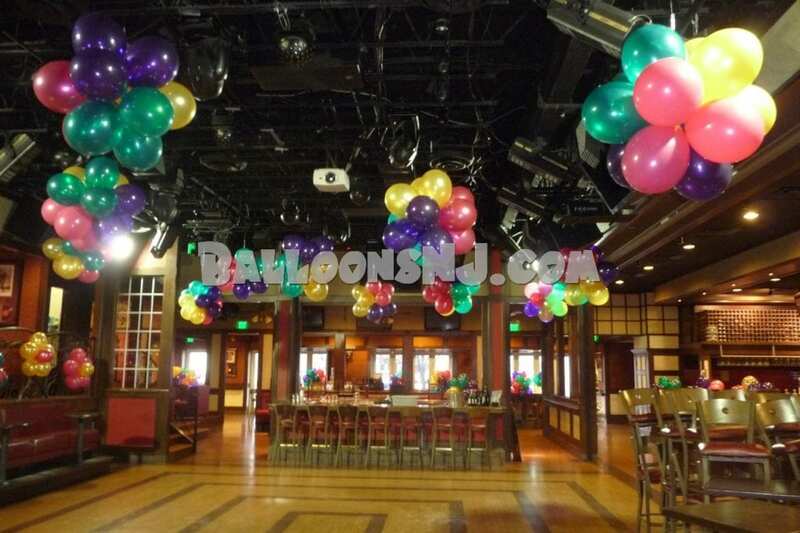 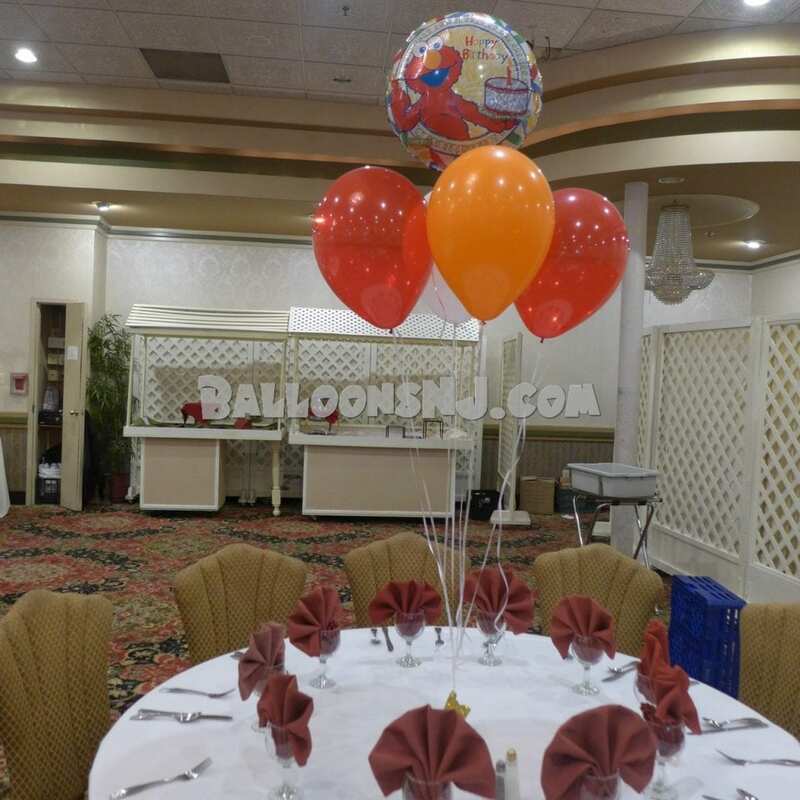 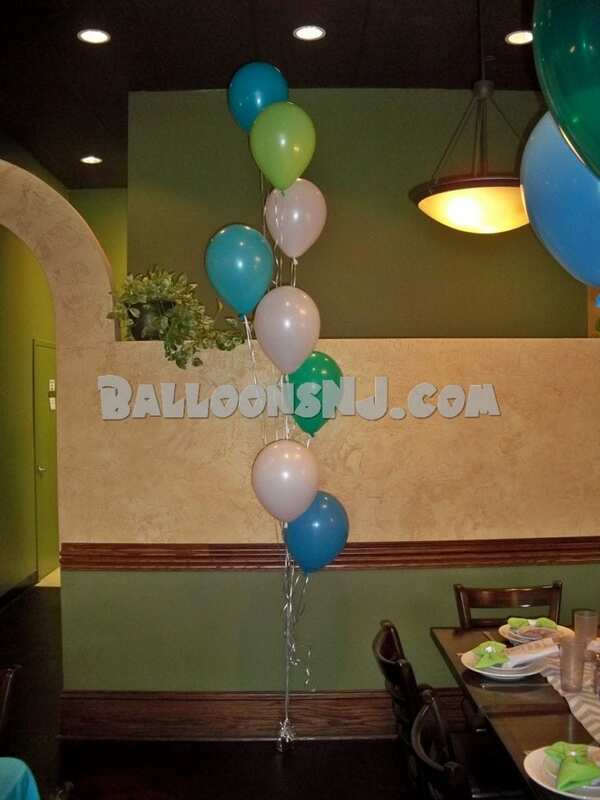 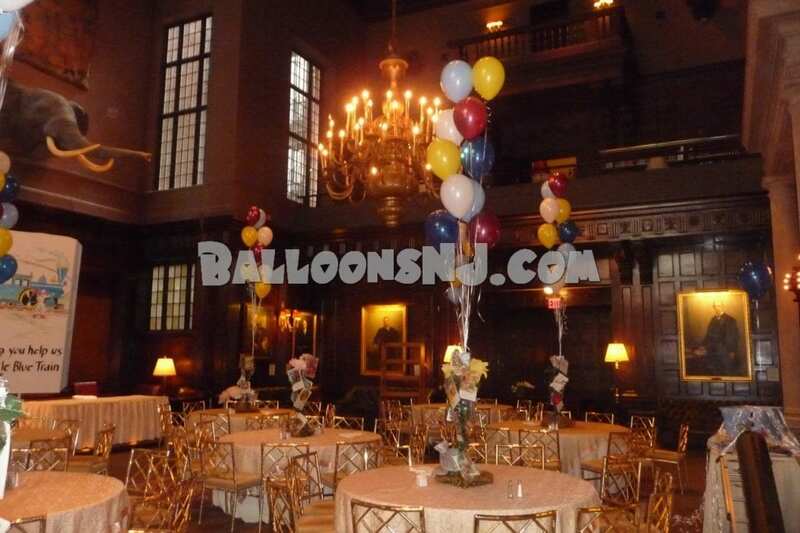 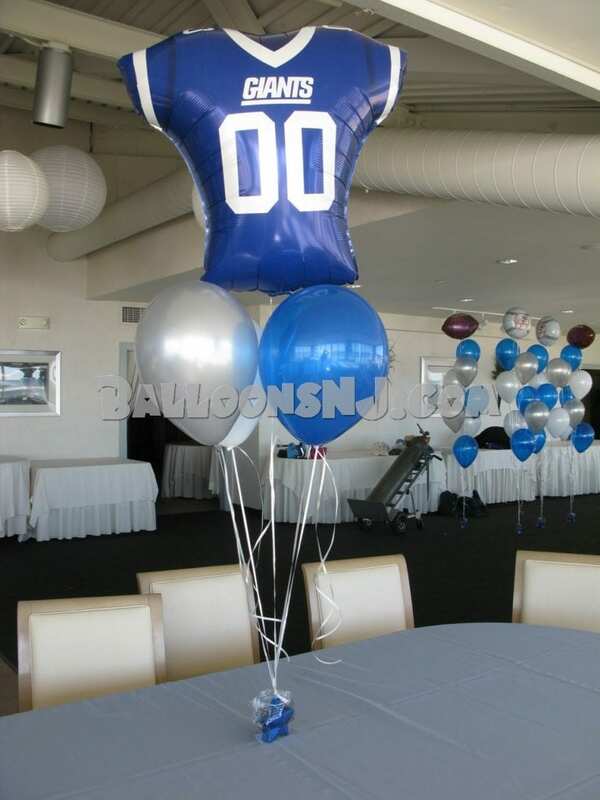 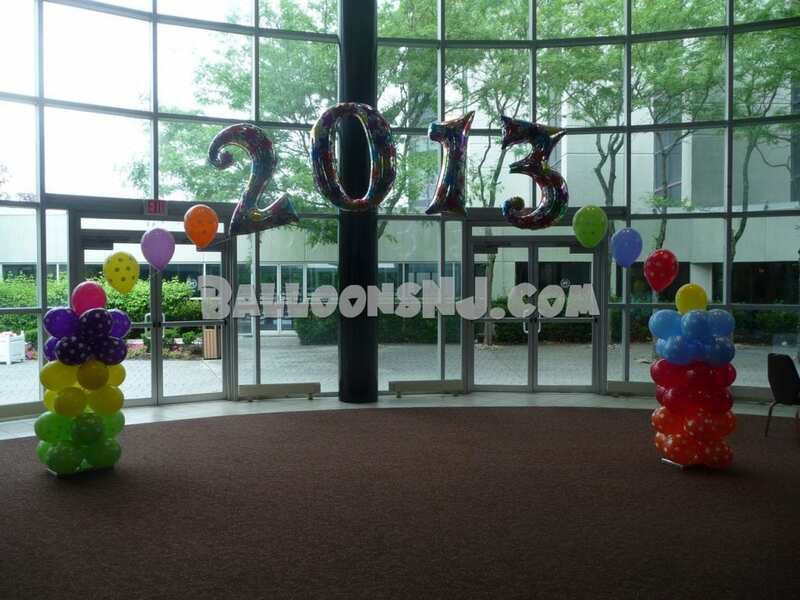 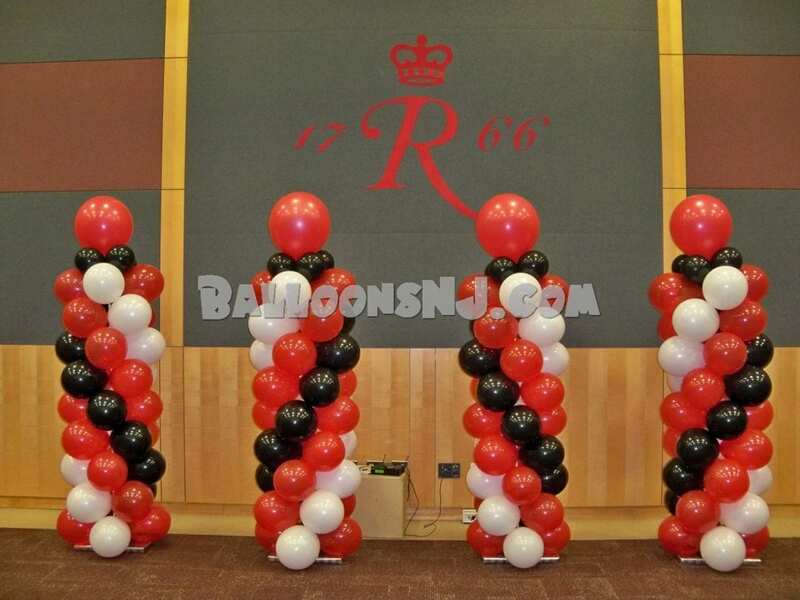 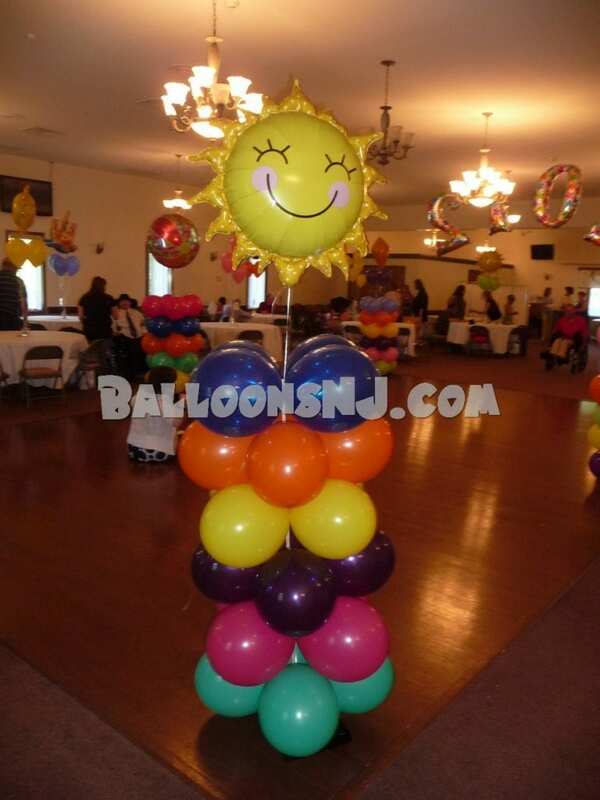 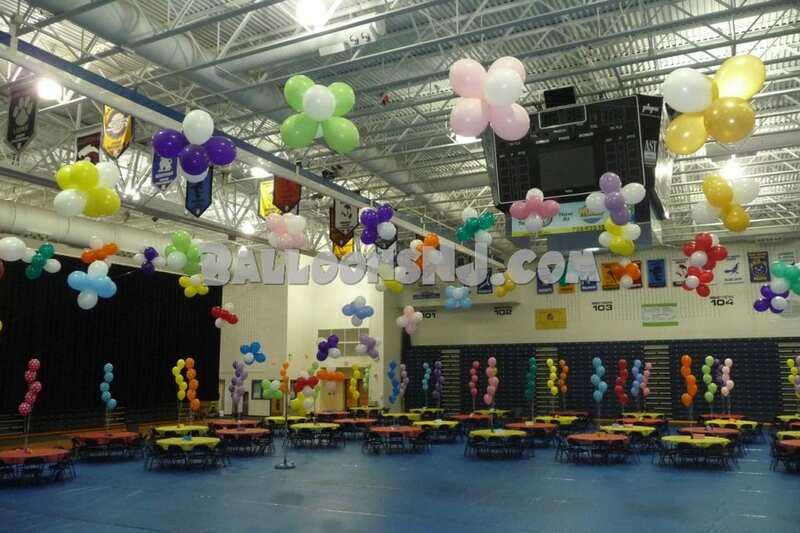 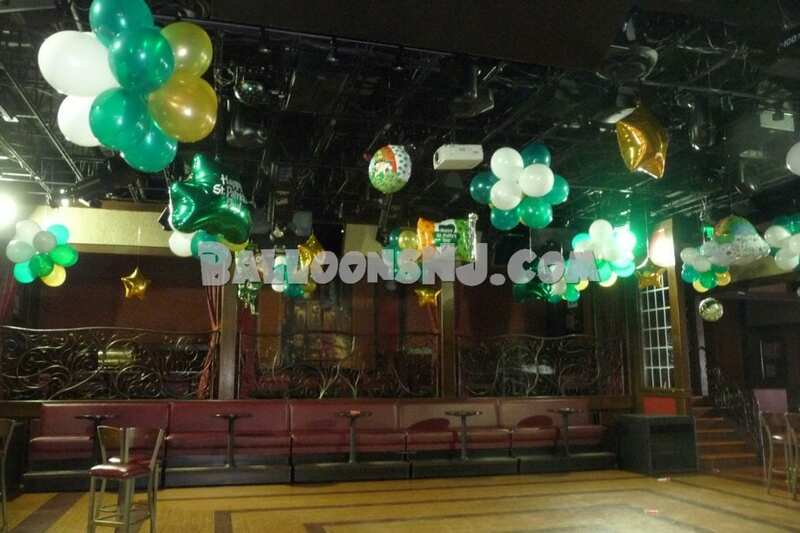 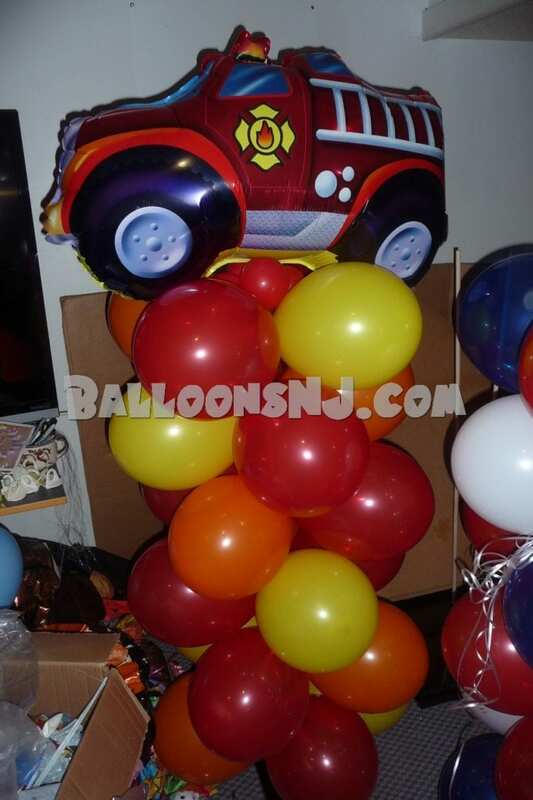 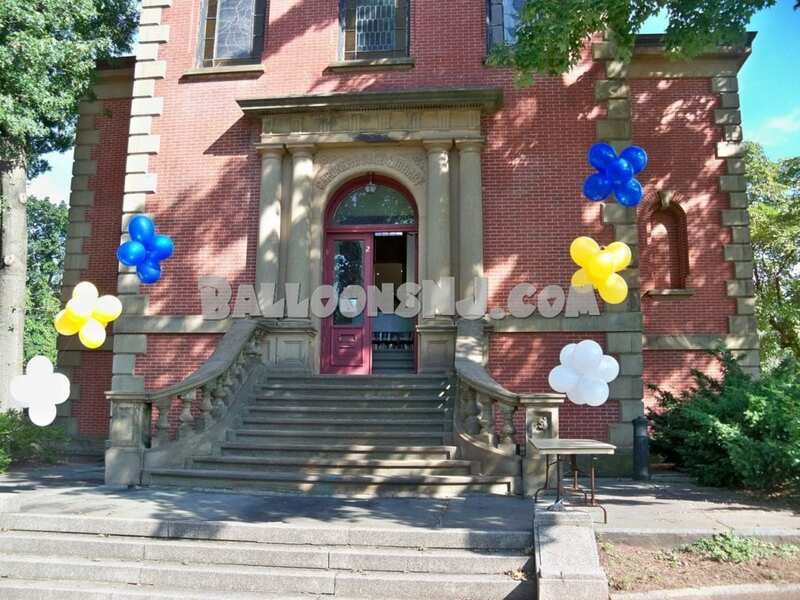 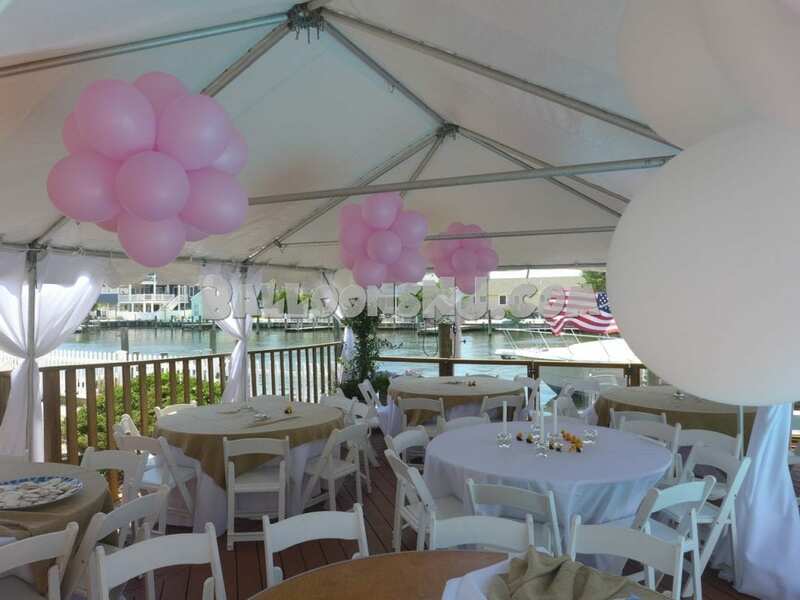 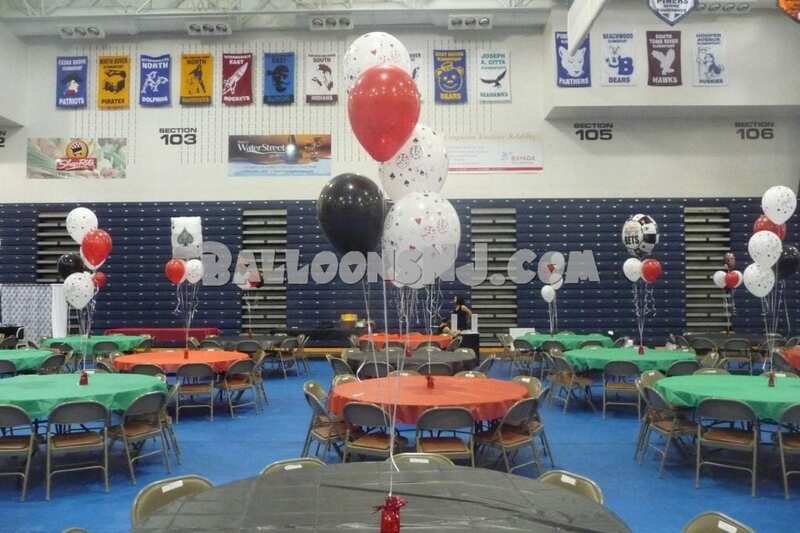 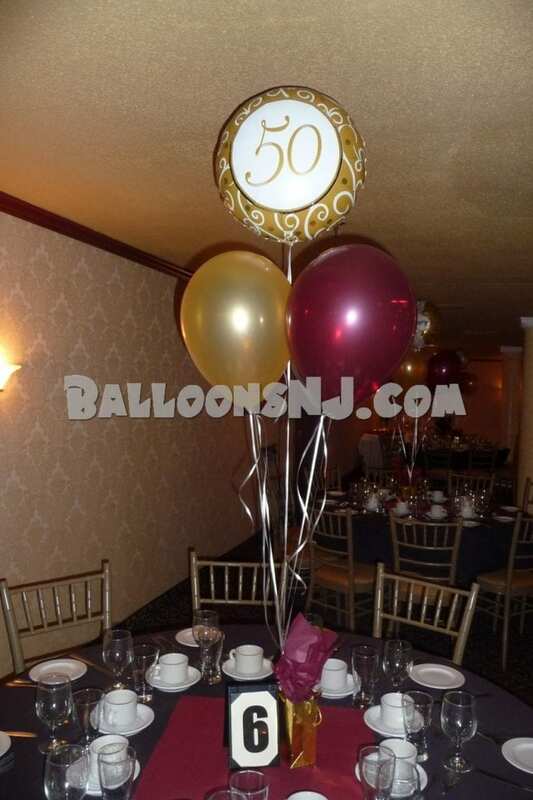 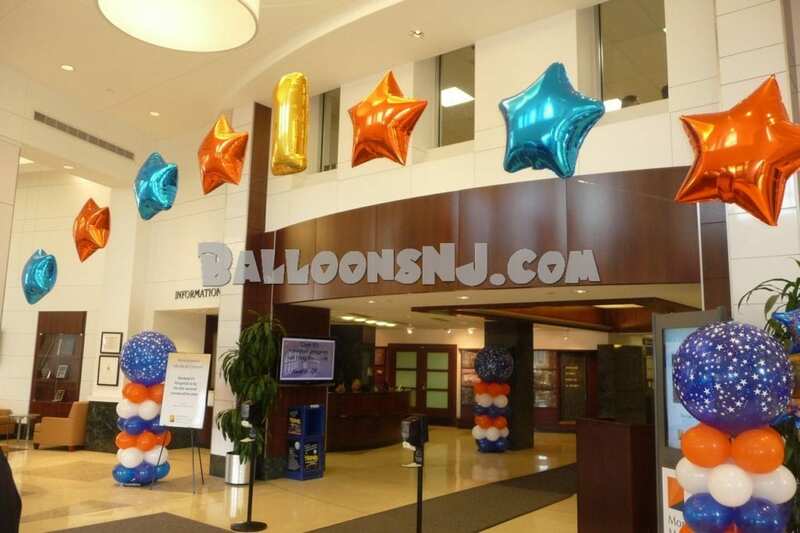 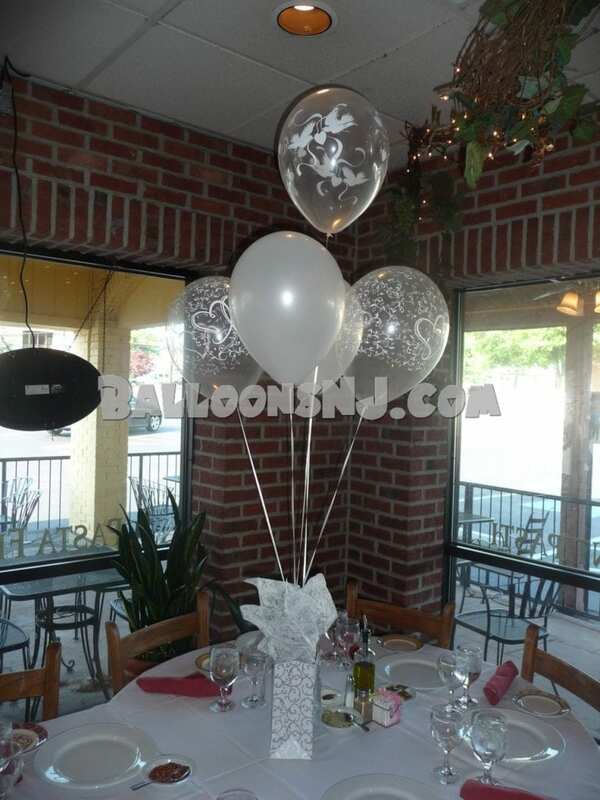 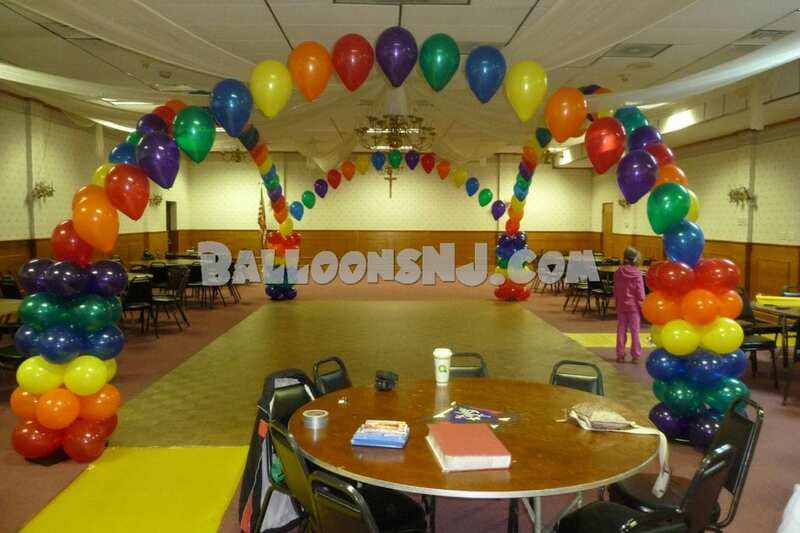 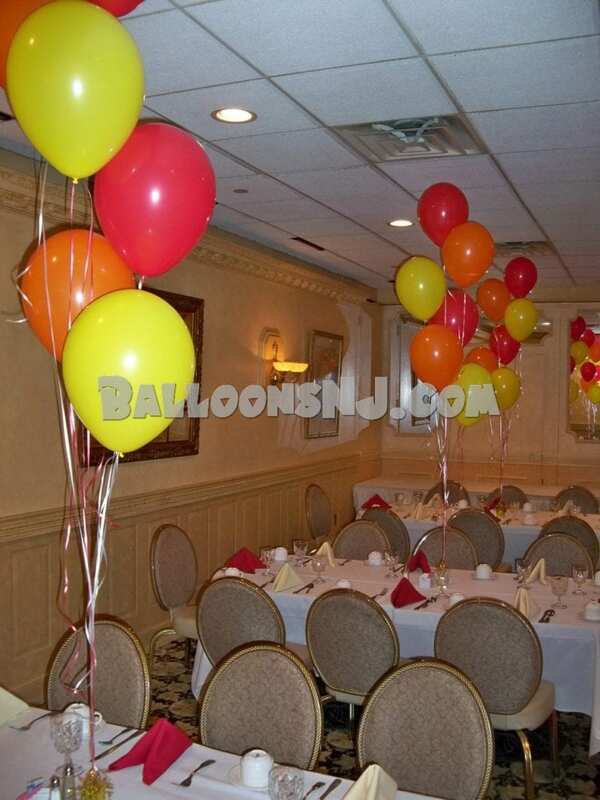 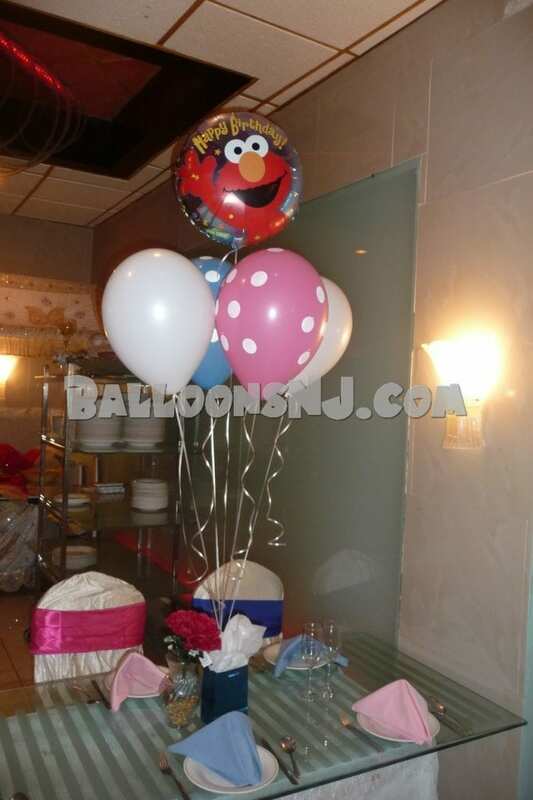 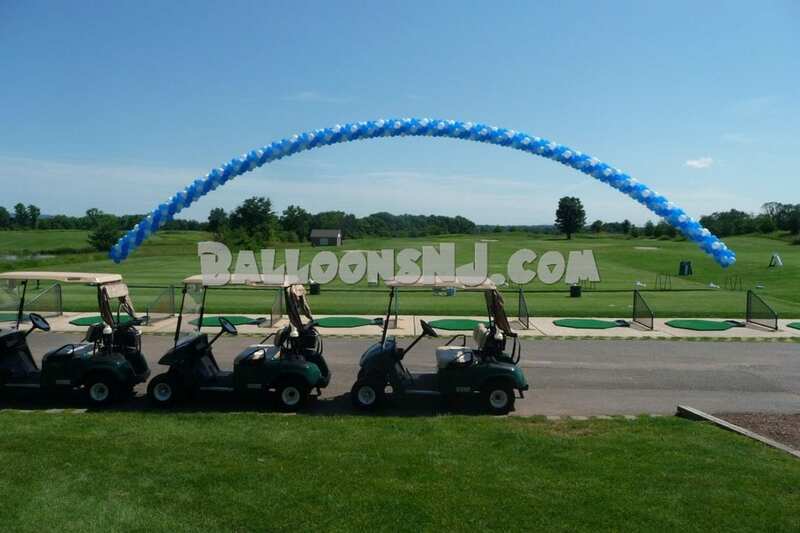 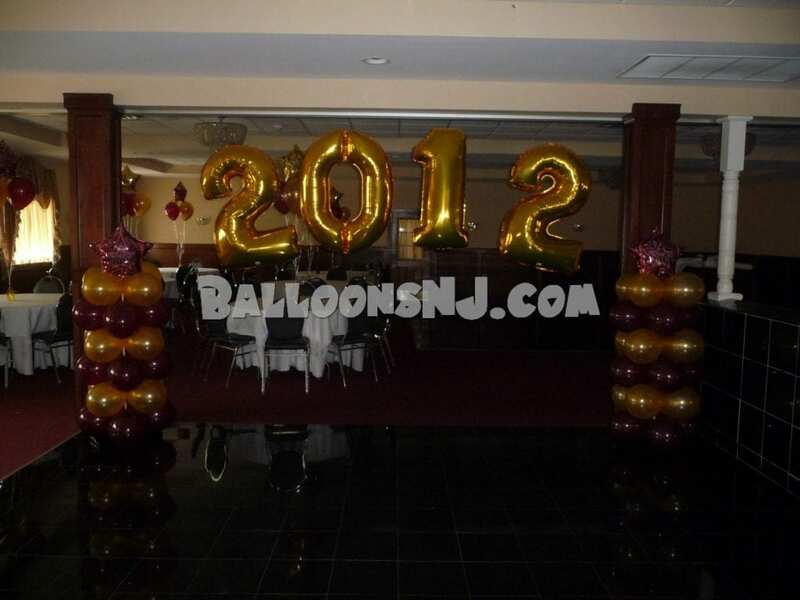 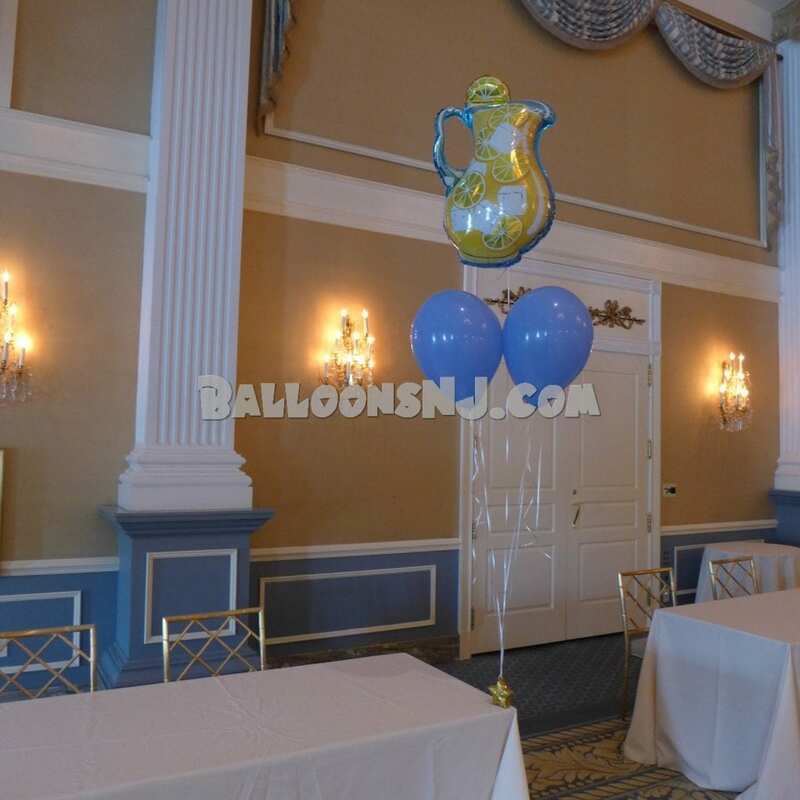 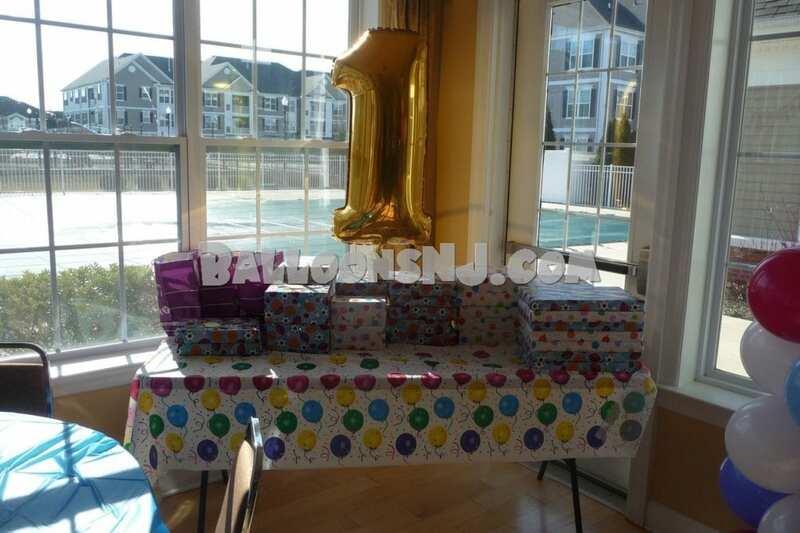 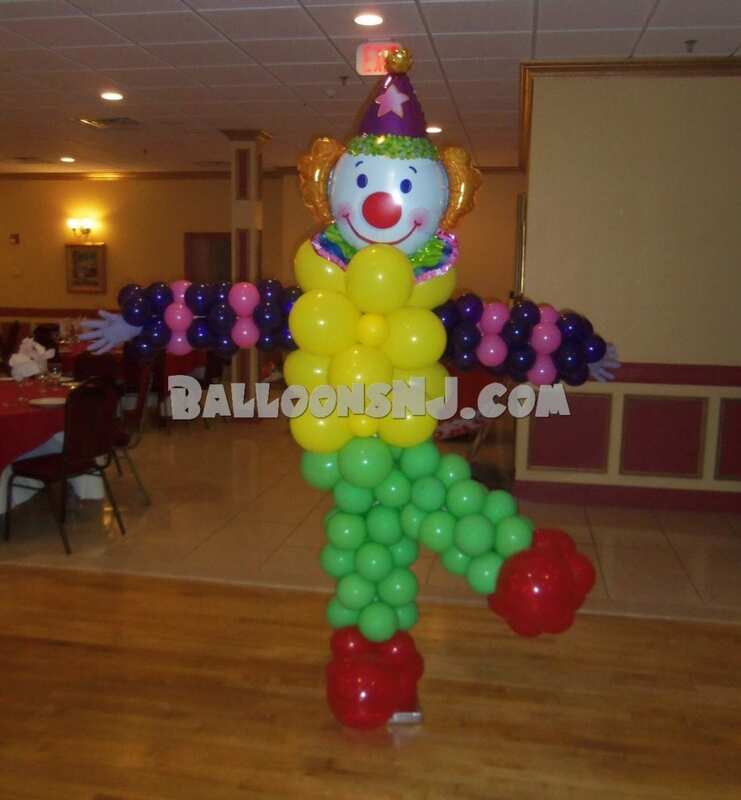 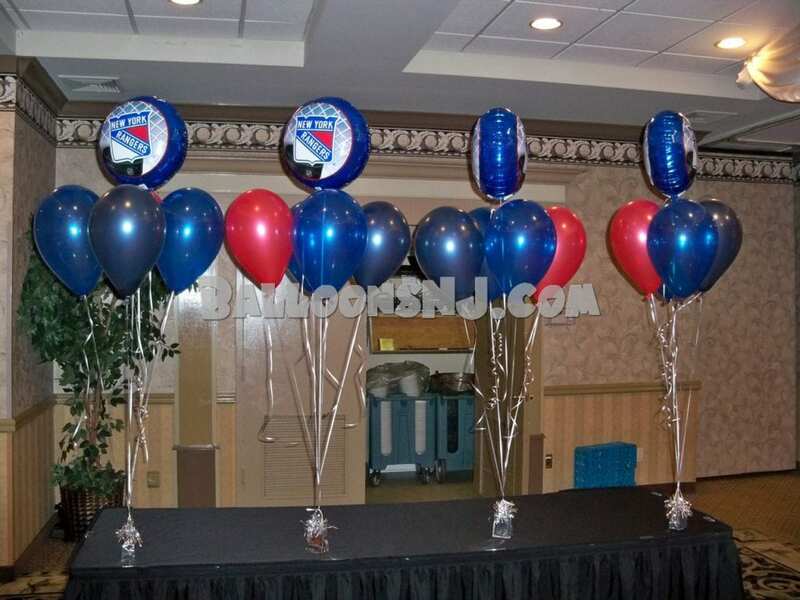 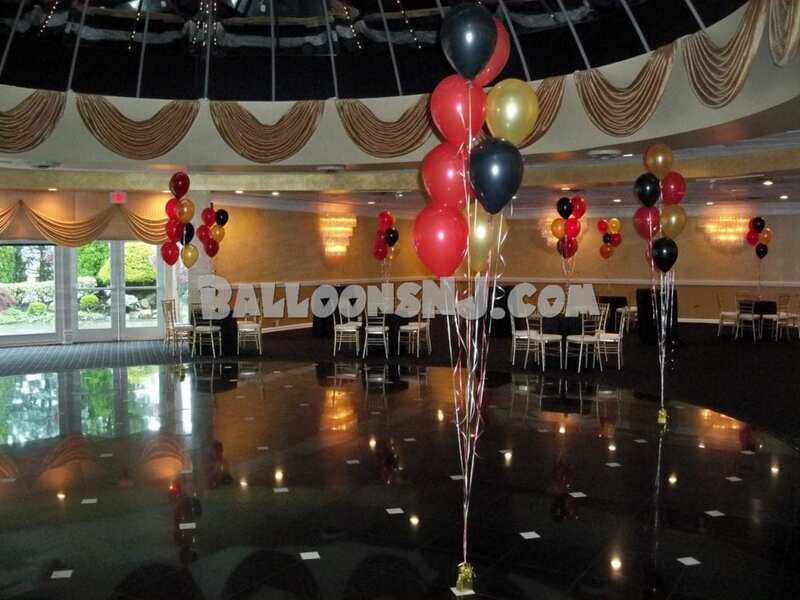 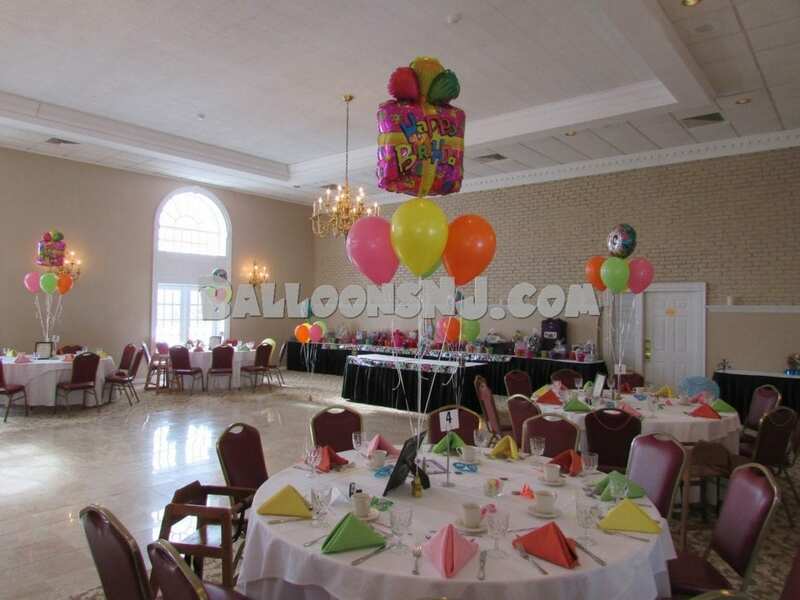 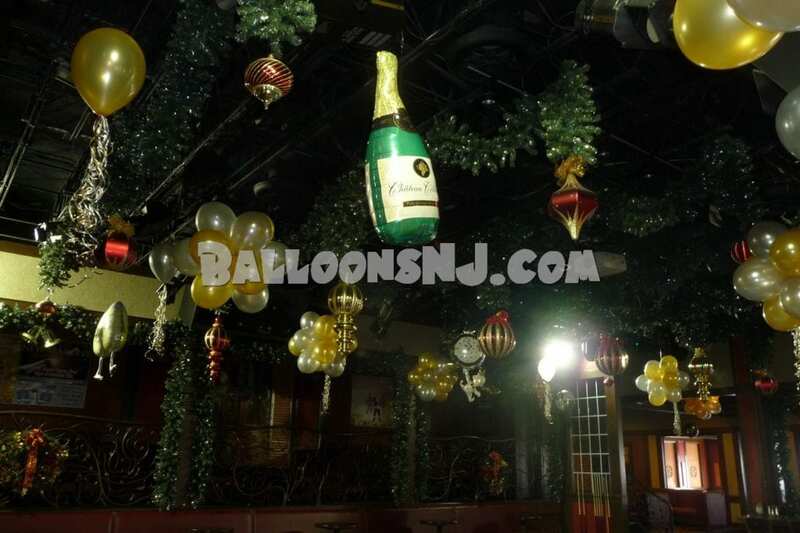 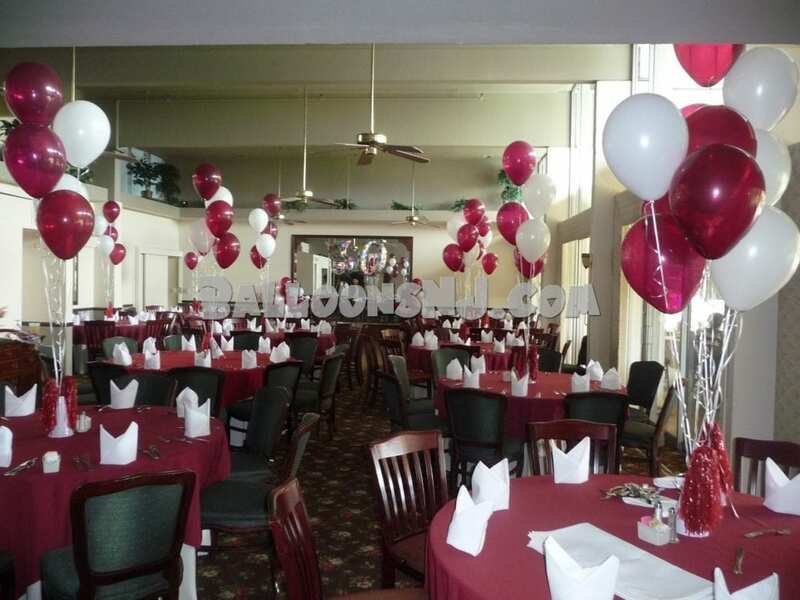 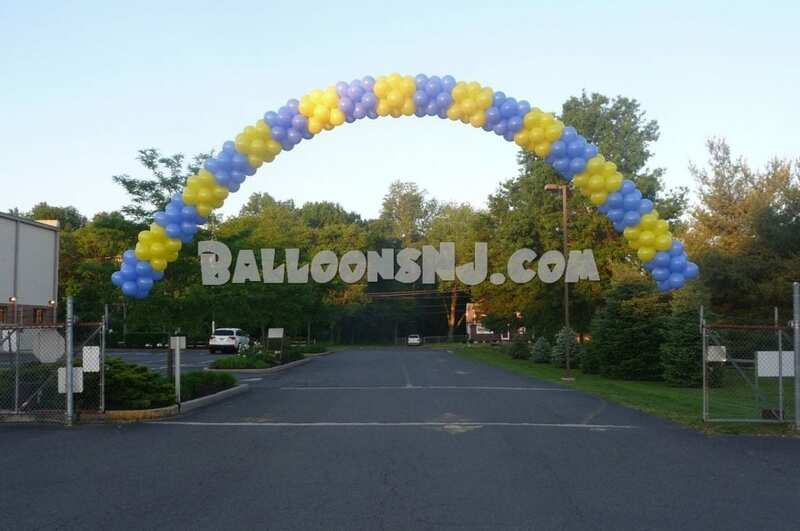 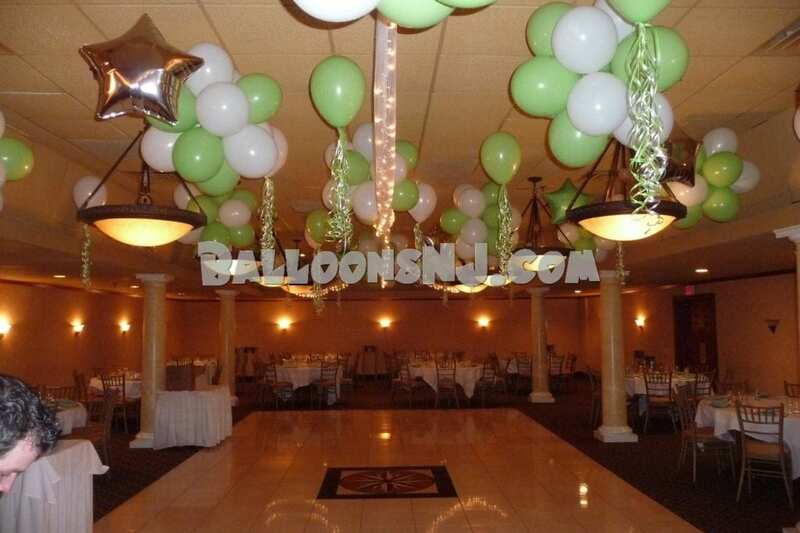 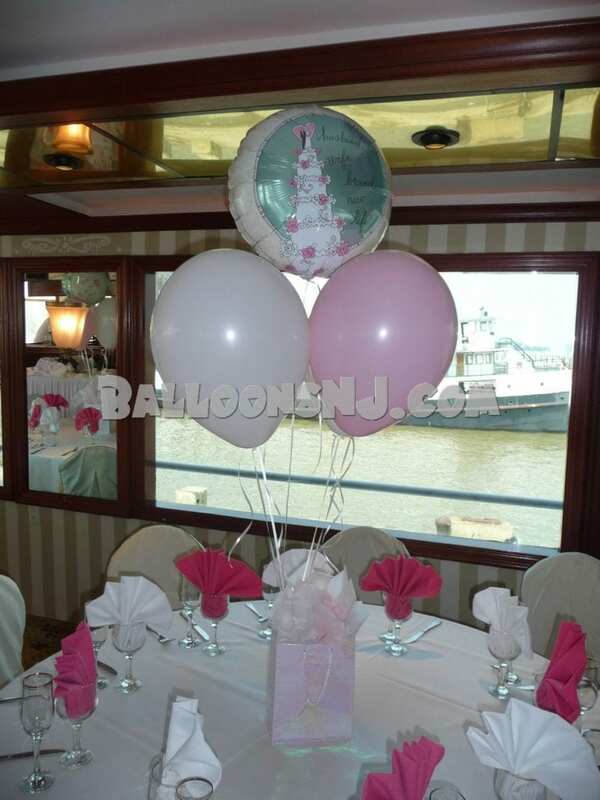 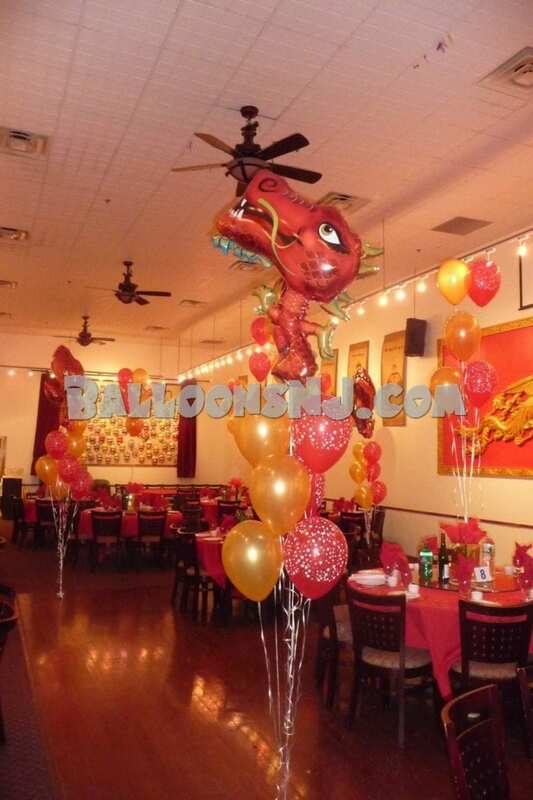 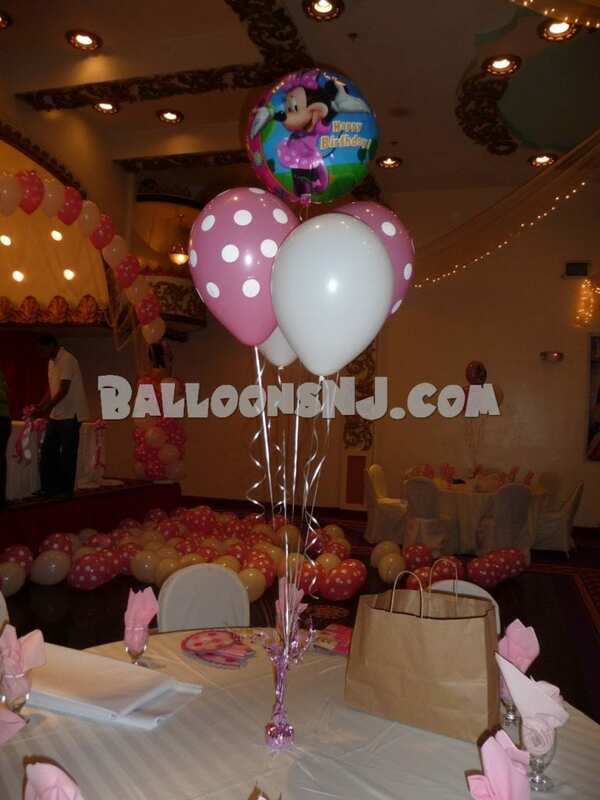 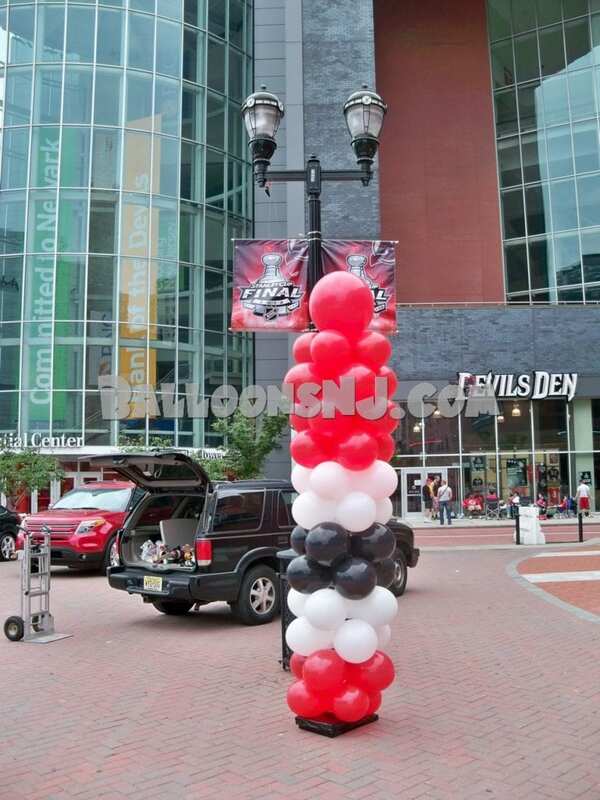 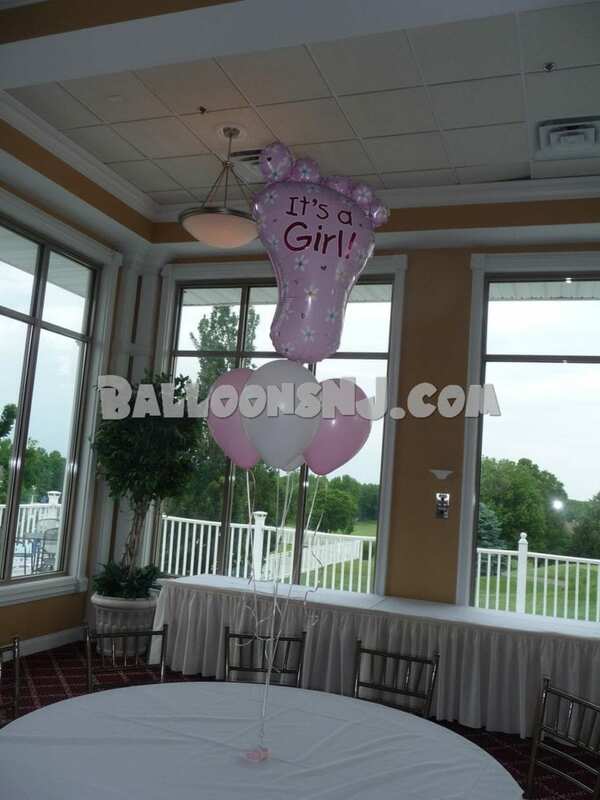 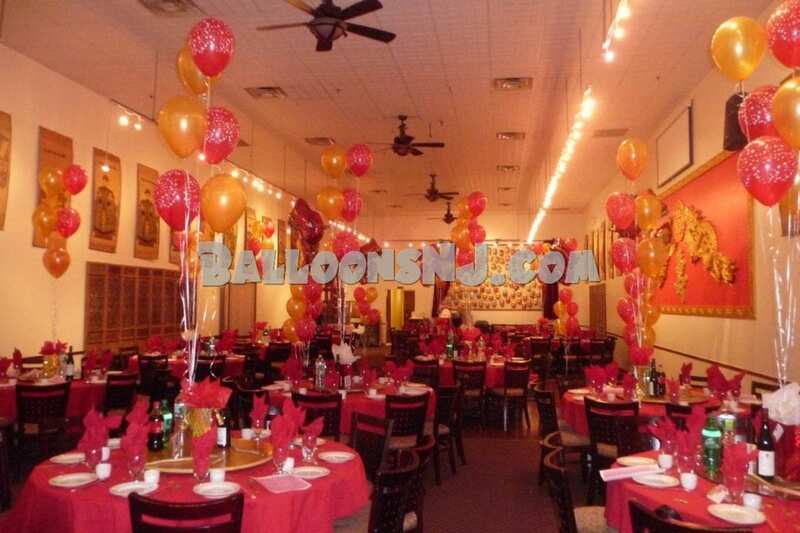 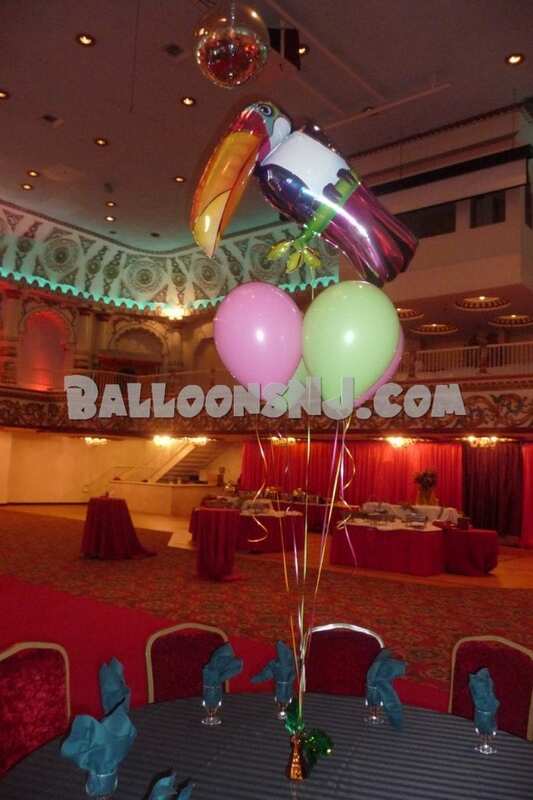 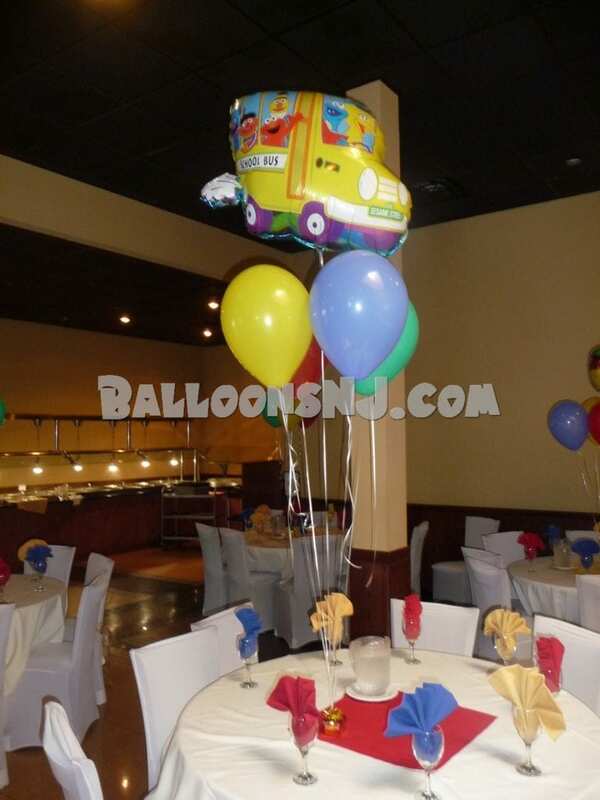 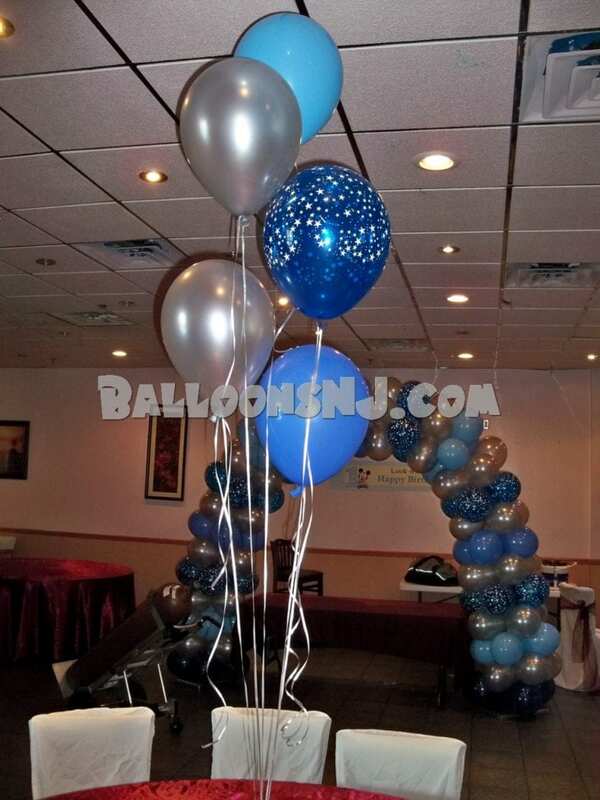 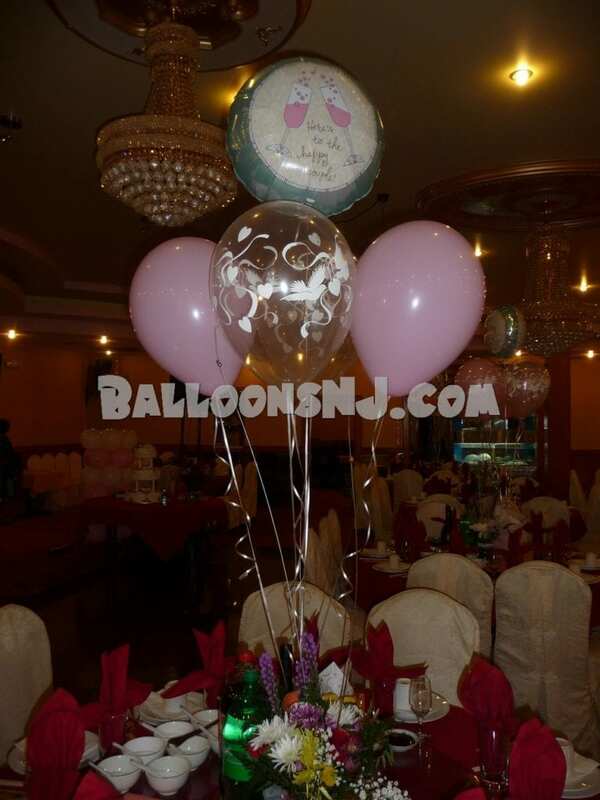 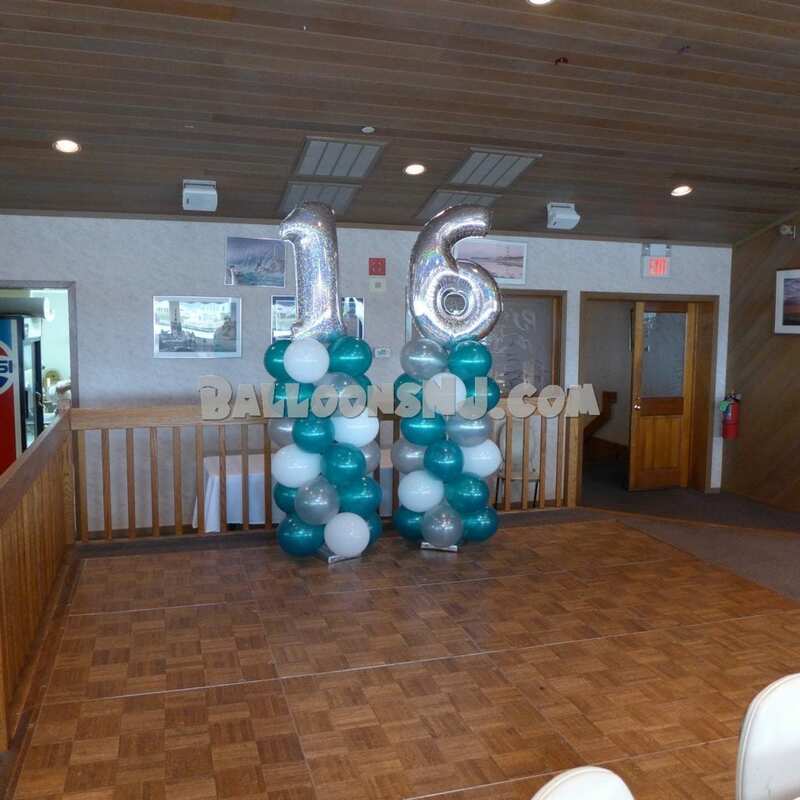 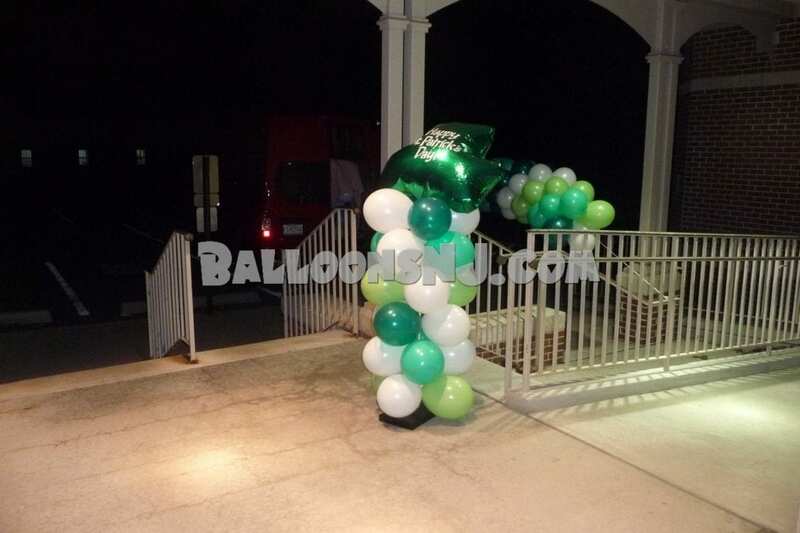 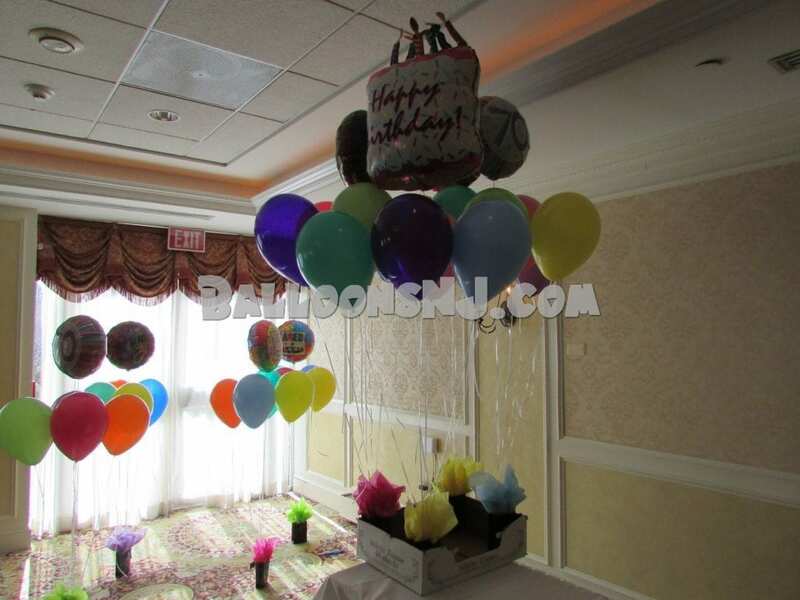 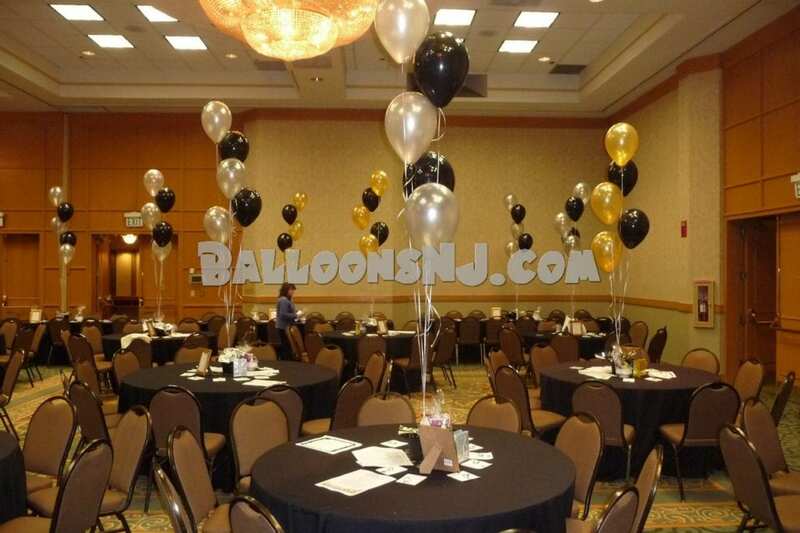 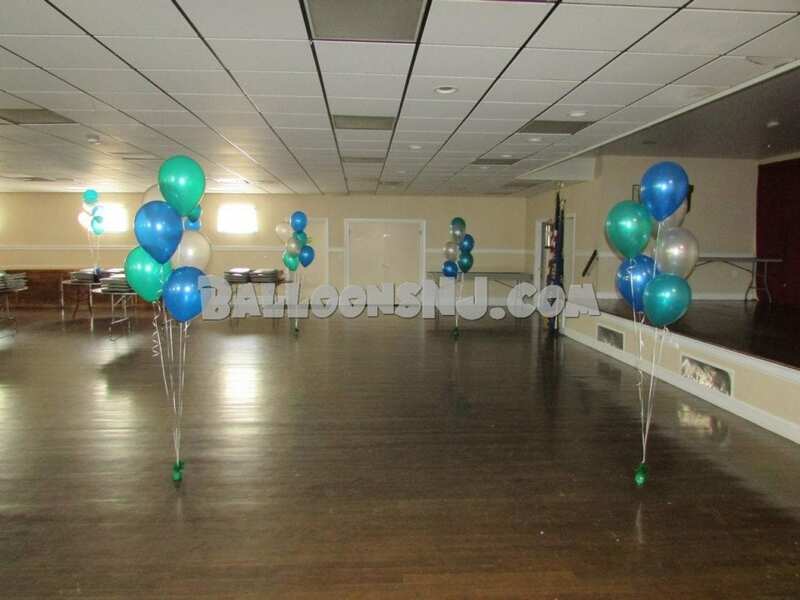 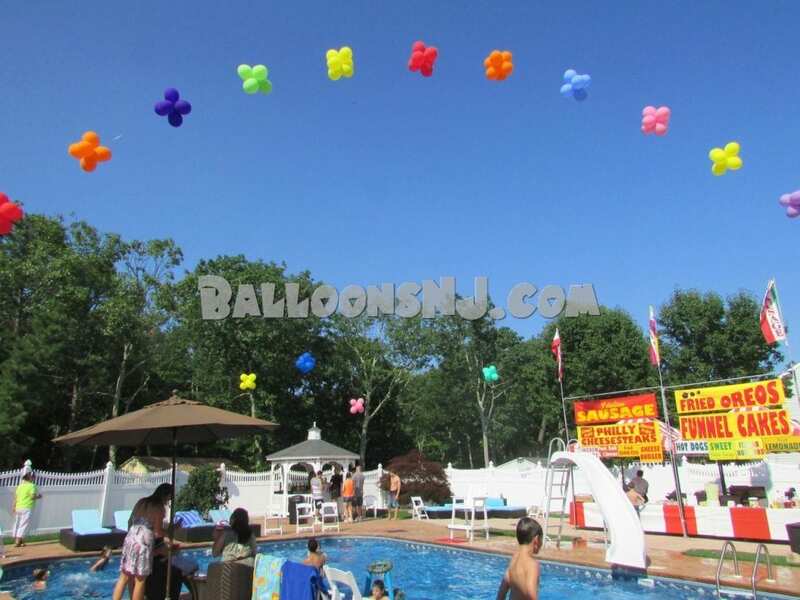 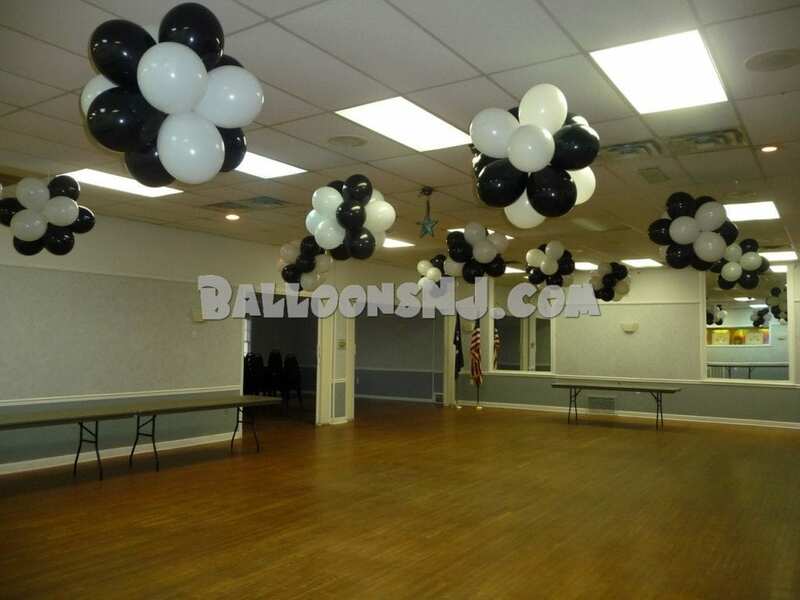 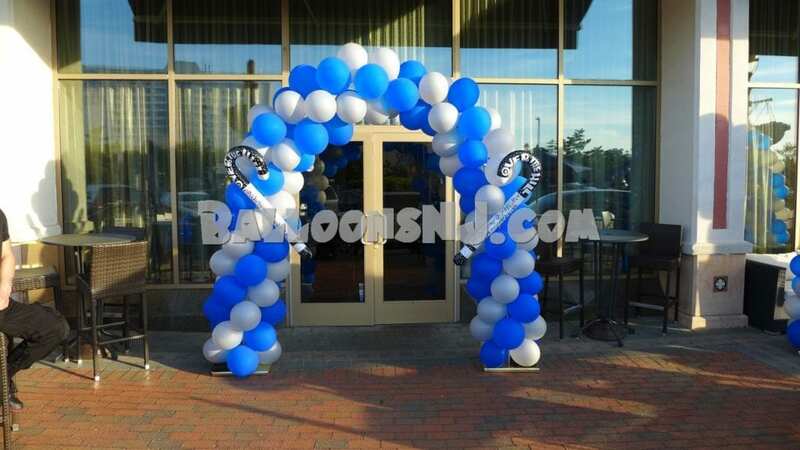 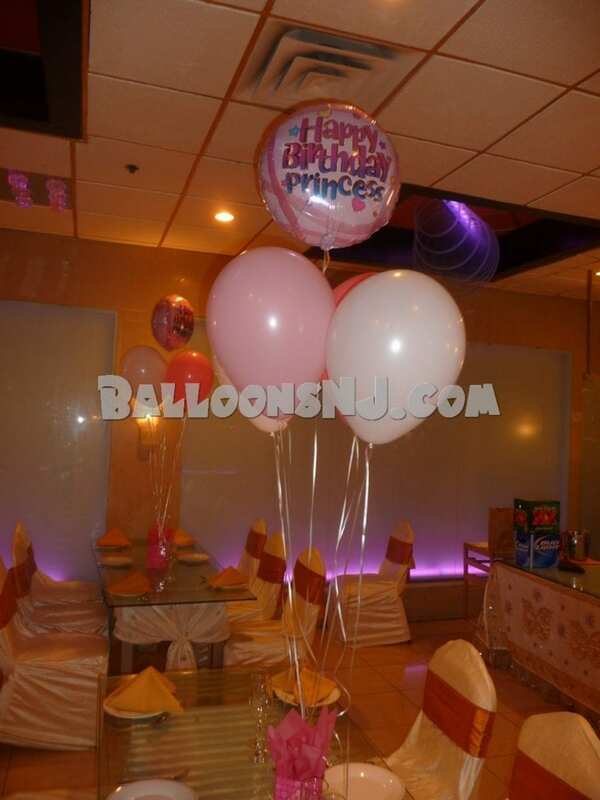 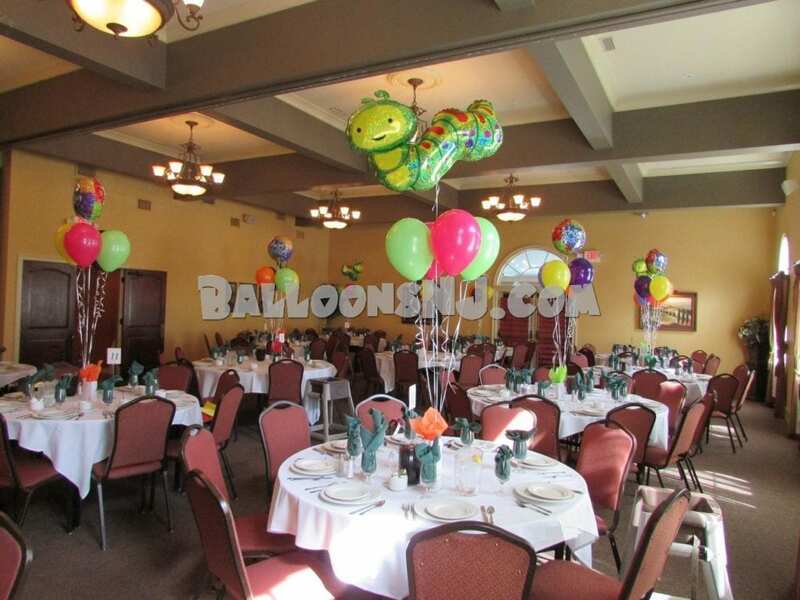 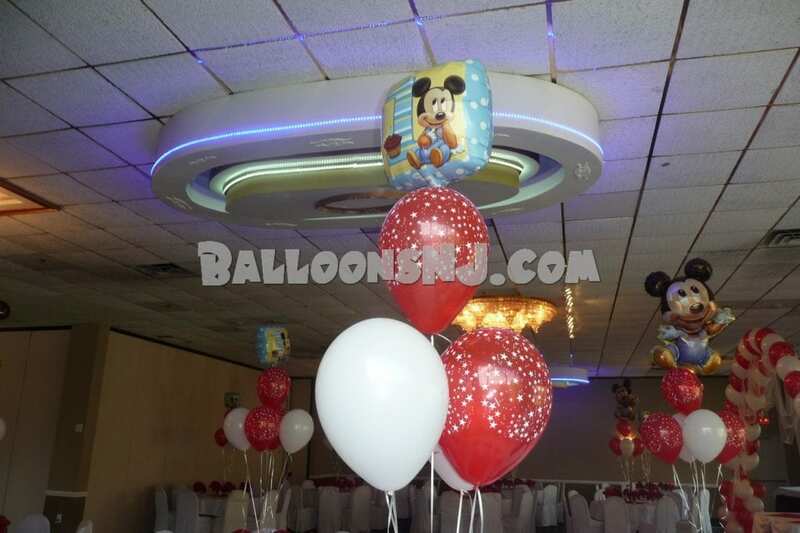 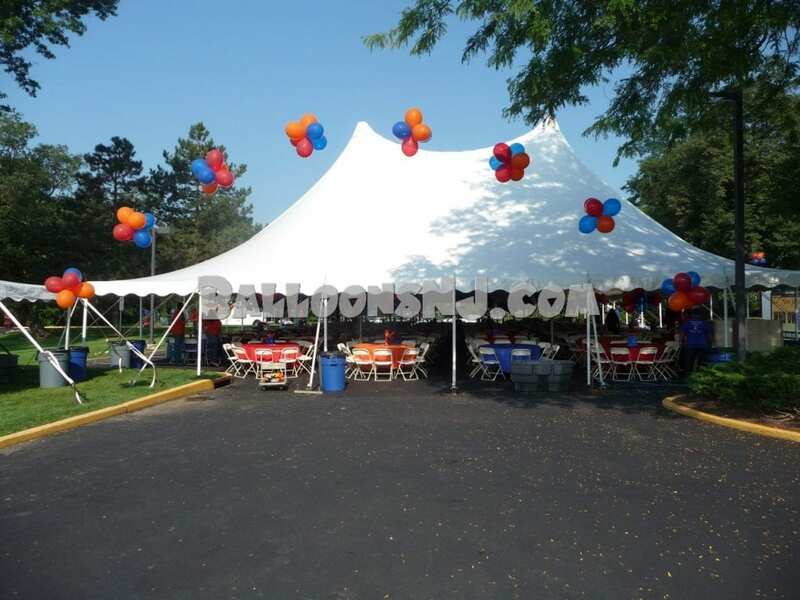 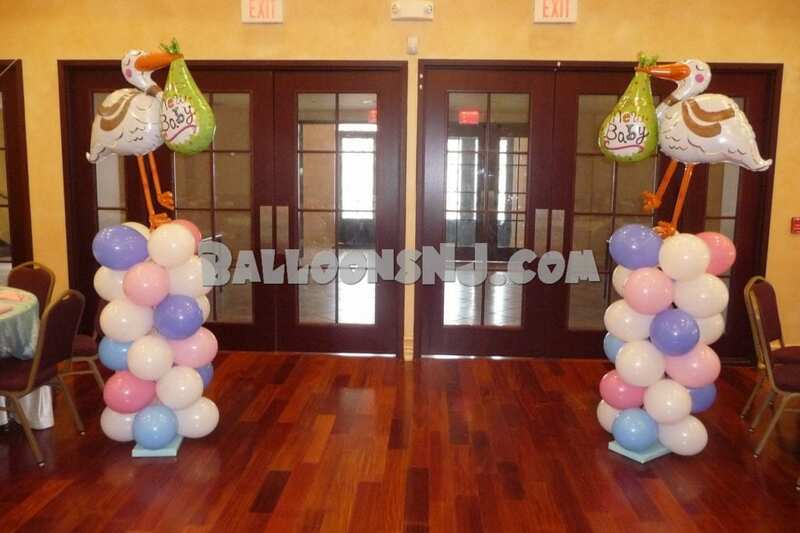 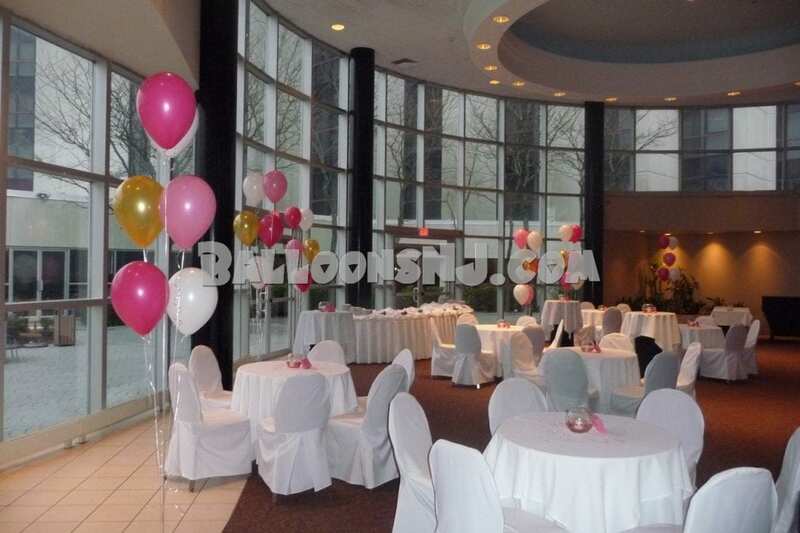 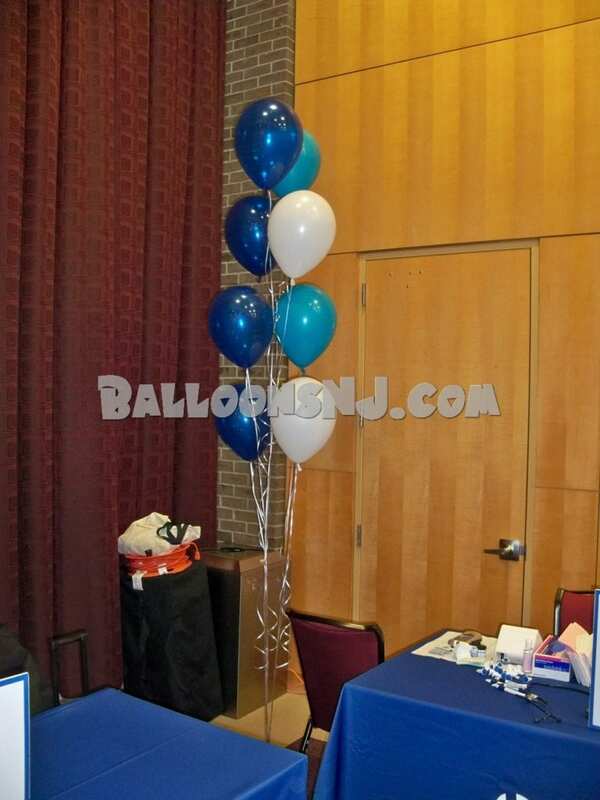 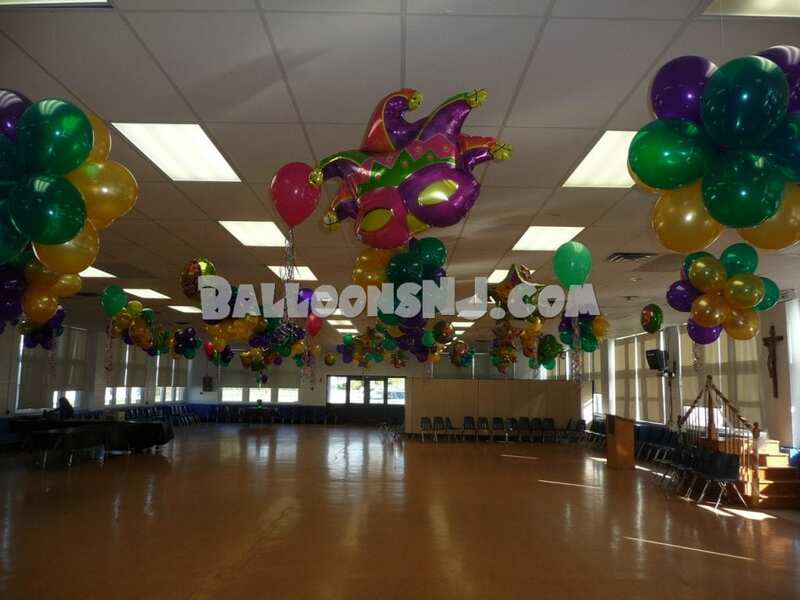 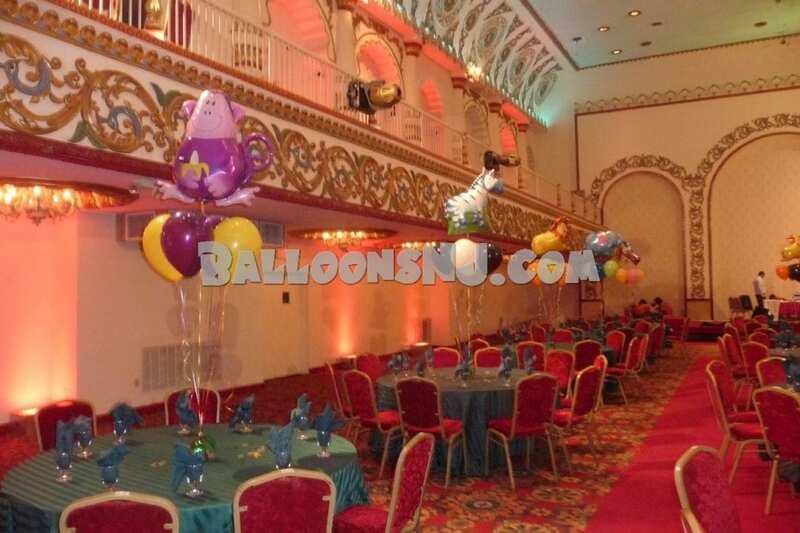 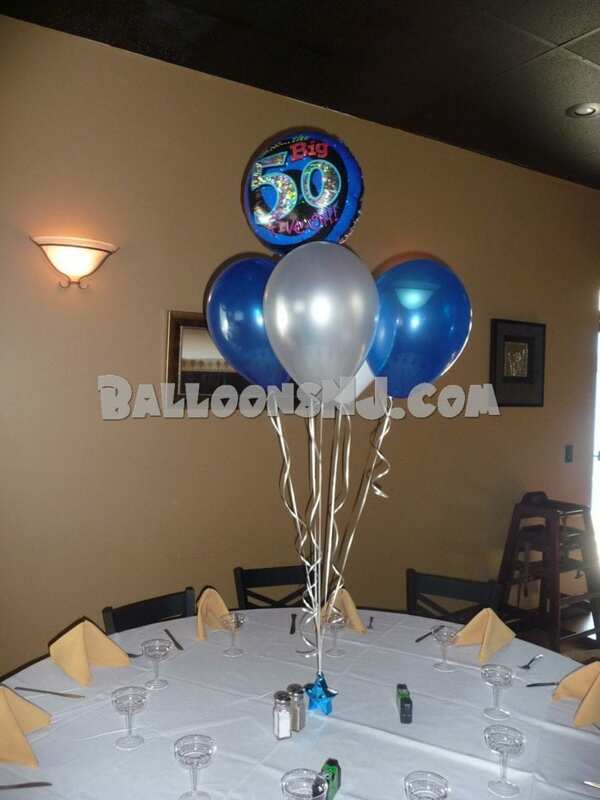 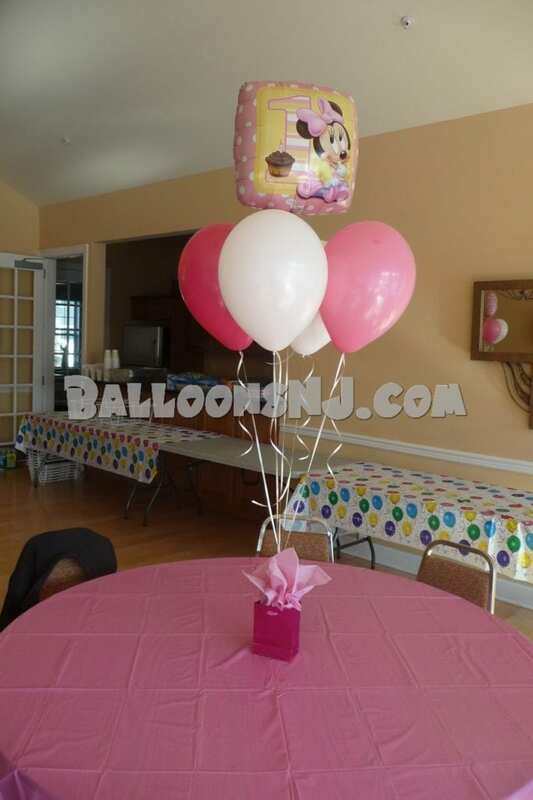 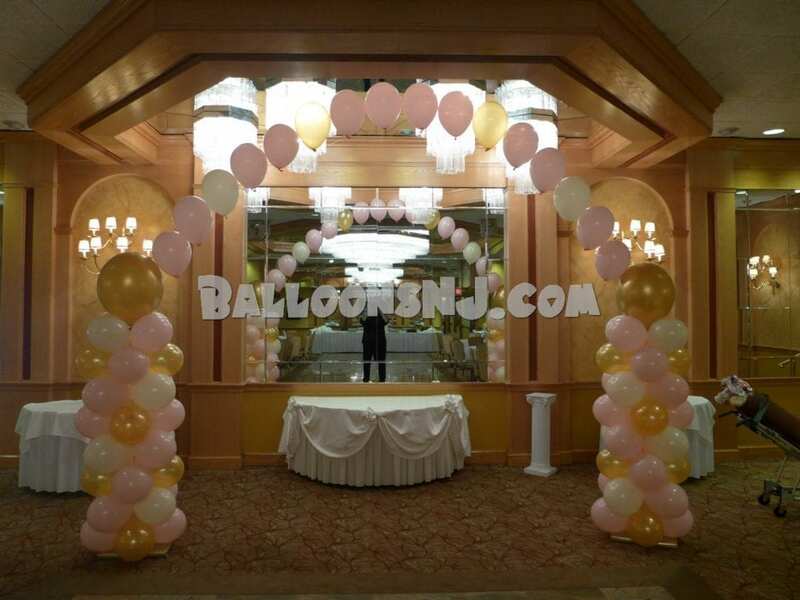 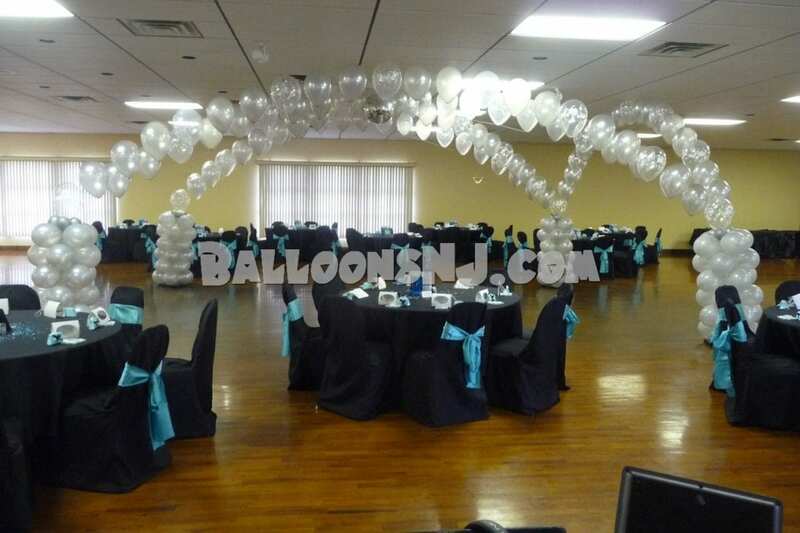 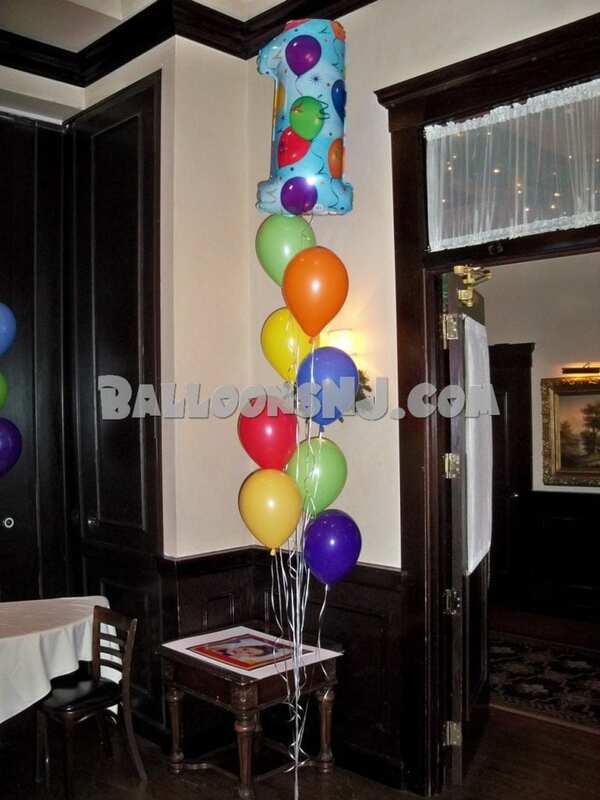 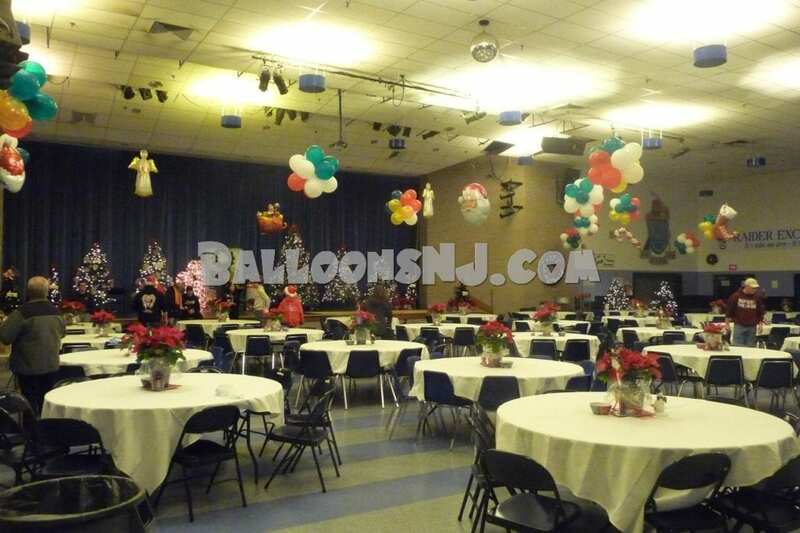 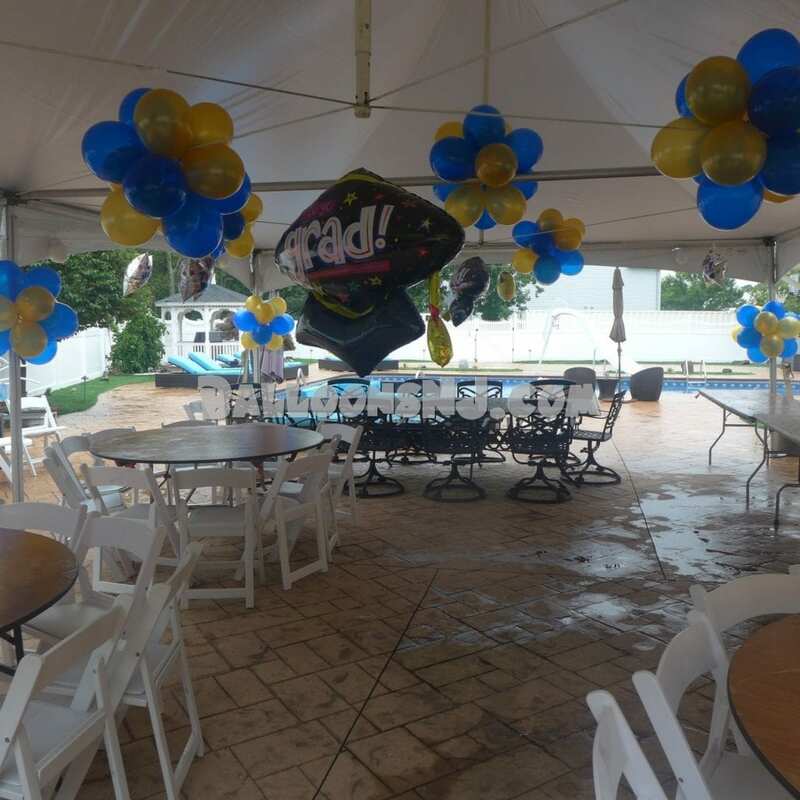 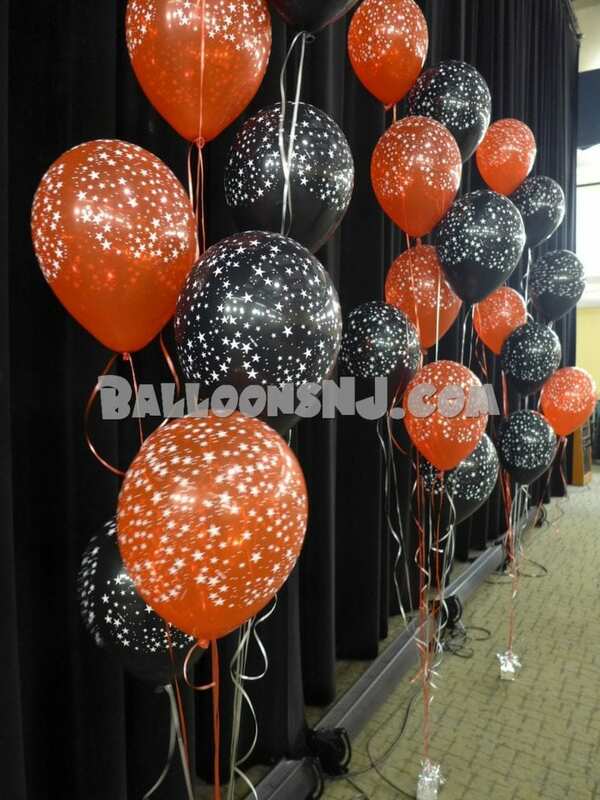 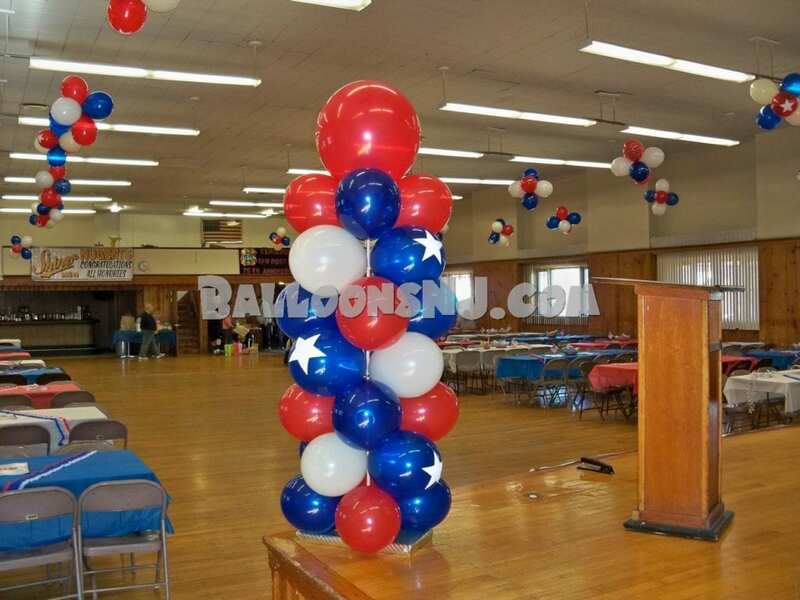 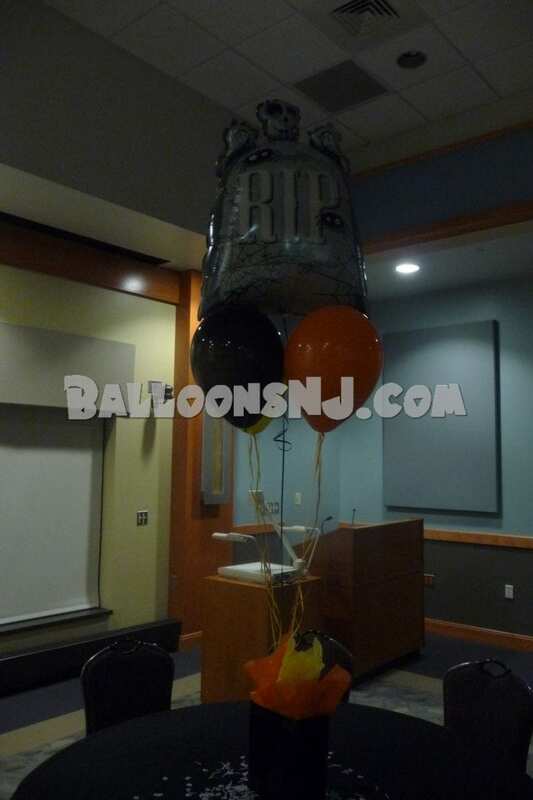 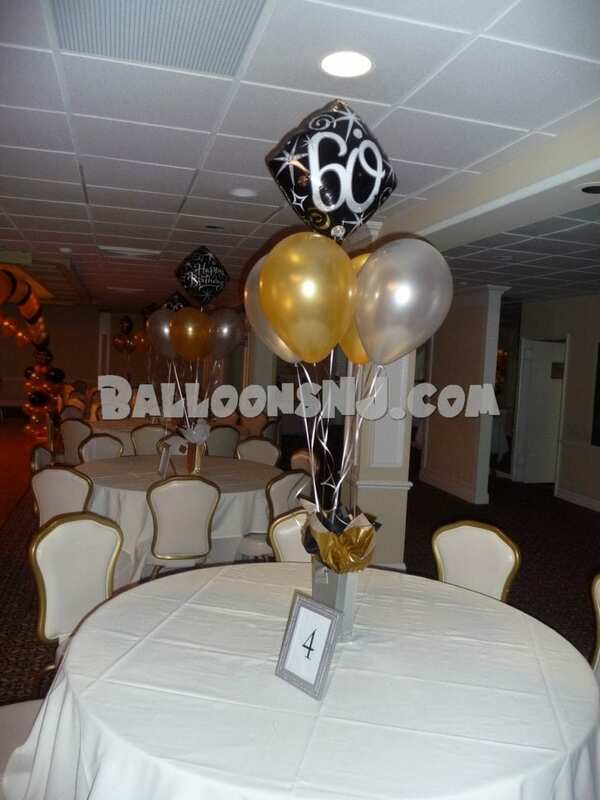 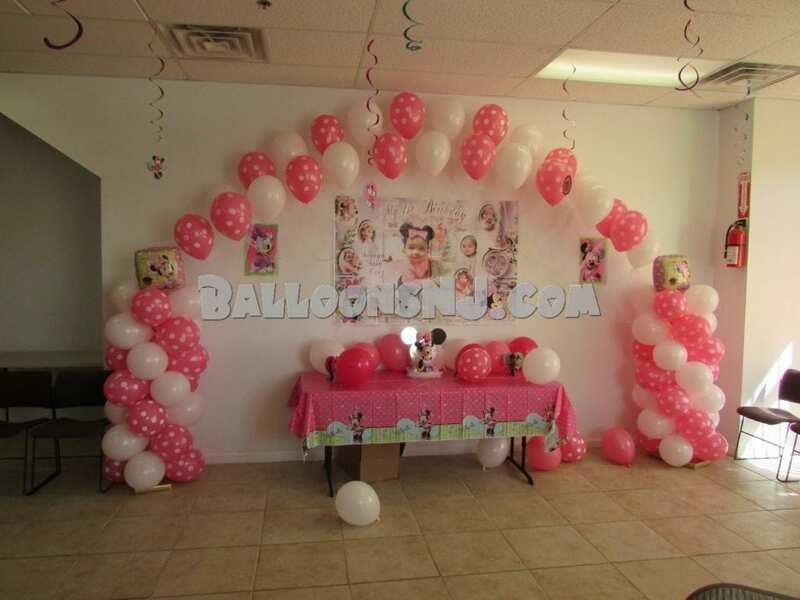 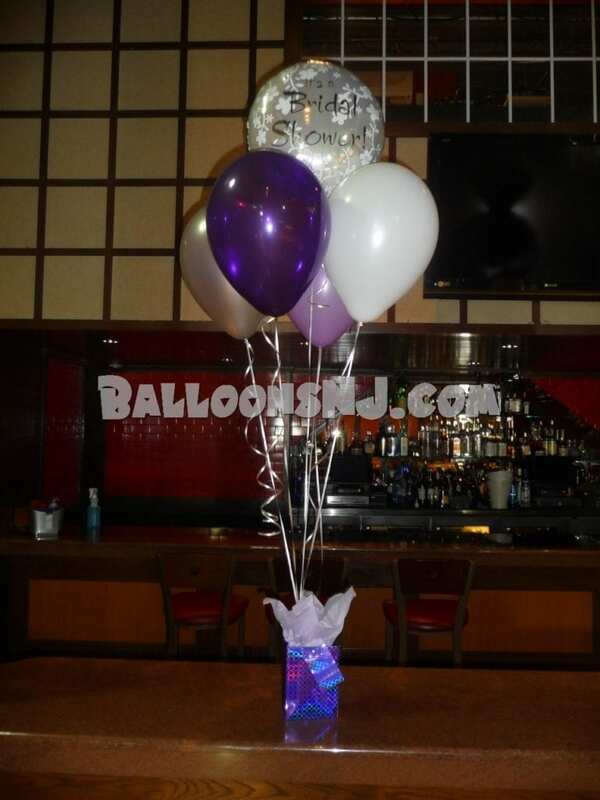 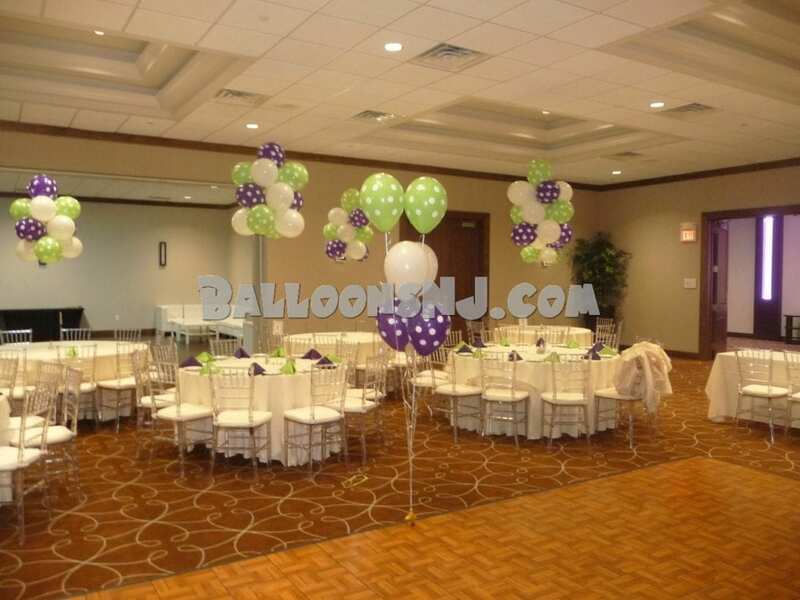 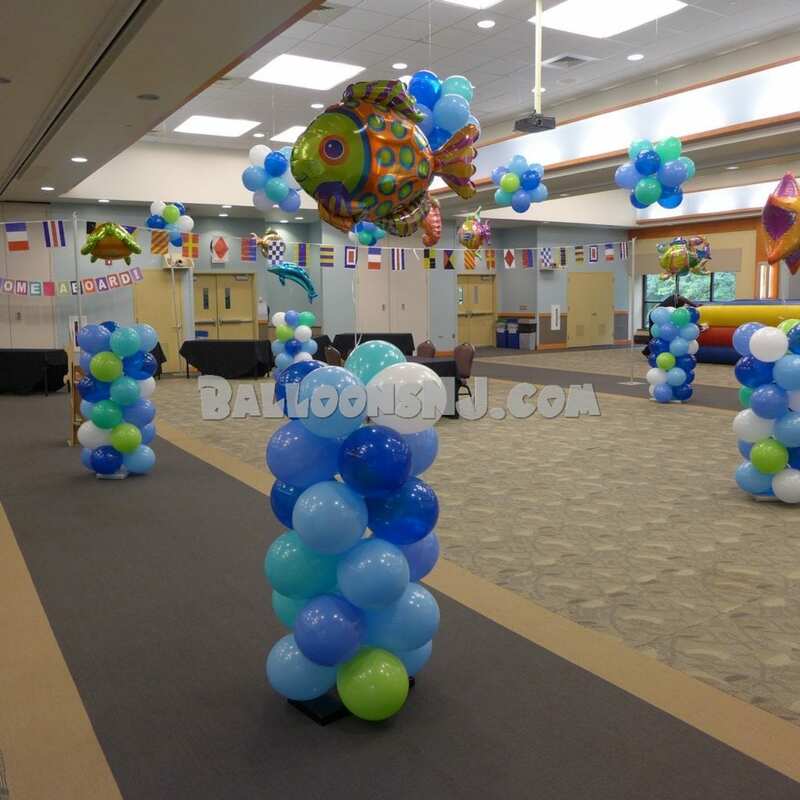 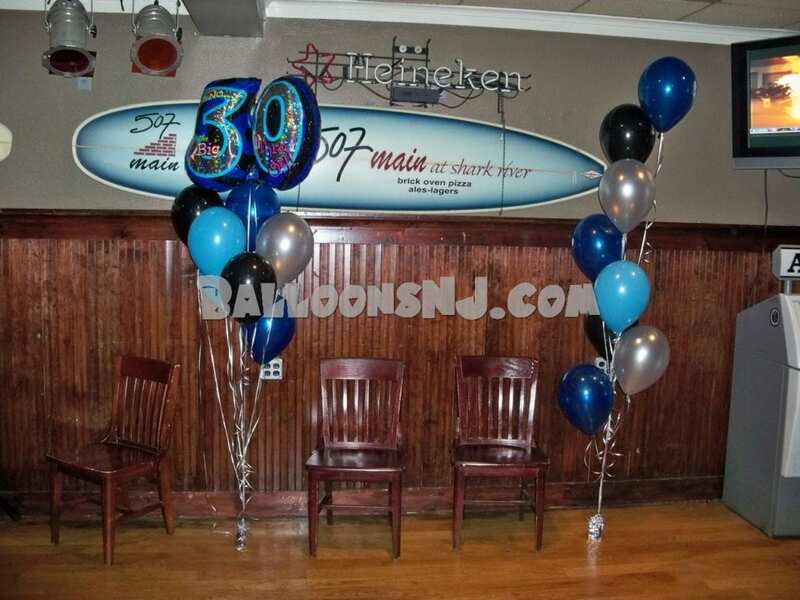 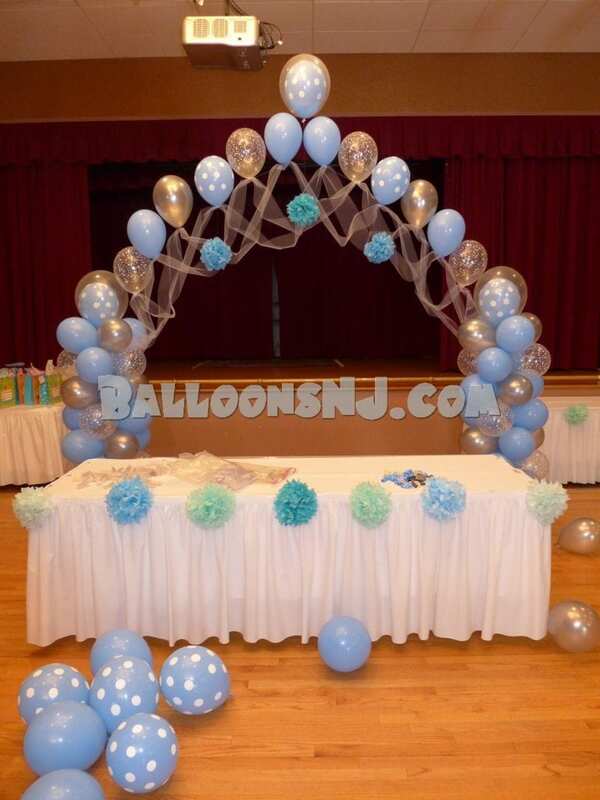 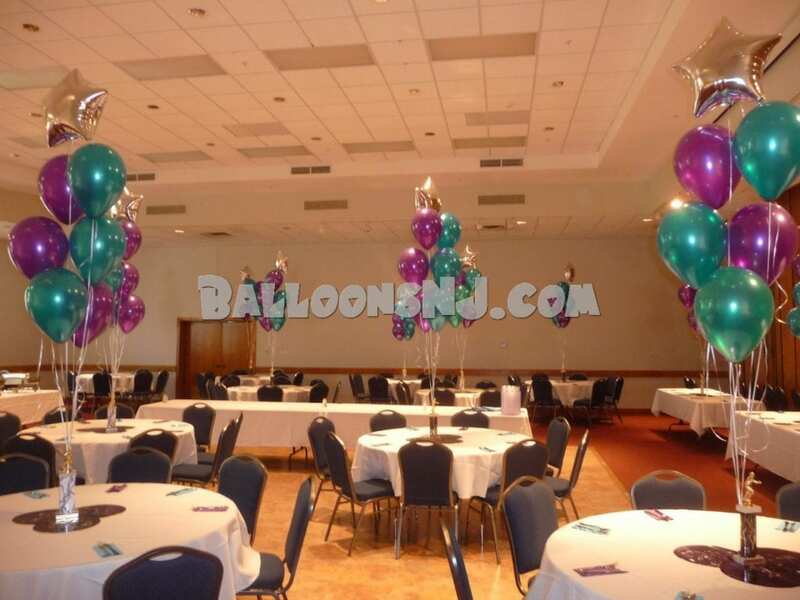 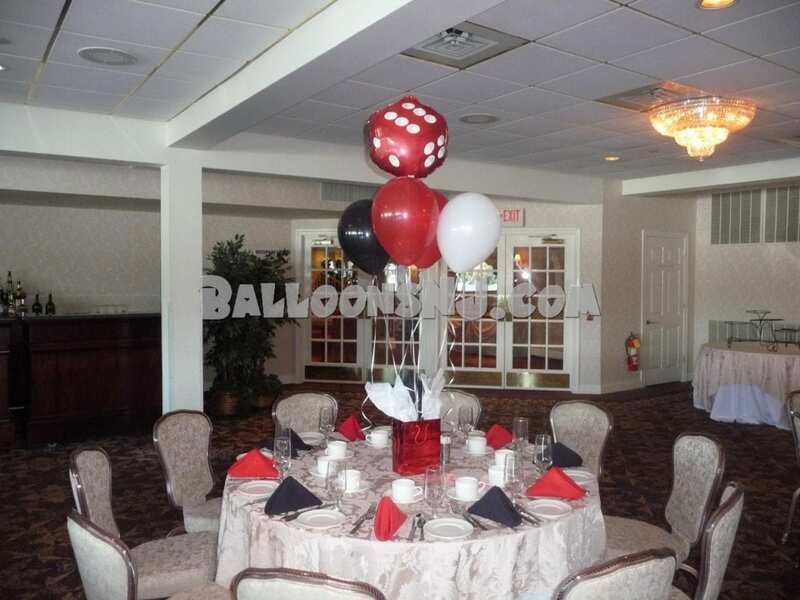 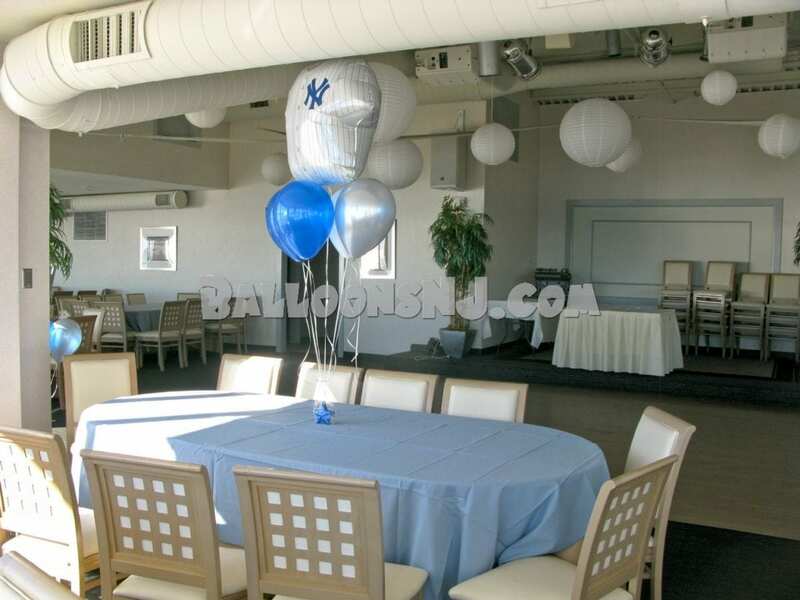 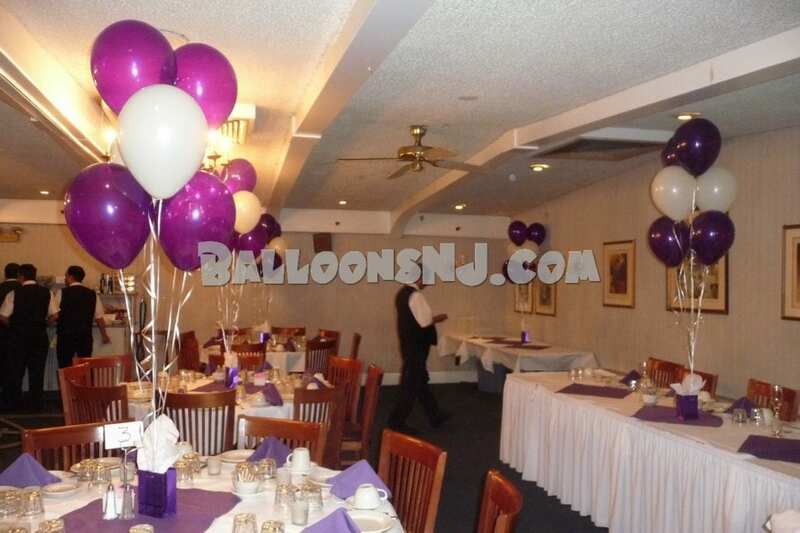 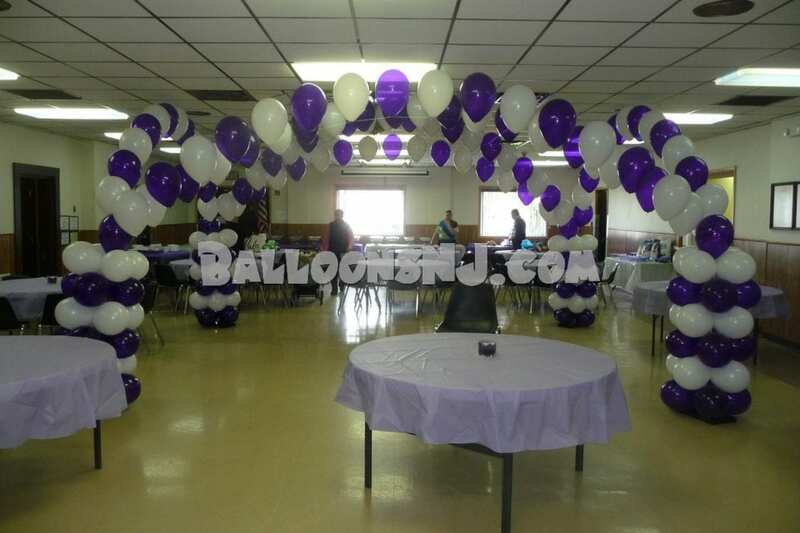 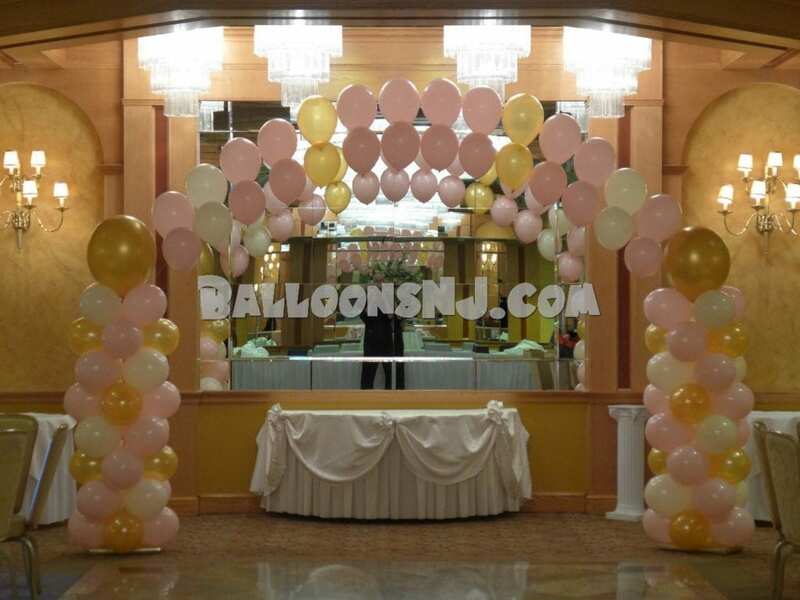 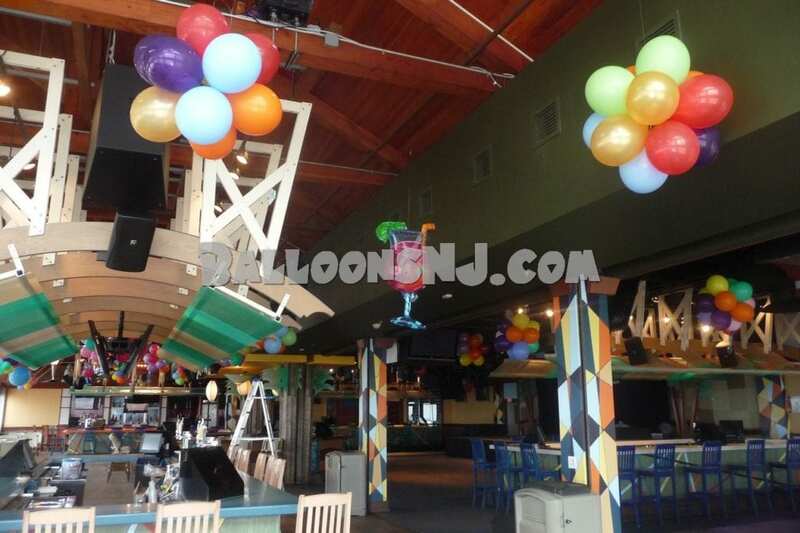 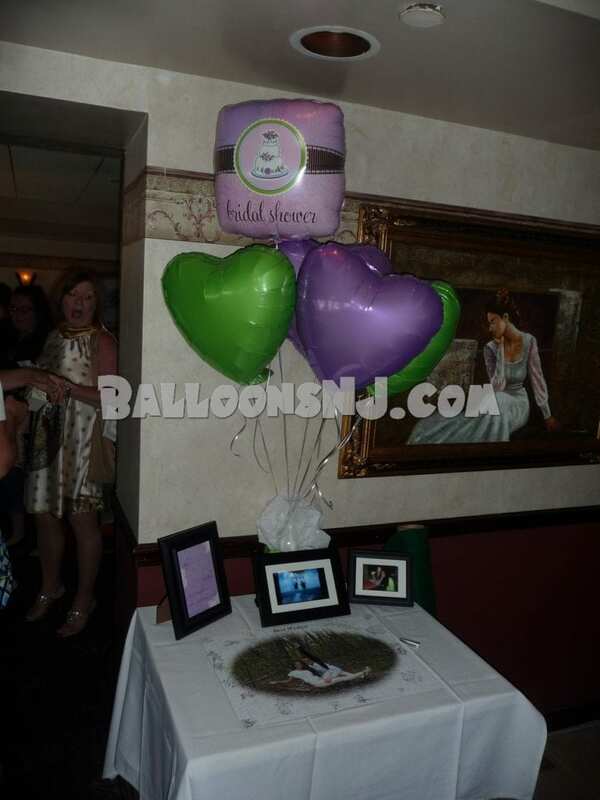 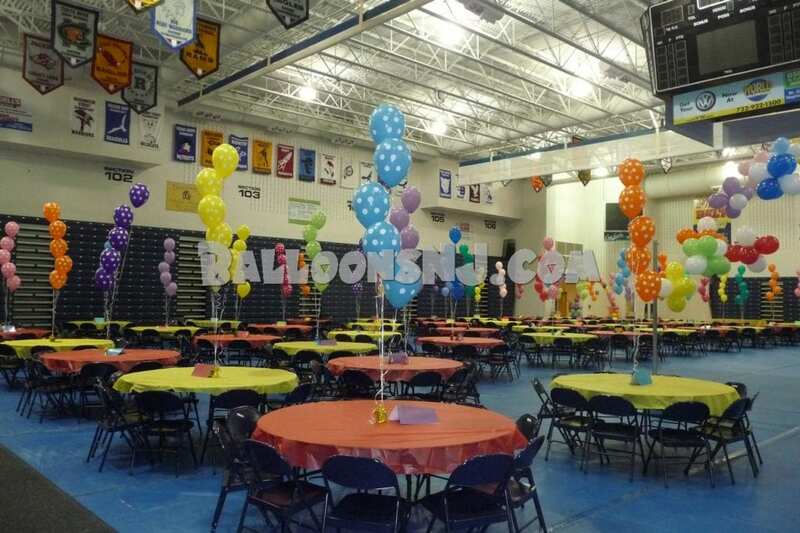 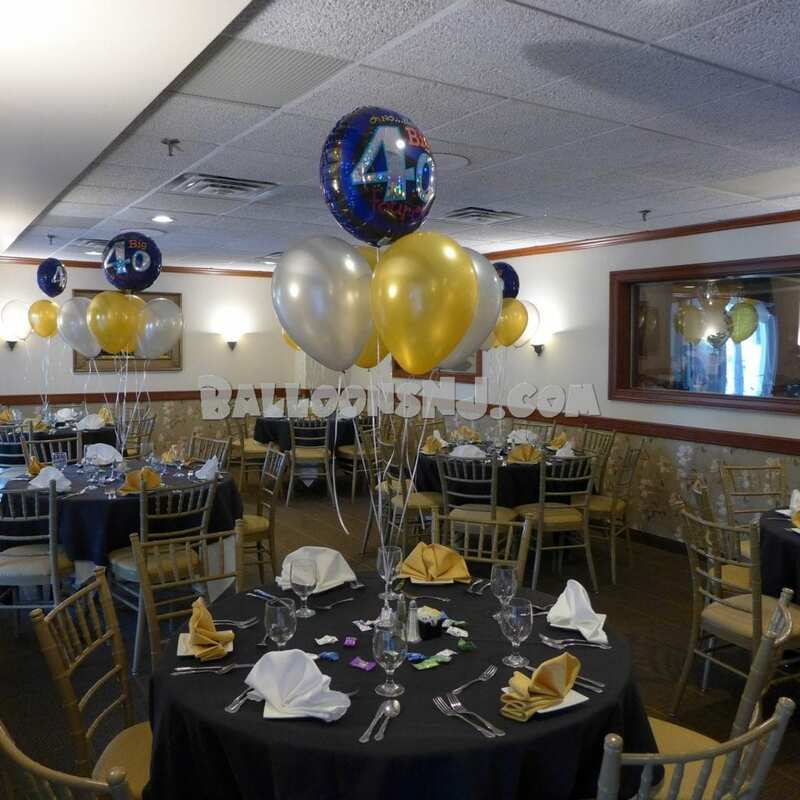 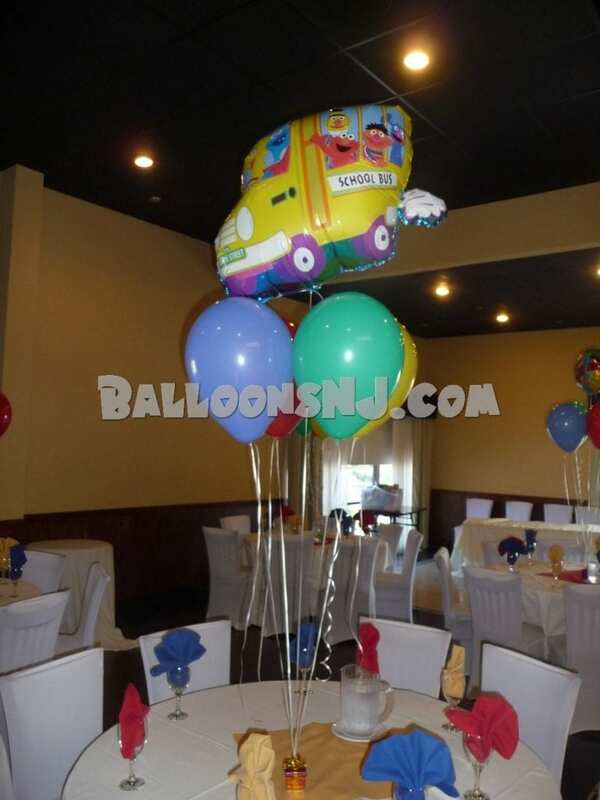 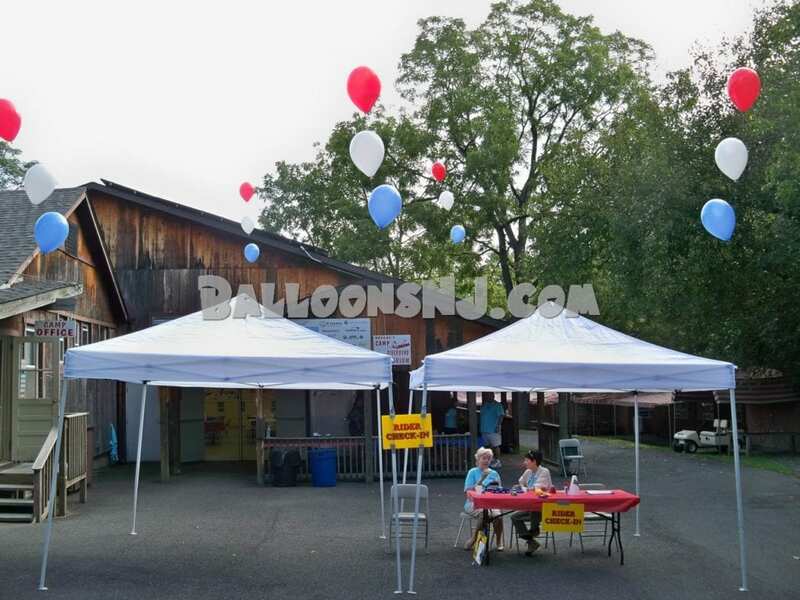 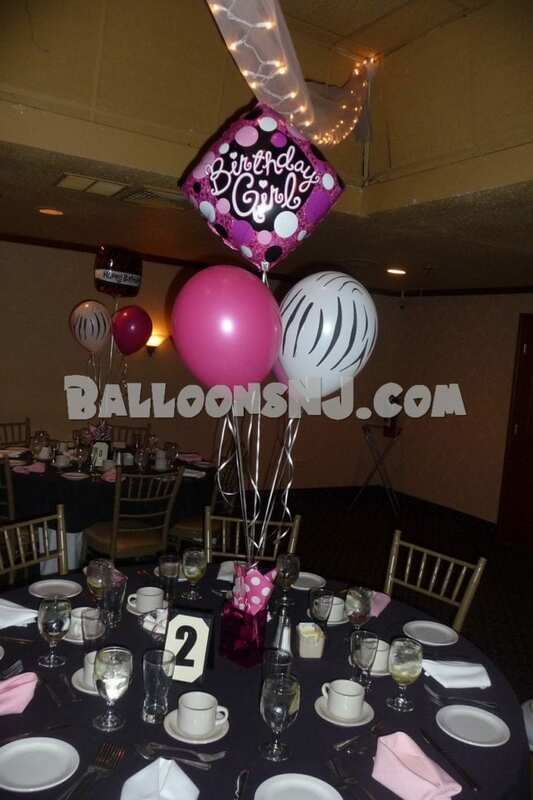 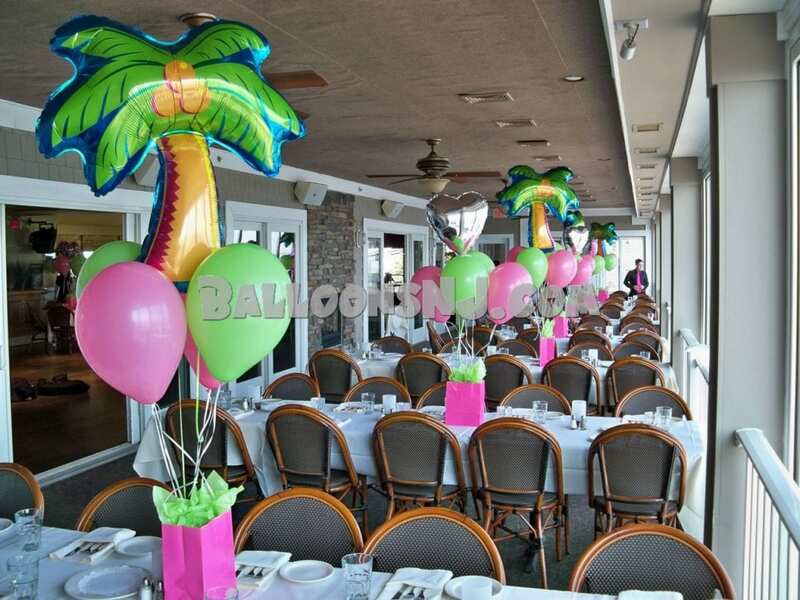 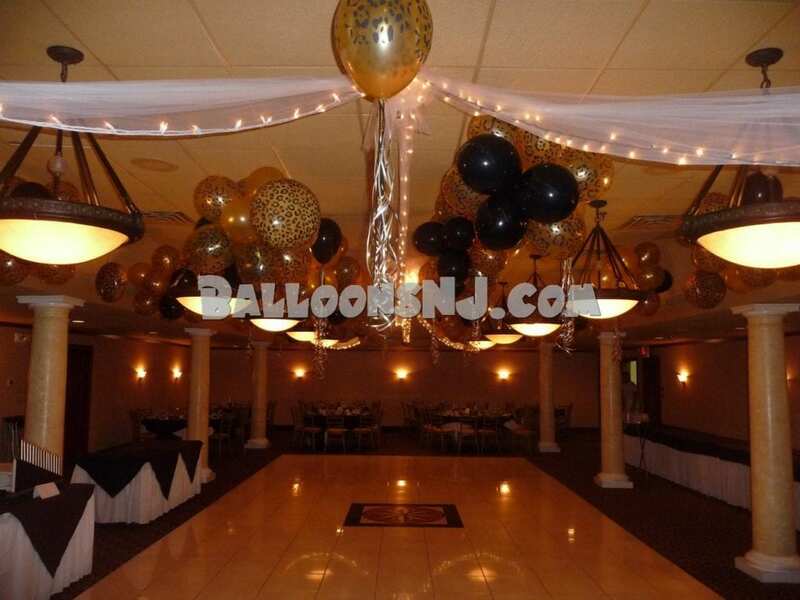 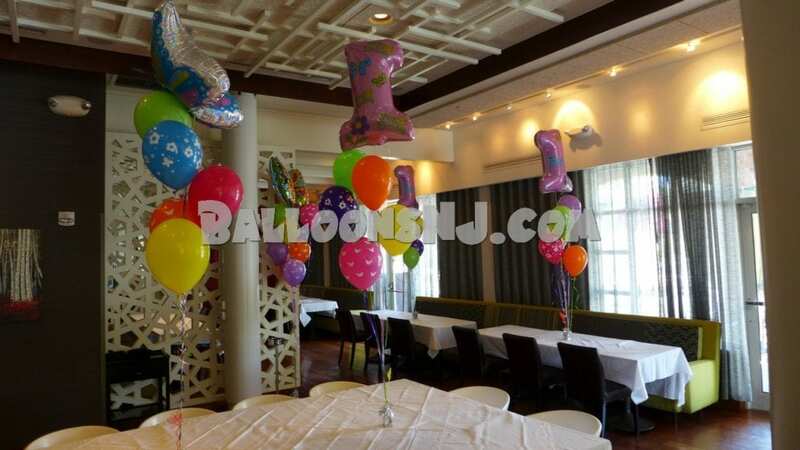 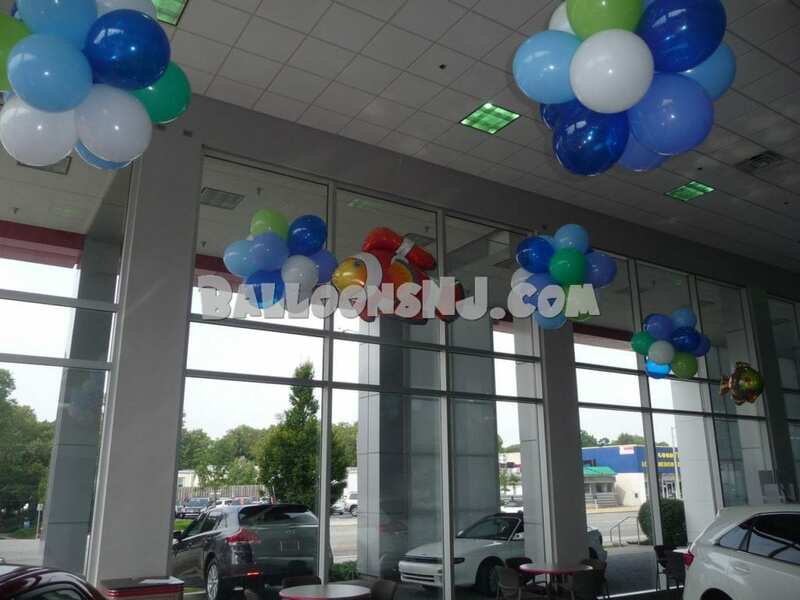 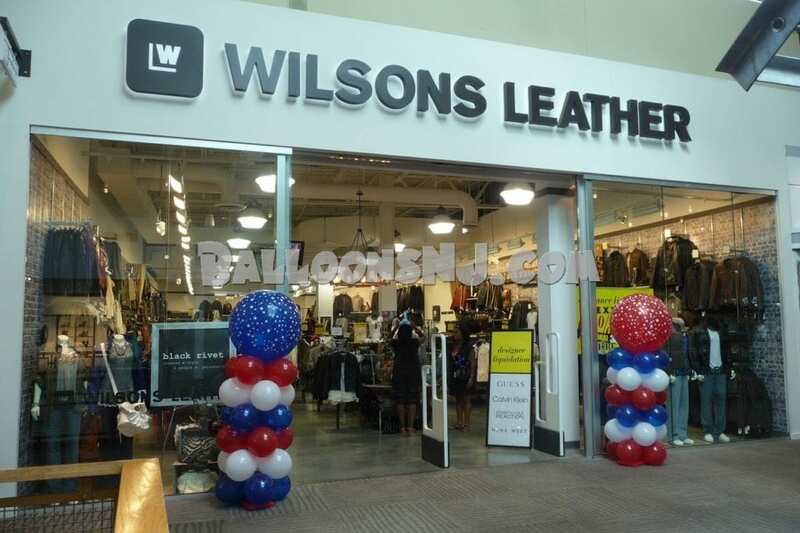 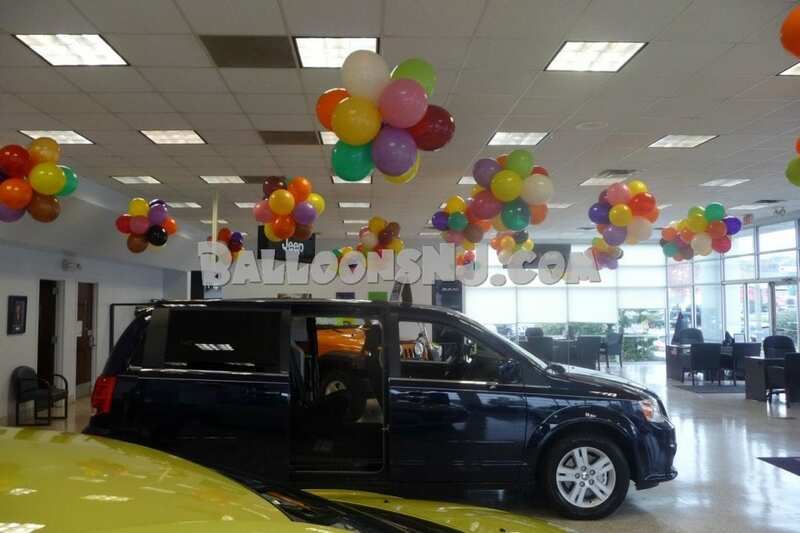 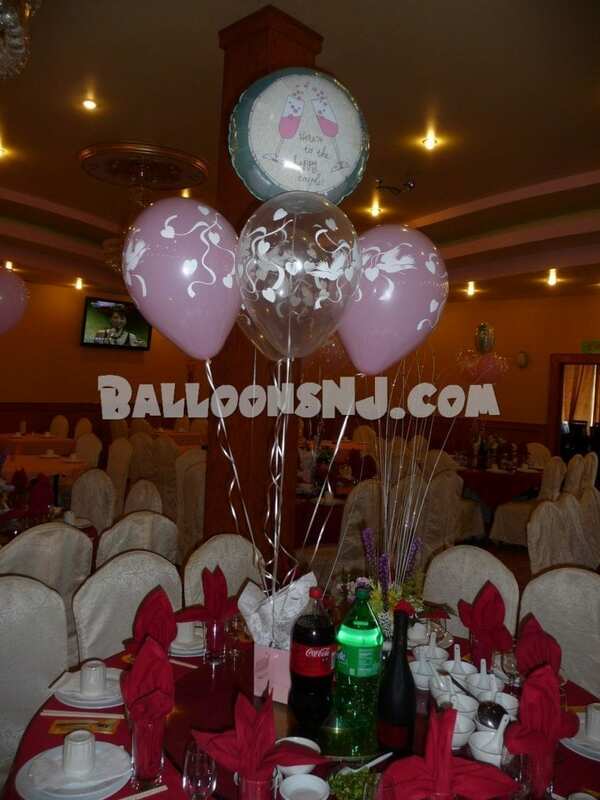 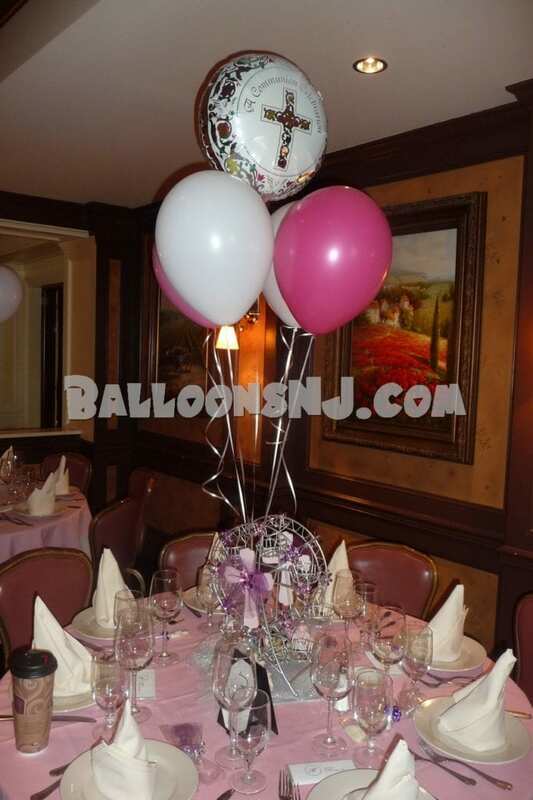 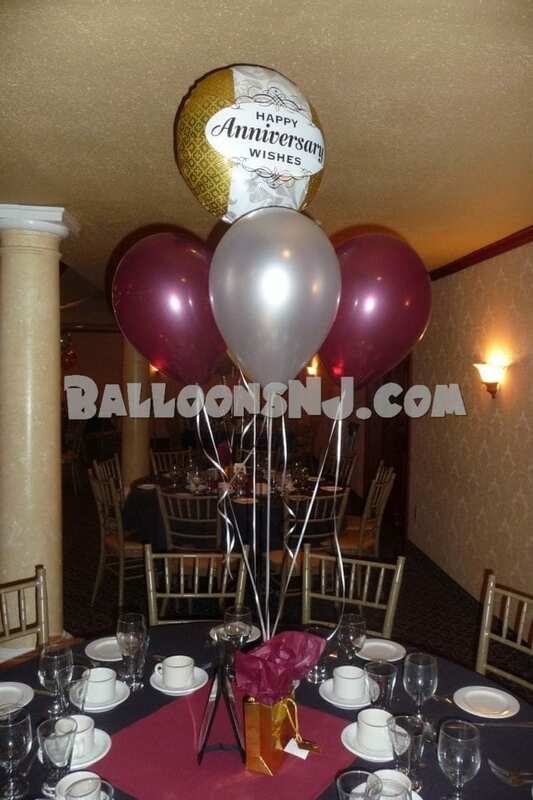 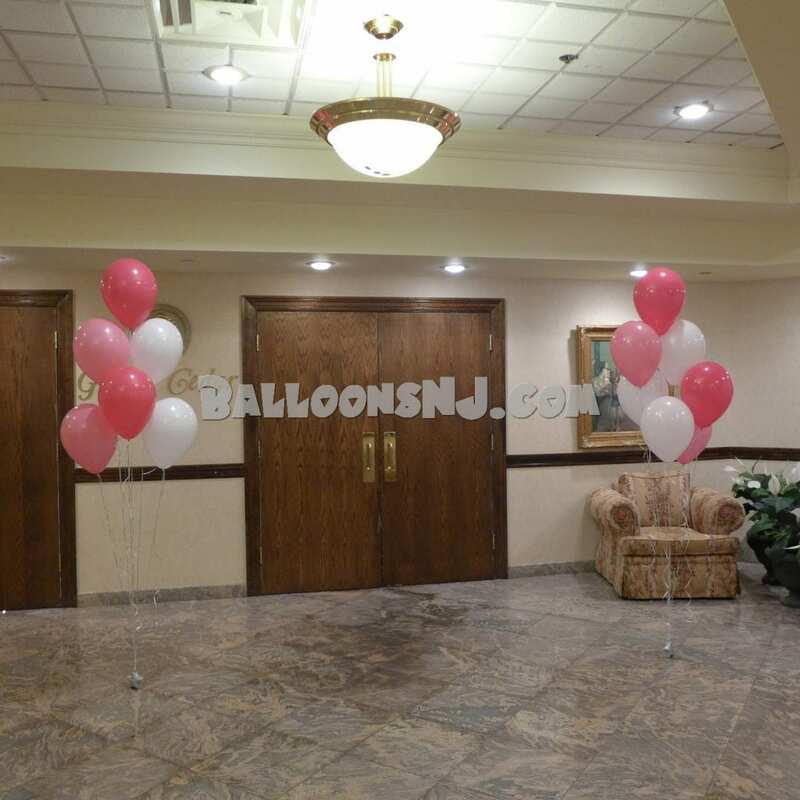 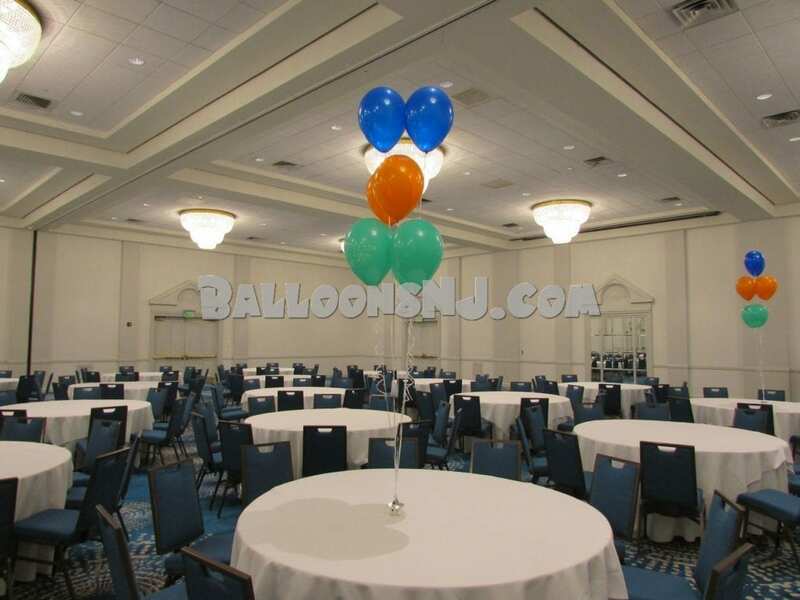 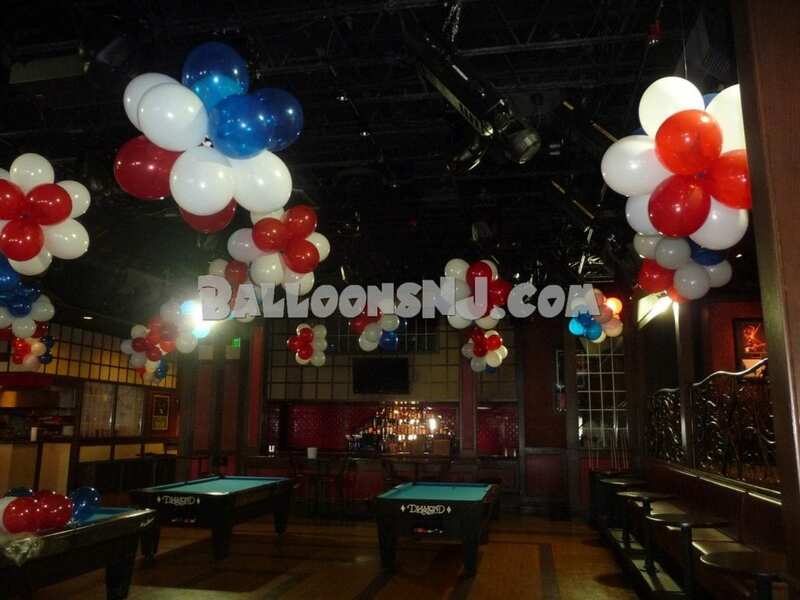 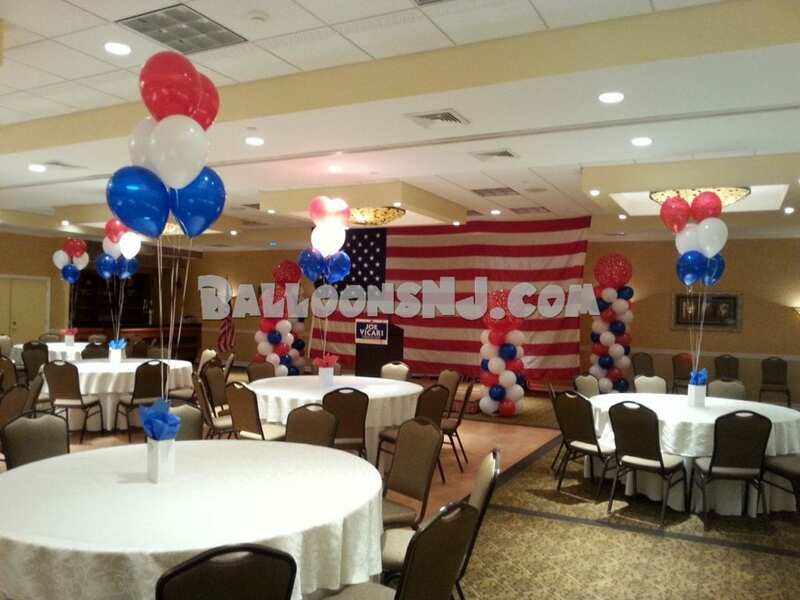 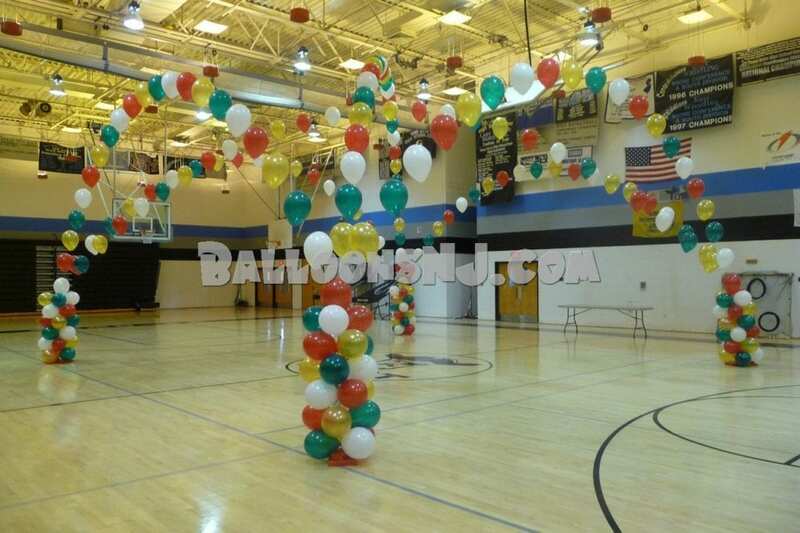 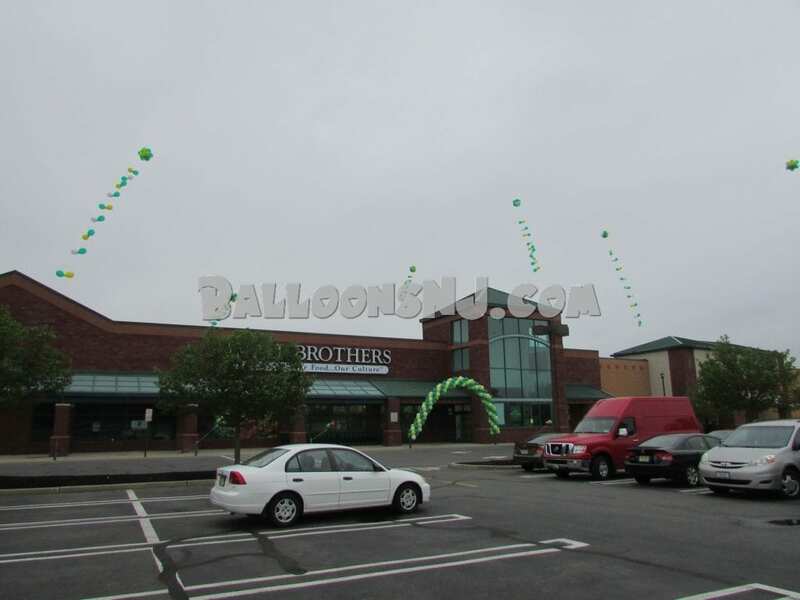 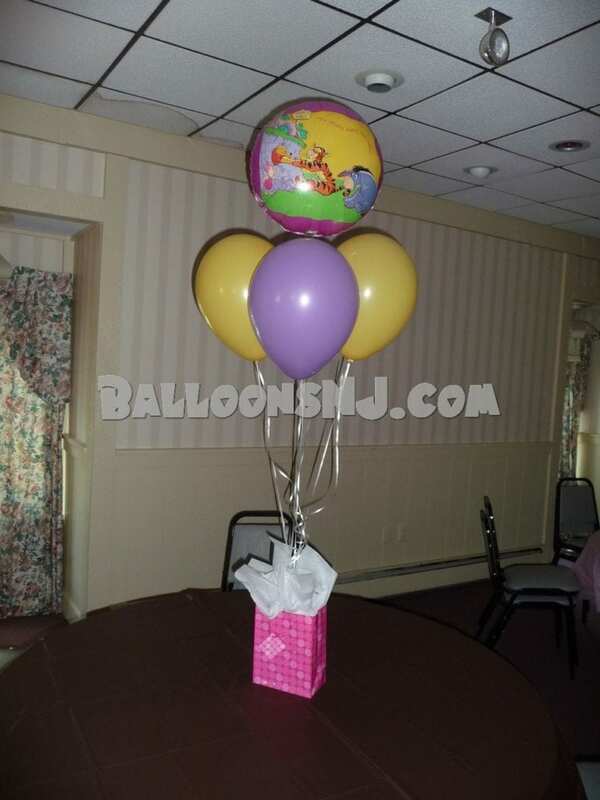 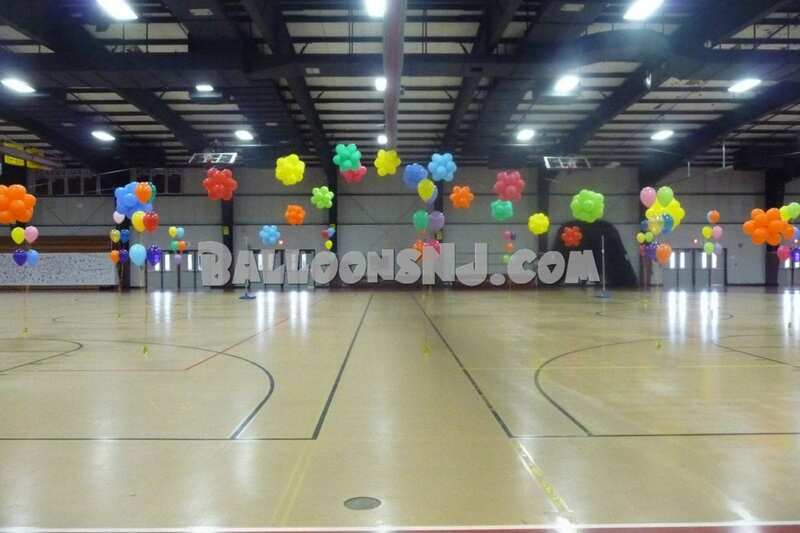 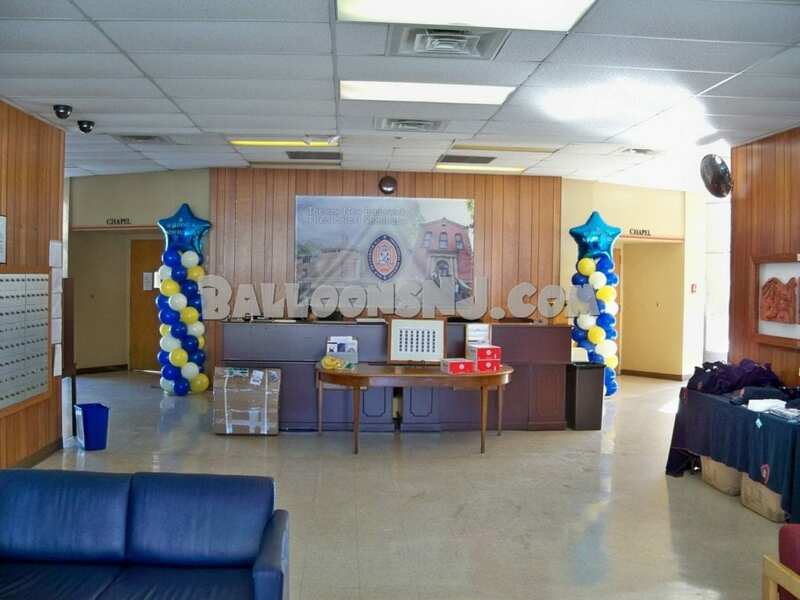 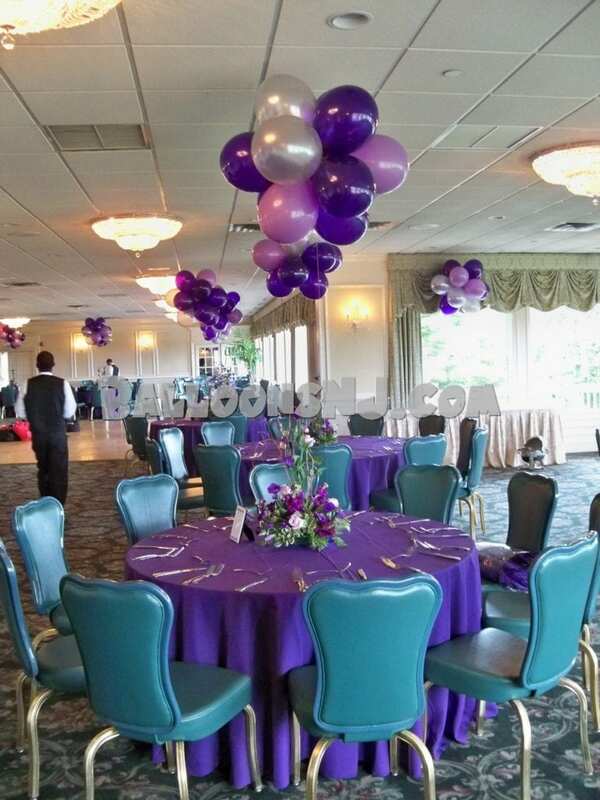 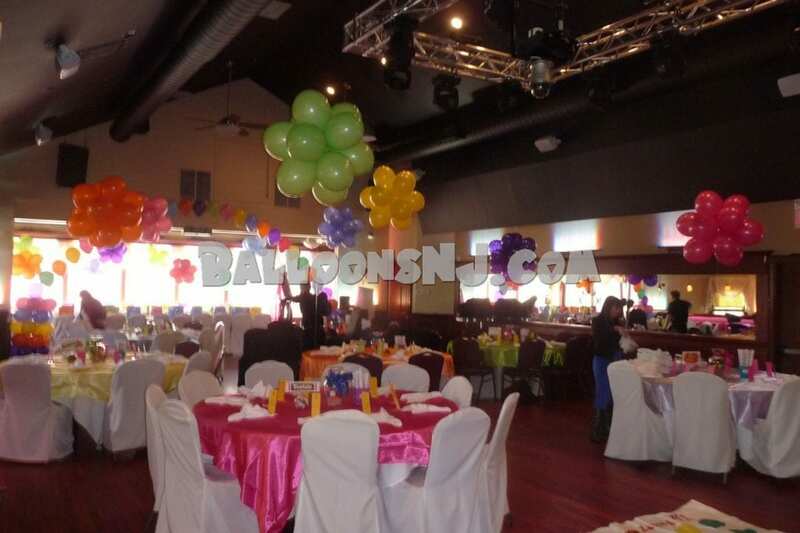 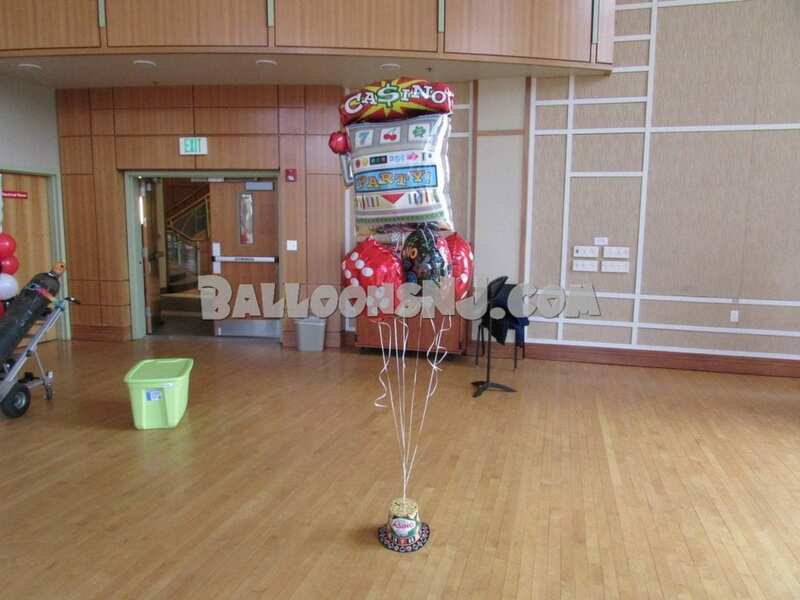 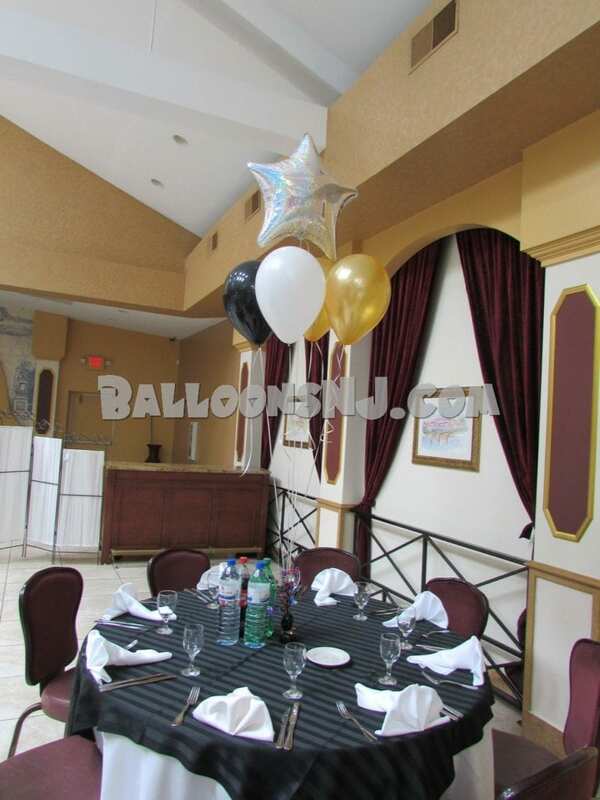 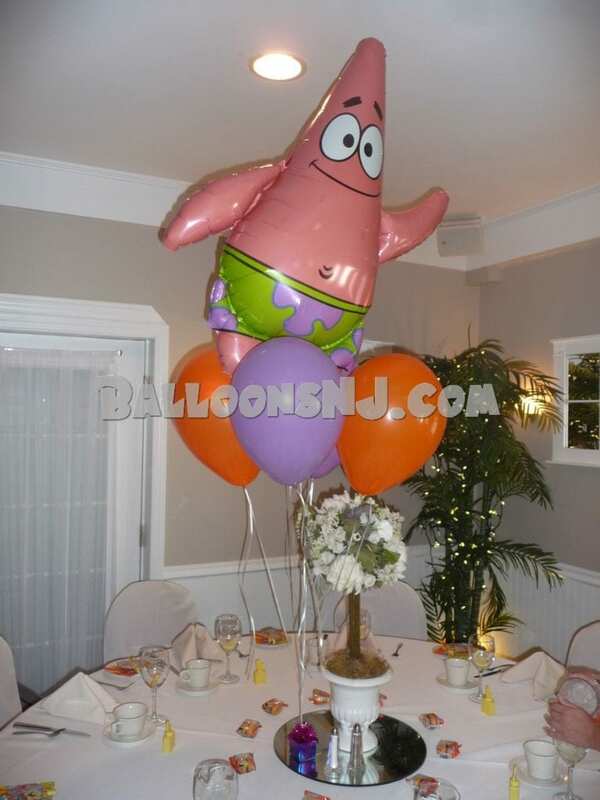 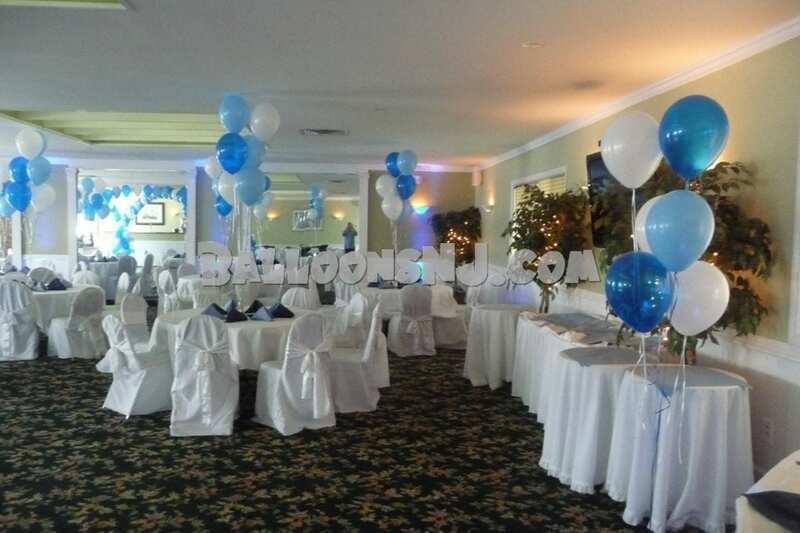 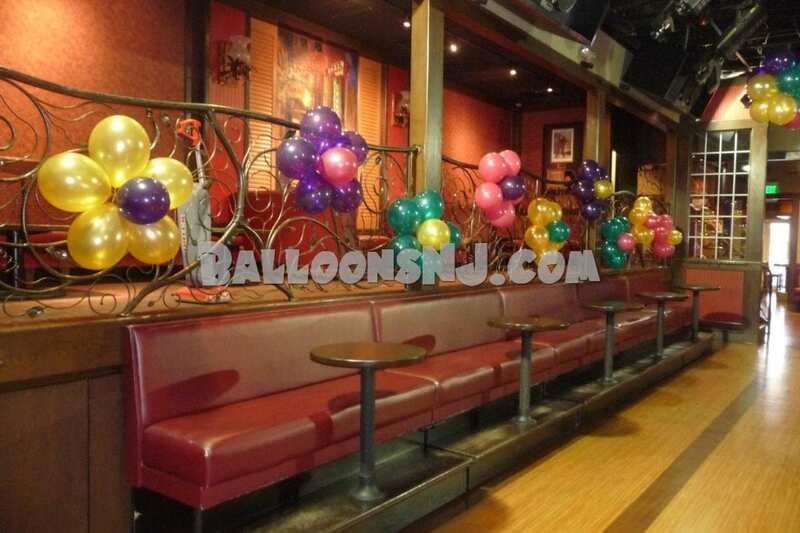 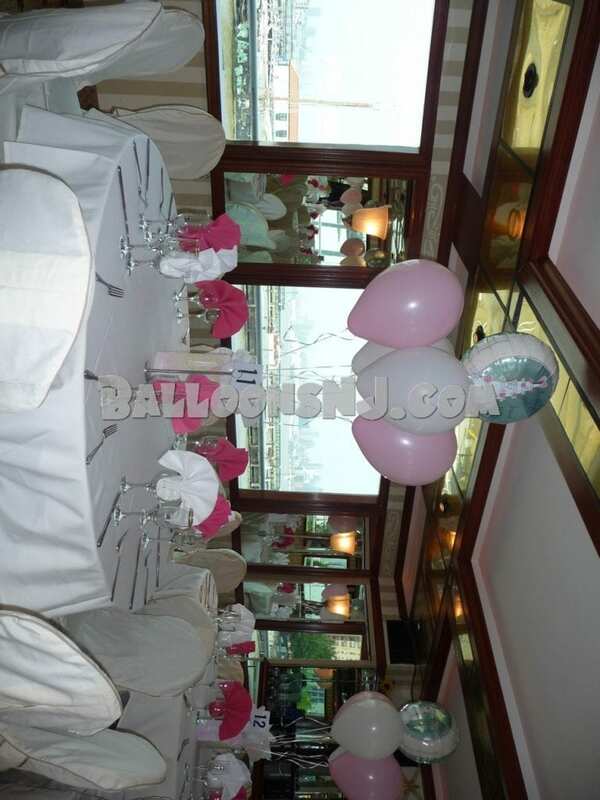 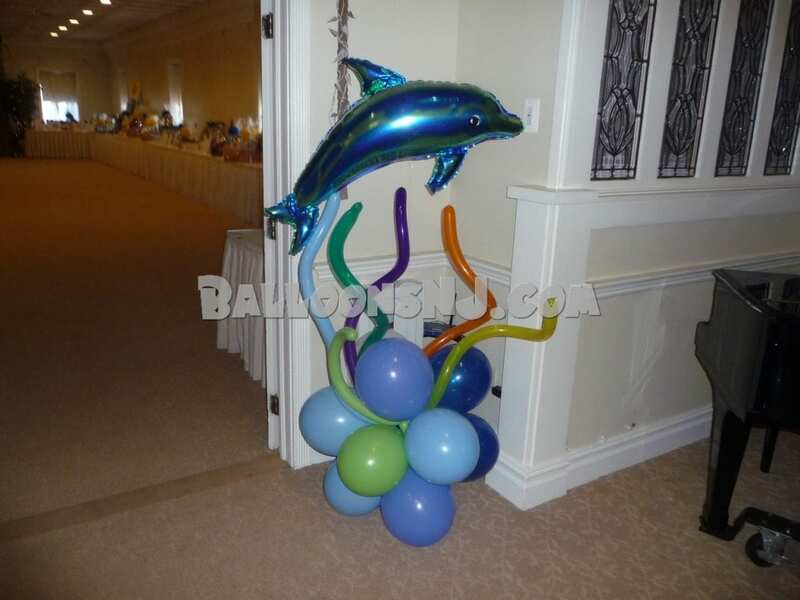 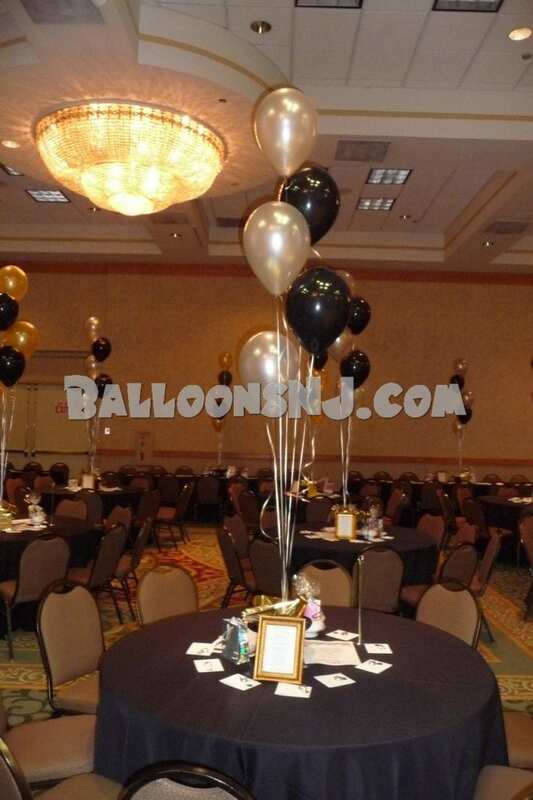 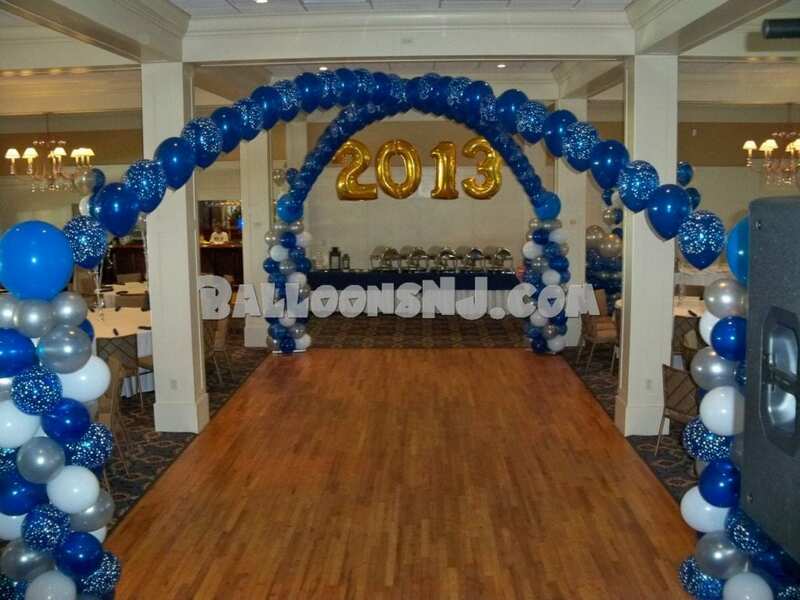 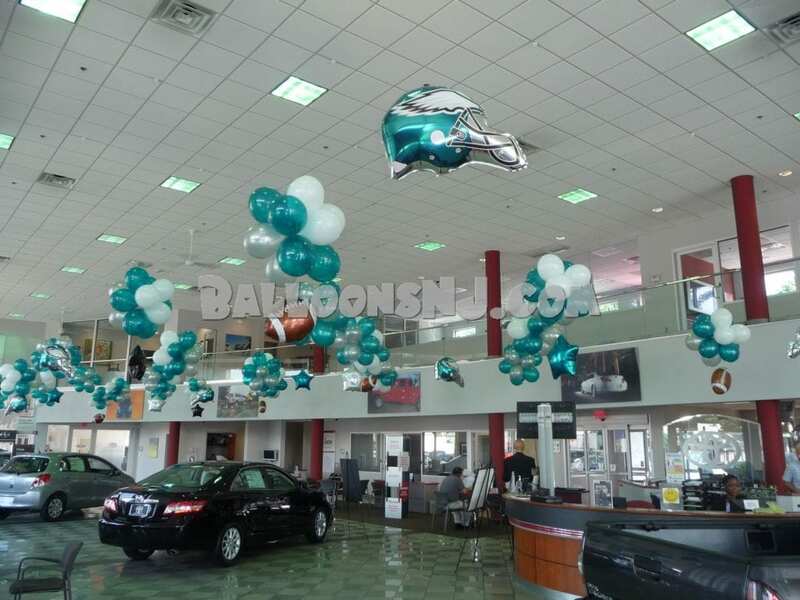 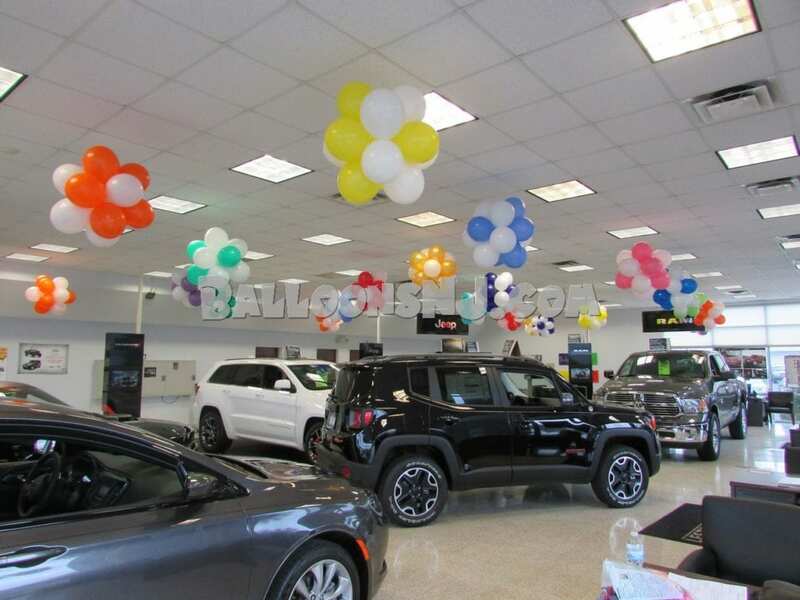 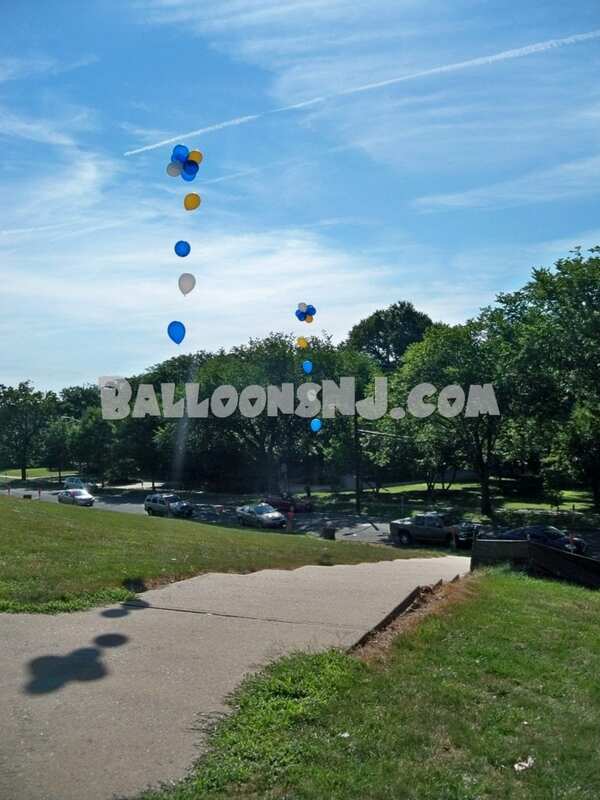 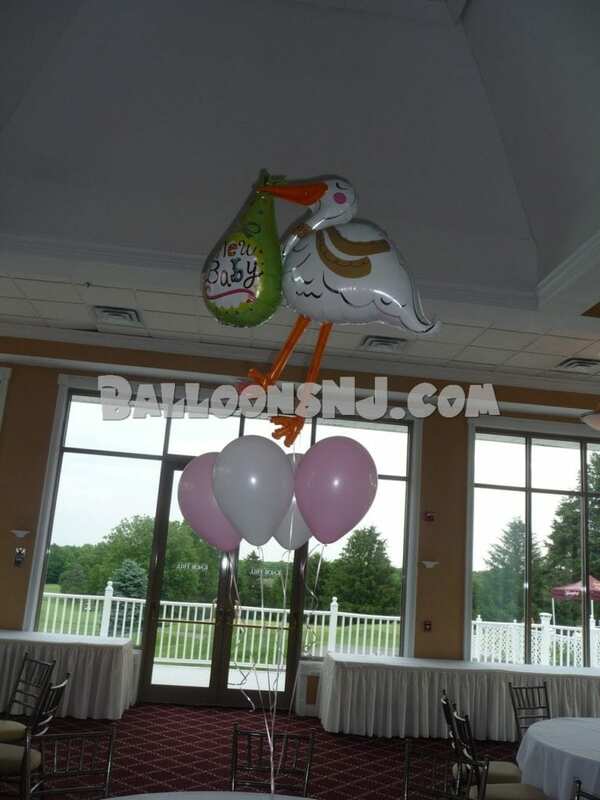 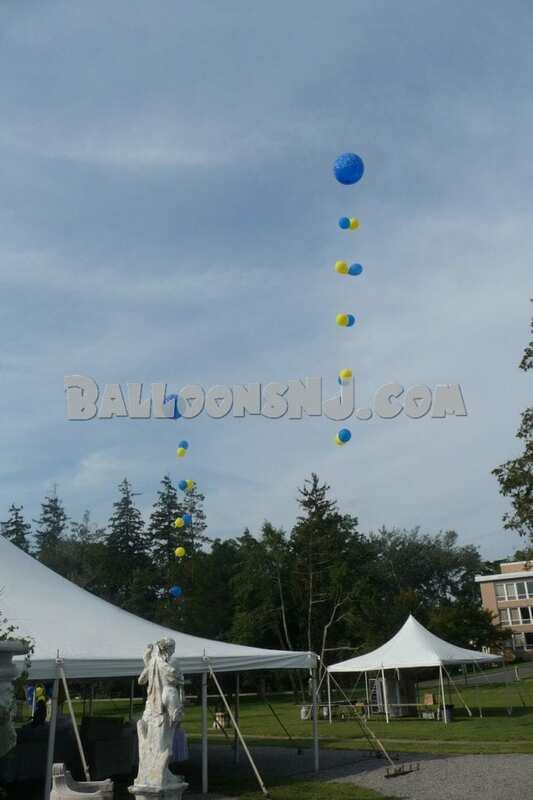 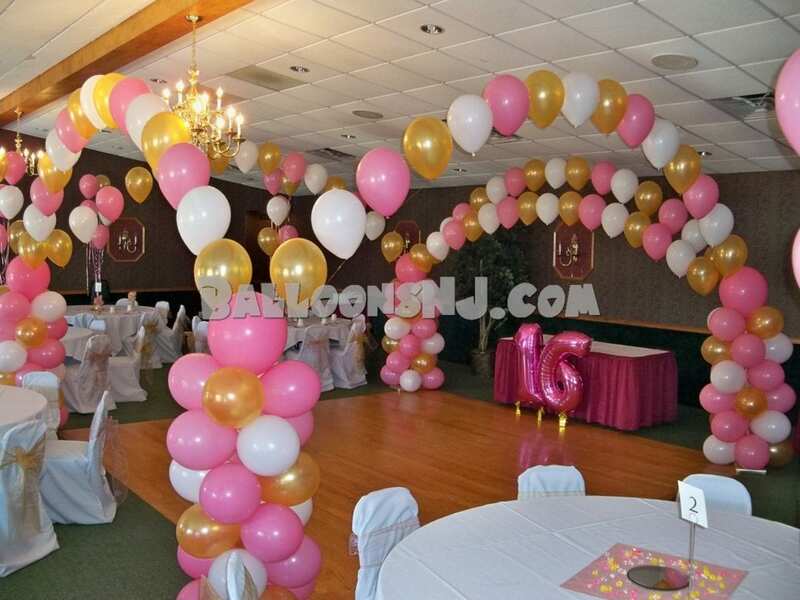 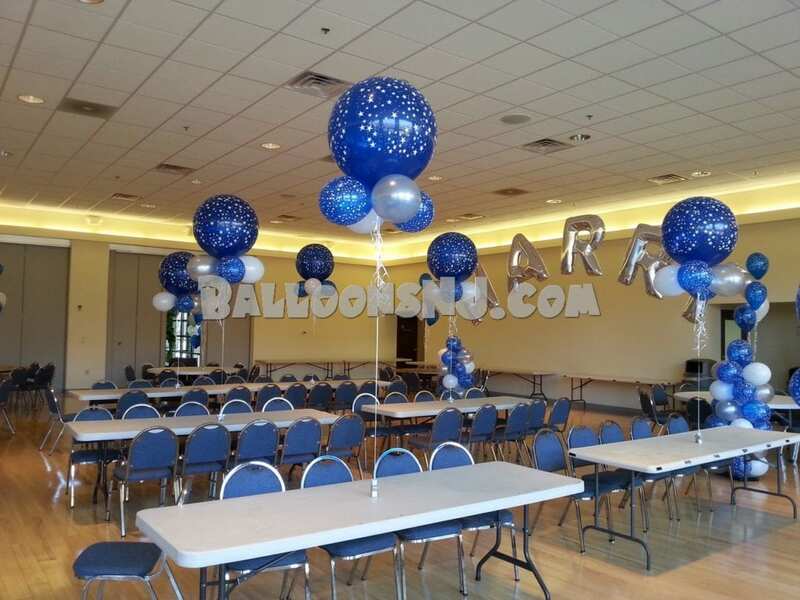 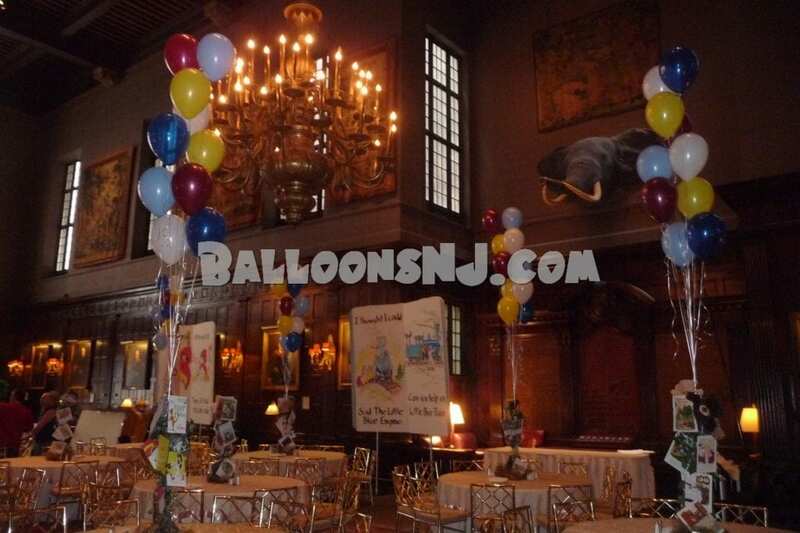 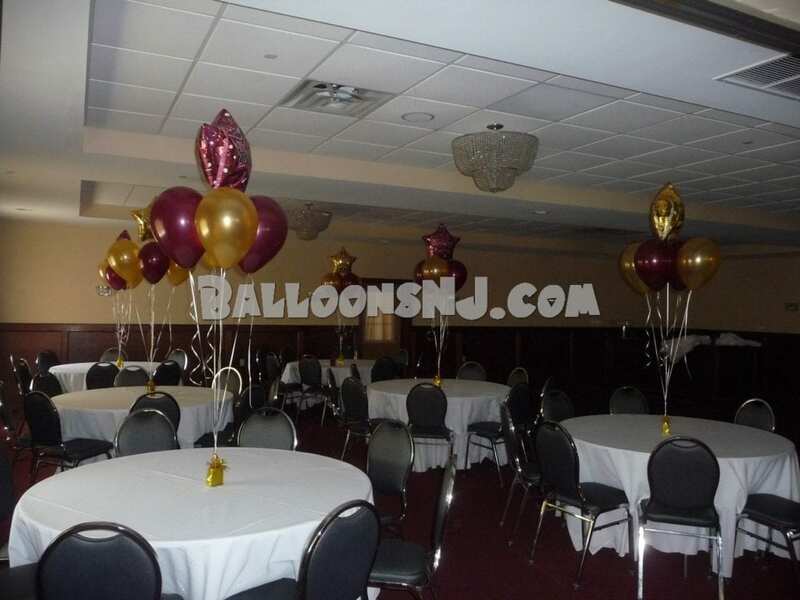 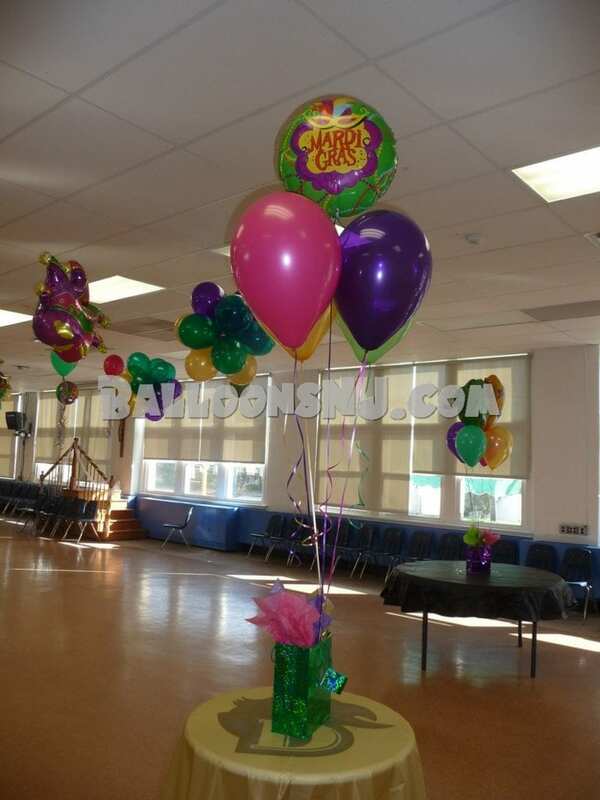 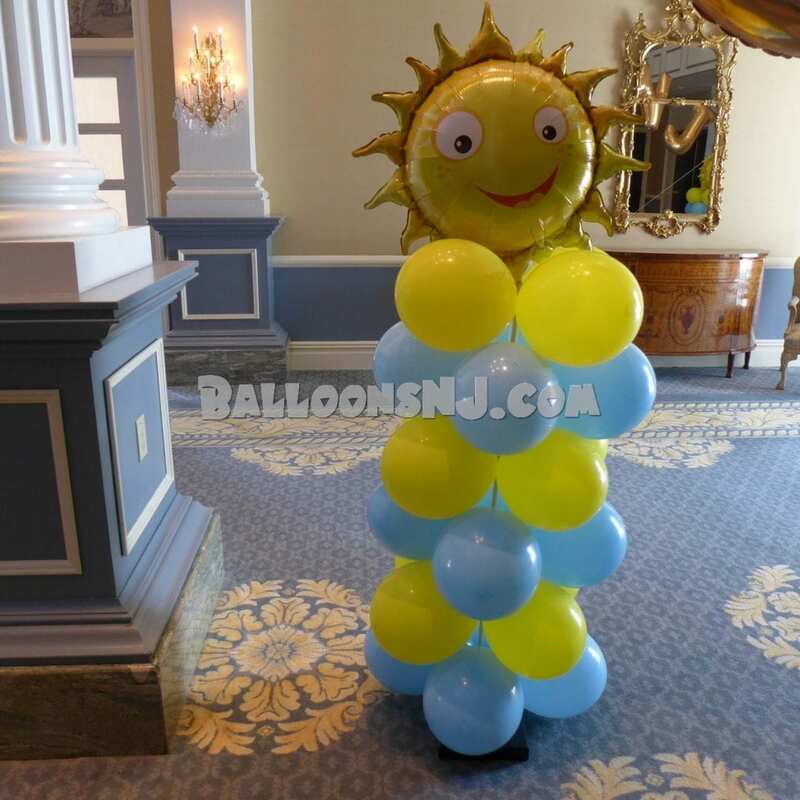 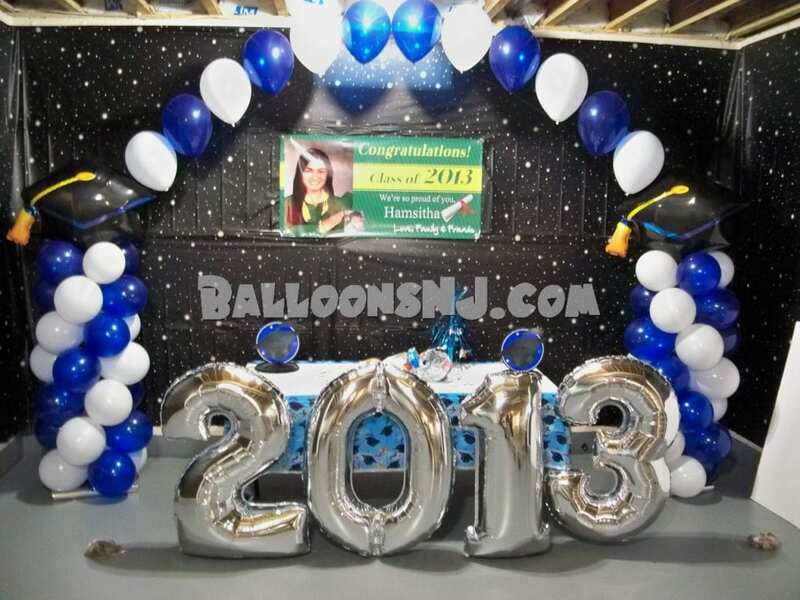 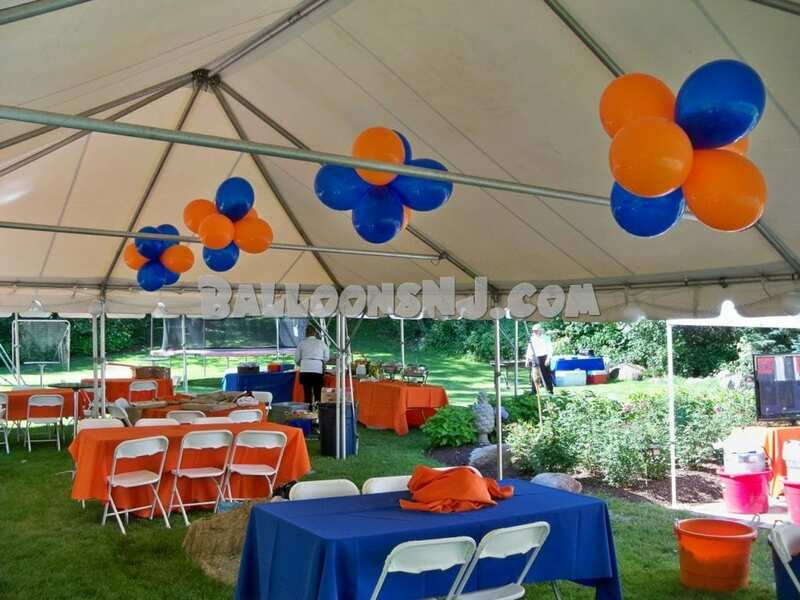 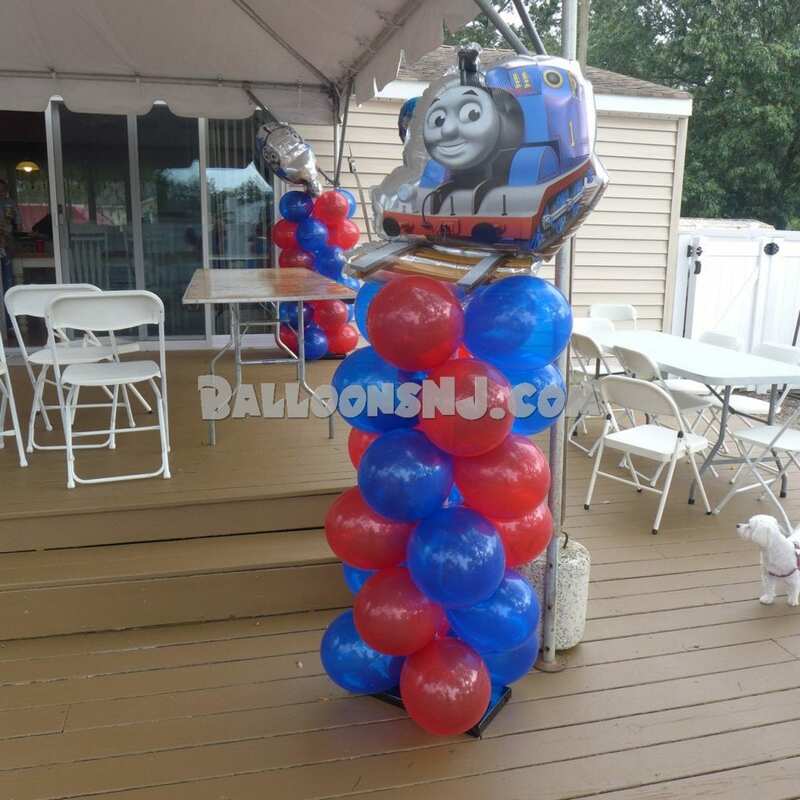 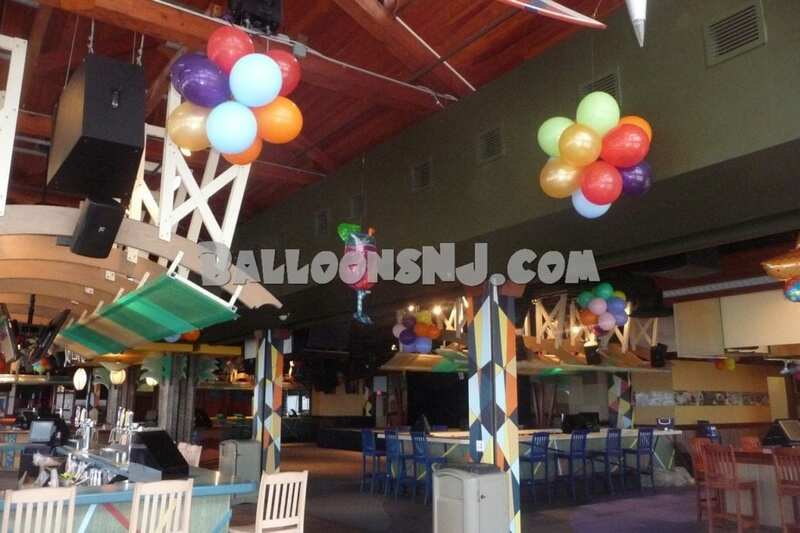 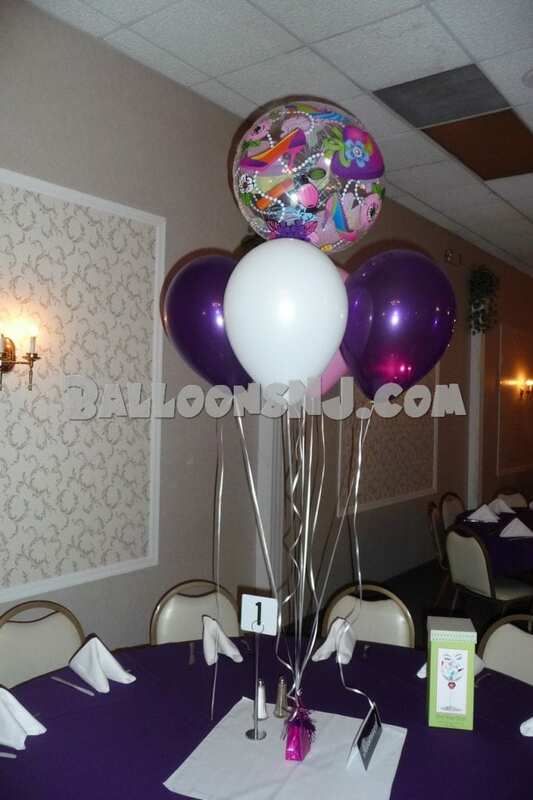 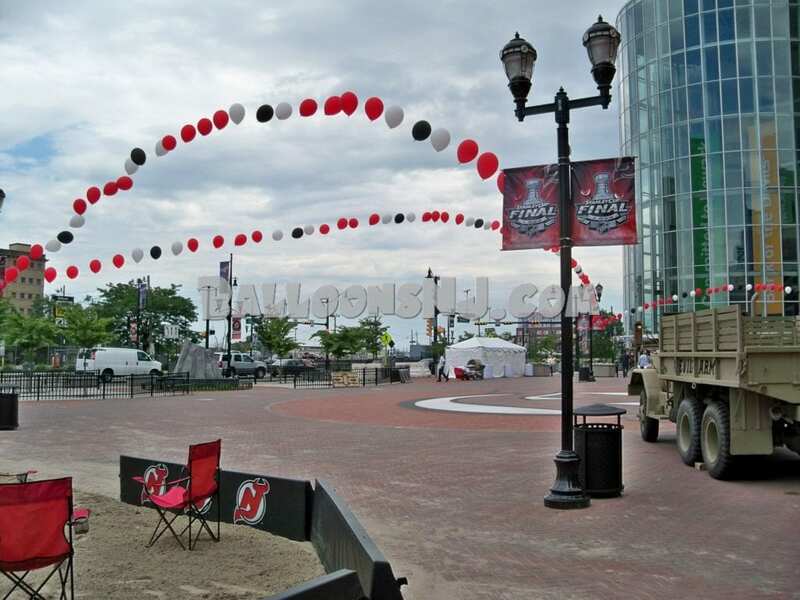 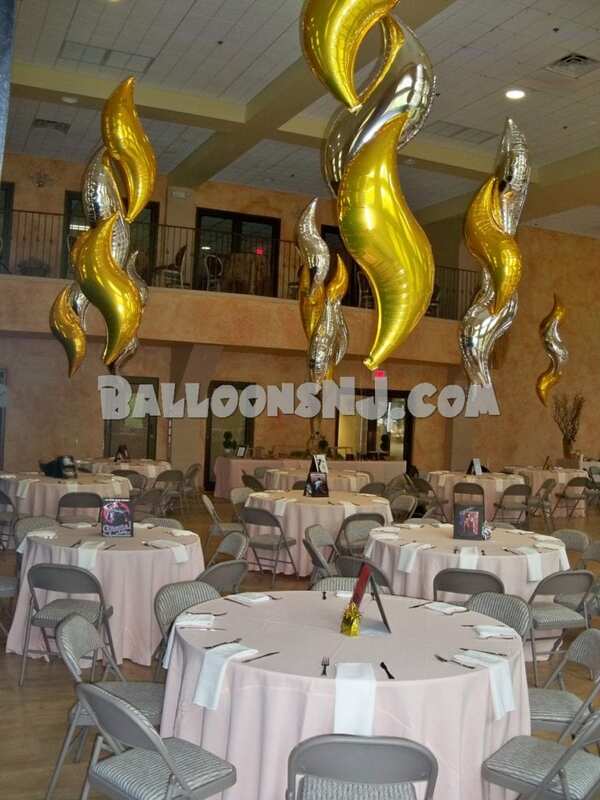 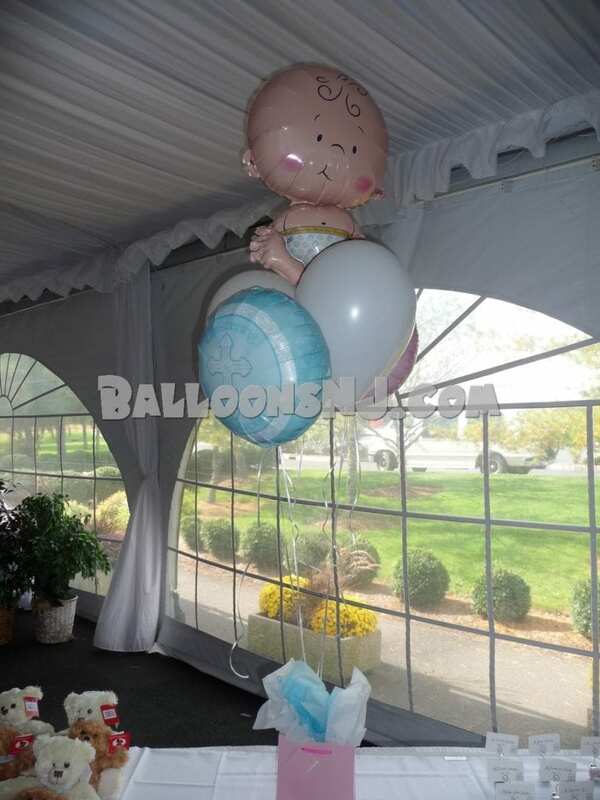 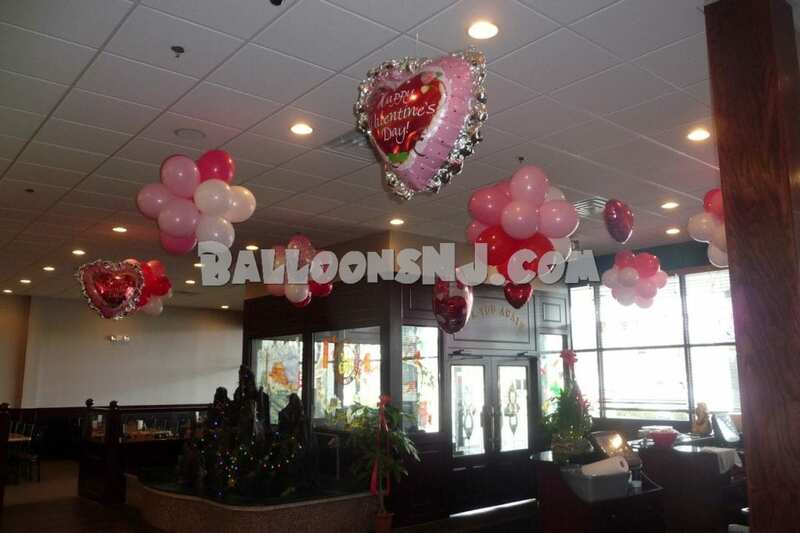 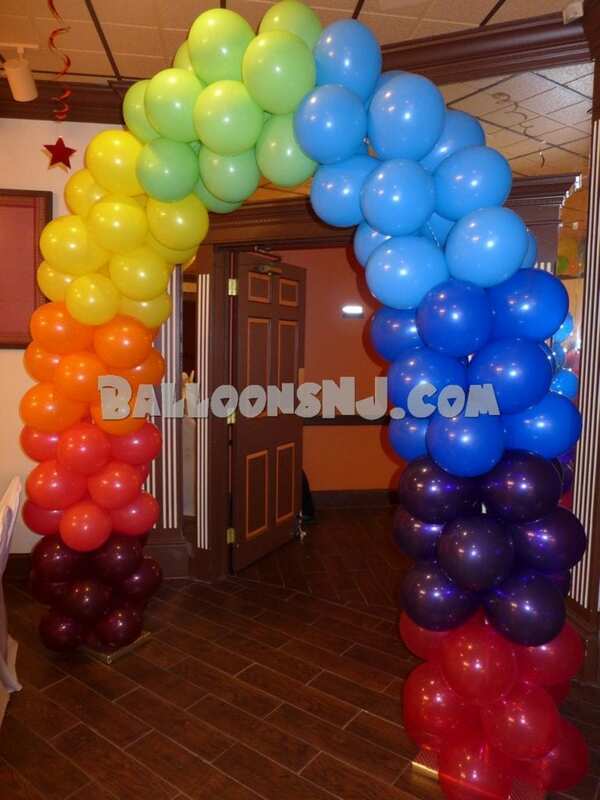 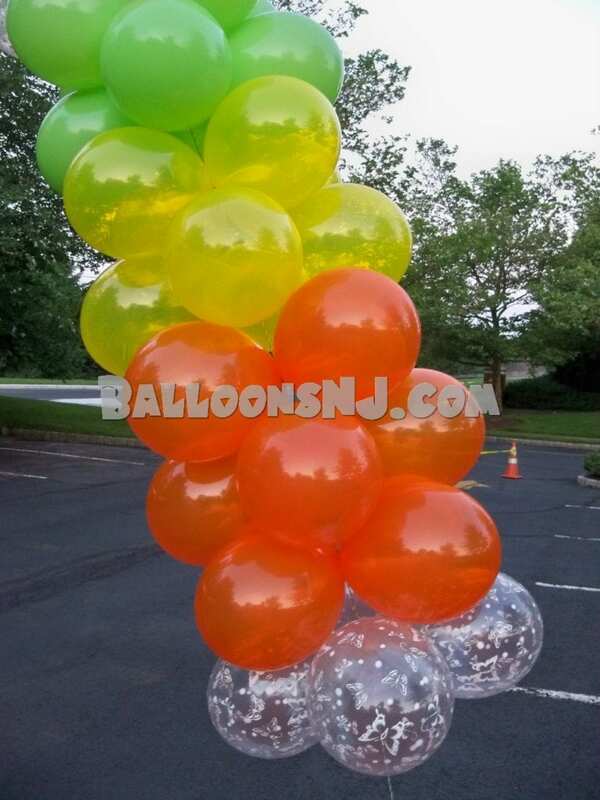 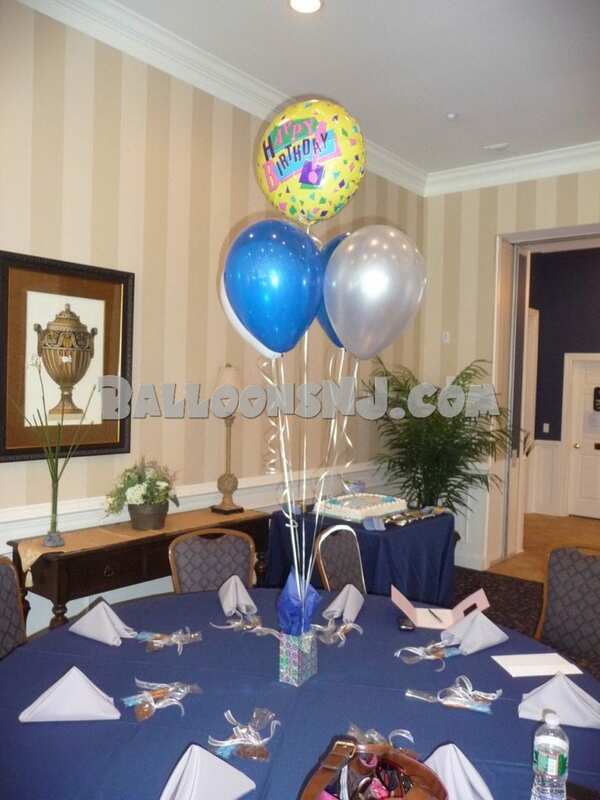 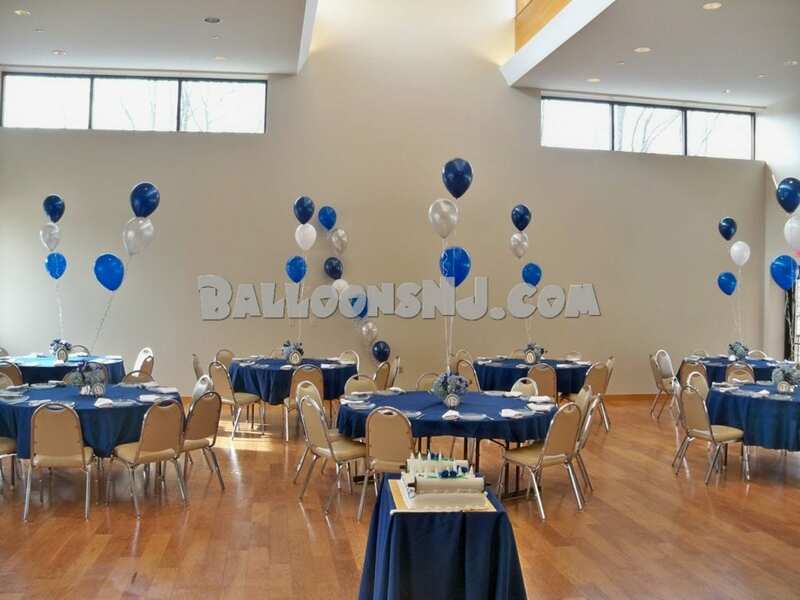 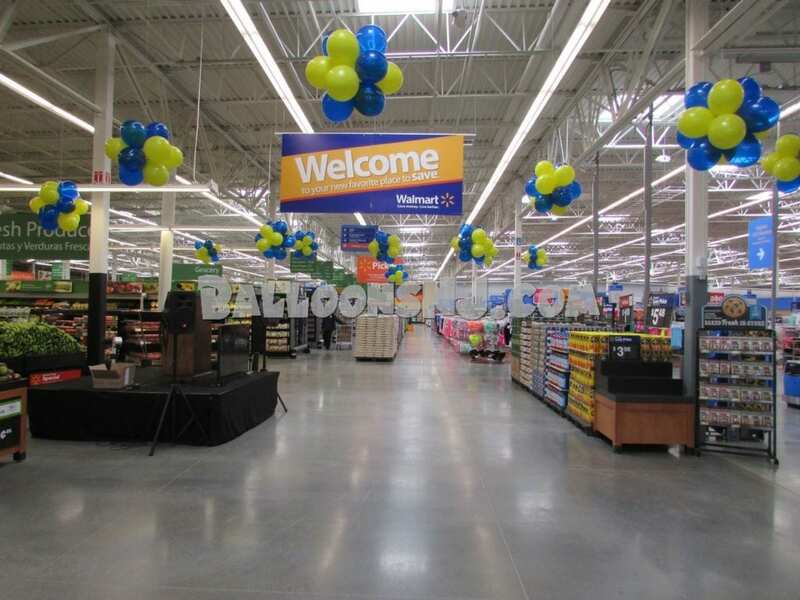 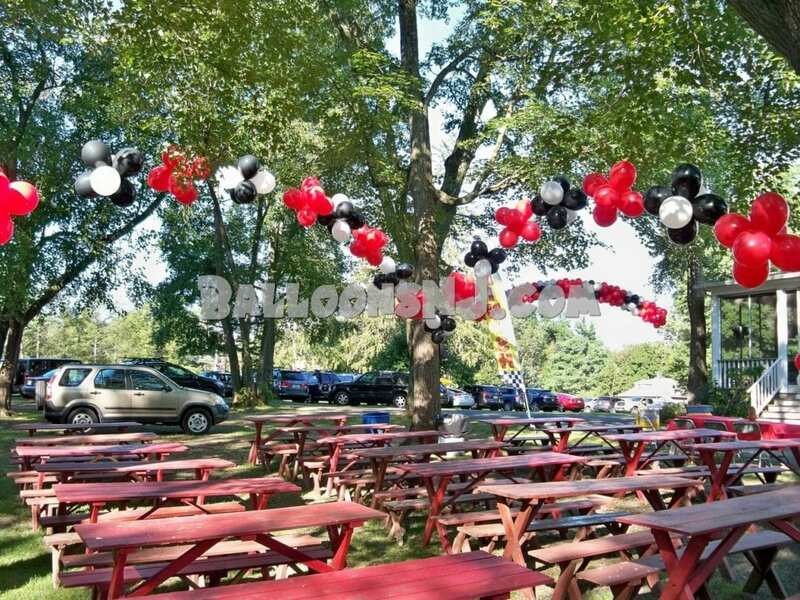 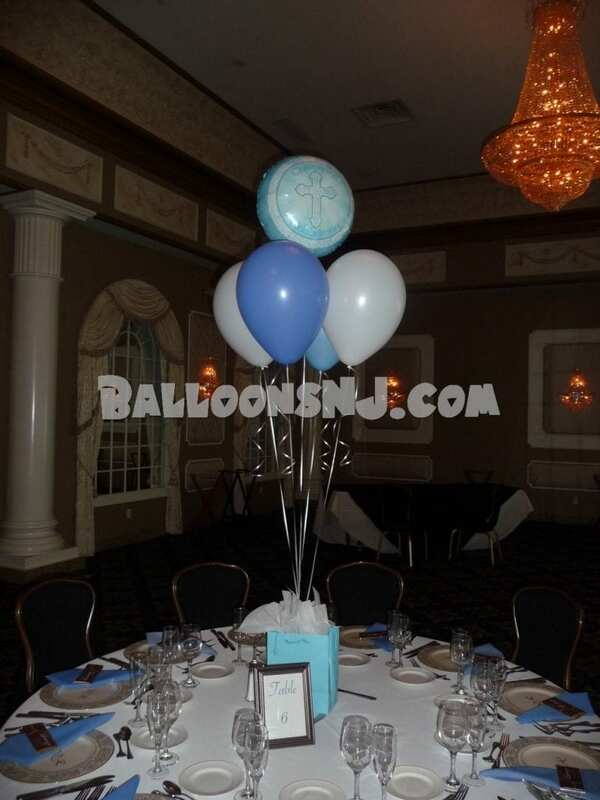 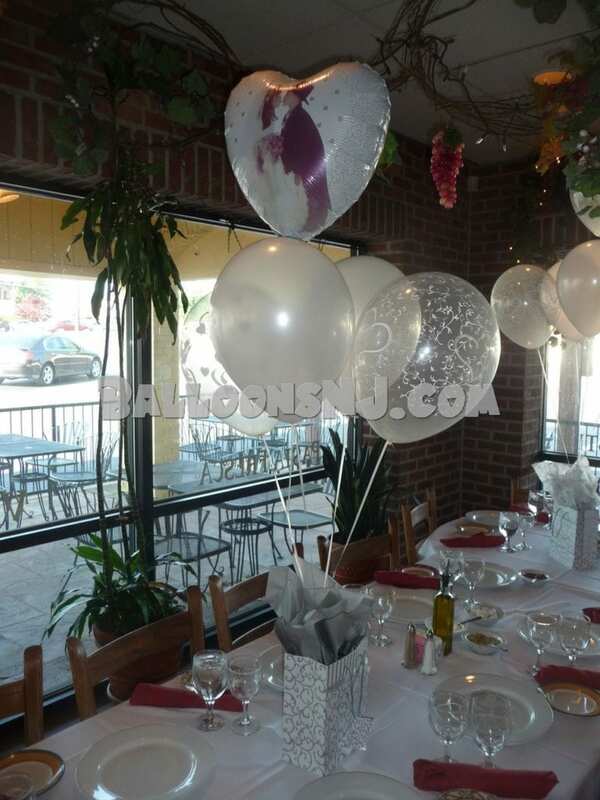 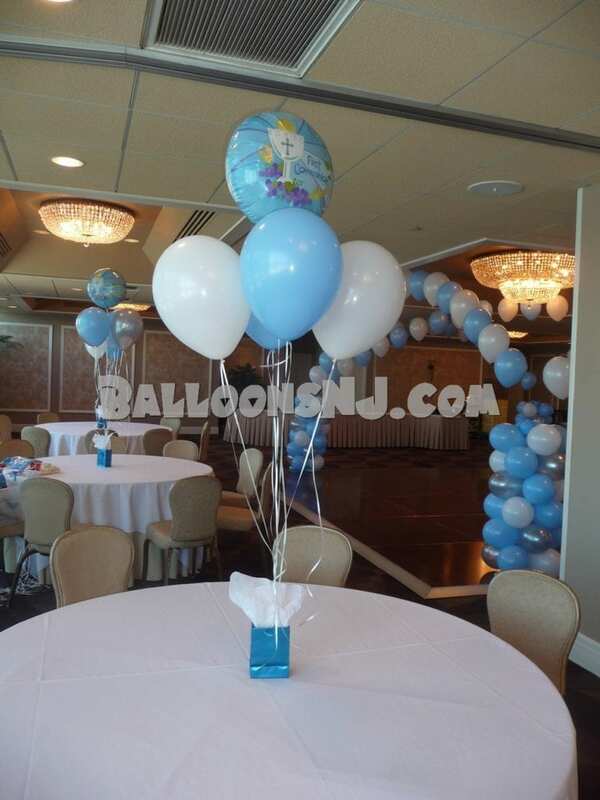 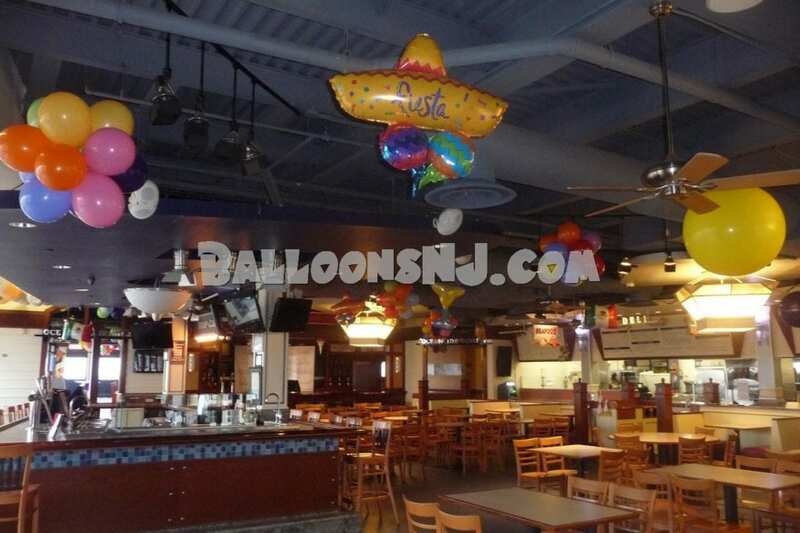 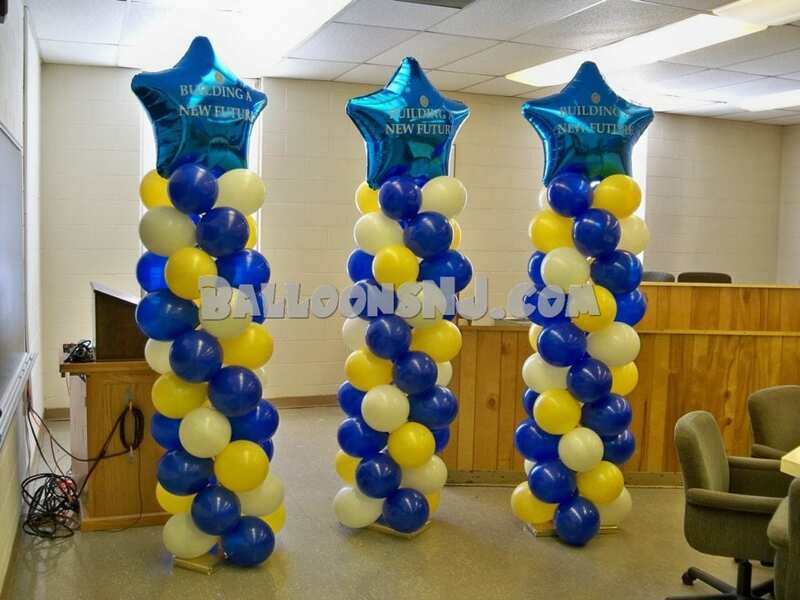 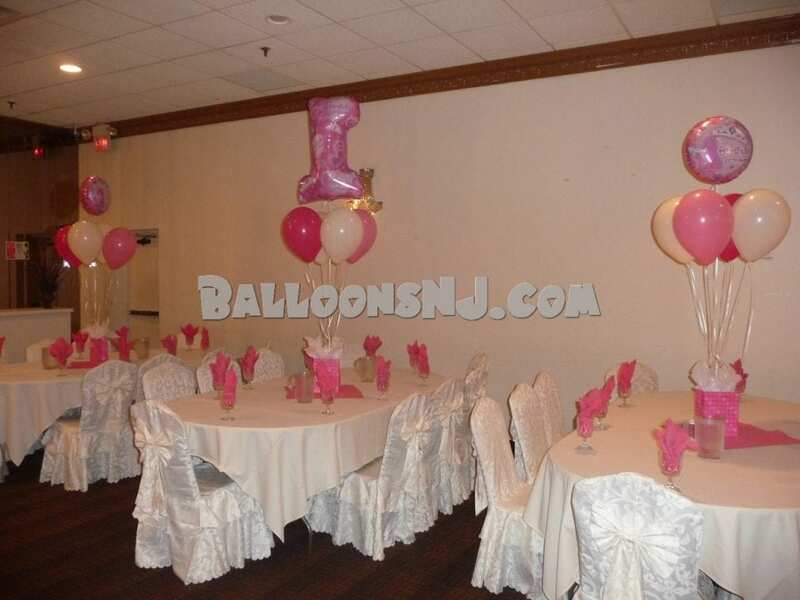 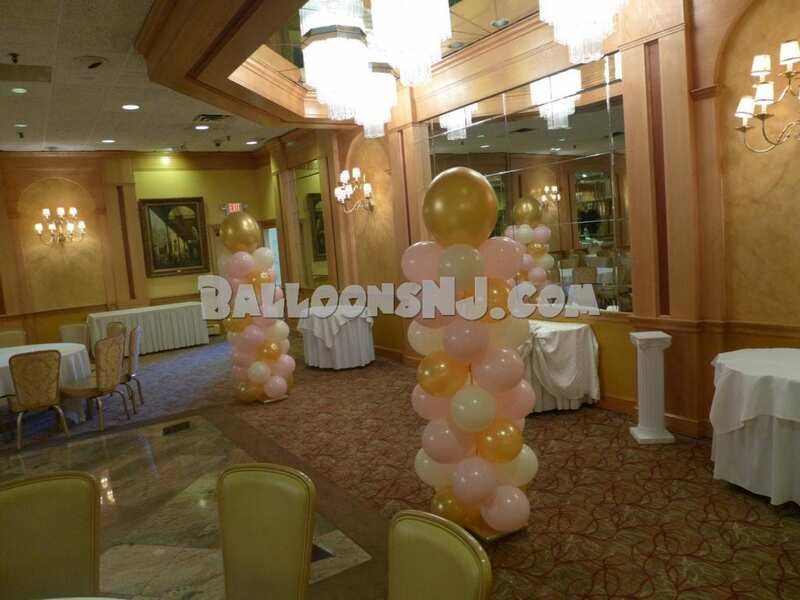 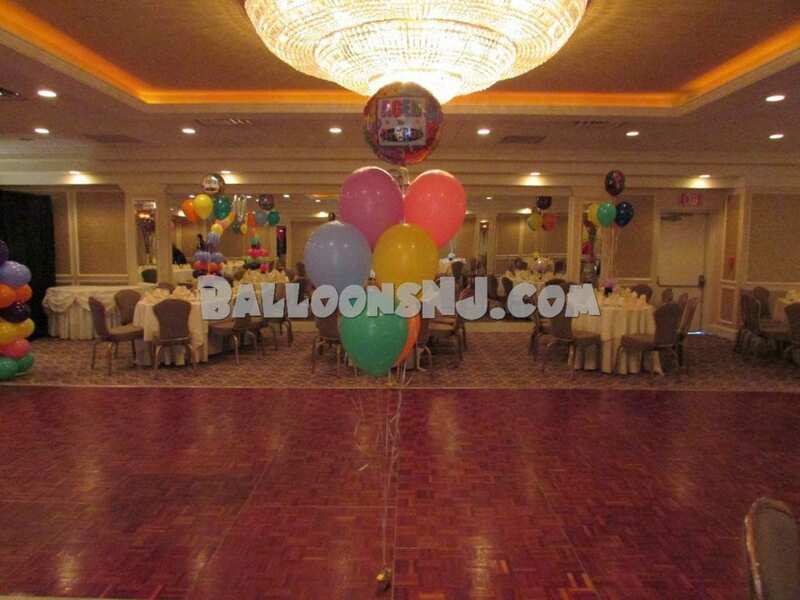 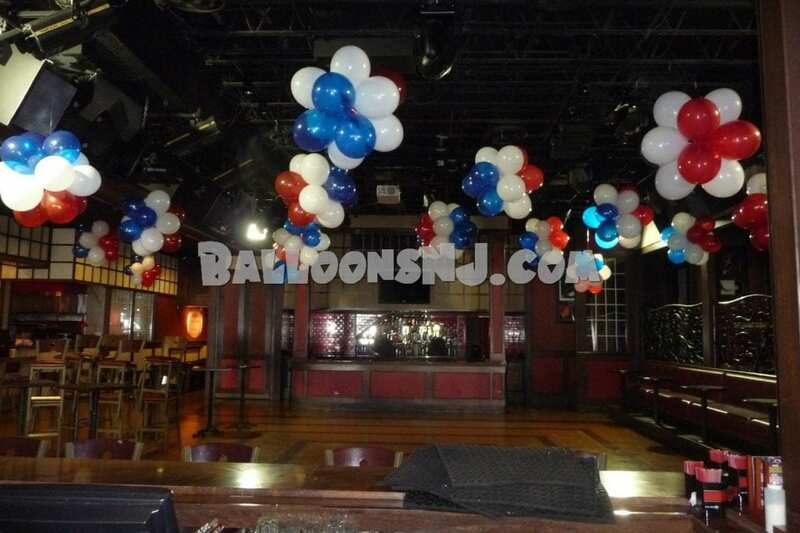 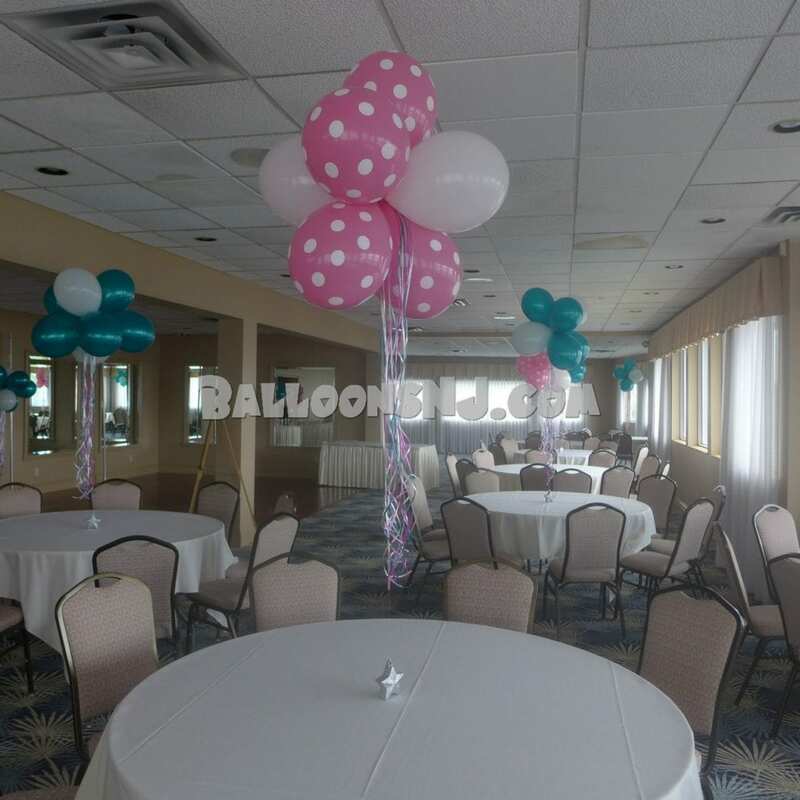 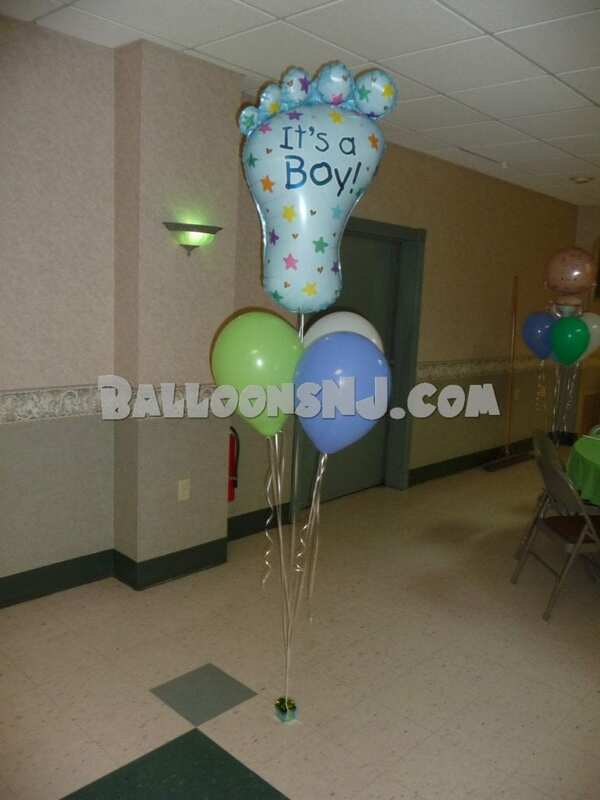 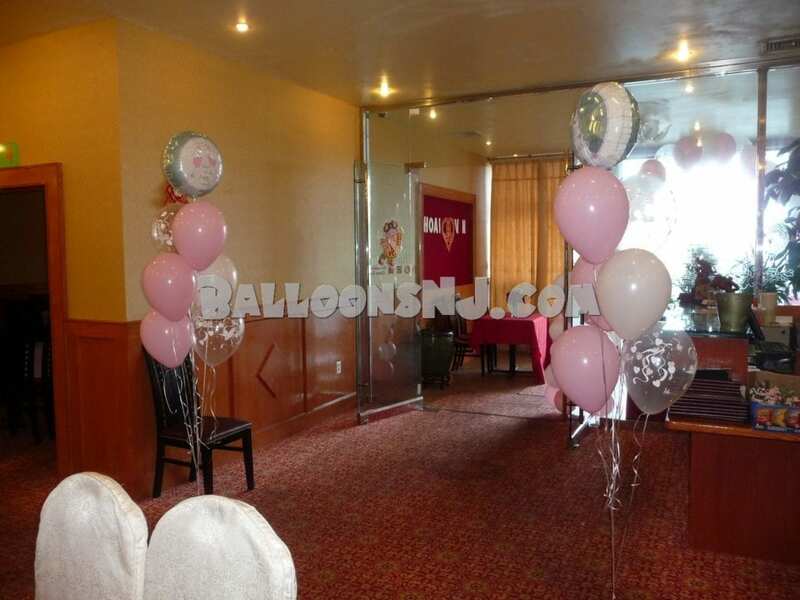 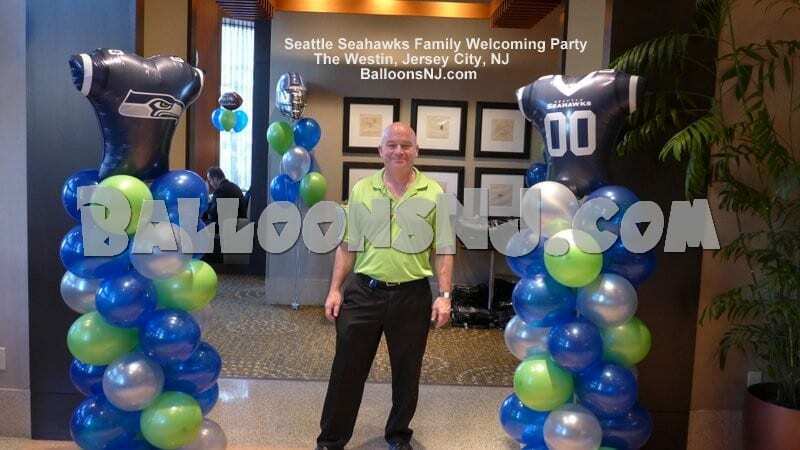 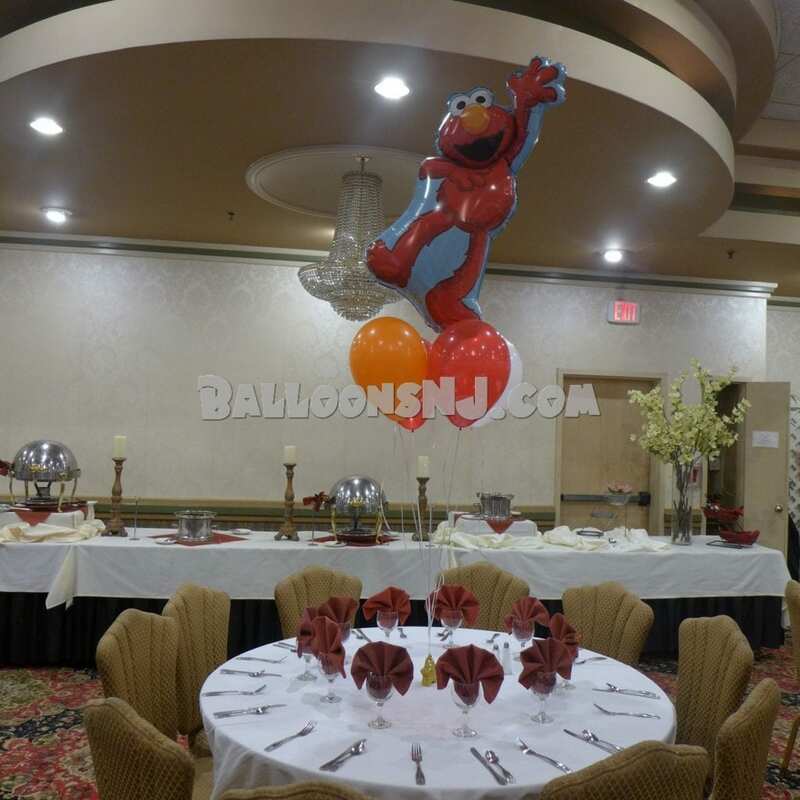 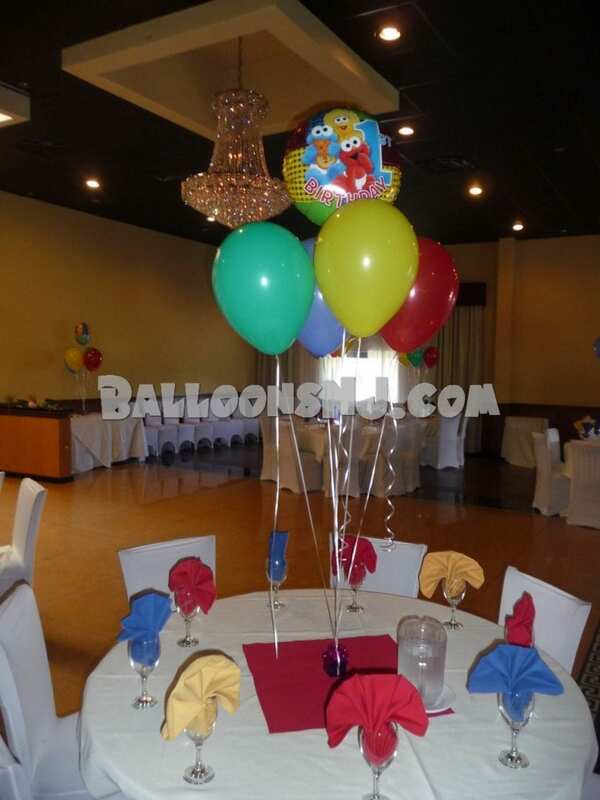 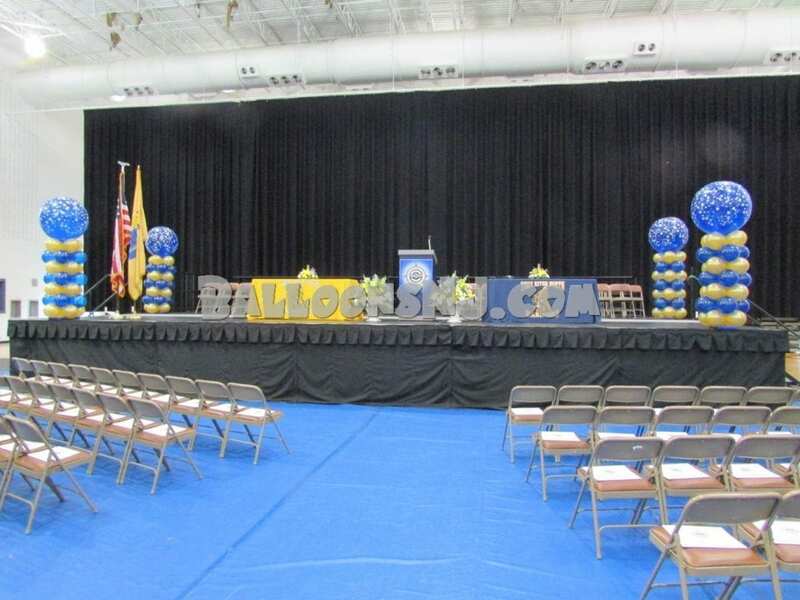 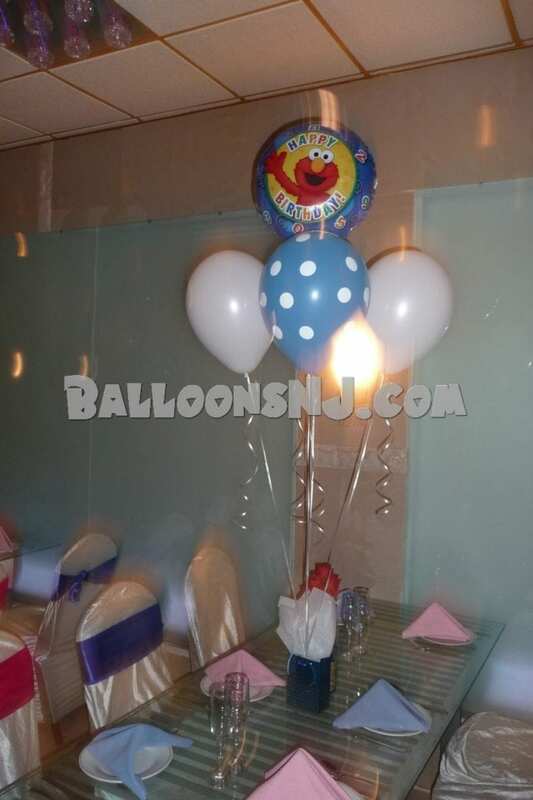 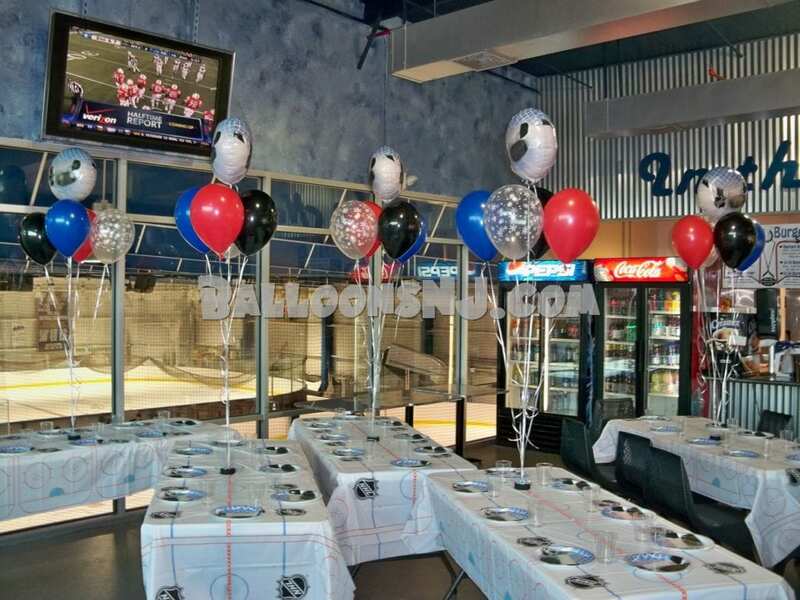 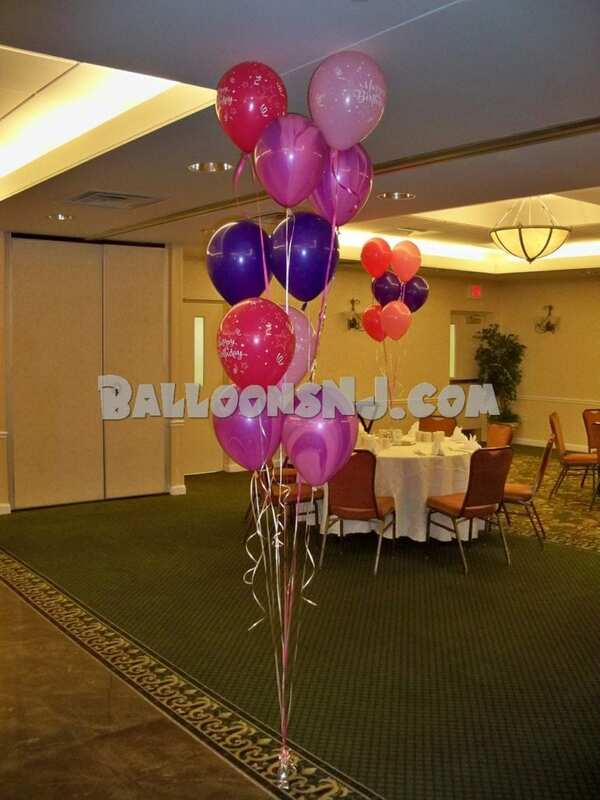 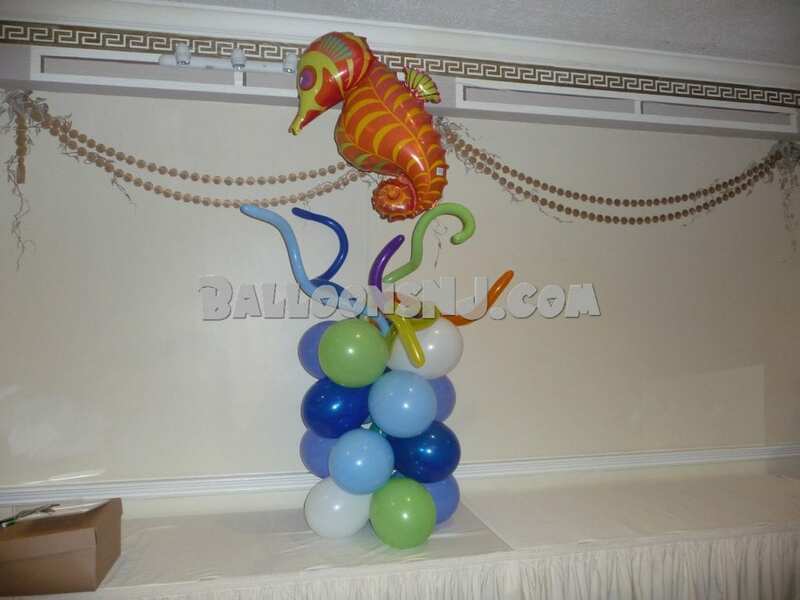 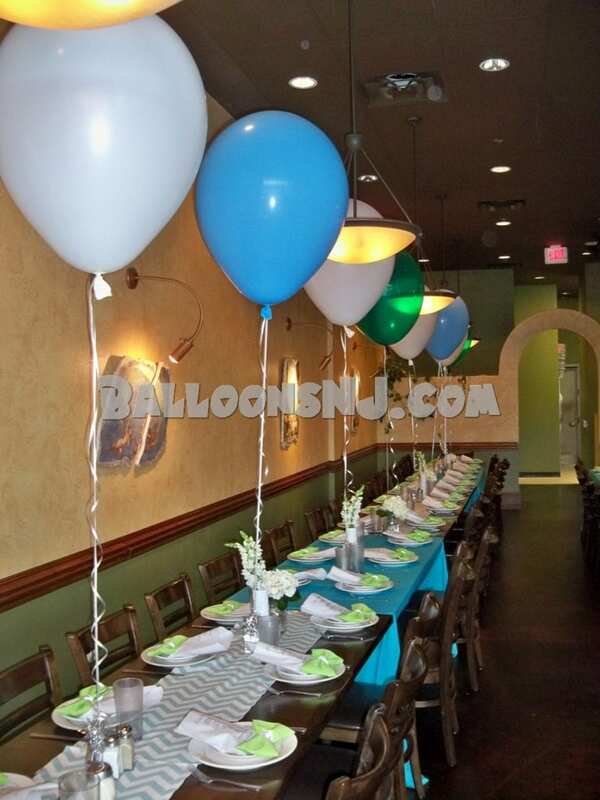 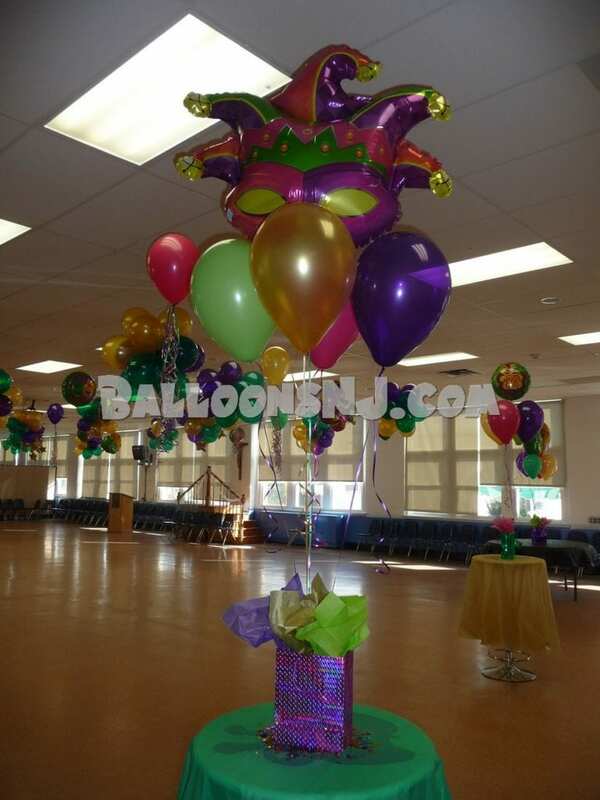 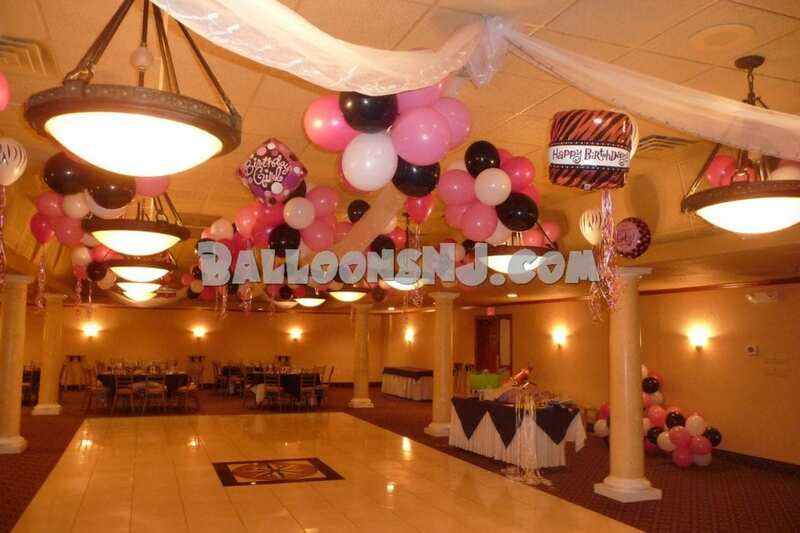 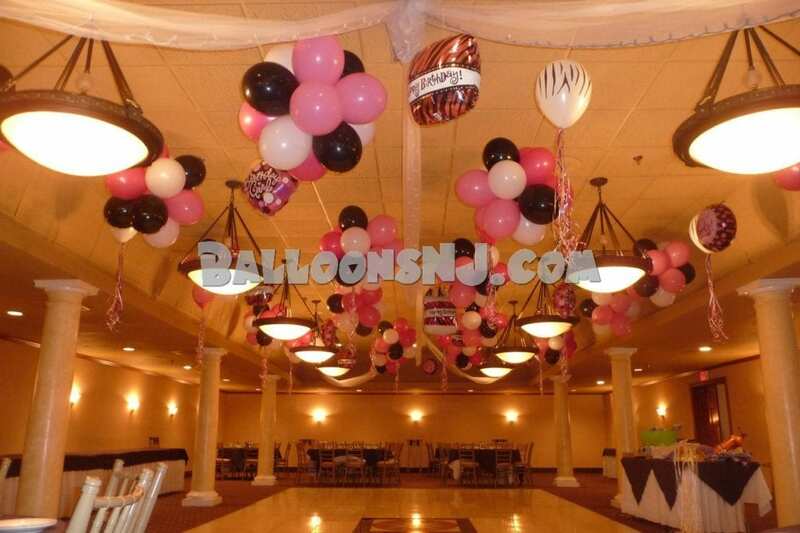 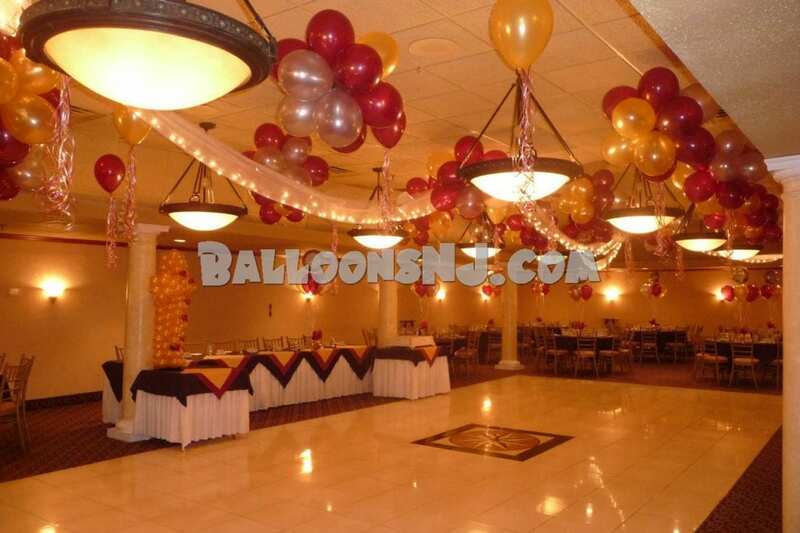 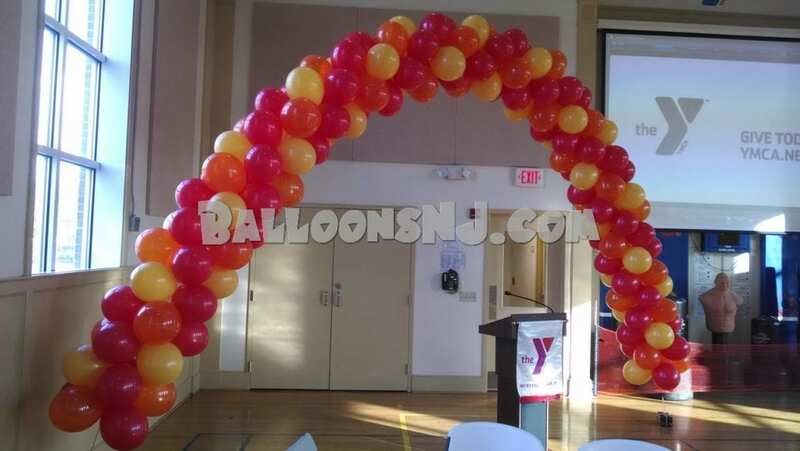 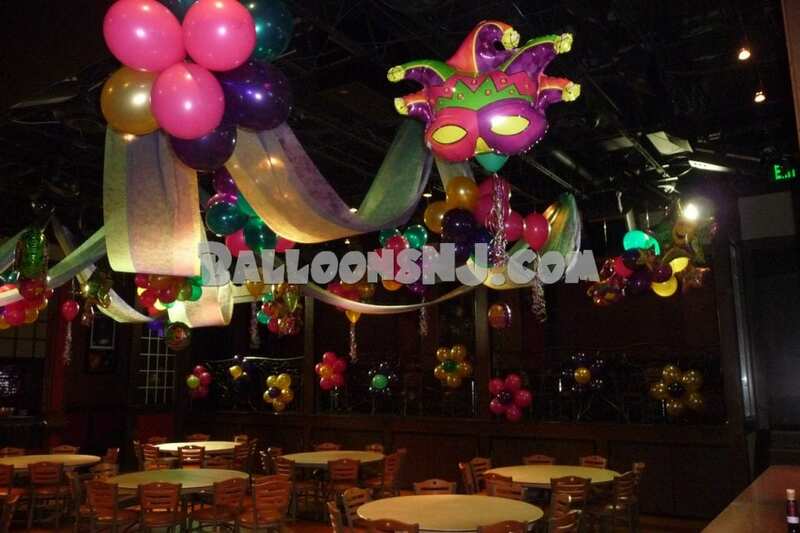 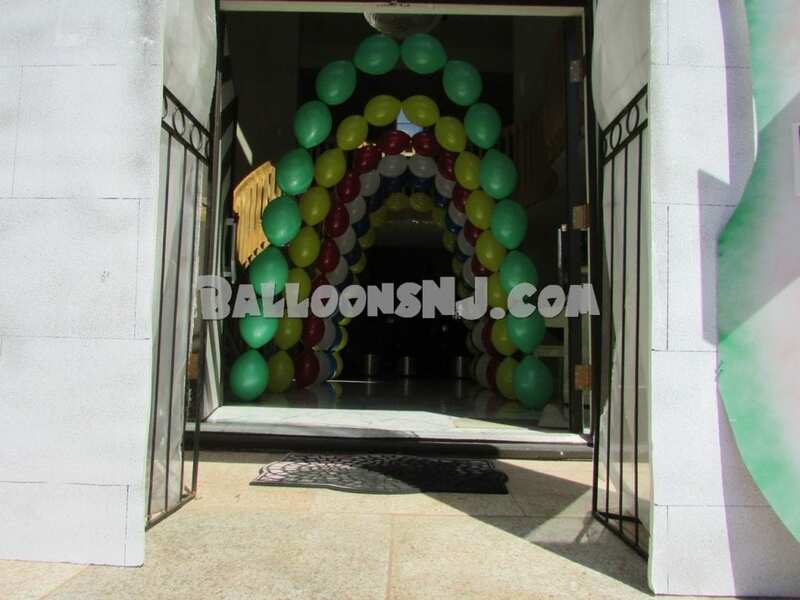 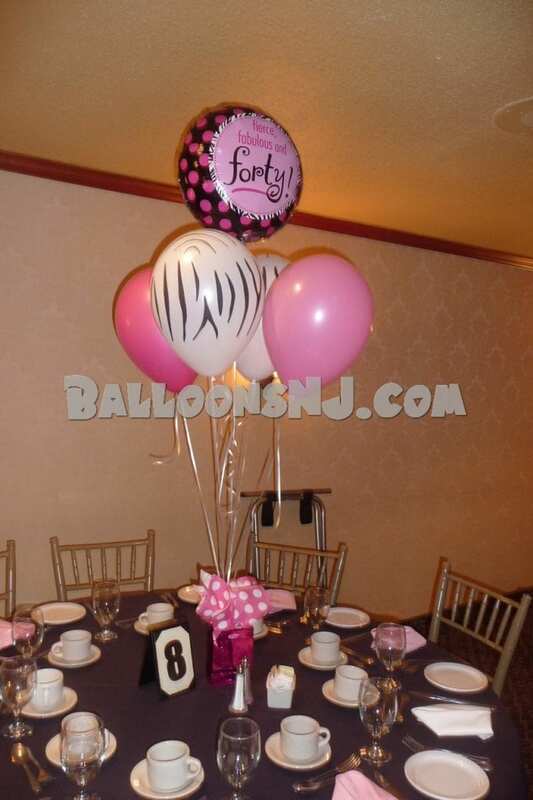 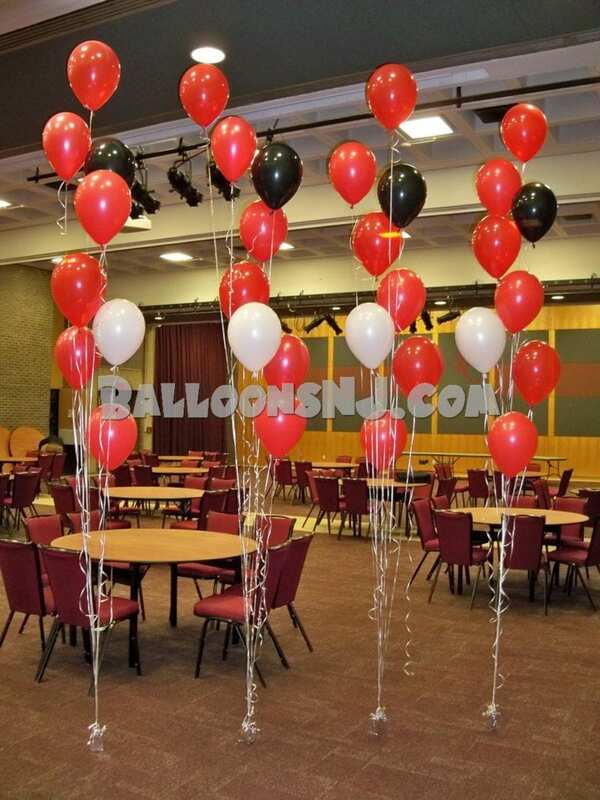 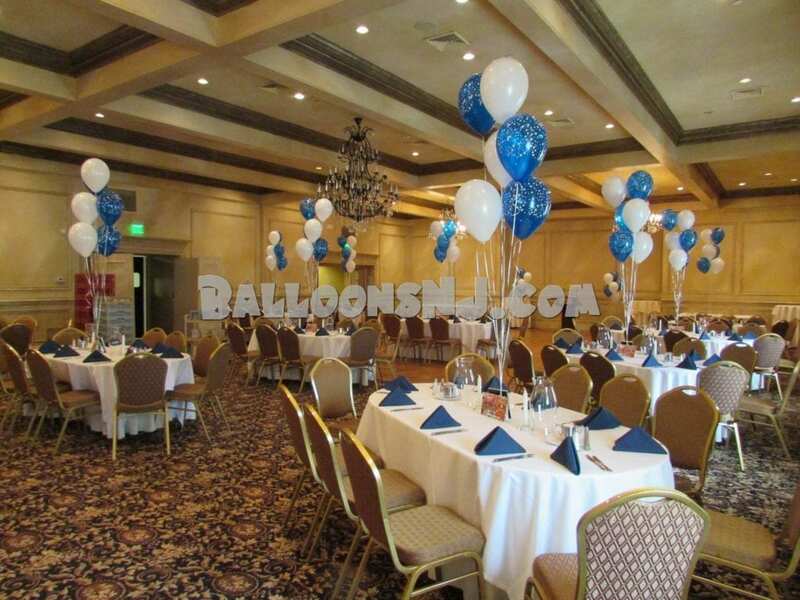 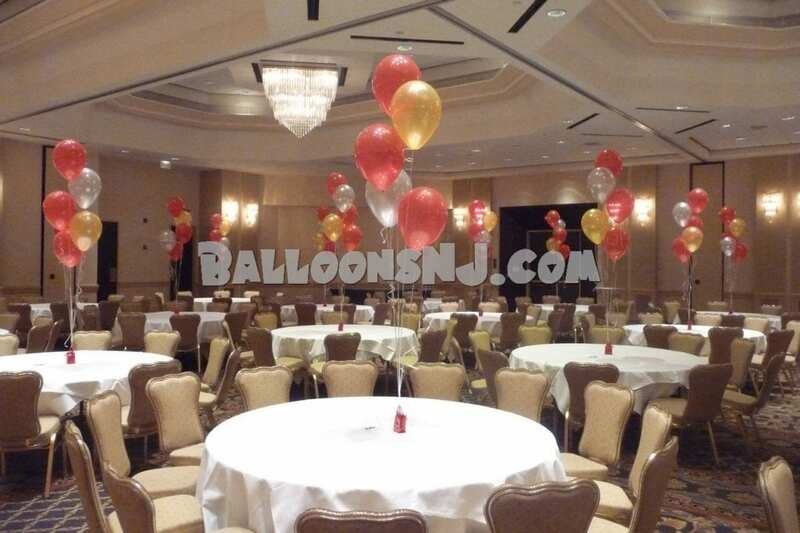 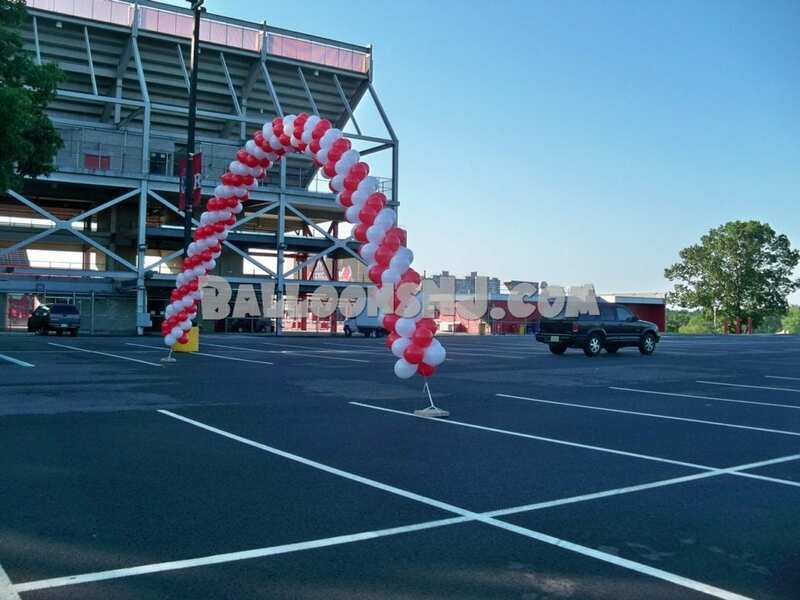 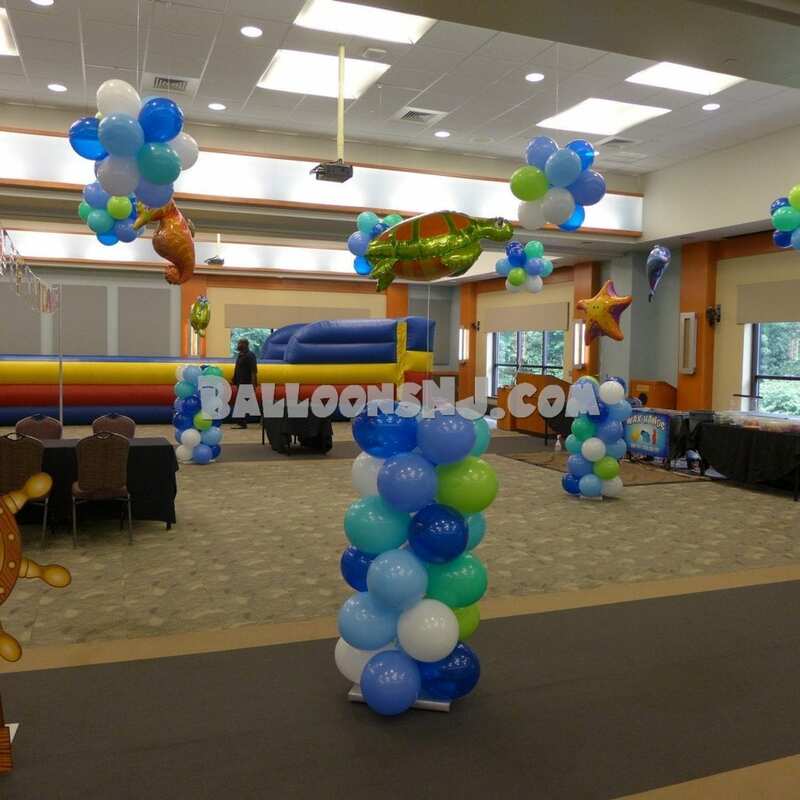 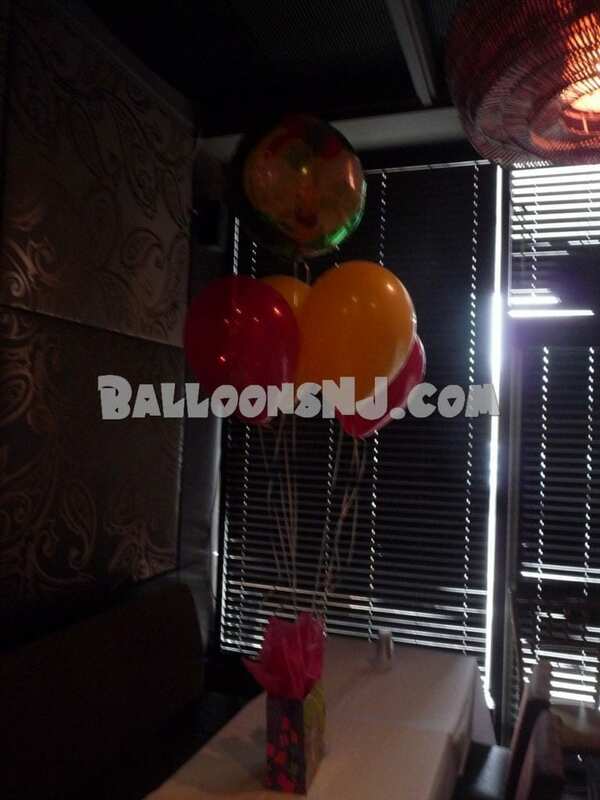 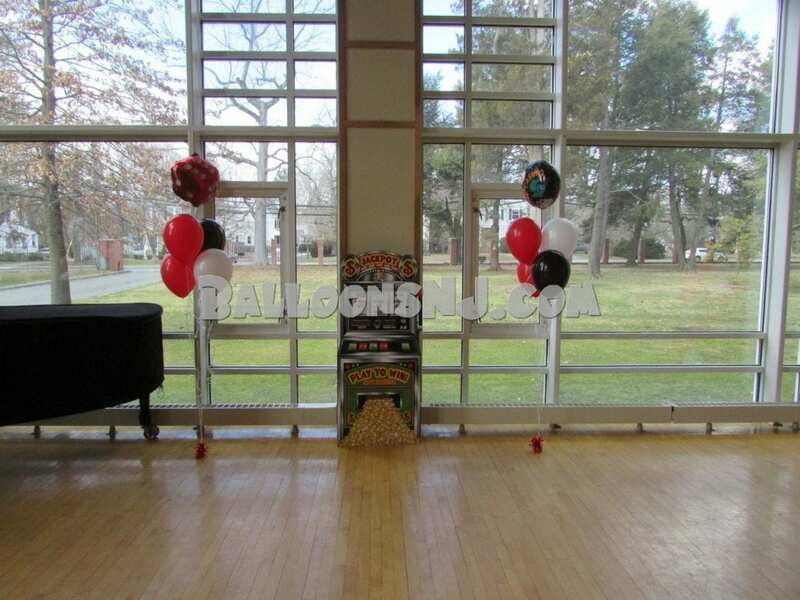 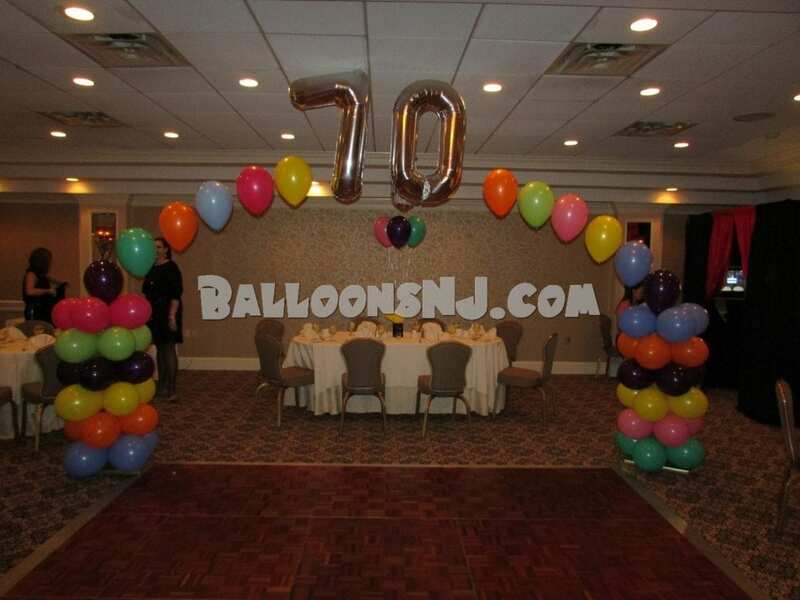 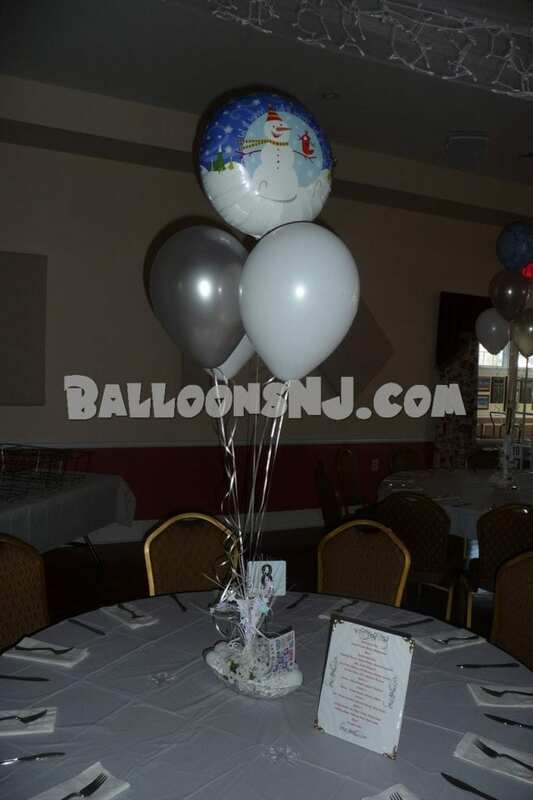 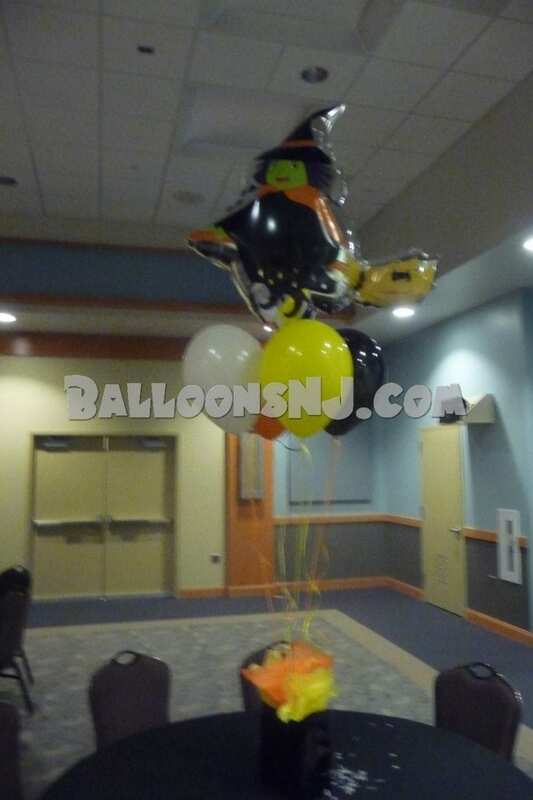 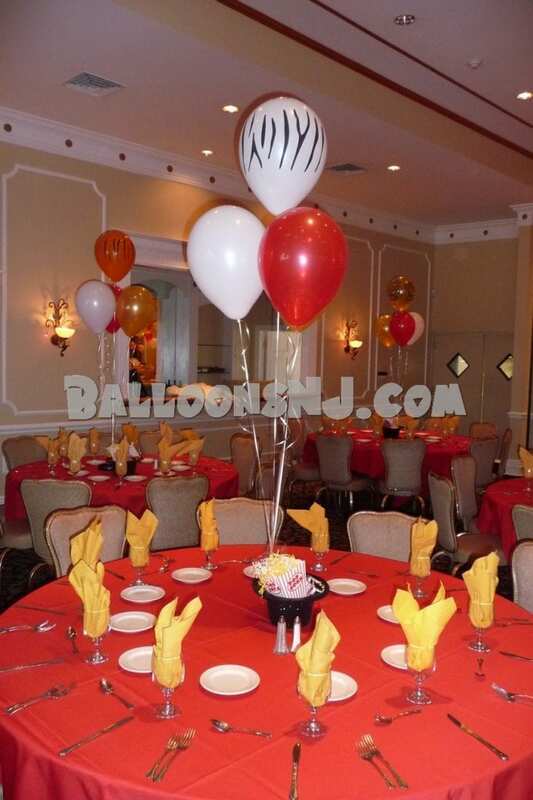 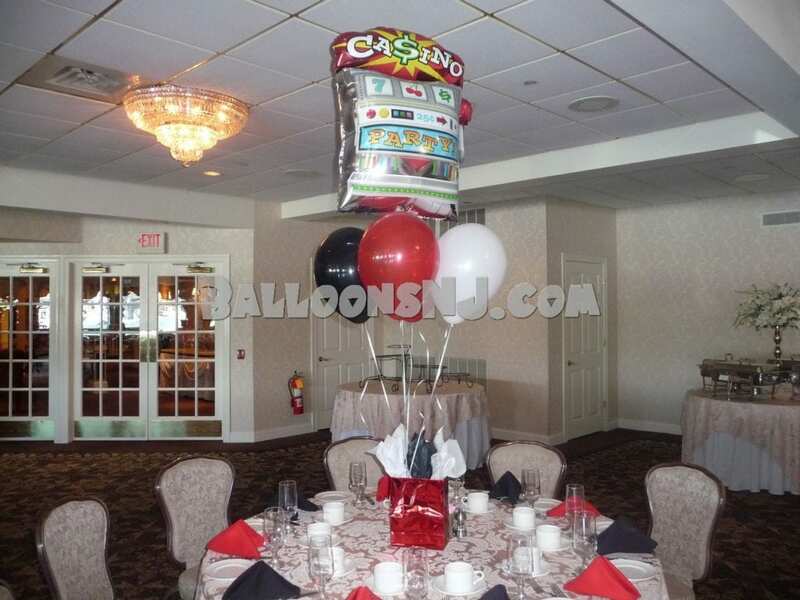 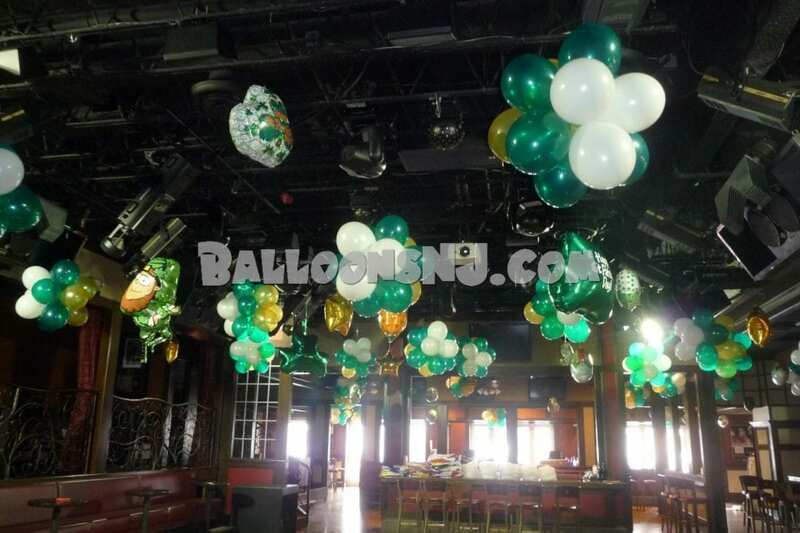 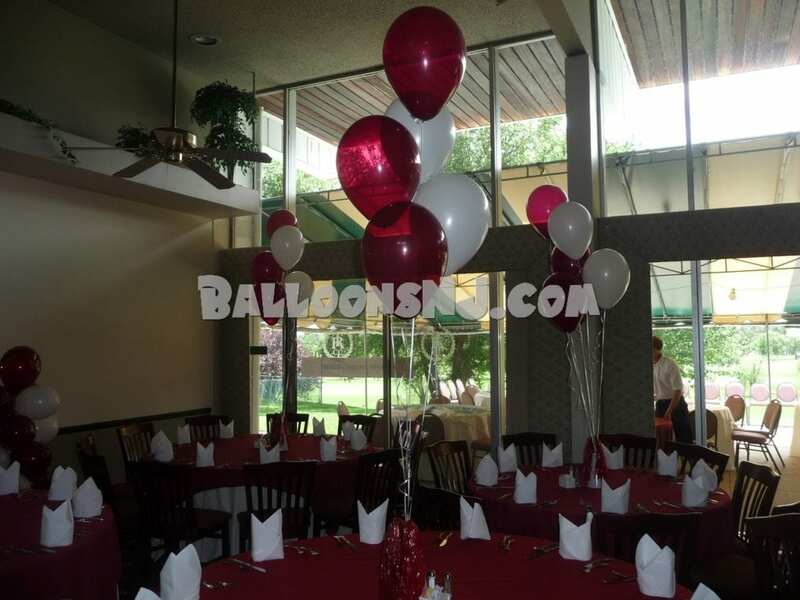 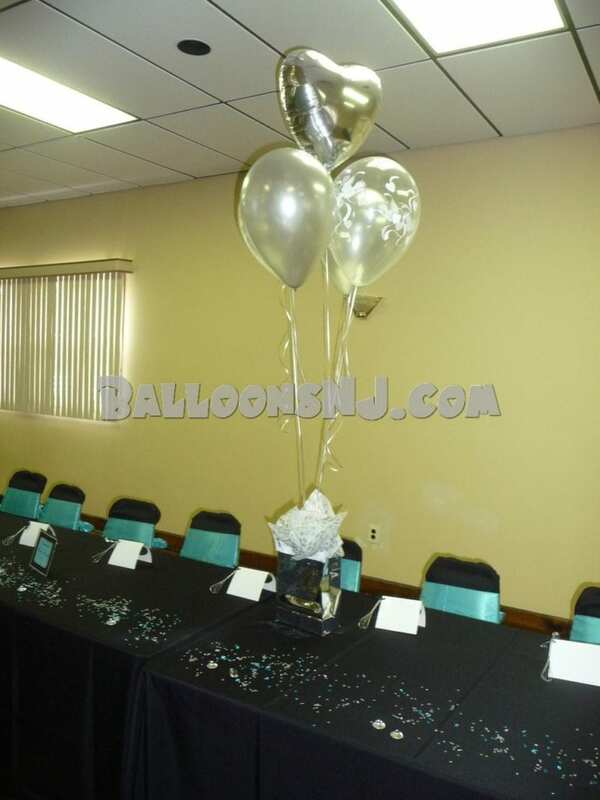 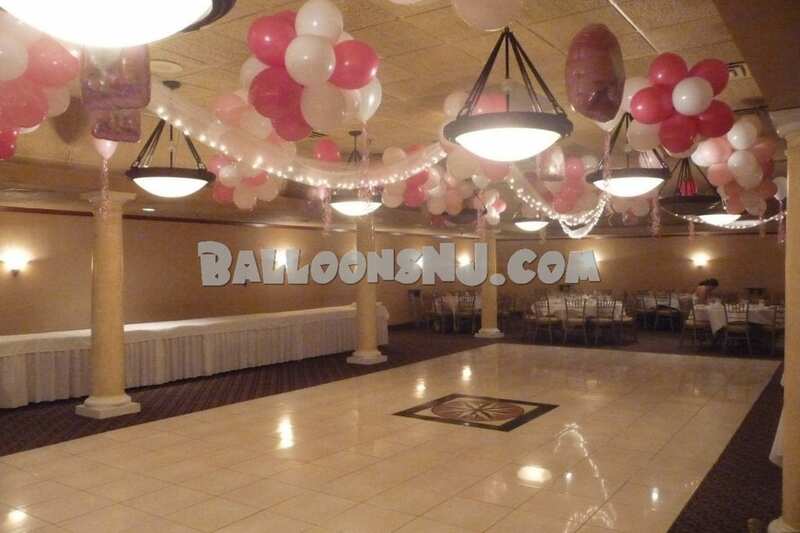 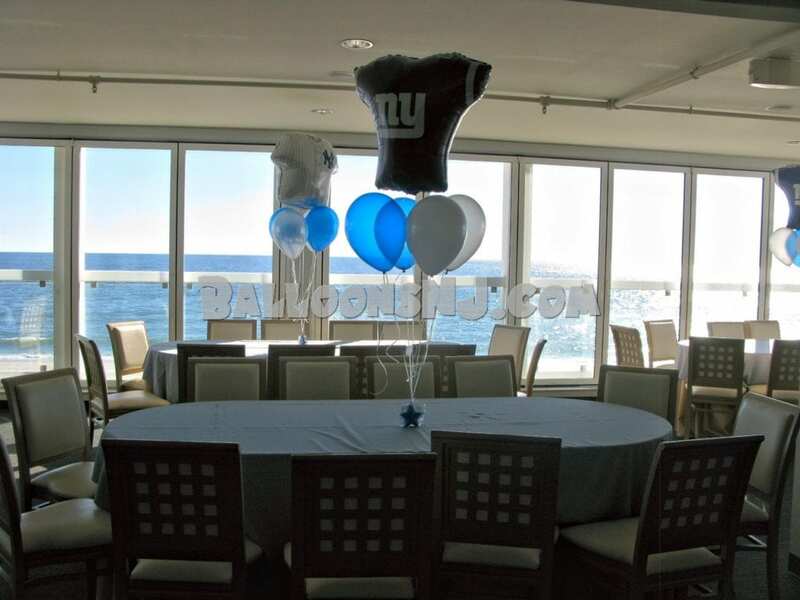 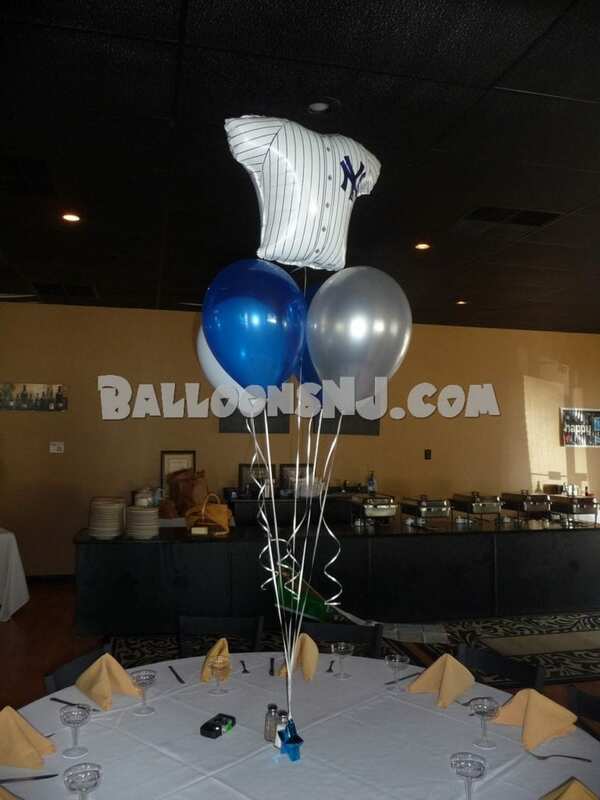 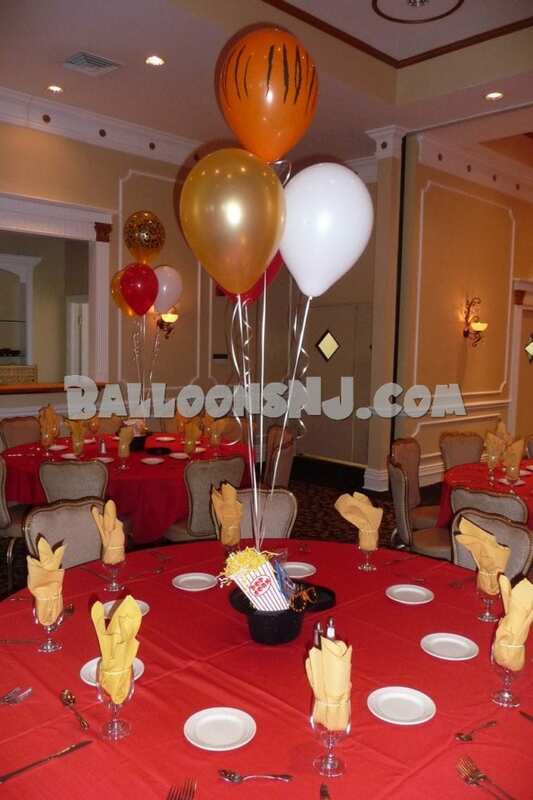 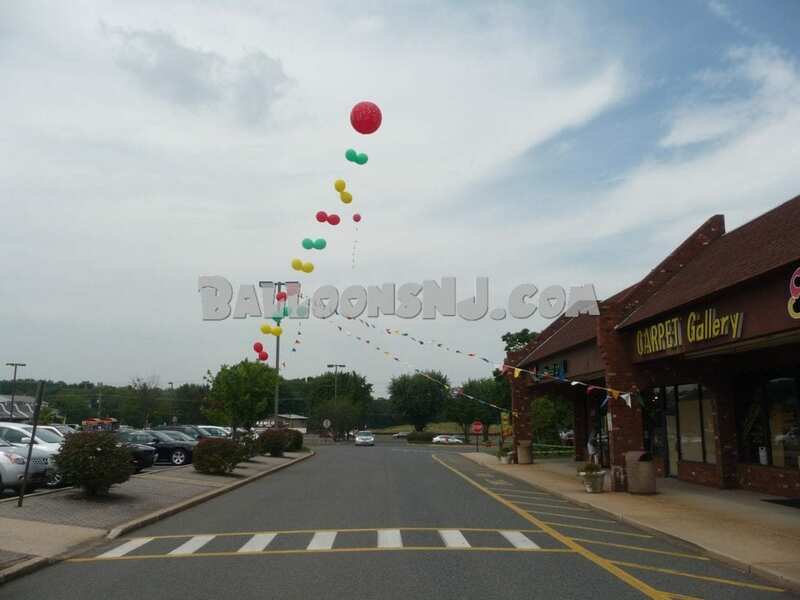 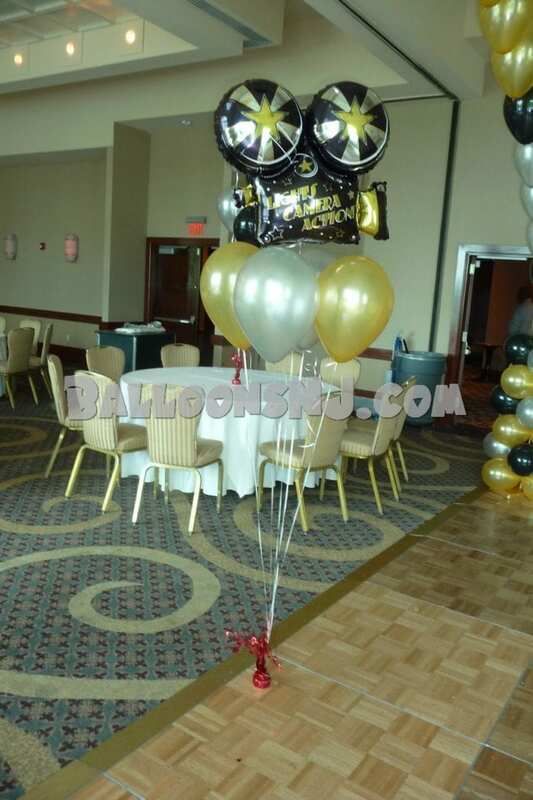 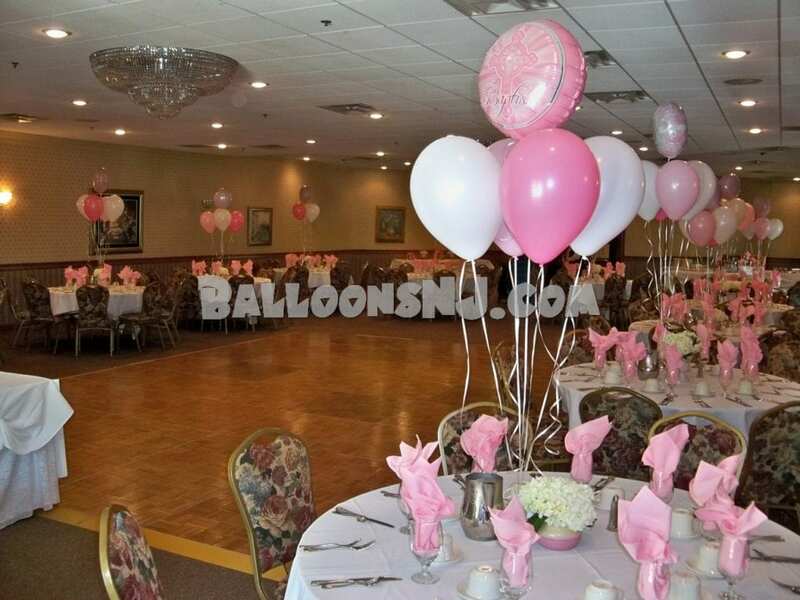 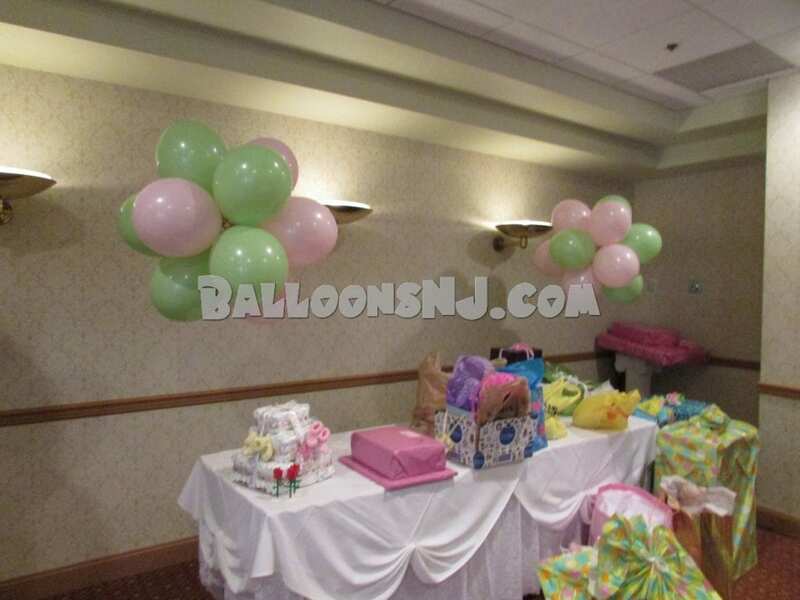 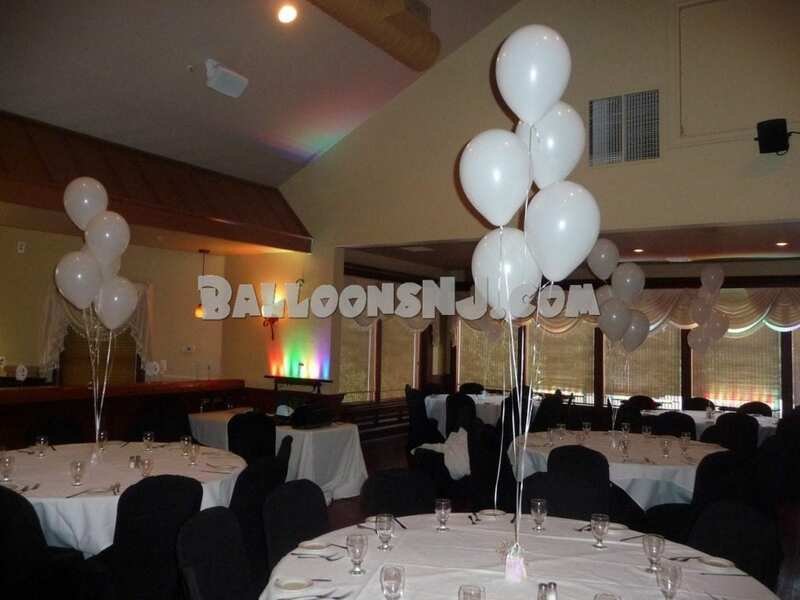 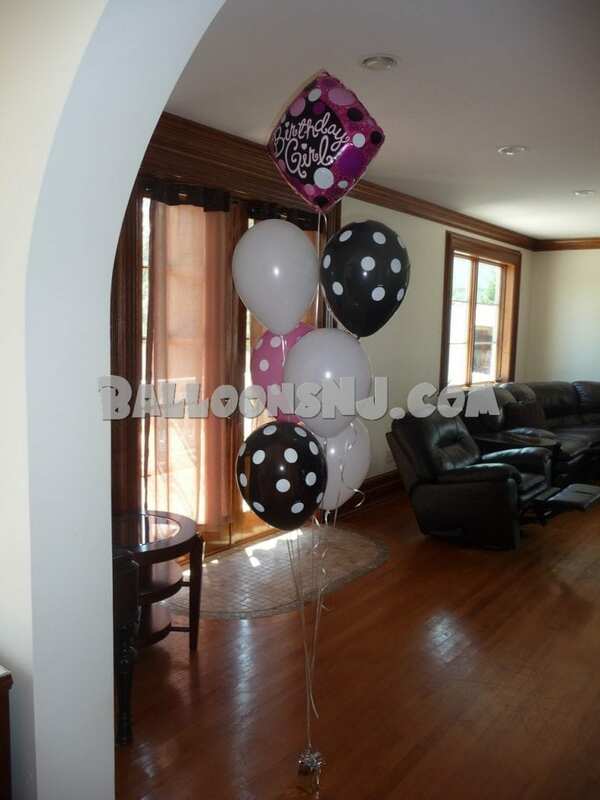 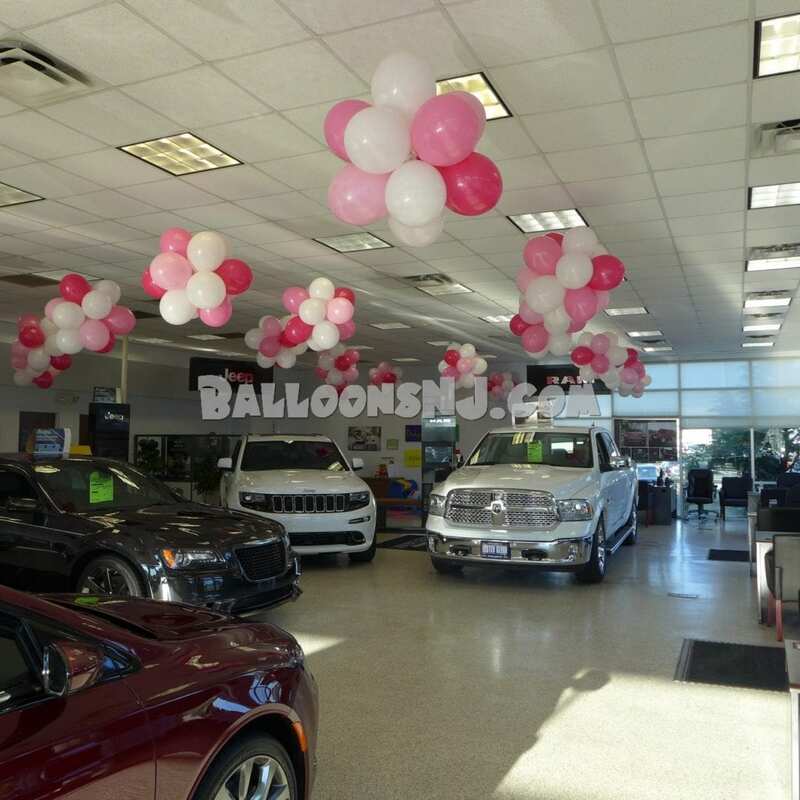 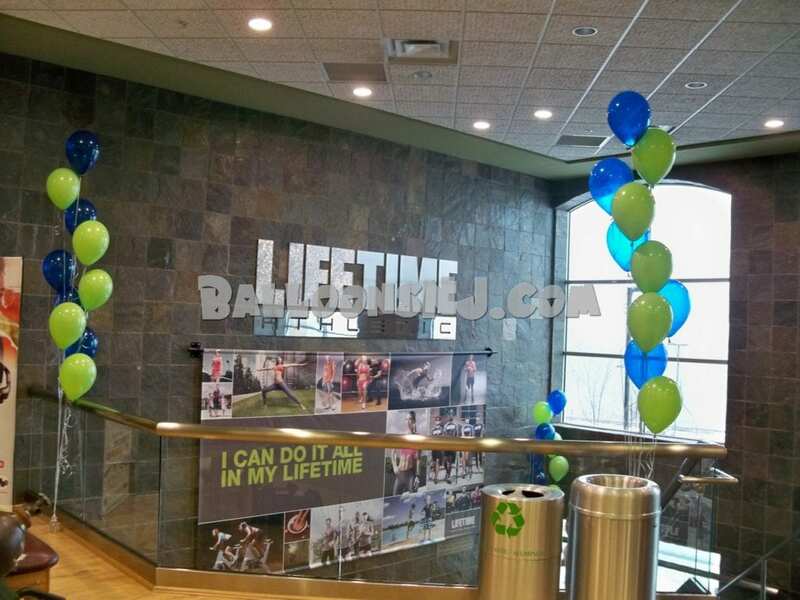 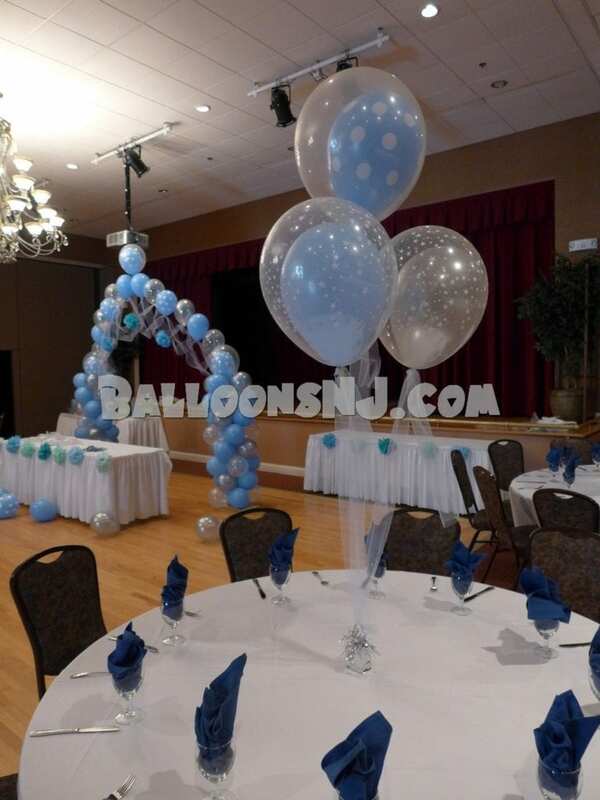 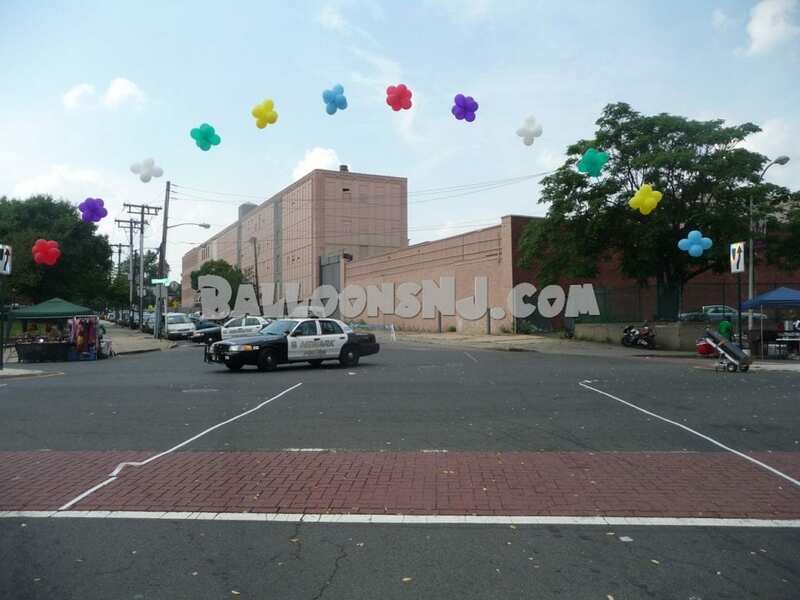 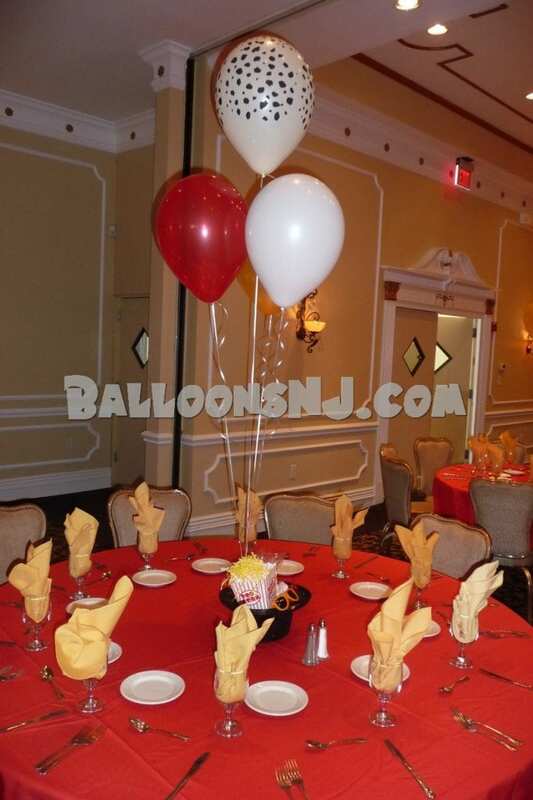 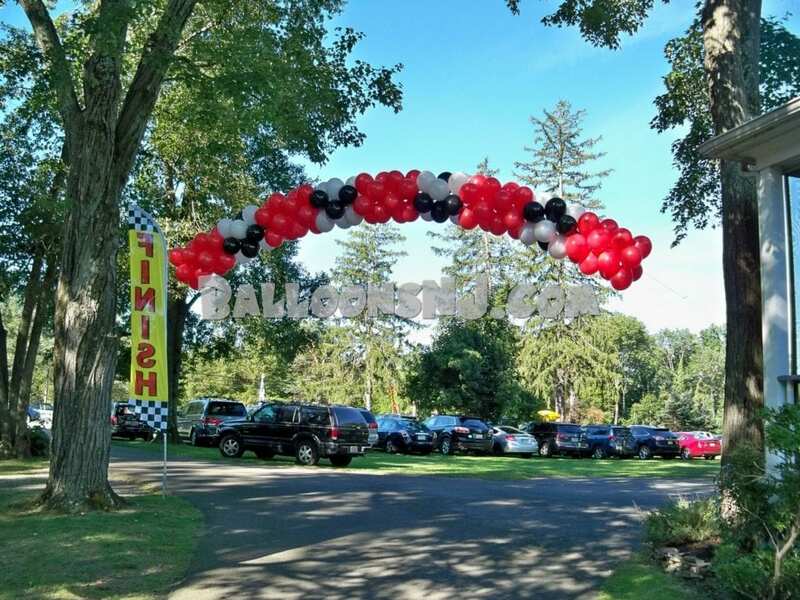 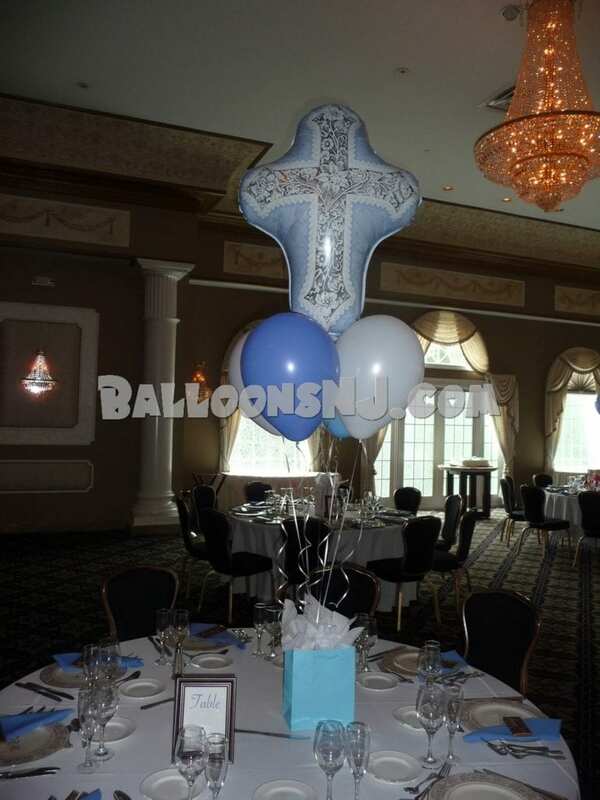 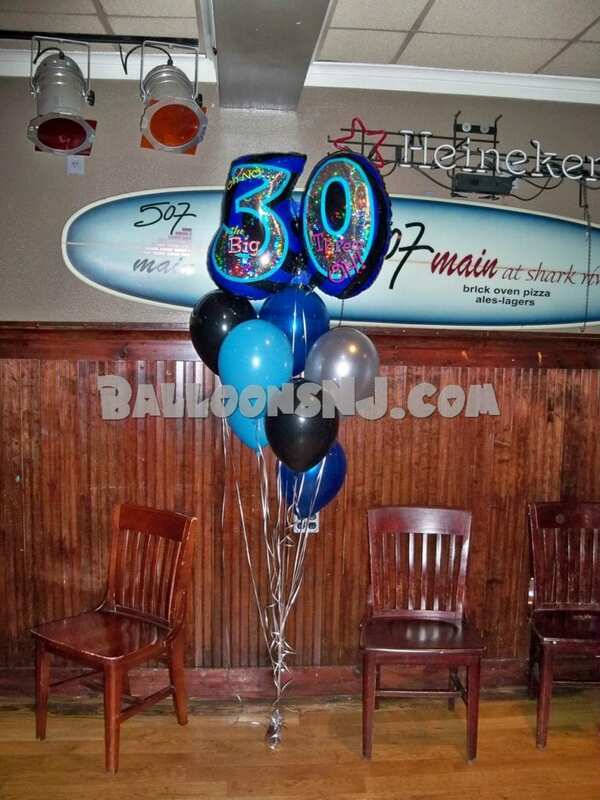 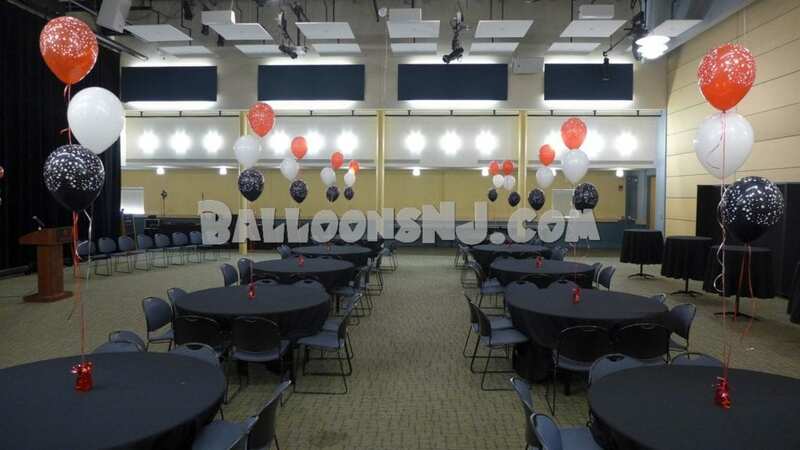 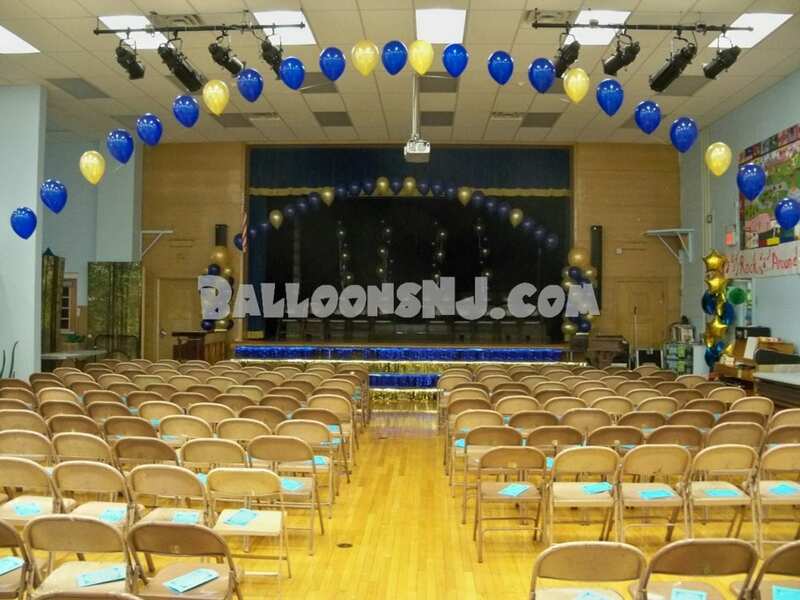 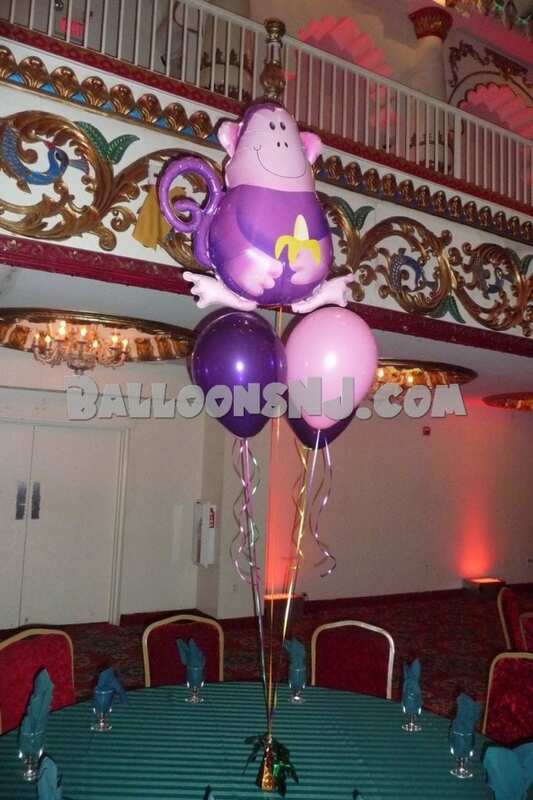 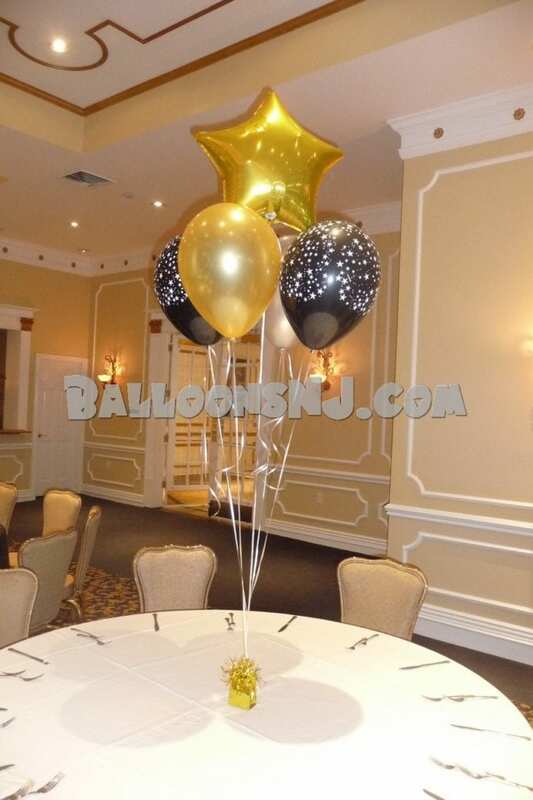 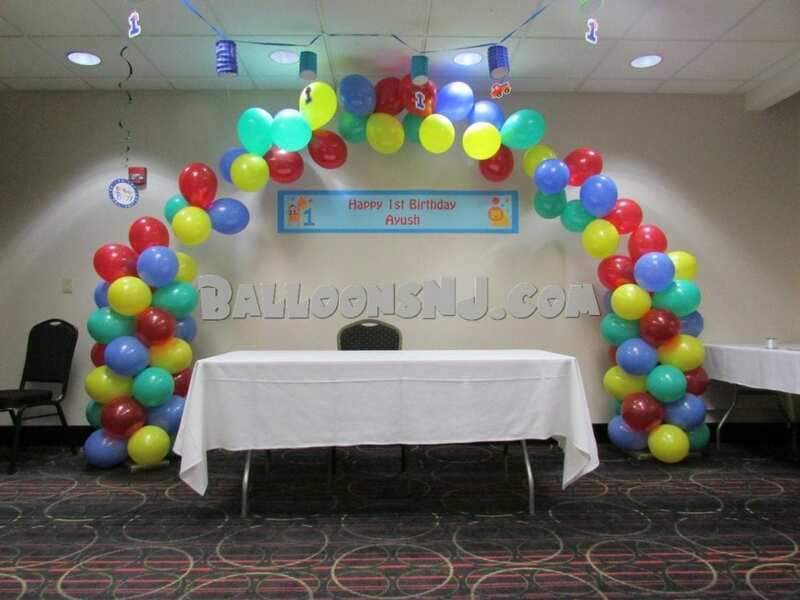 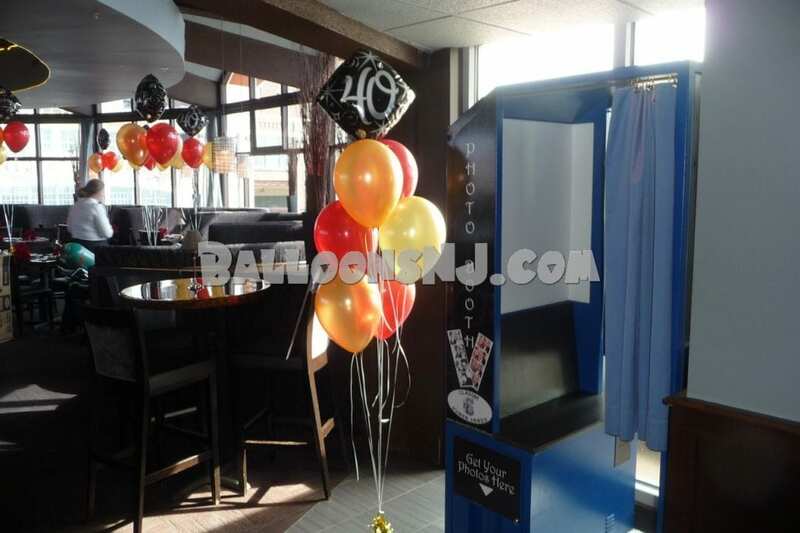 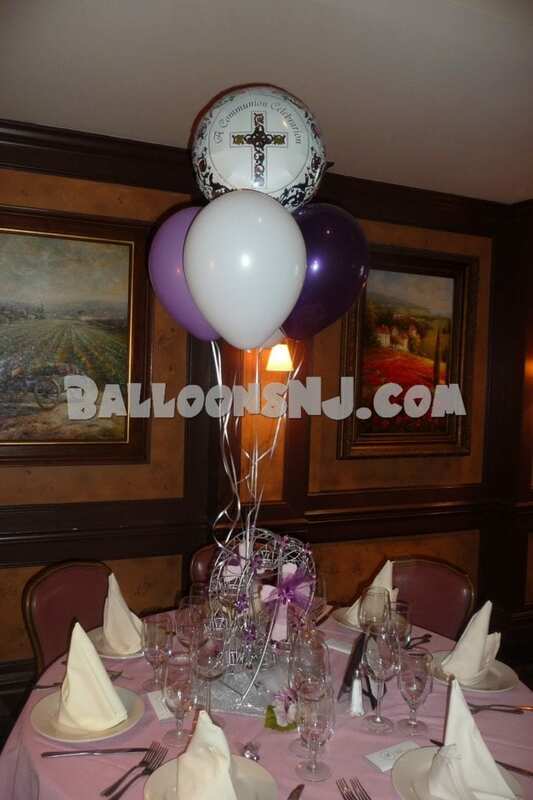 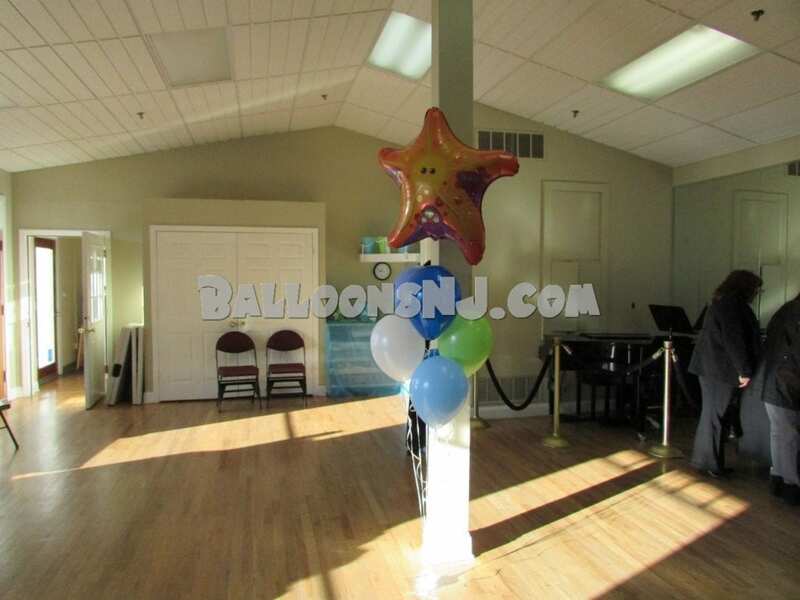 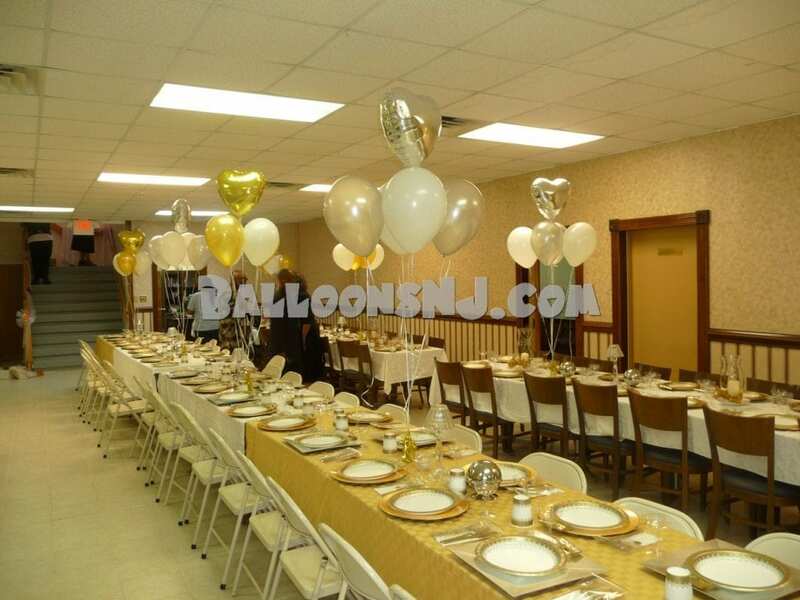 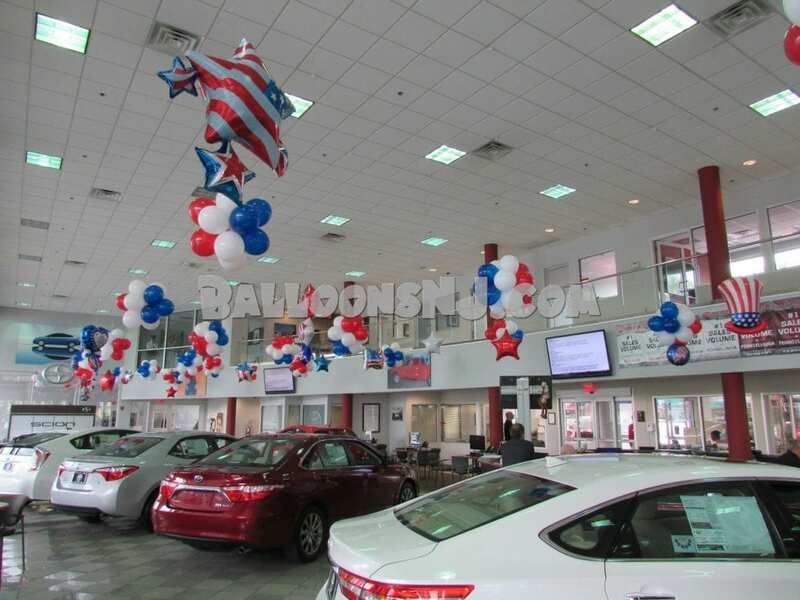 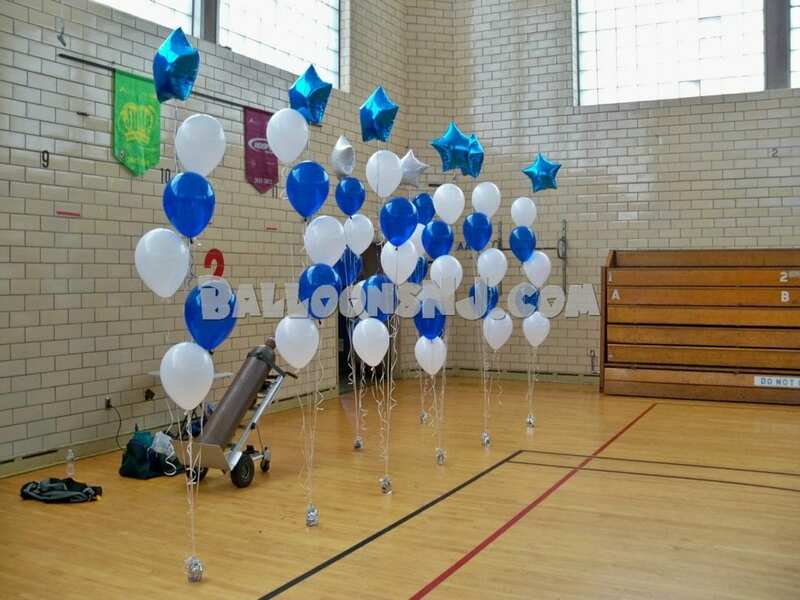 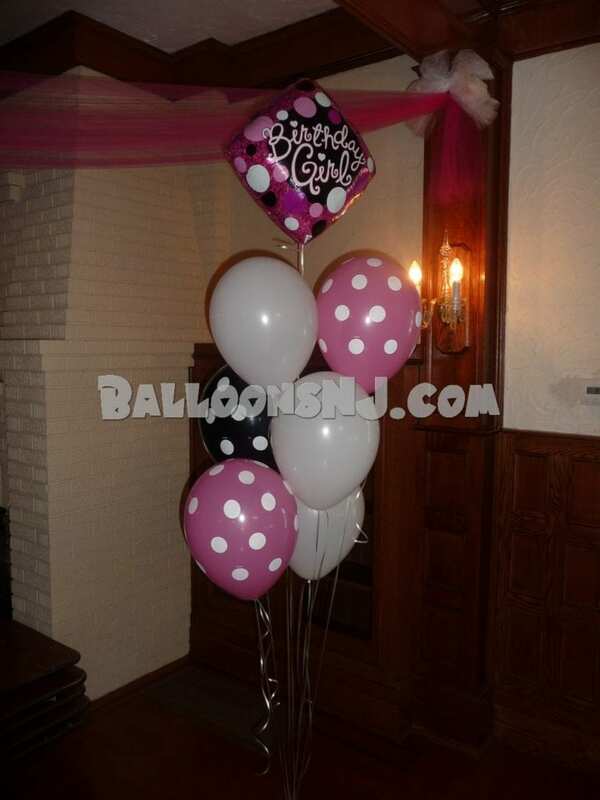 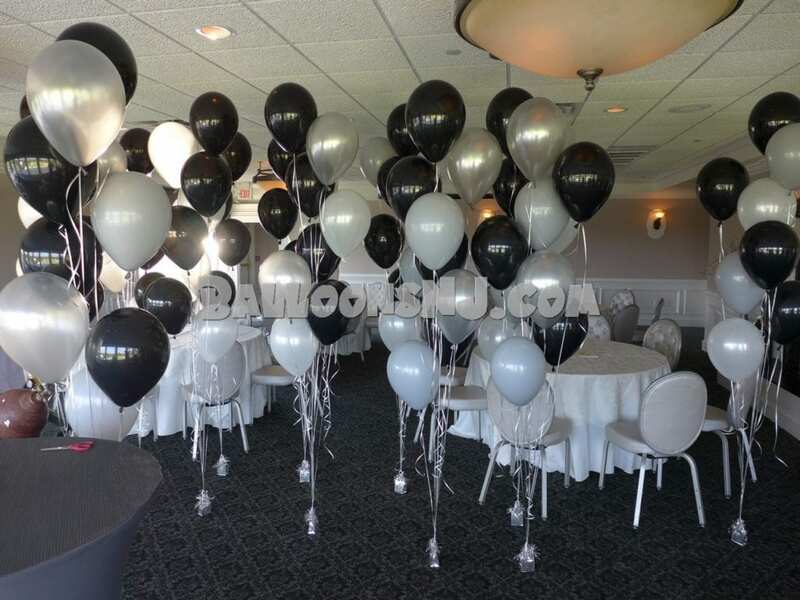 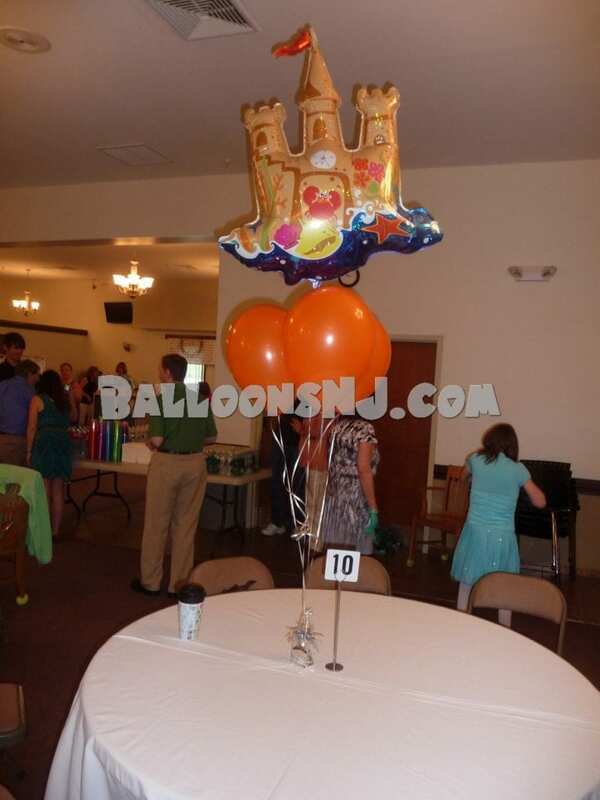 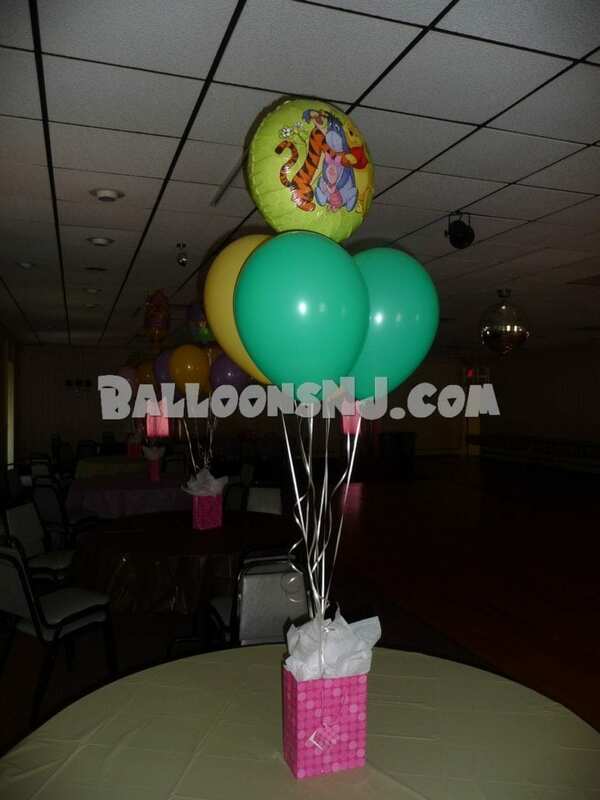 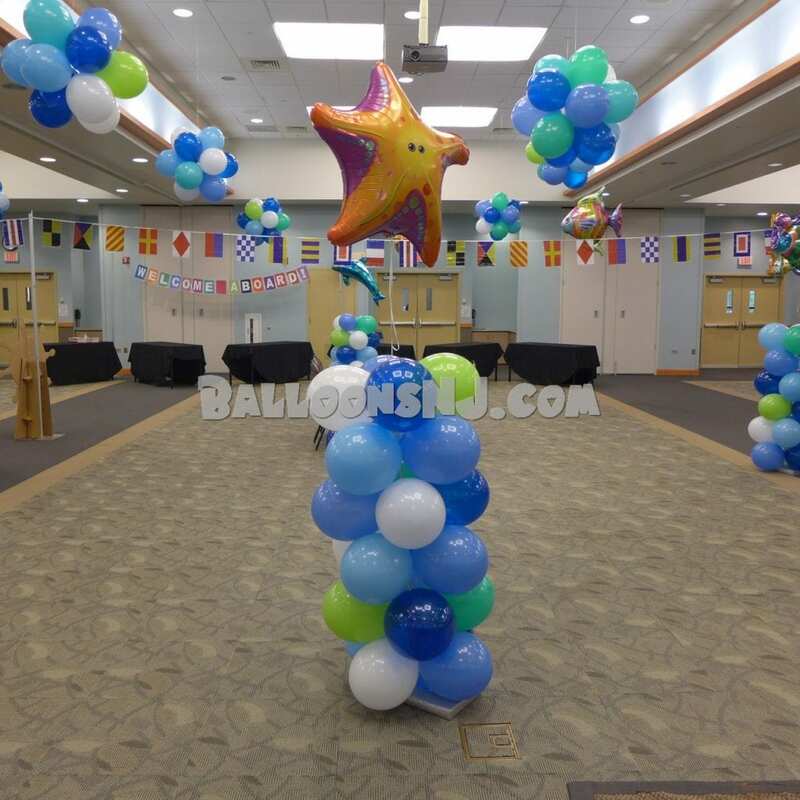 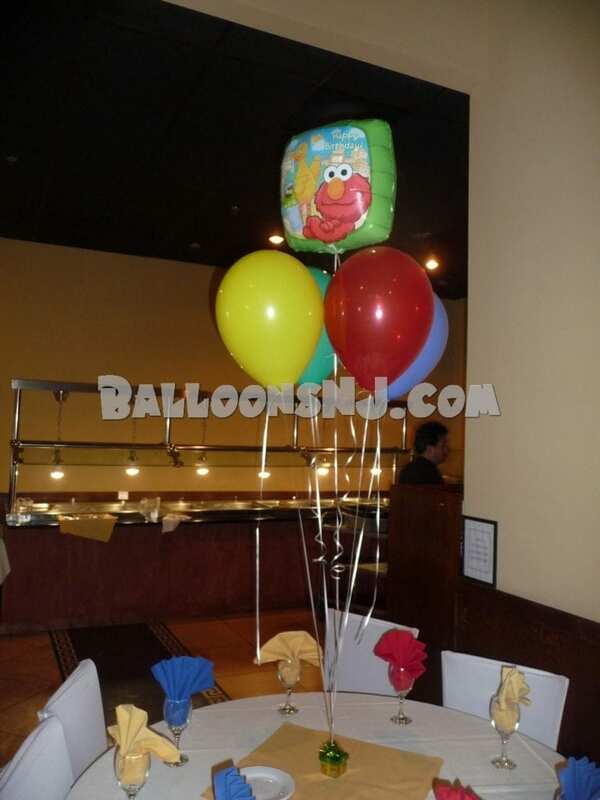 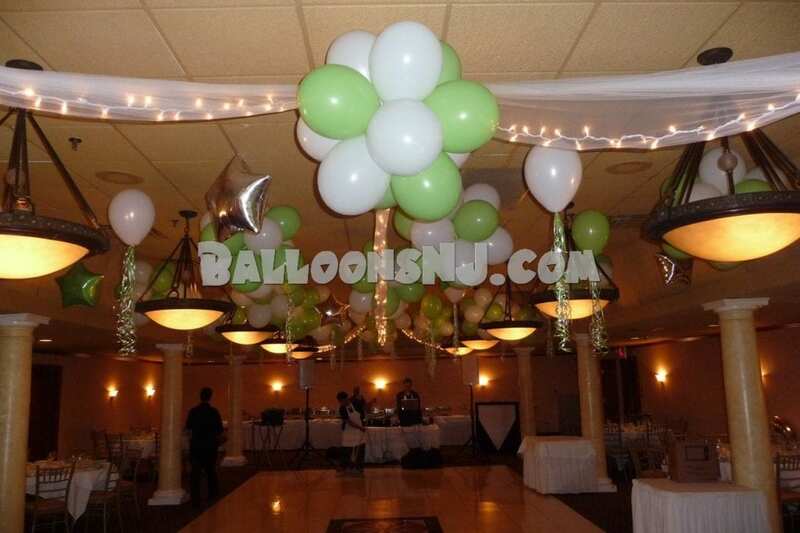 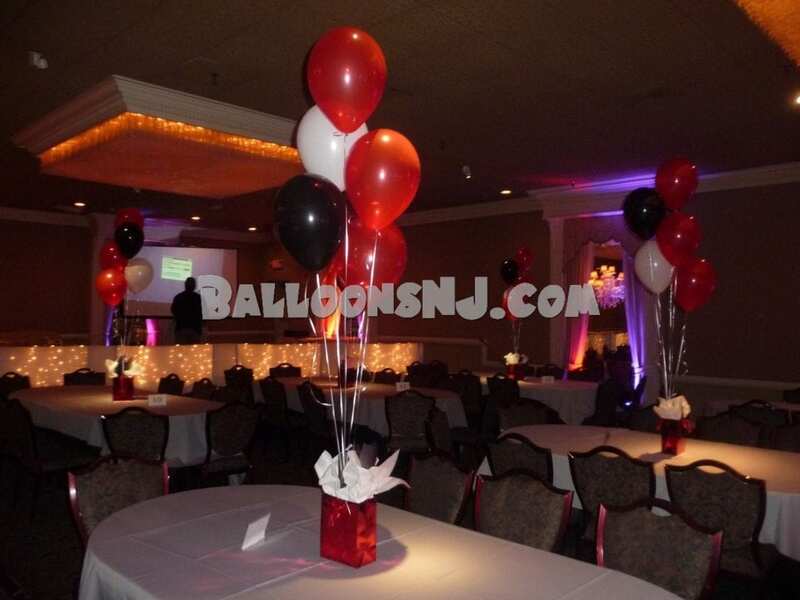 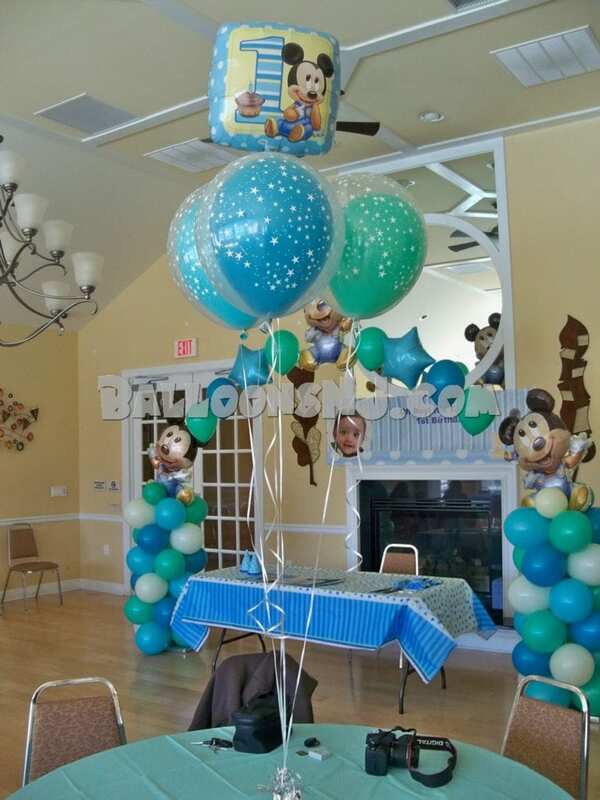 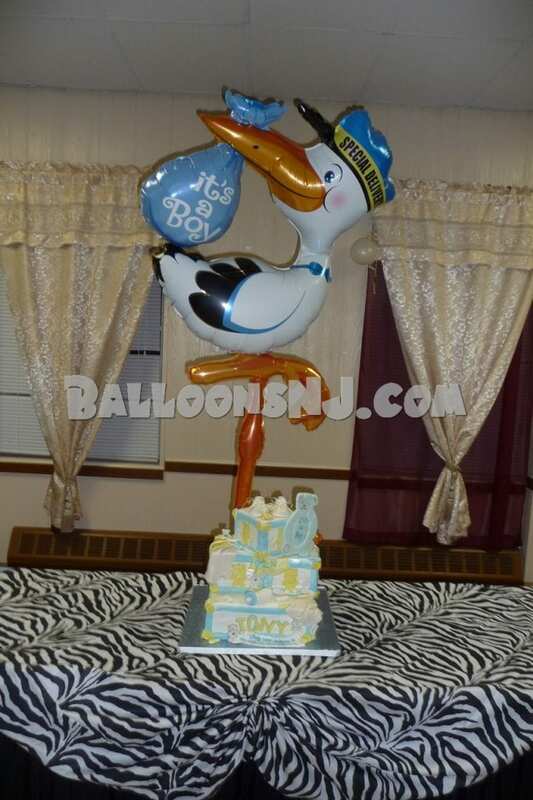 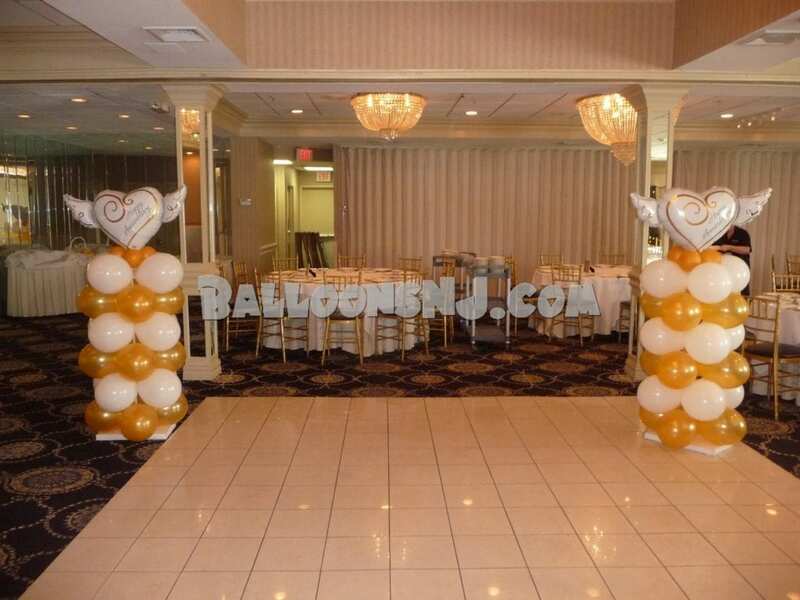 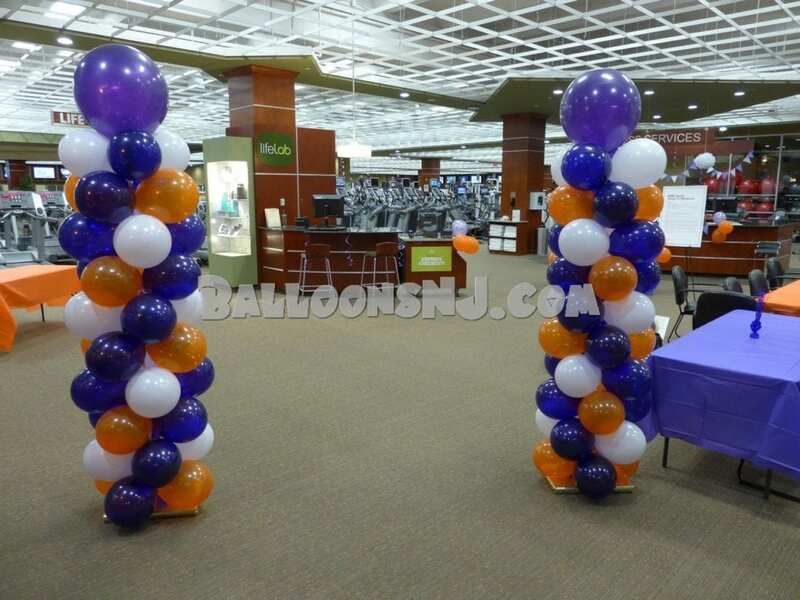 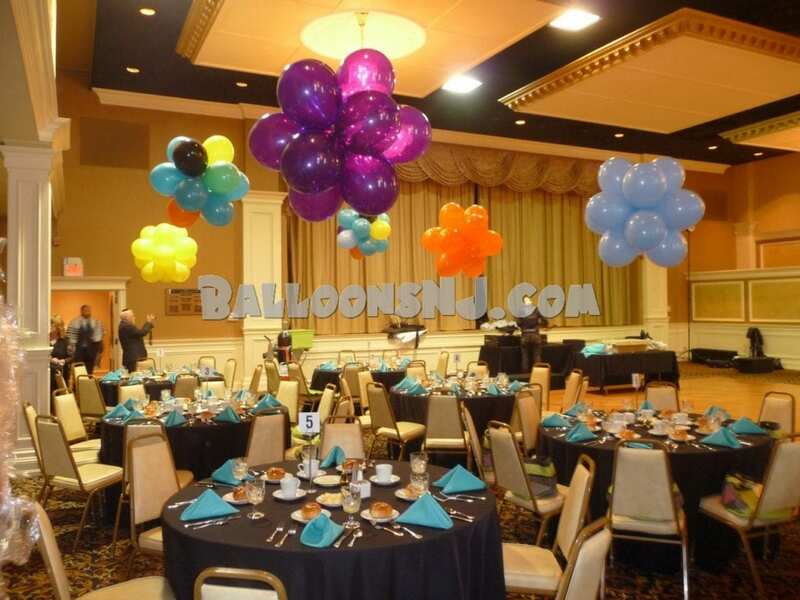 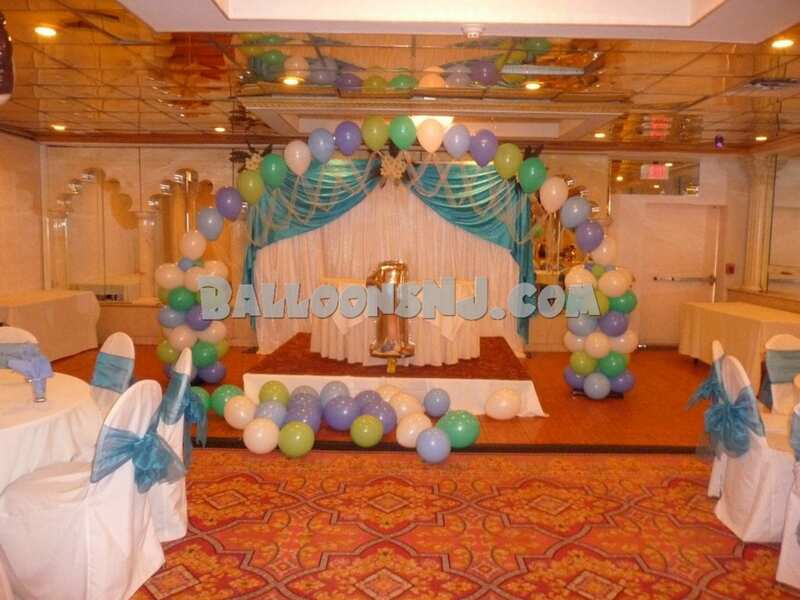 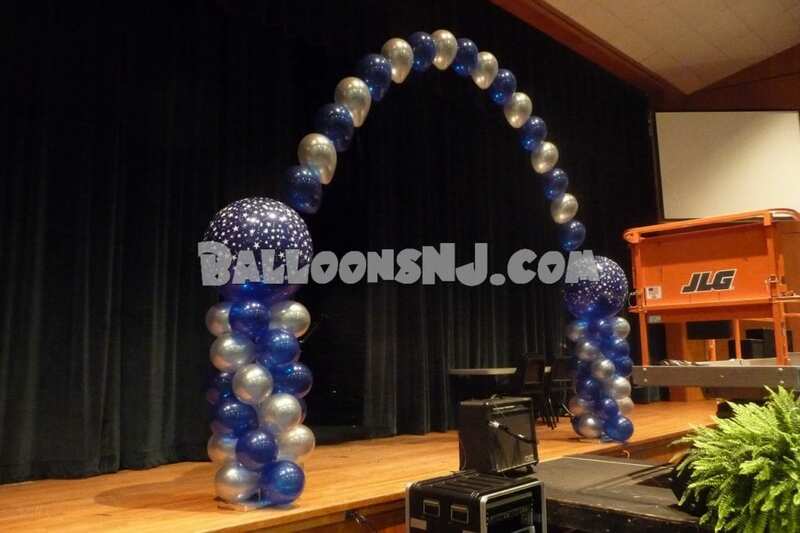 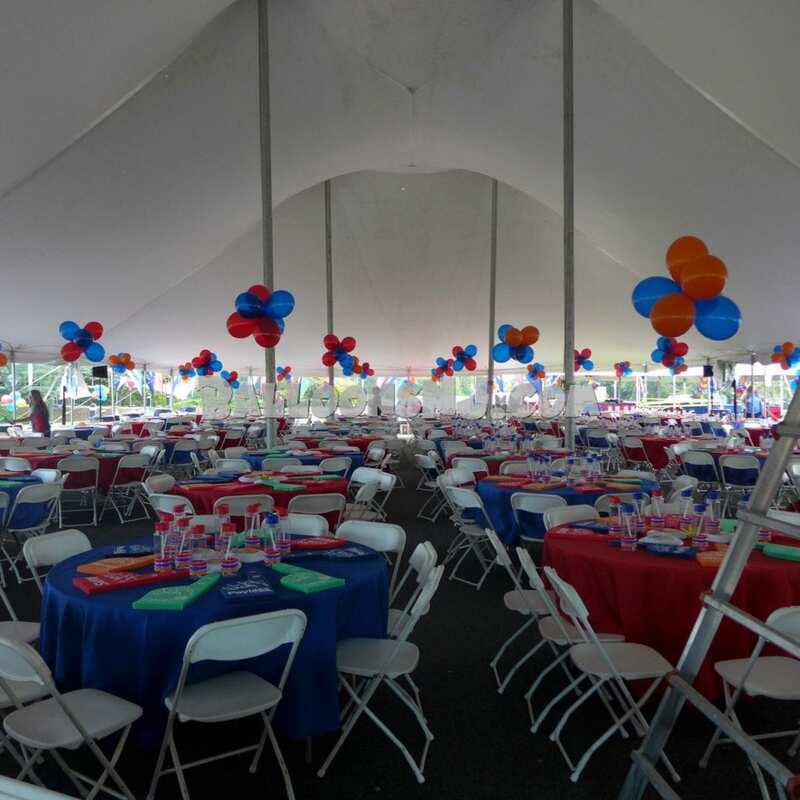 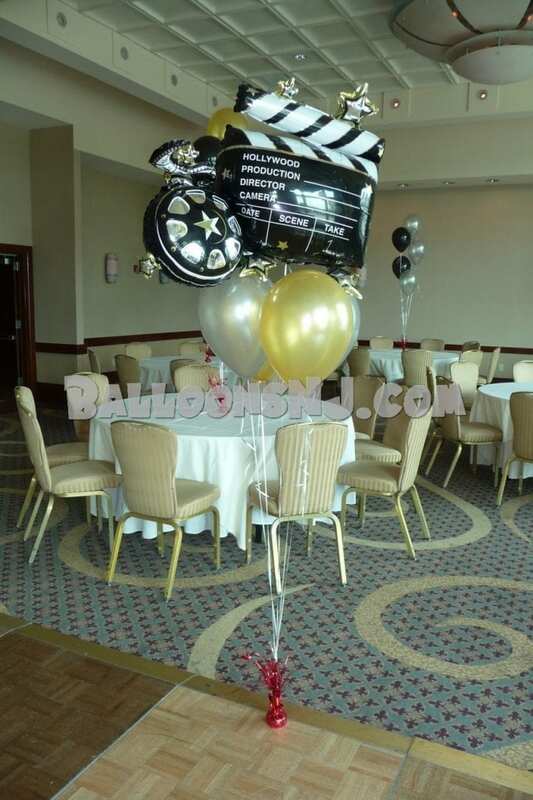 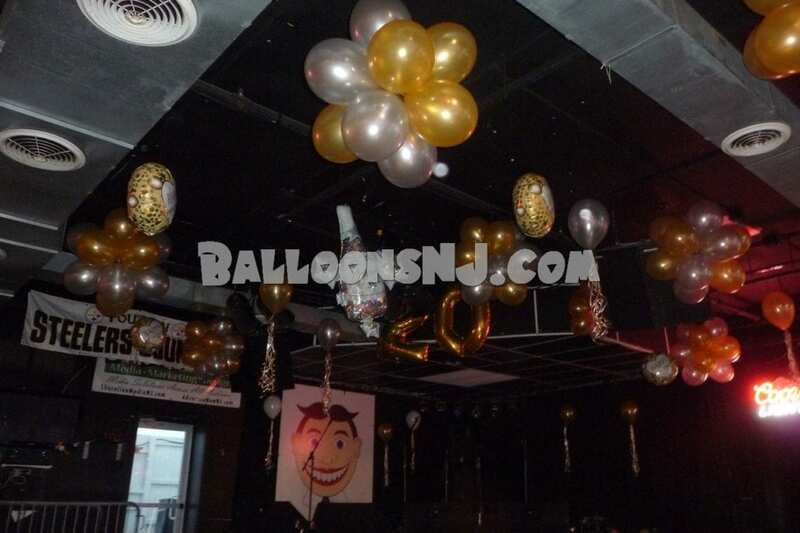 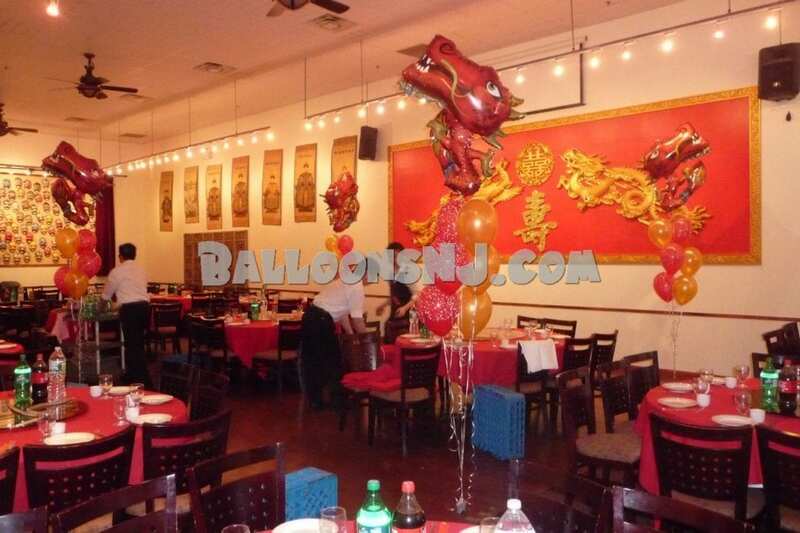 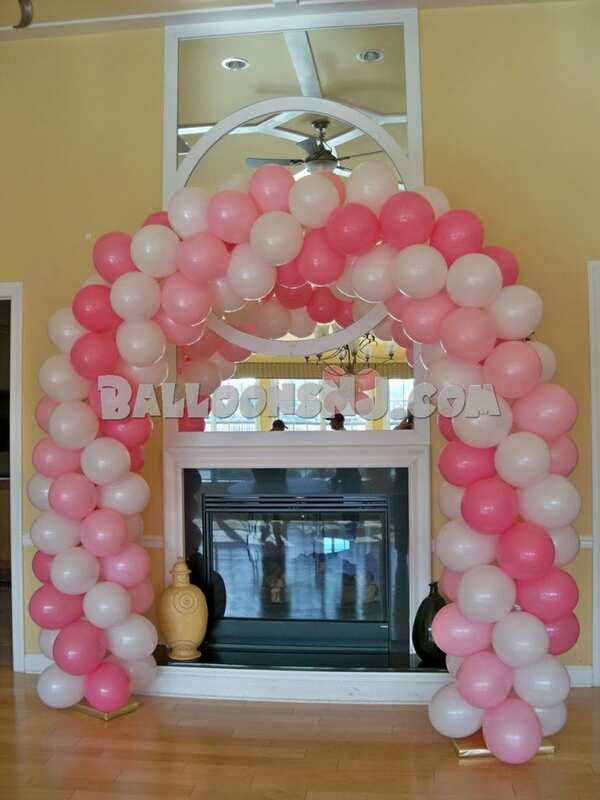 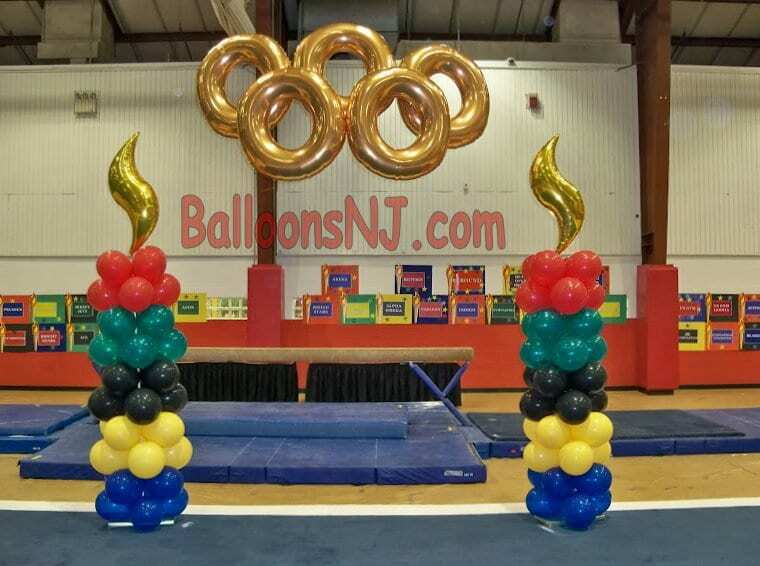 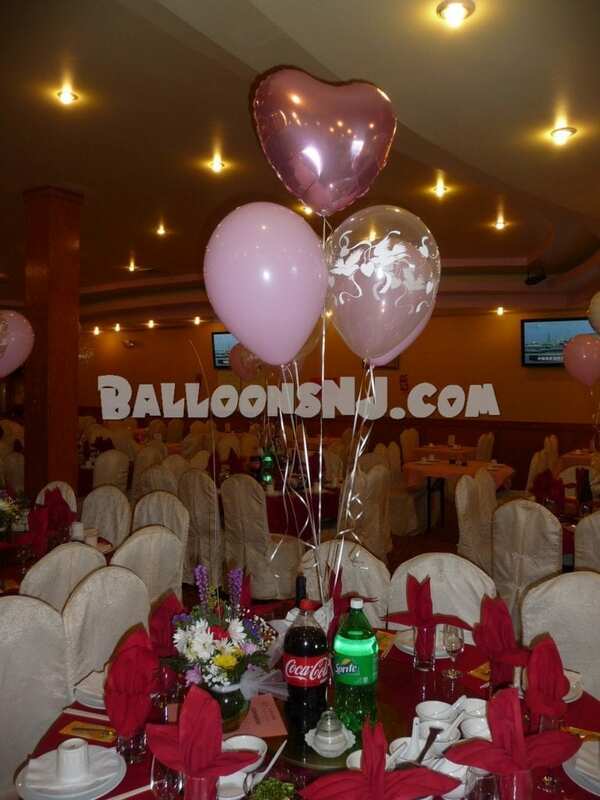 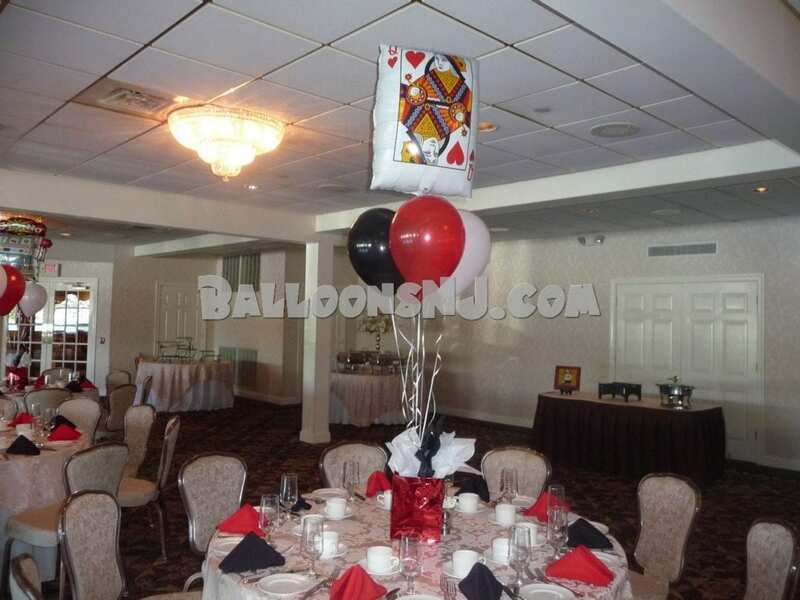 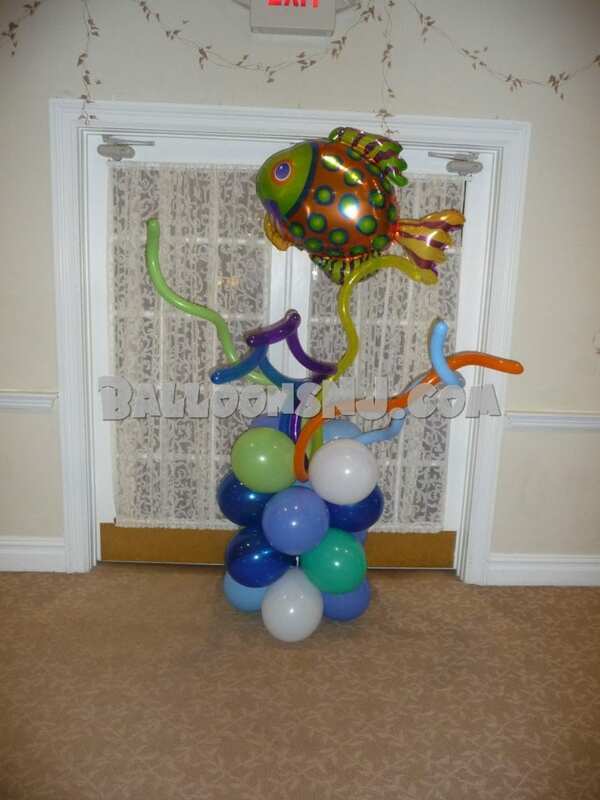 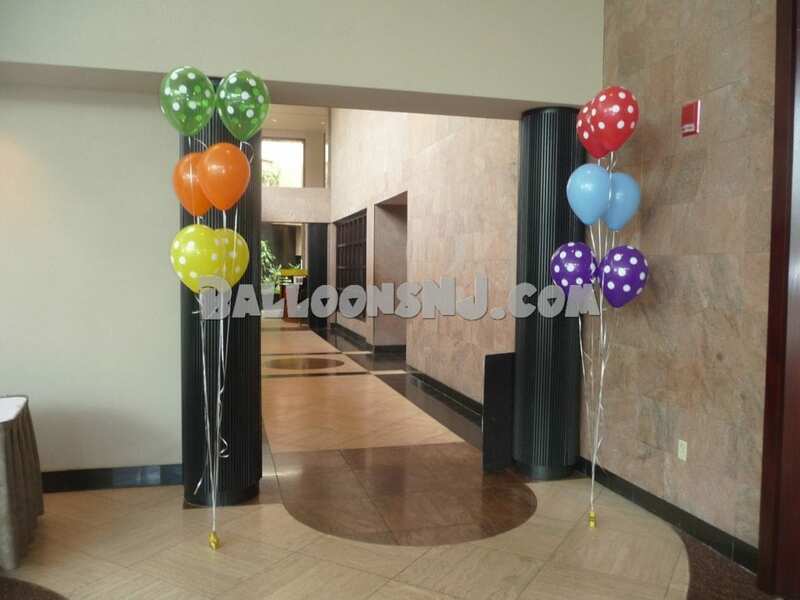 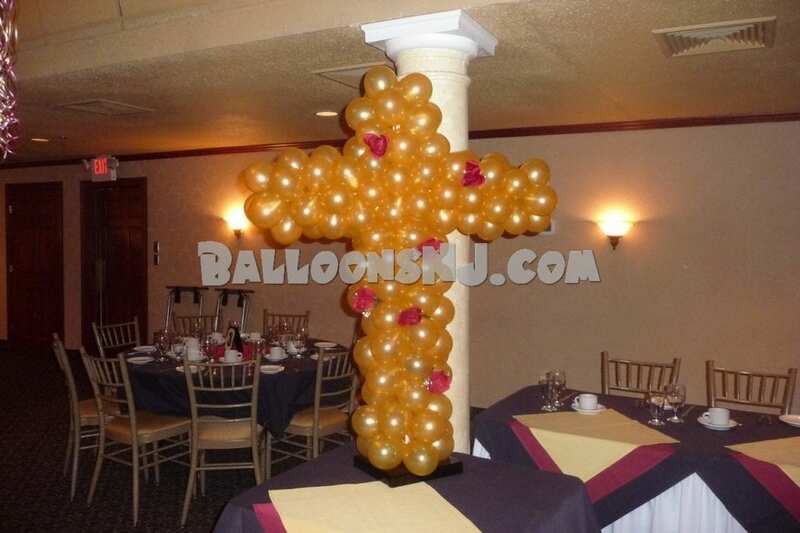 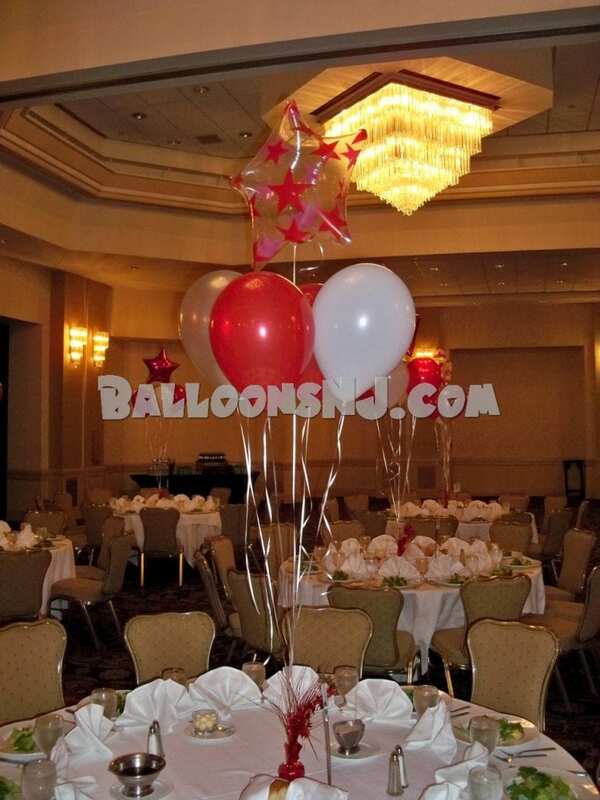 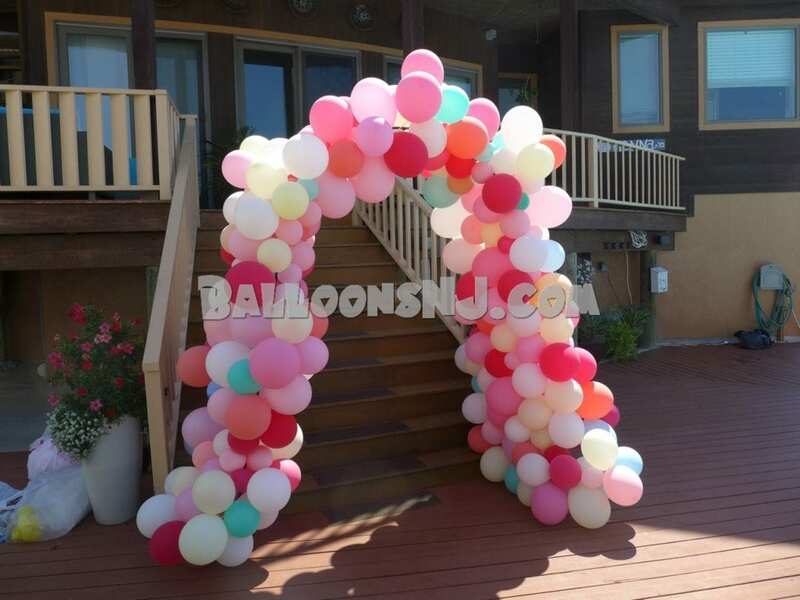 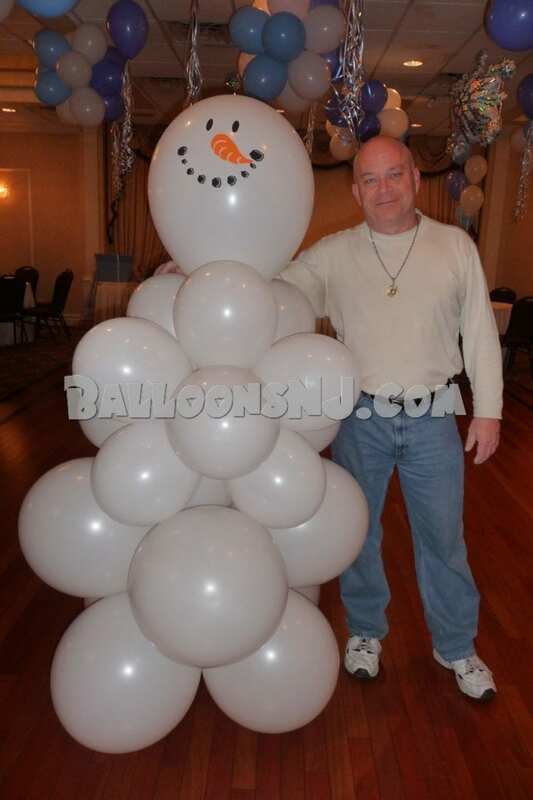 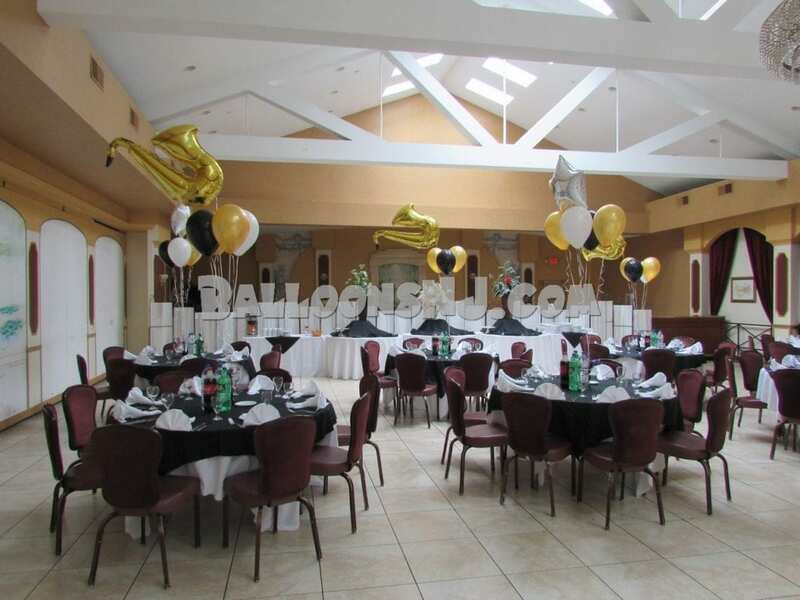 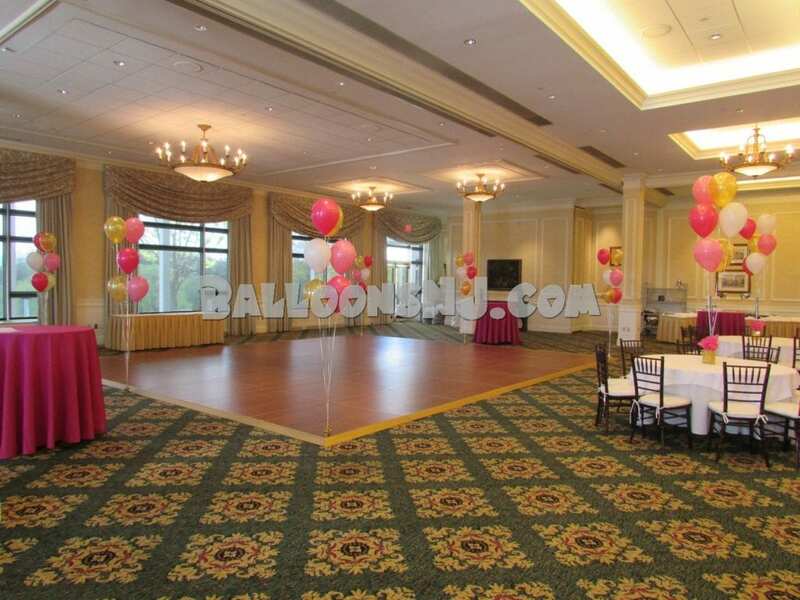 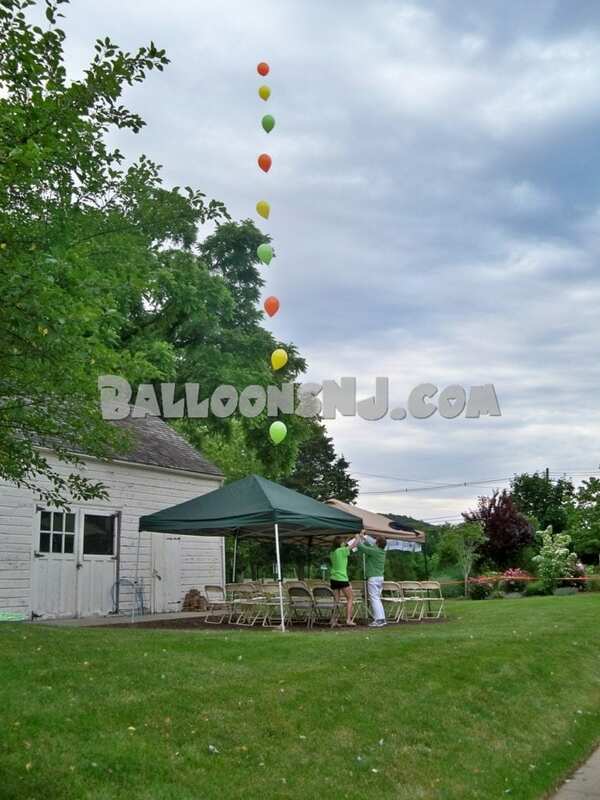 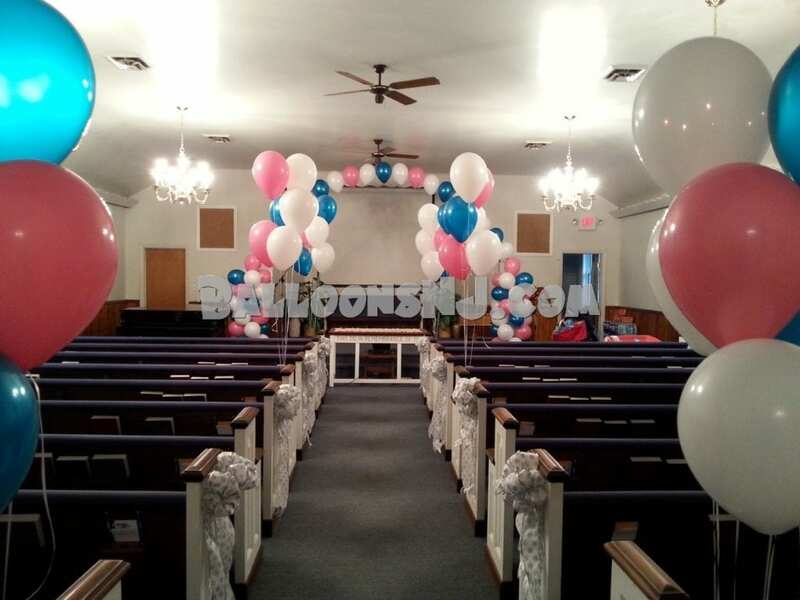 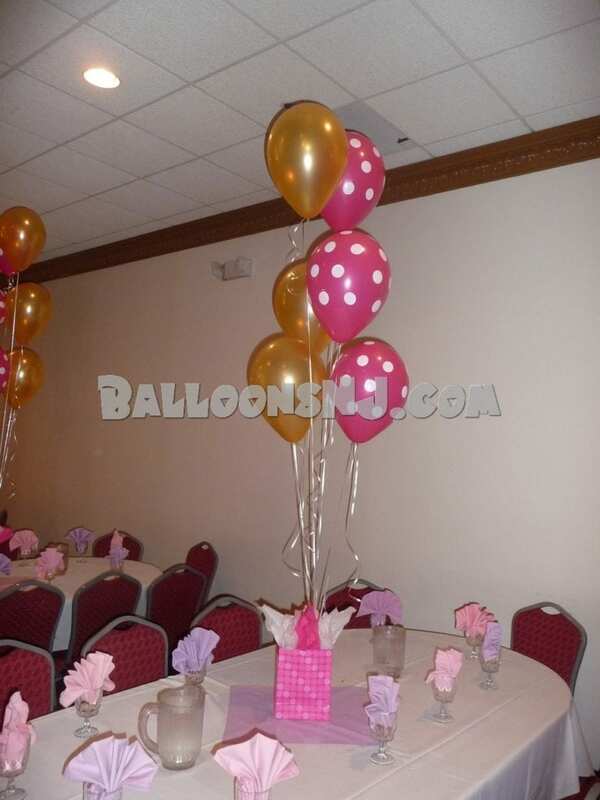 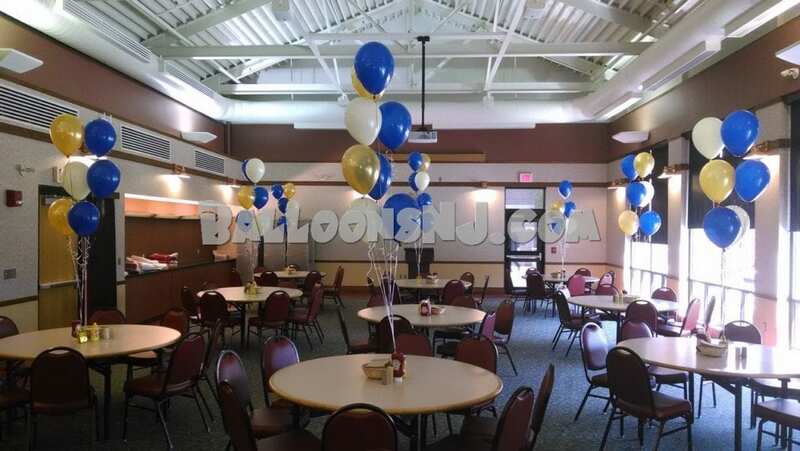 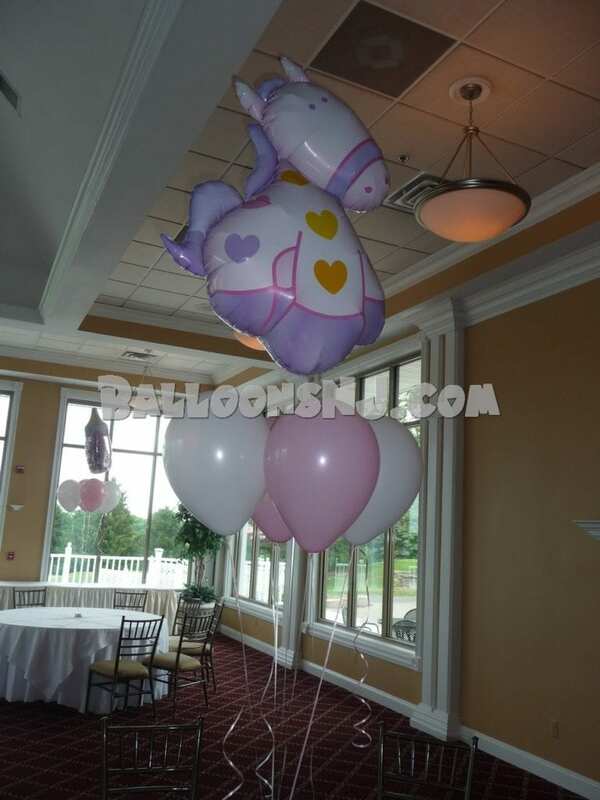 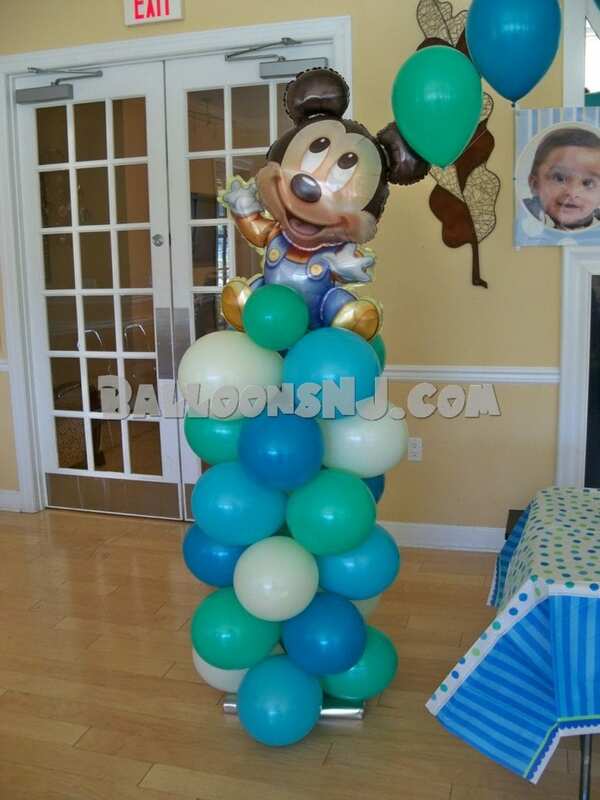 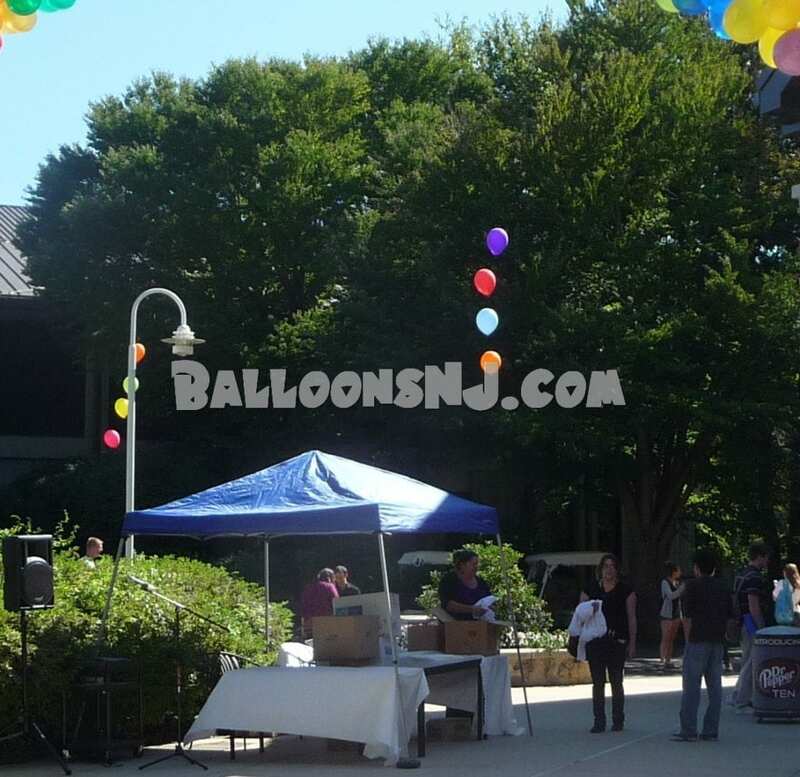 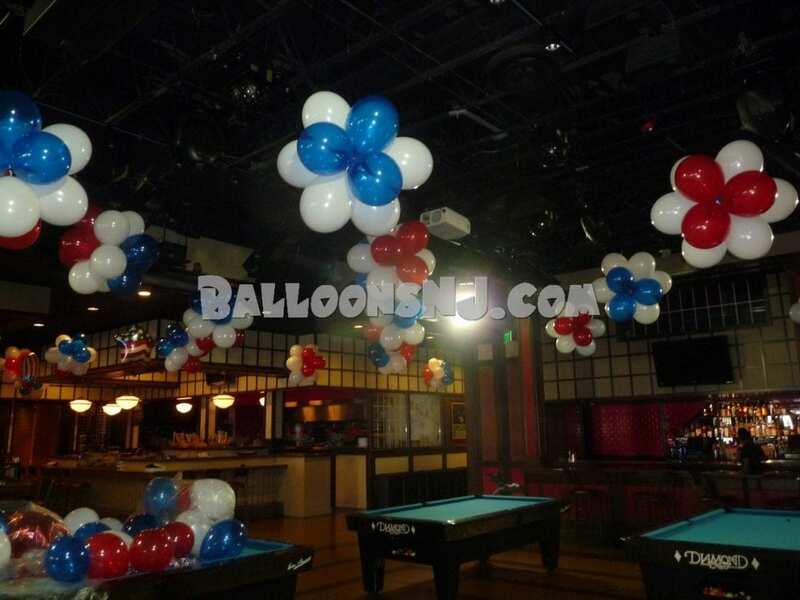 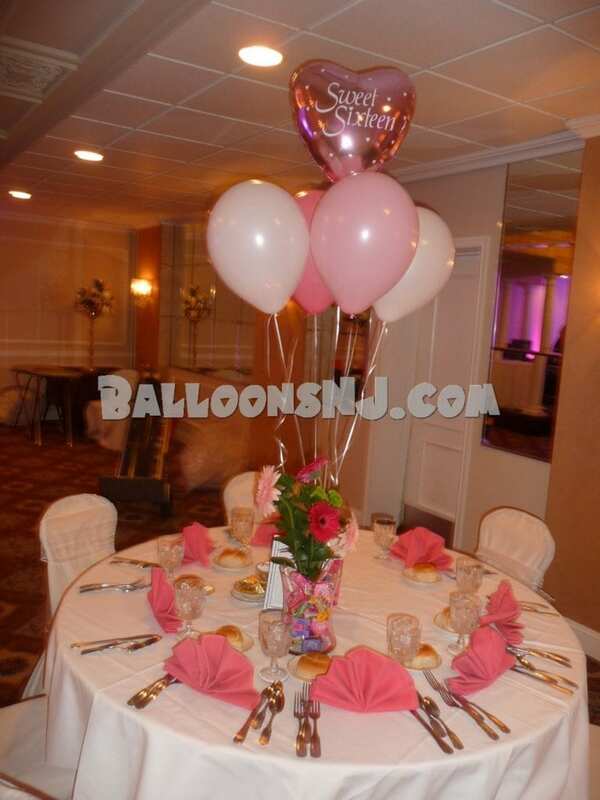 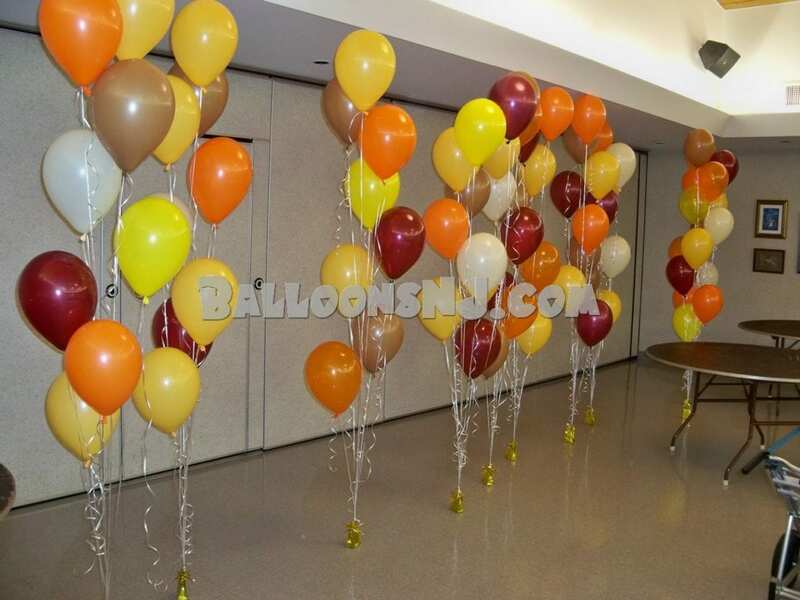 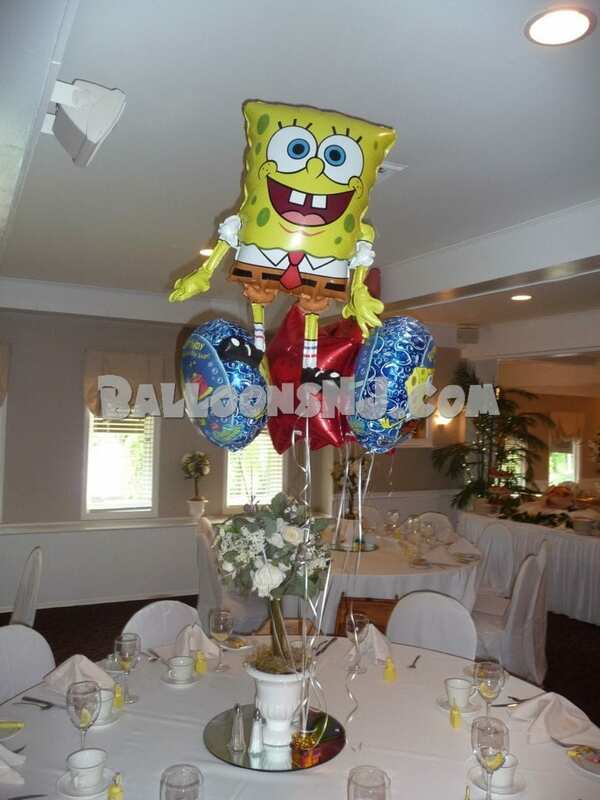 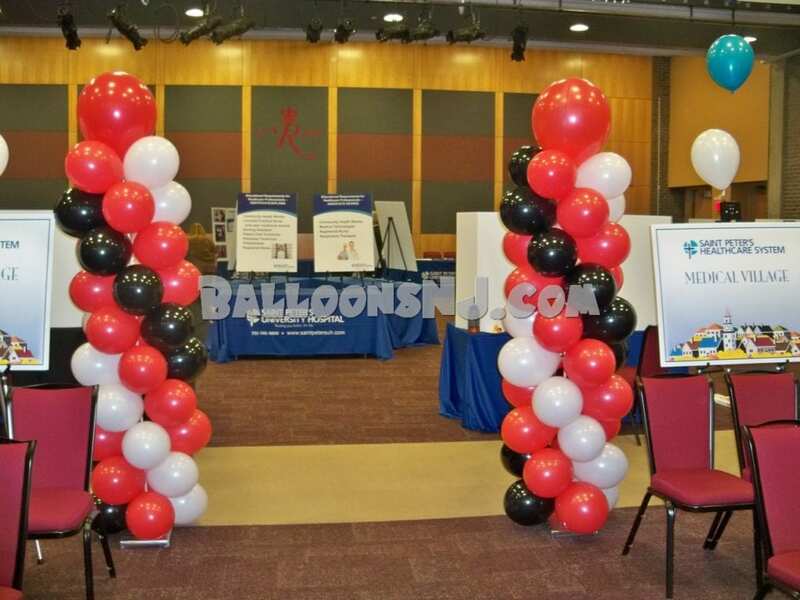 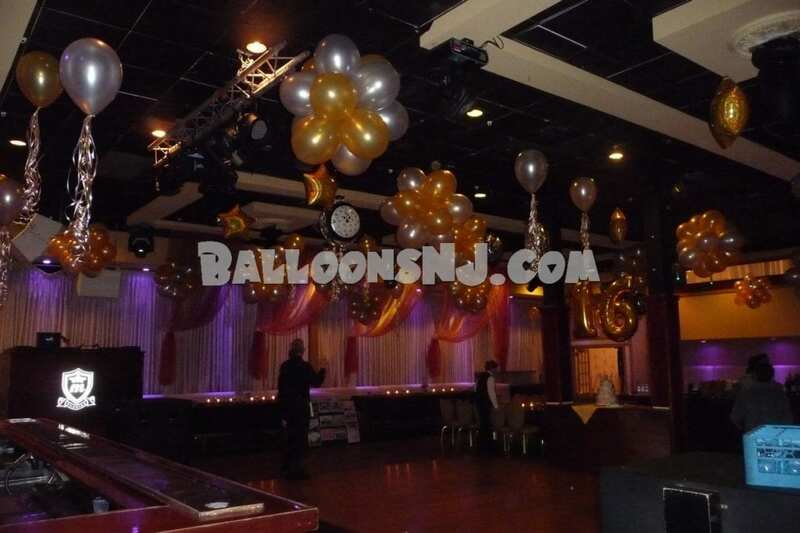 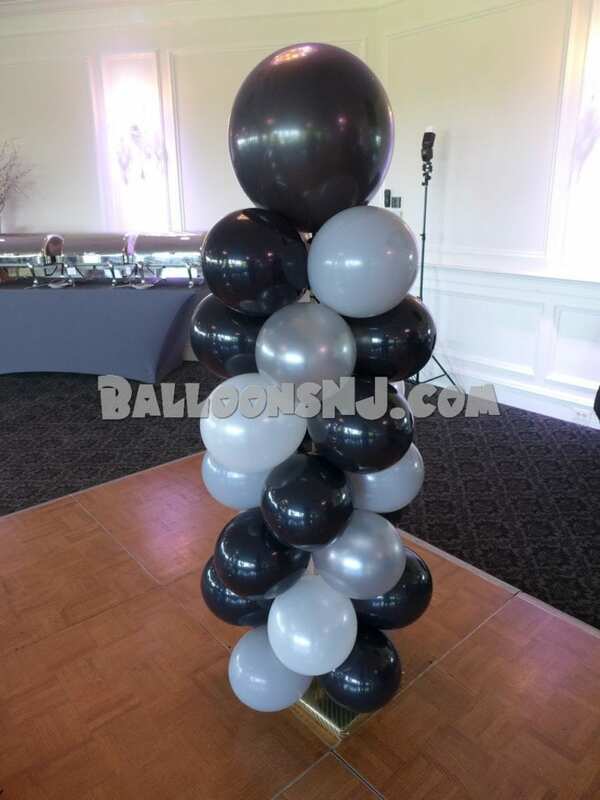 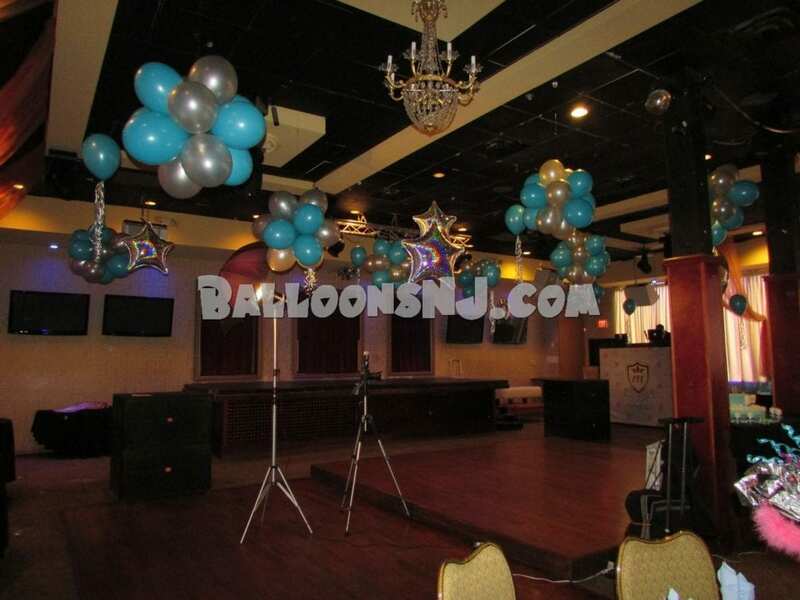 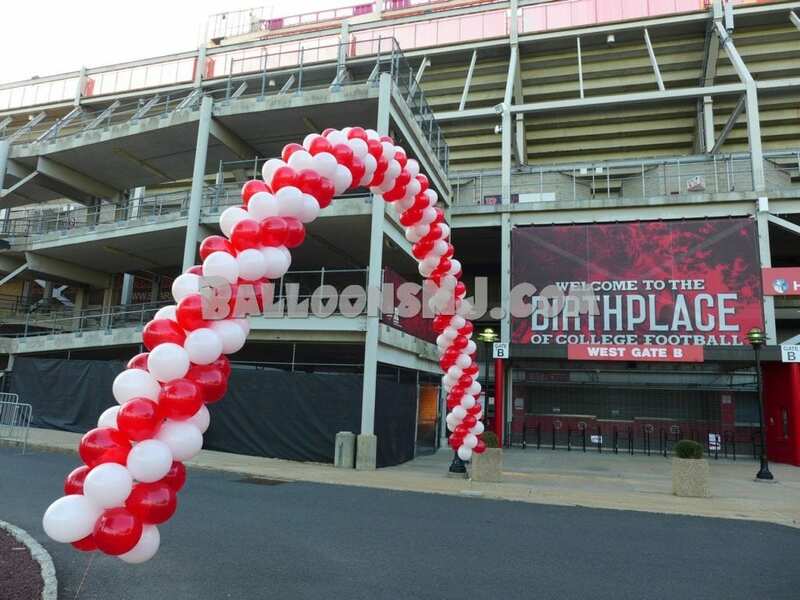 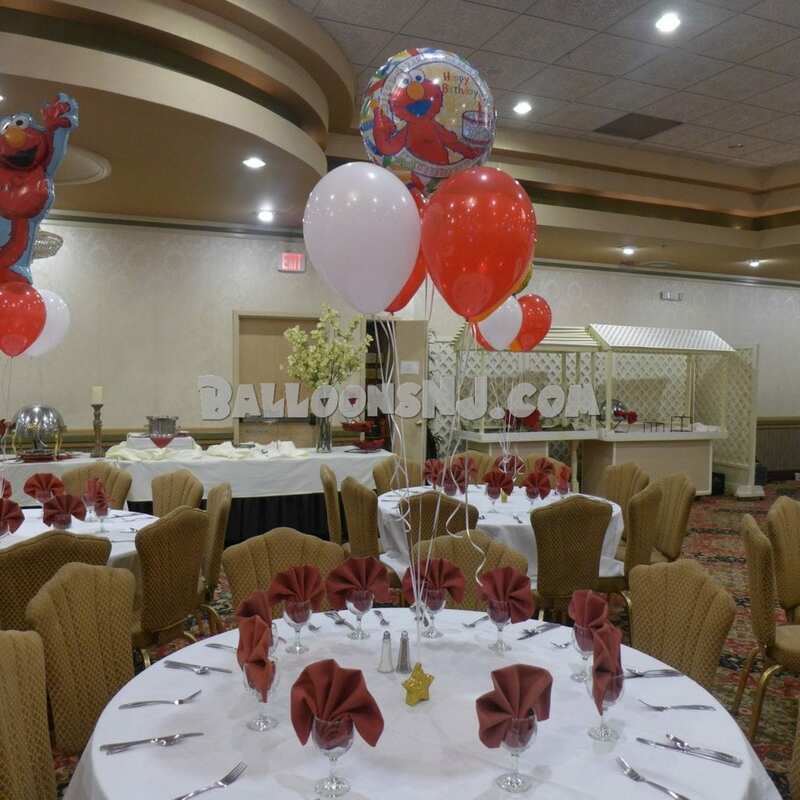 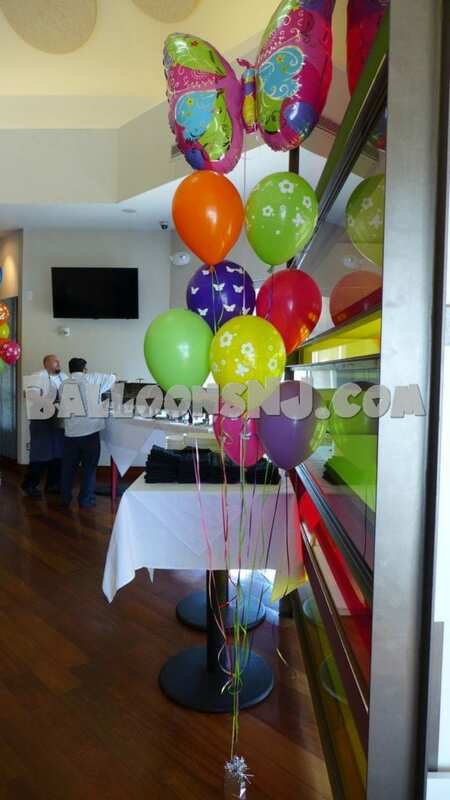 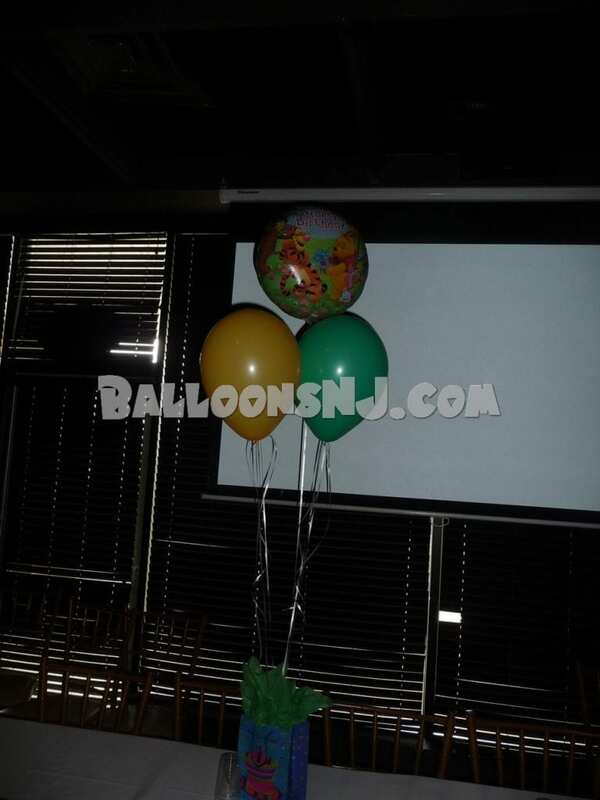 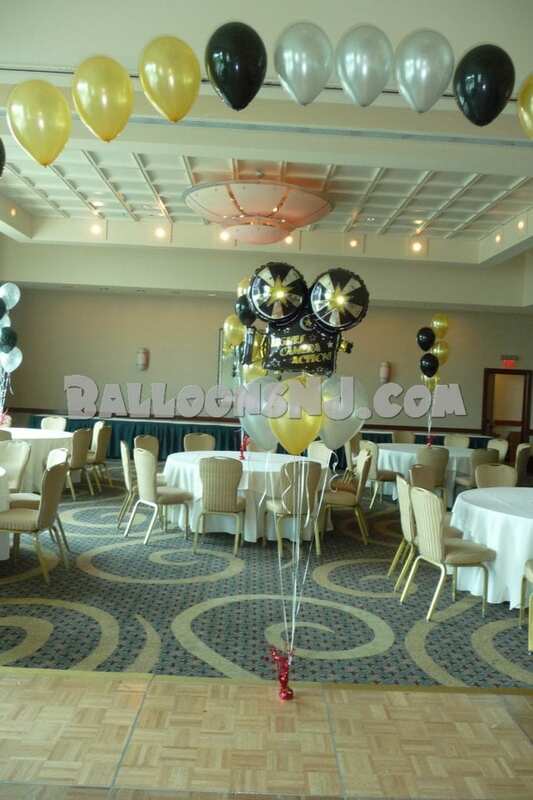 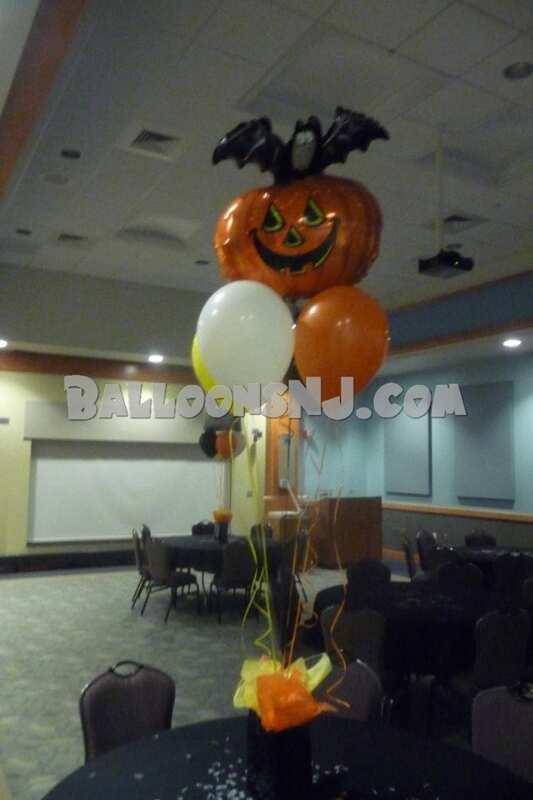 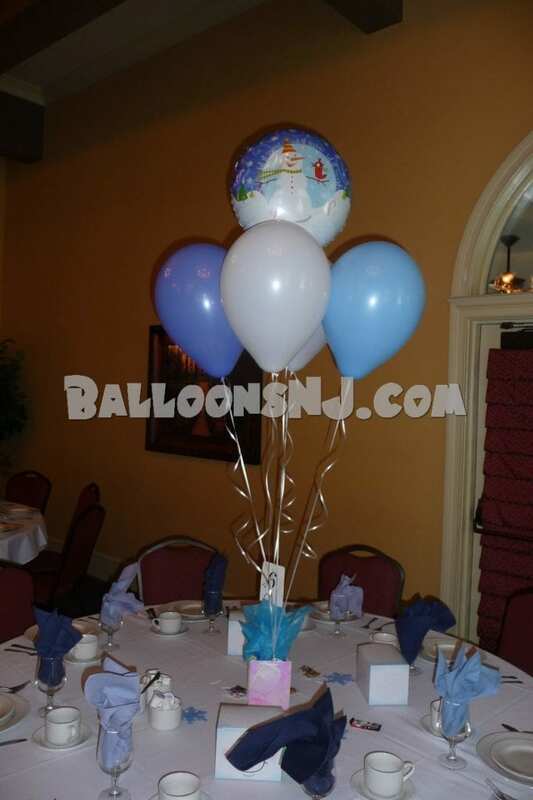 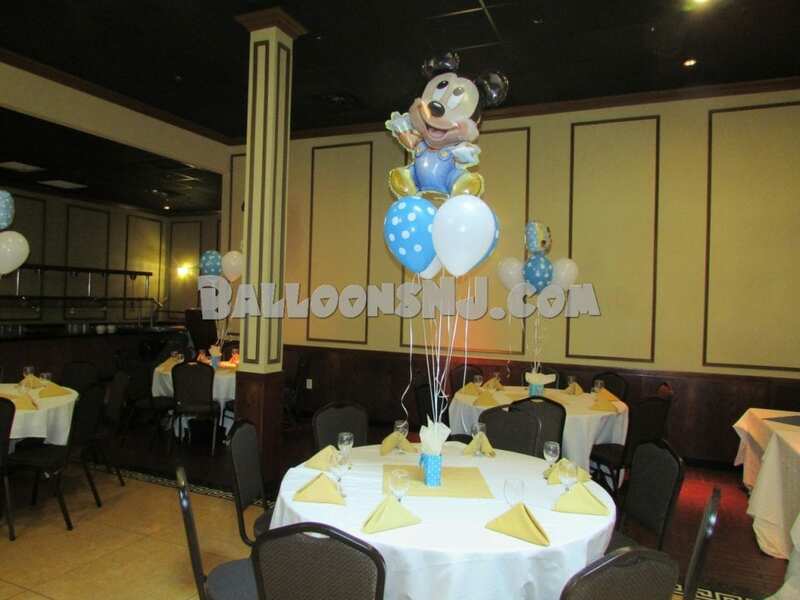 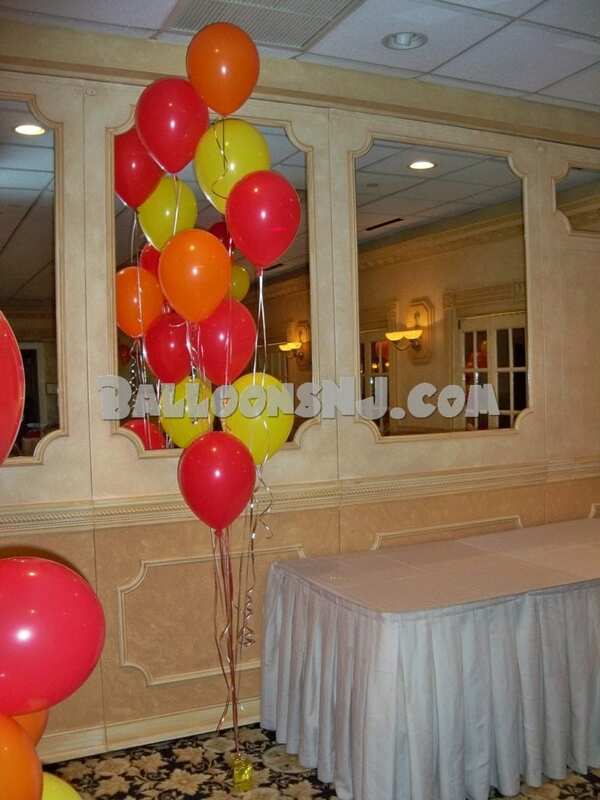 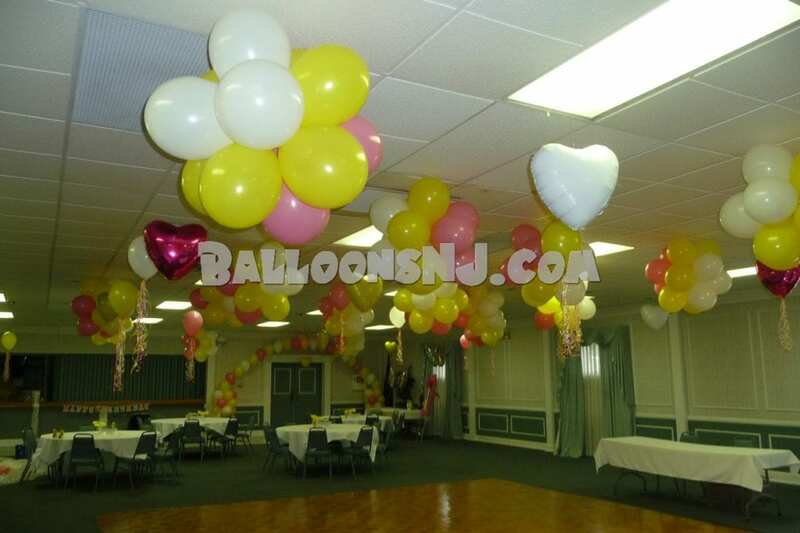 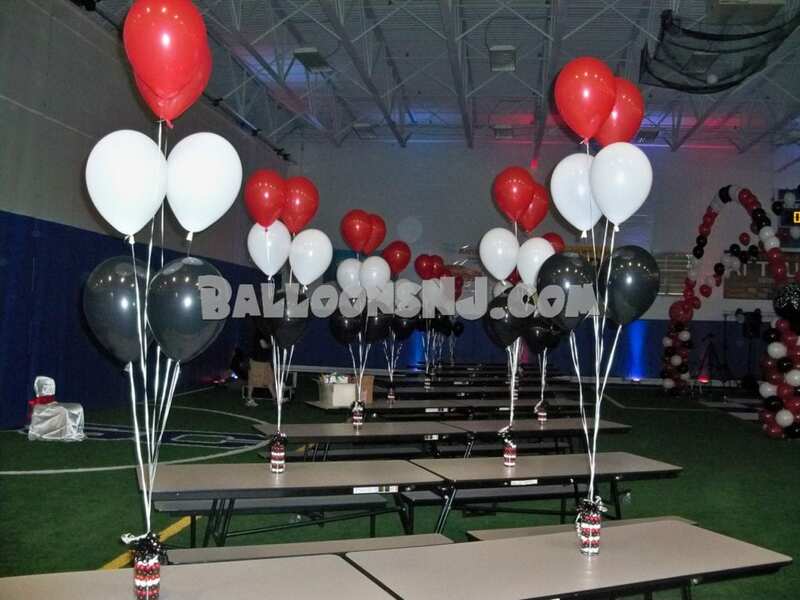 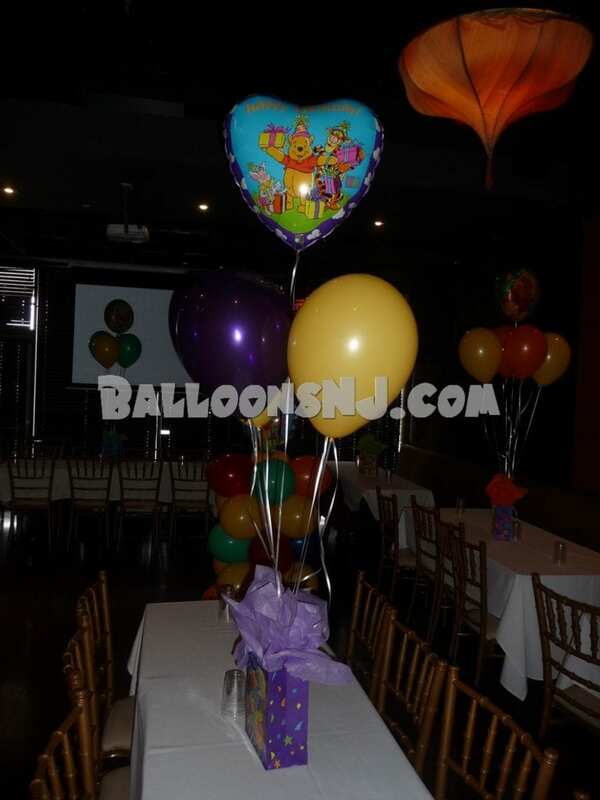 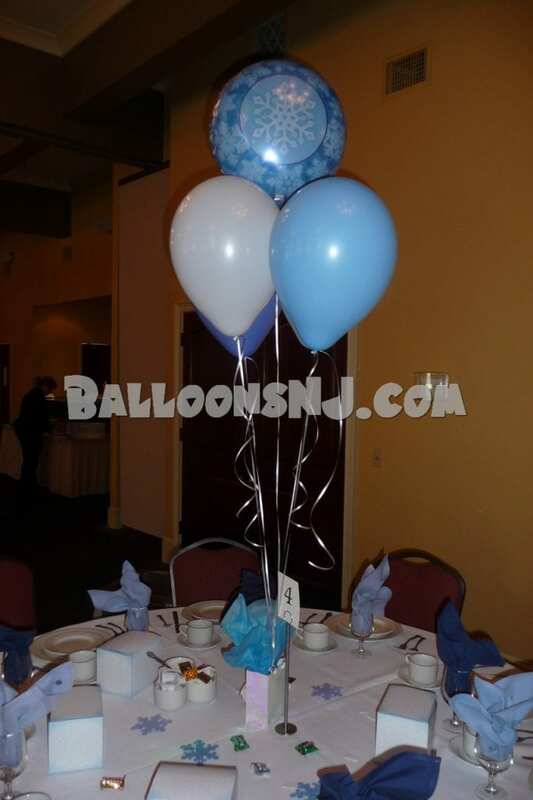 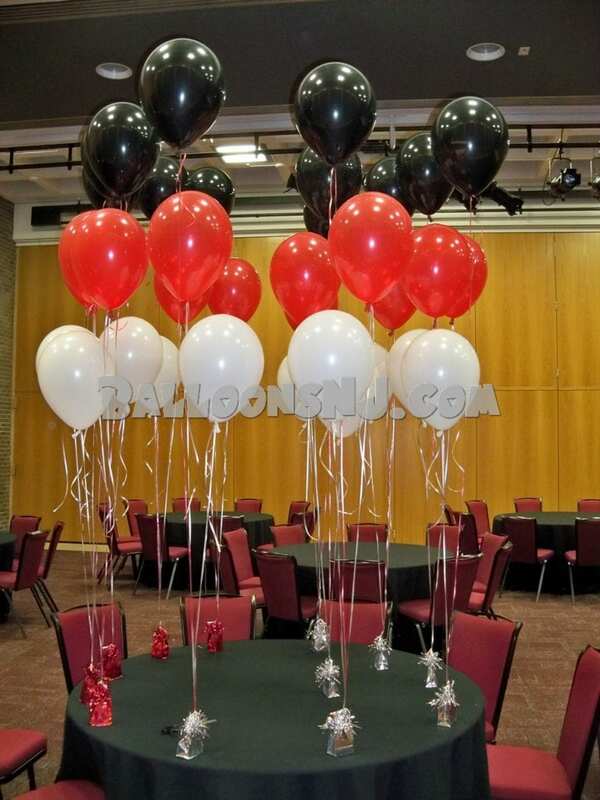 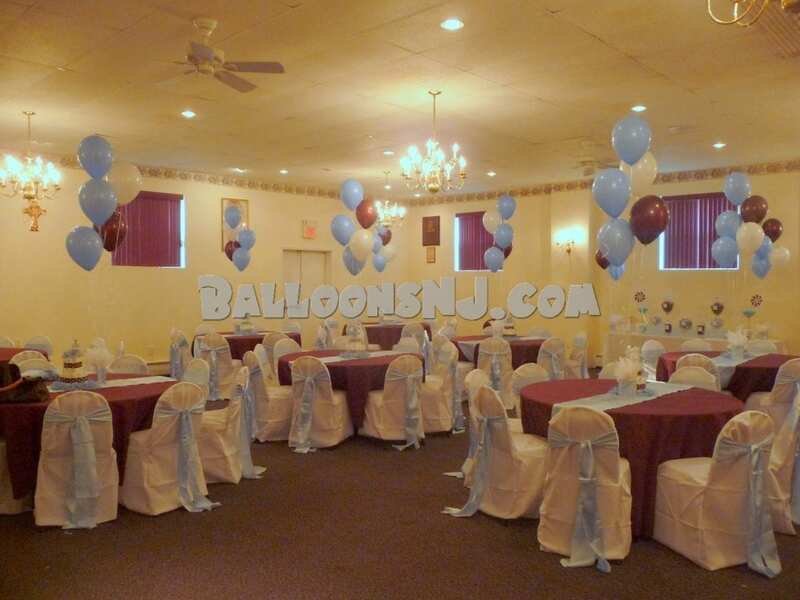 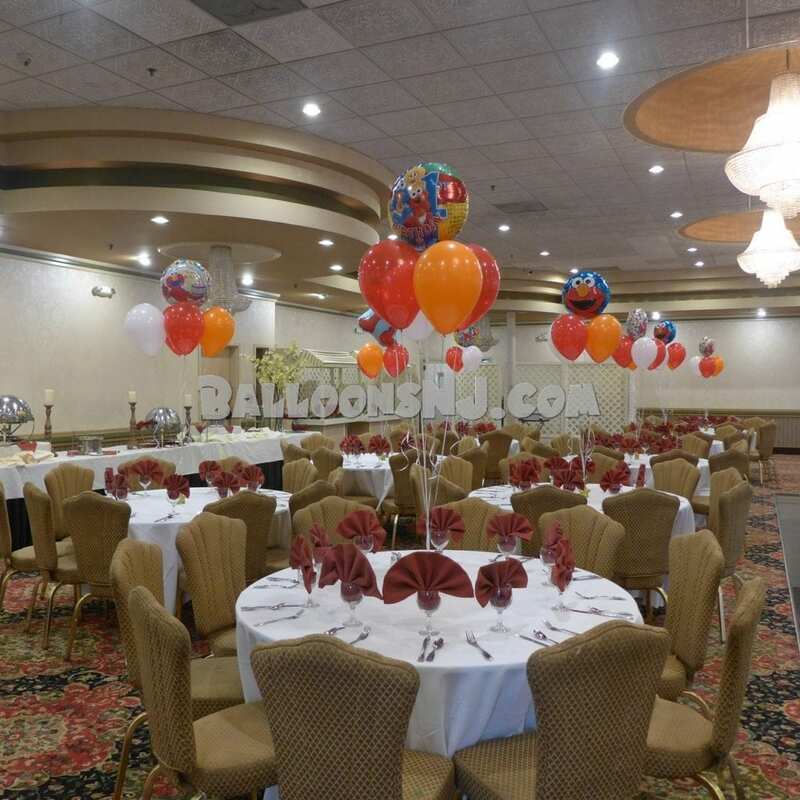 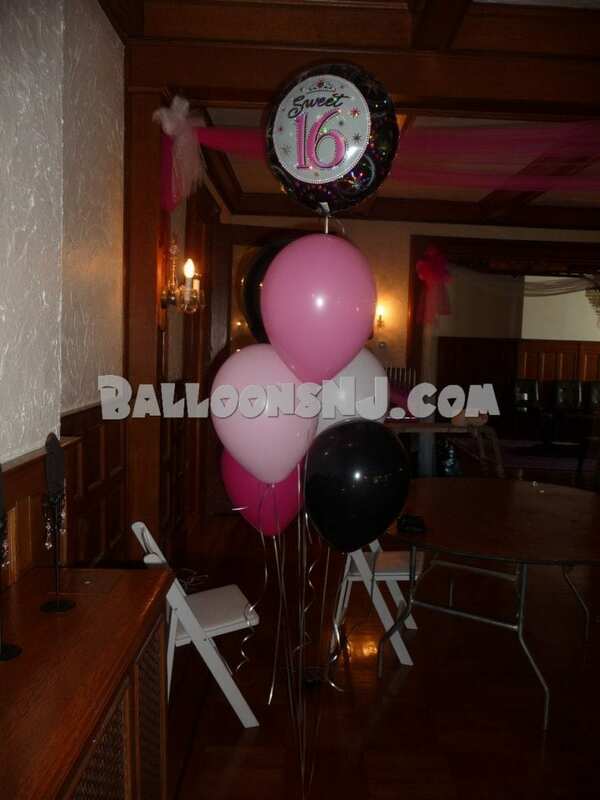 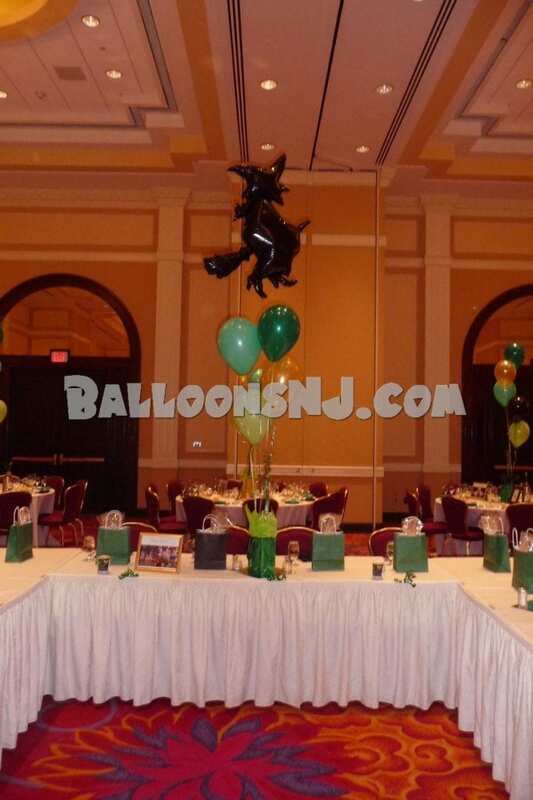 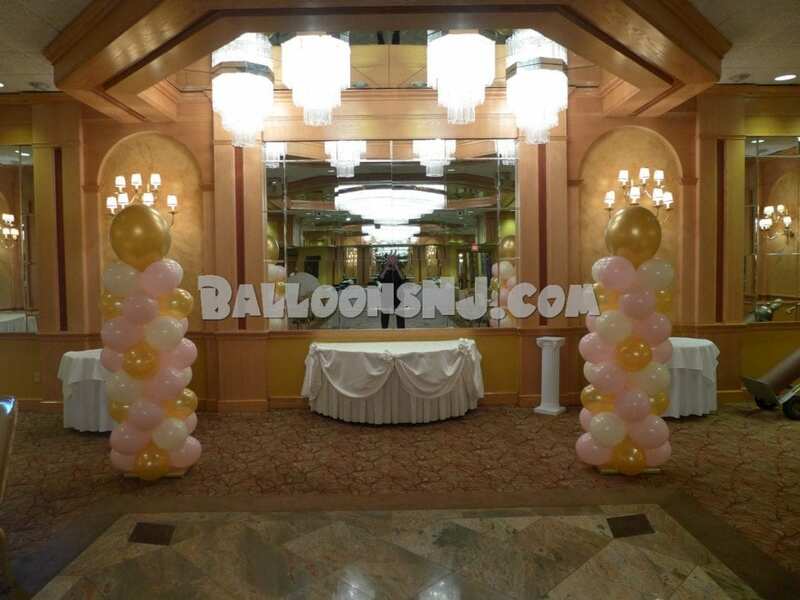 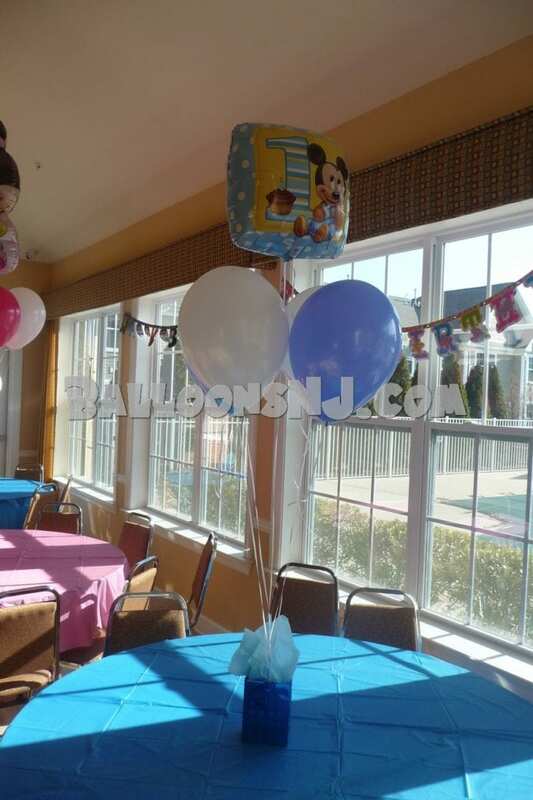 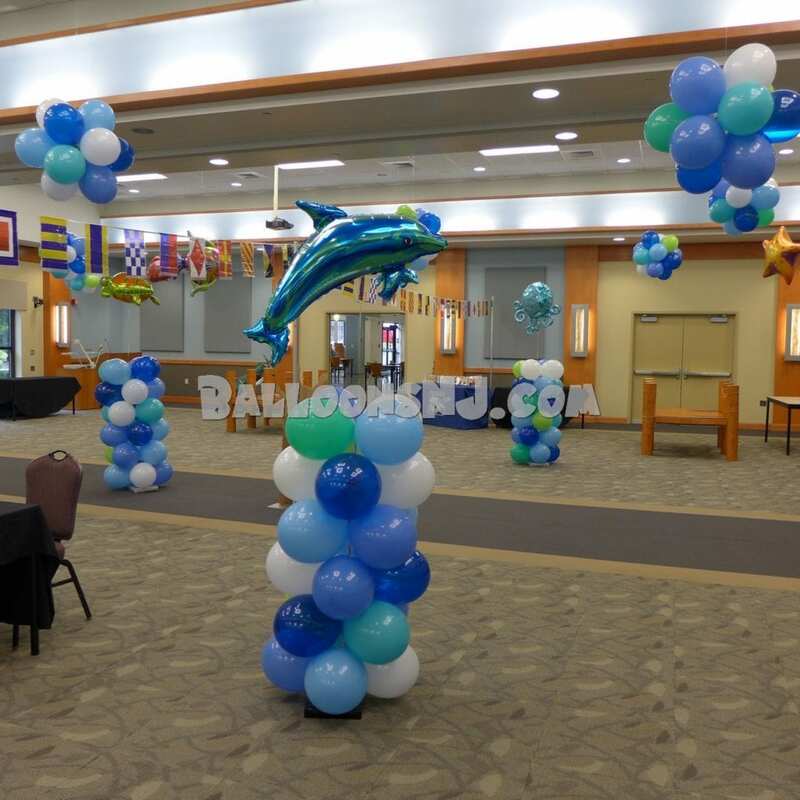 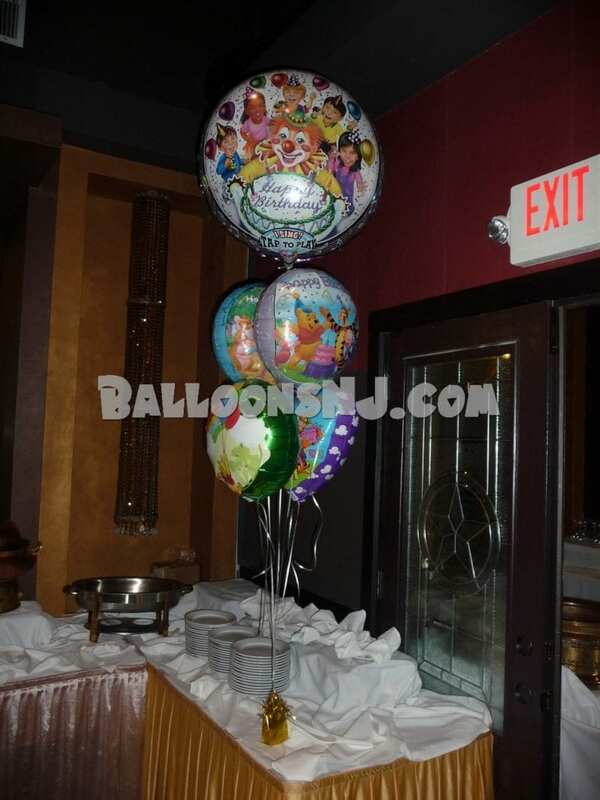 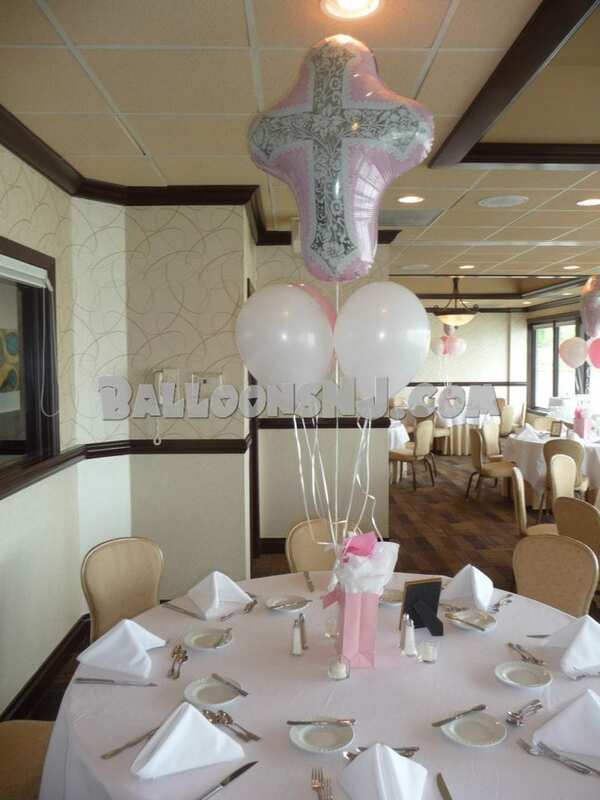 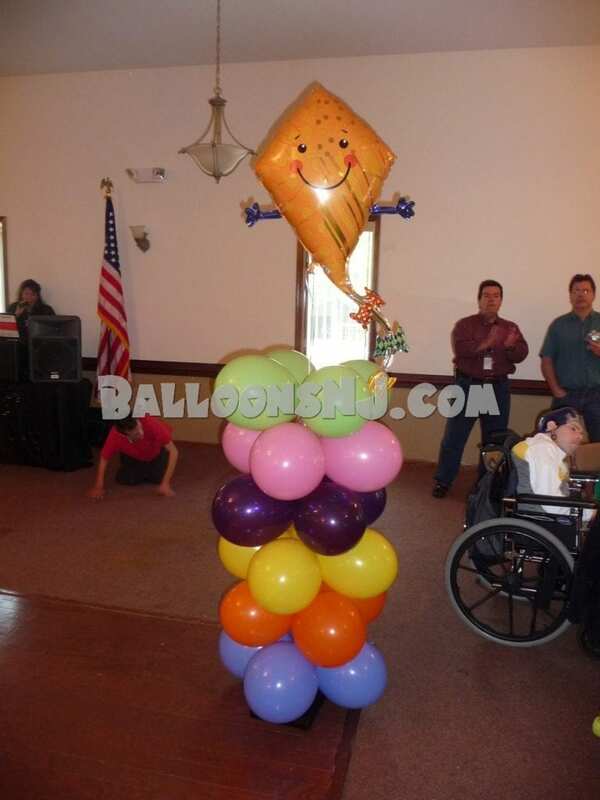 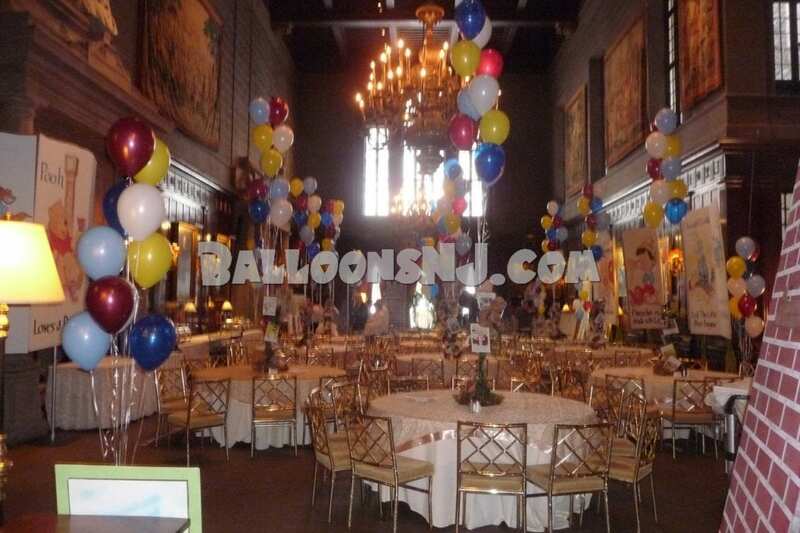 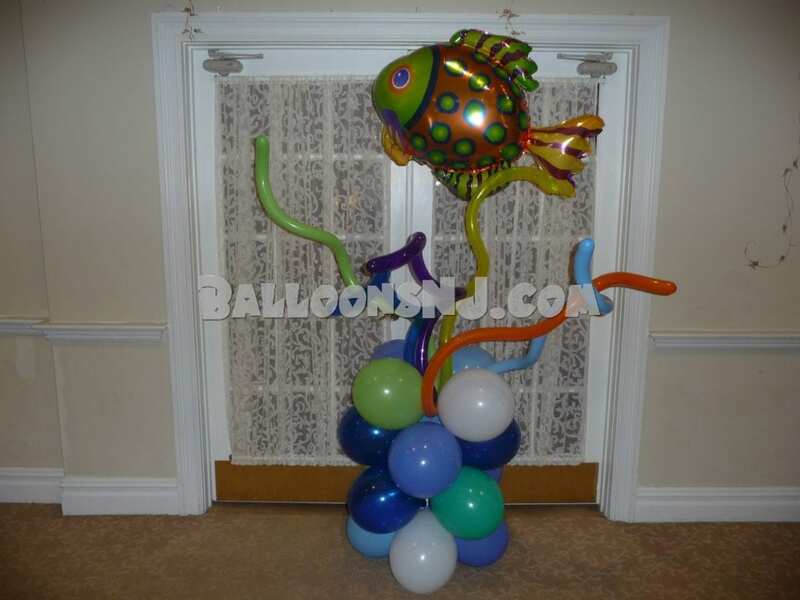 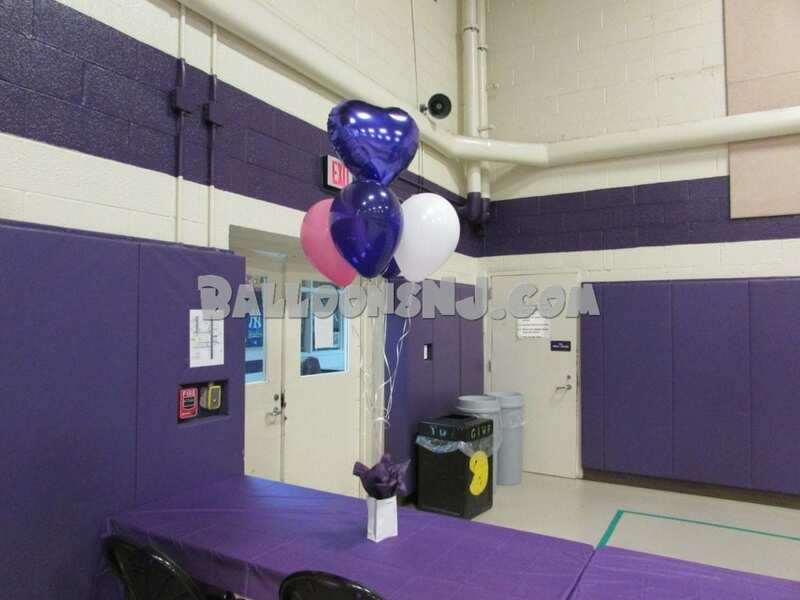 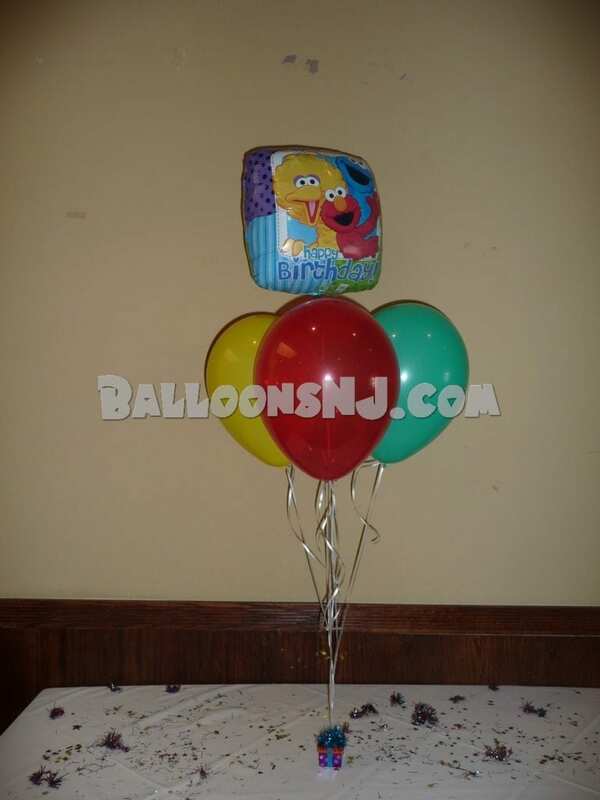 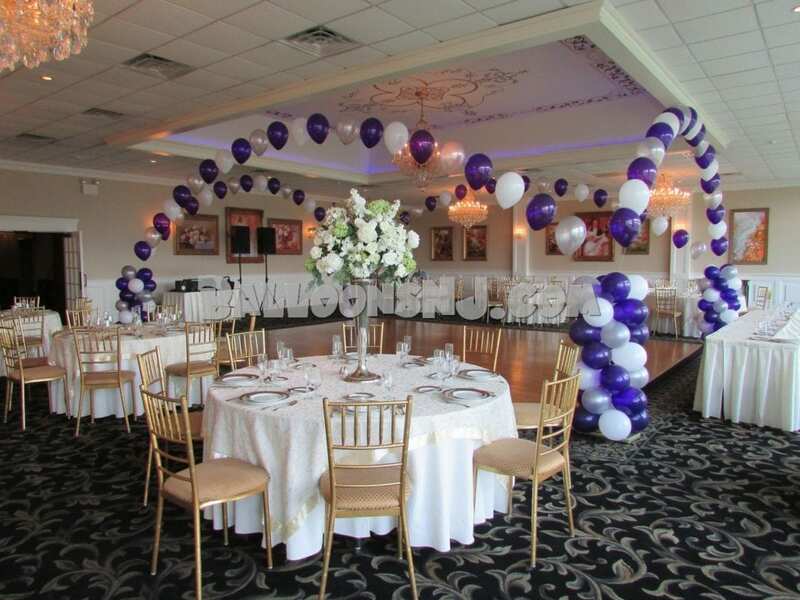 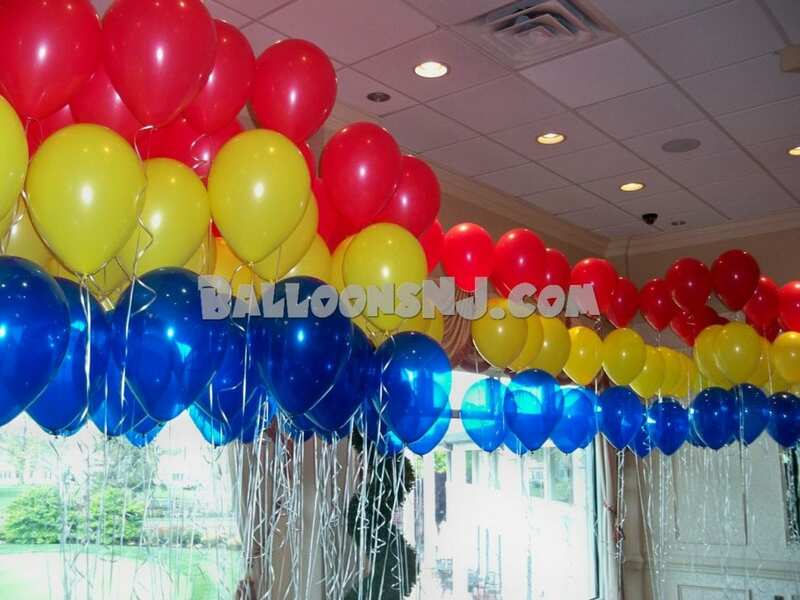 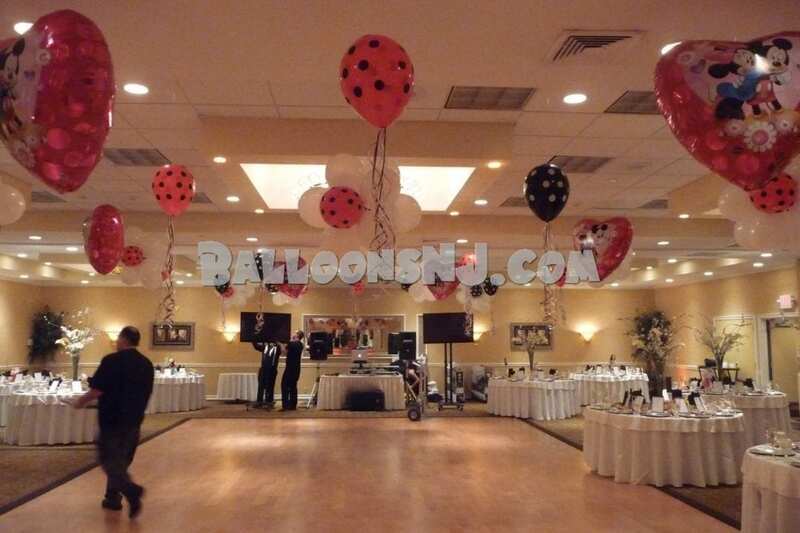 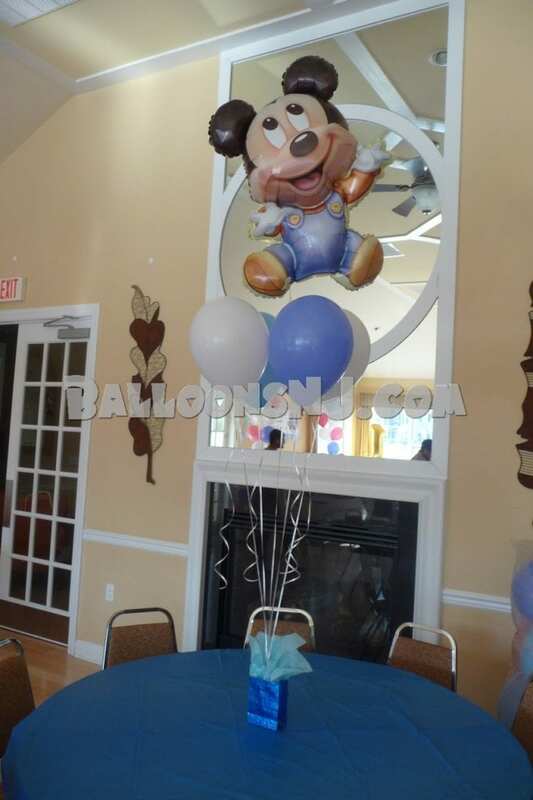 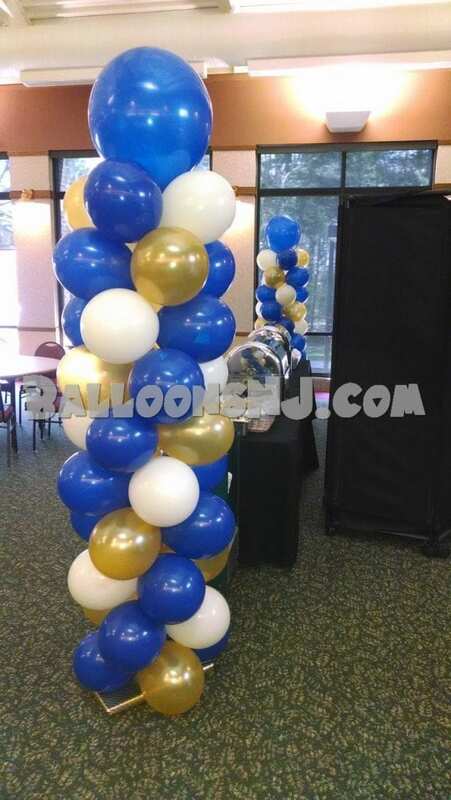 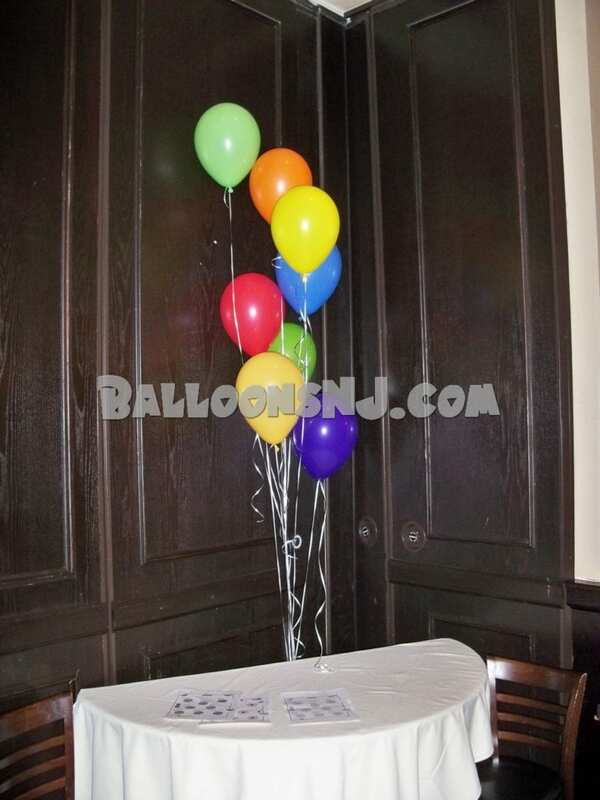 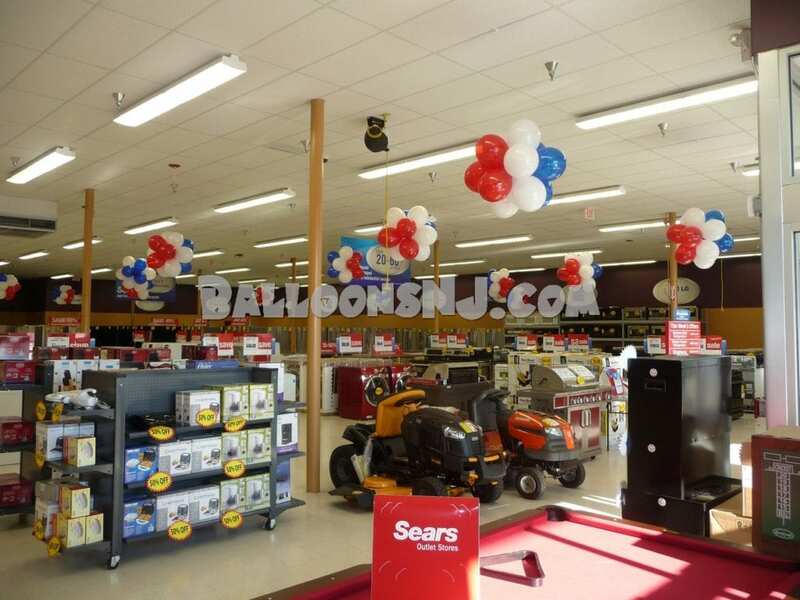 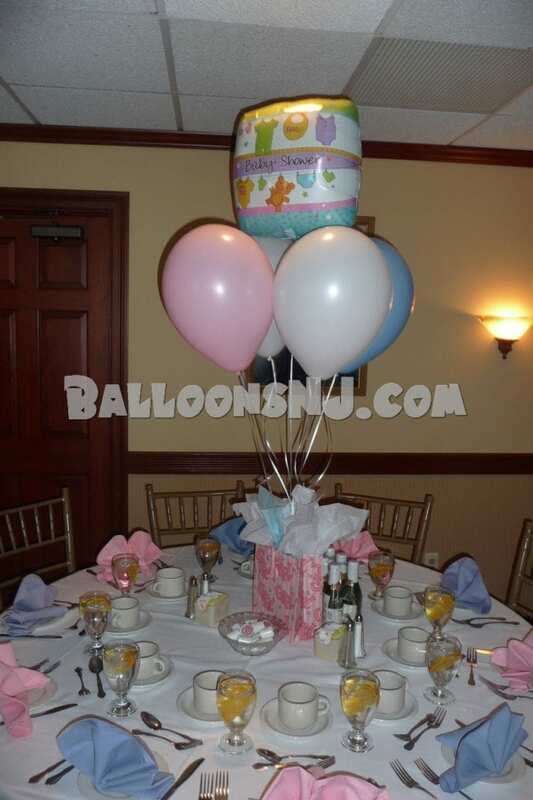 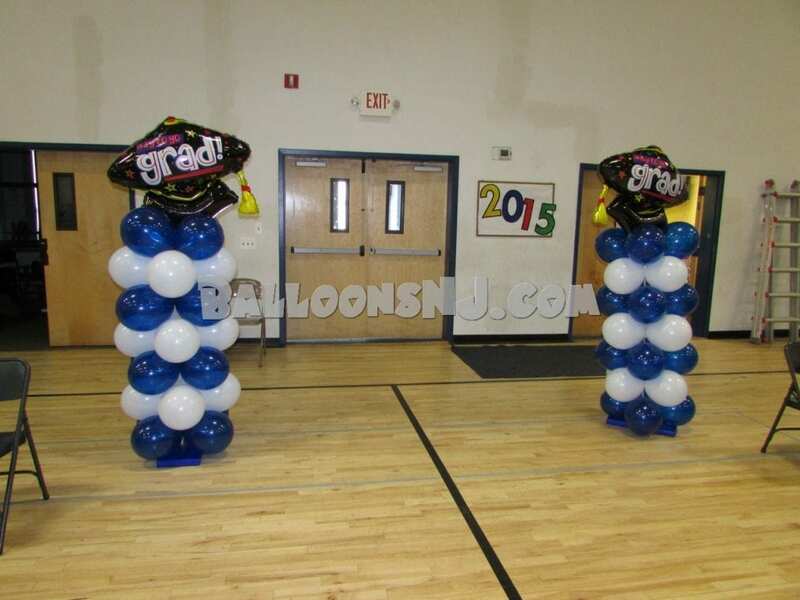 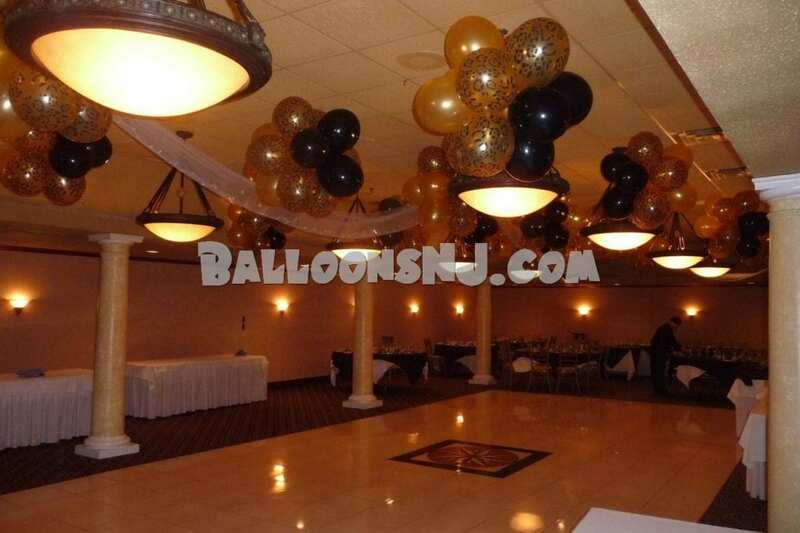 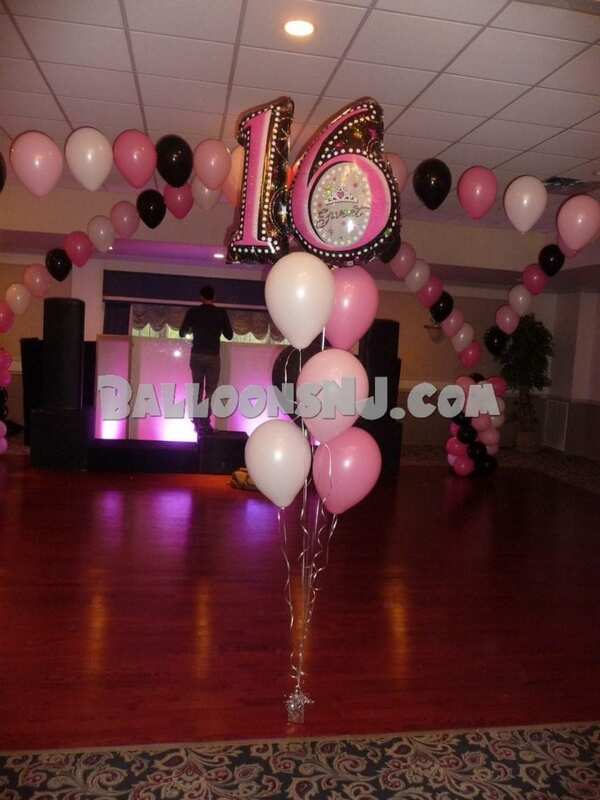 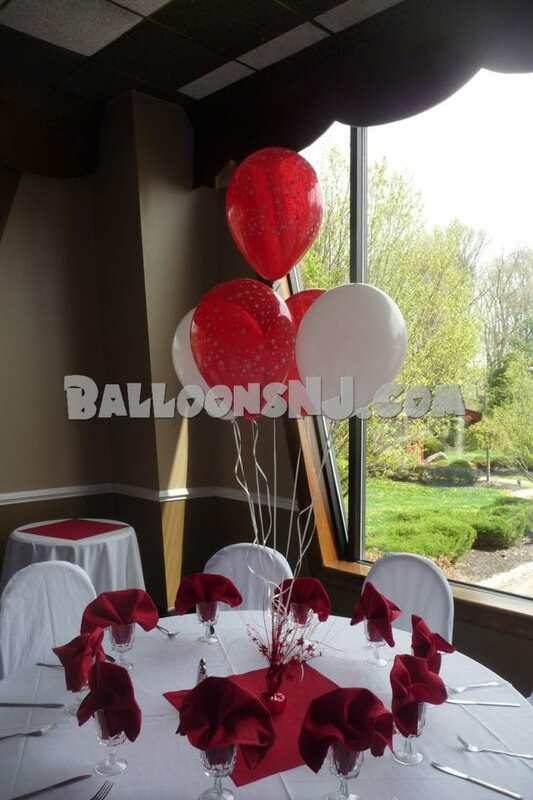 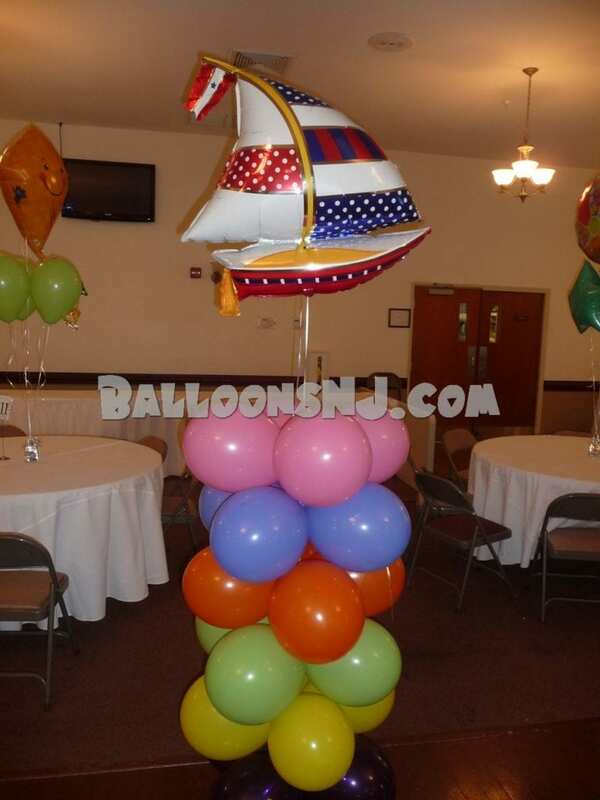 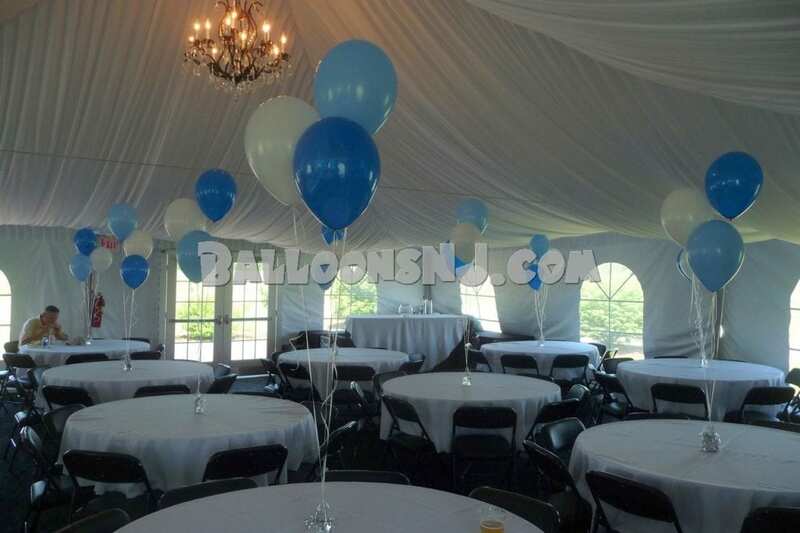 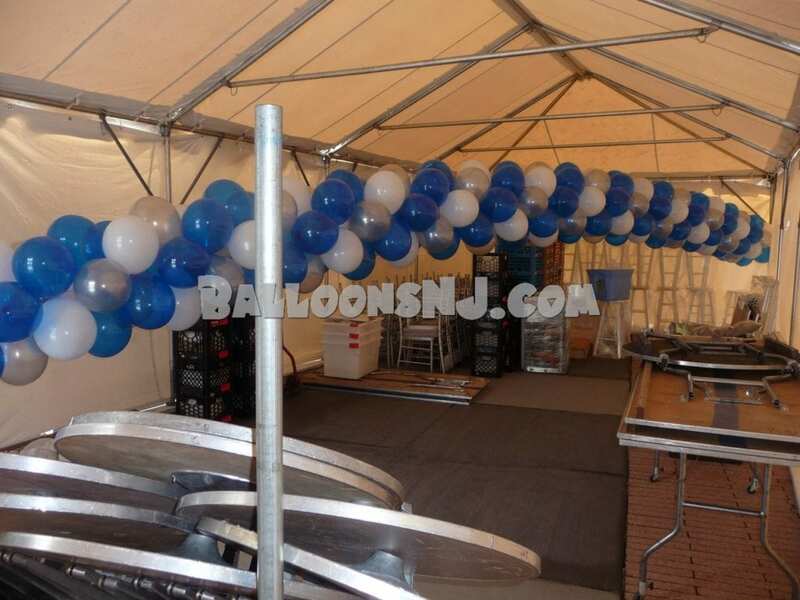 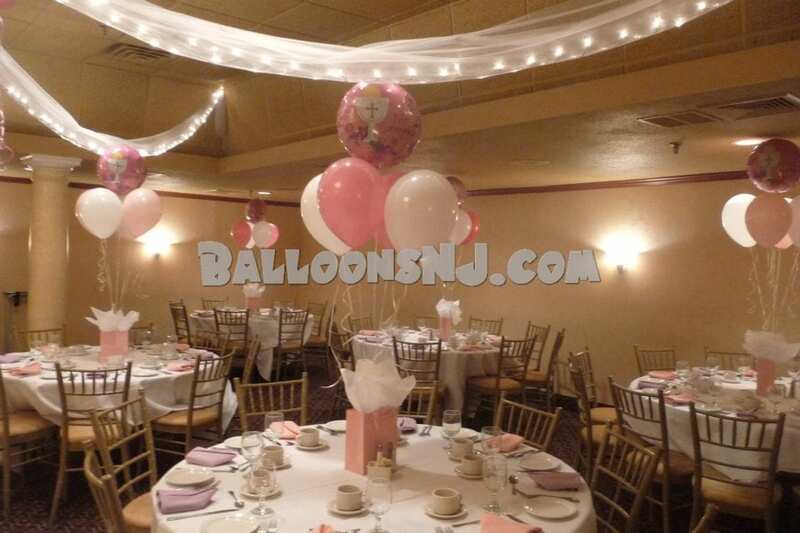 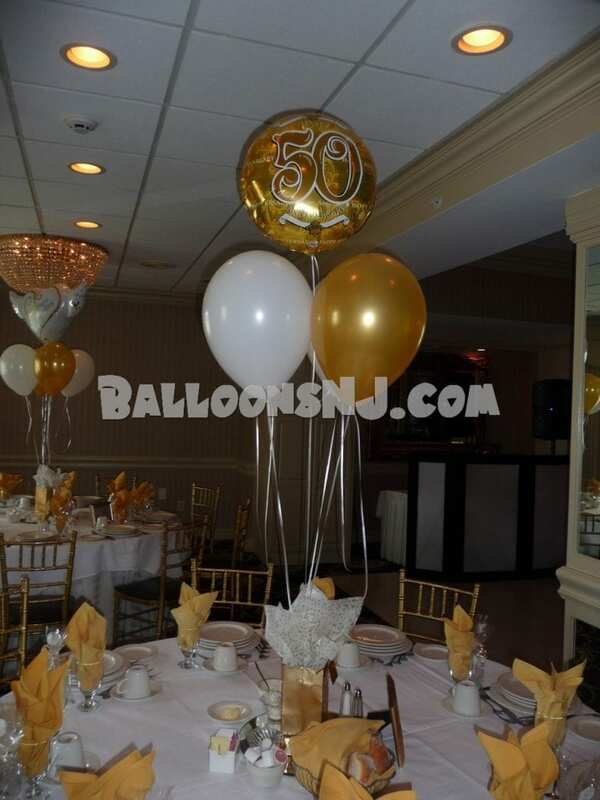 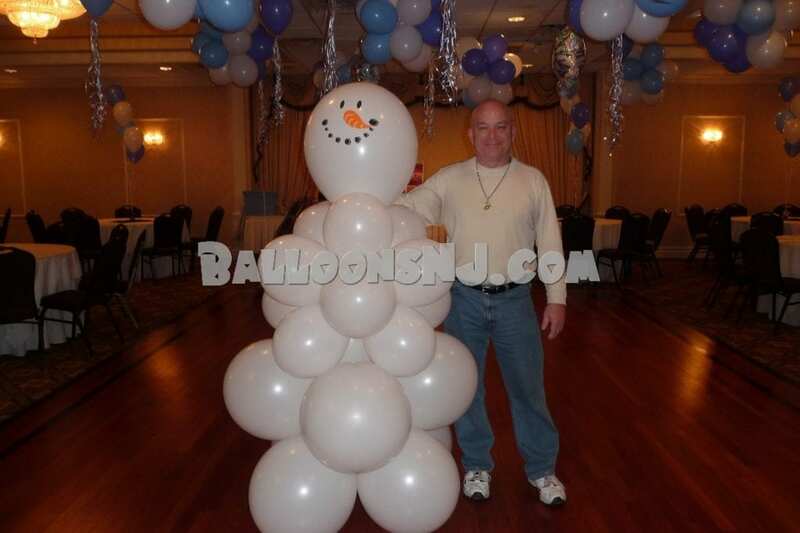 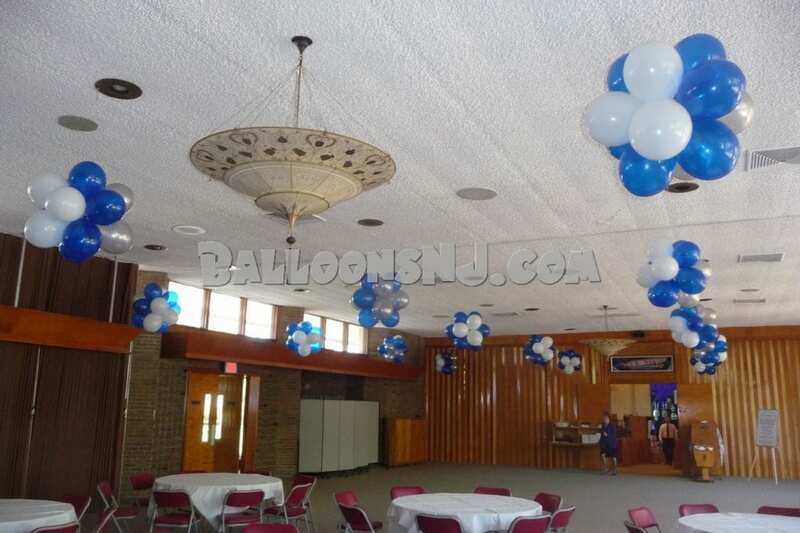 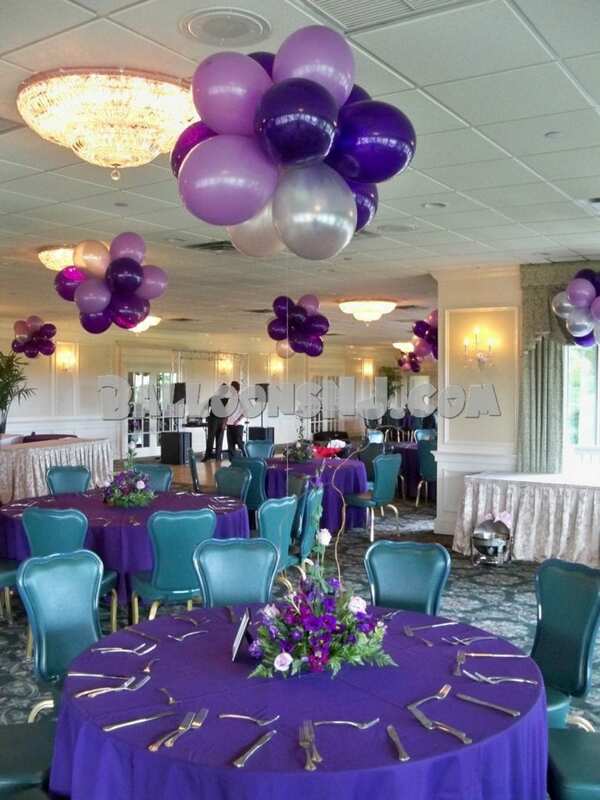 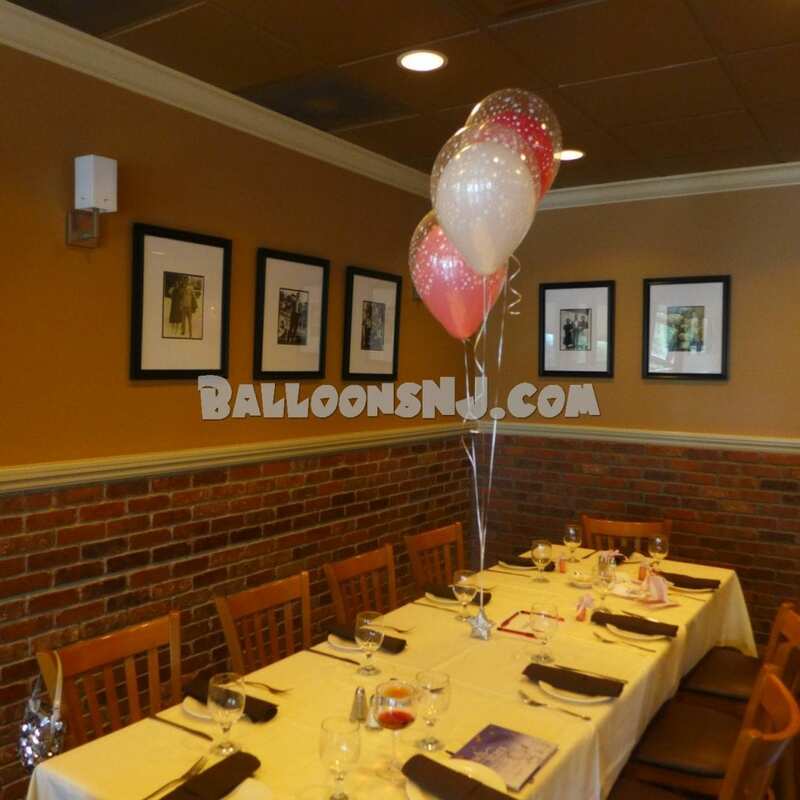 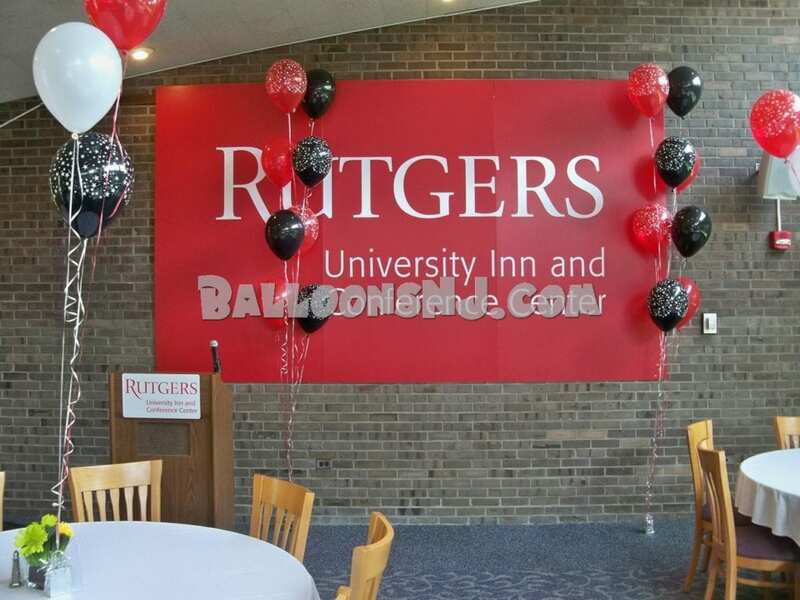 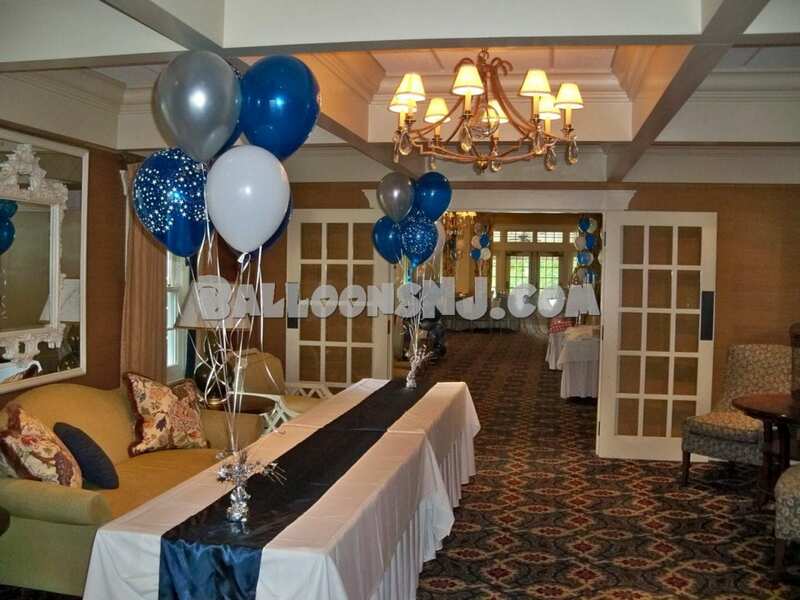 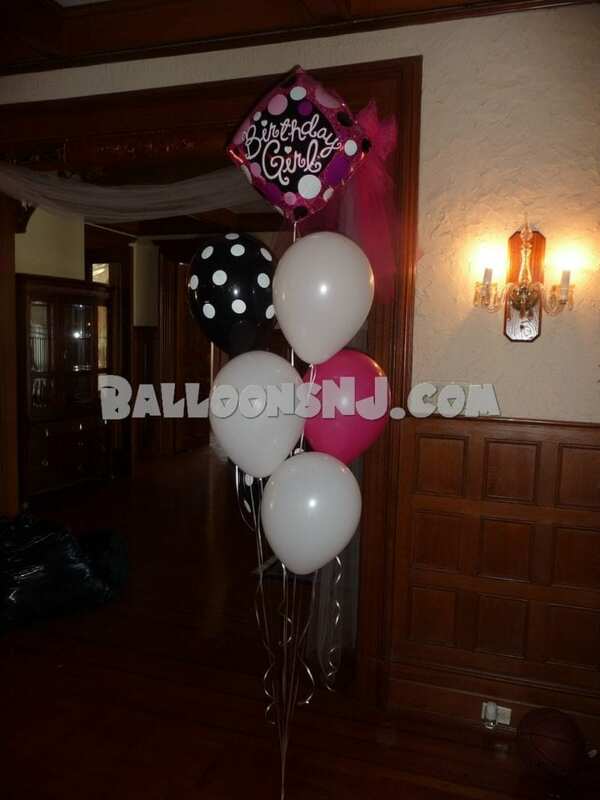 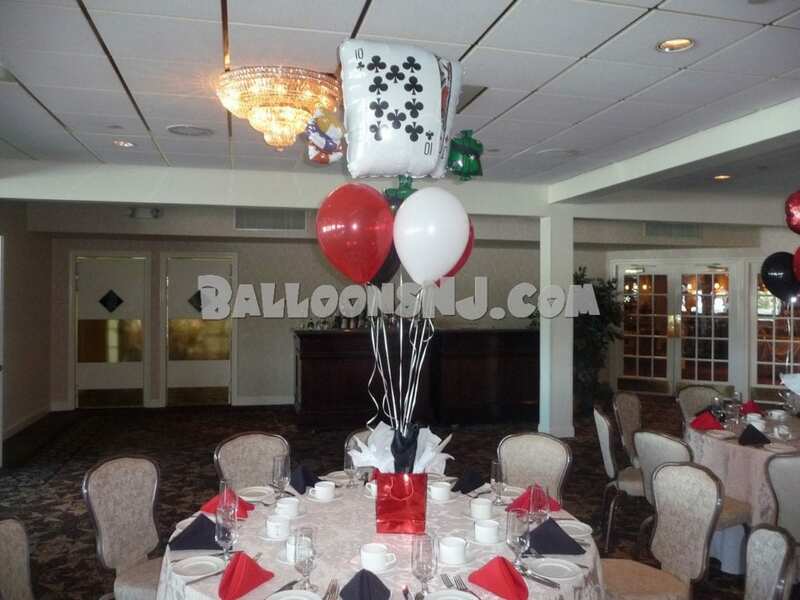 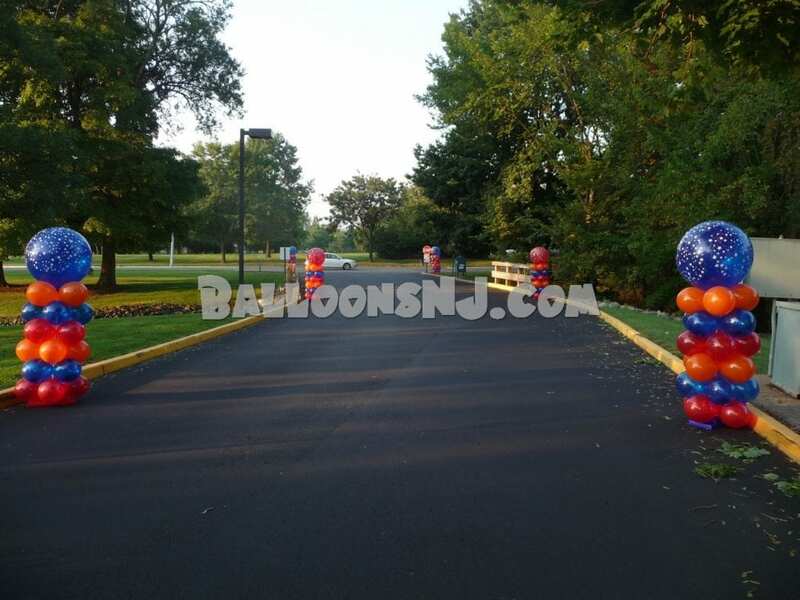 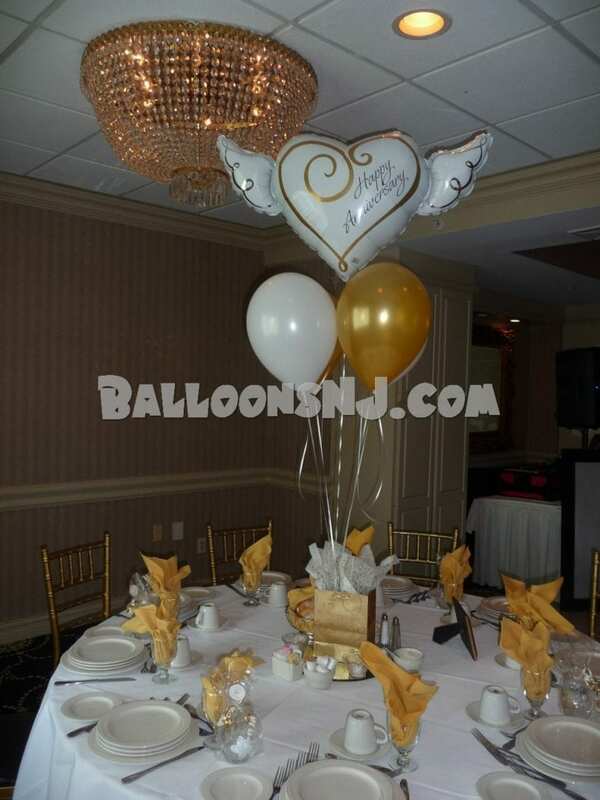 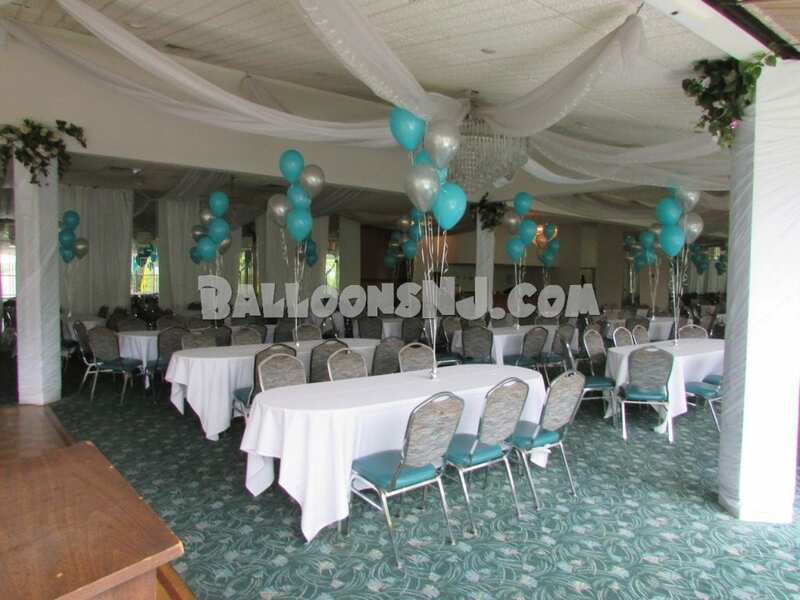 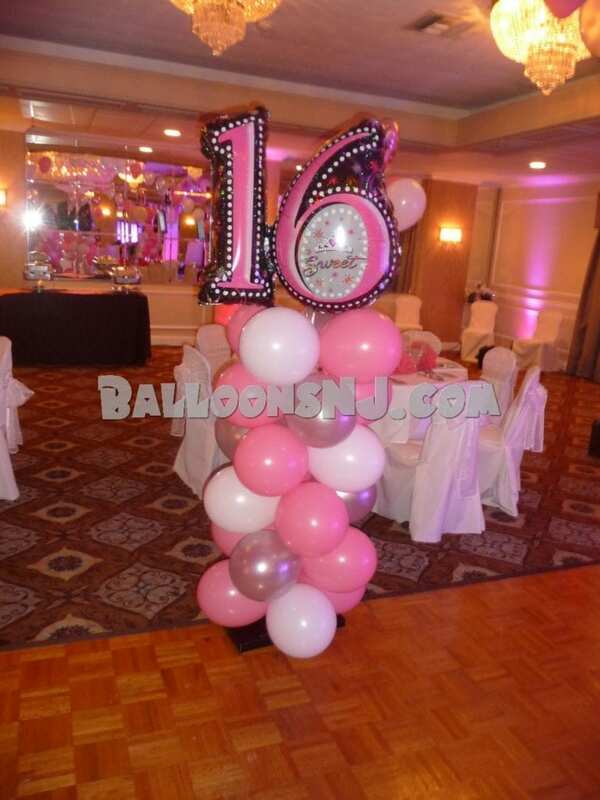 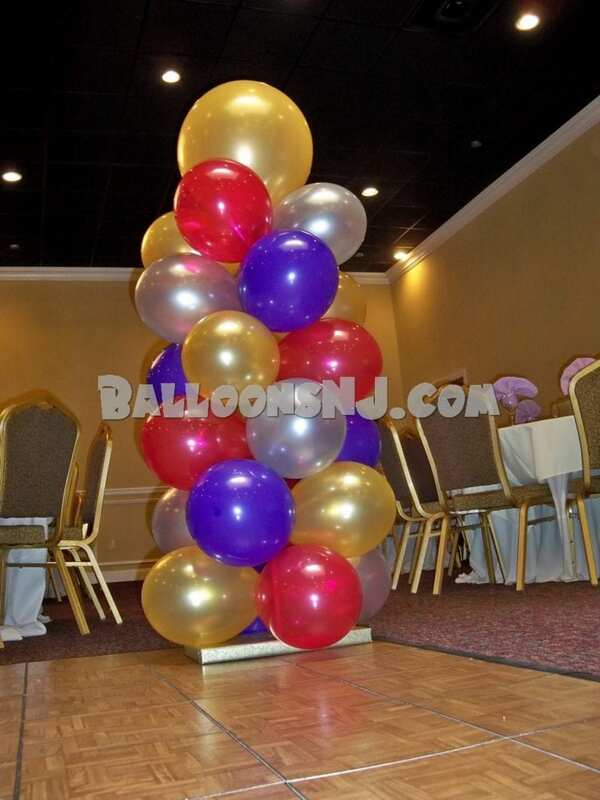 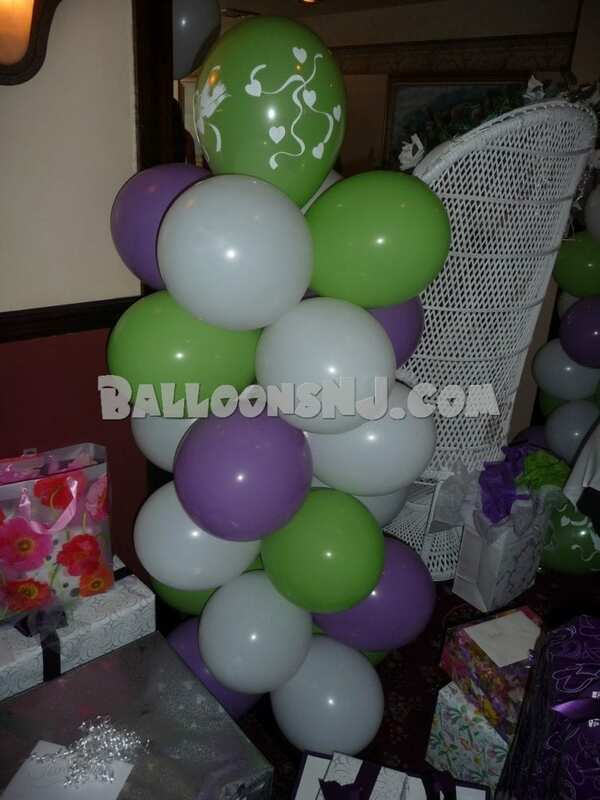 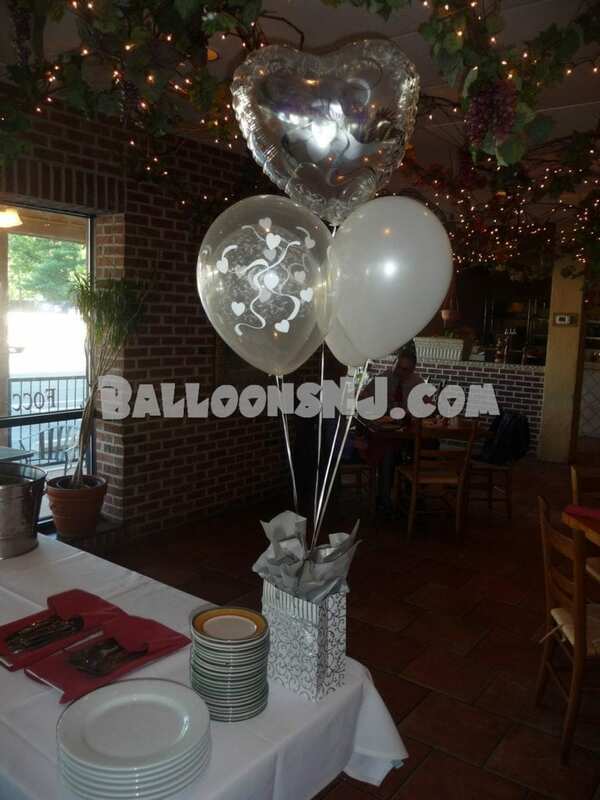 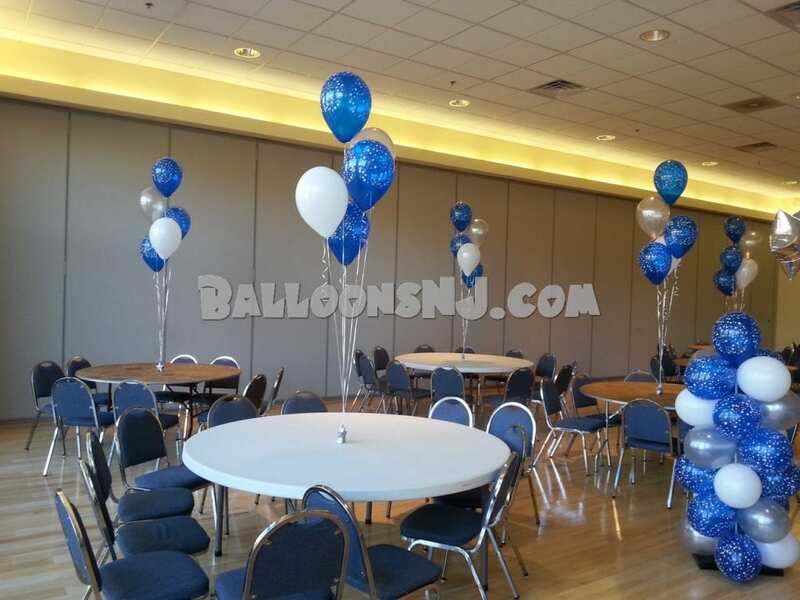 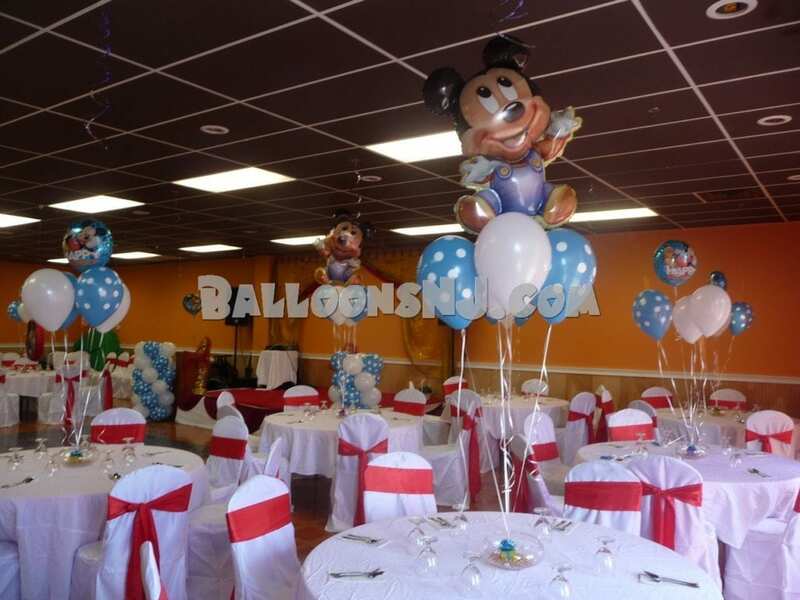 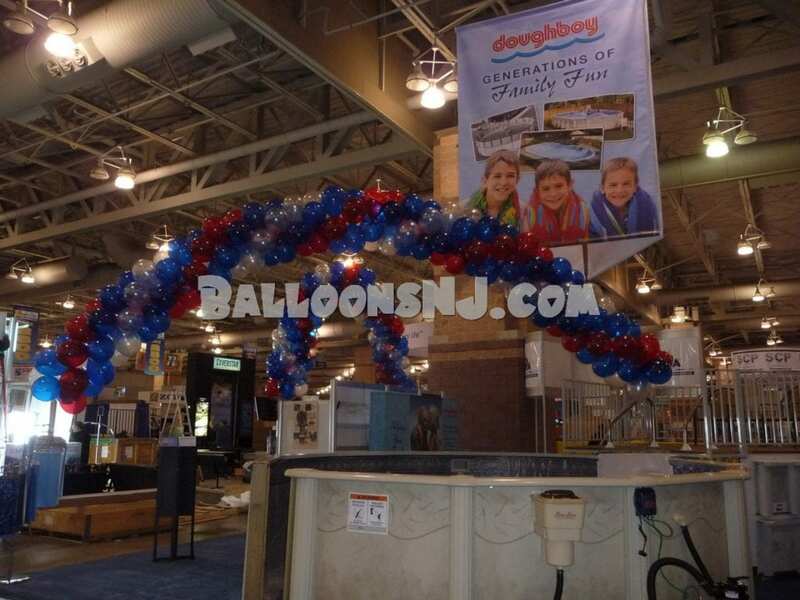 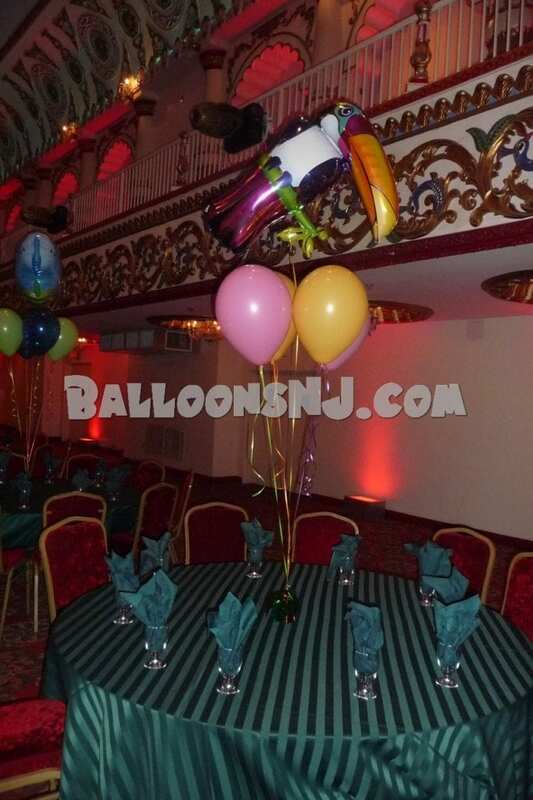 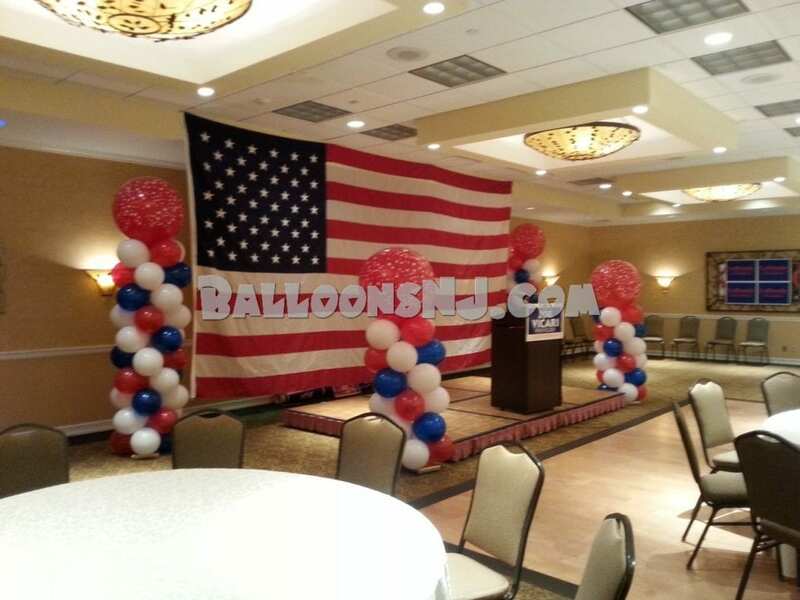 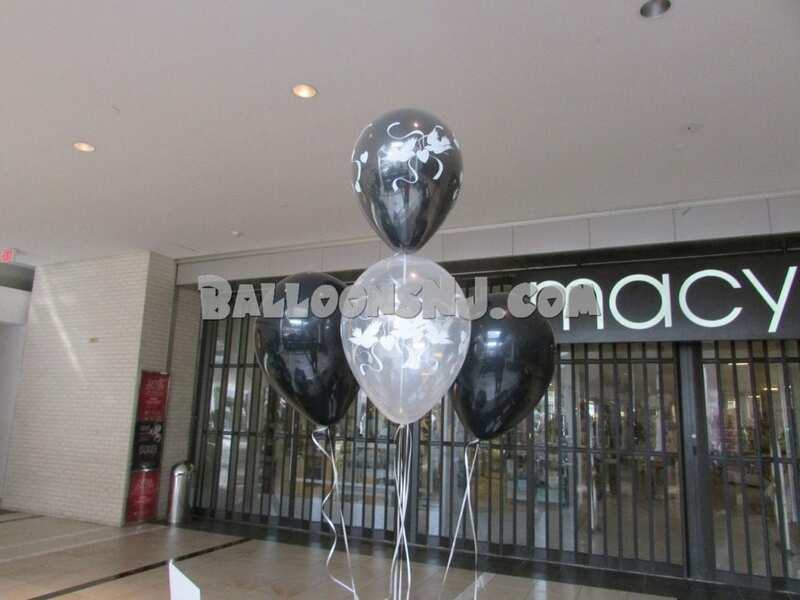 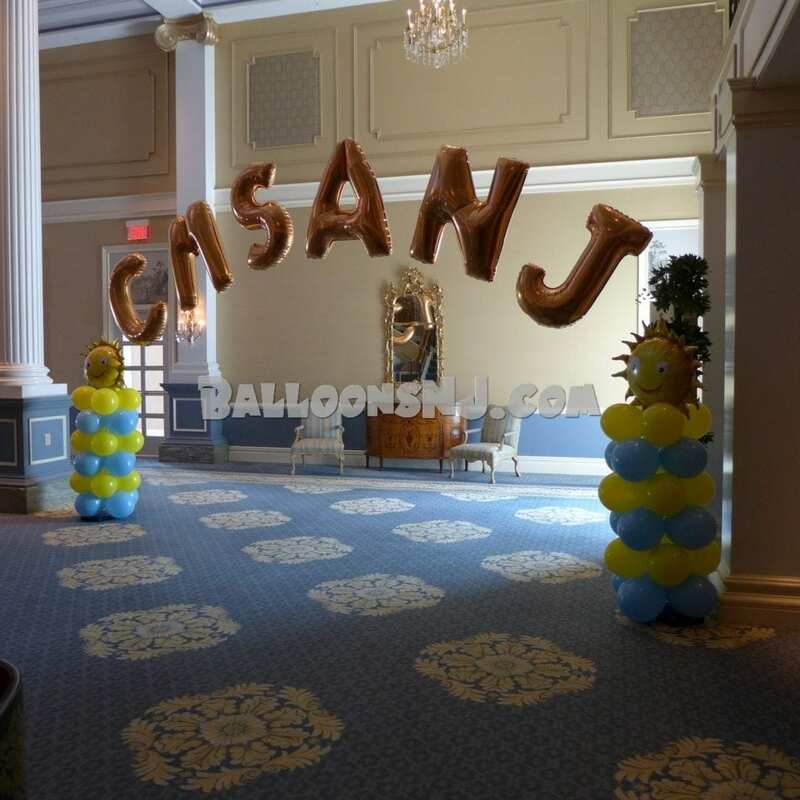 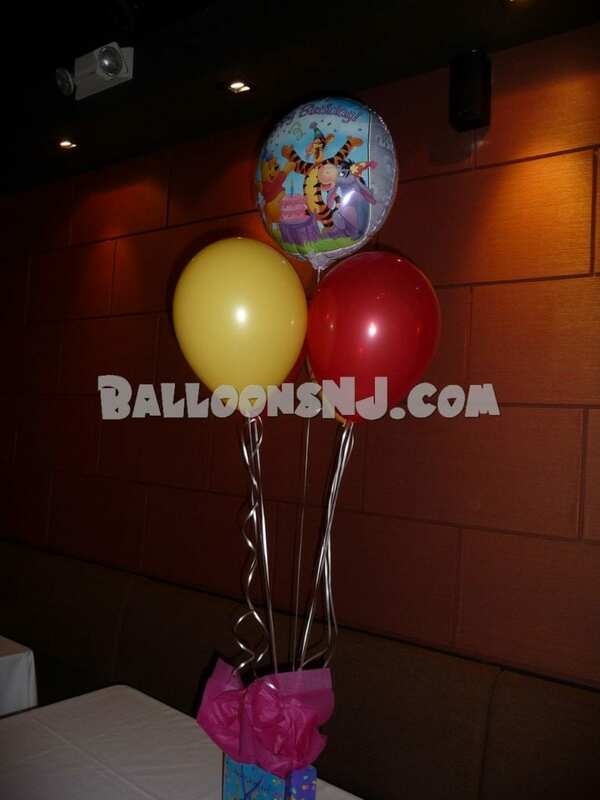 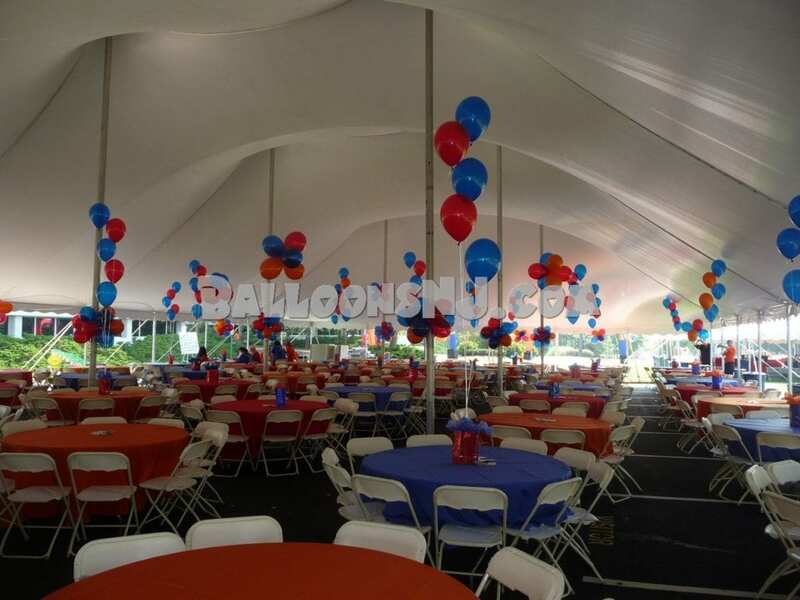 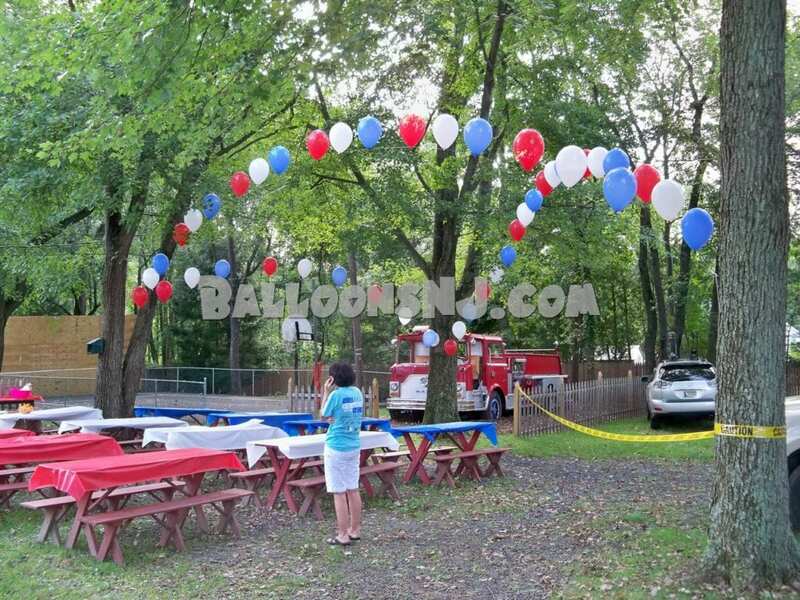 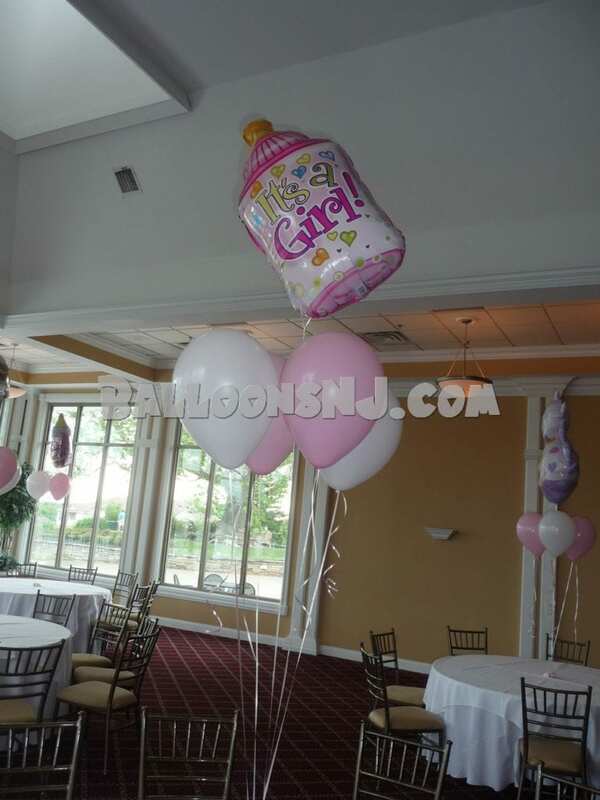 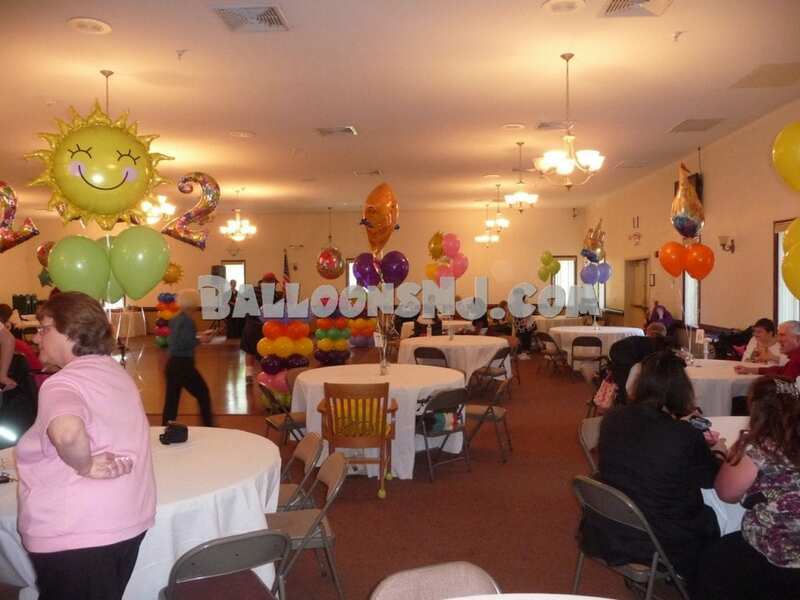 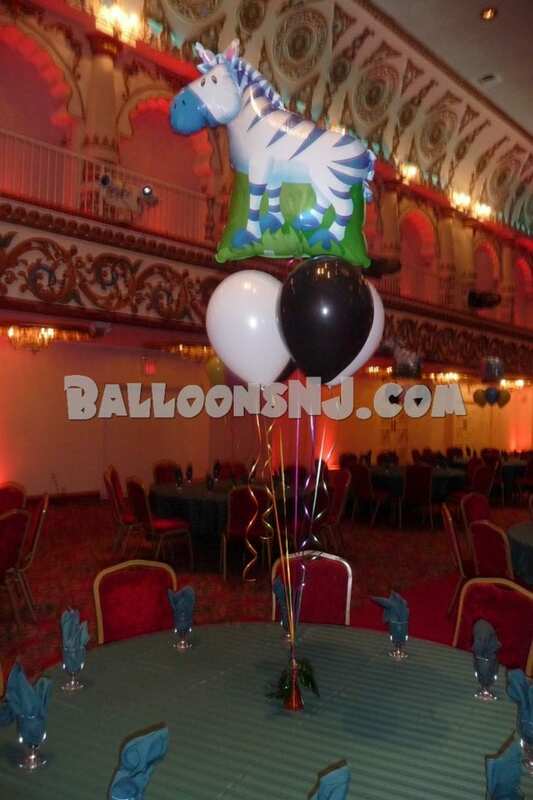 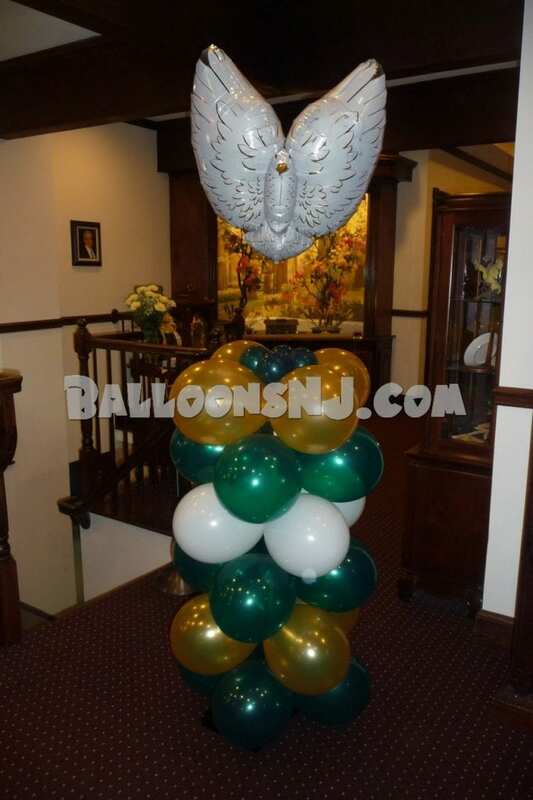 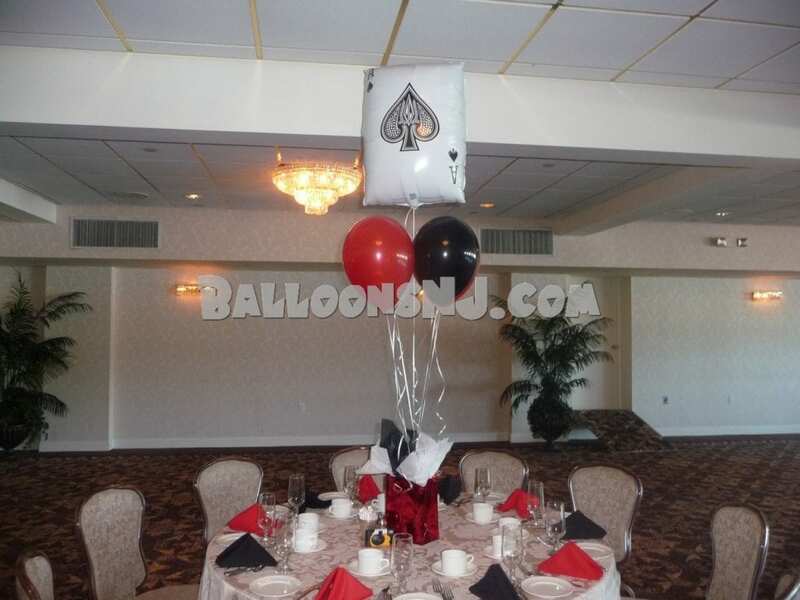 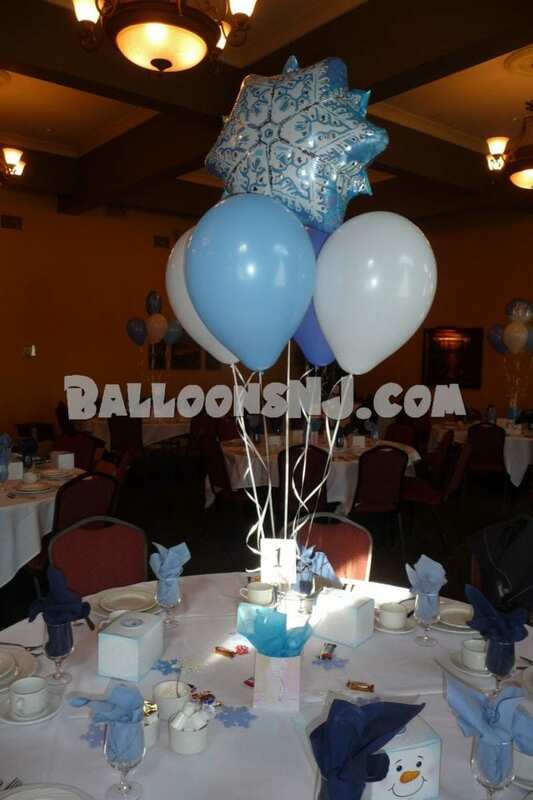 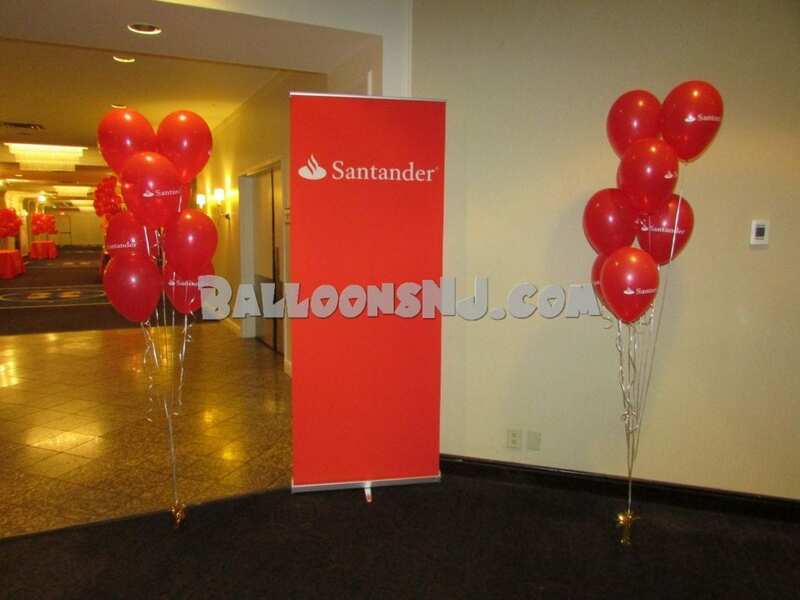 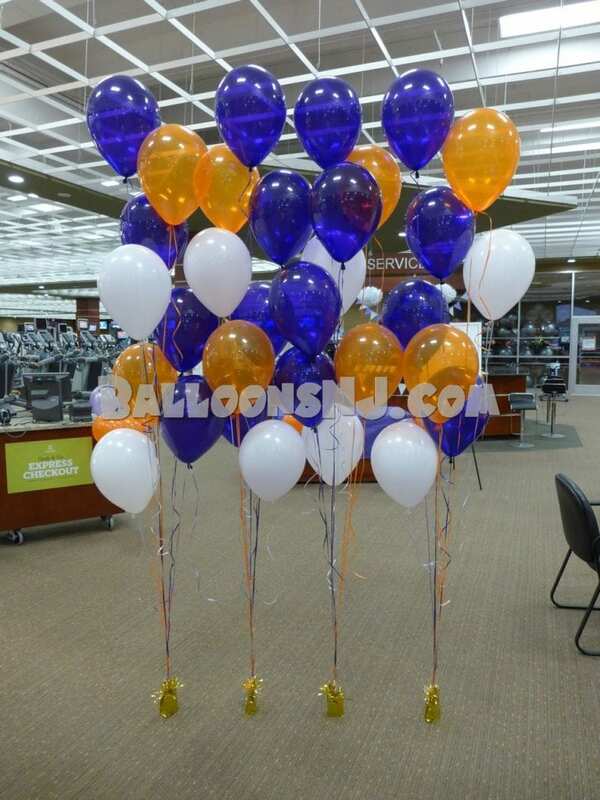 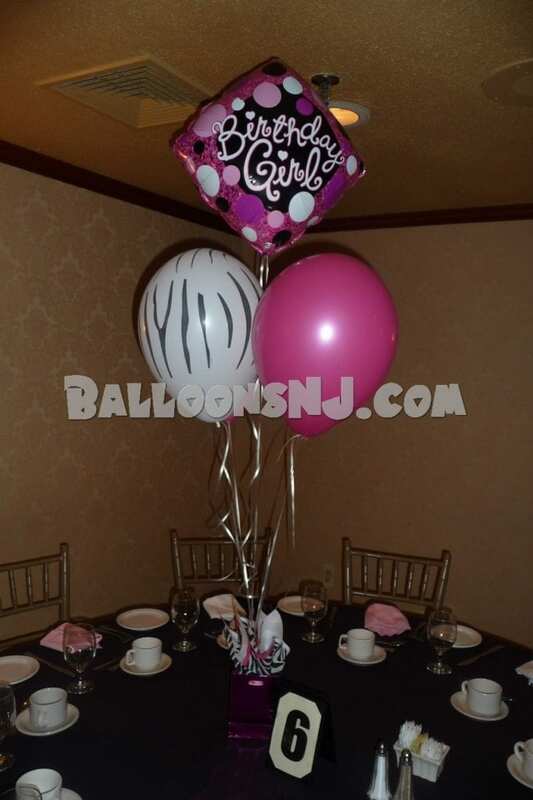 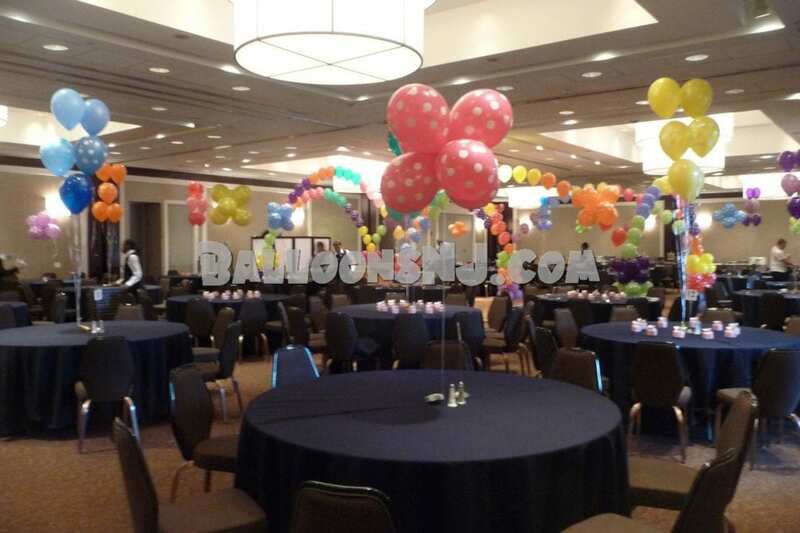 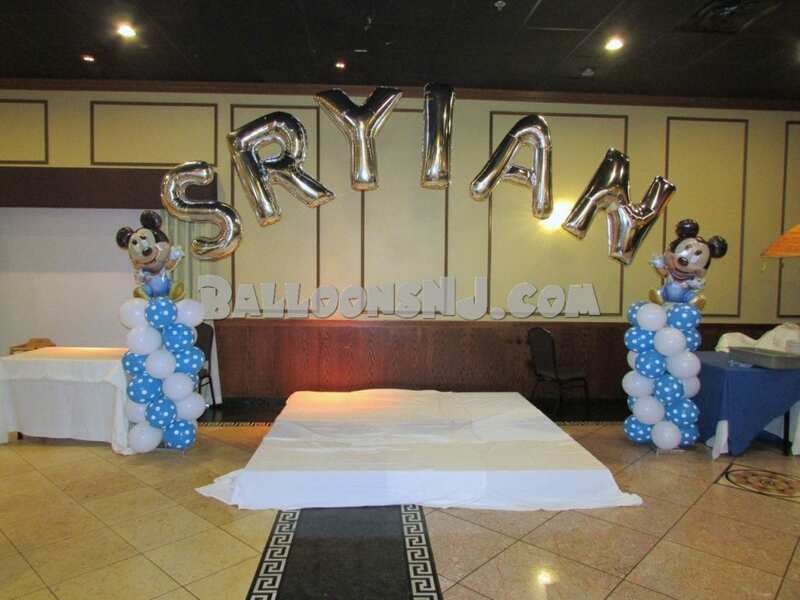 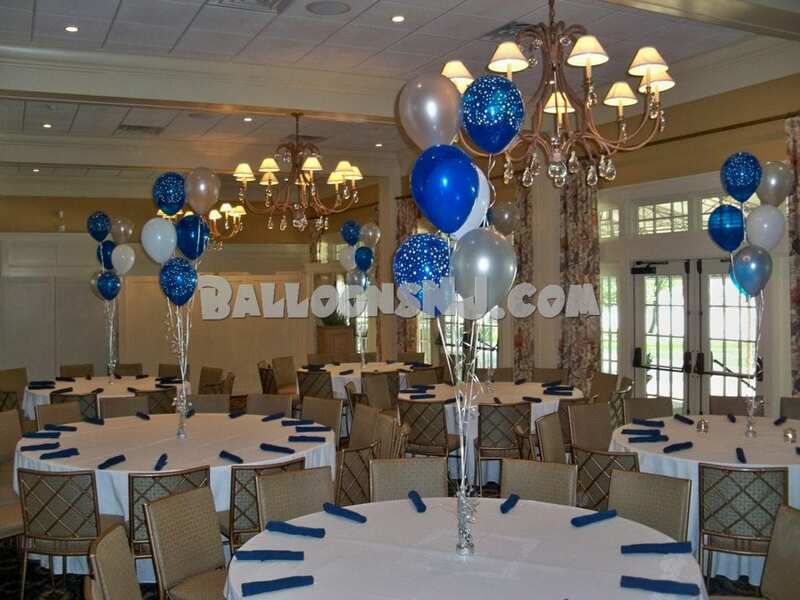 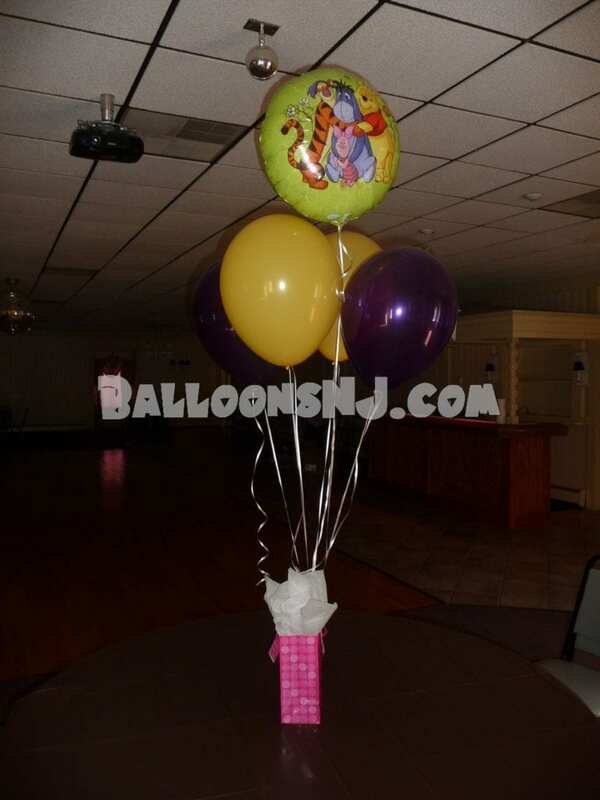 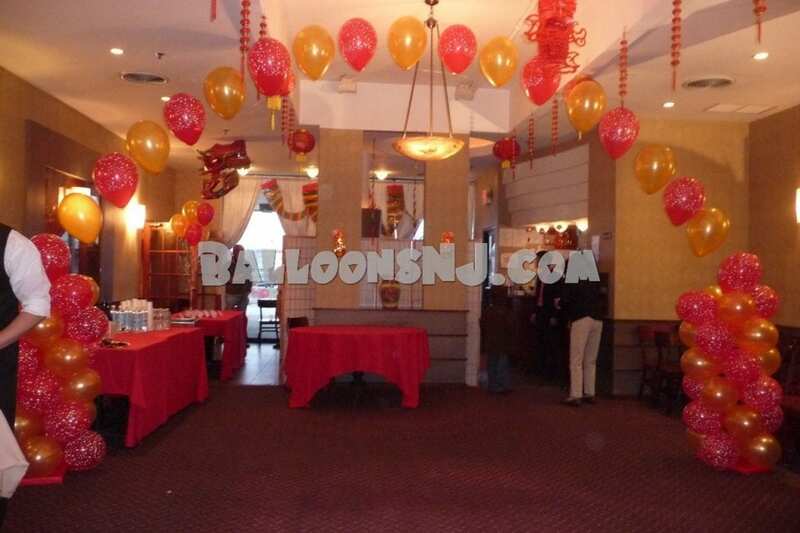 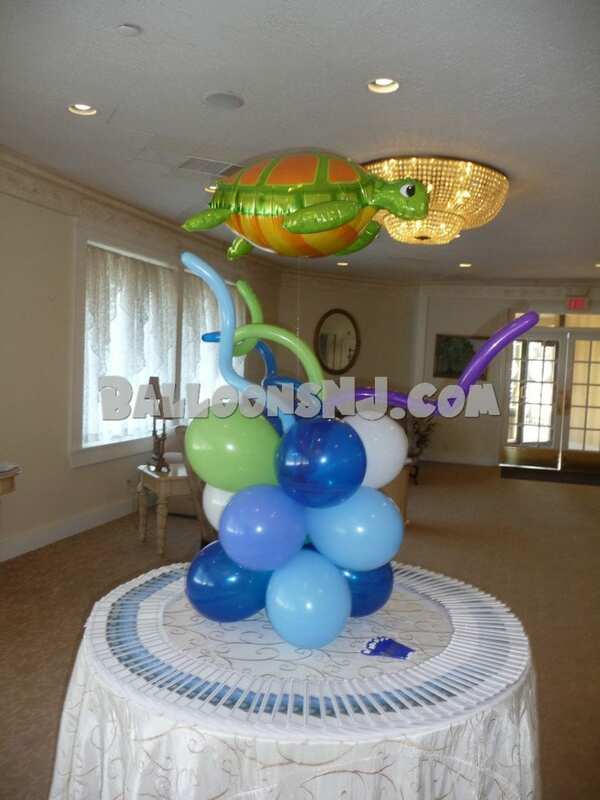 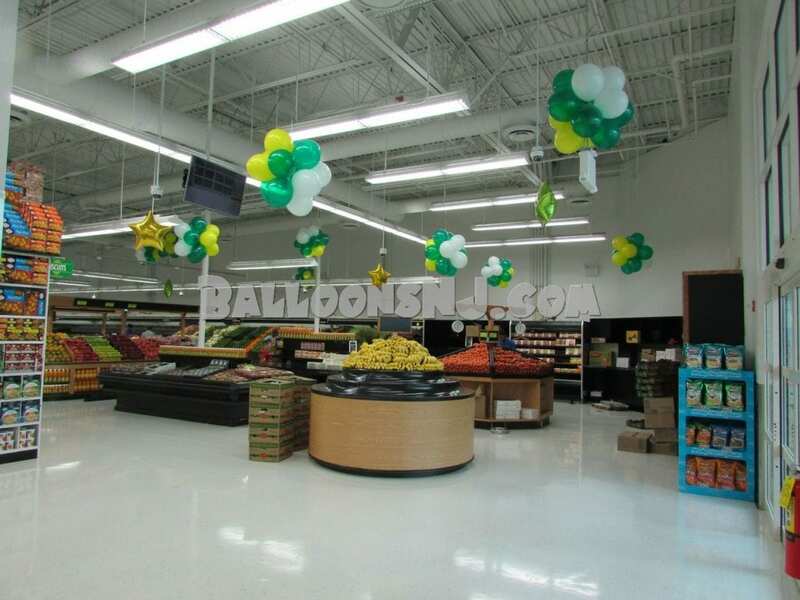 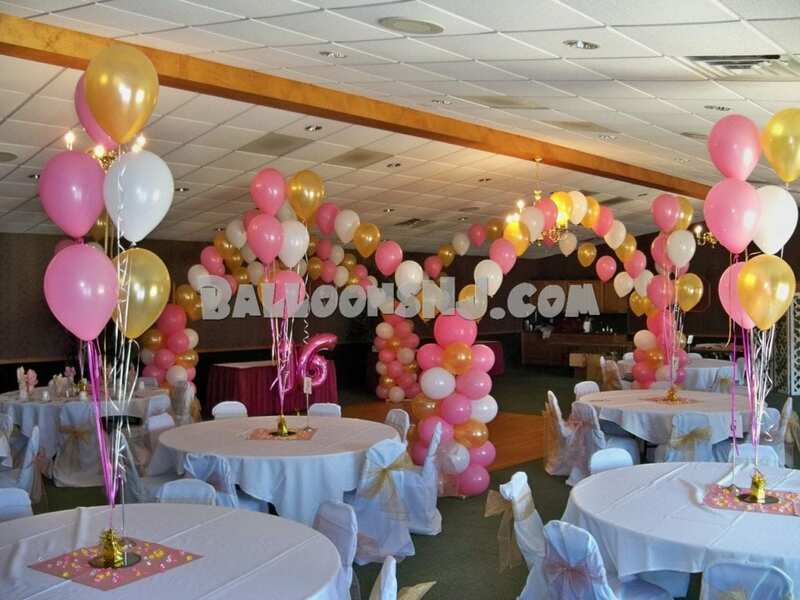 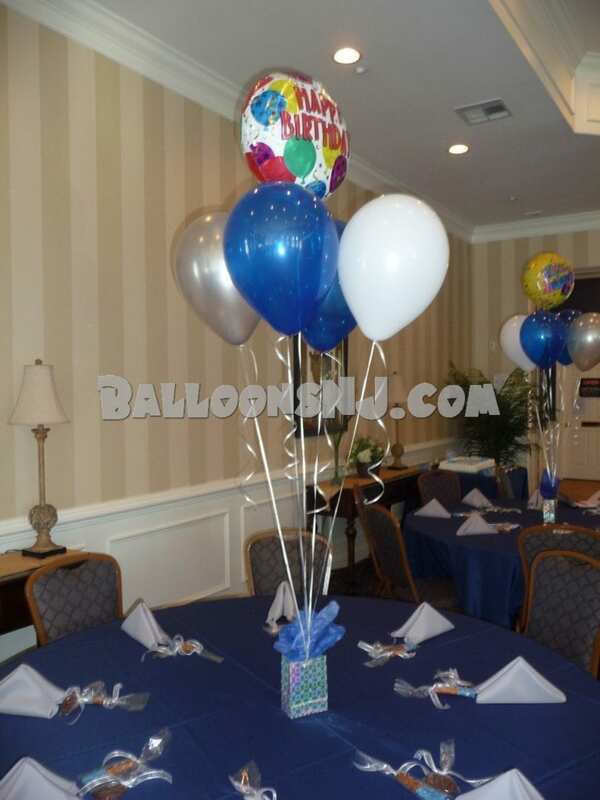 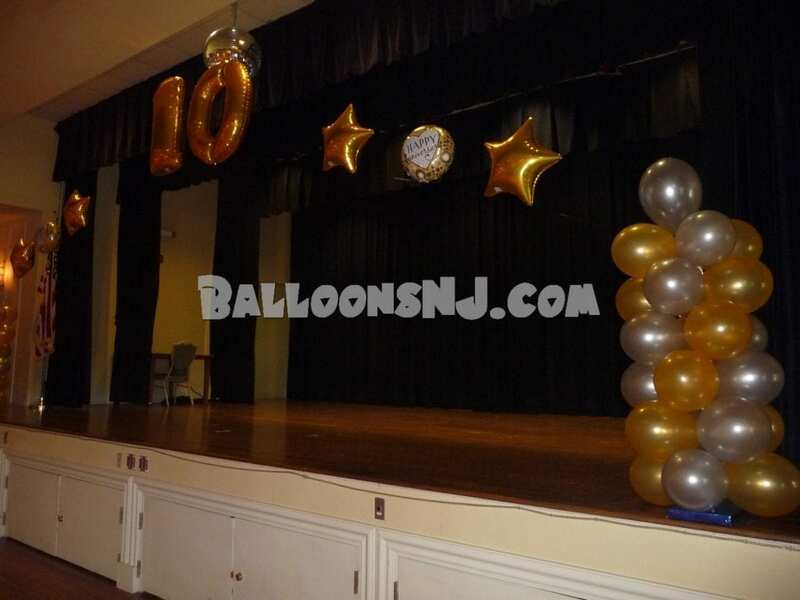 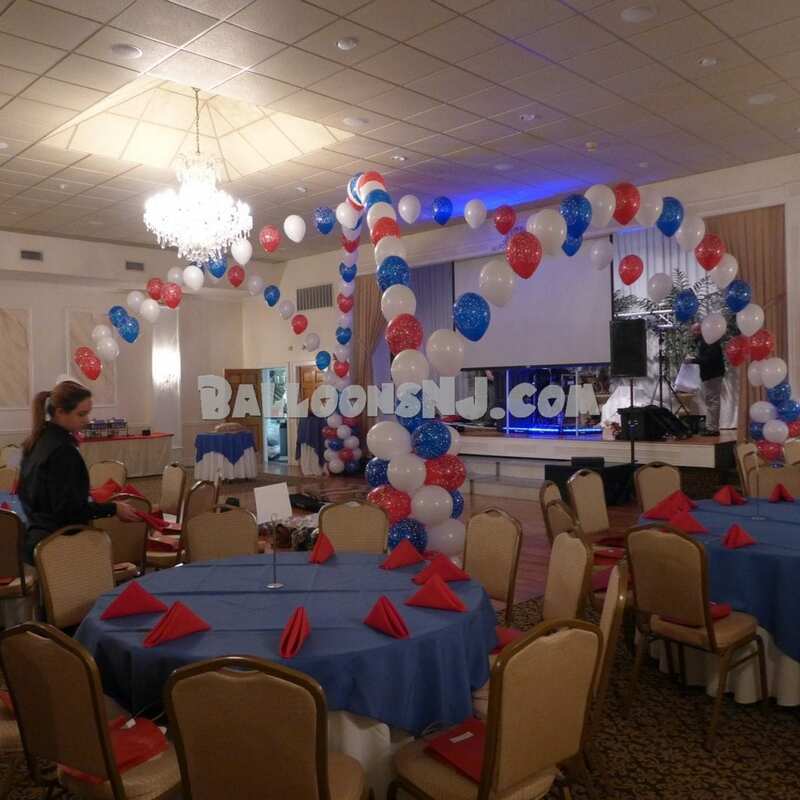 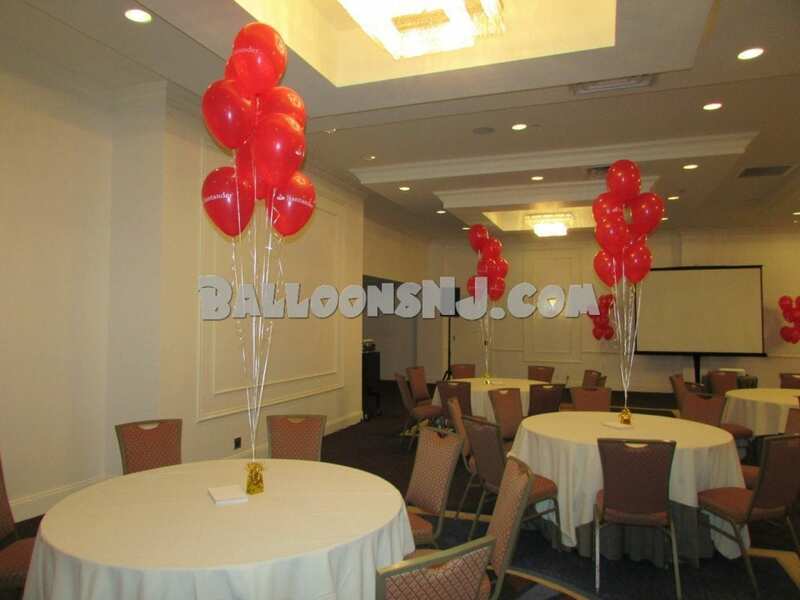 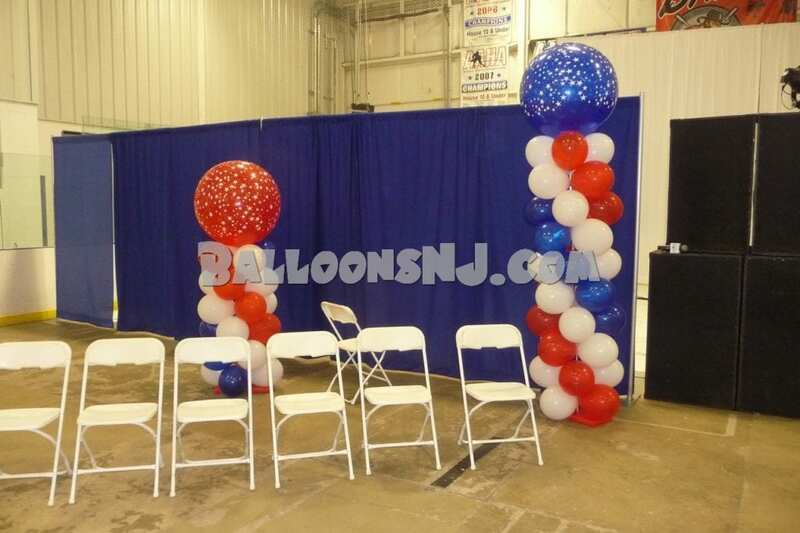 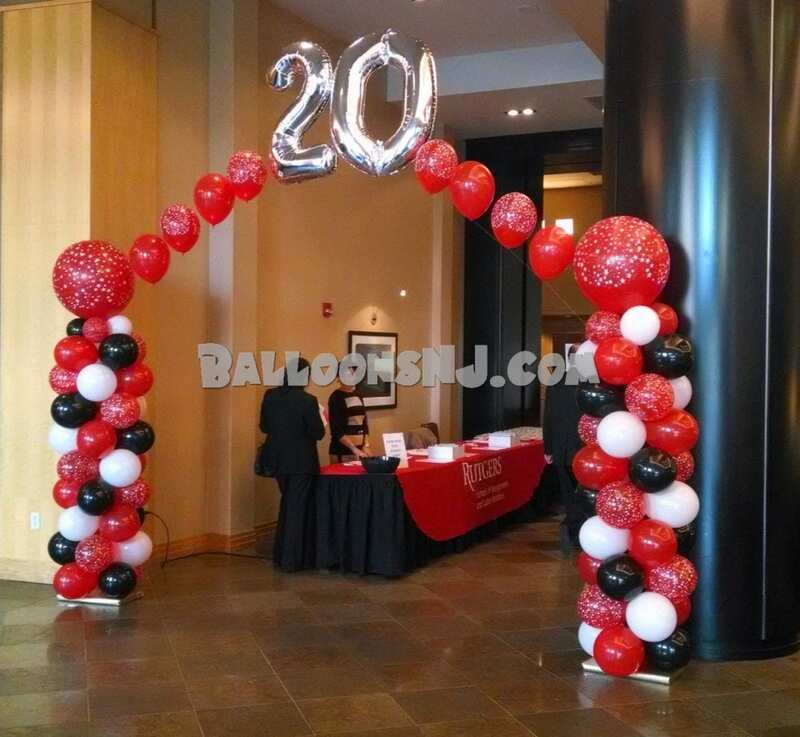 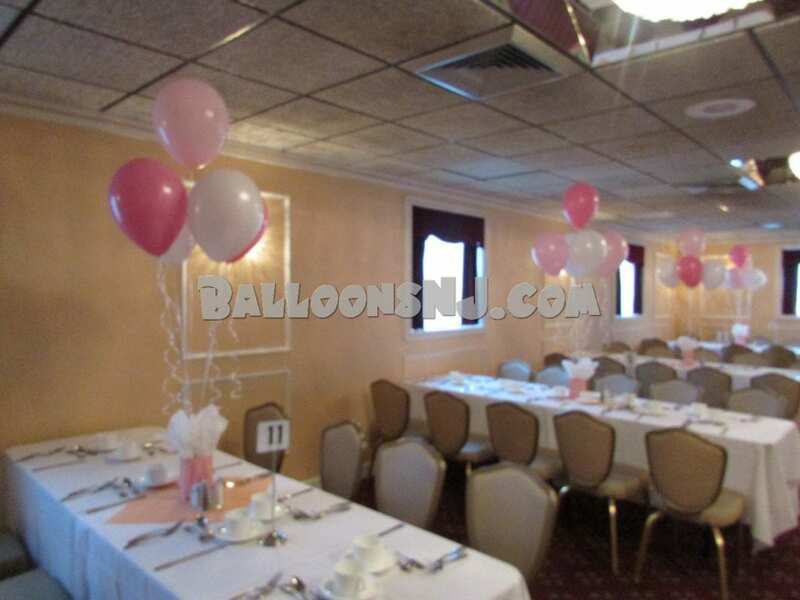 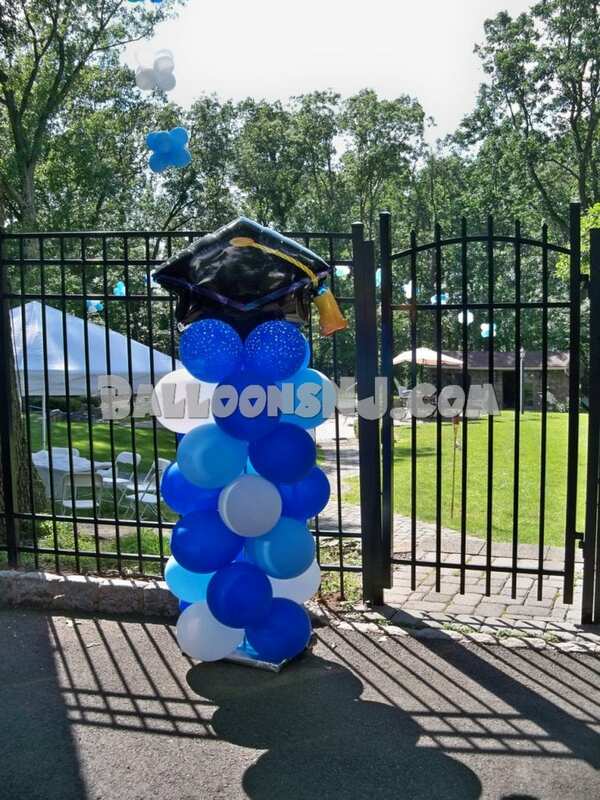 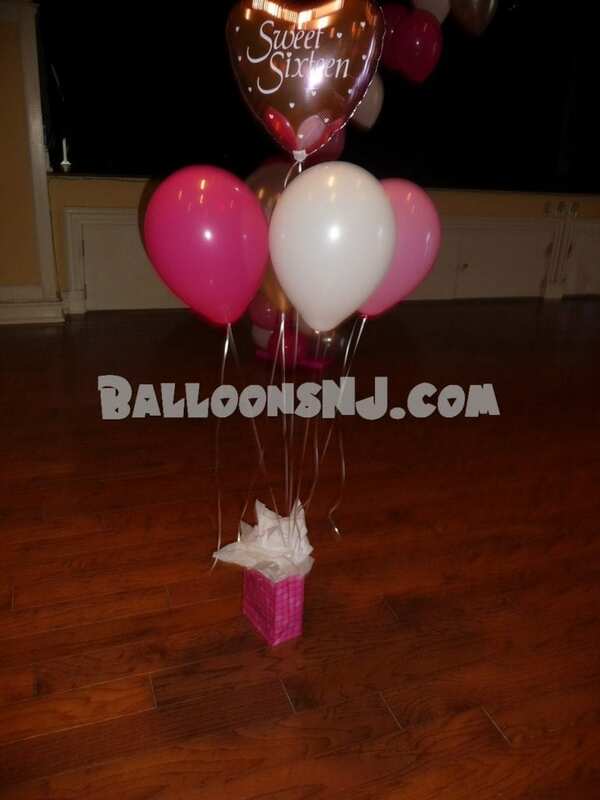 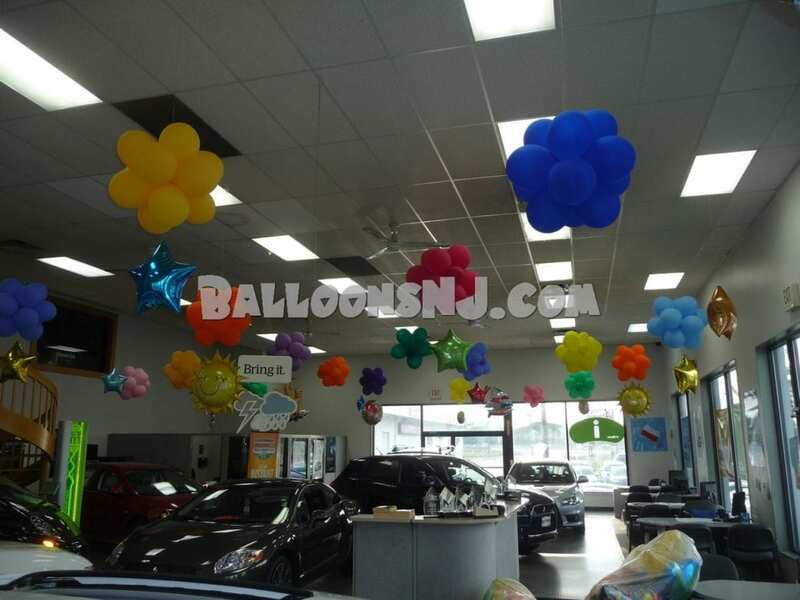 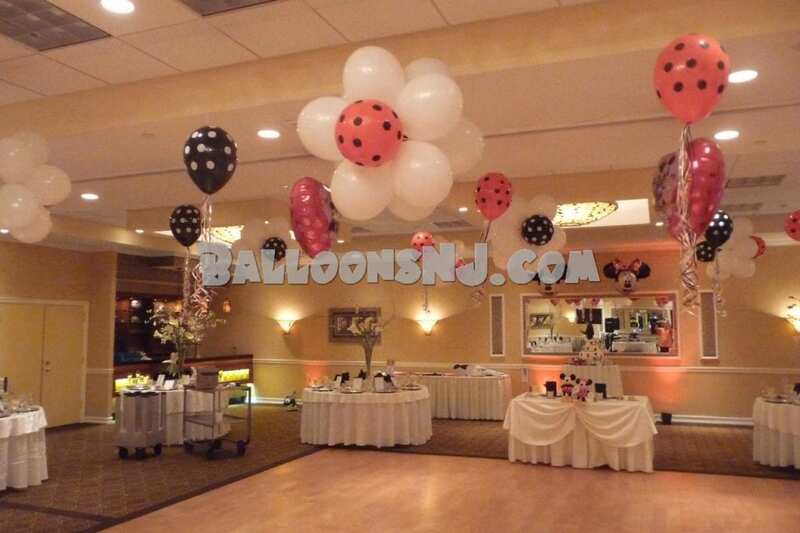 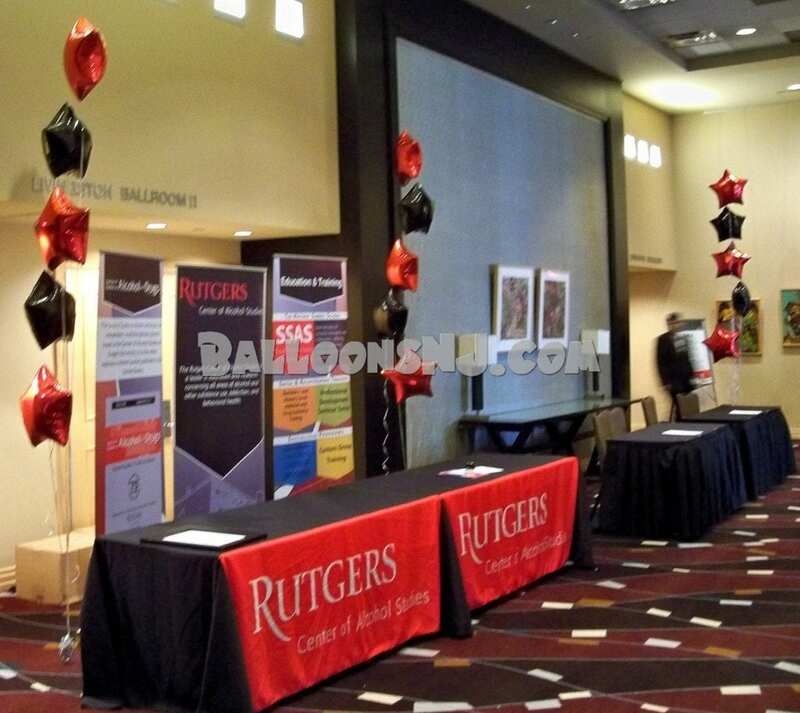 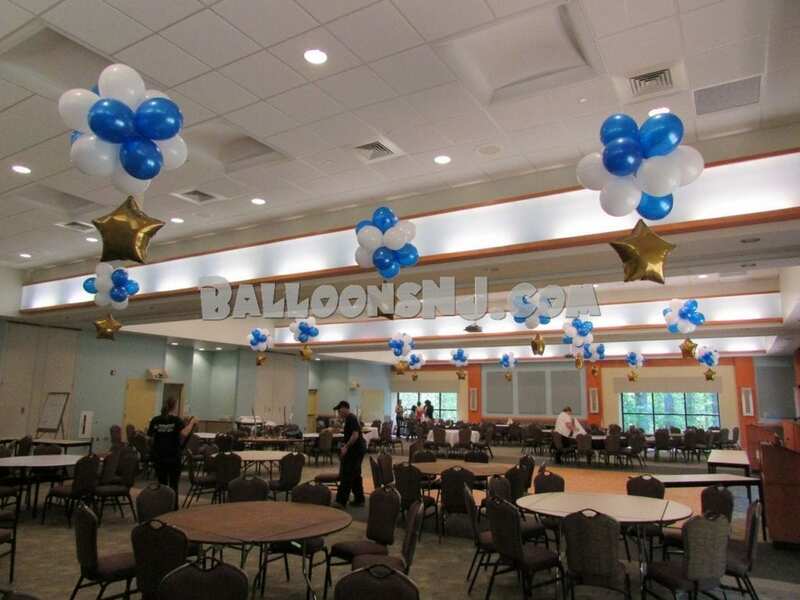 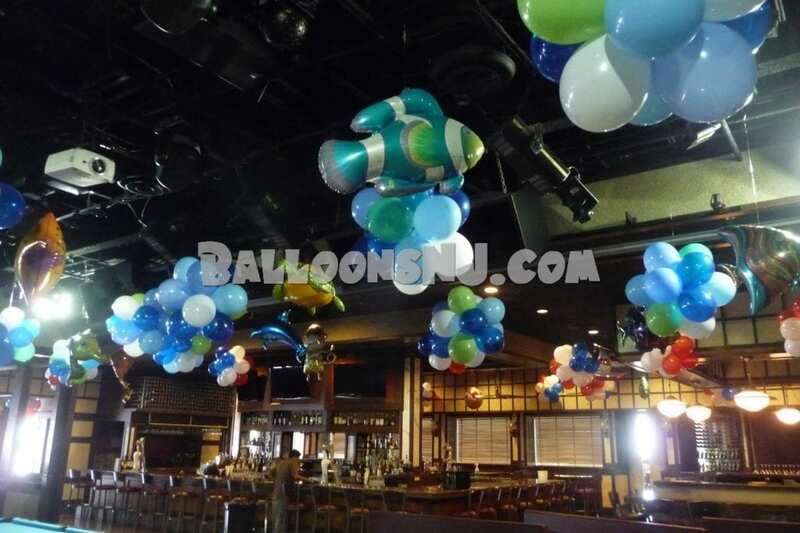 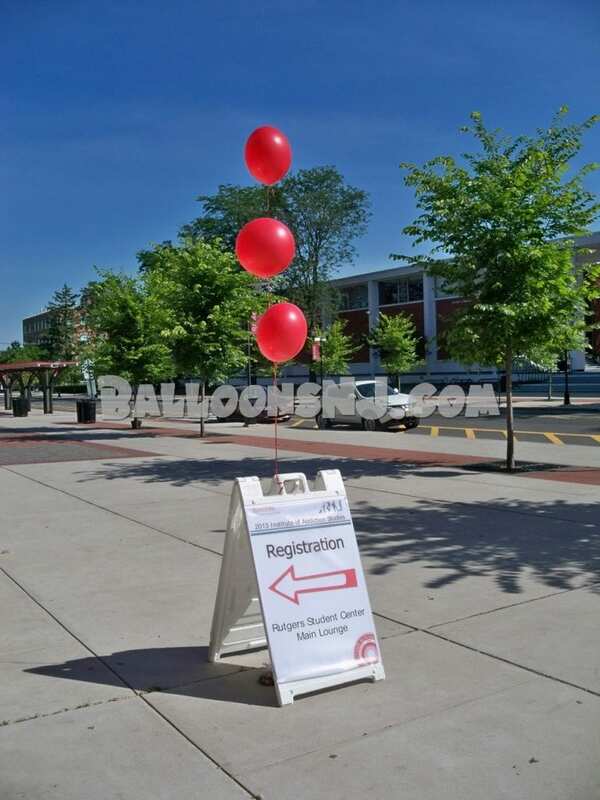 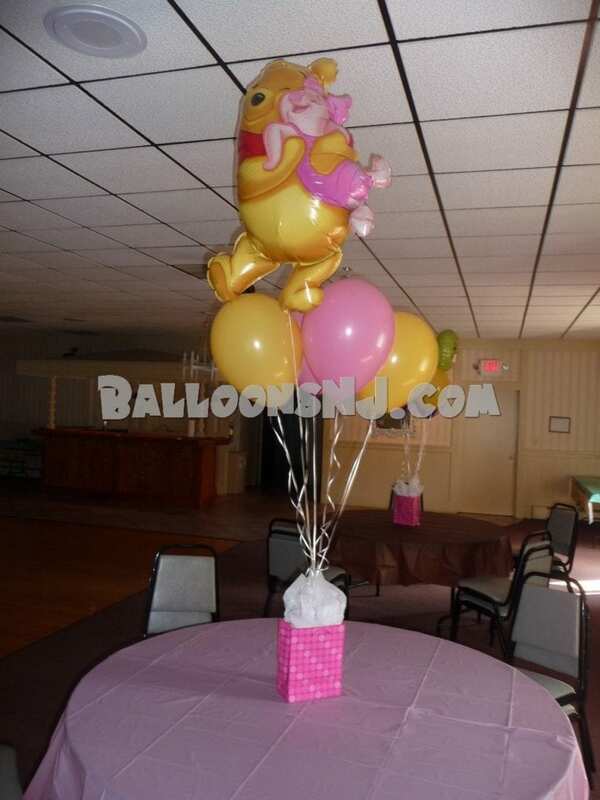 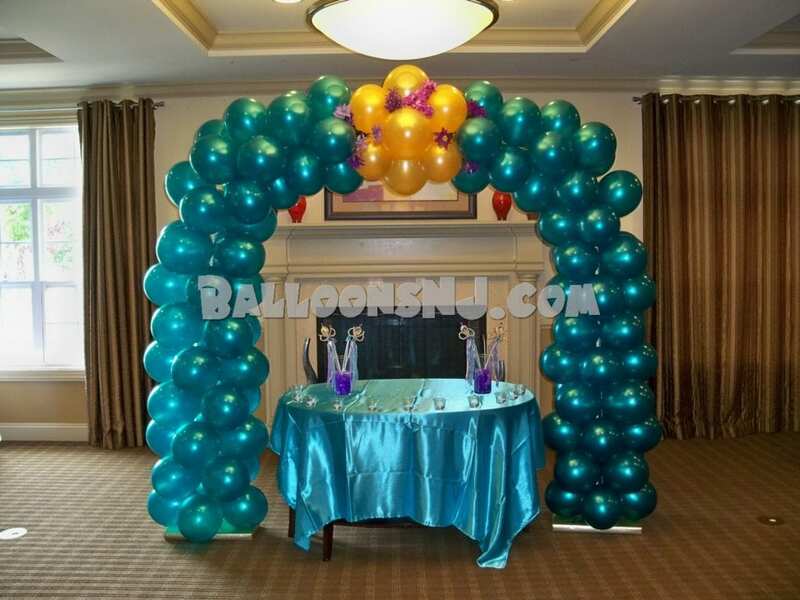 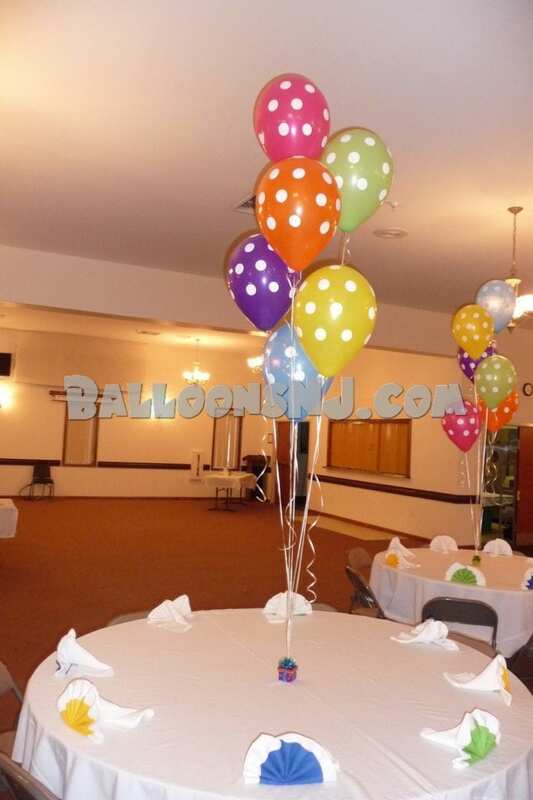 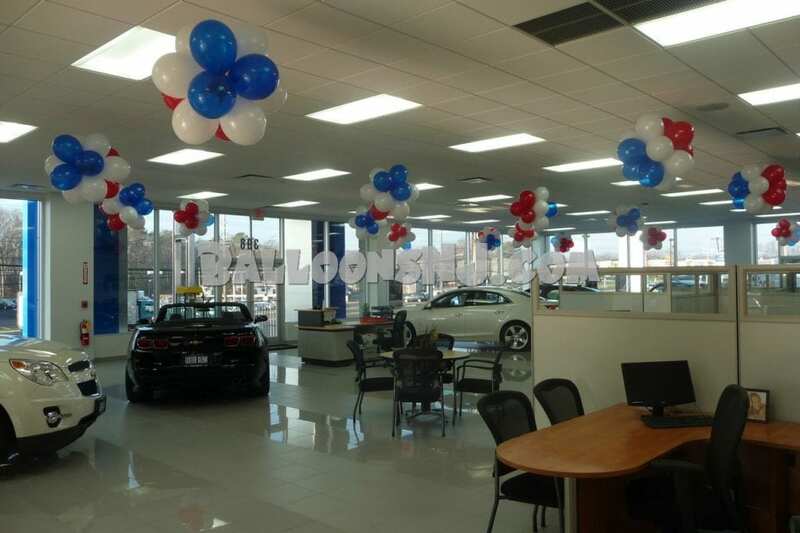 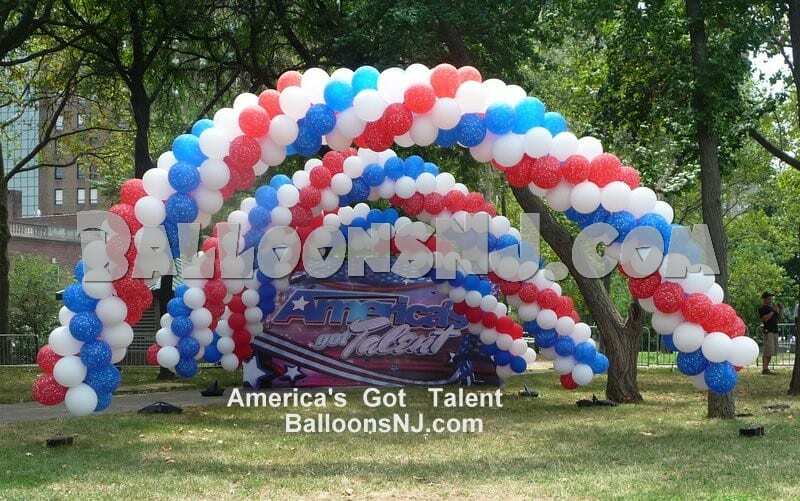 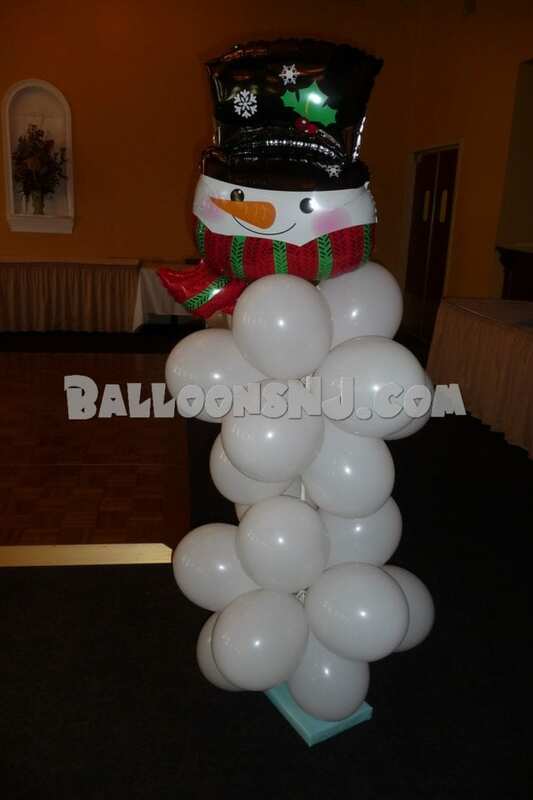 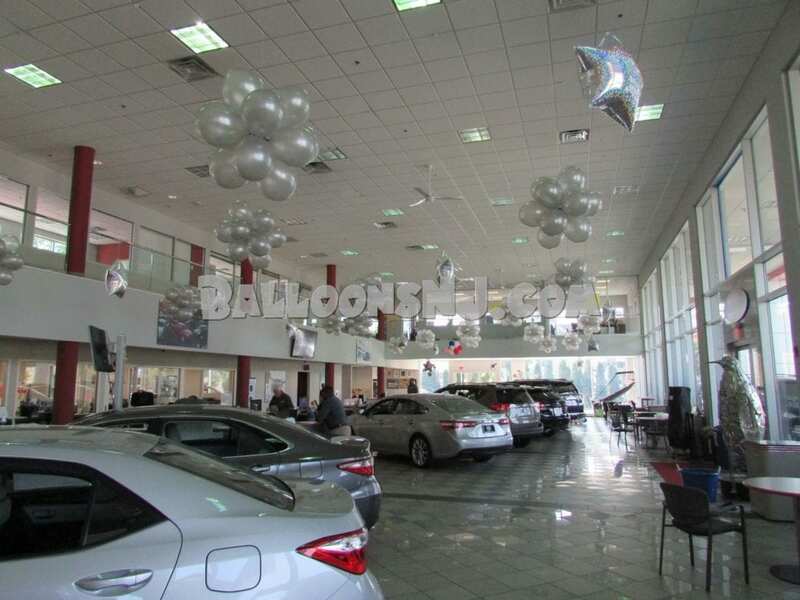 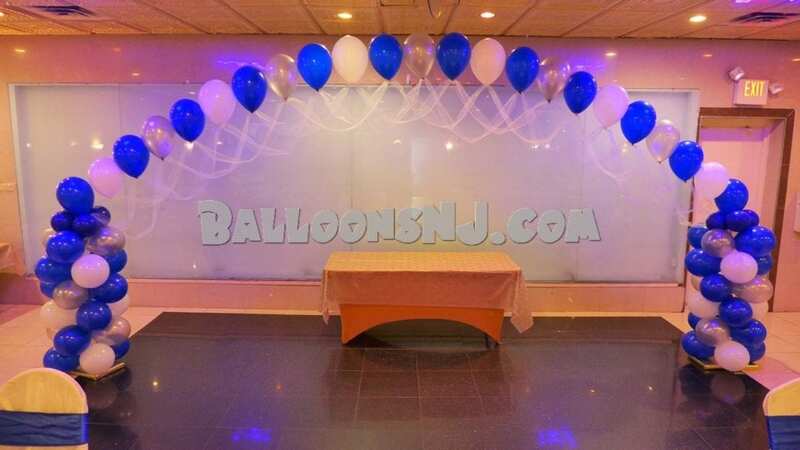 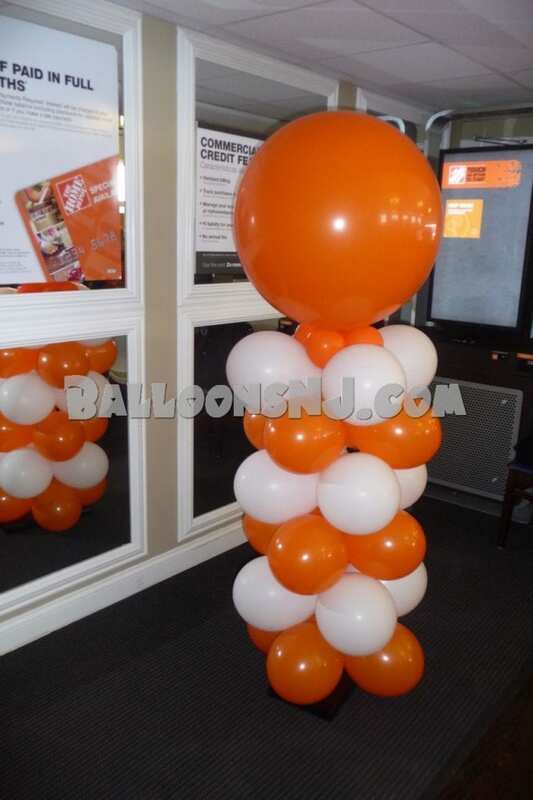 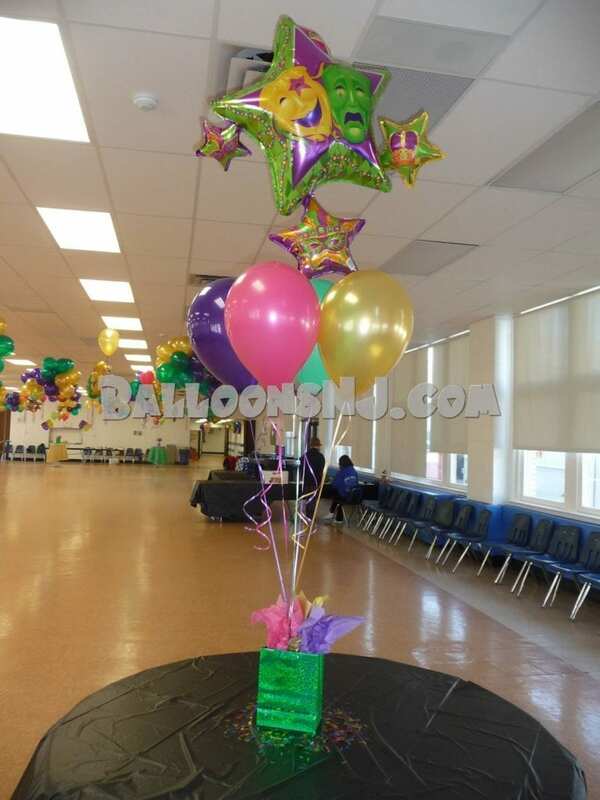 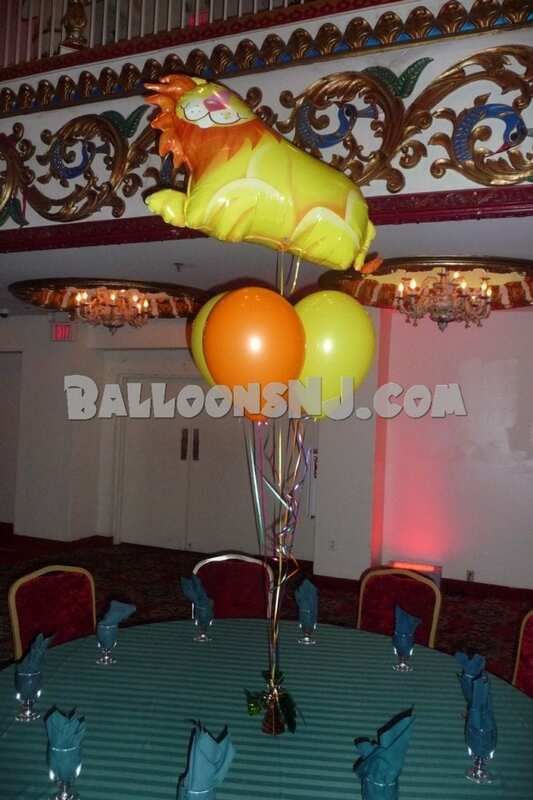 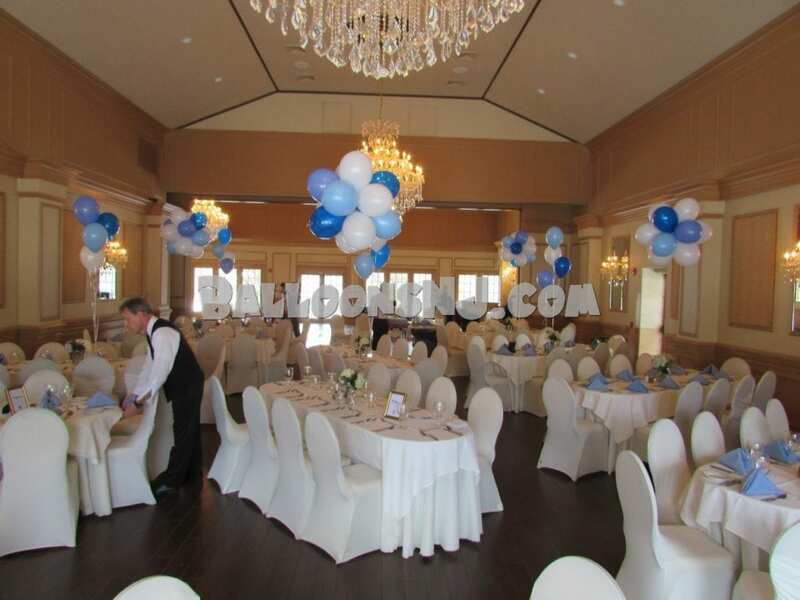 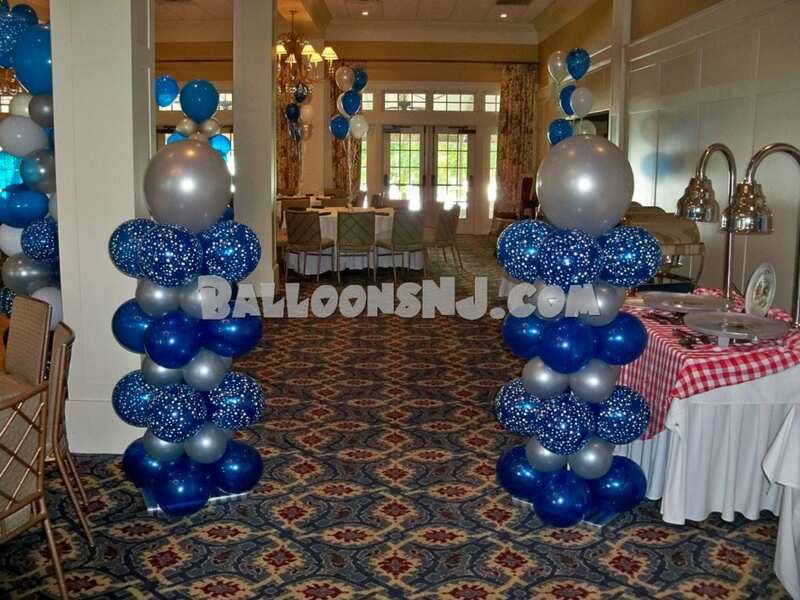 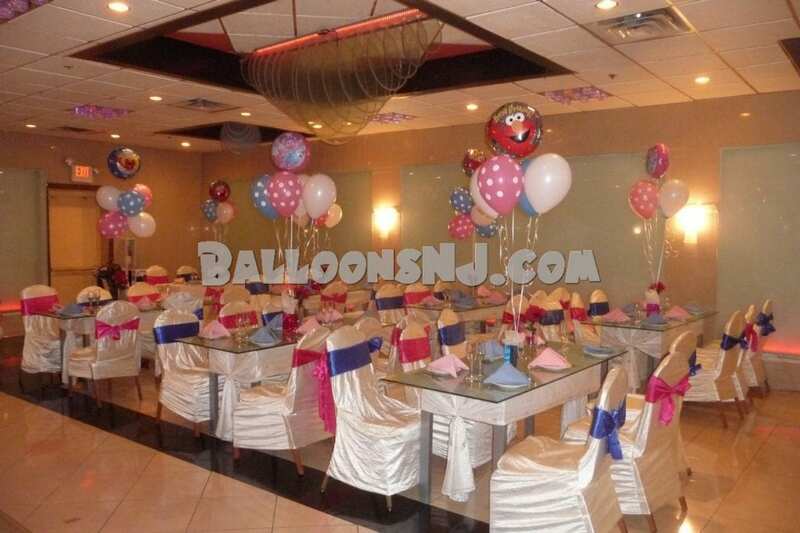 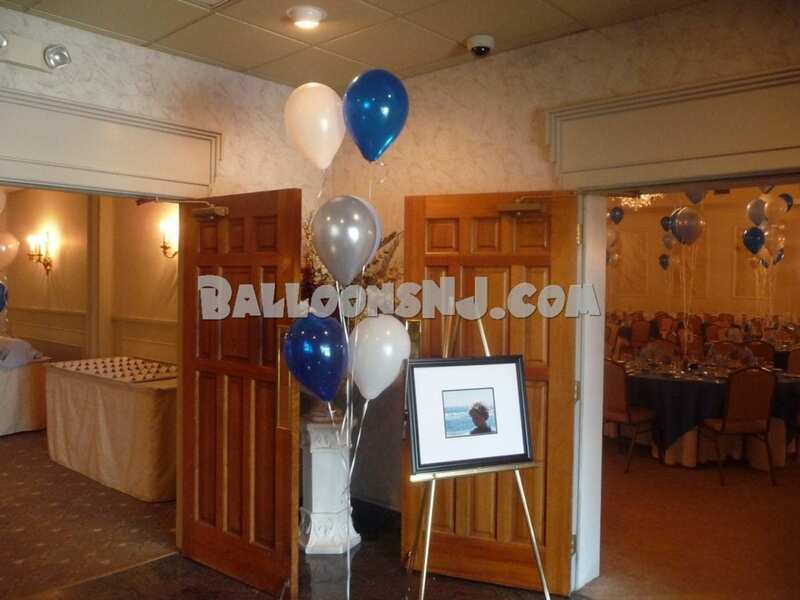 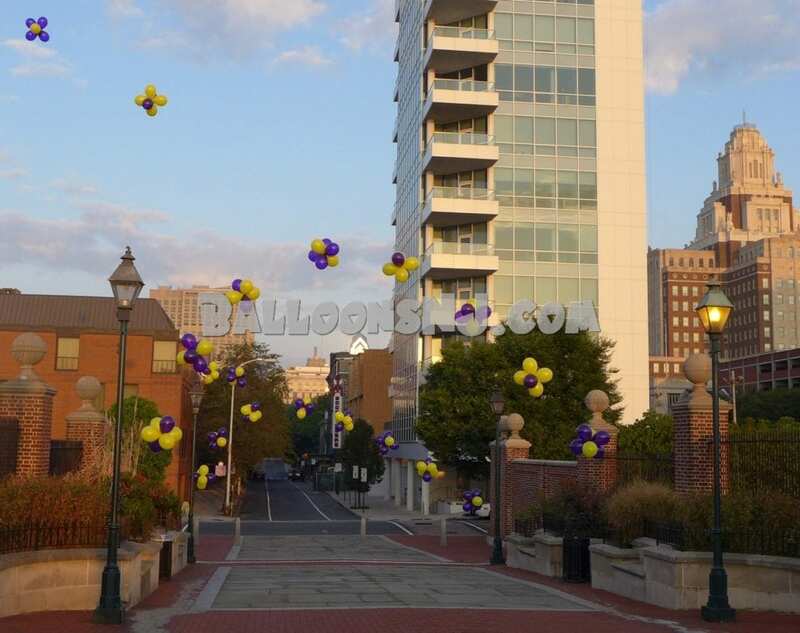 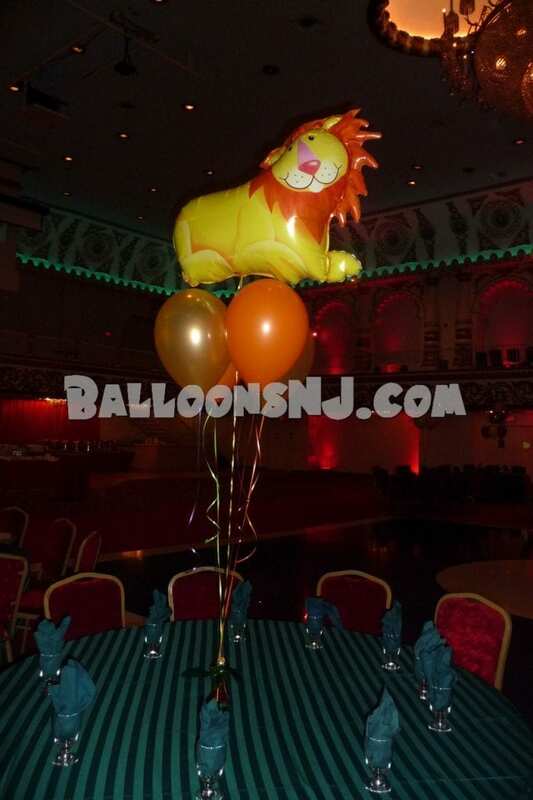 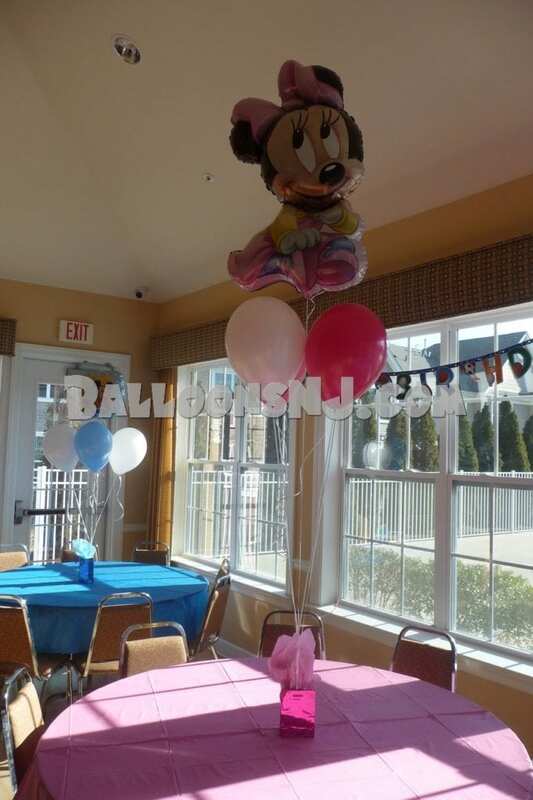 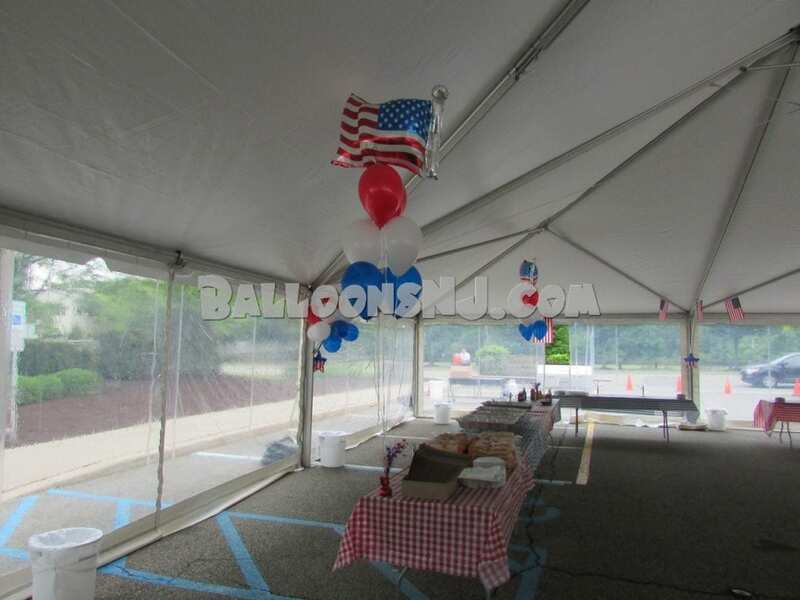 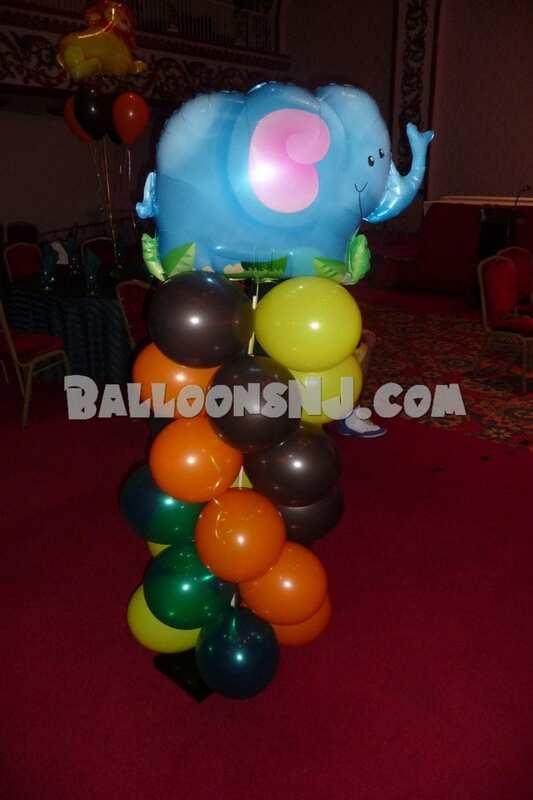 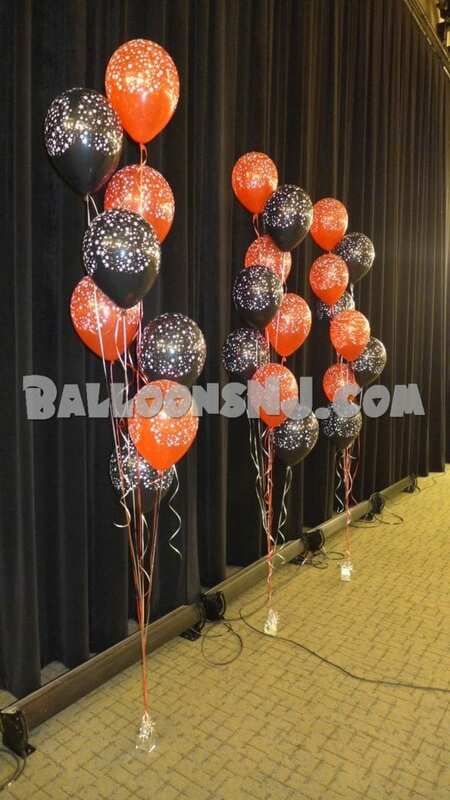 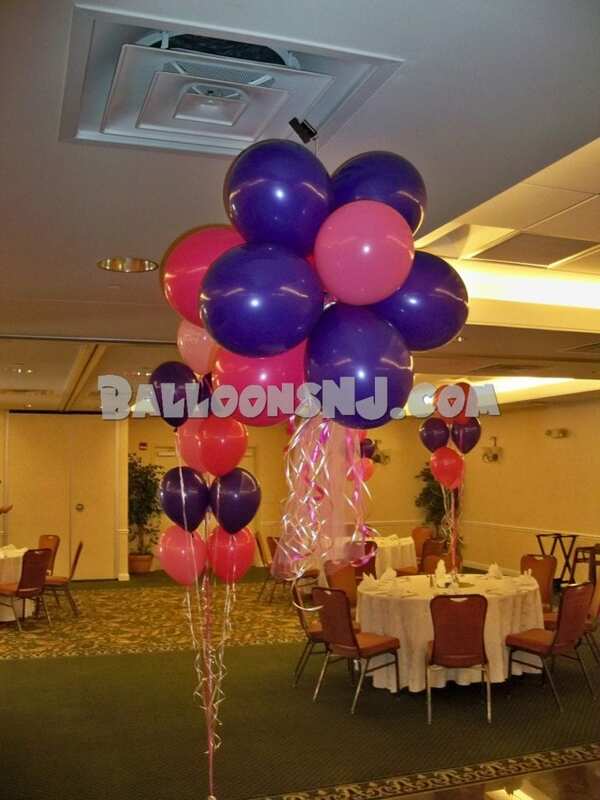 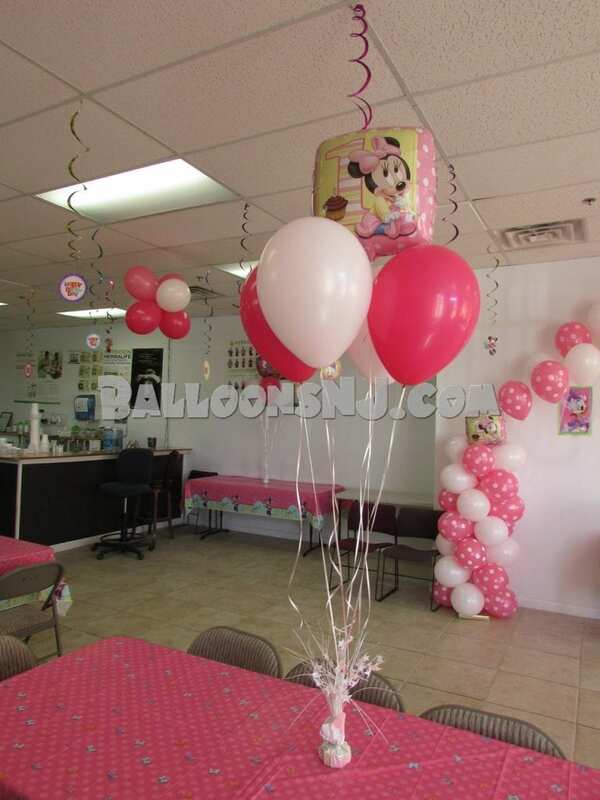 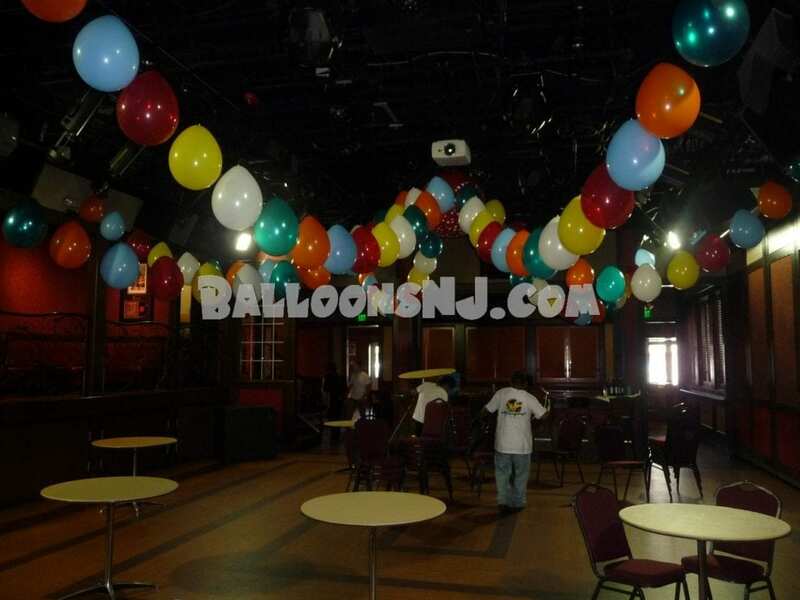 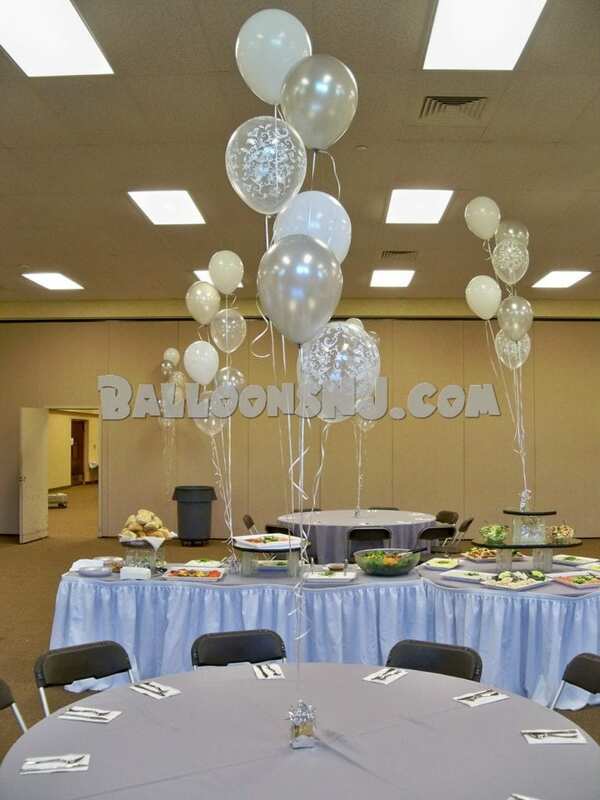 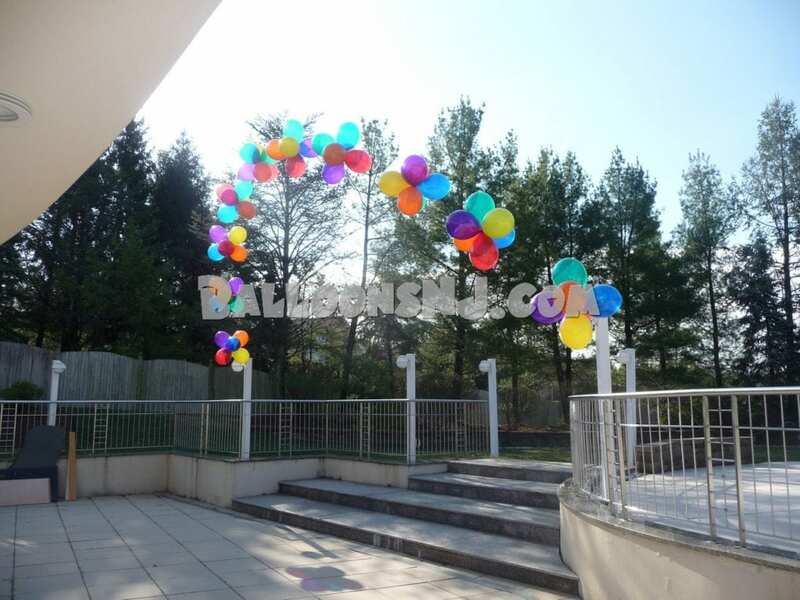 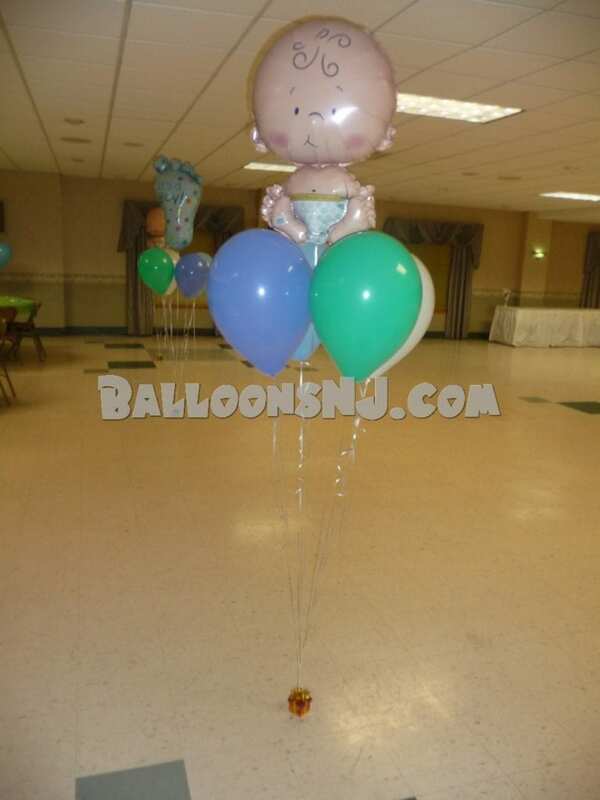 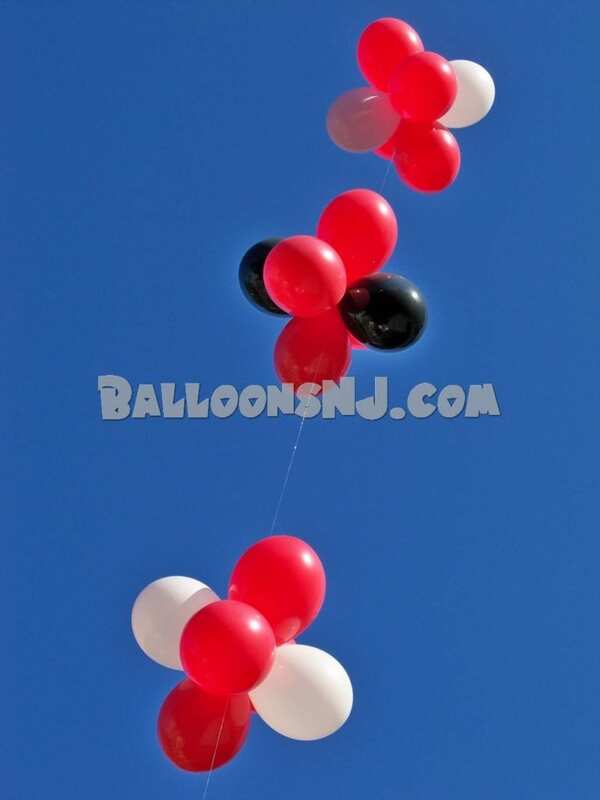 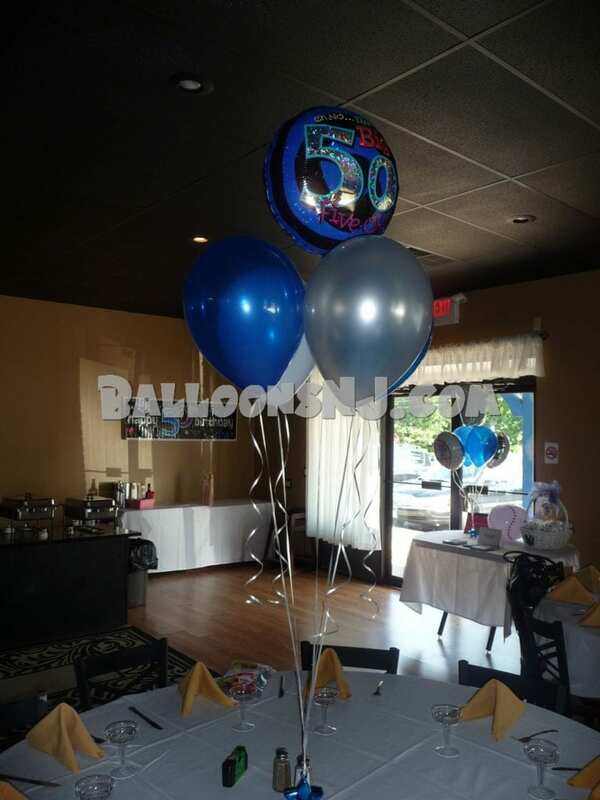 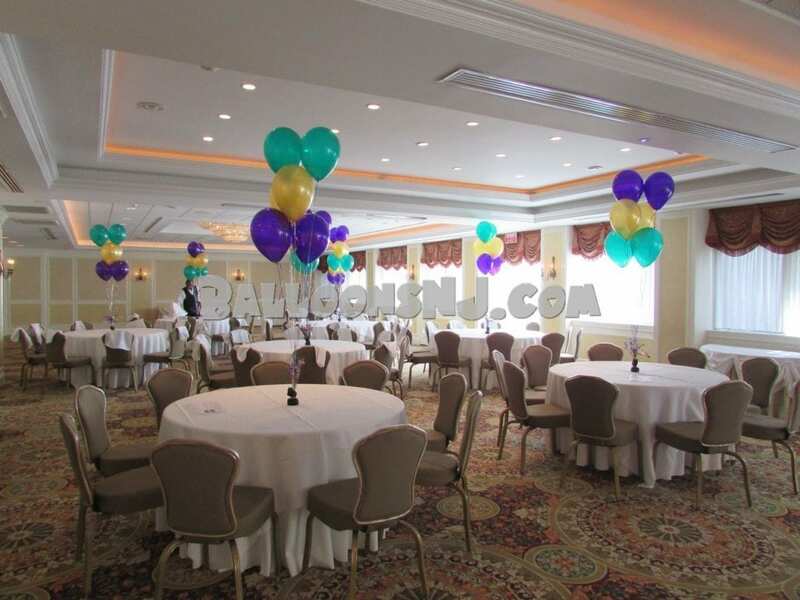 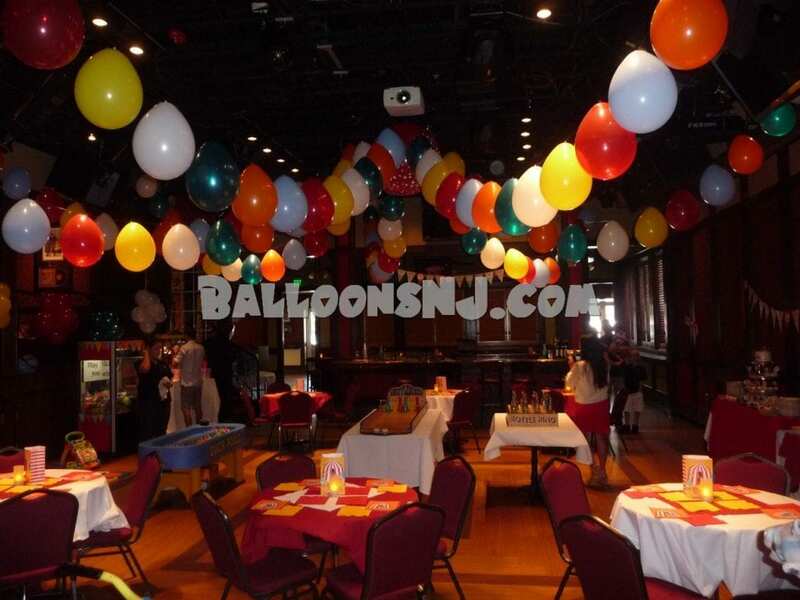 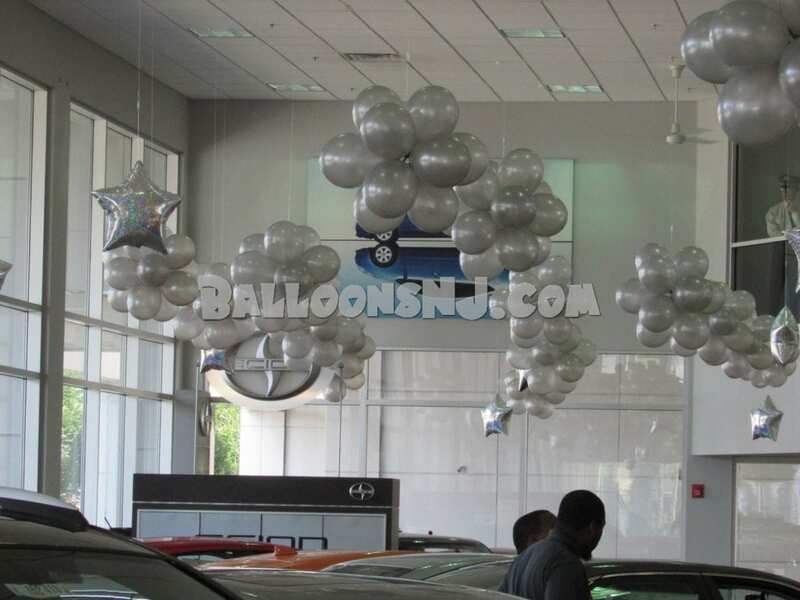 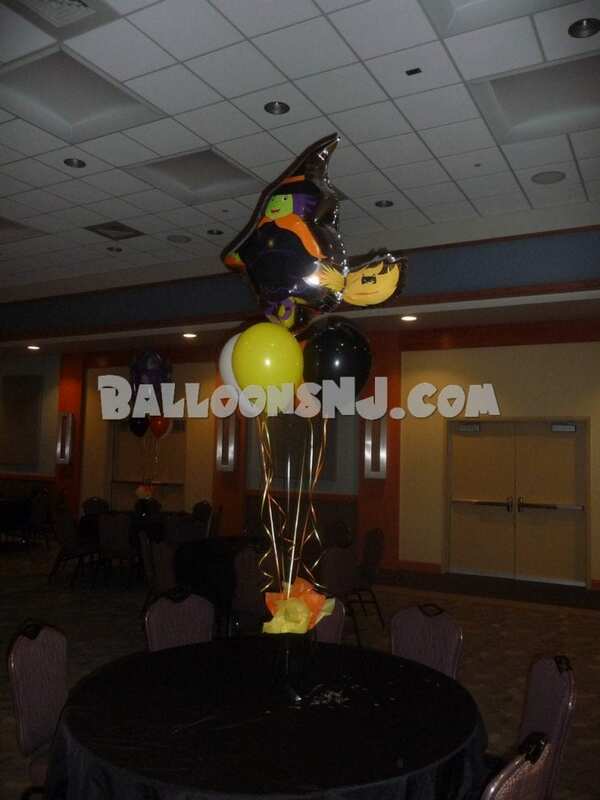 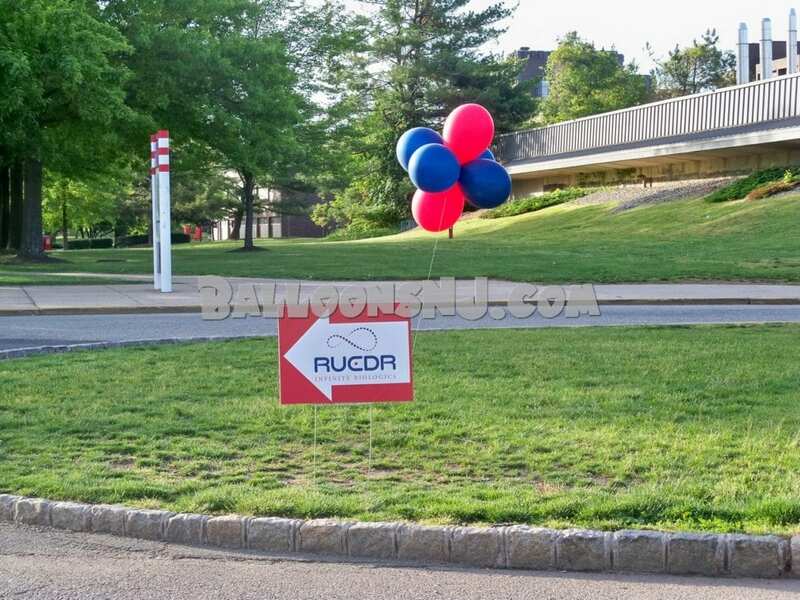 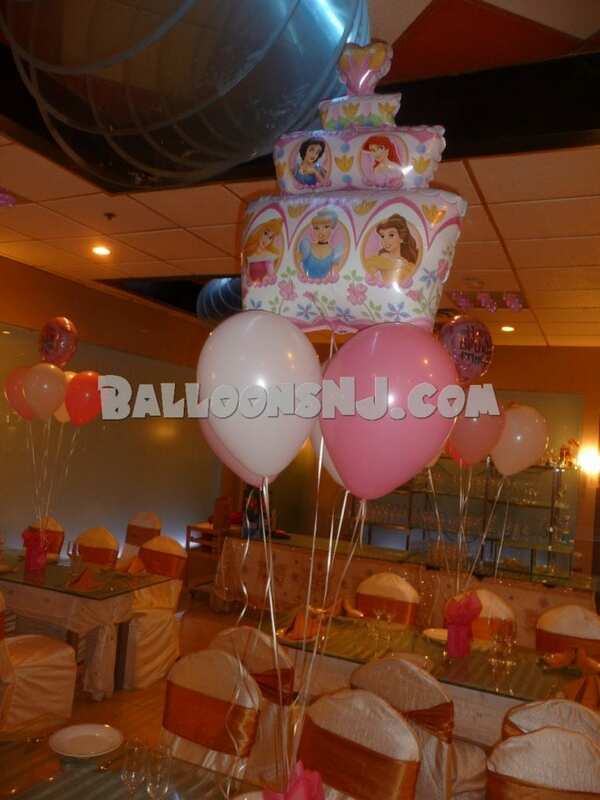 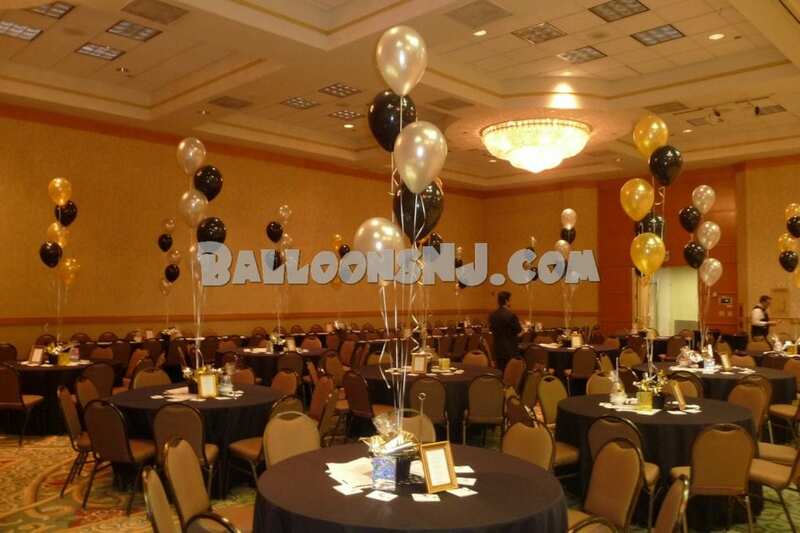 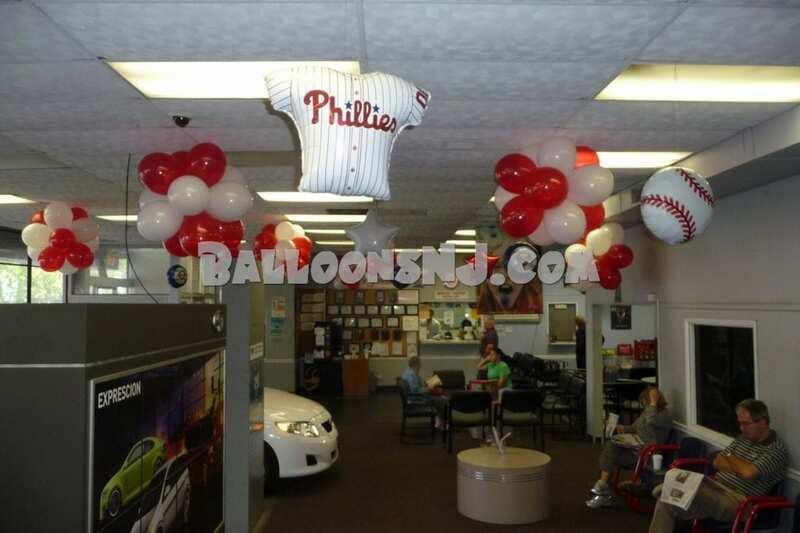 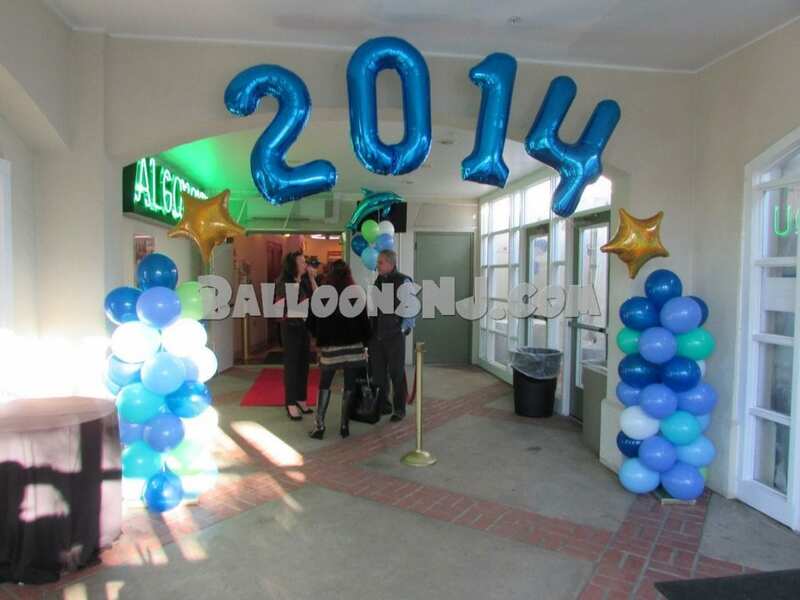 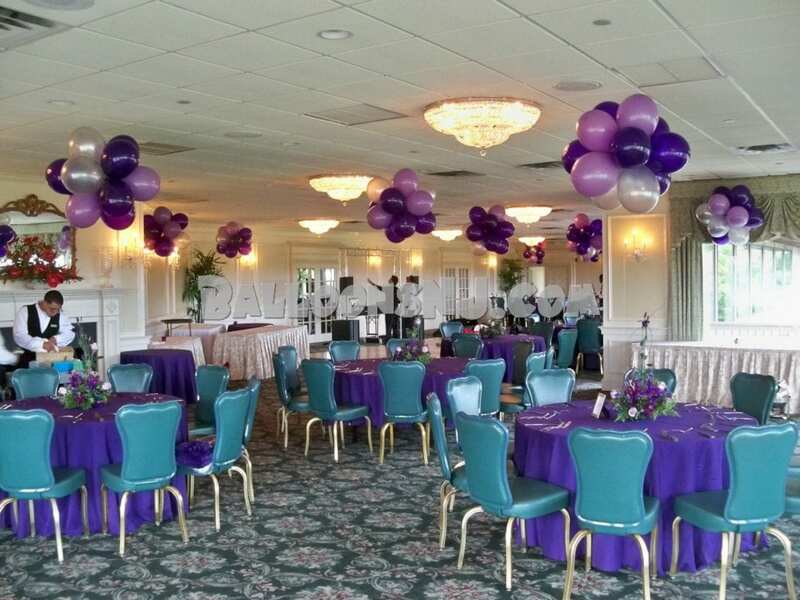 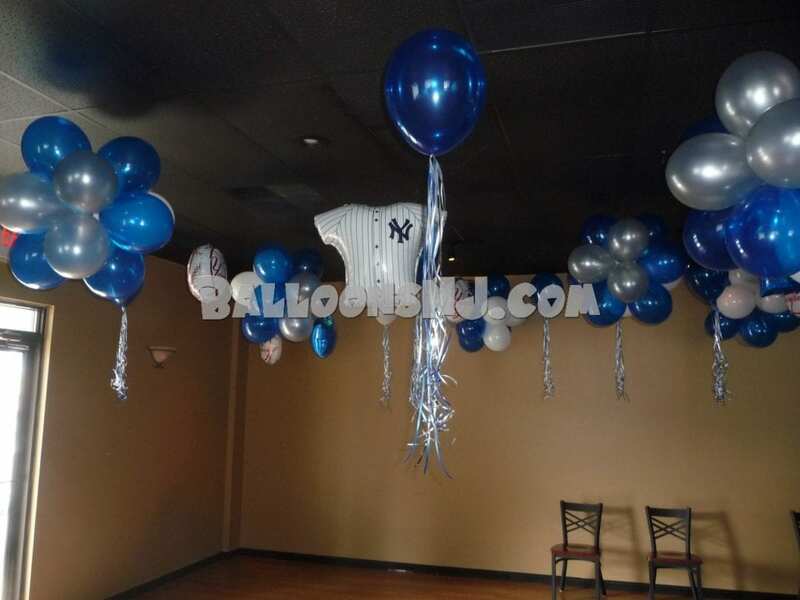 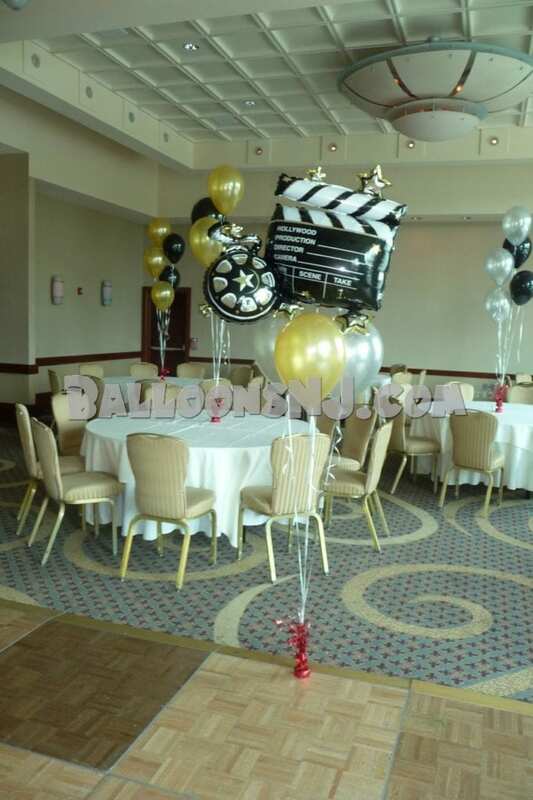 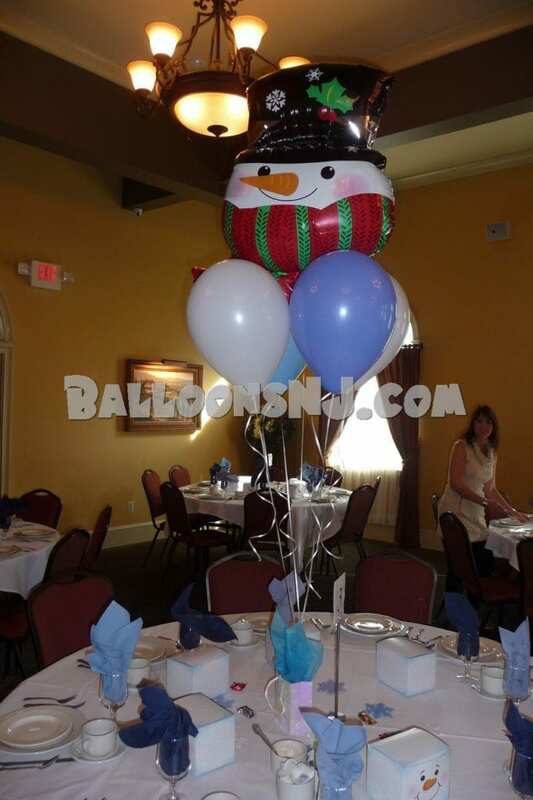 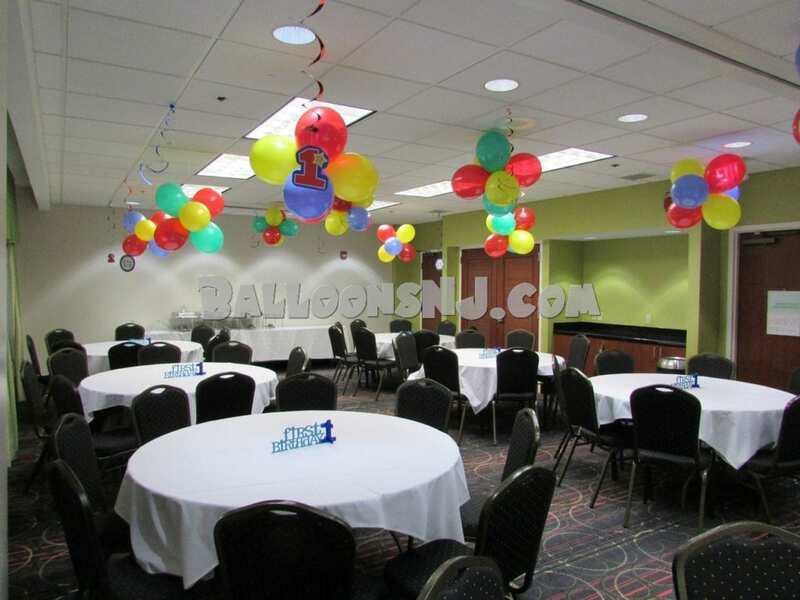 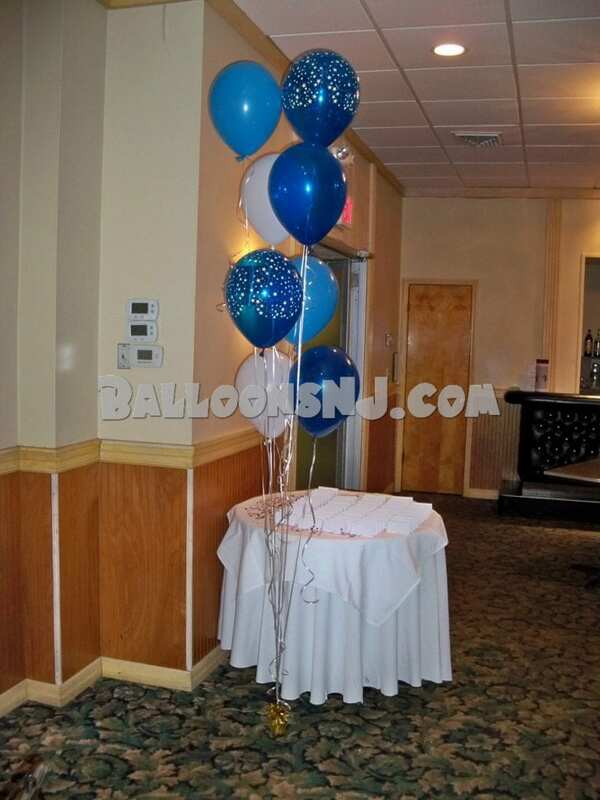 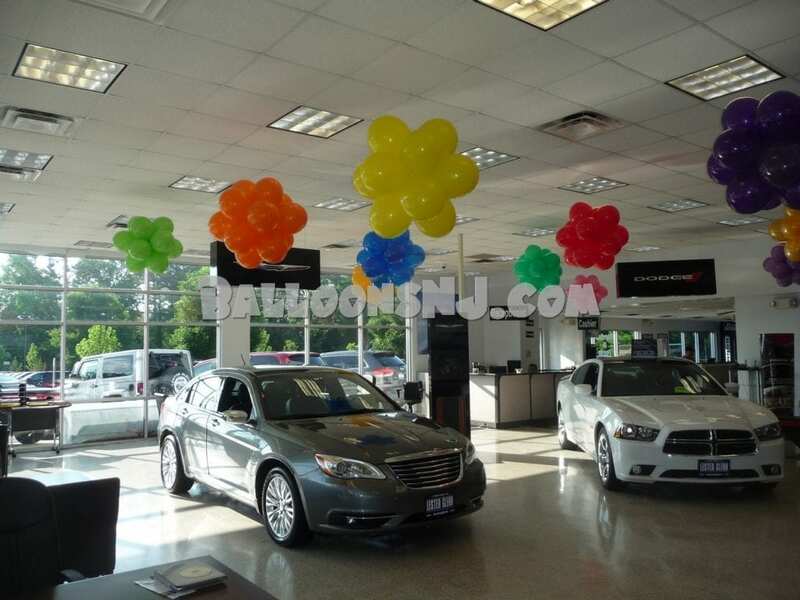 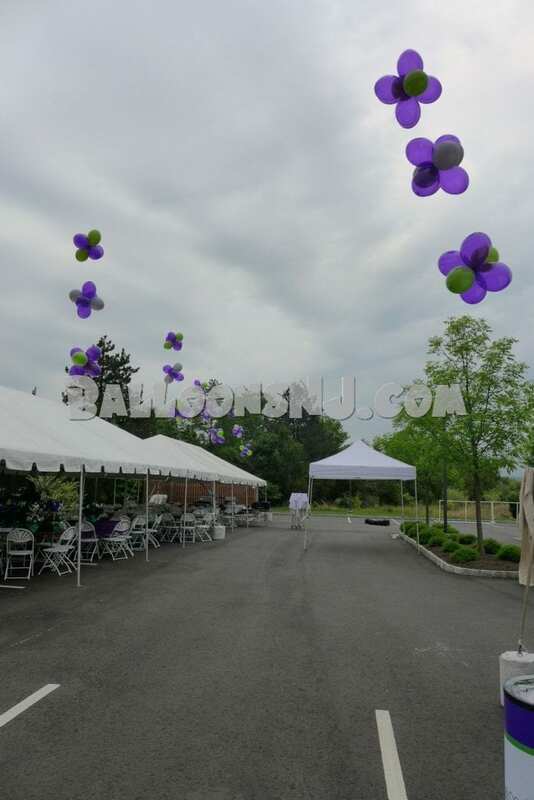 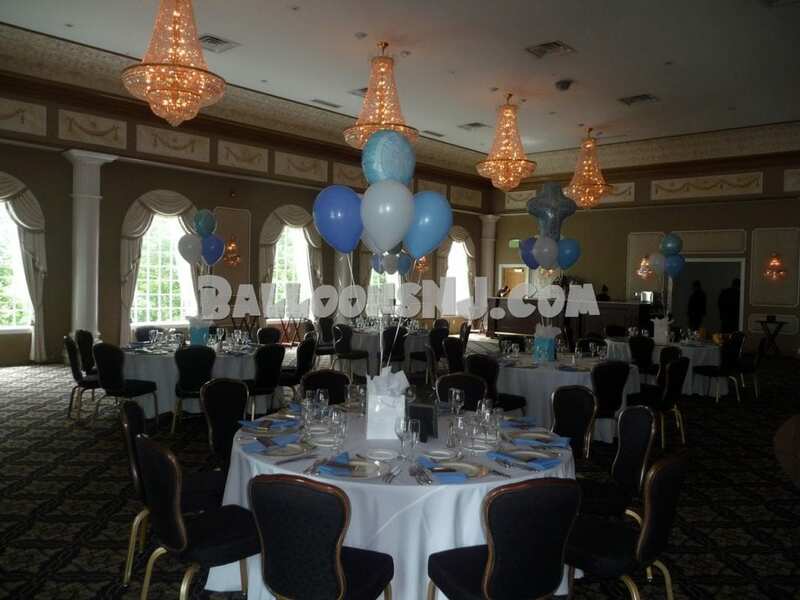 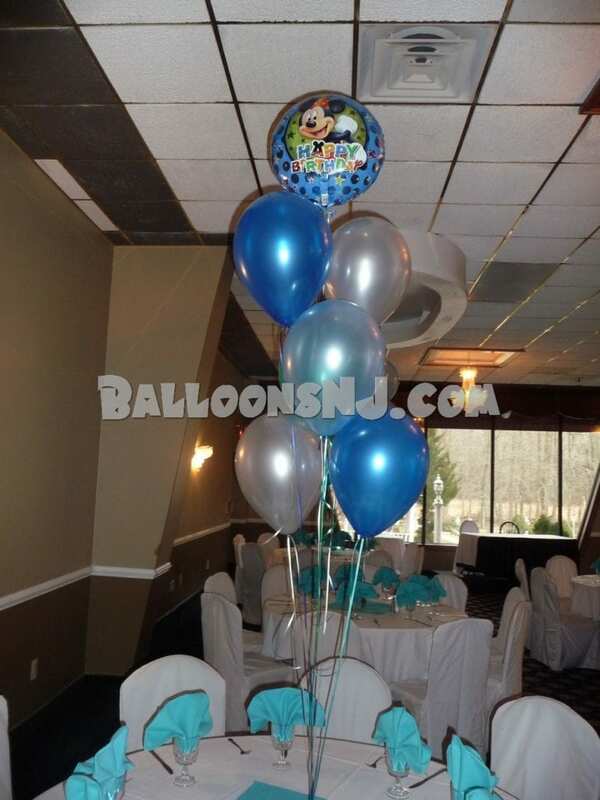 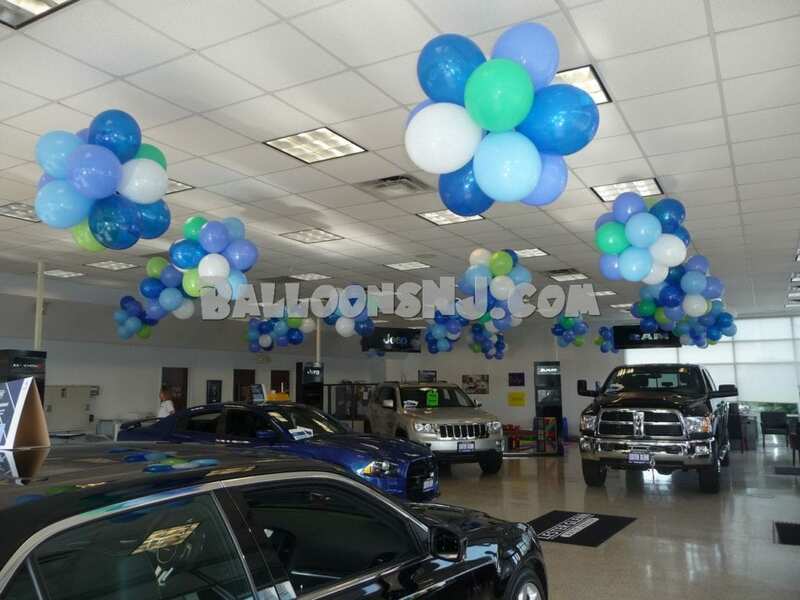 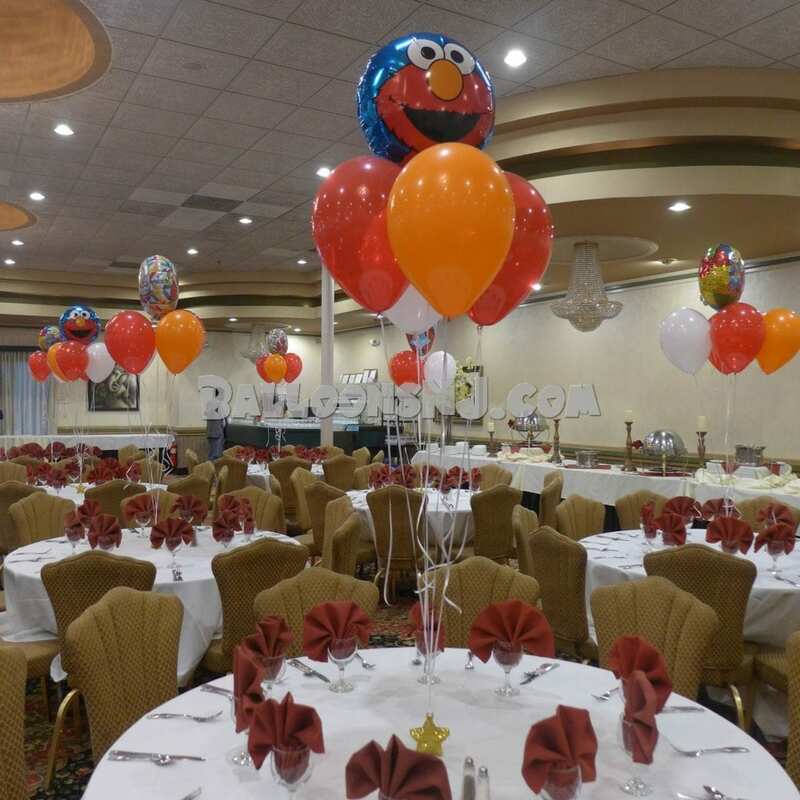 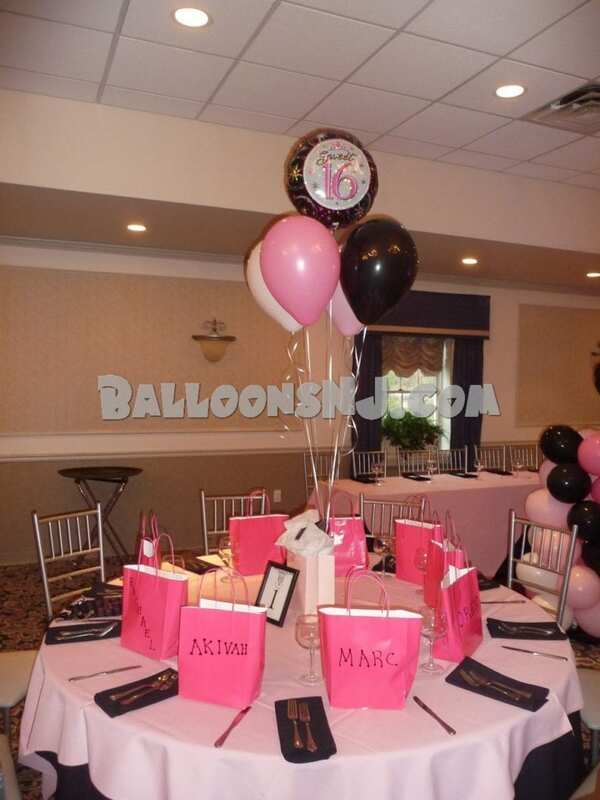 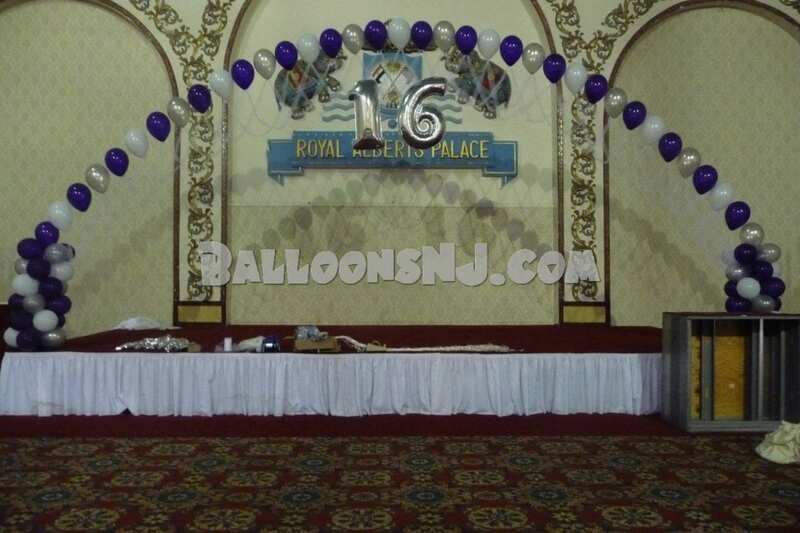 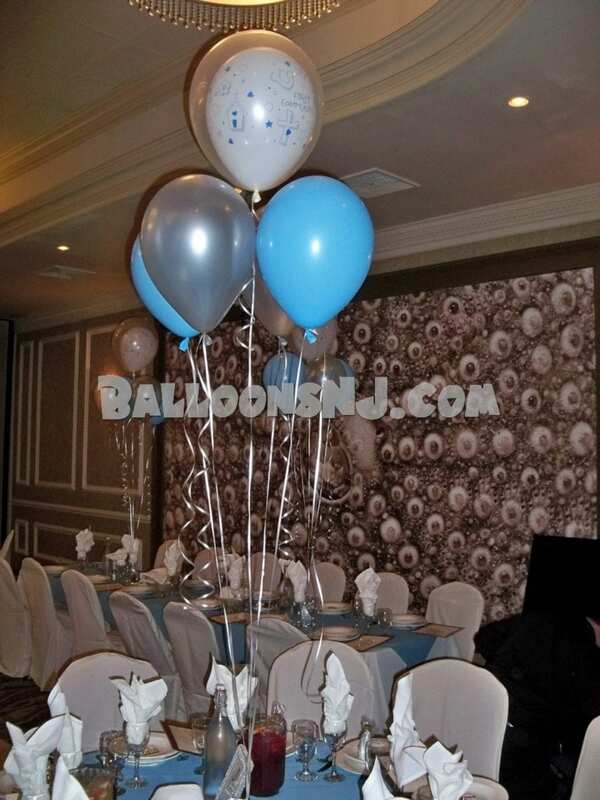 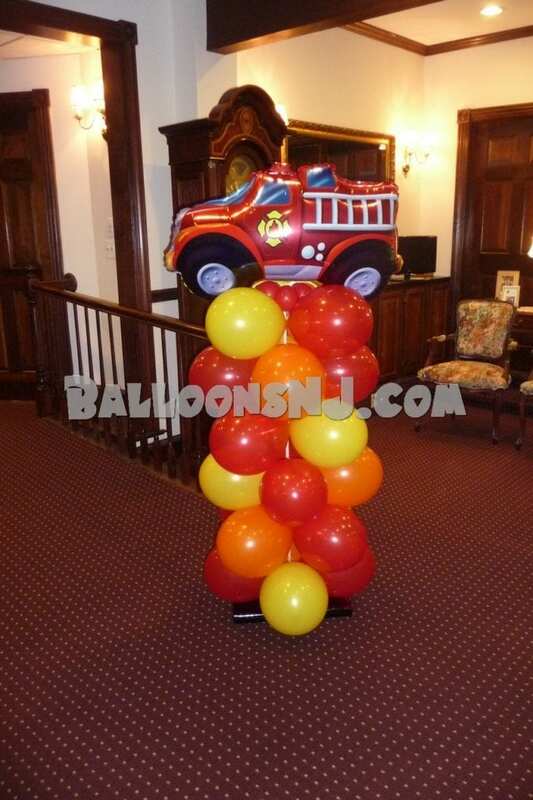 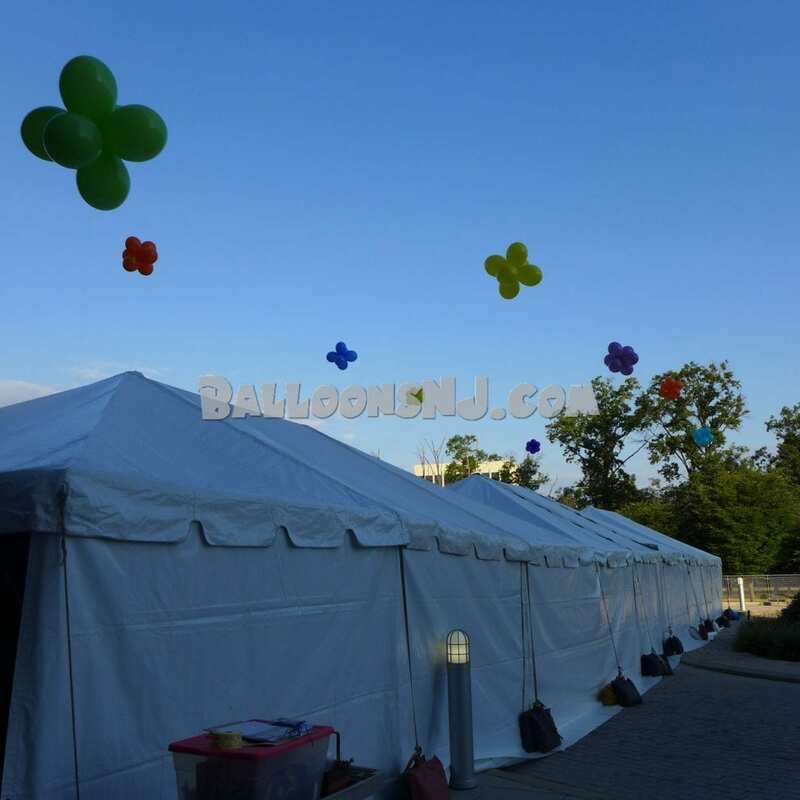 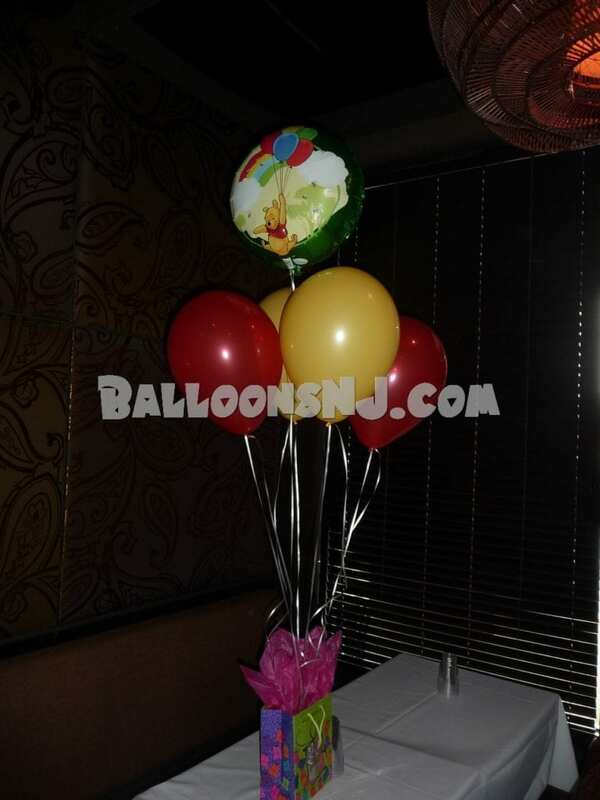 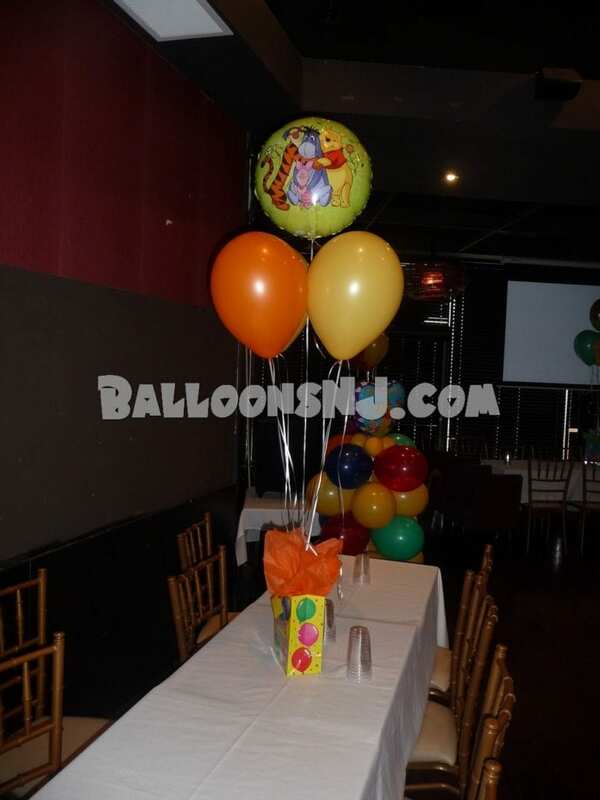 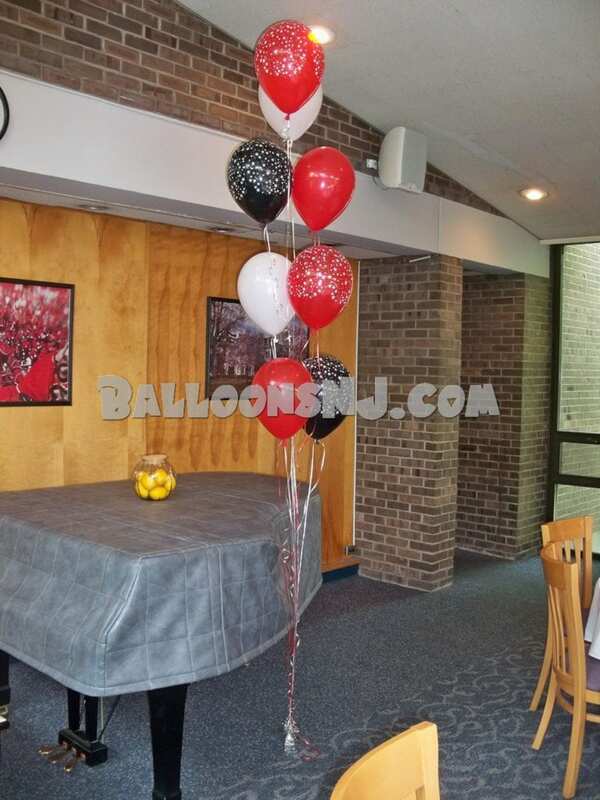 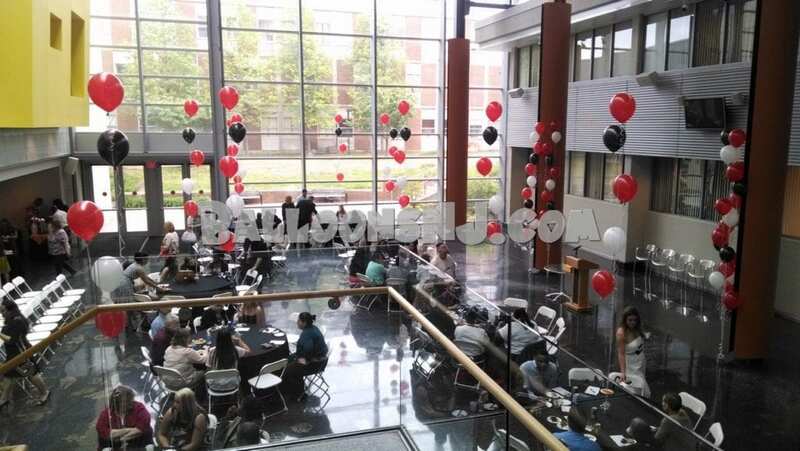 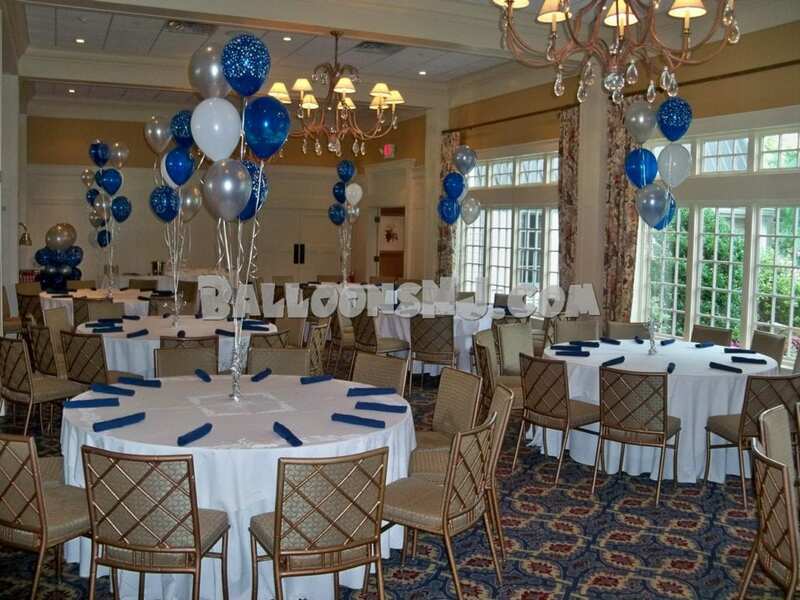 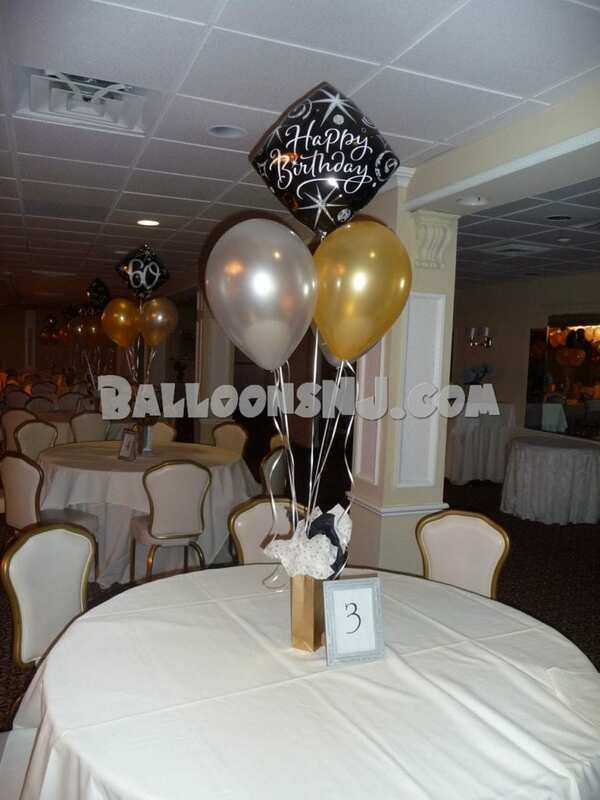 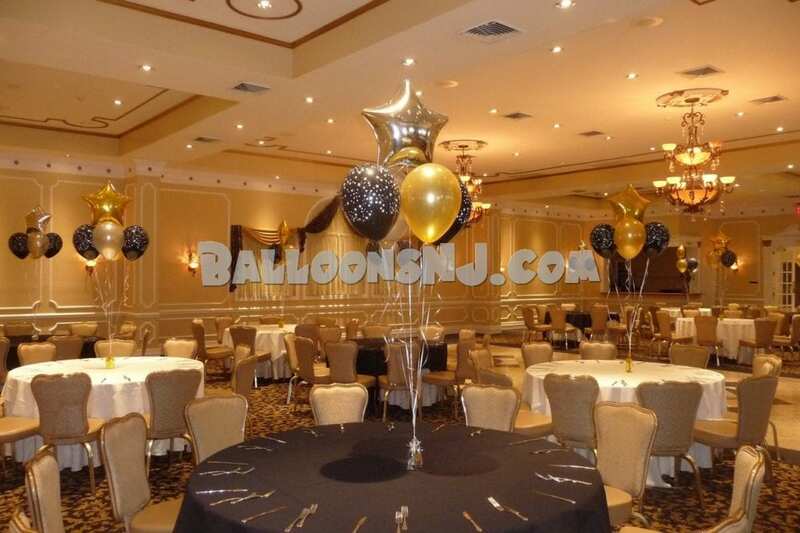 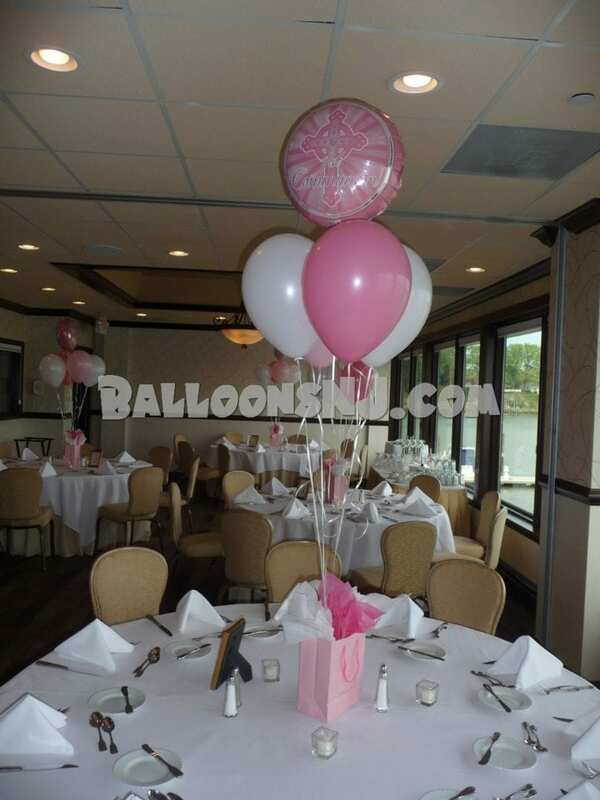 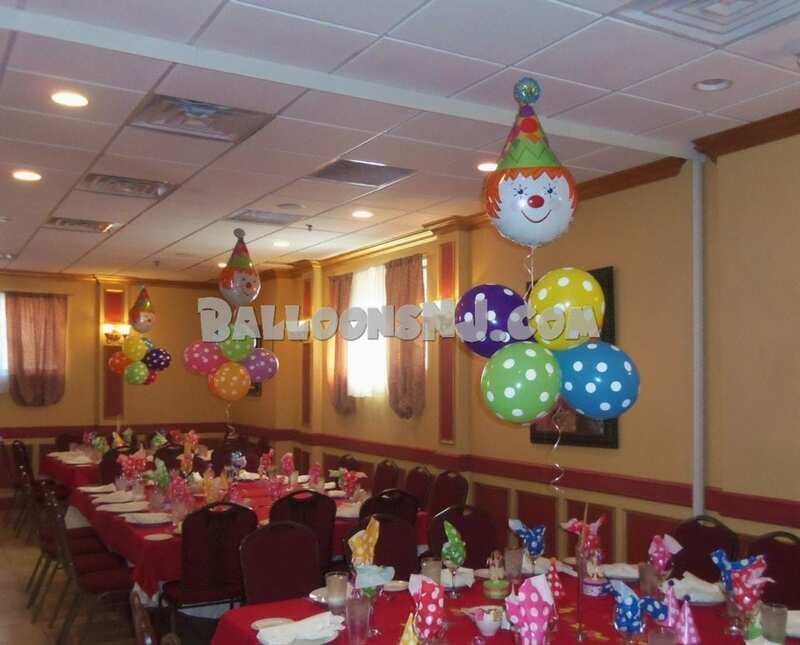 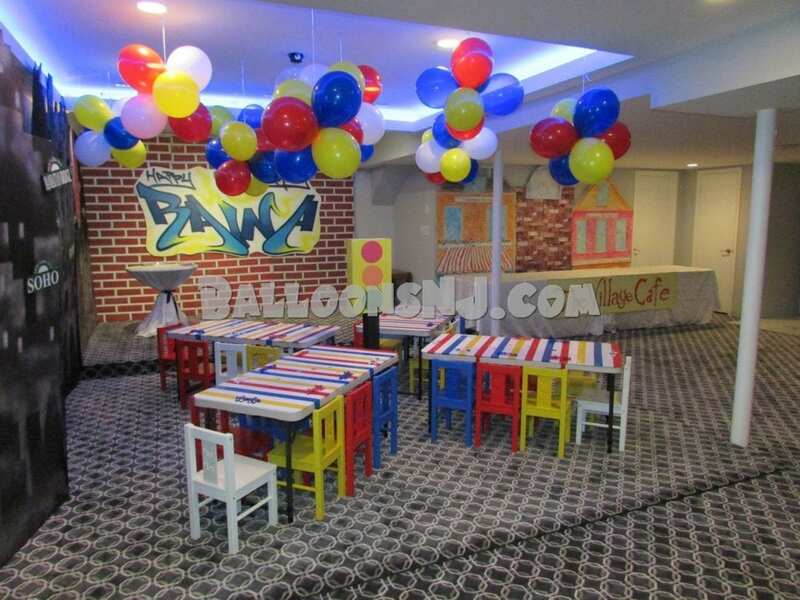 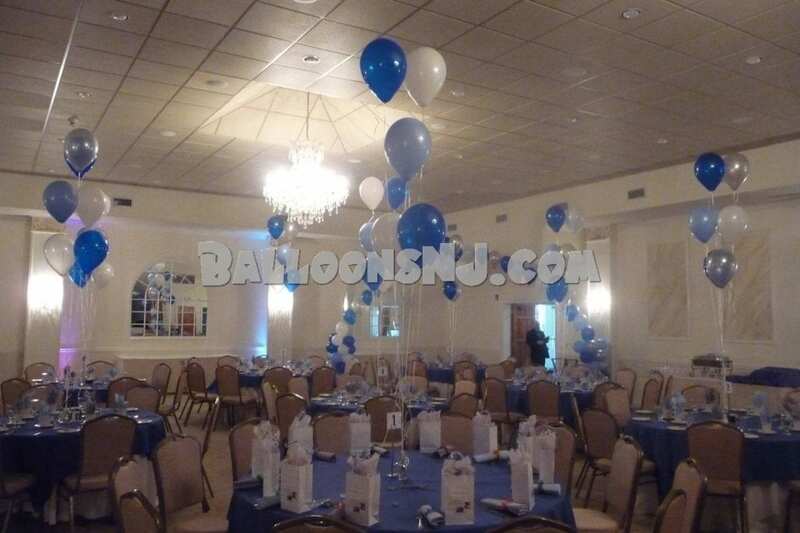 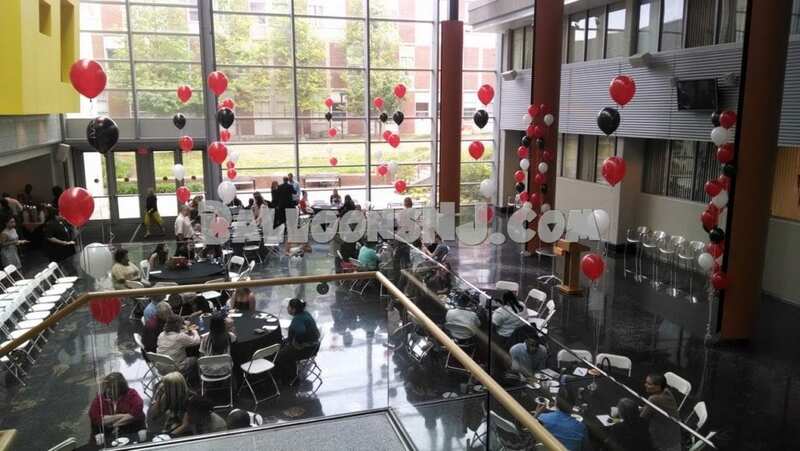 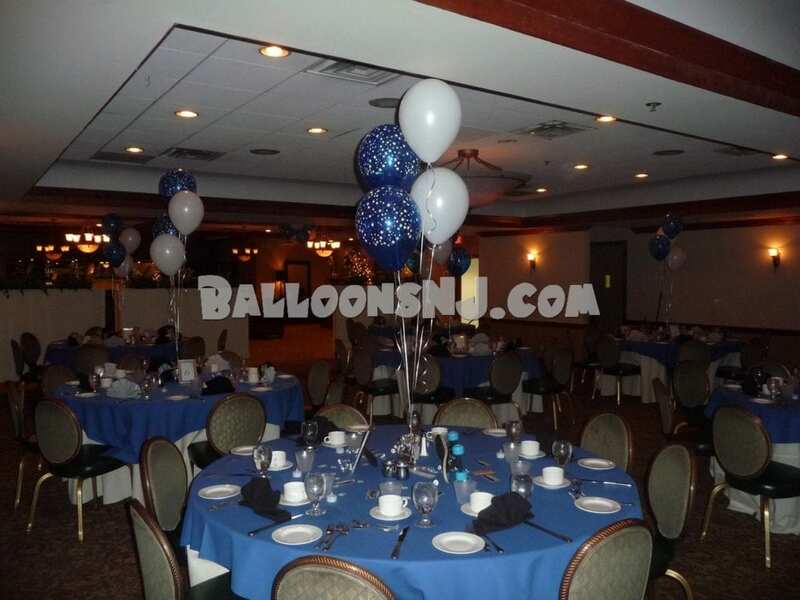 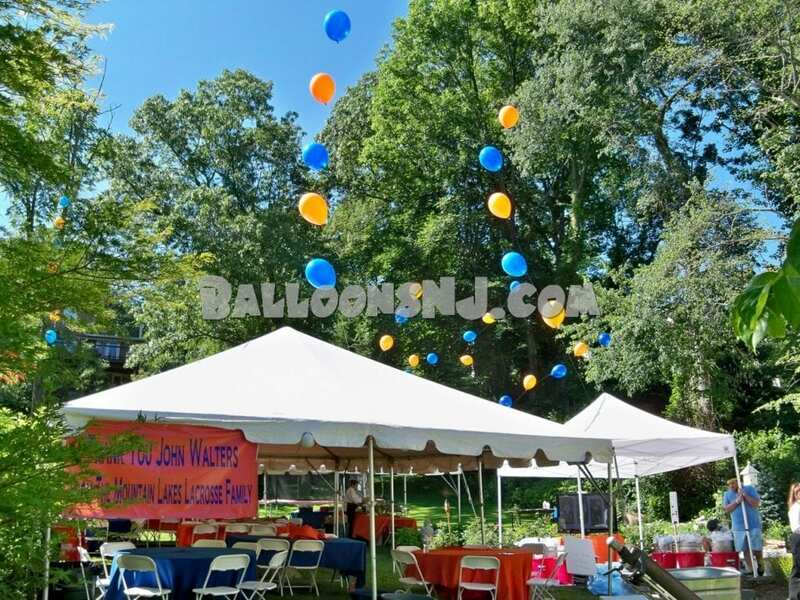 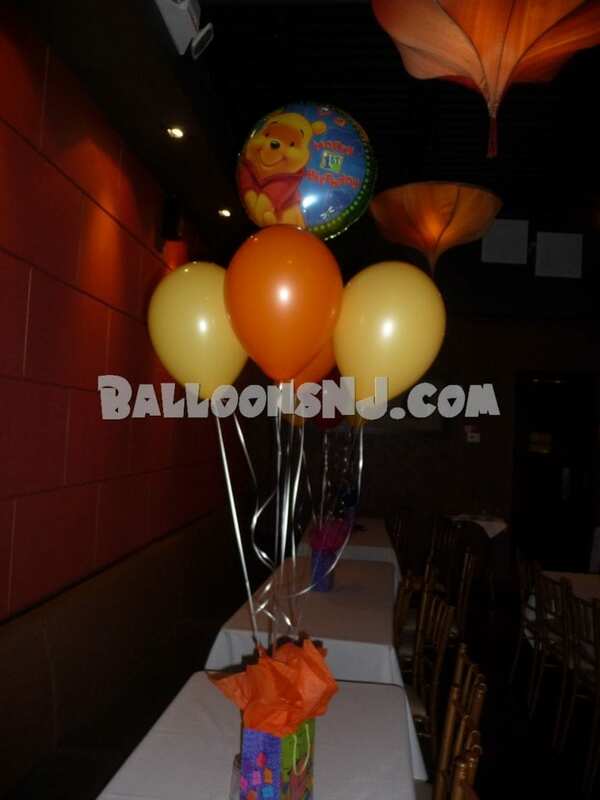 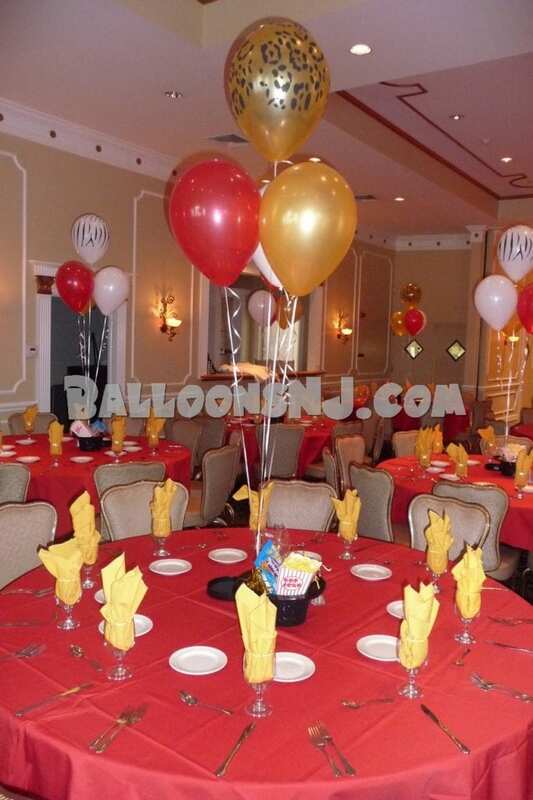 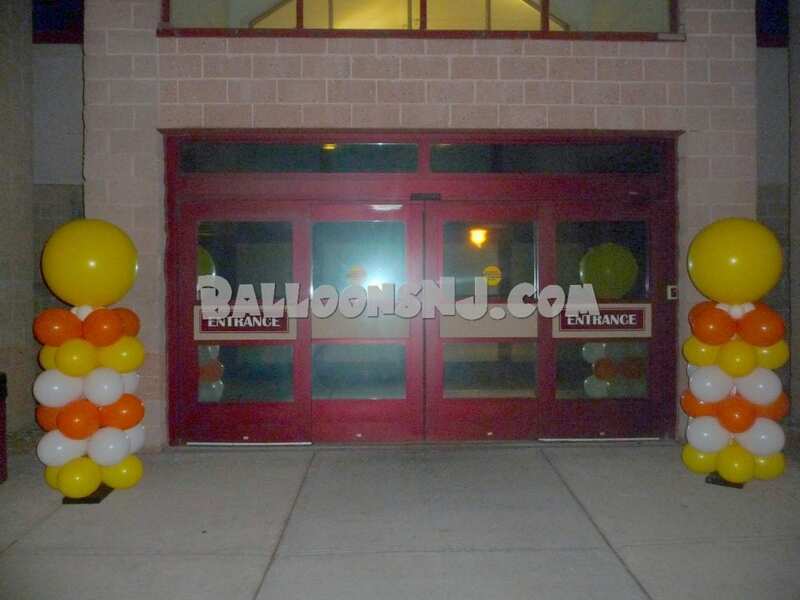 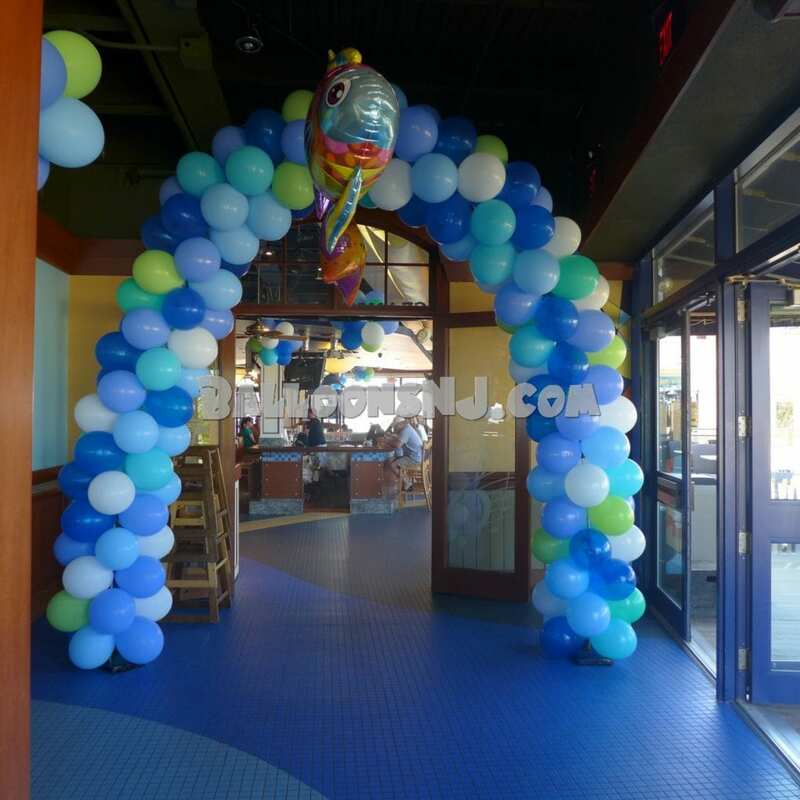 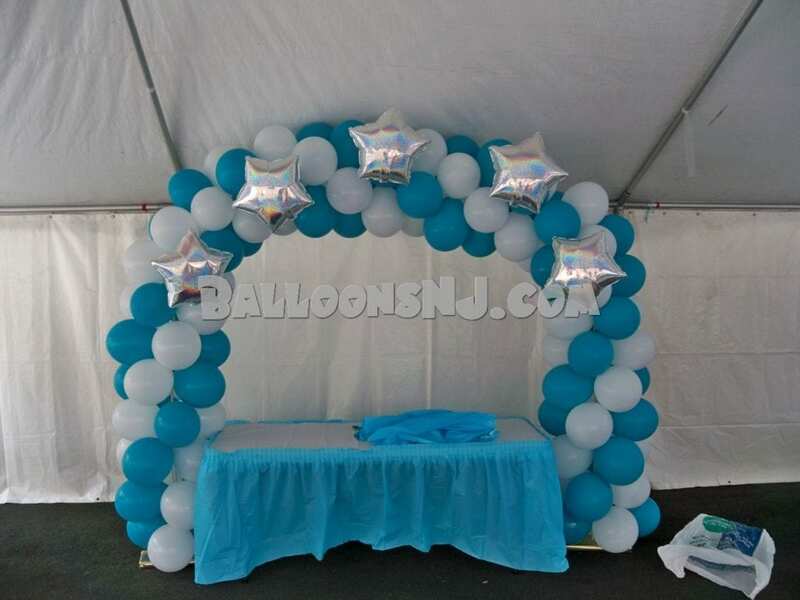 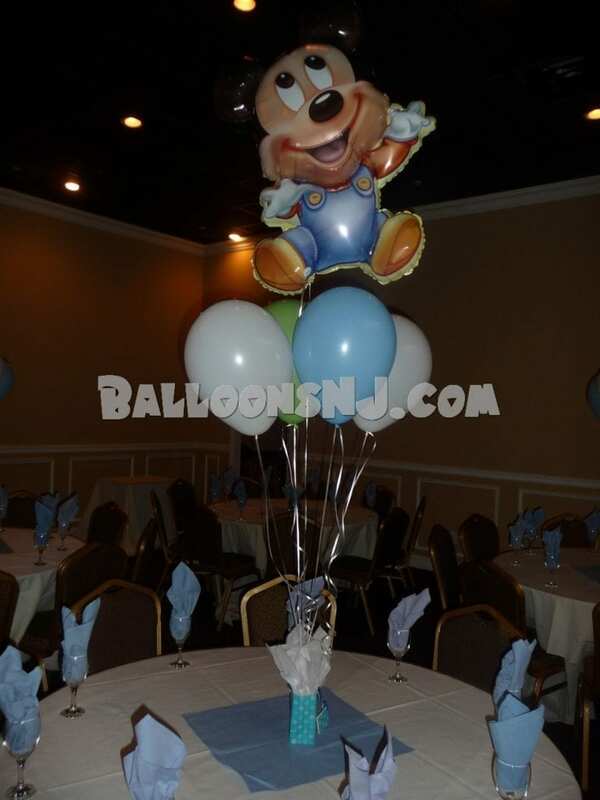 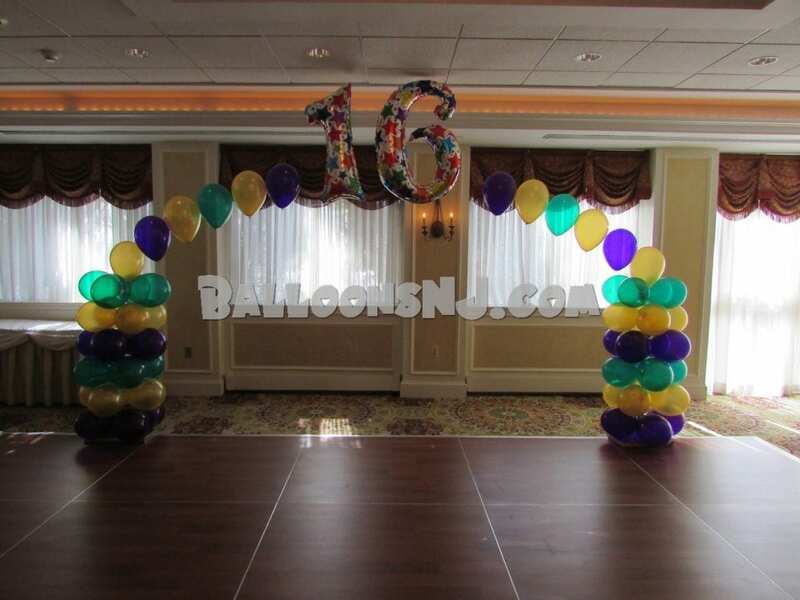 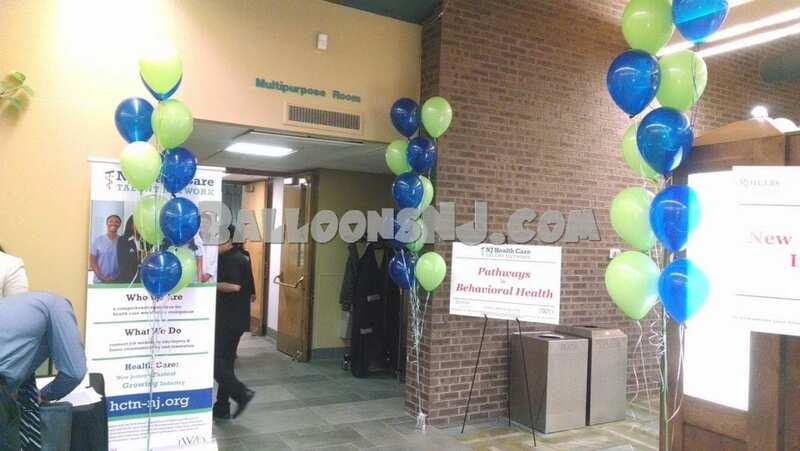 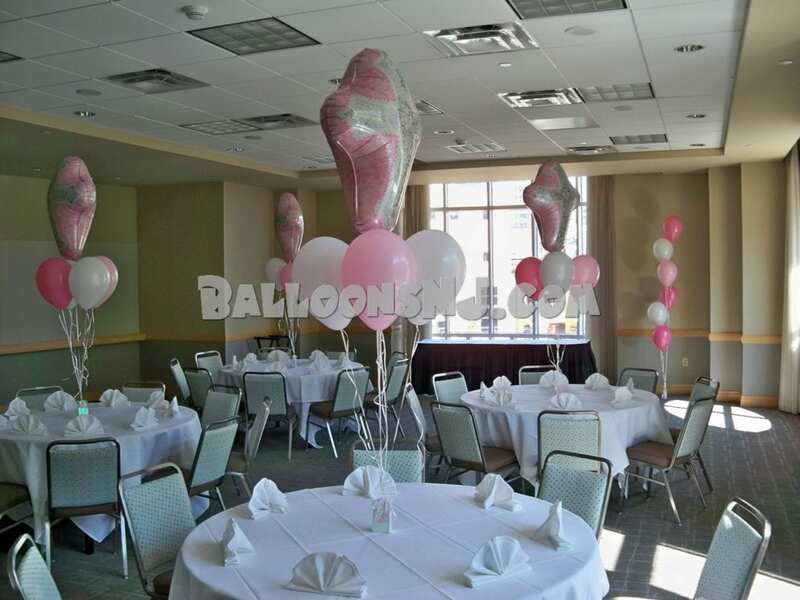 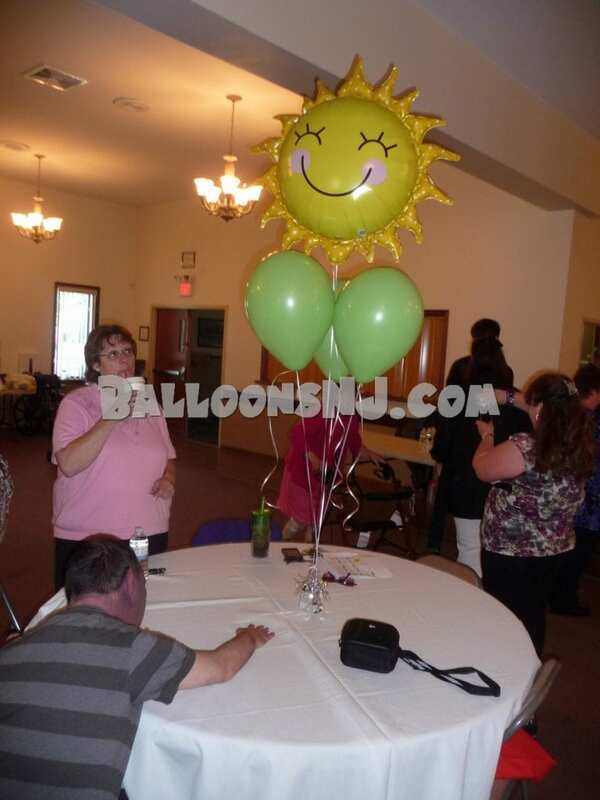 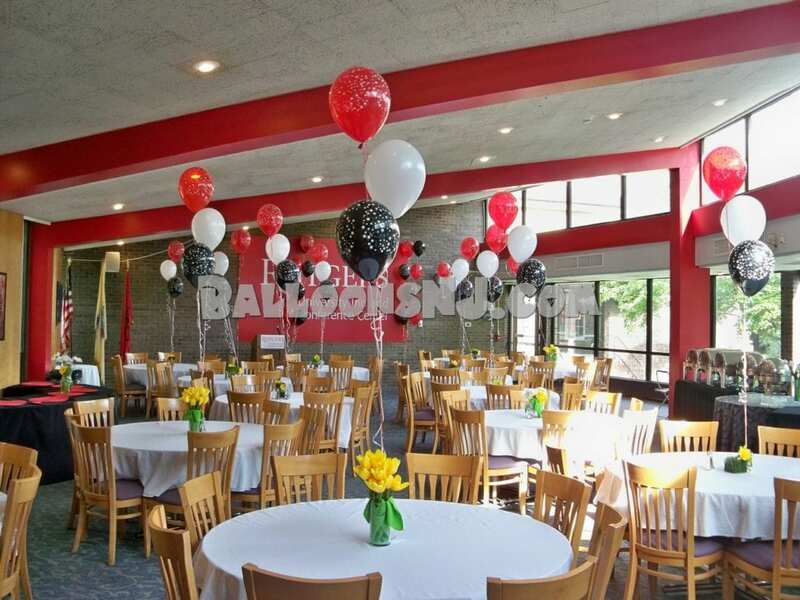 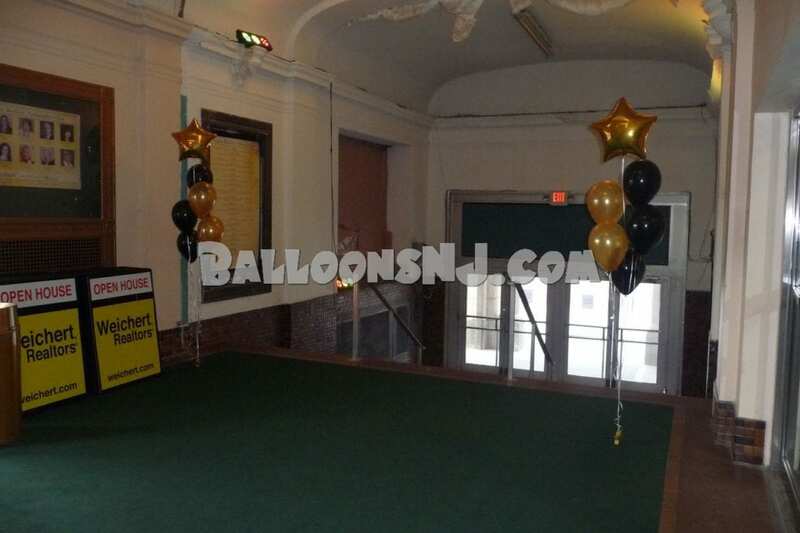 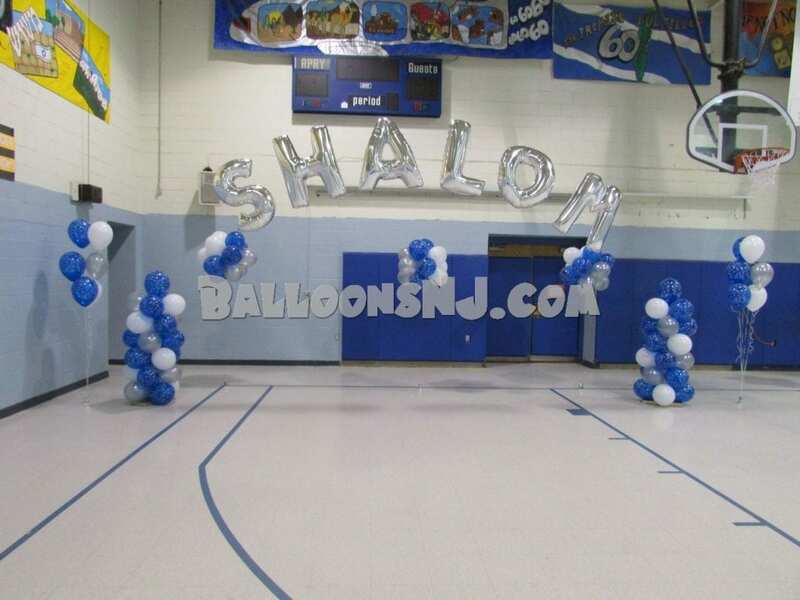 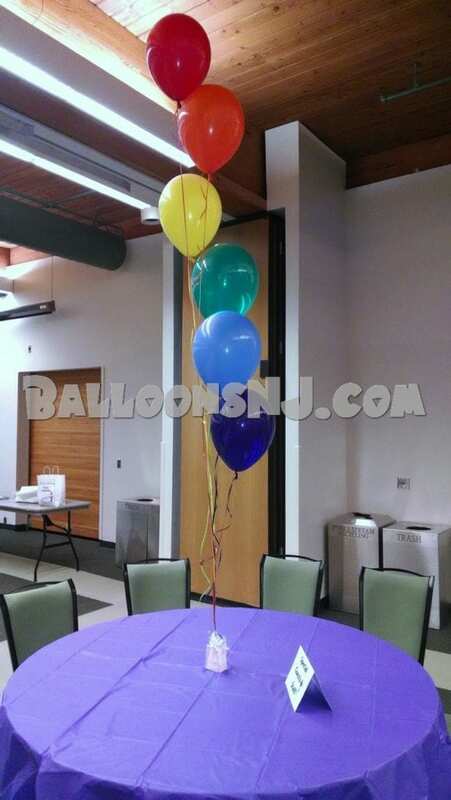 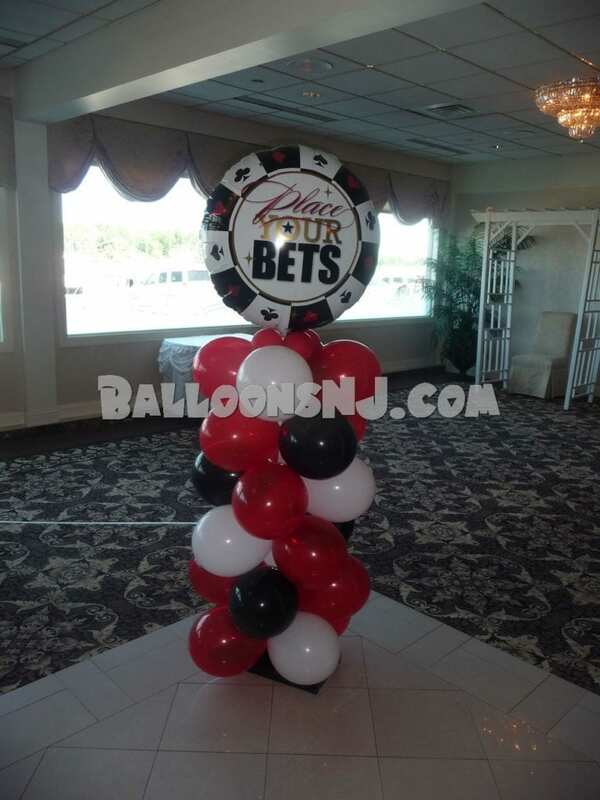 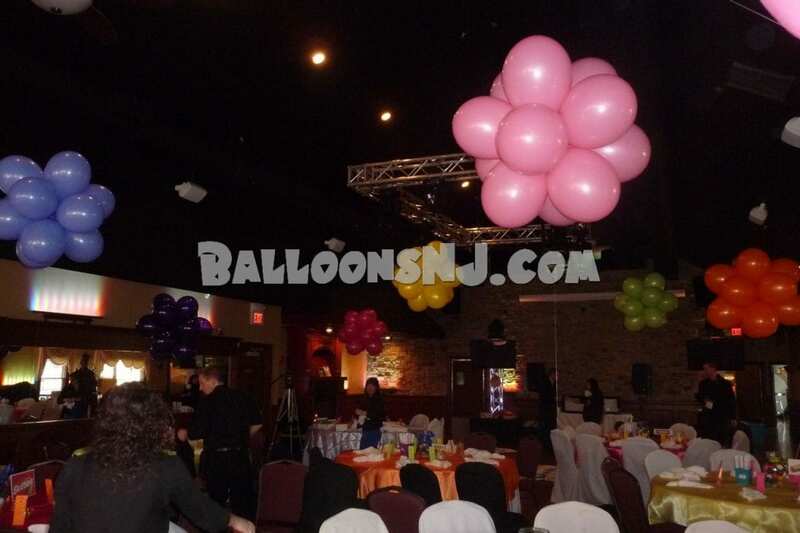 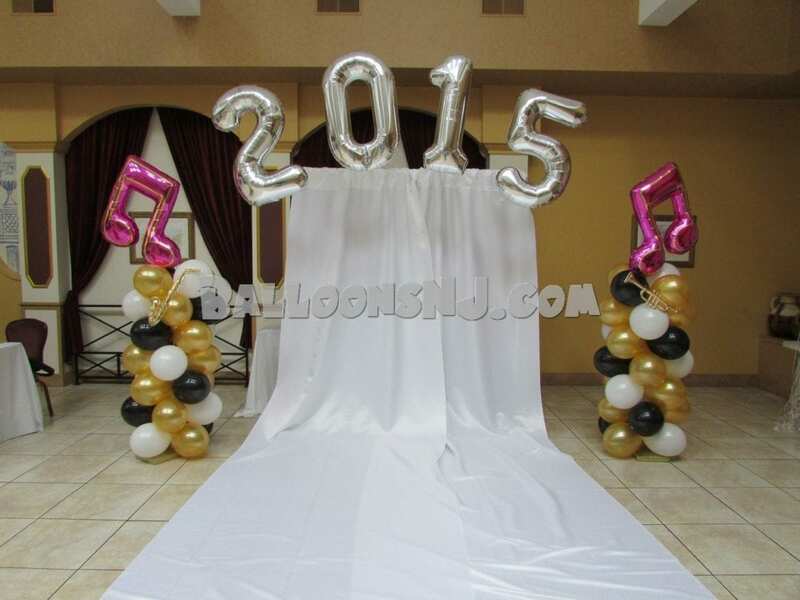 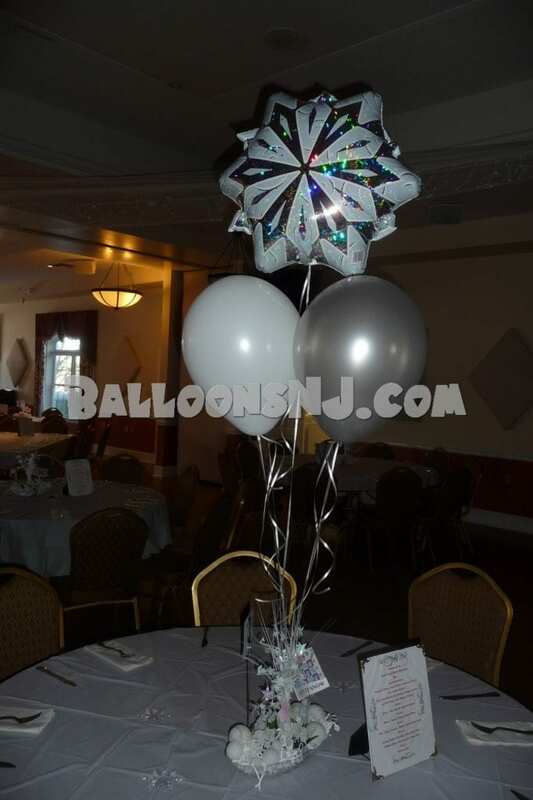 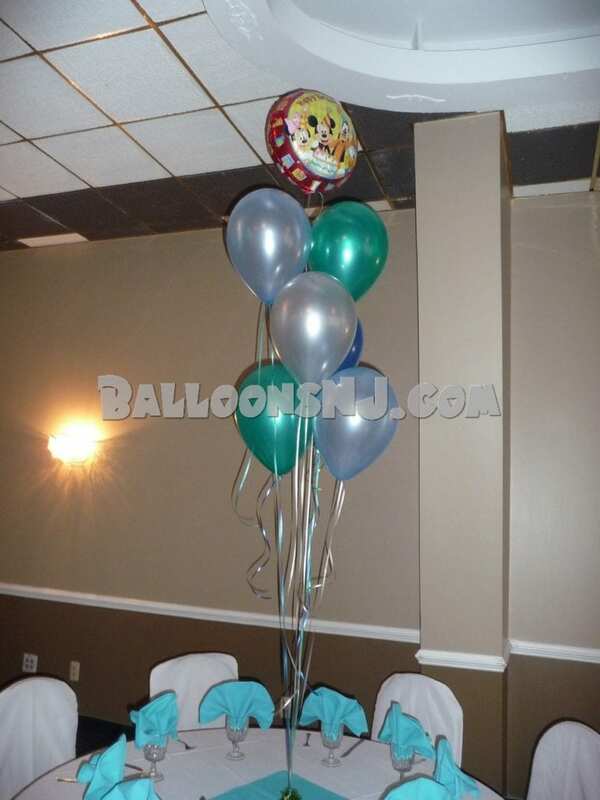 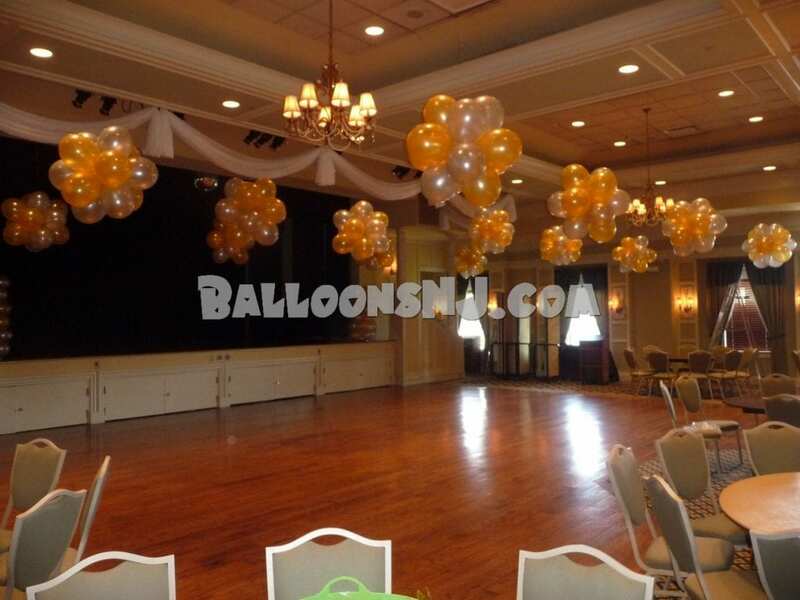 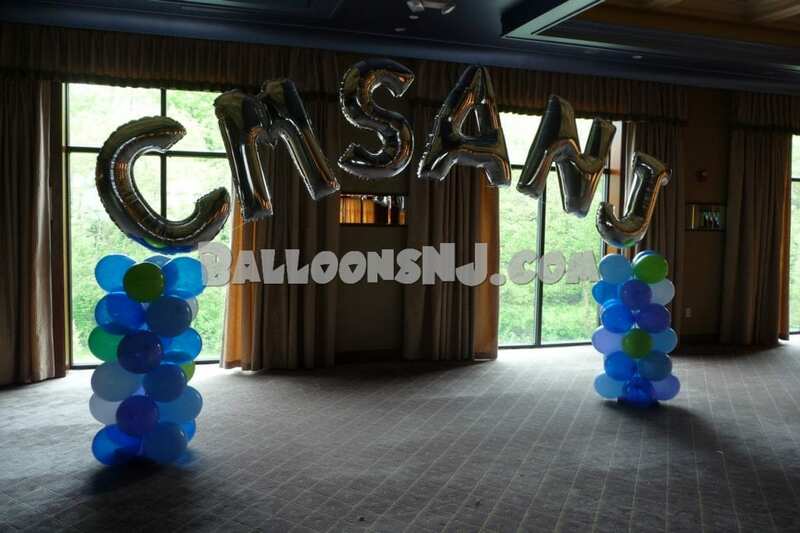 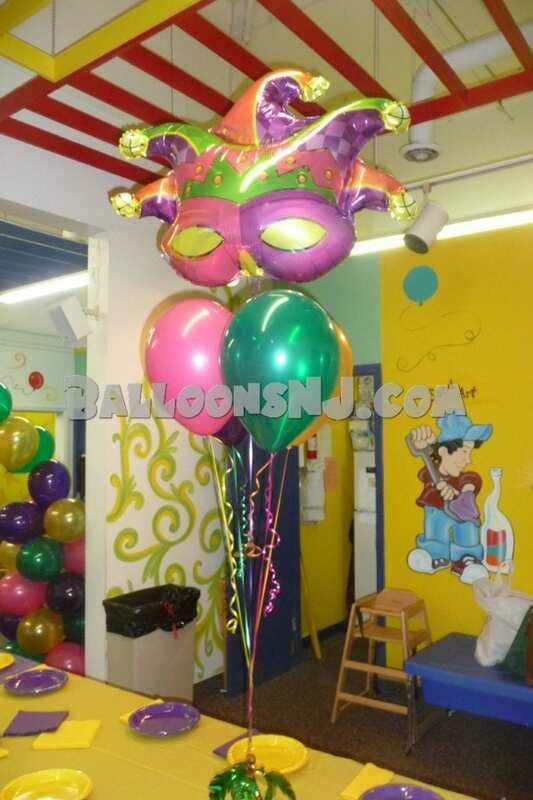 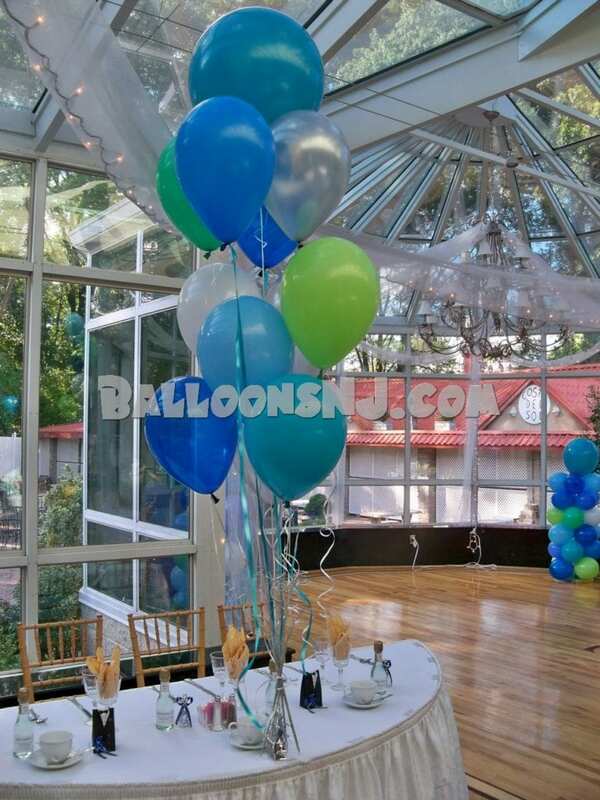 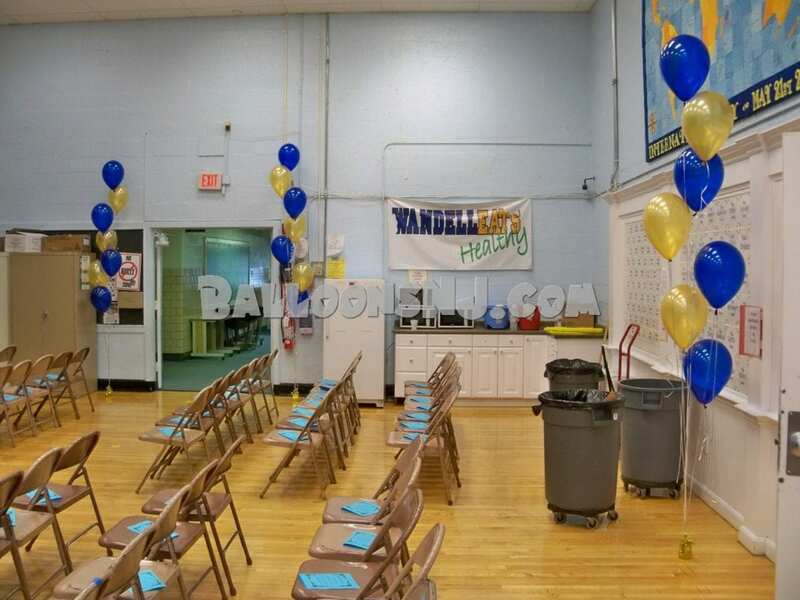 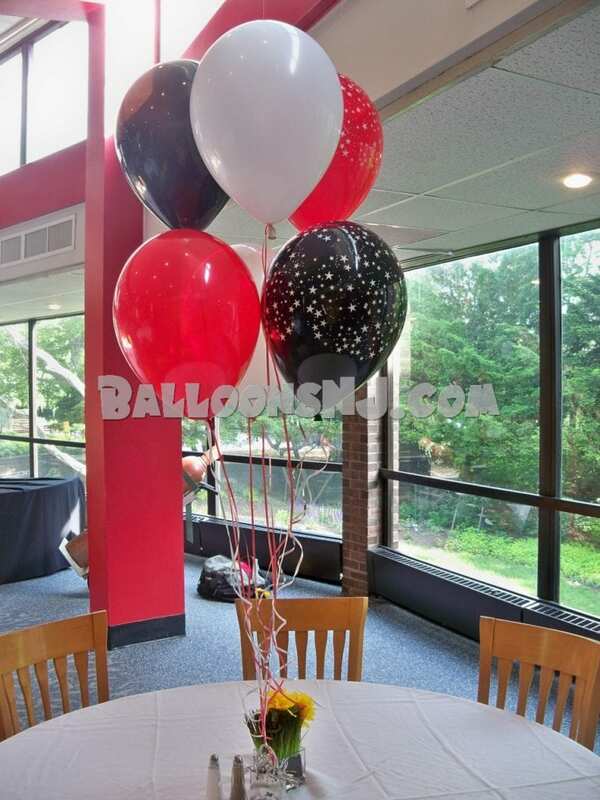 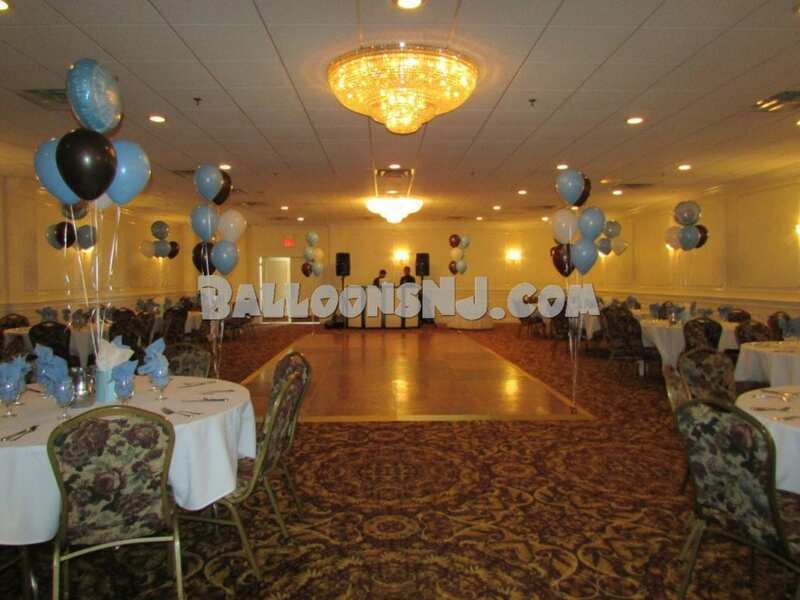 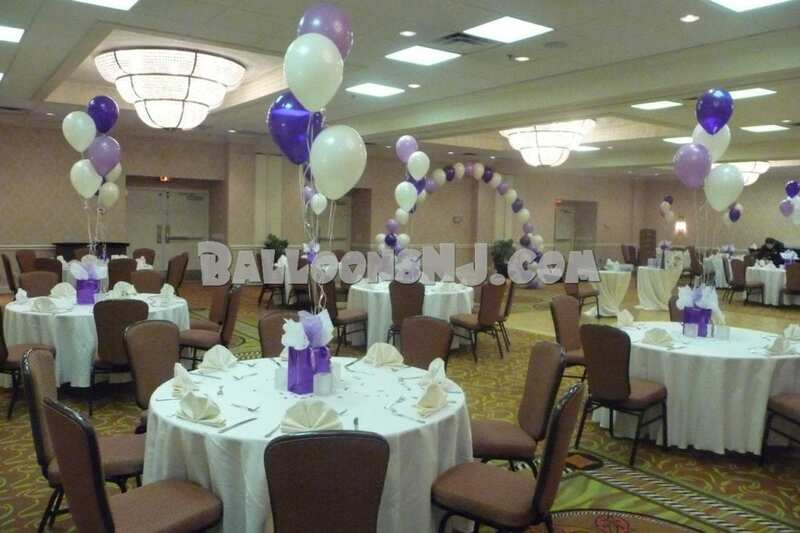 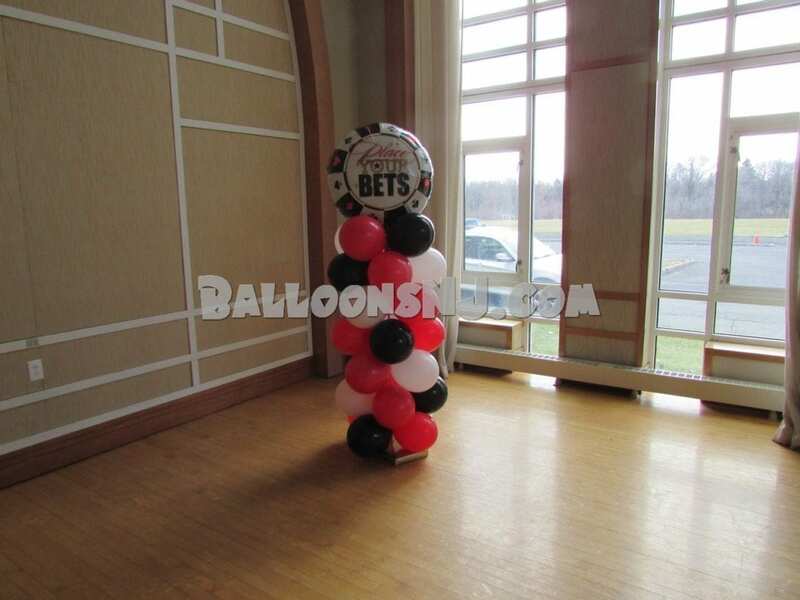 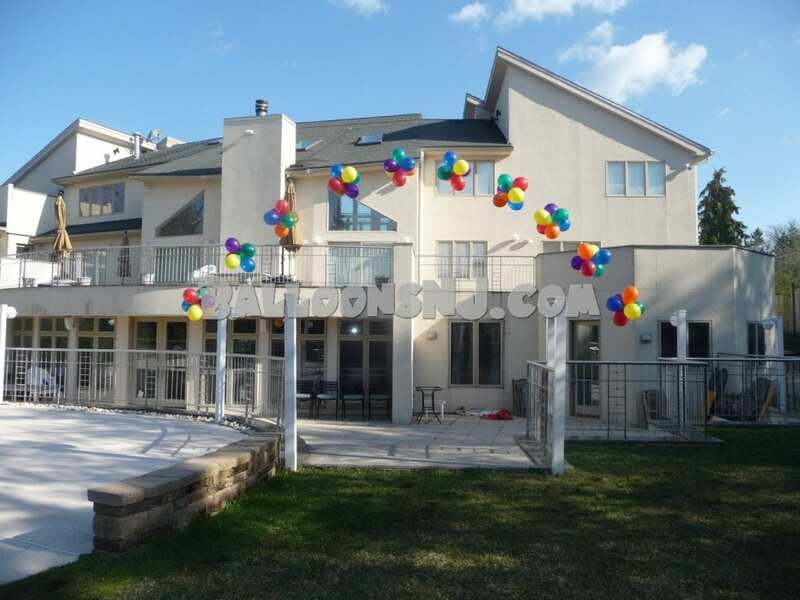 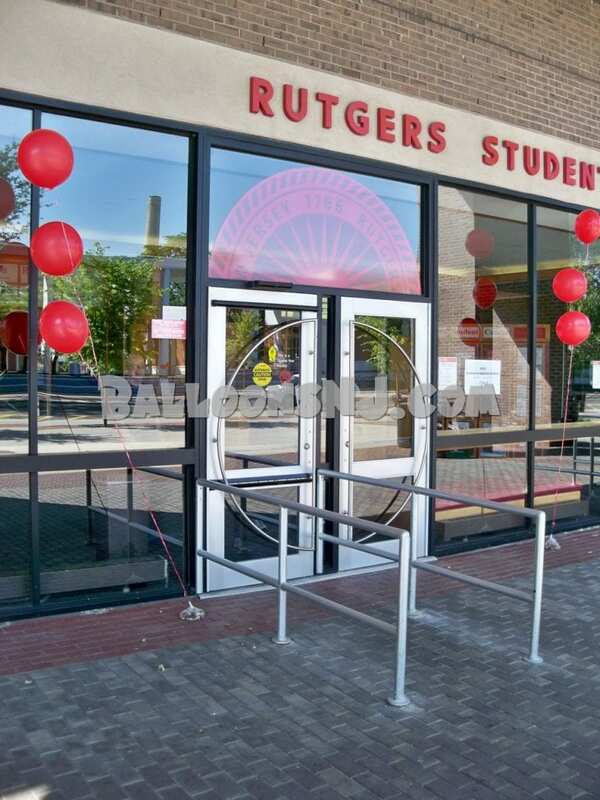 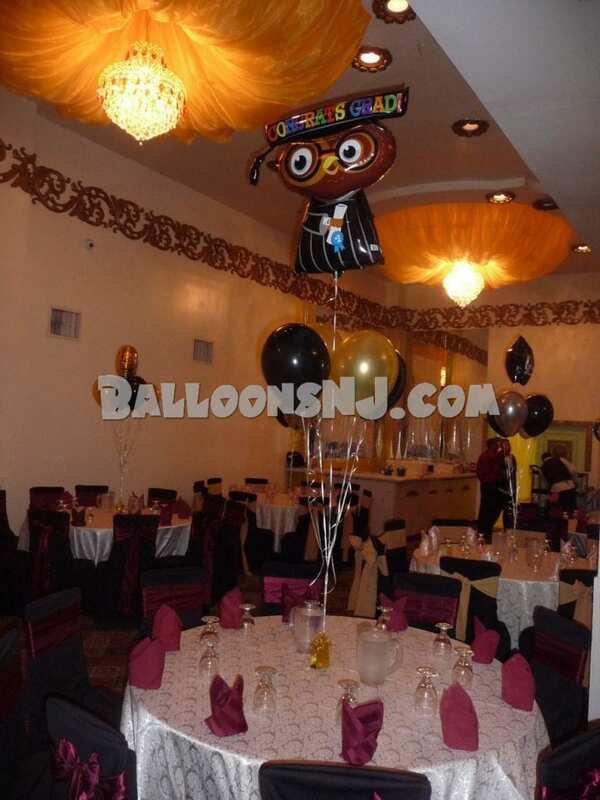 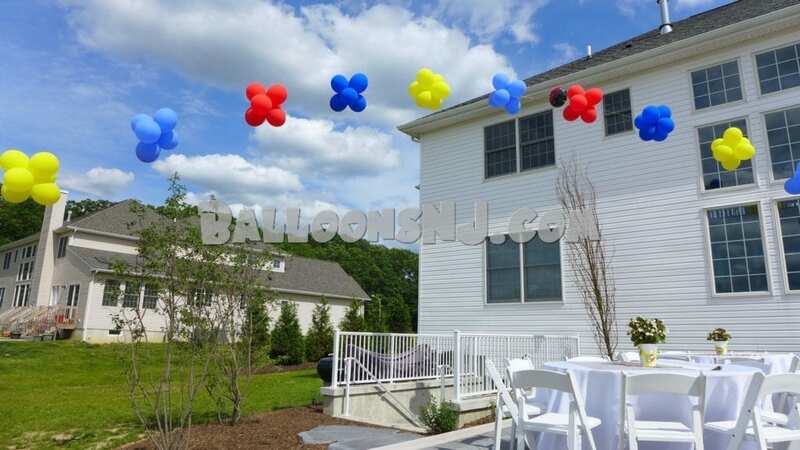 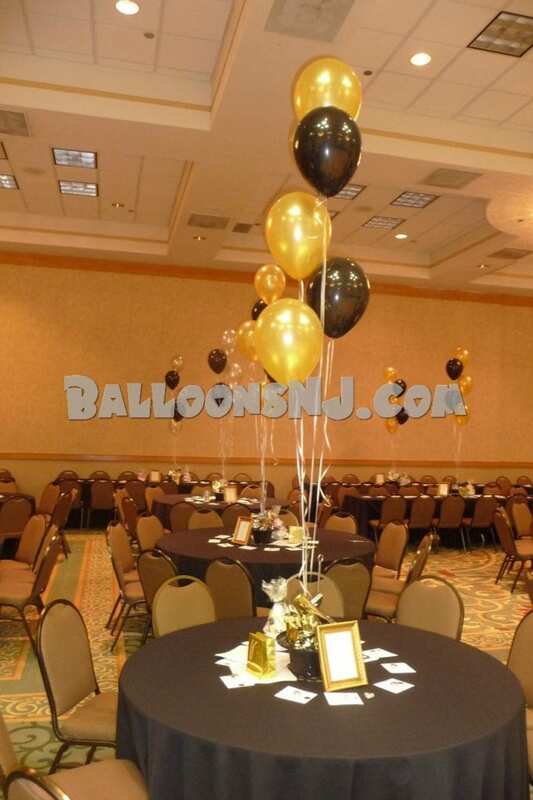 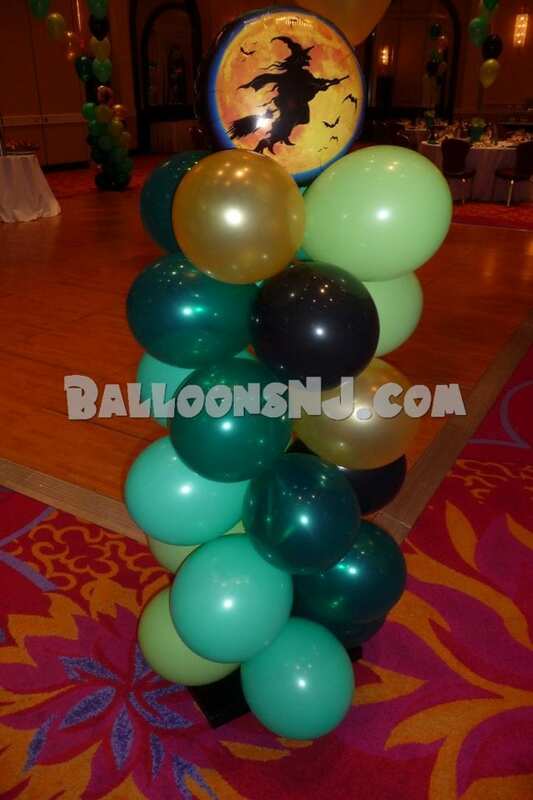 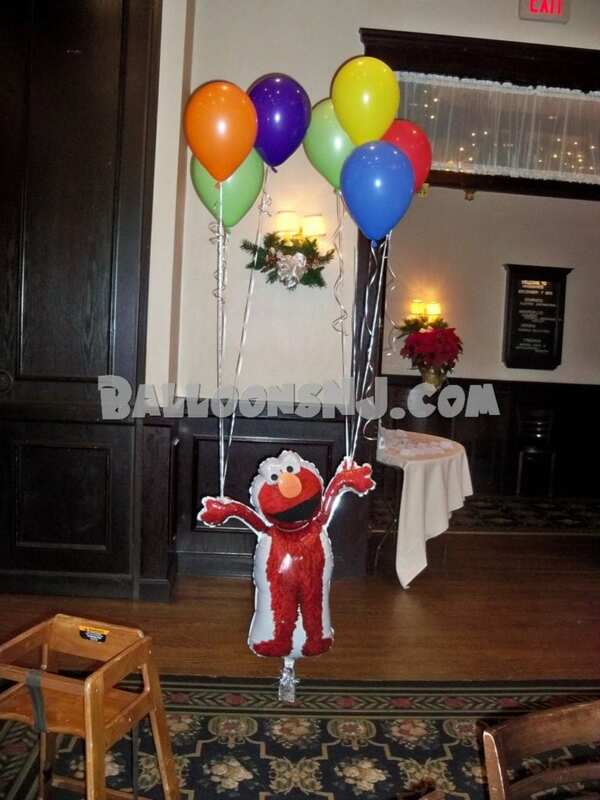 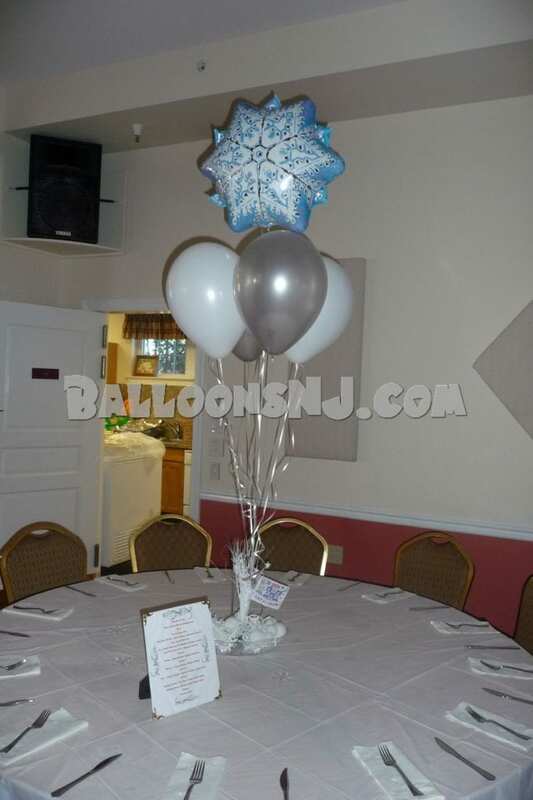 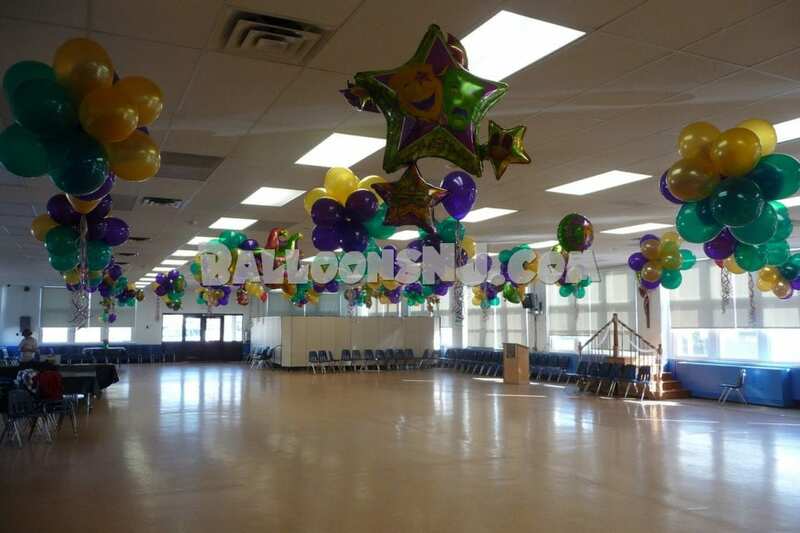 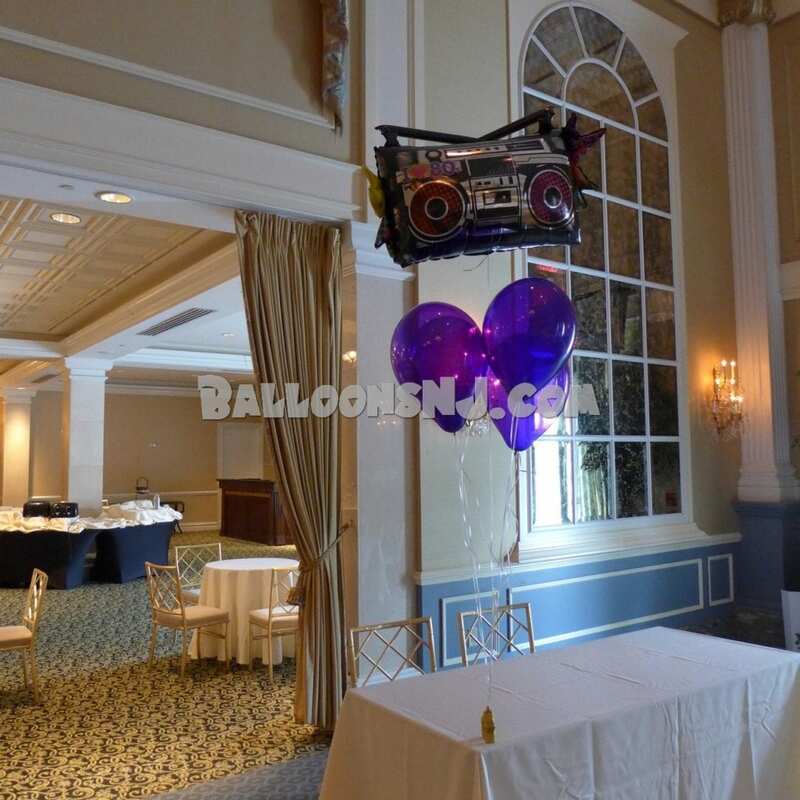 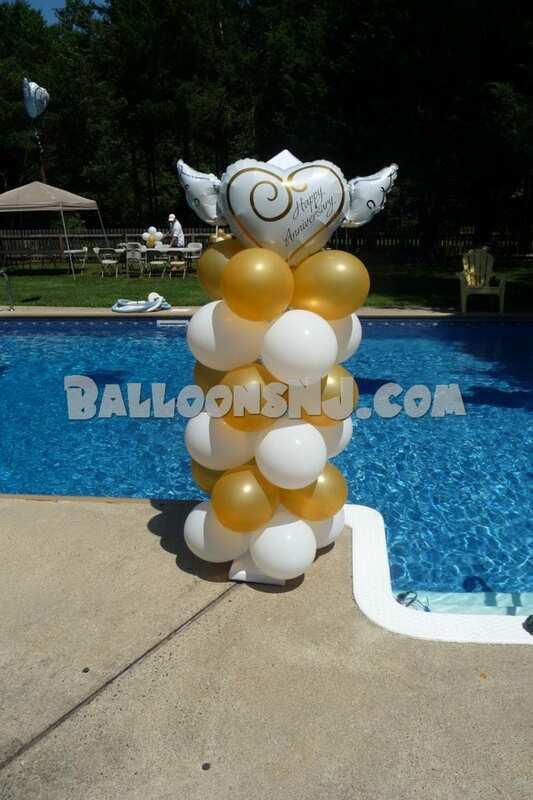 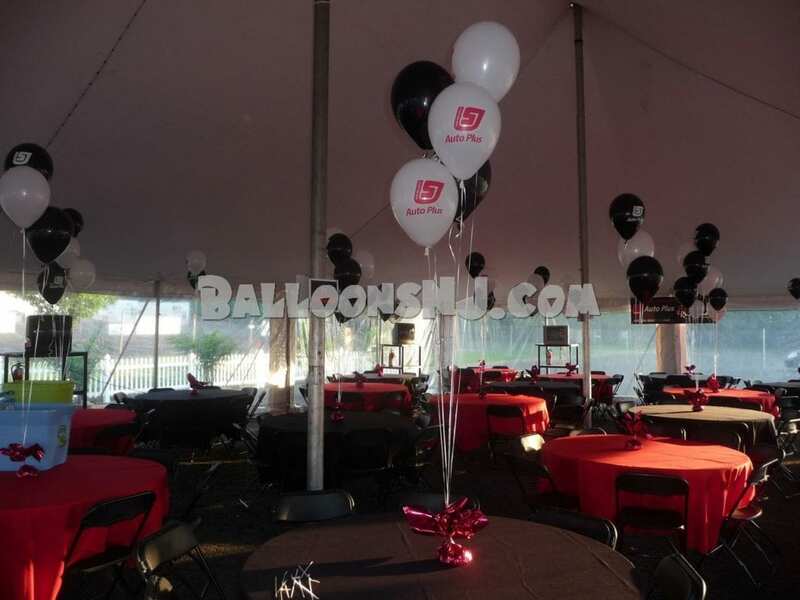 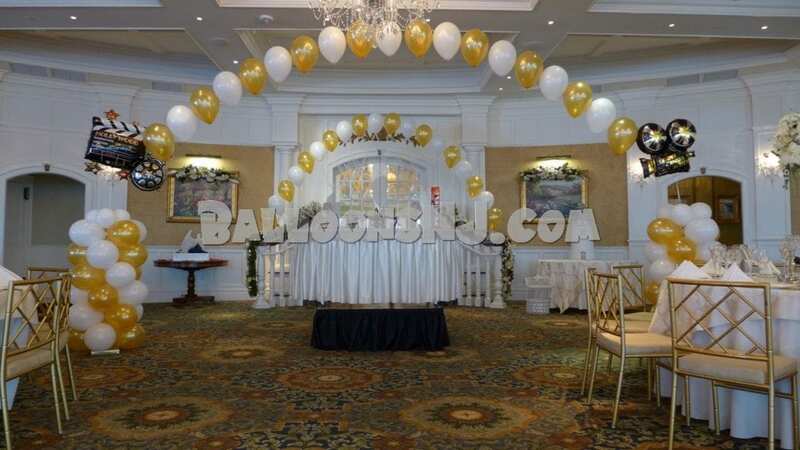 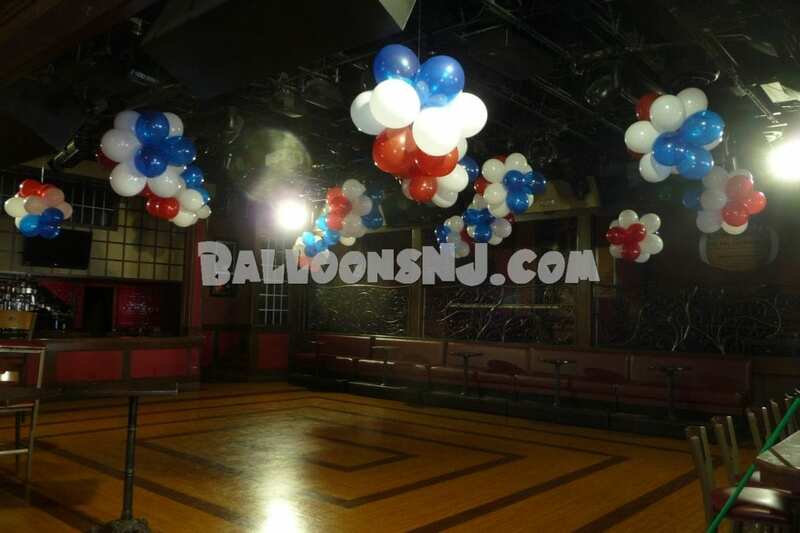 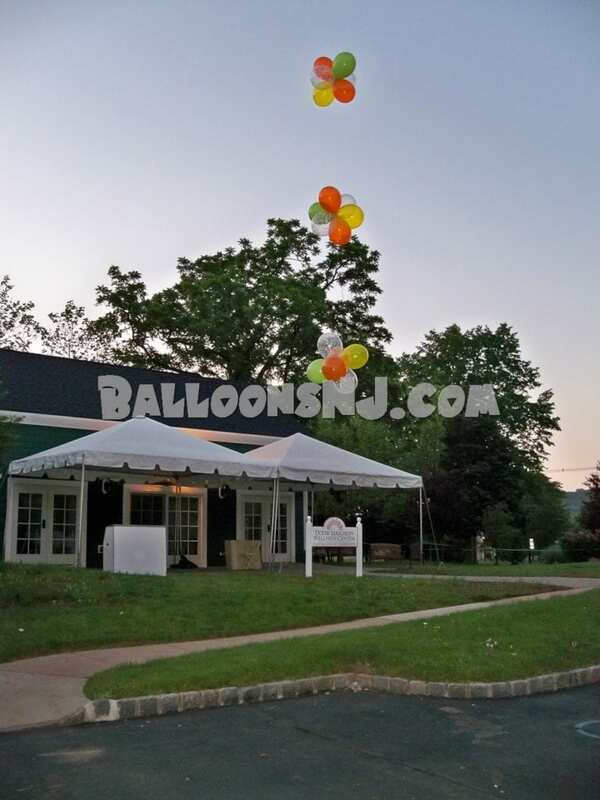 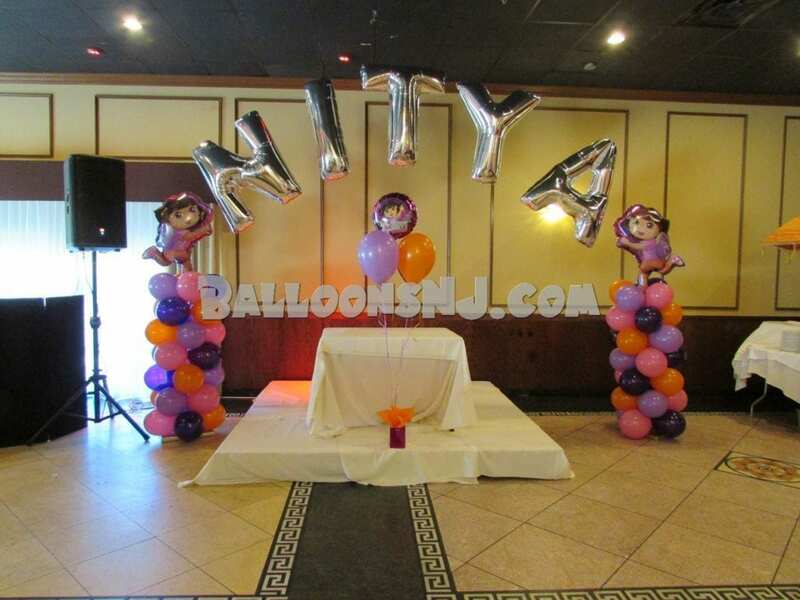 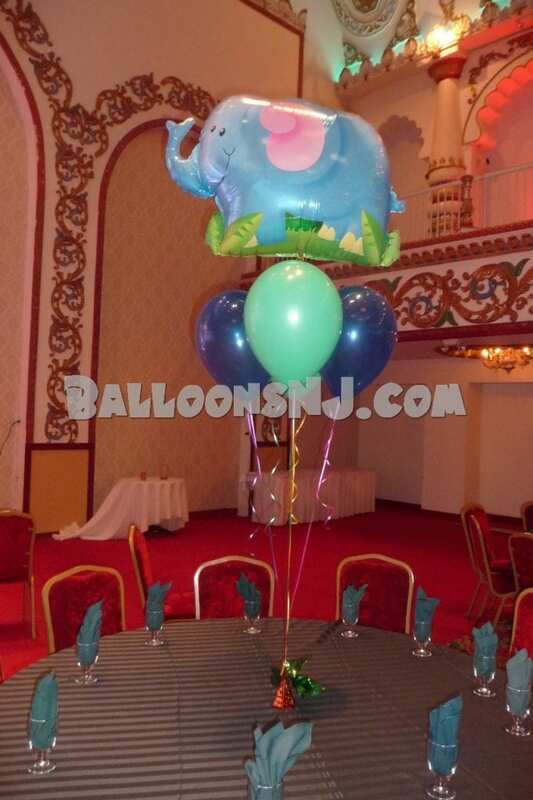 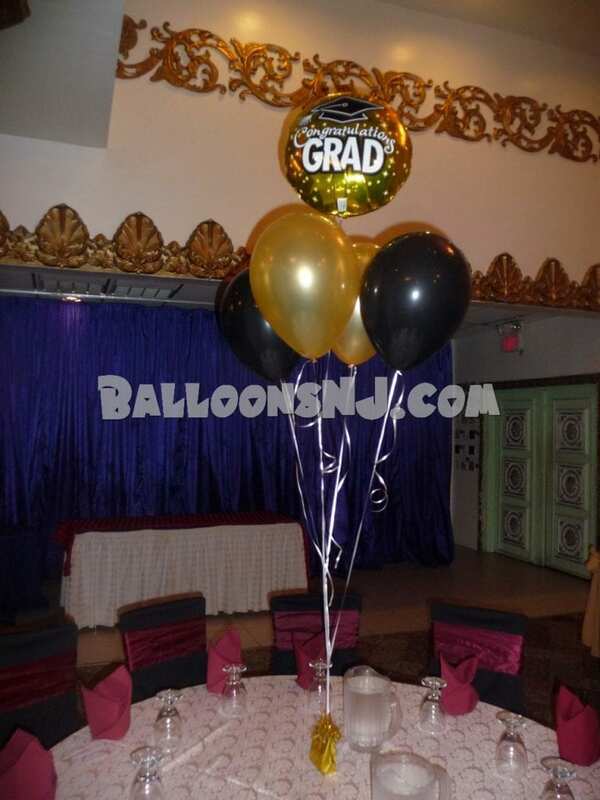 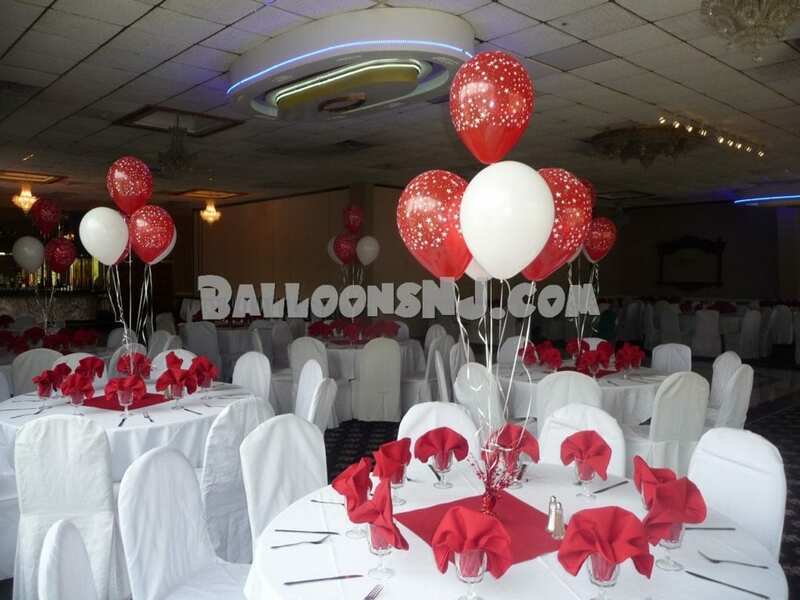 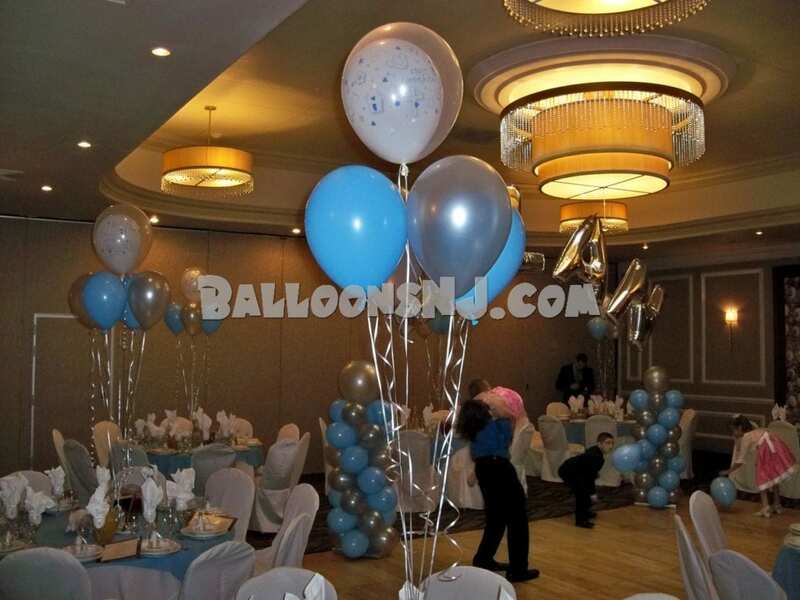 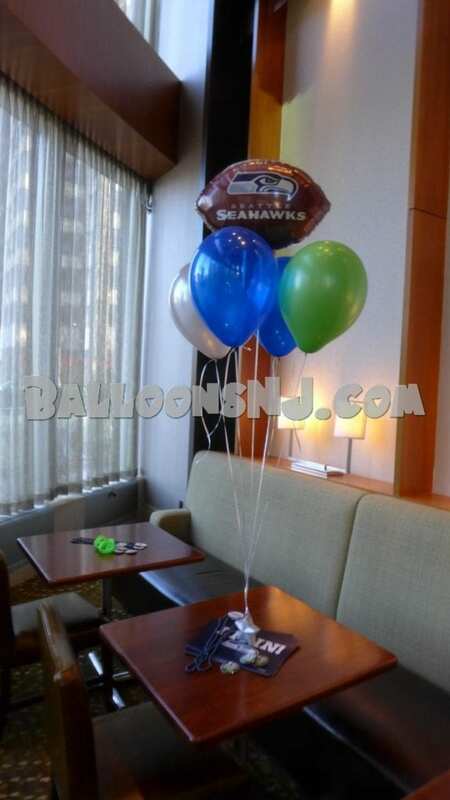 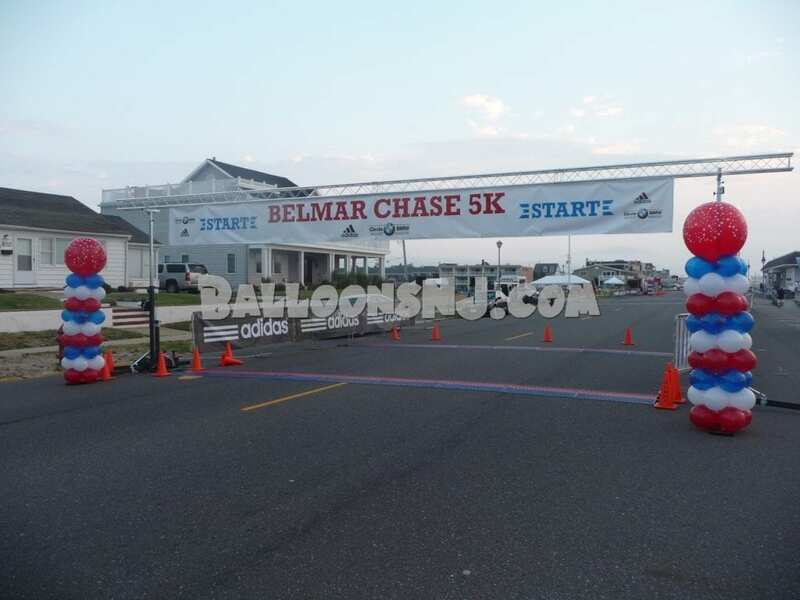 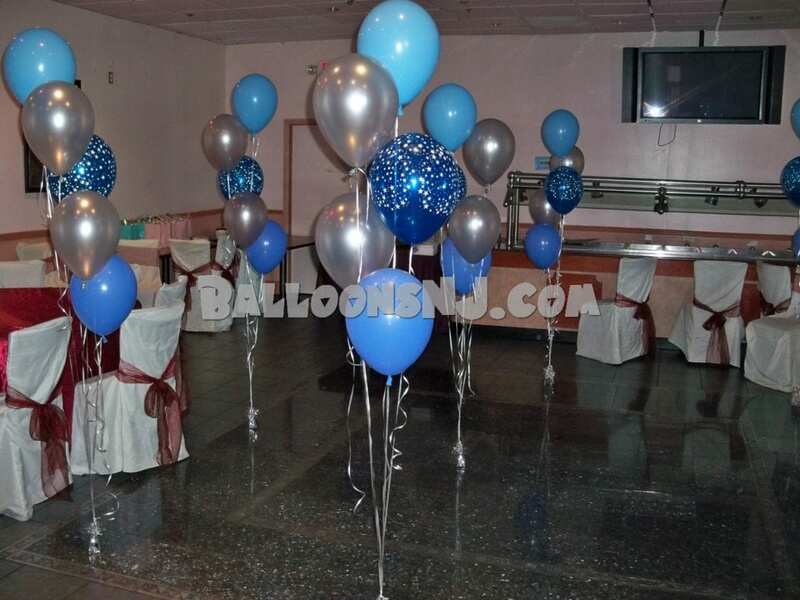 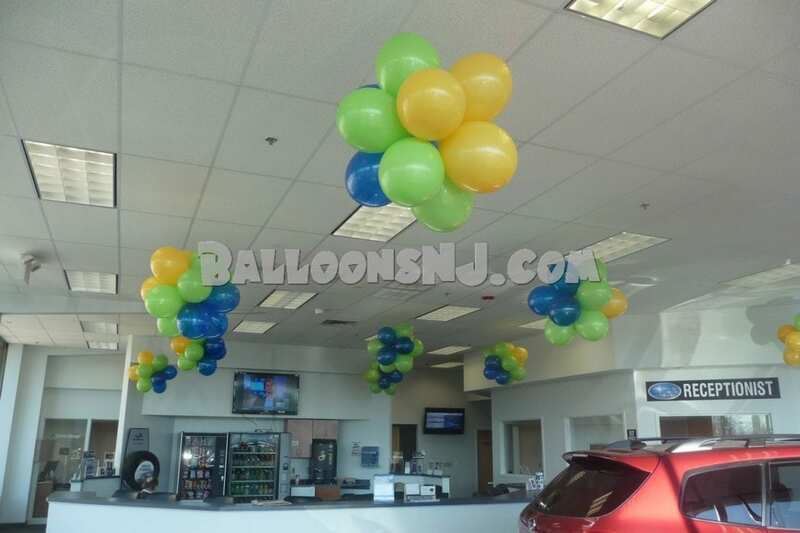 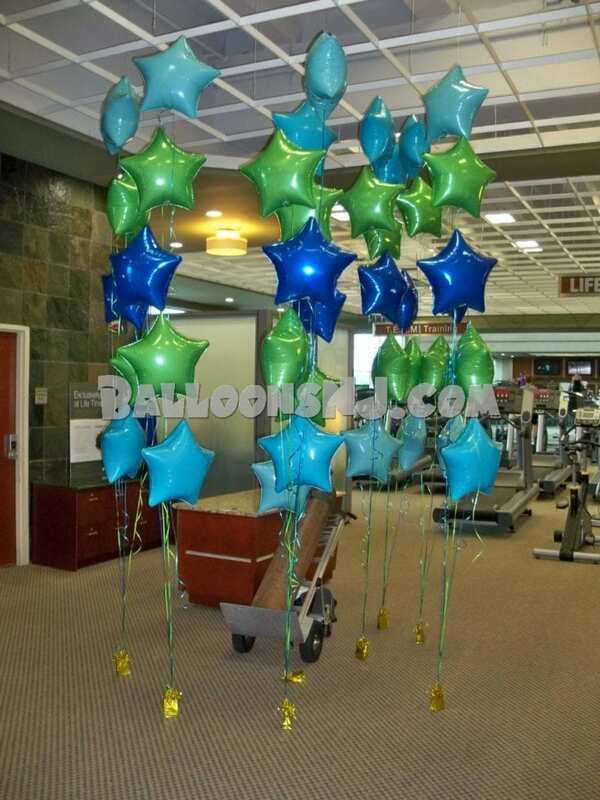 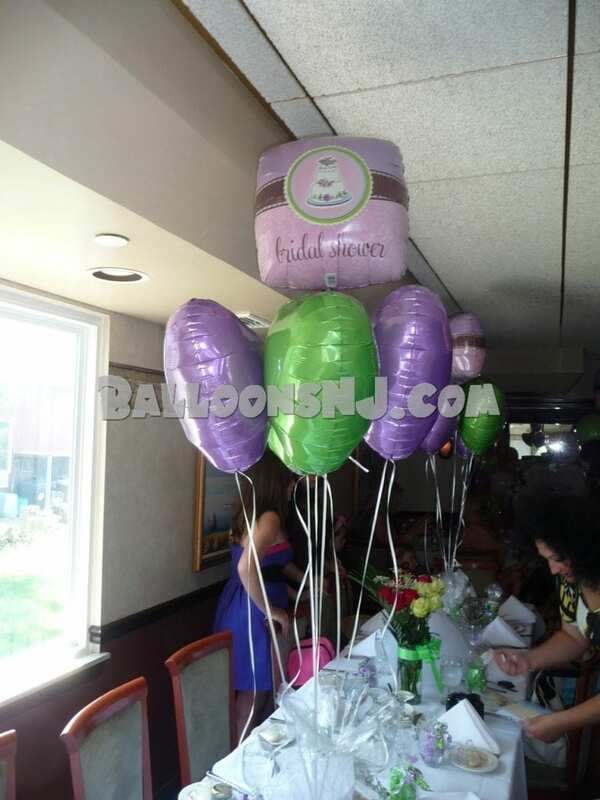 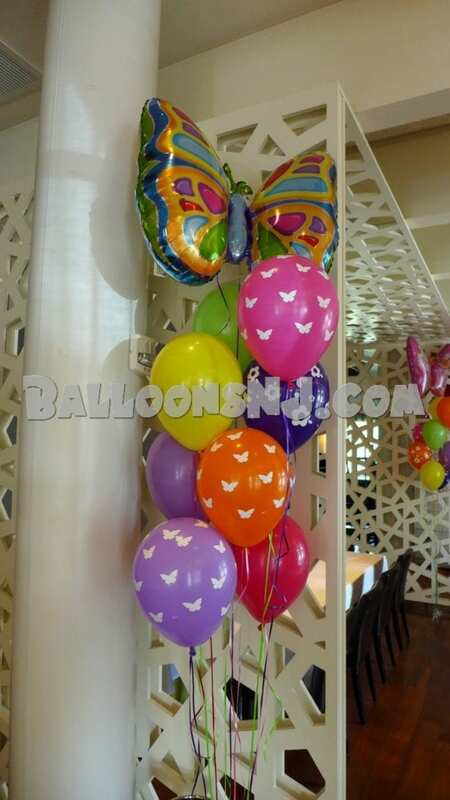 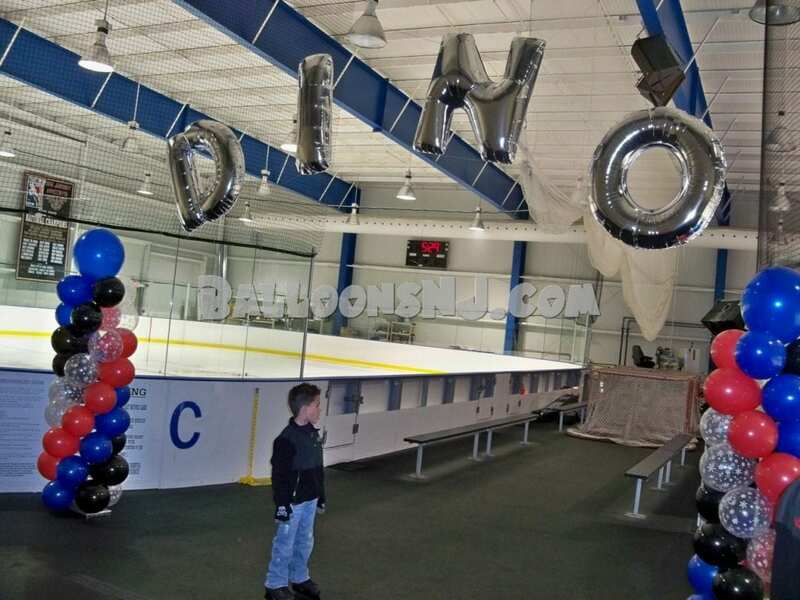 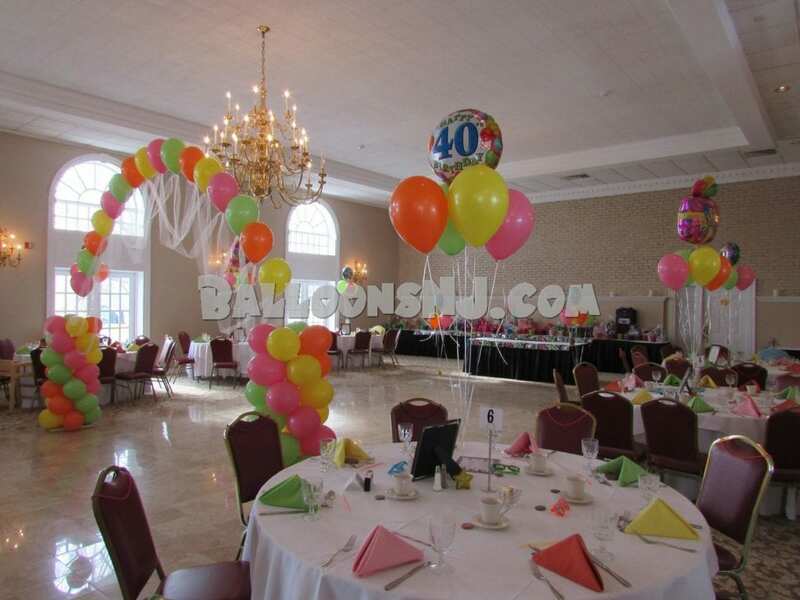 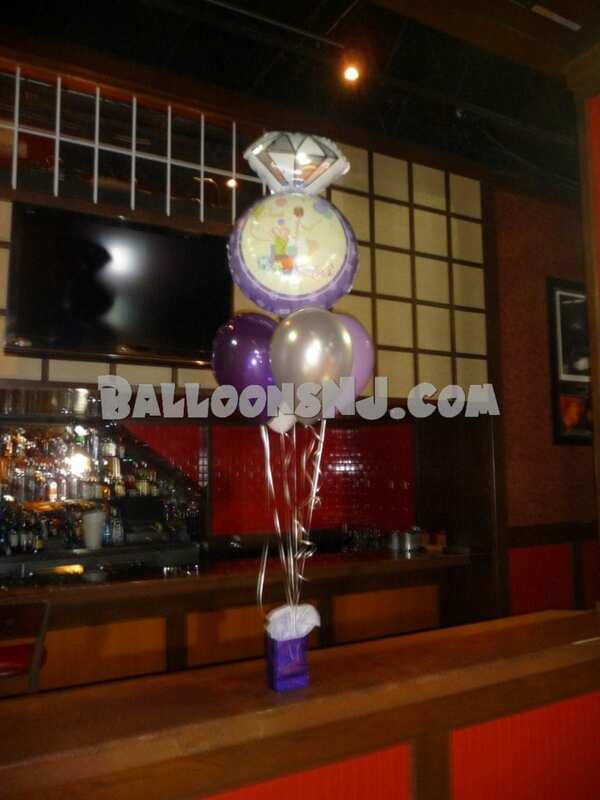 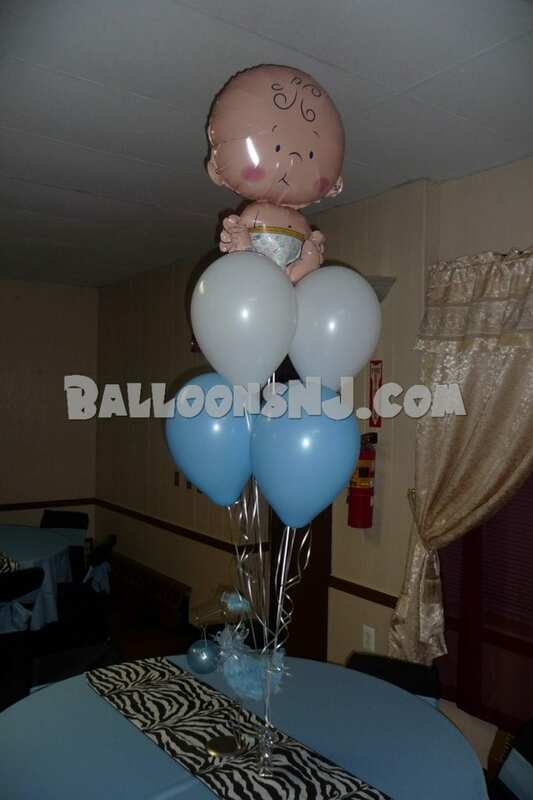 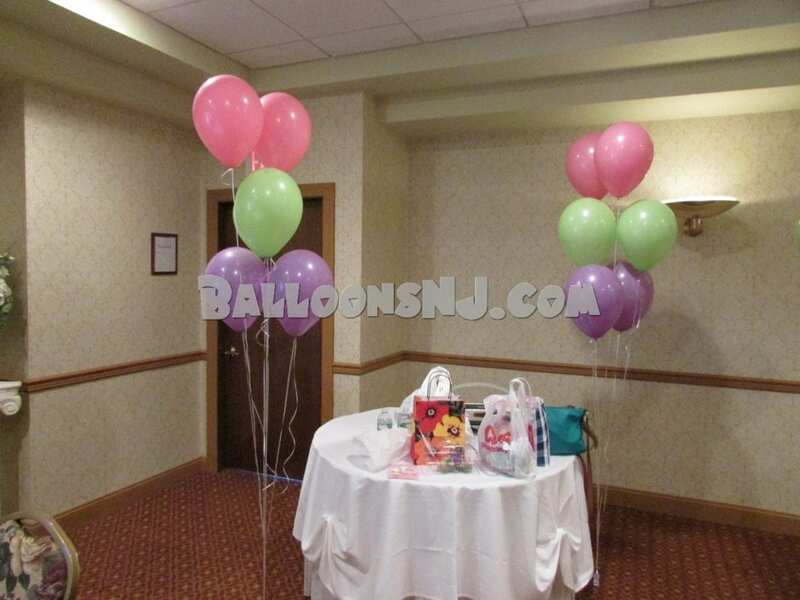 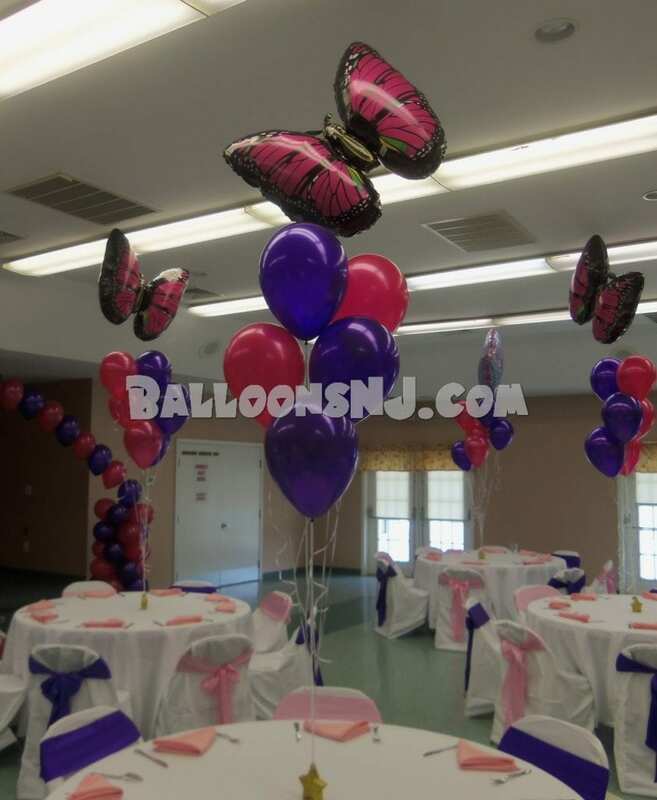 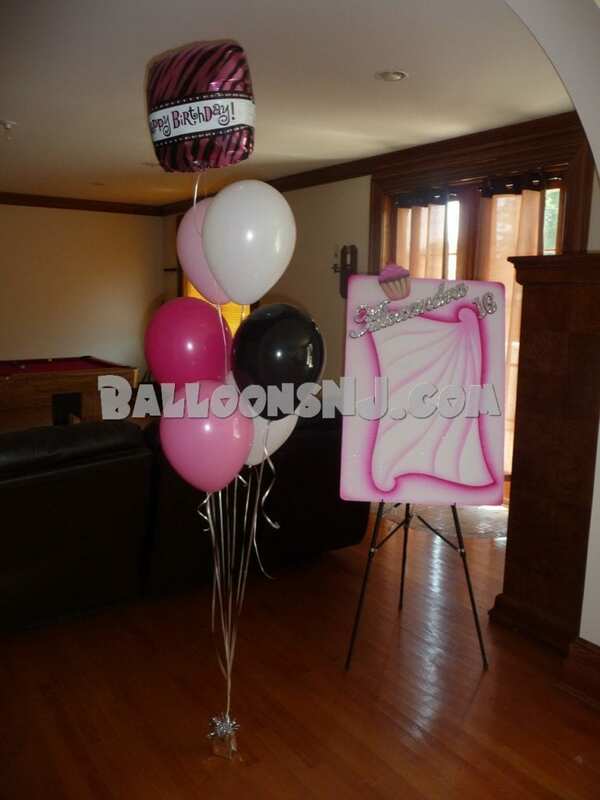 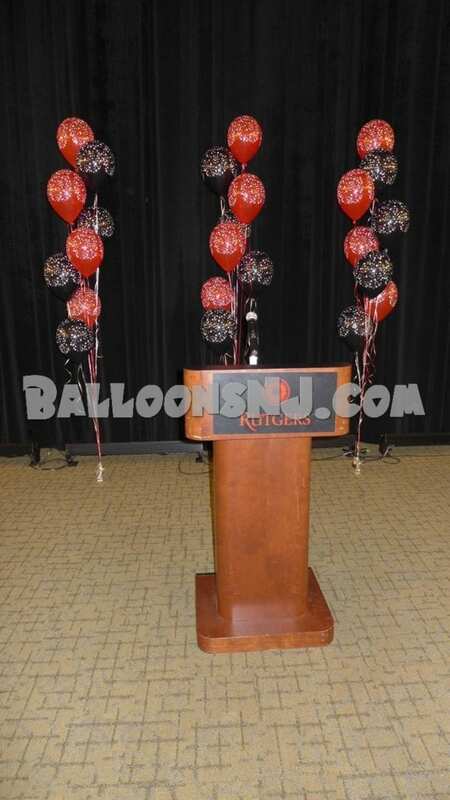 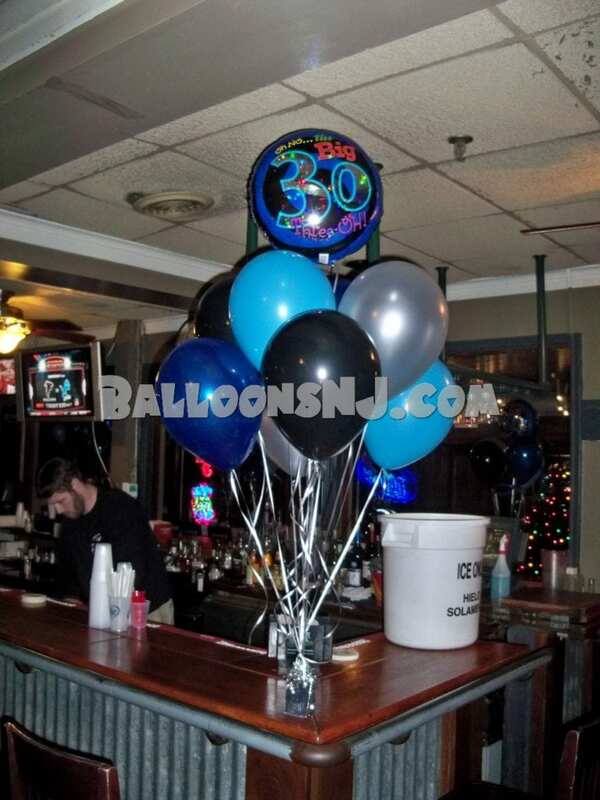 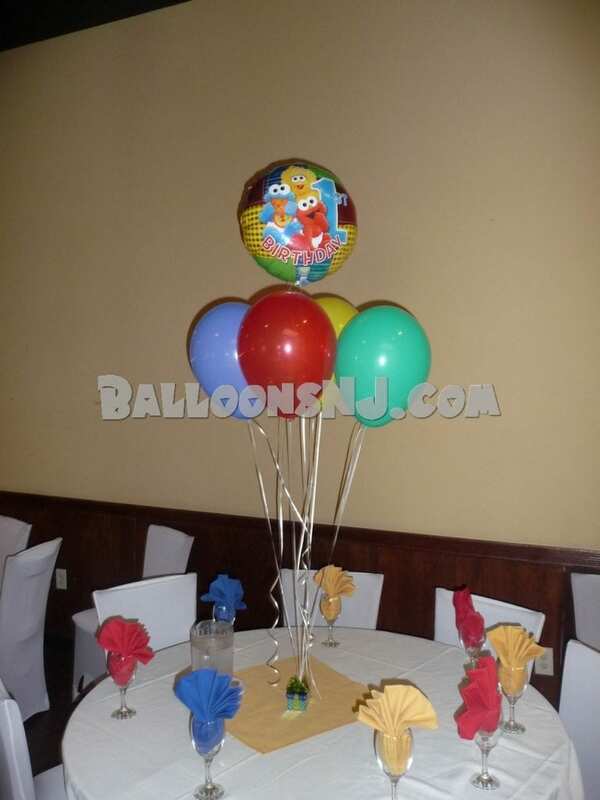 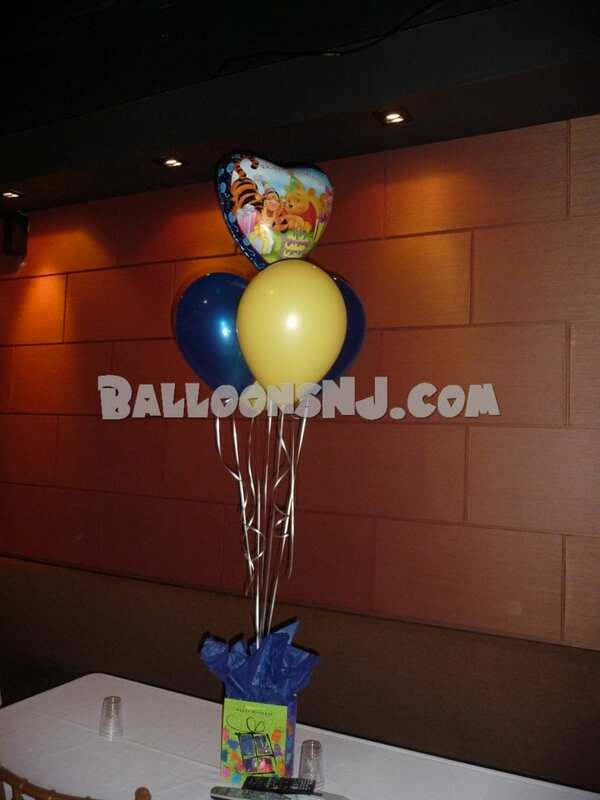 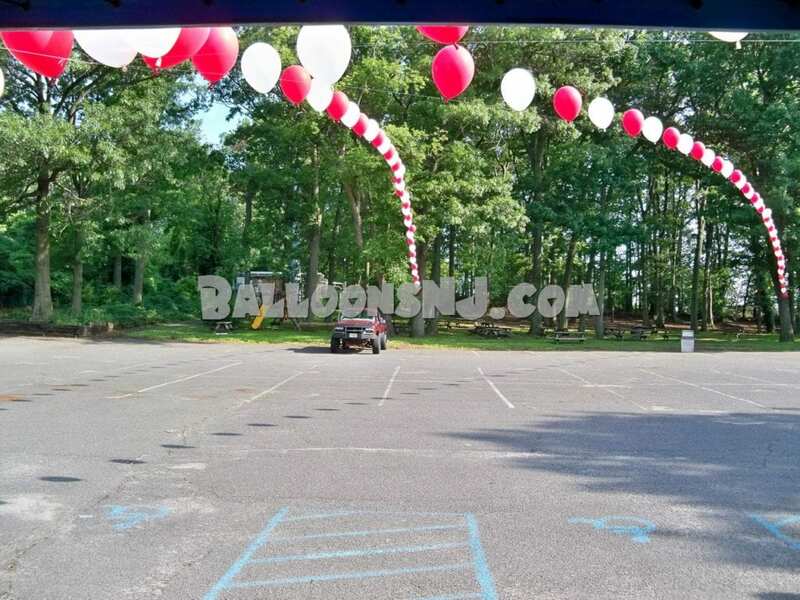 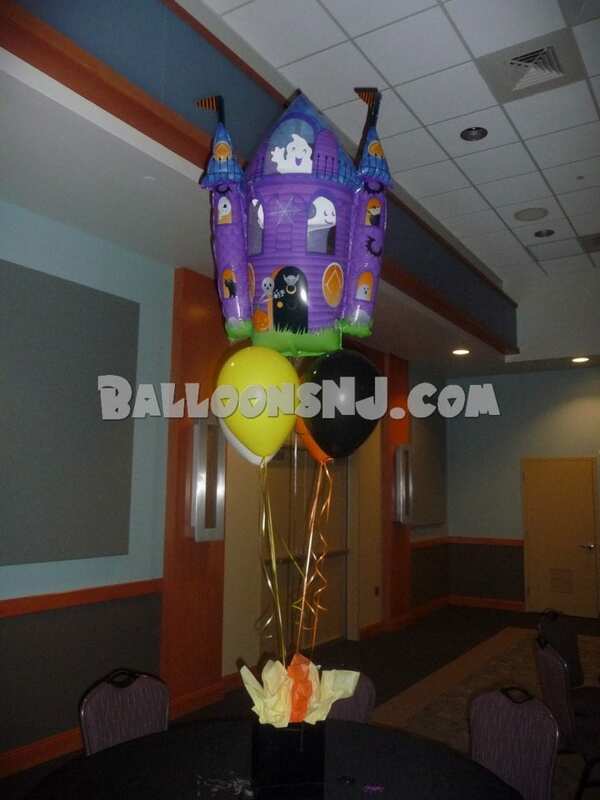 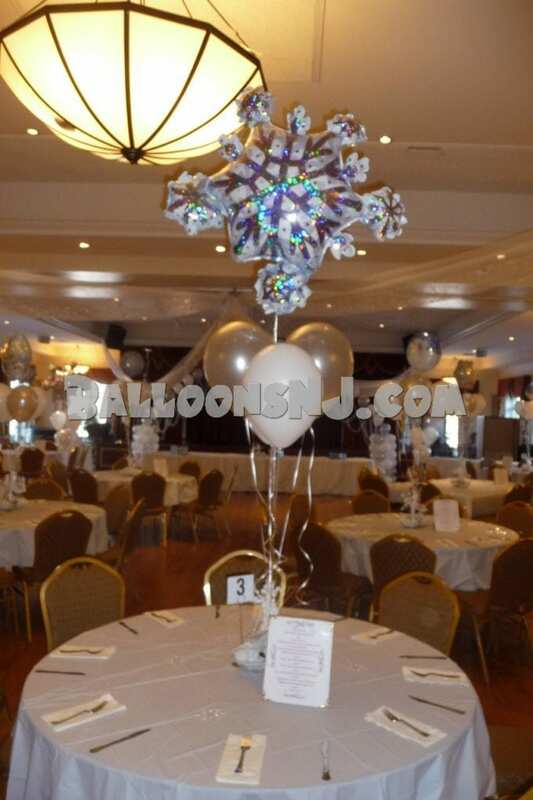 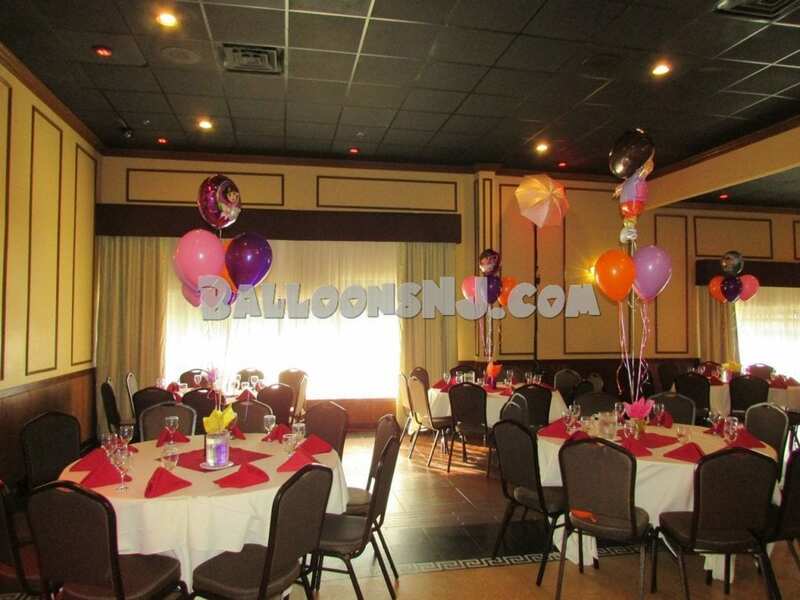 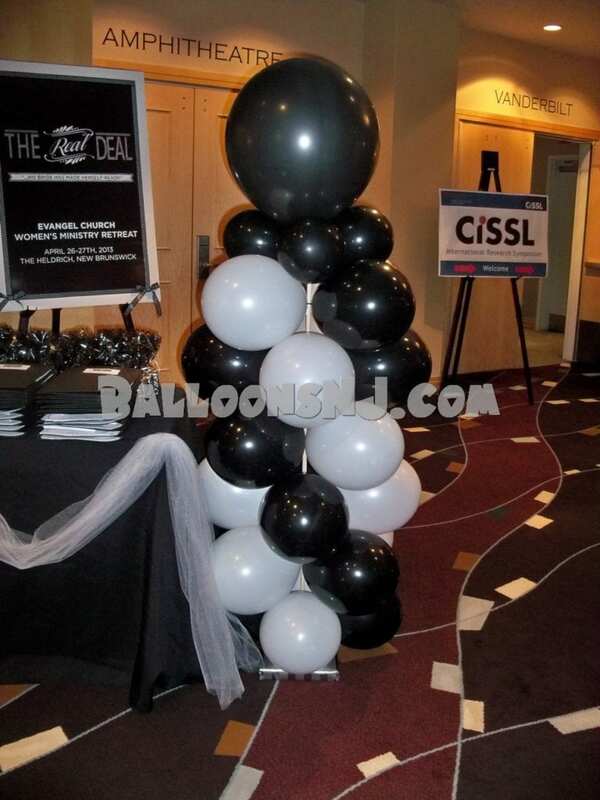 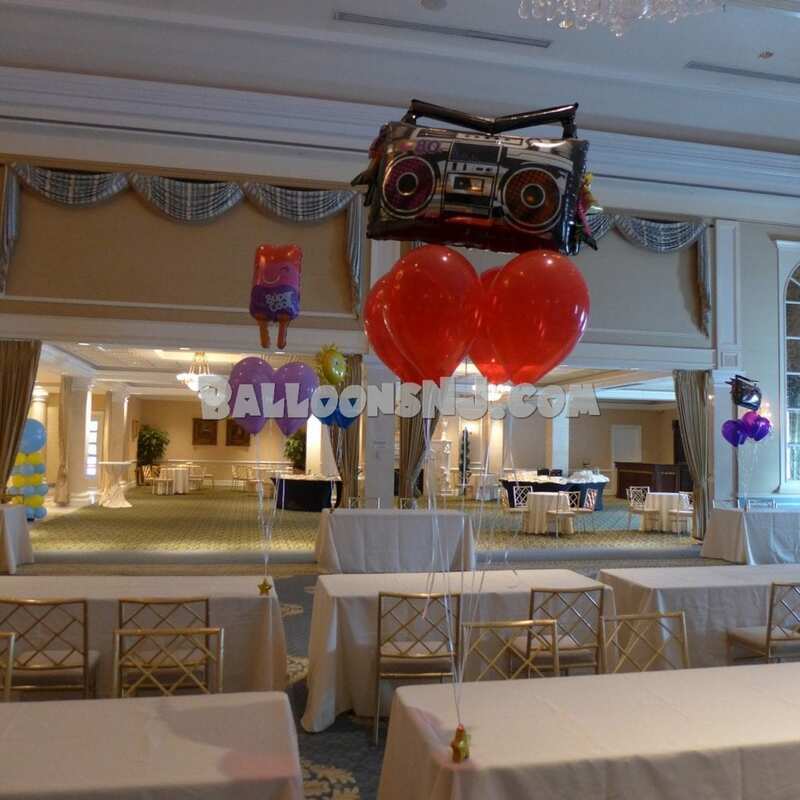 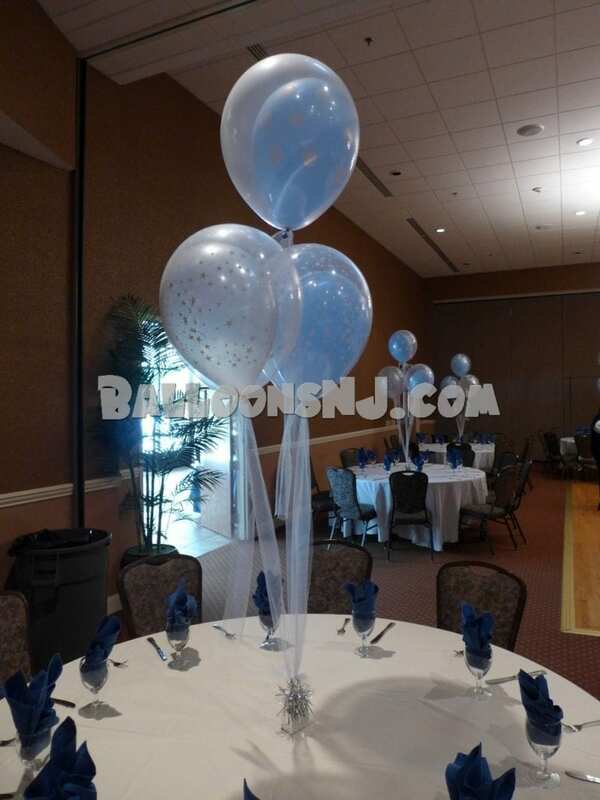 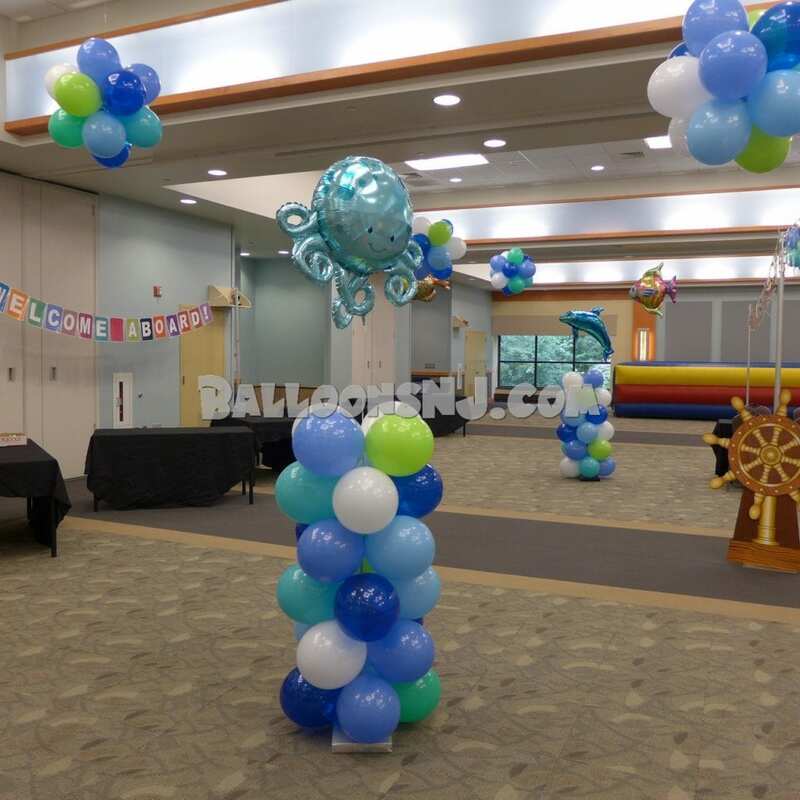 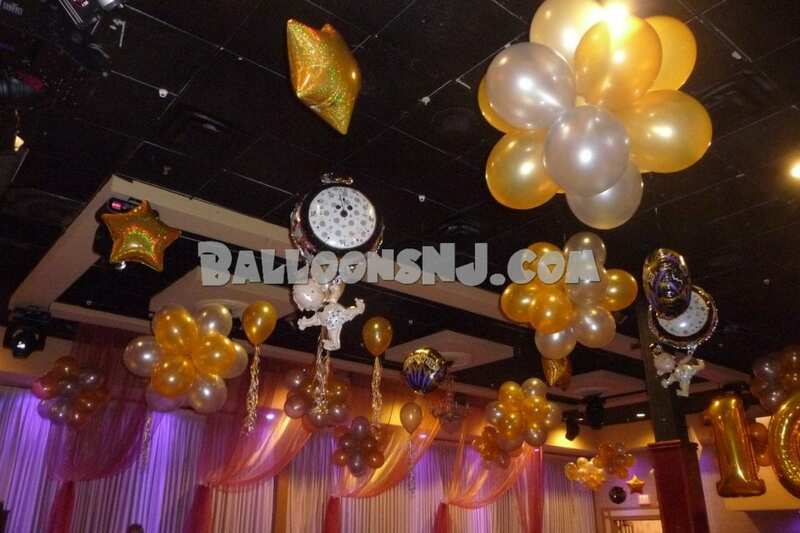 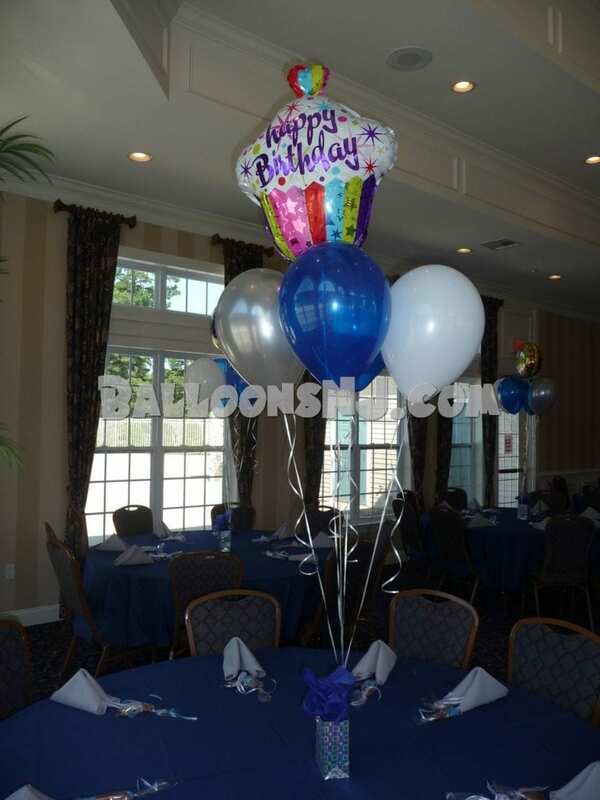 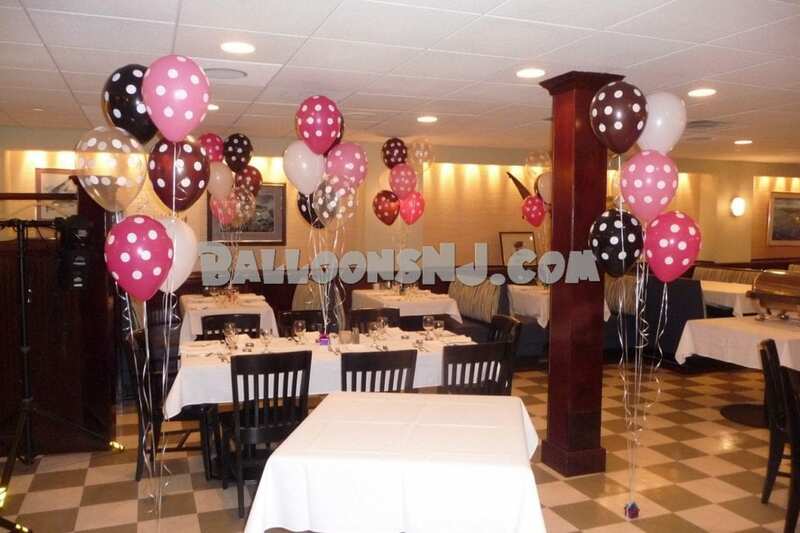 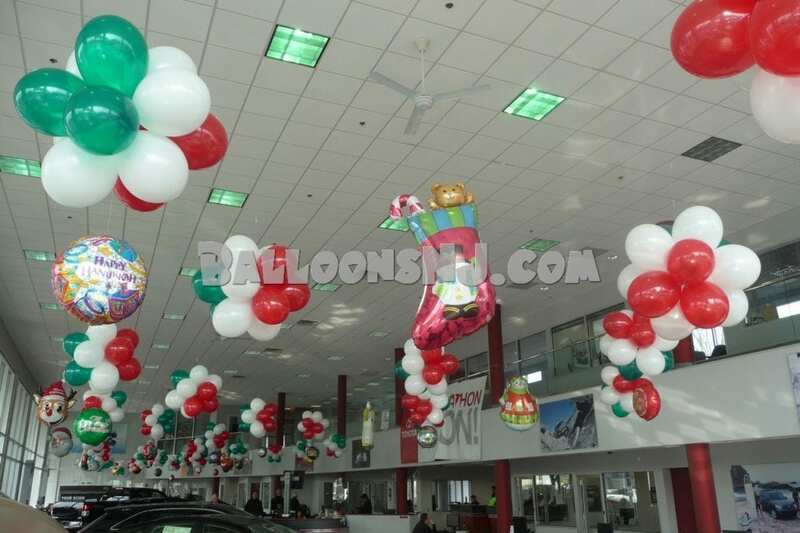 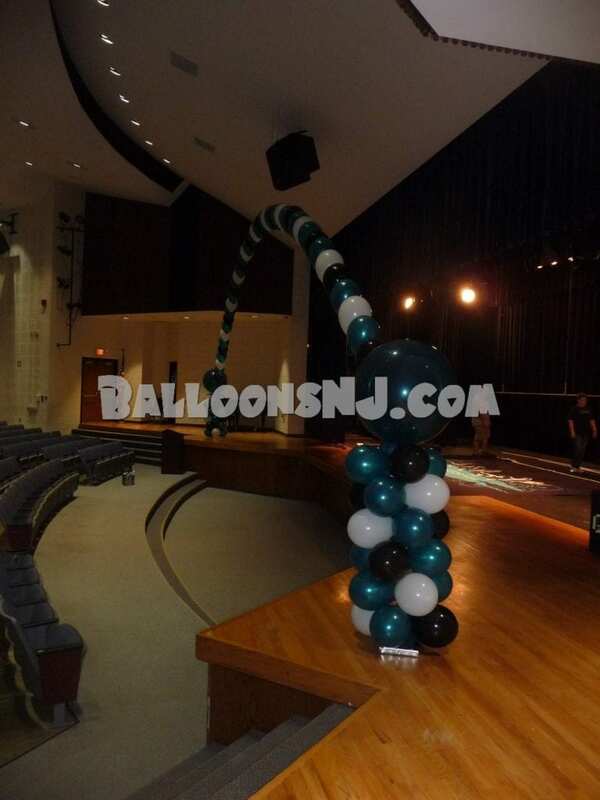 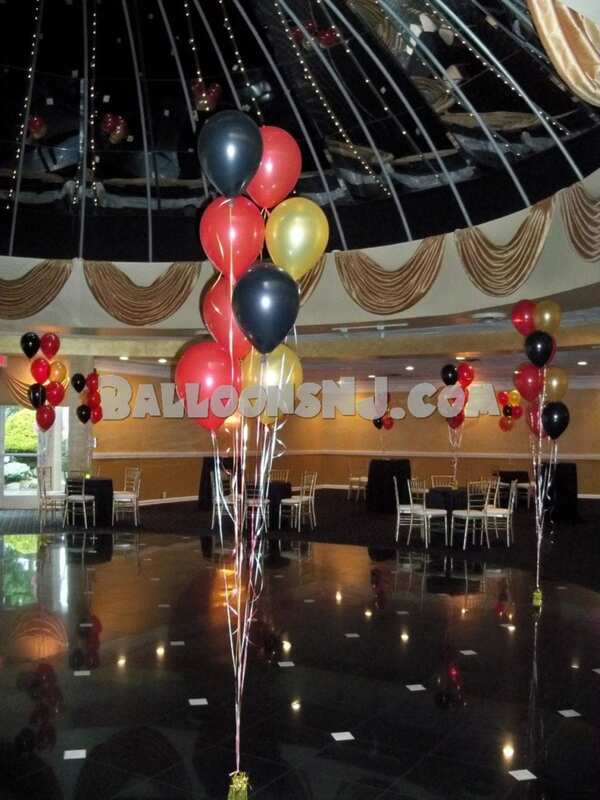 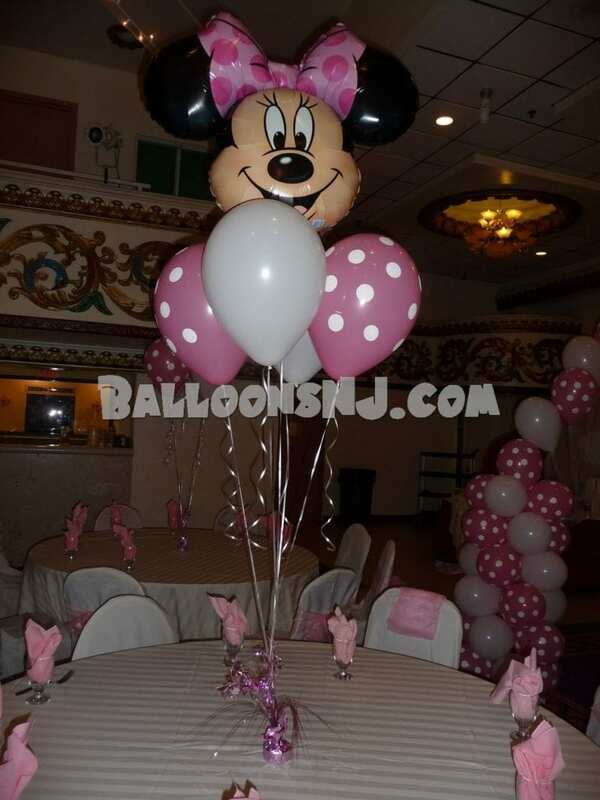 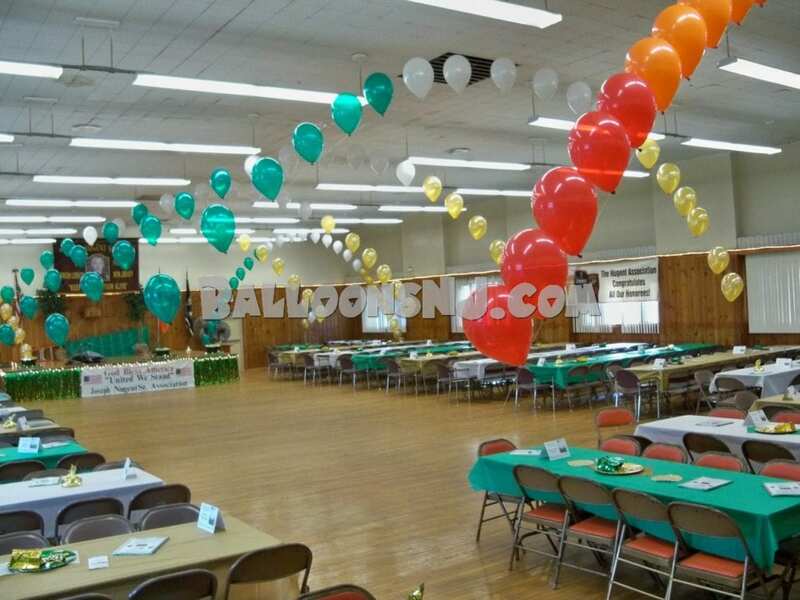 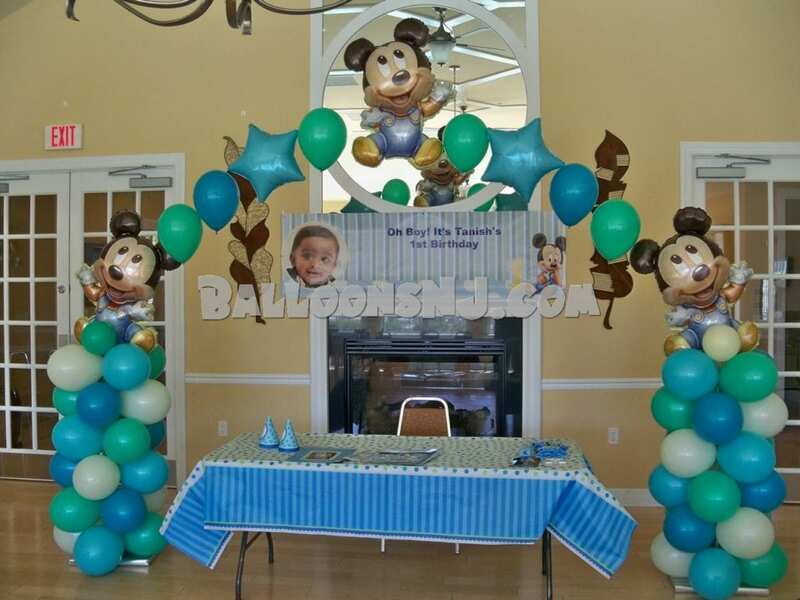 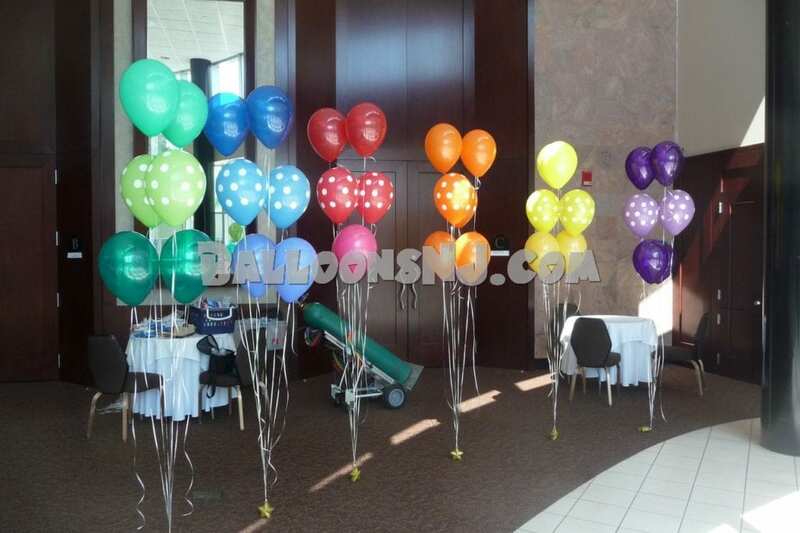 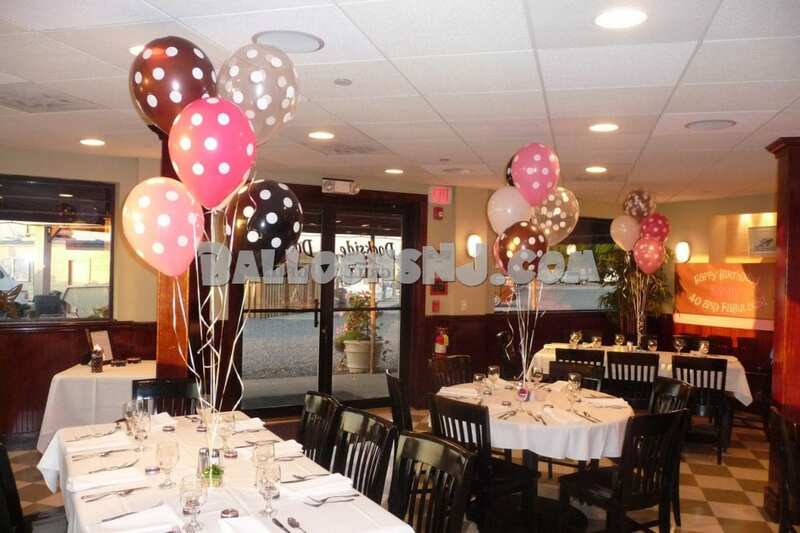 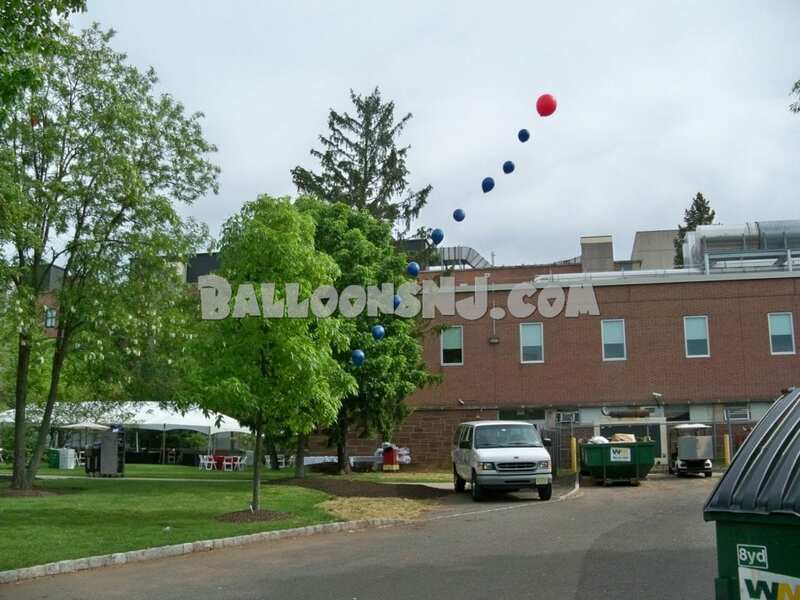 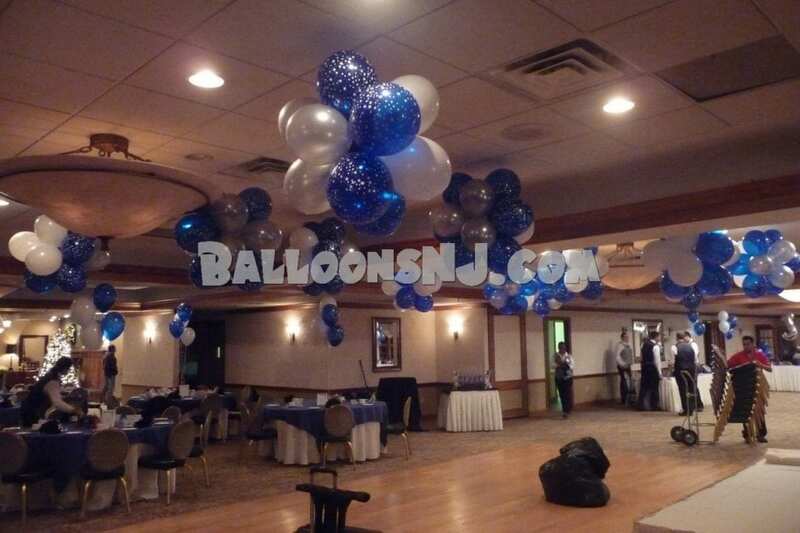 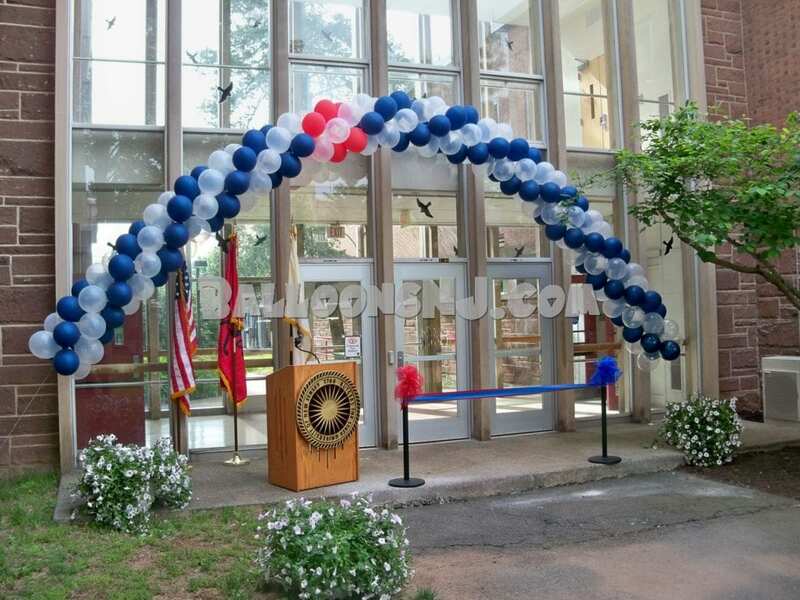 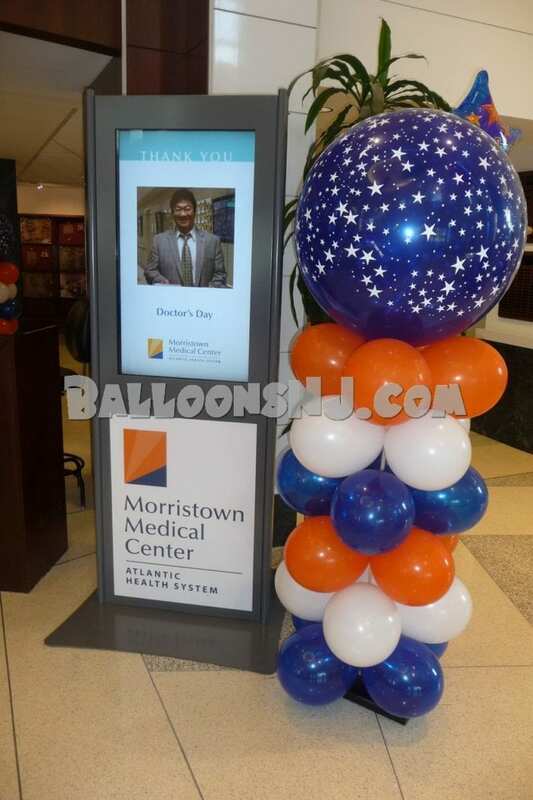 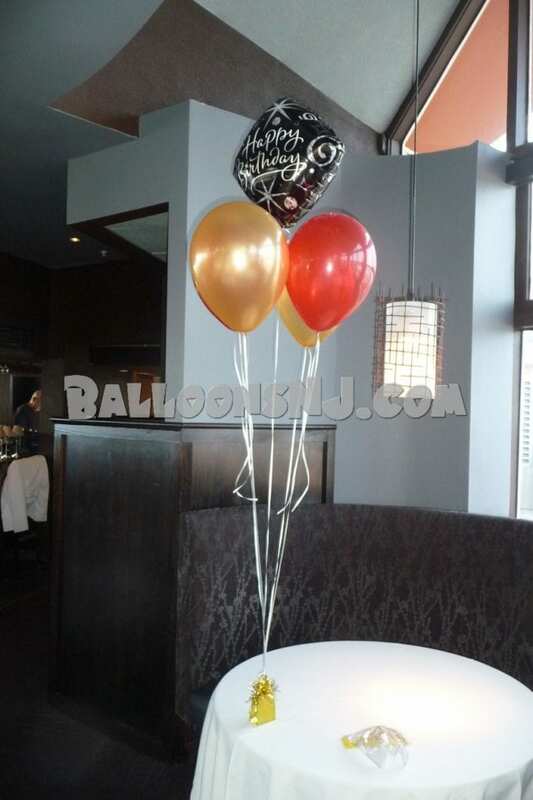 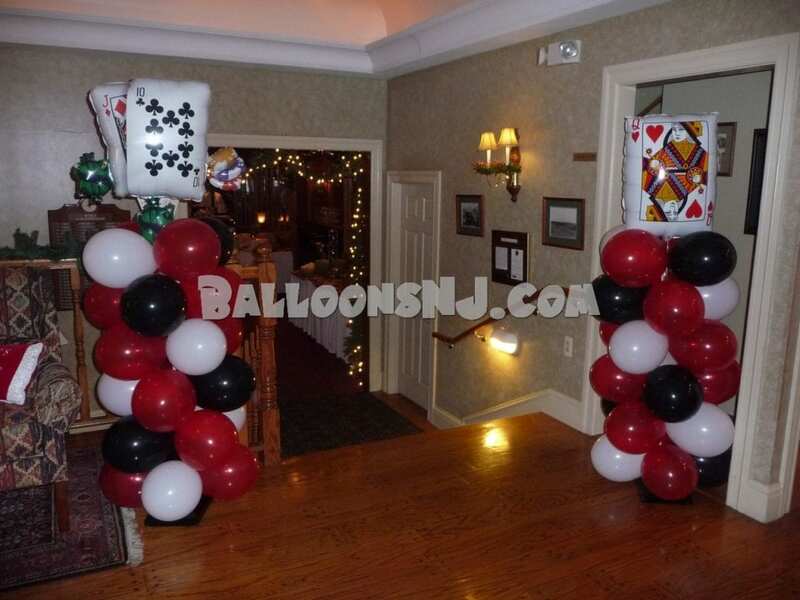 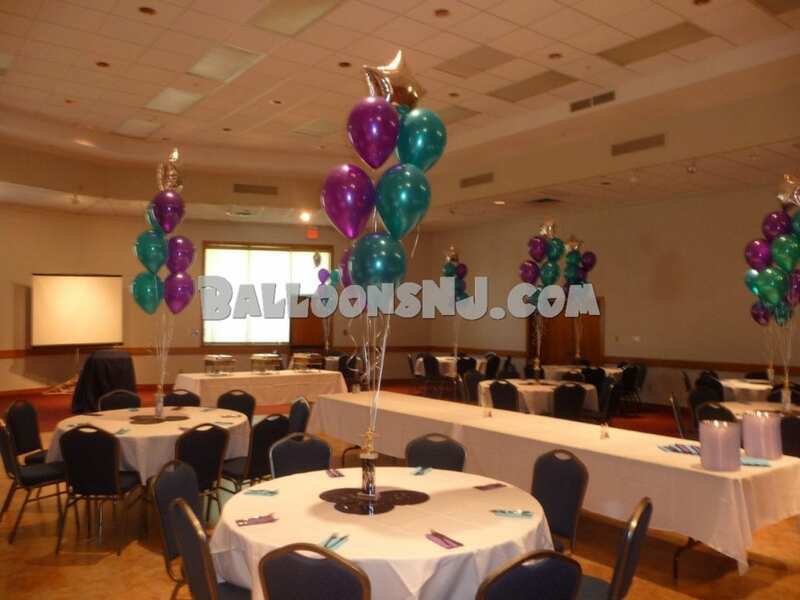 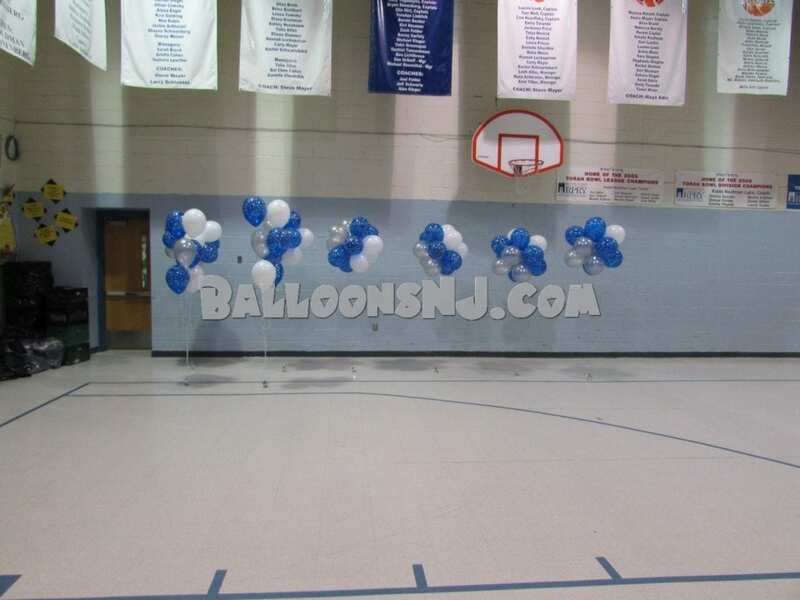 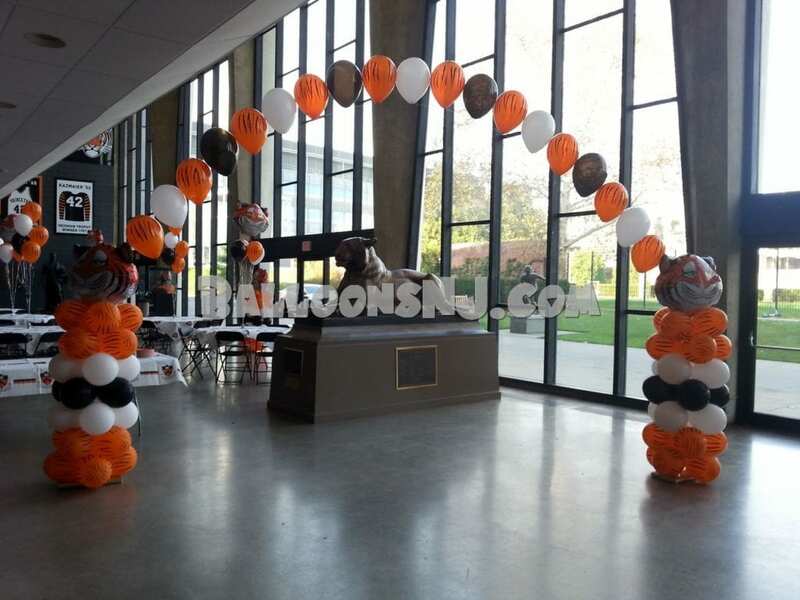 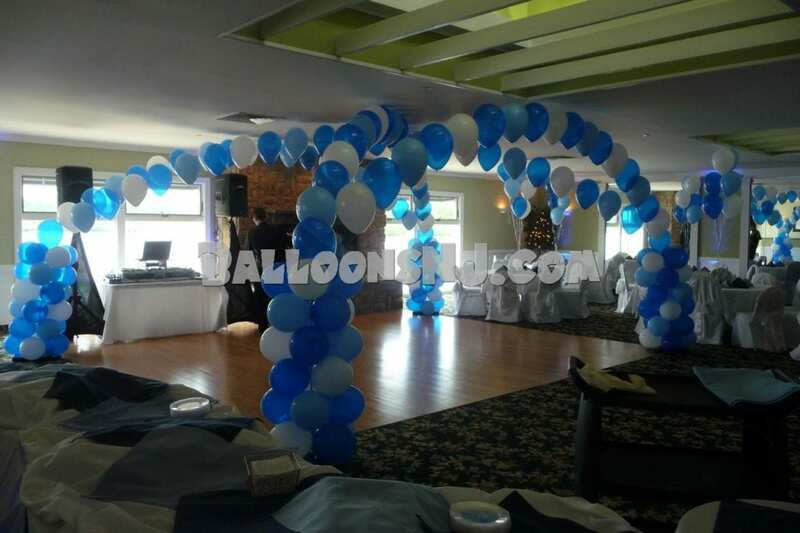 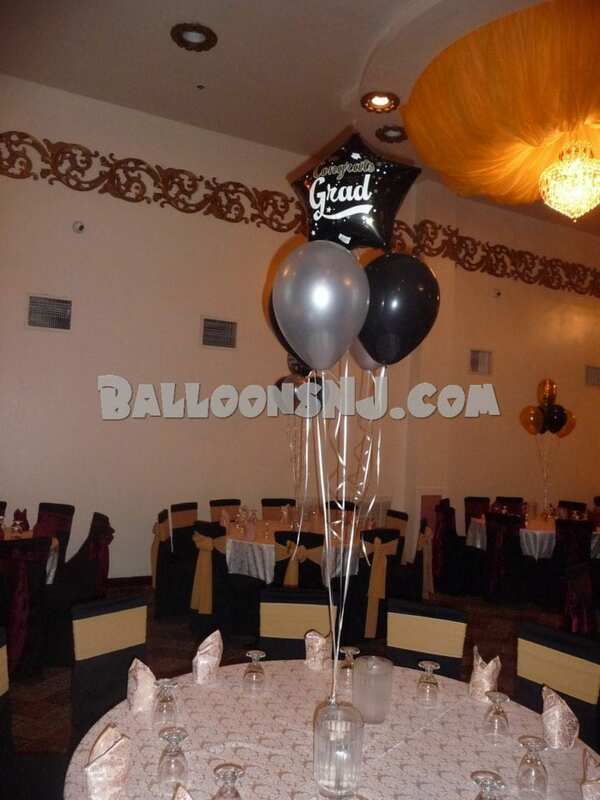 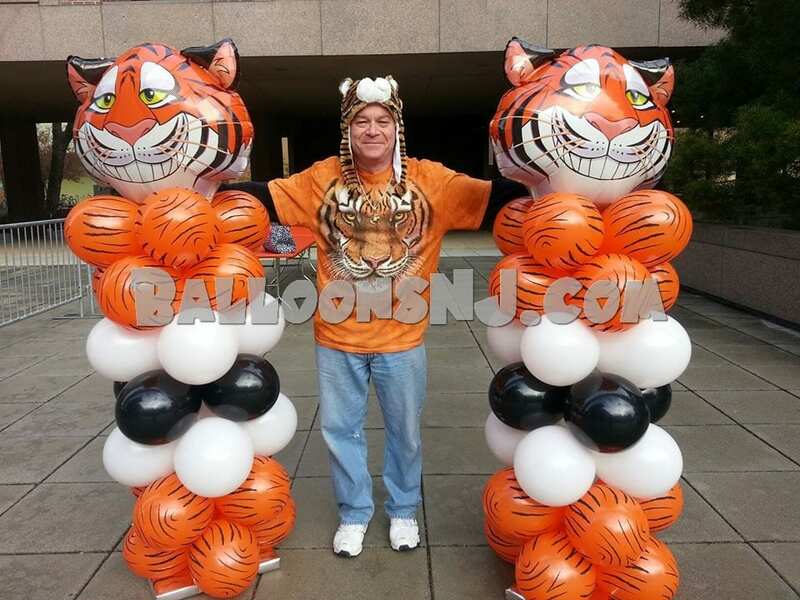 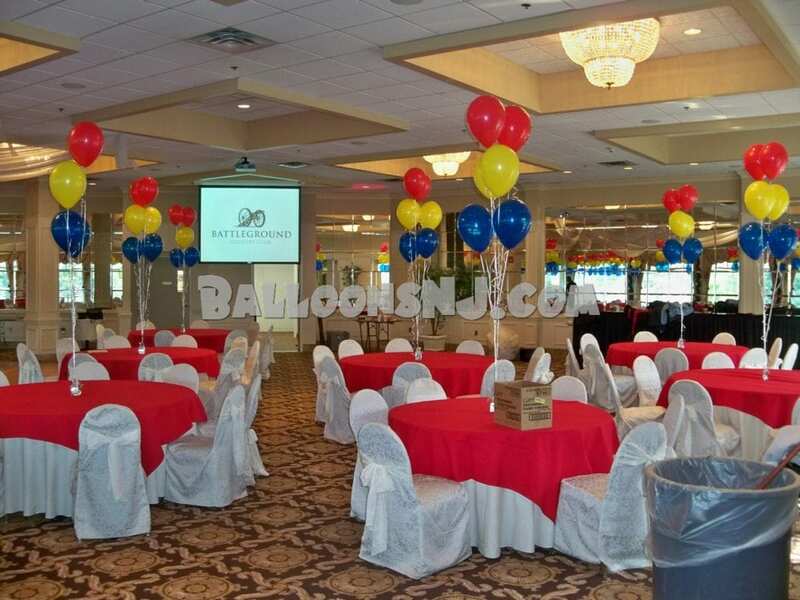 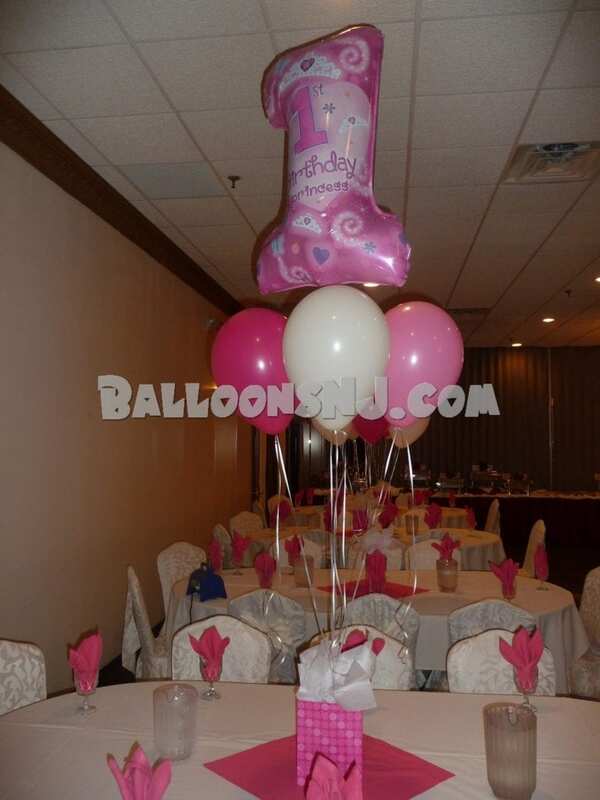 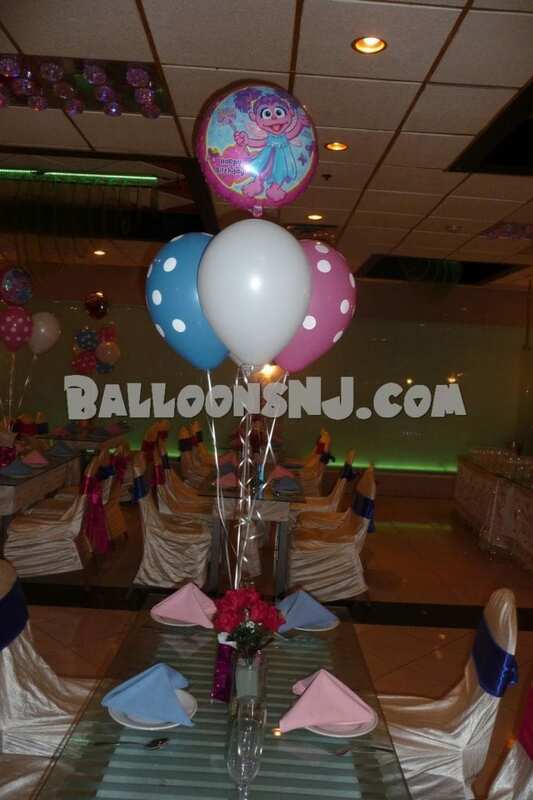 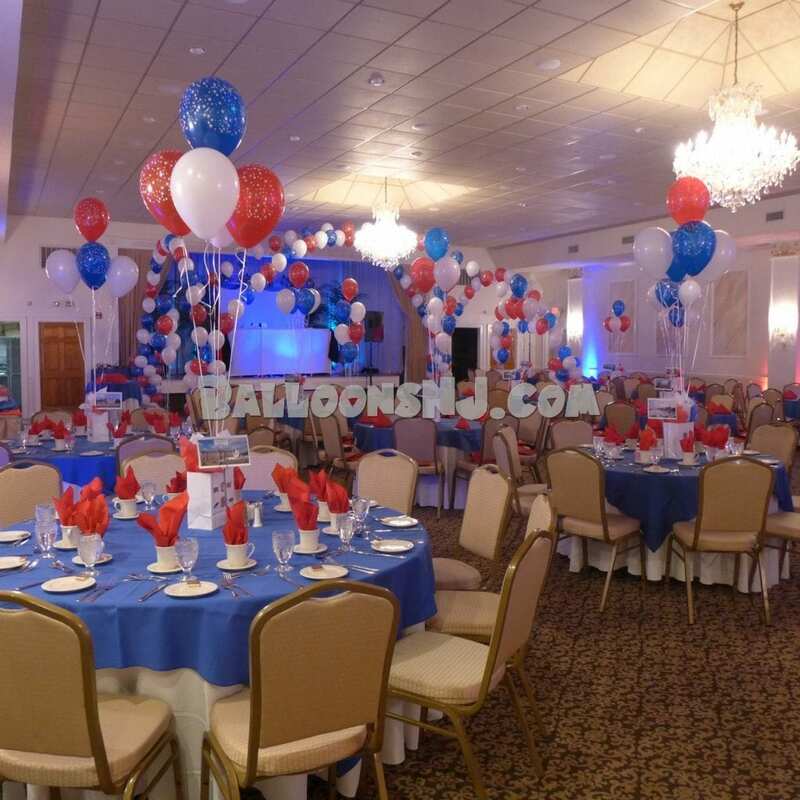 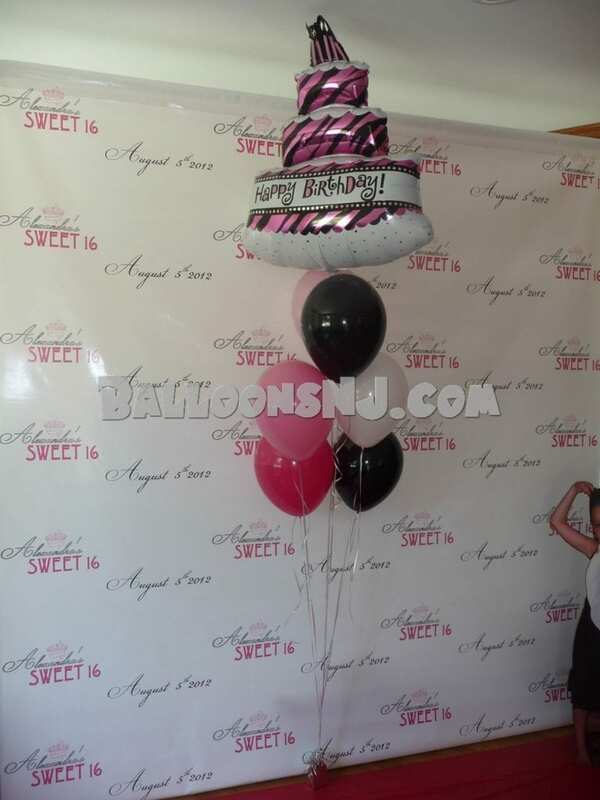 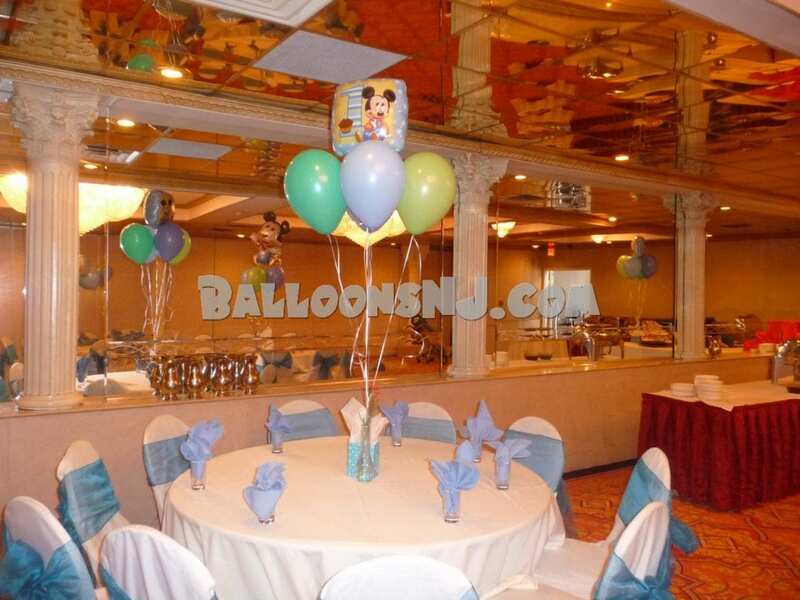 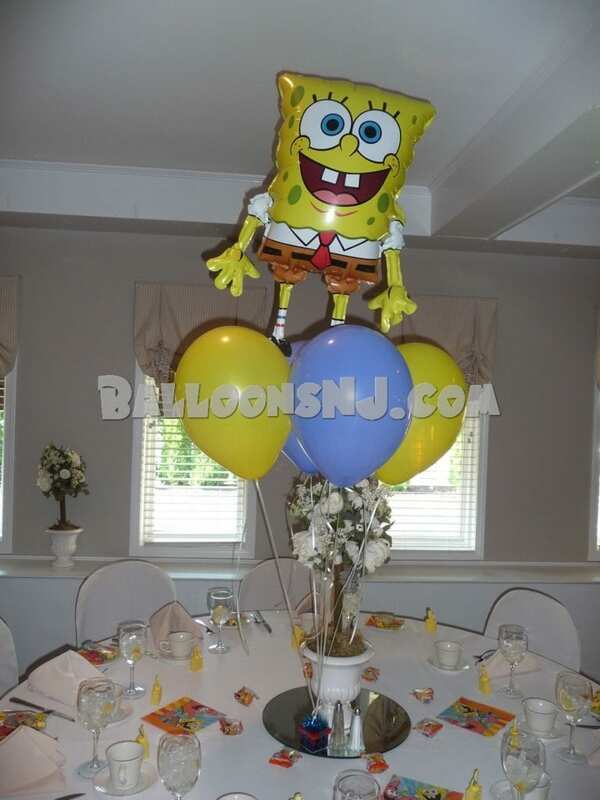 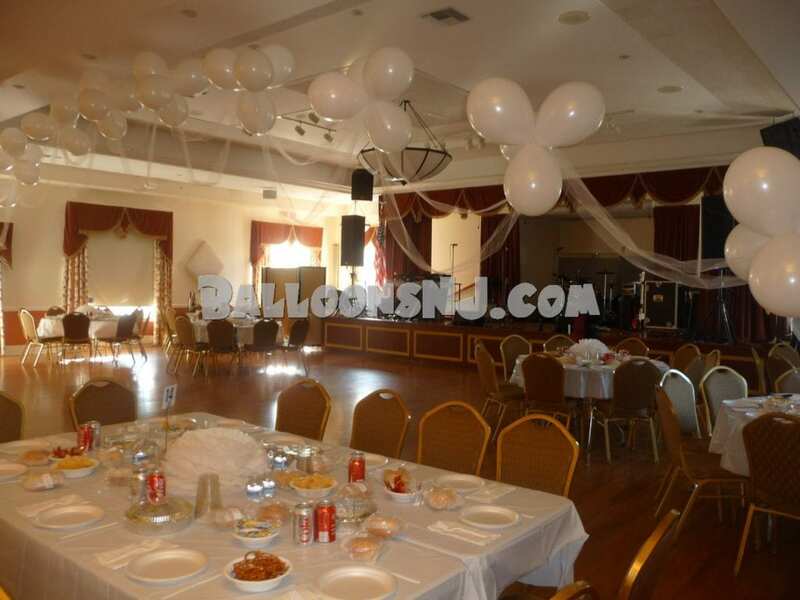 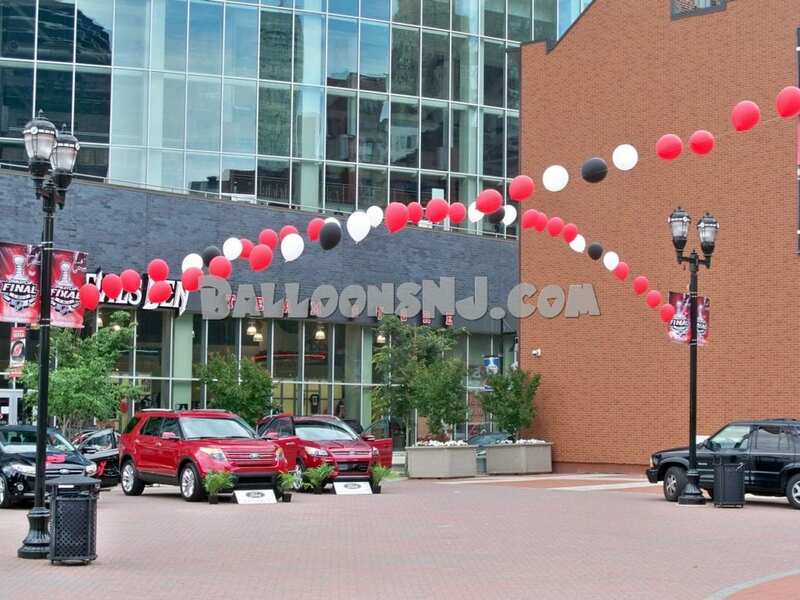 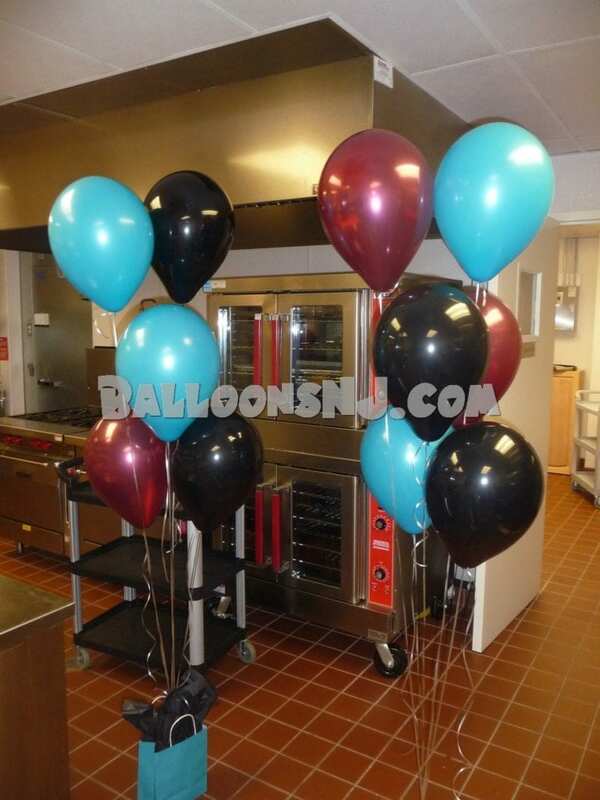 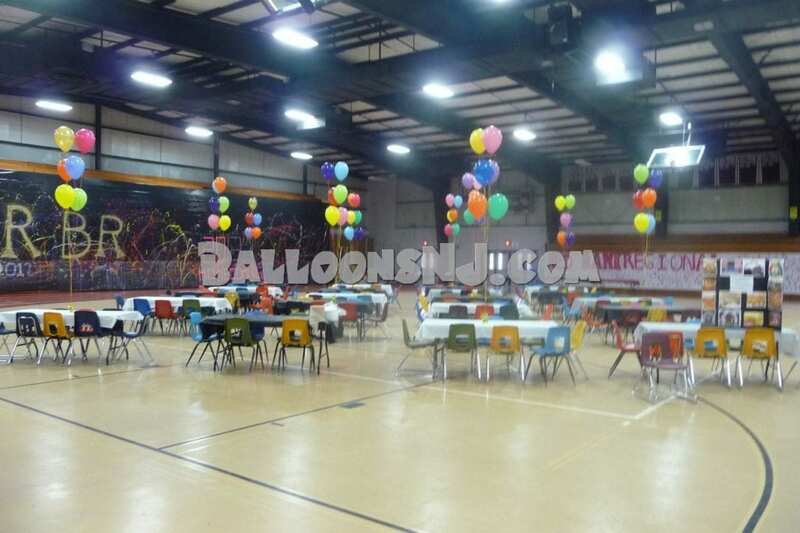 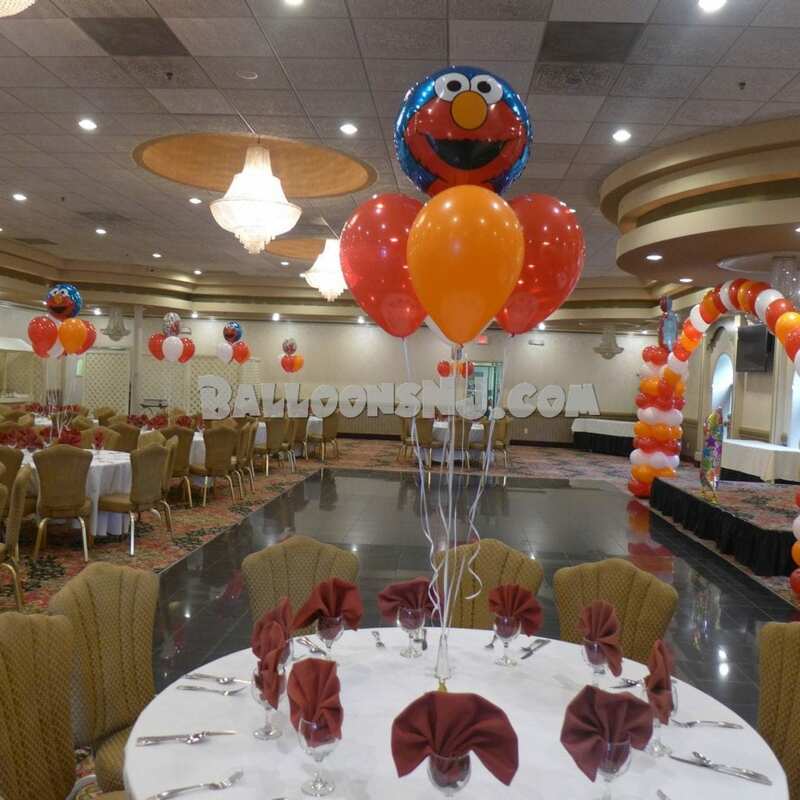 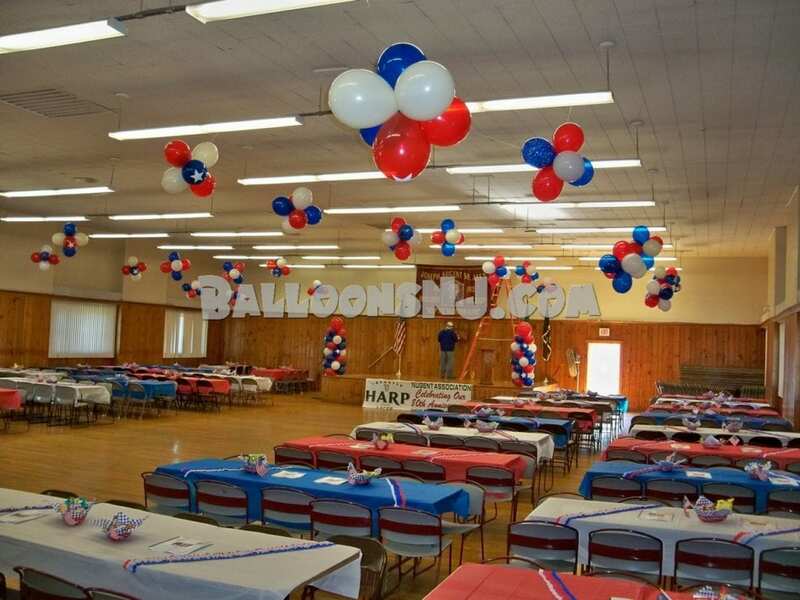 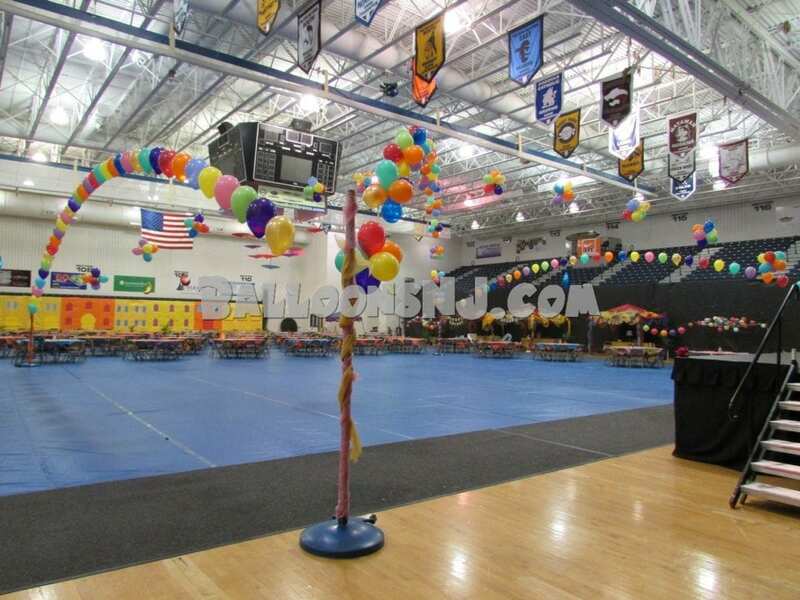 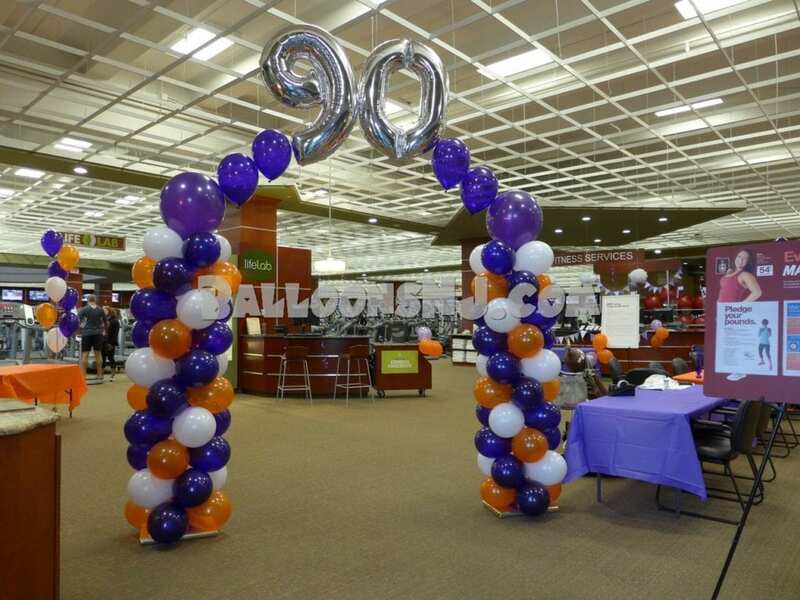 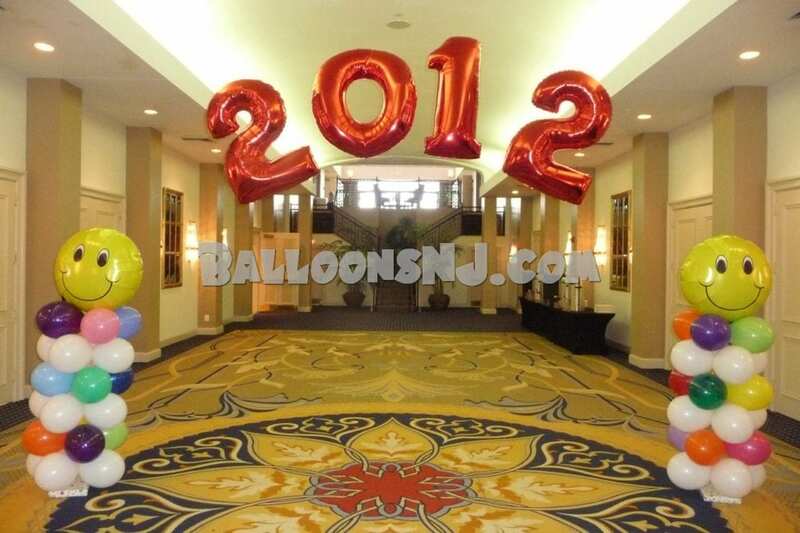 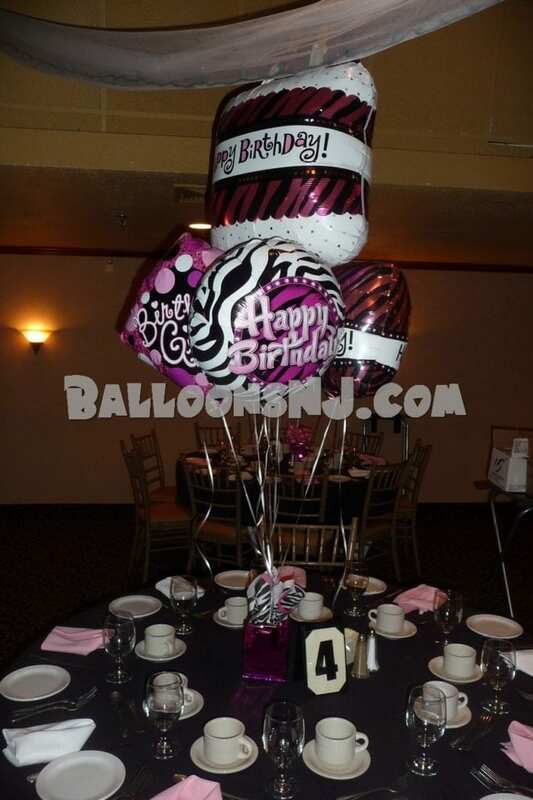 Balloon Columns – are free-standing columns of balloons upon a frame. 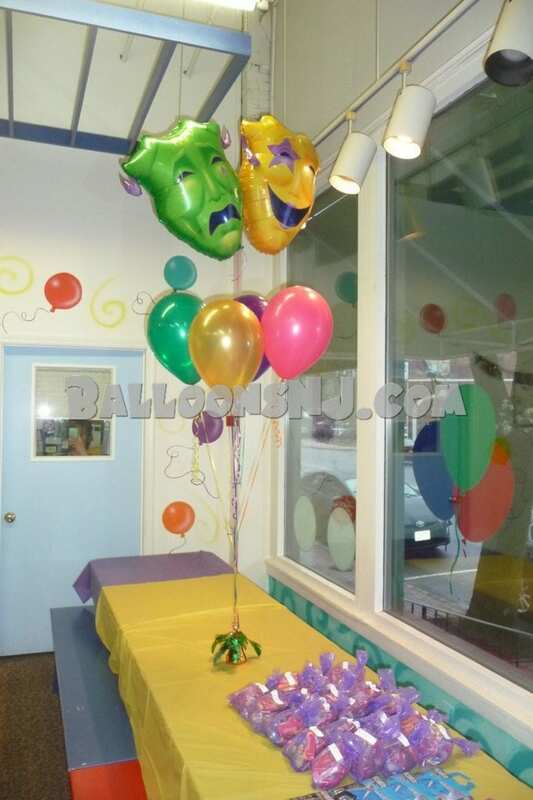 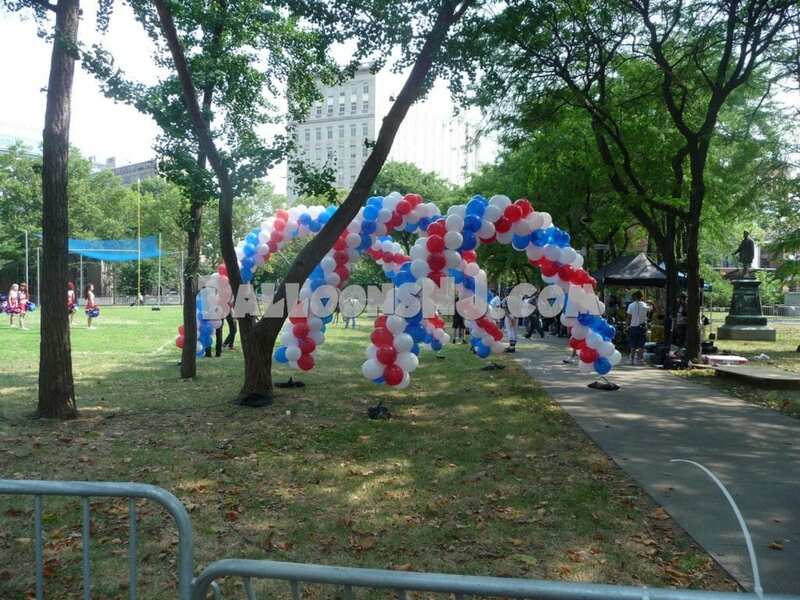 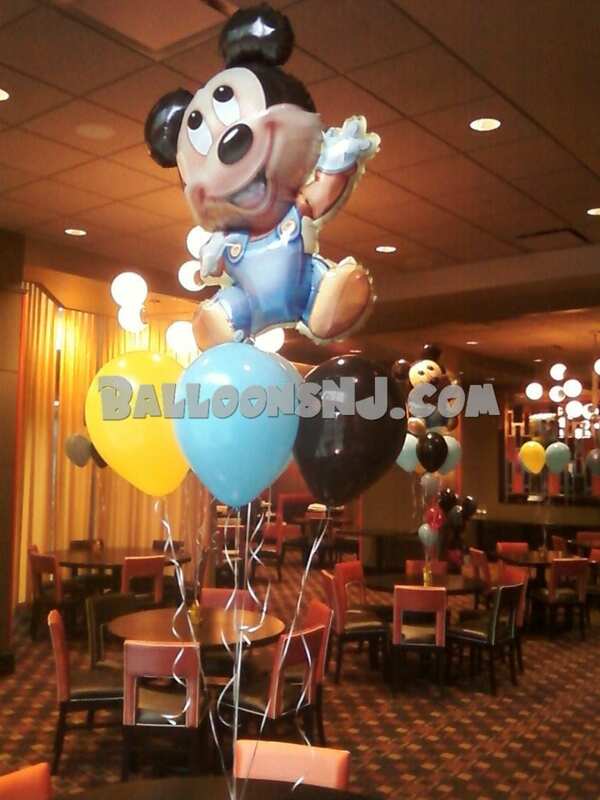 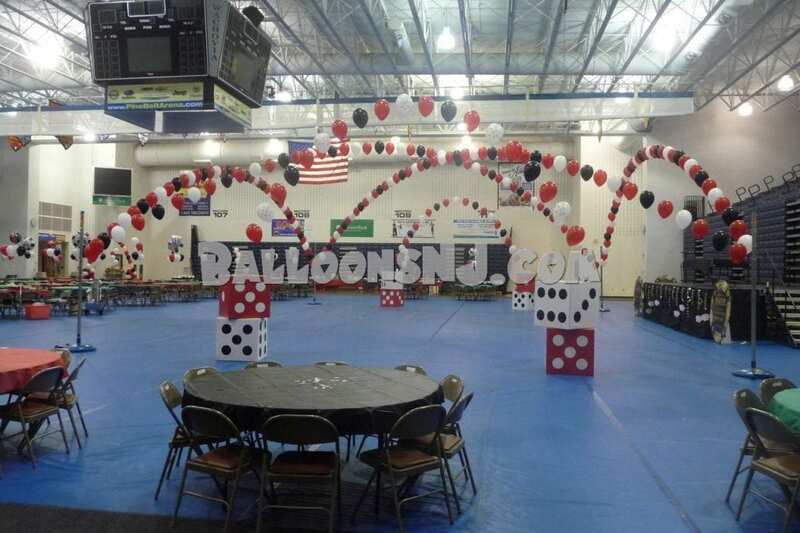 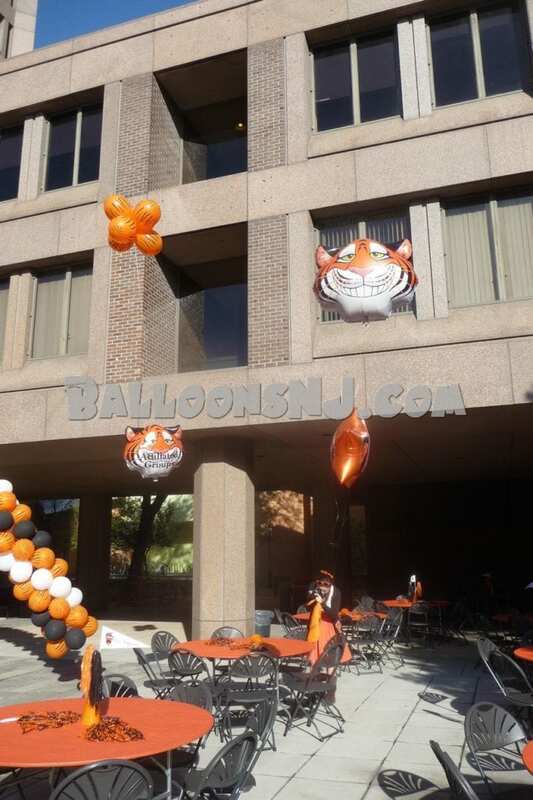 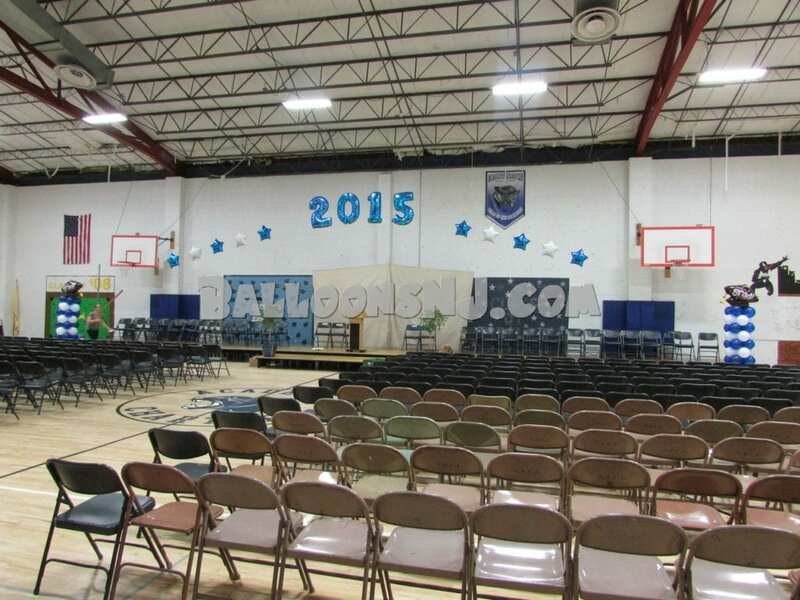 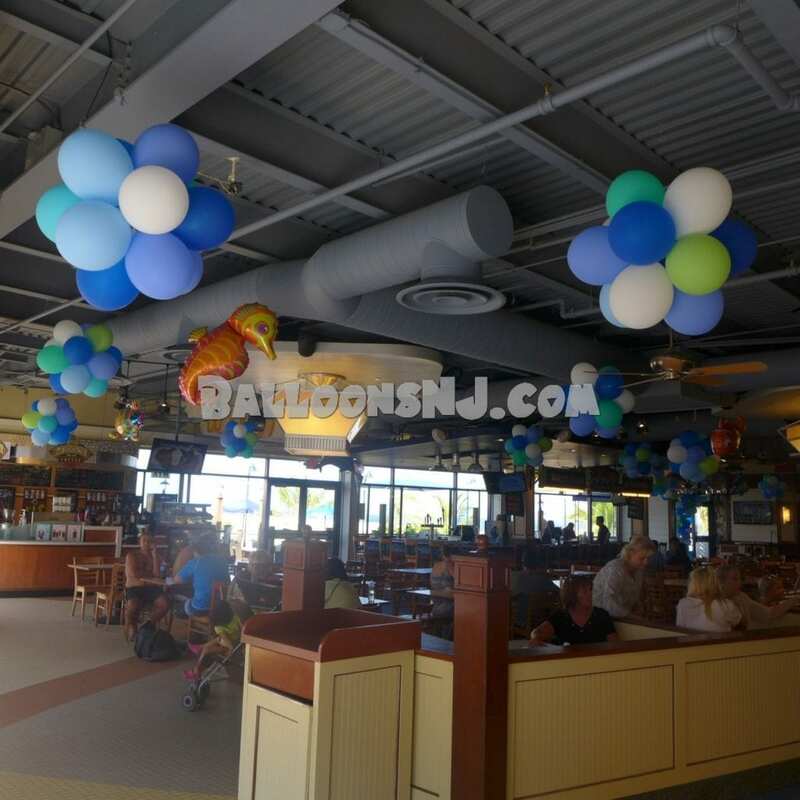 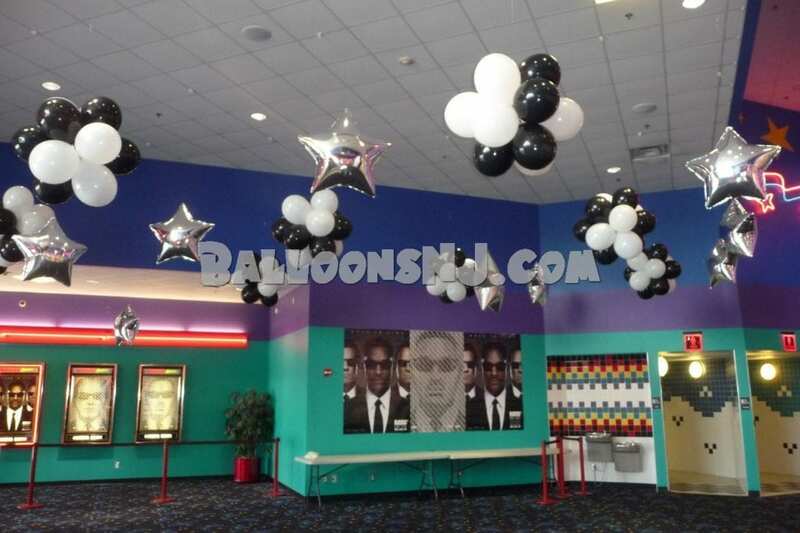 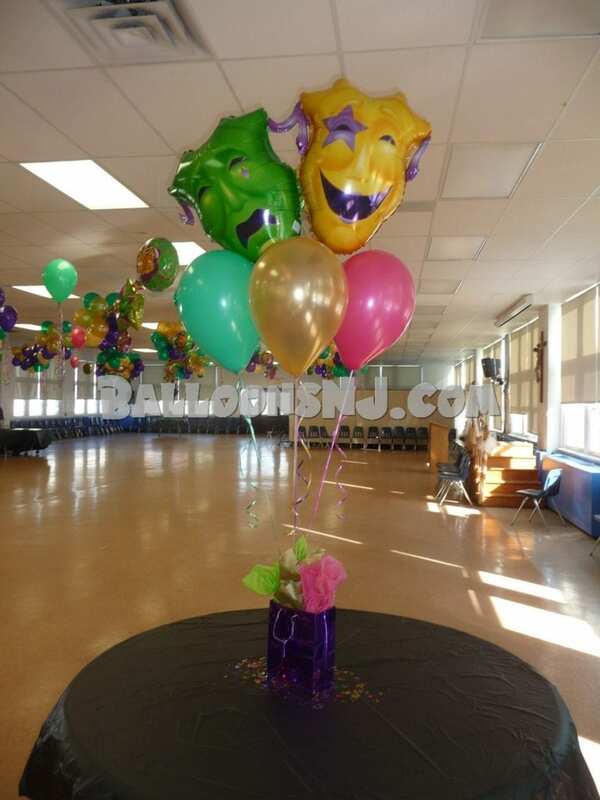 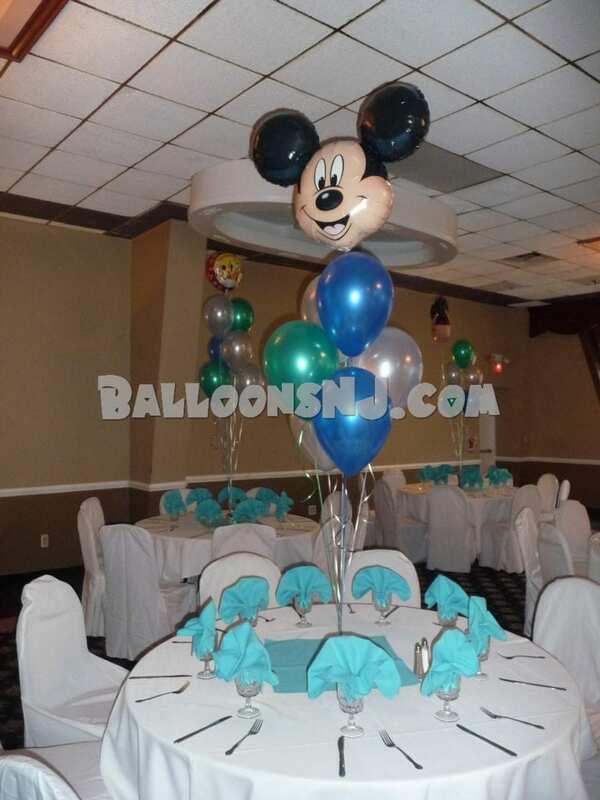 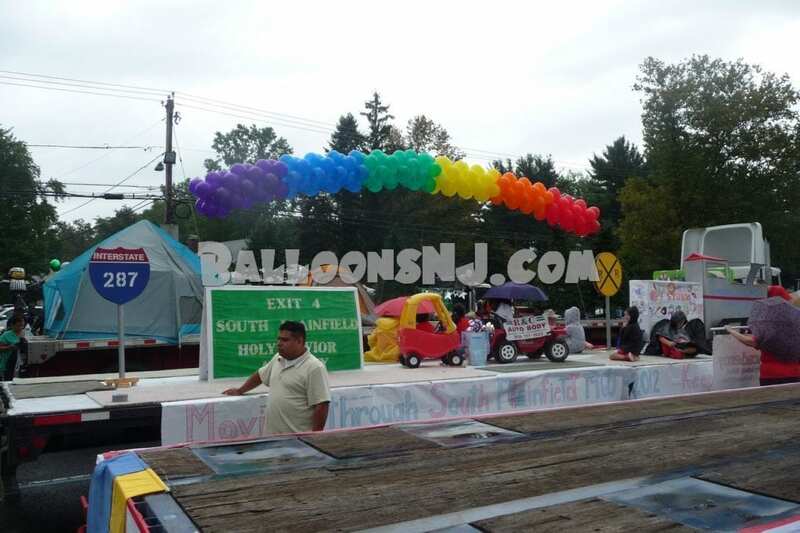 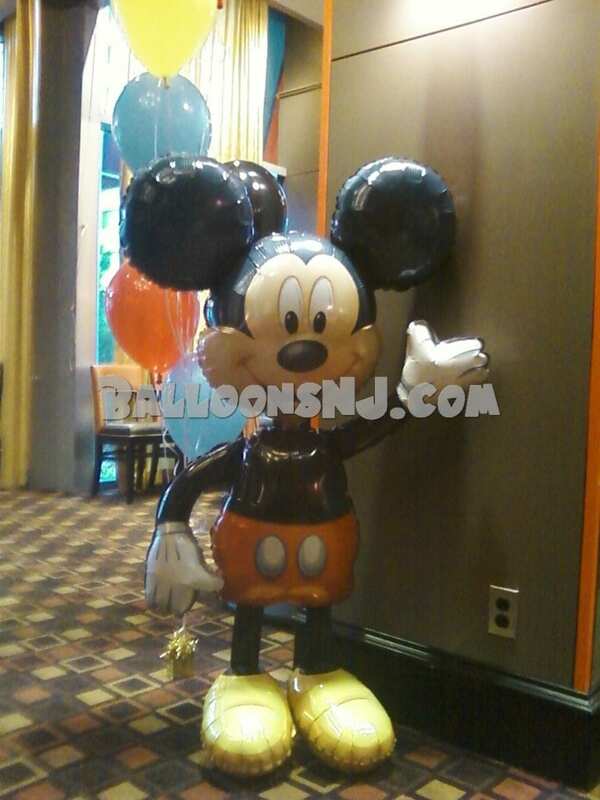 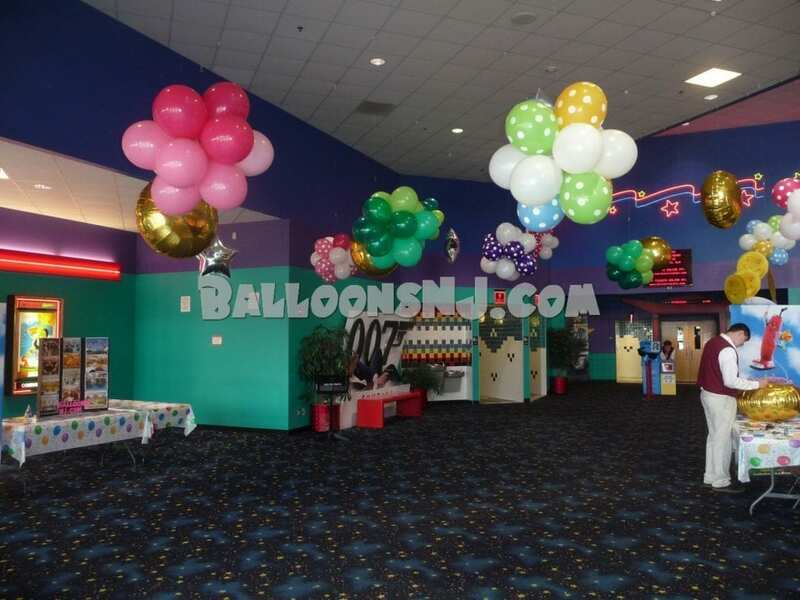 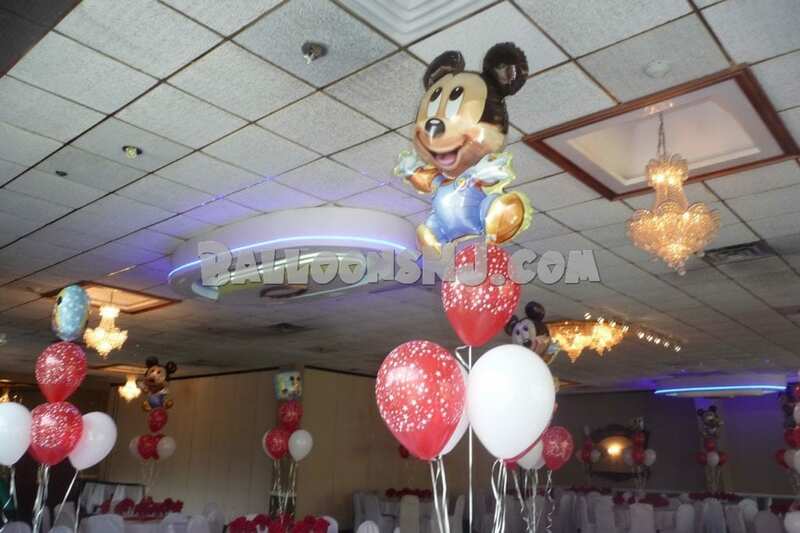 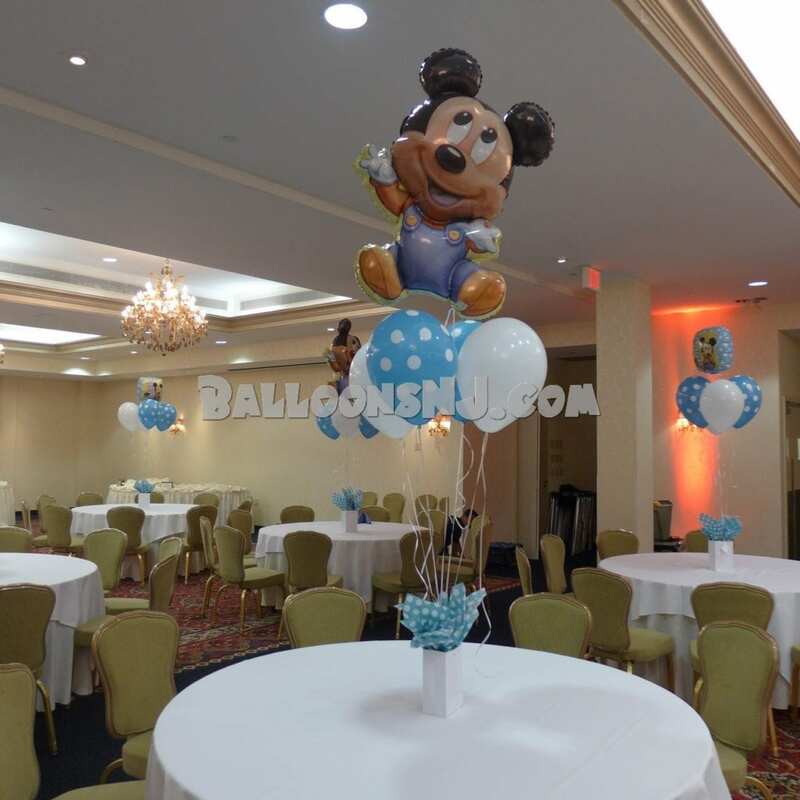 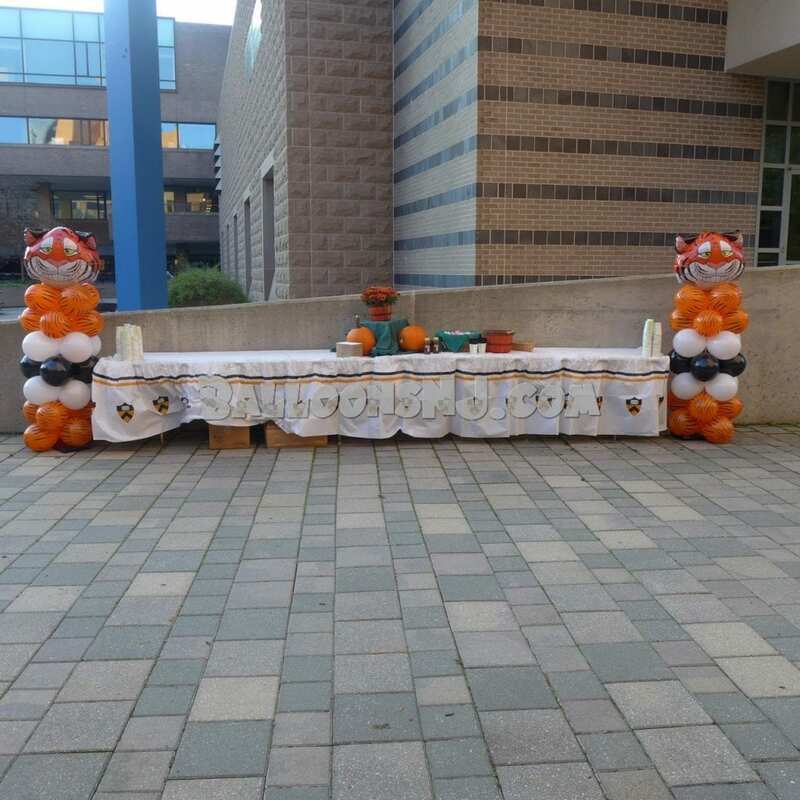 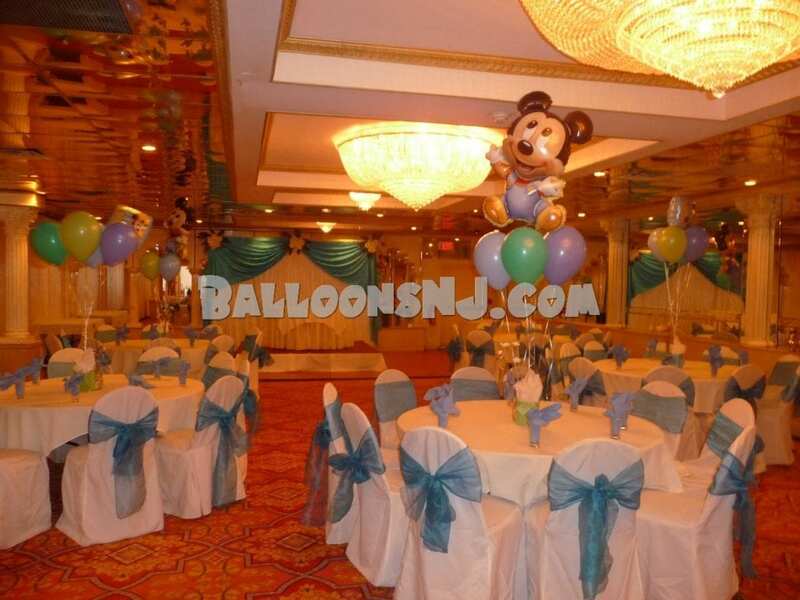 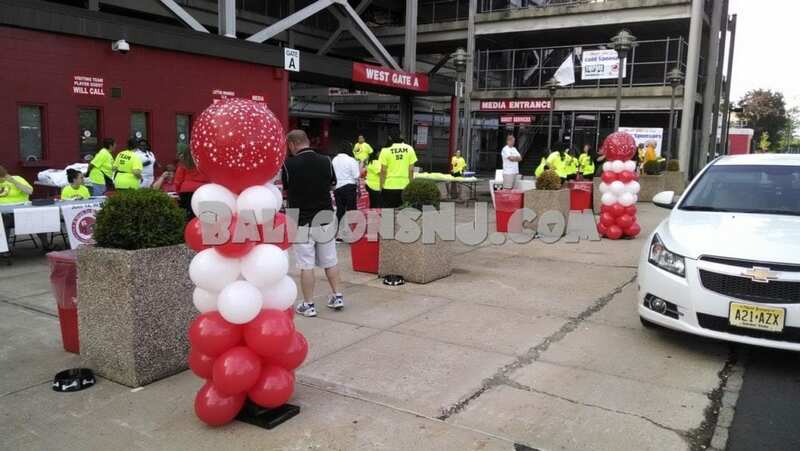 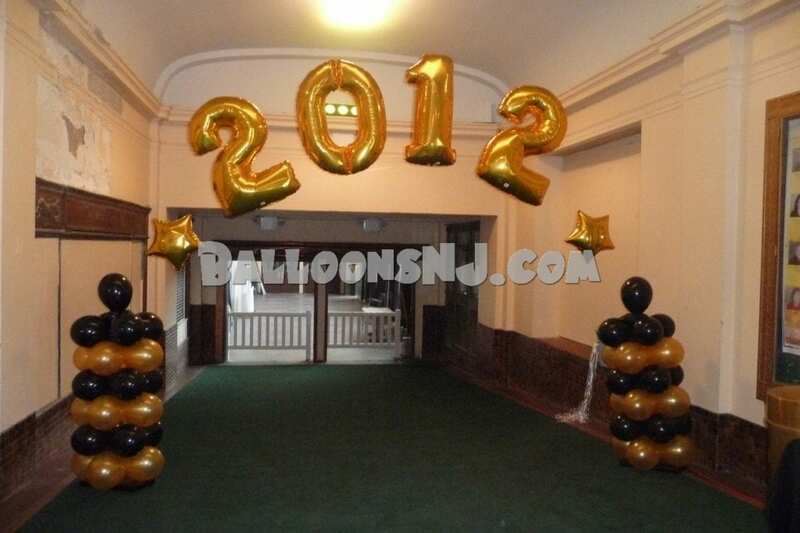 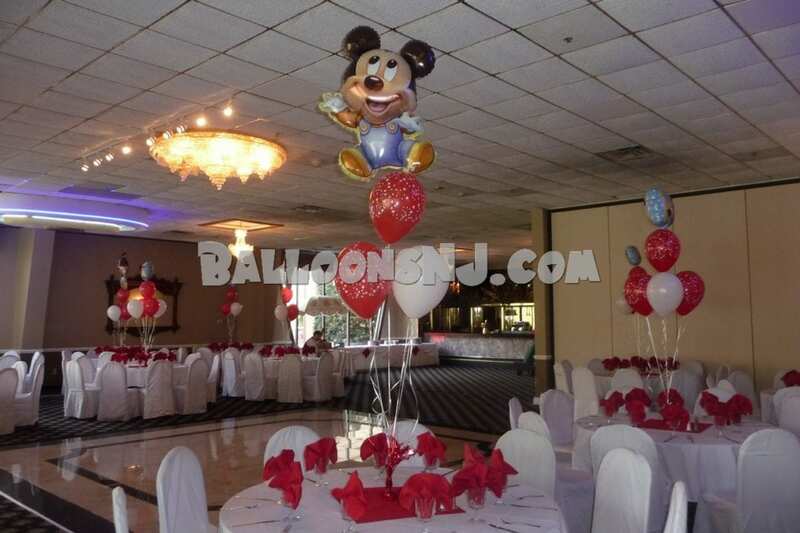 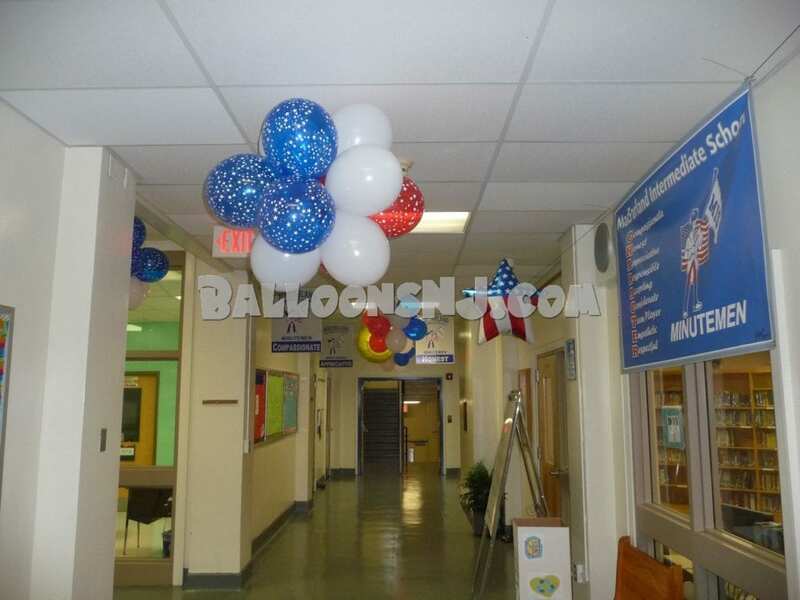 Each column is usually topped off with a larger balloon or foil theme balloons, like Mickey Mouse heads. 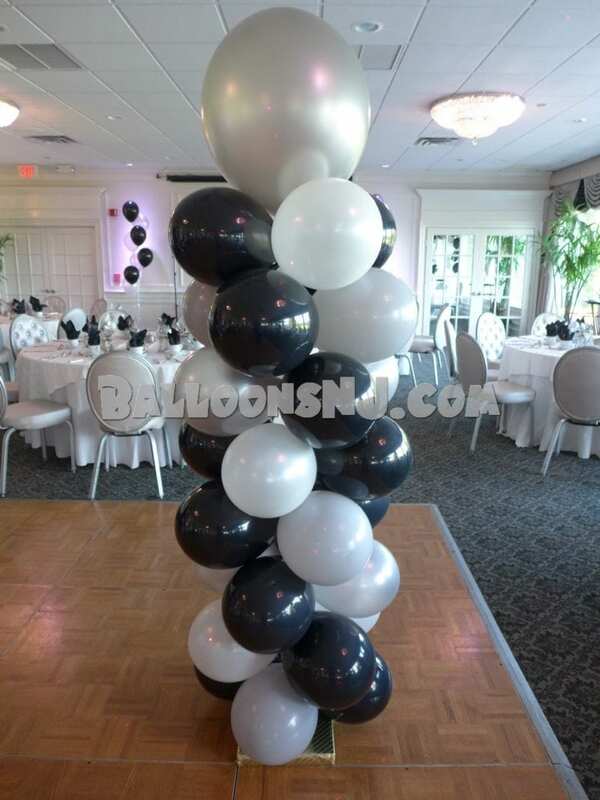 The smallest column we make is 4 feet plus the column topper so it comes out to over 5 feet tall. 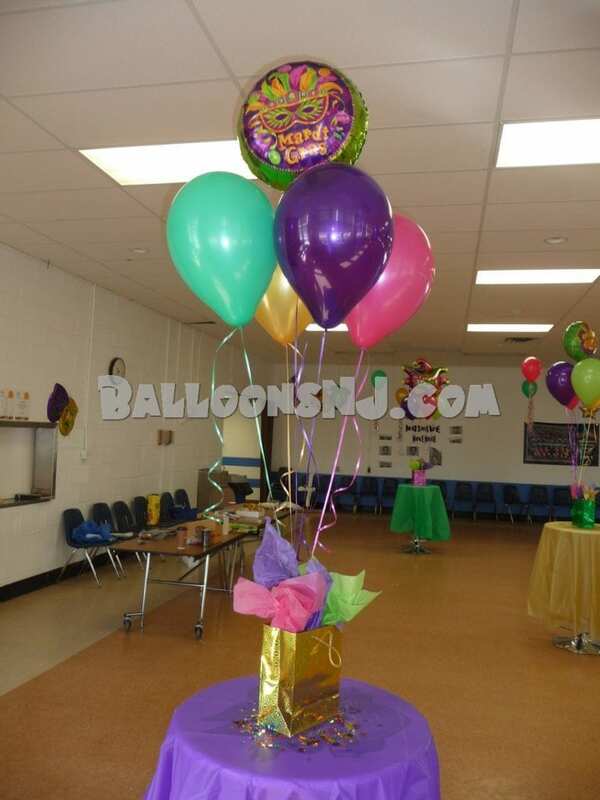 5 foot plus topper is a nice size for spiral pattern using 2-3 colors. 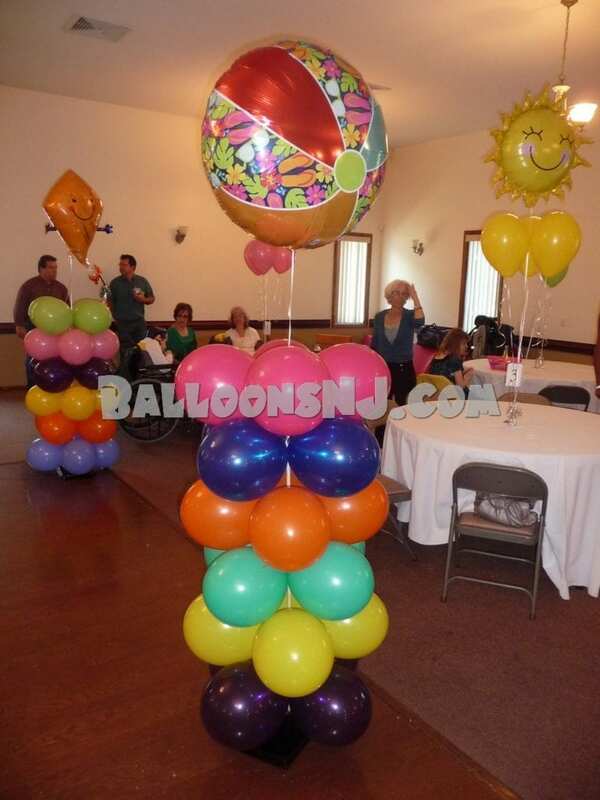 6 foot plus topper is quite impressive as a large column and can support a spiral pattern with 4 colors where you see all 4 colors from every side. 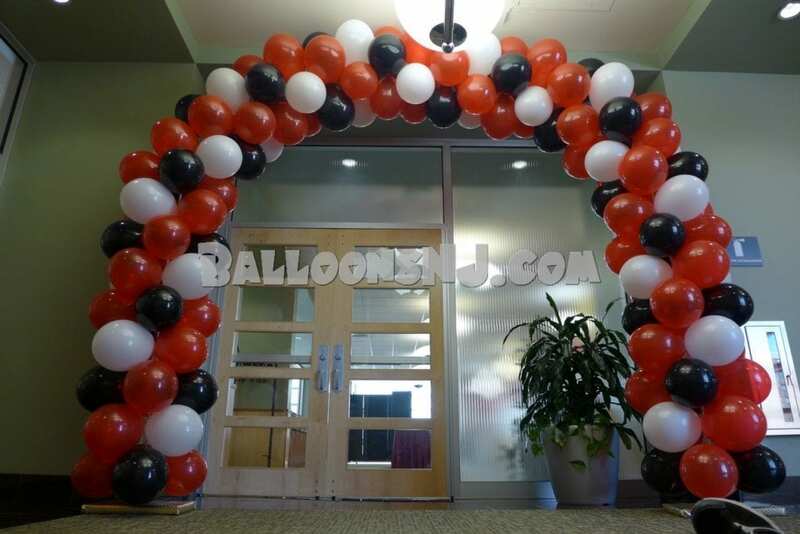 Packed Arches – The “packed” in packed arch refers to how the balloons are packed tightly together, row by row to form an arch. 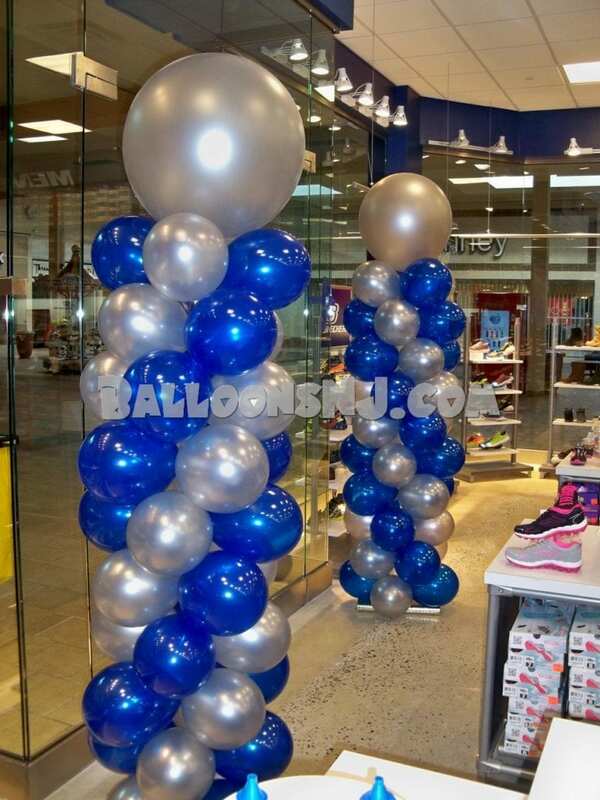 These can be helium balloons on a rope or air filled balloons supported, at least partially, by a frame. 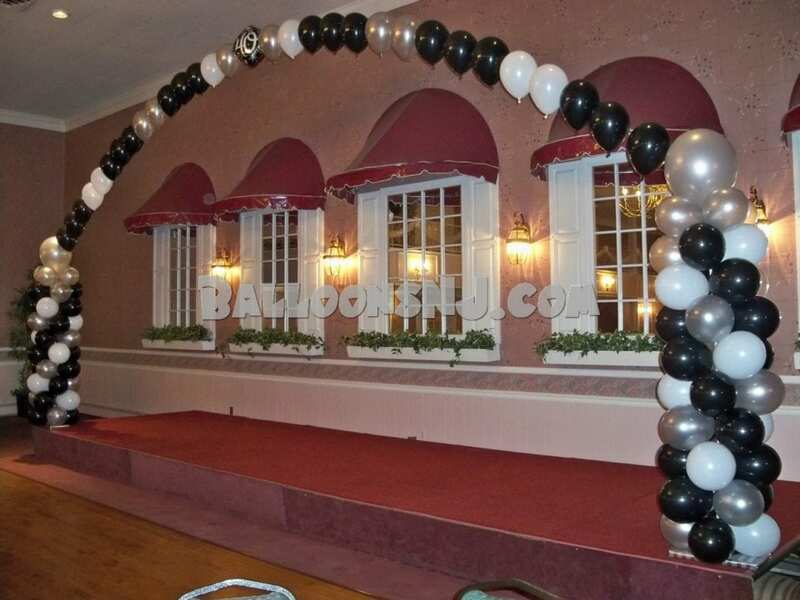 We have also draped air-filled arches on rope, supported by lines from above. 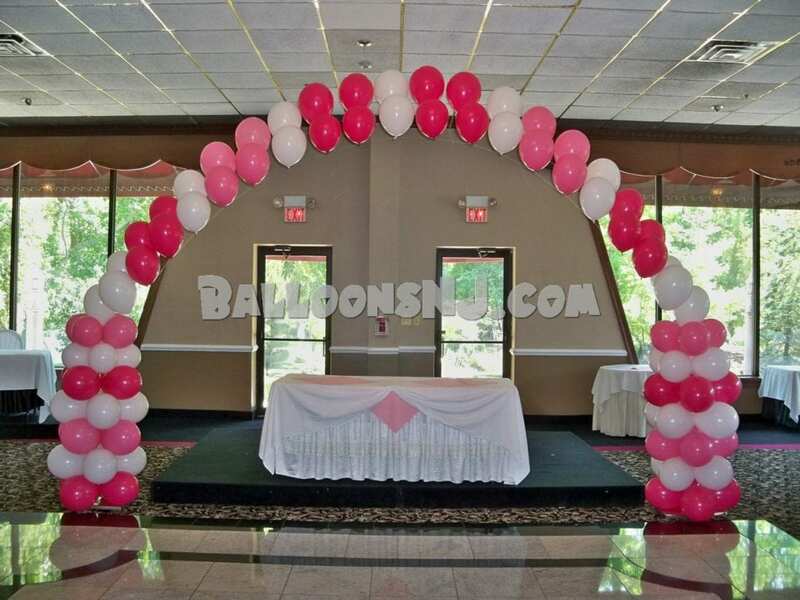 Sizes vary from doorway sized to giant arches. 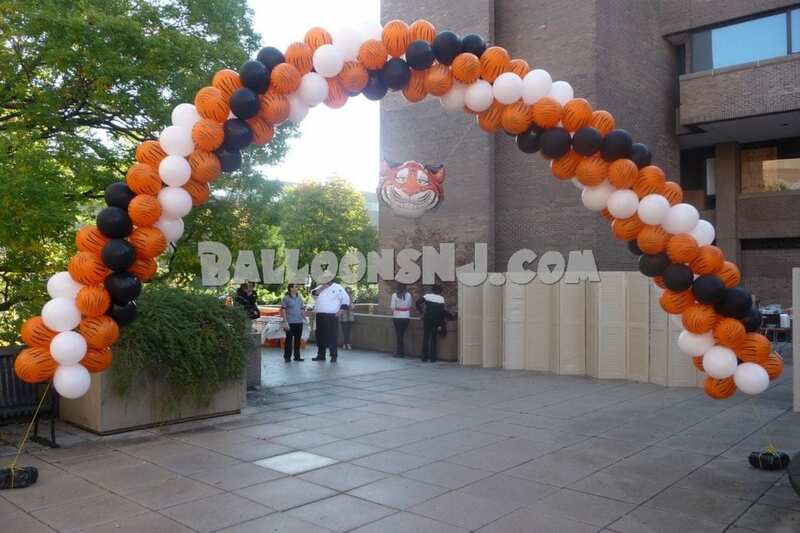 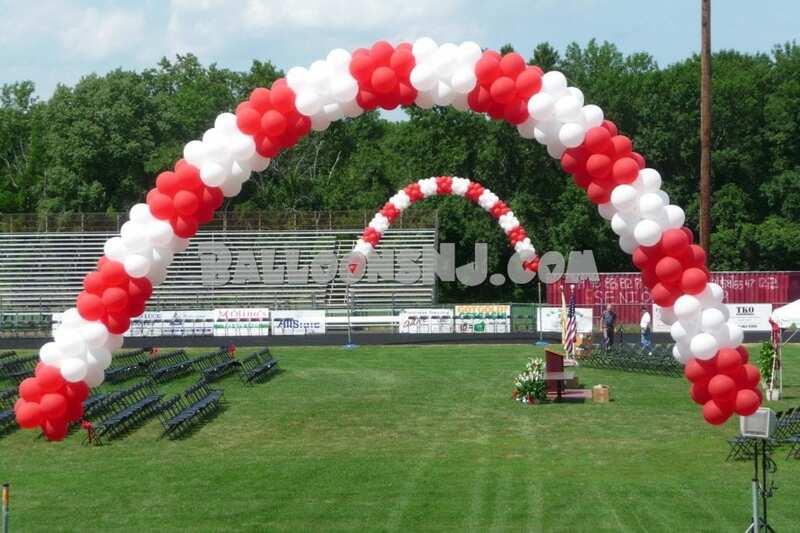 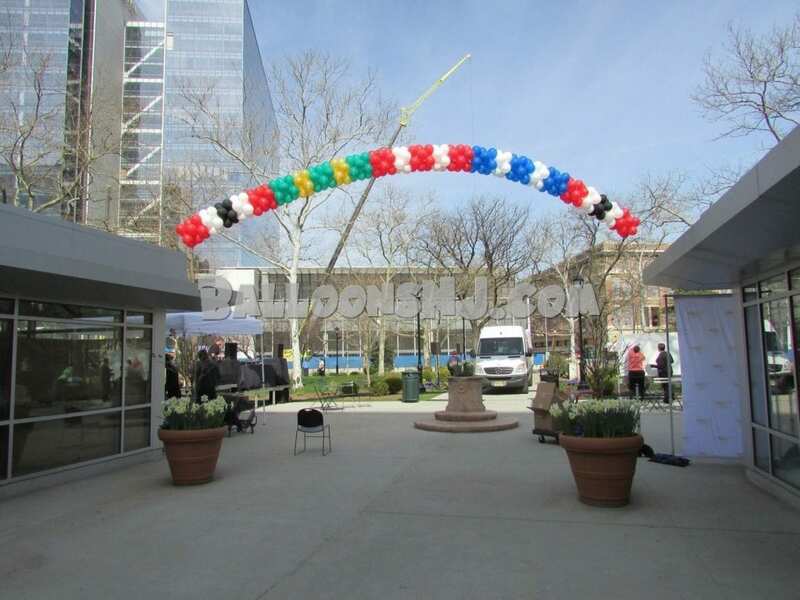 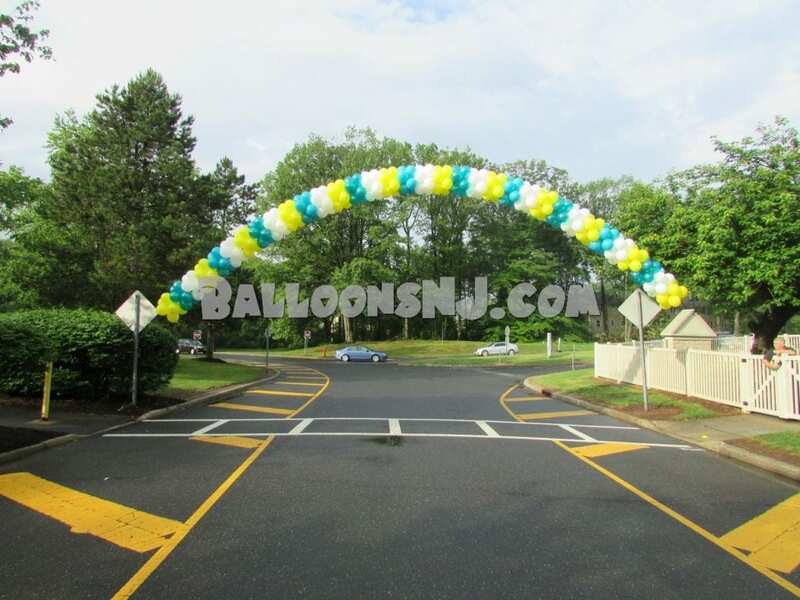 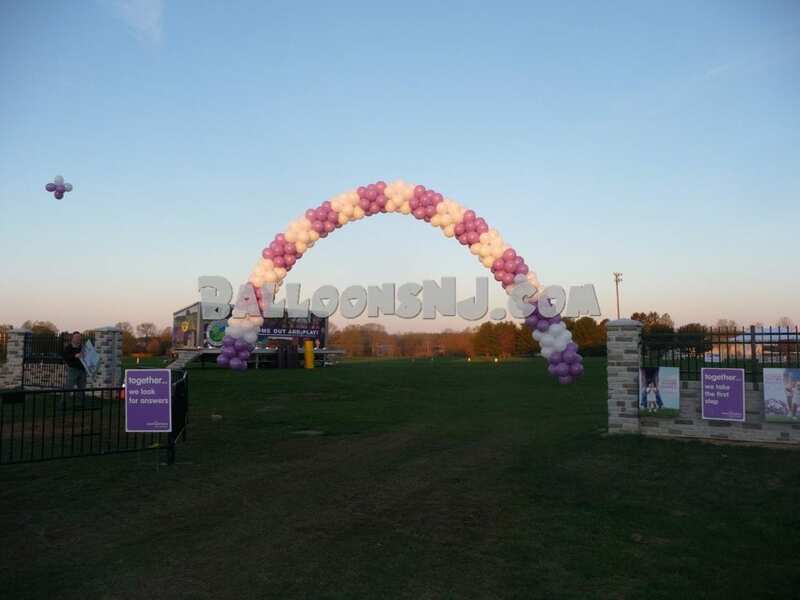 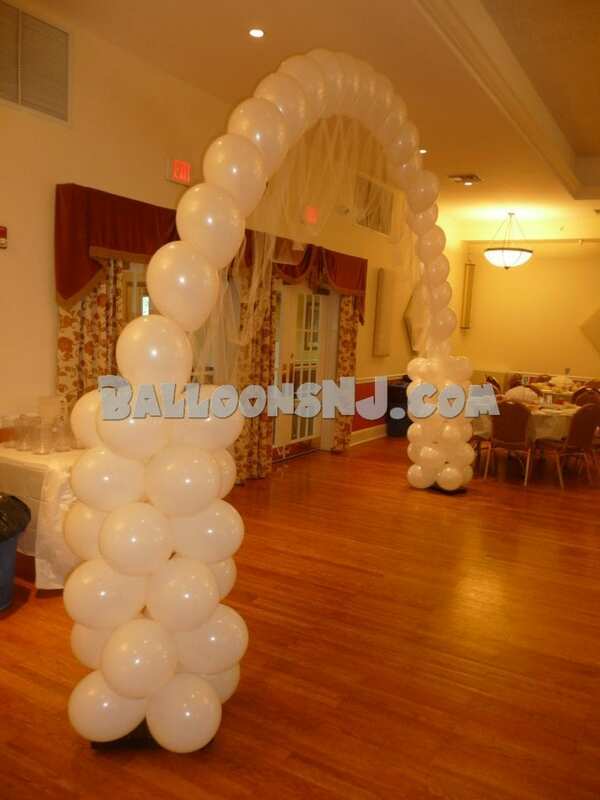 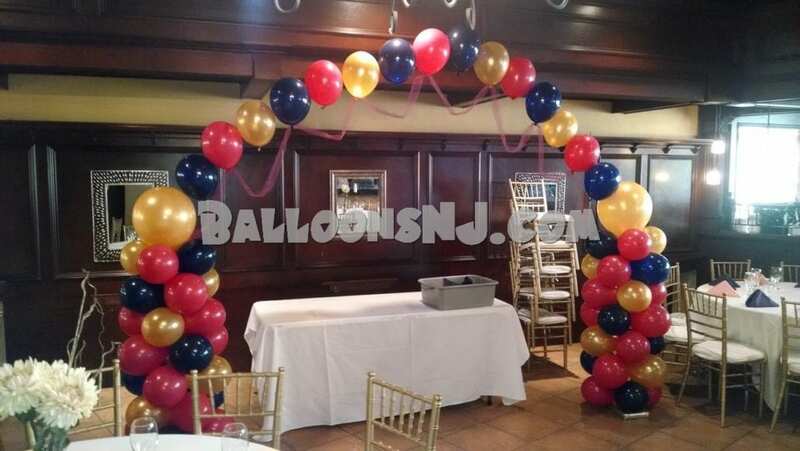 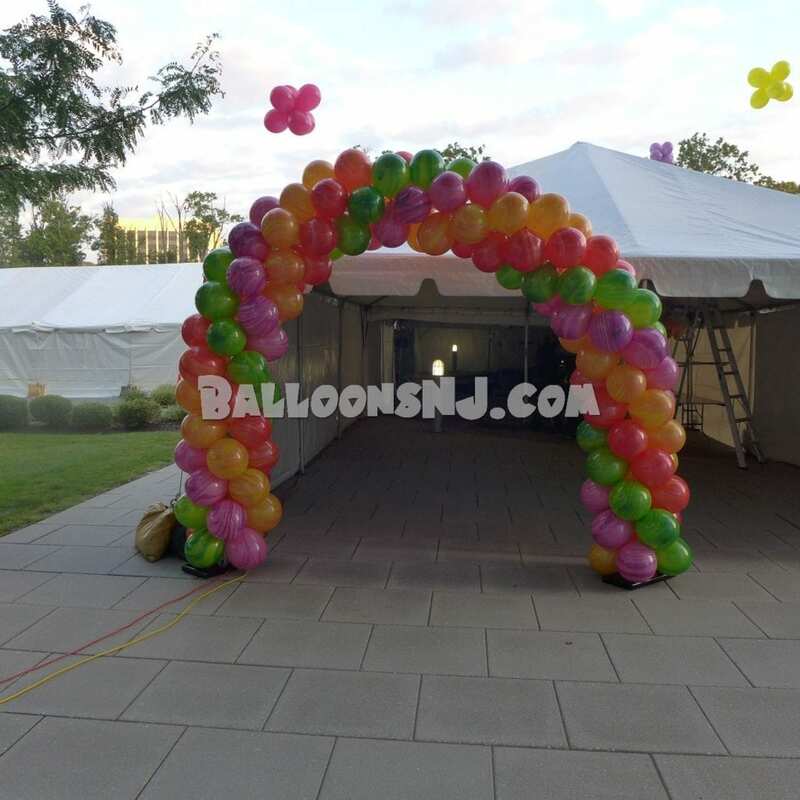 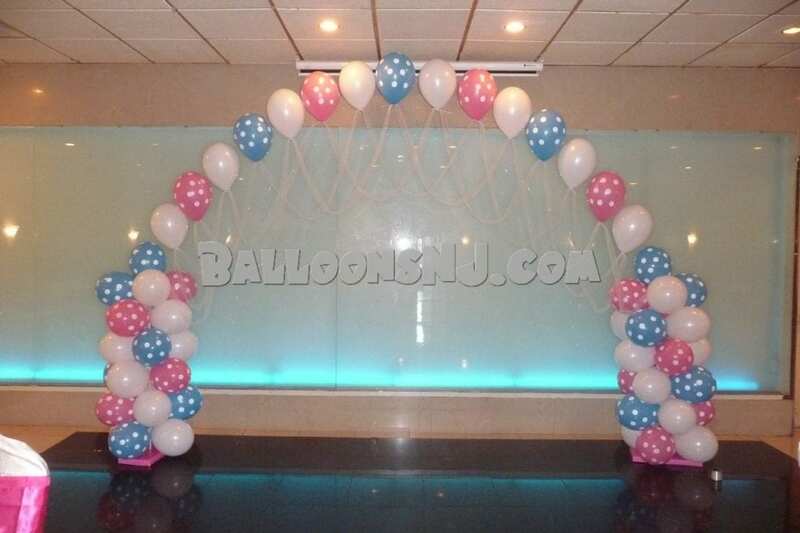 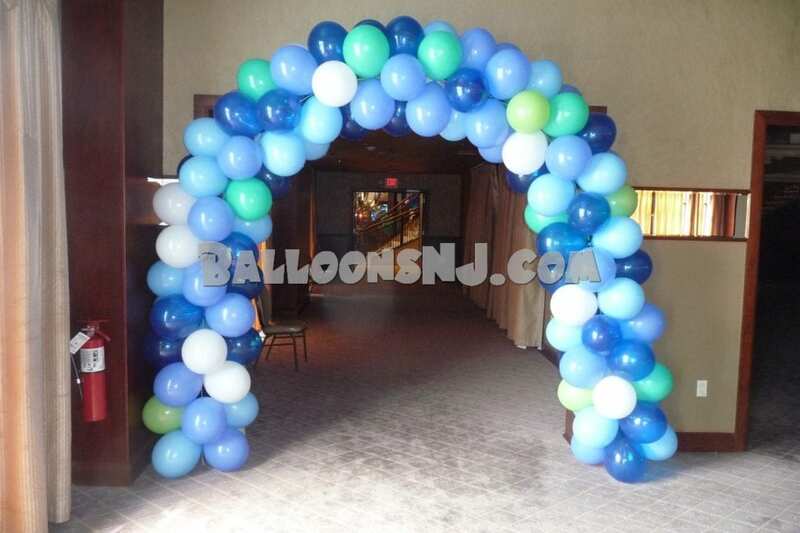 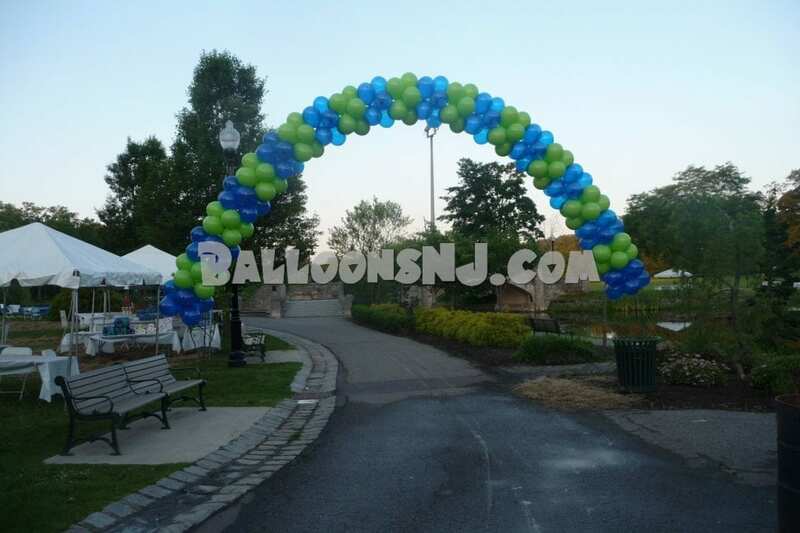 Columns Arch – The balloon column arch is made with 2 columns and connecting them with a line arch or two. 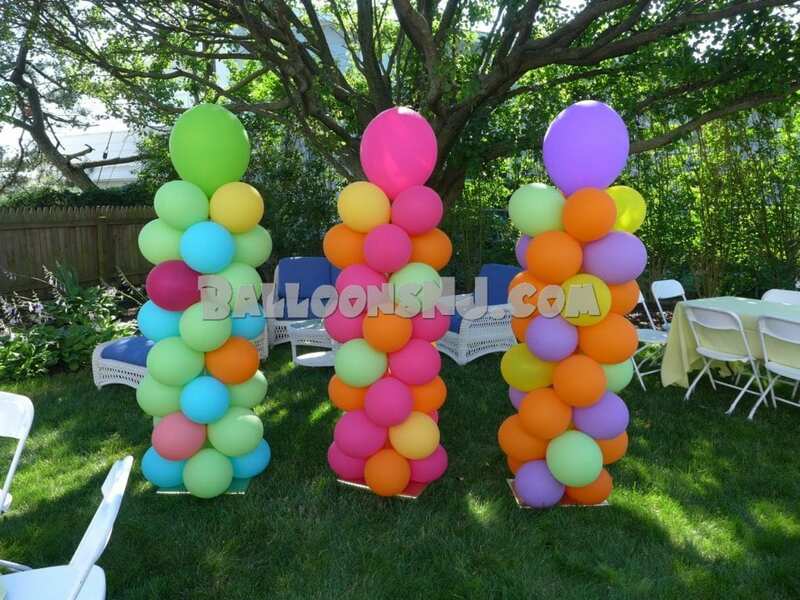 The columns used can vary in height according to their use. 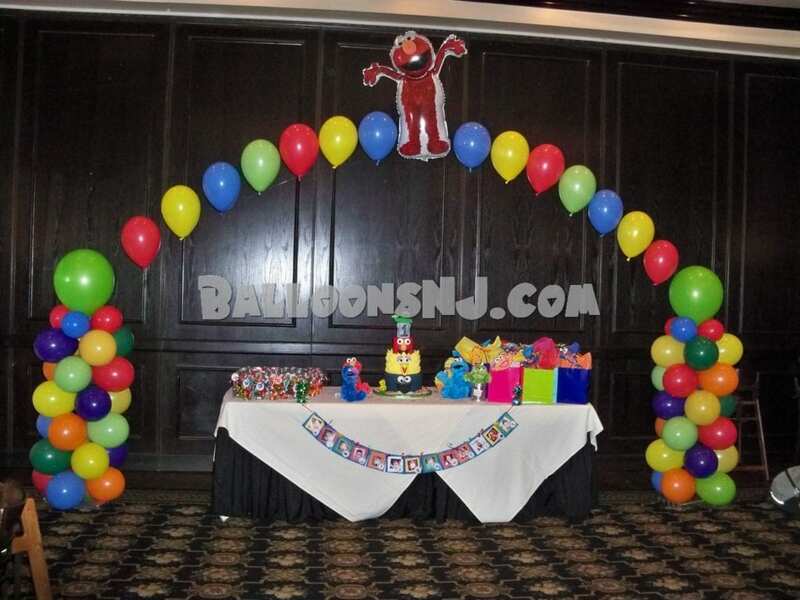 If the columns will flank a table with the arch over the table, we can use the 4-foot columns (plus a column topper balloon). 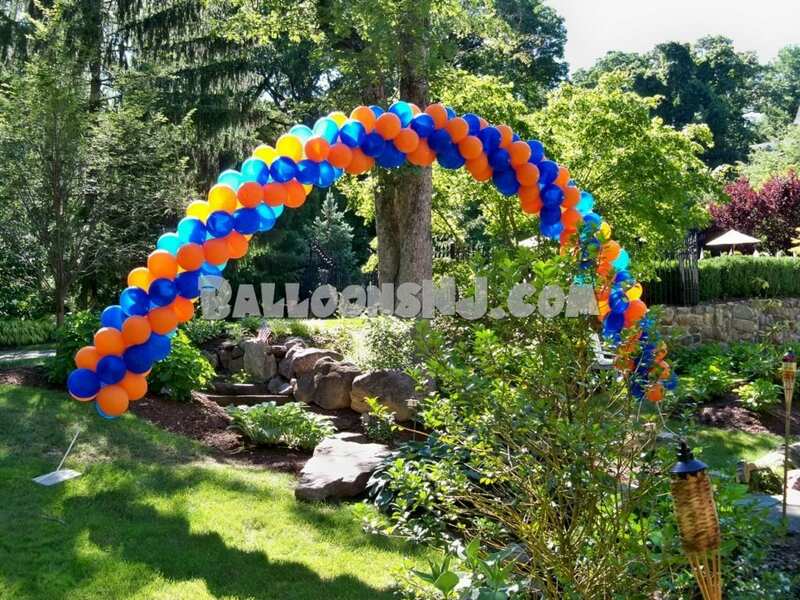 If the arch is to be walked under we will recommend taller columns. 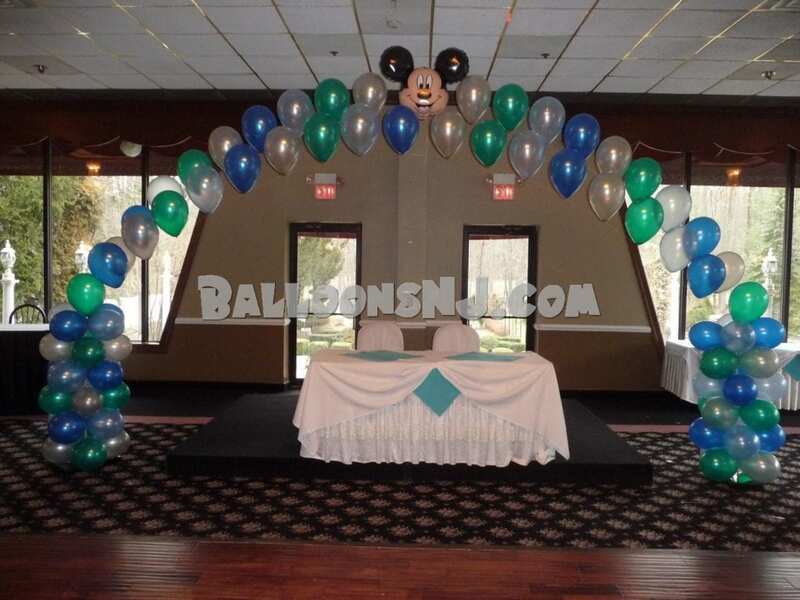 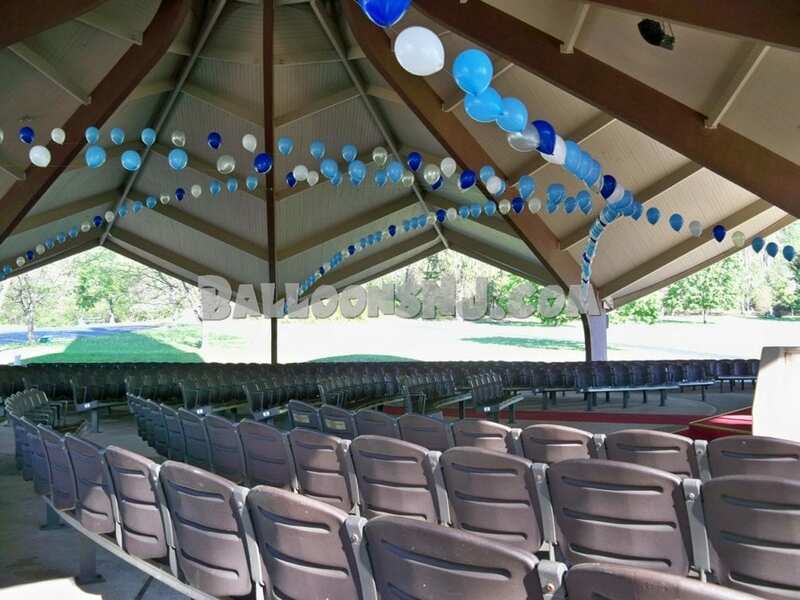 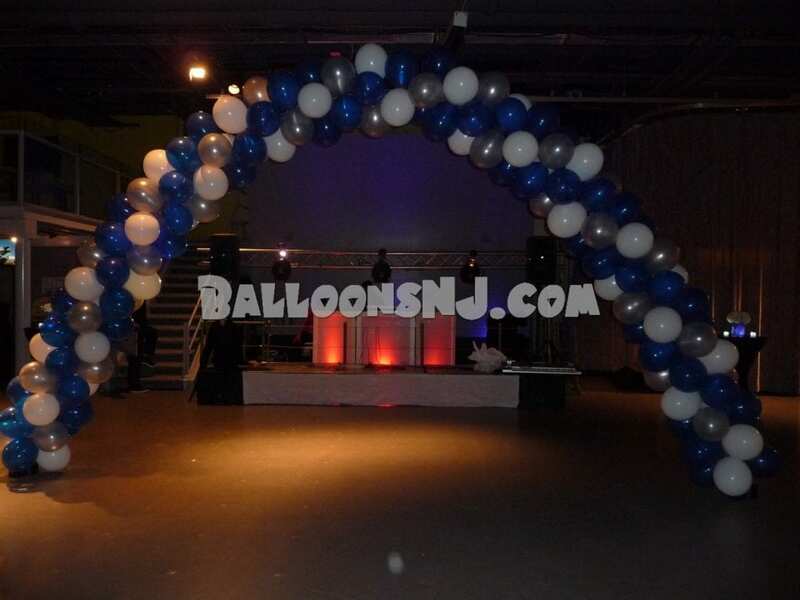 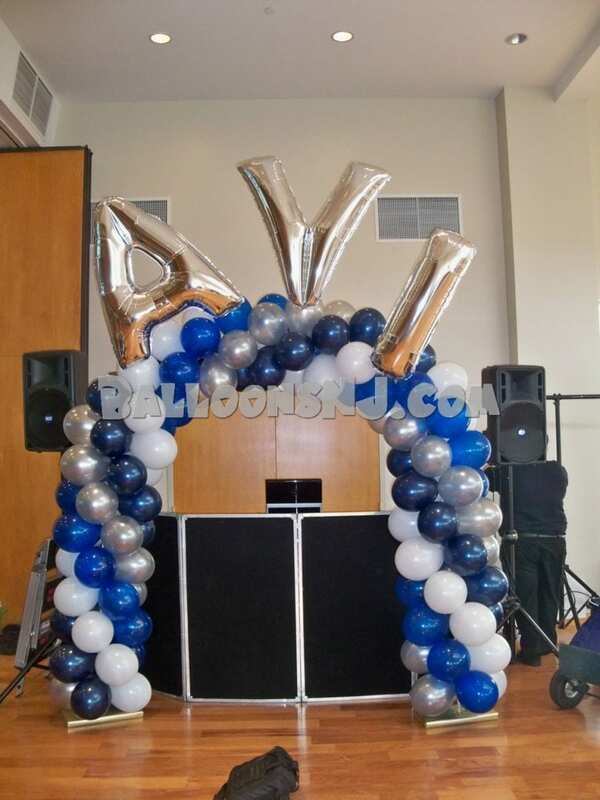 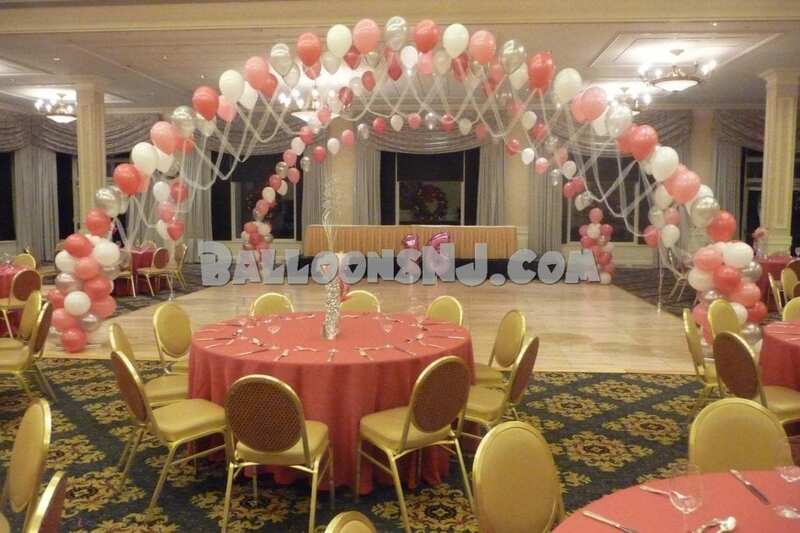 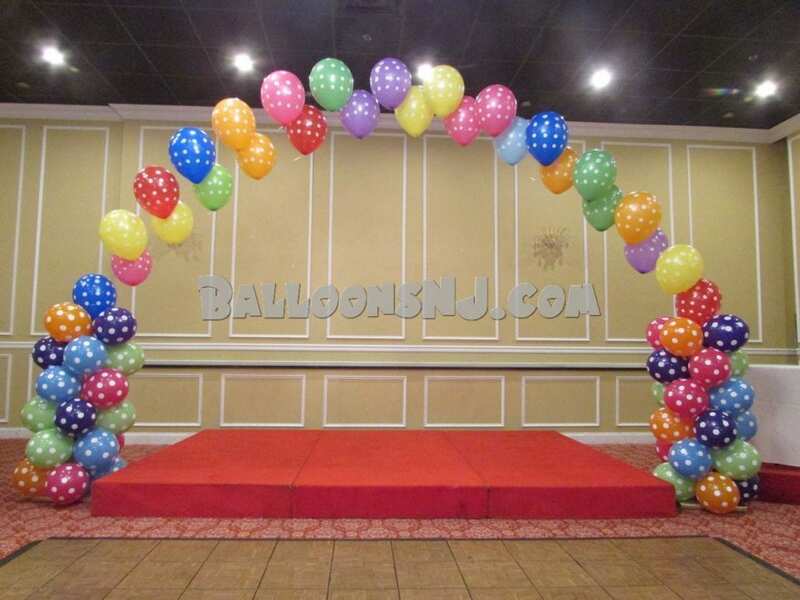 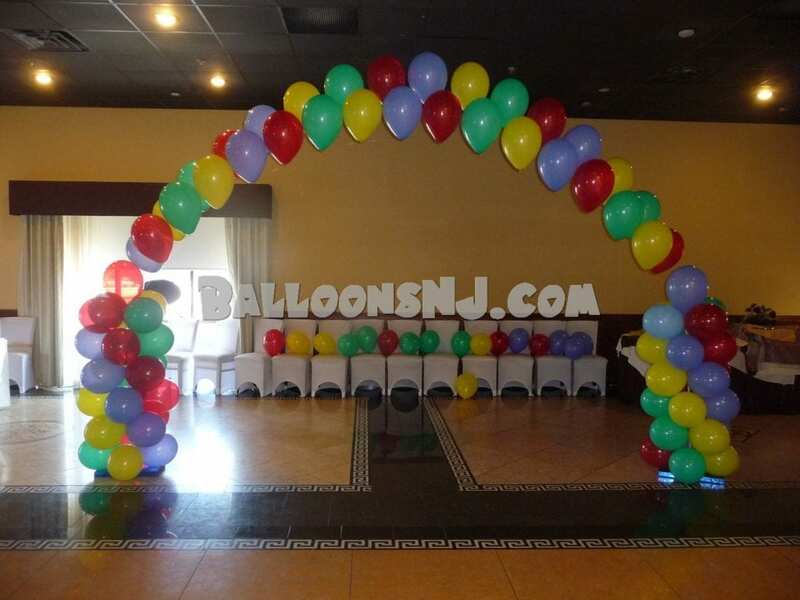 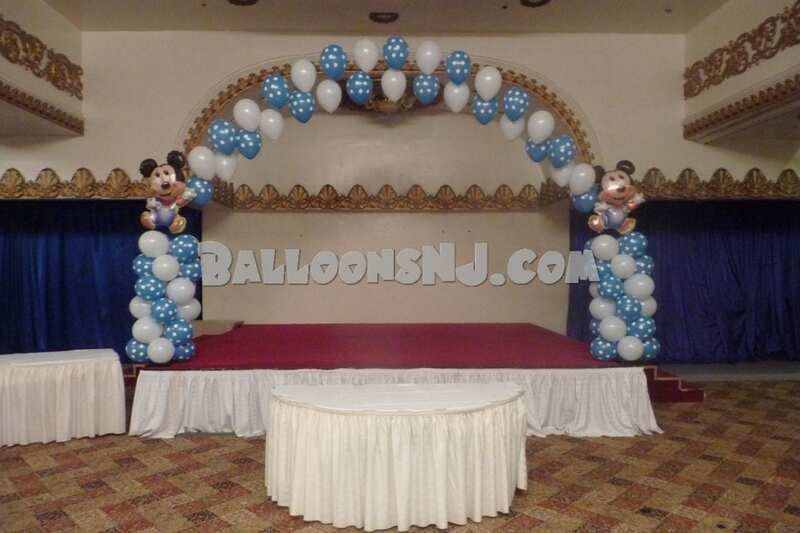 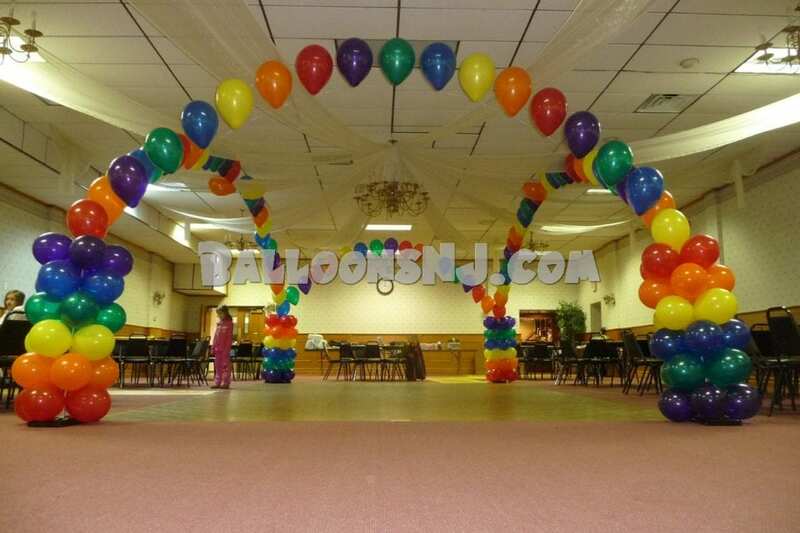 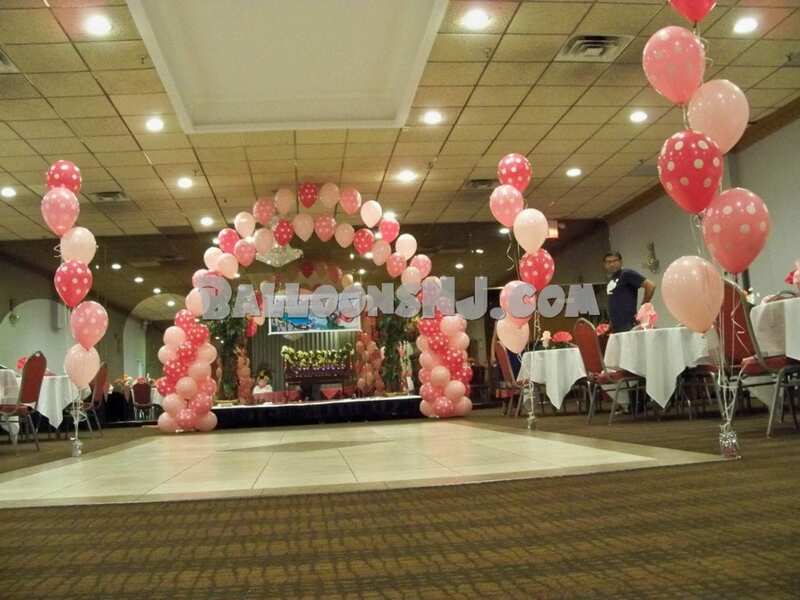 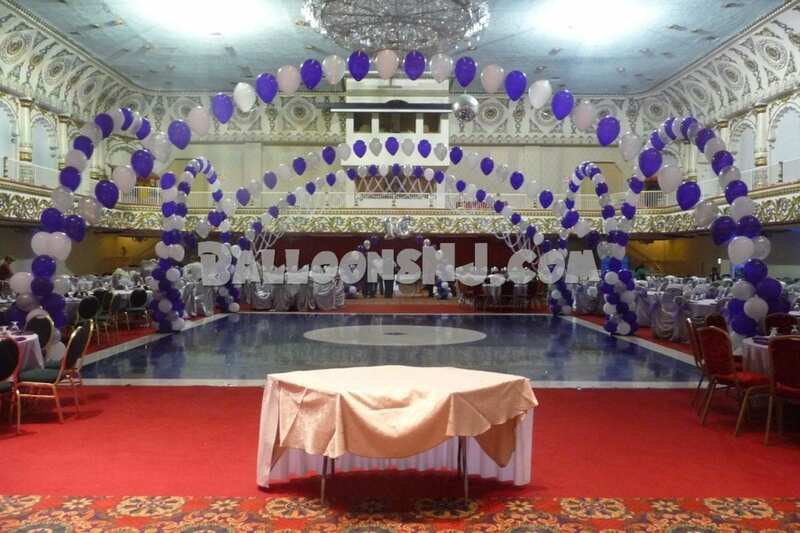 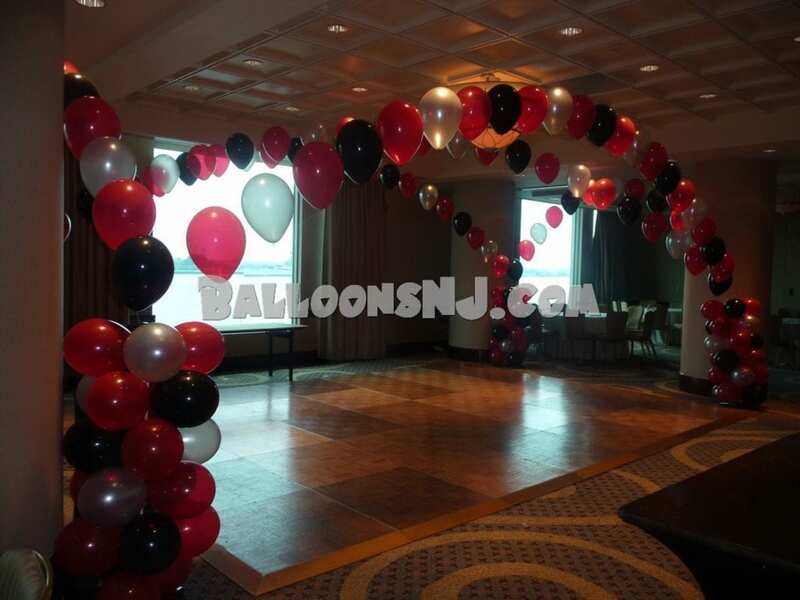 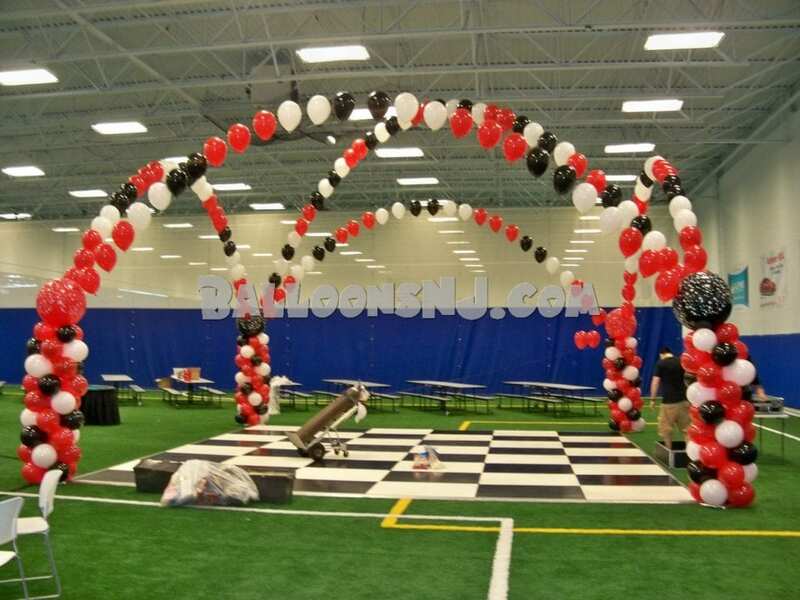 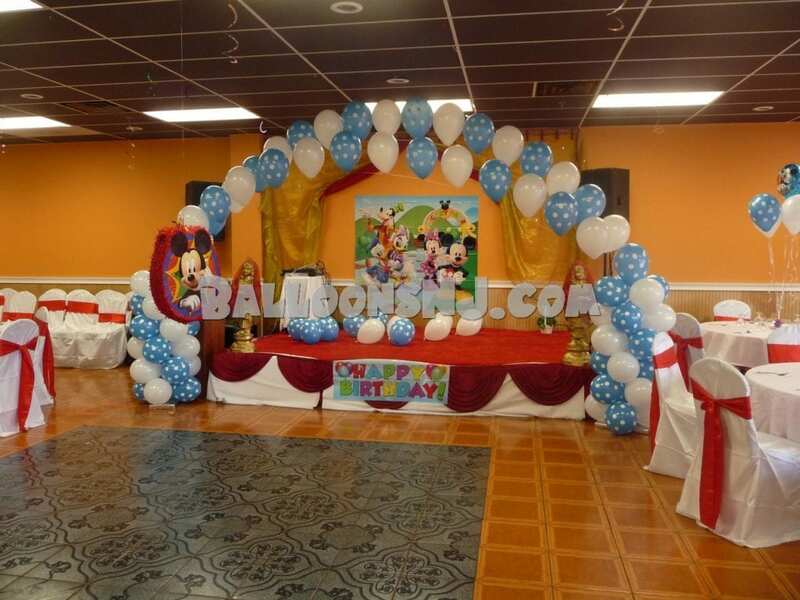 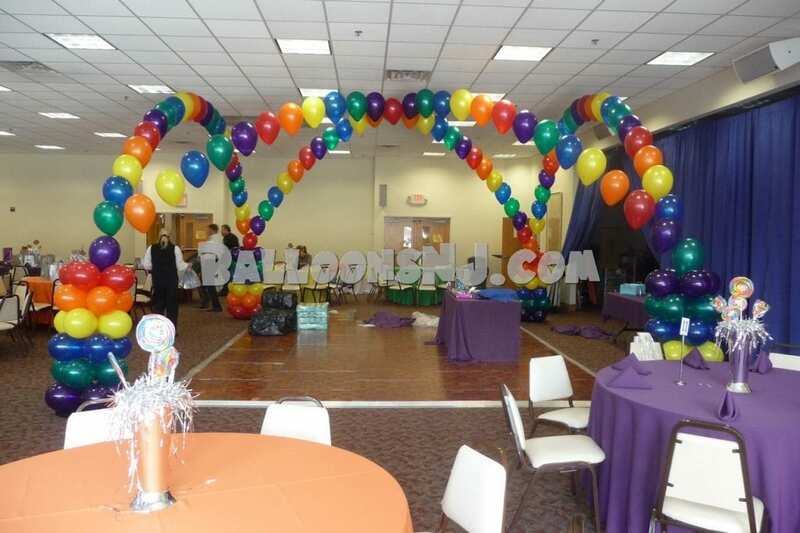 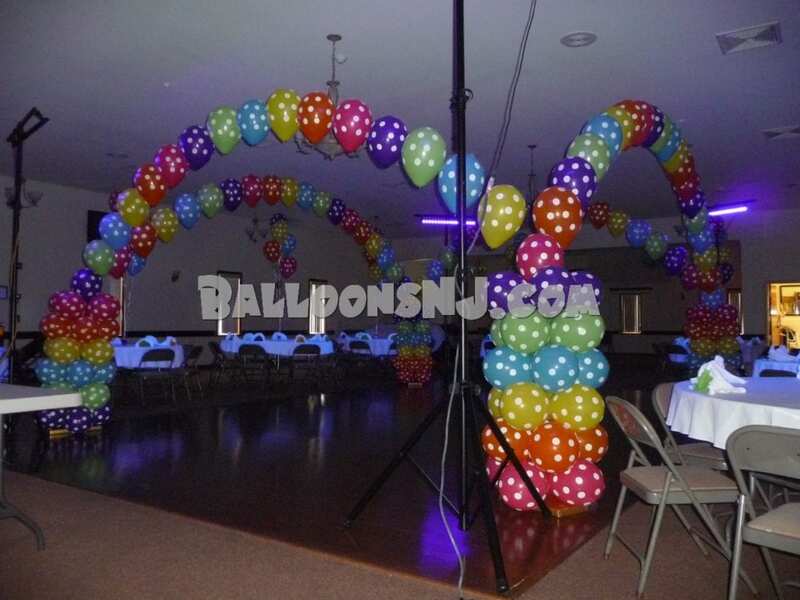 Dancefloor Arches – The dance floor arch is made up of balloon columns and connecting line arches. 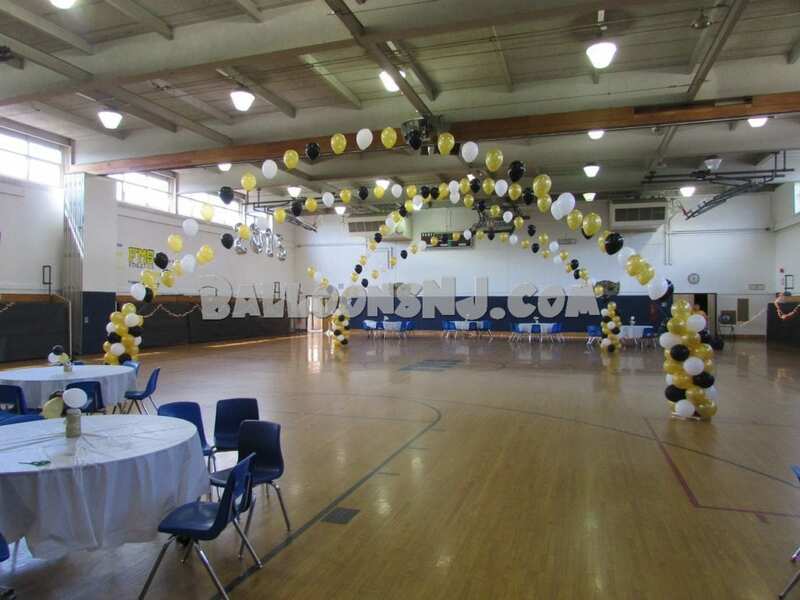 It usually frames the dance floor. 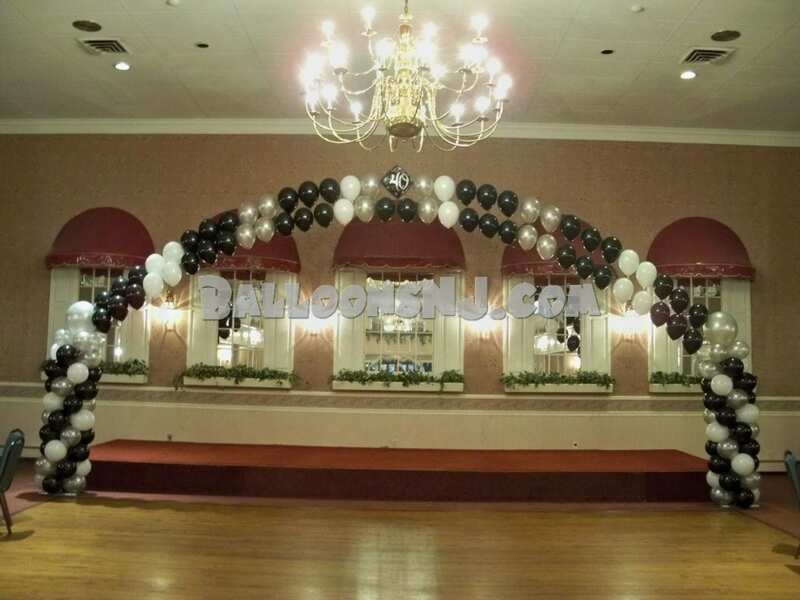 Four columns and four arches can make a nice rectangle regardless of size of the dance floor where ceiling height allows. 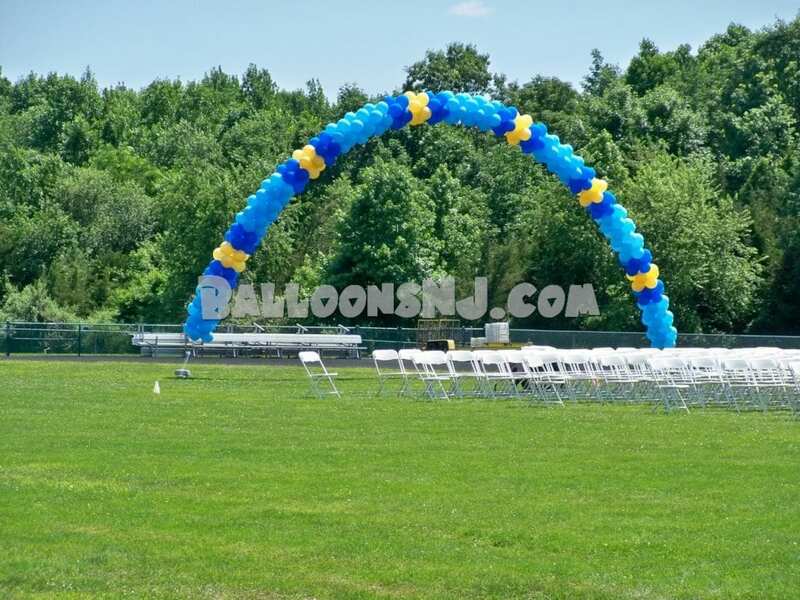 We can add columns and arches as needed. 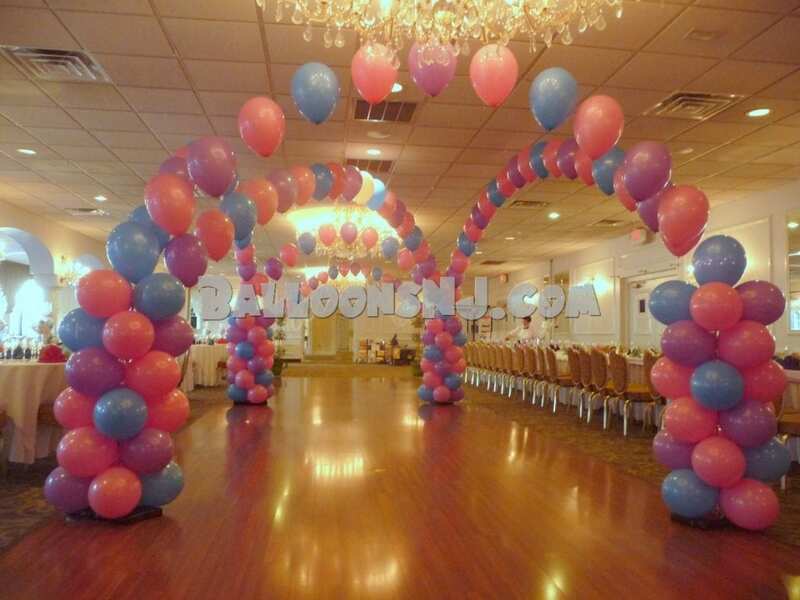 A long narrow space might need 8 columns and 10 smaller line arches. 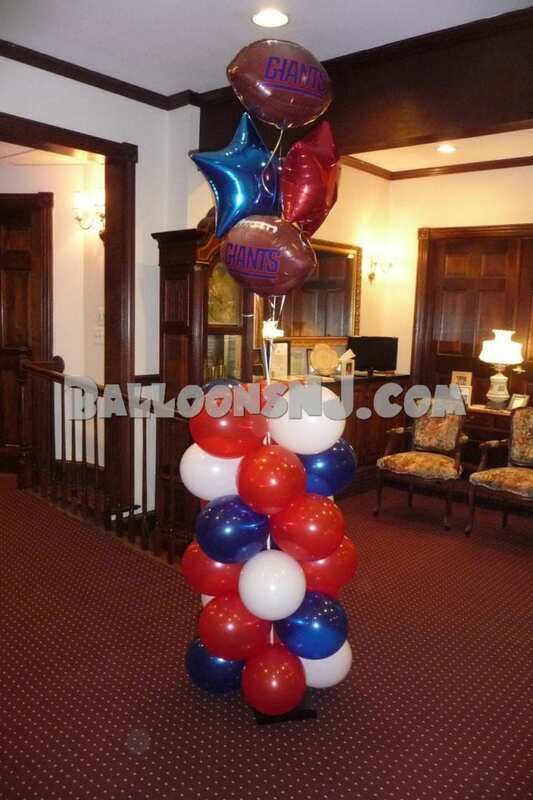 These are a big hit at proms, formals, sweet 16s and weddings. 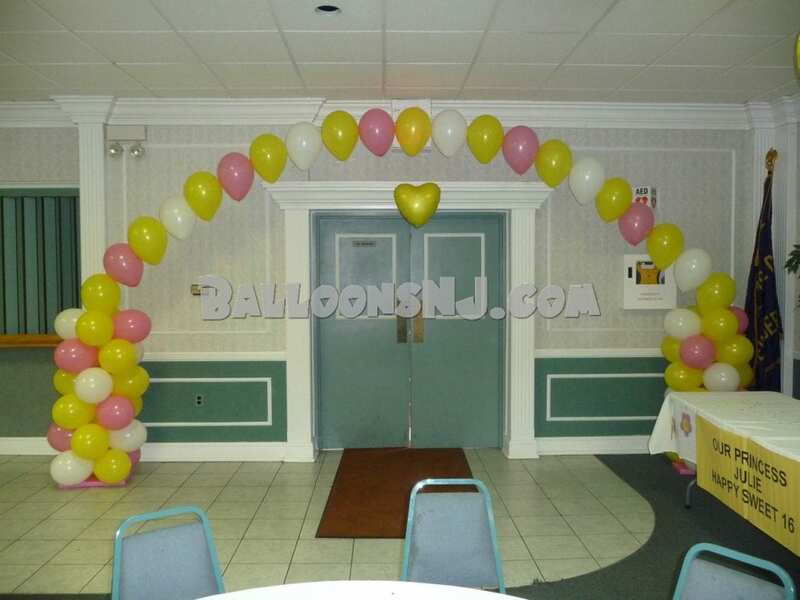 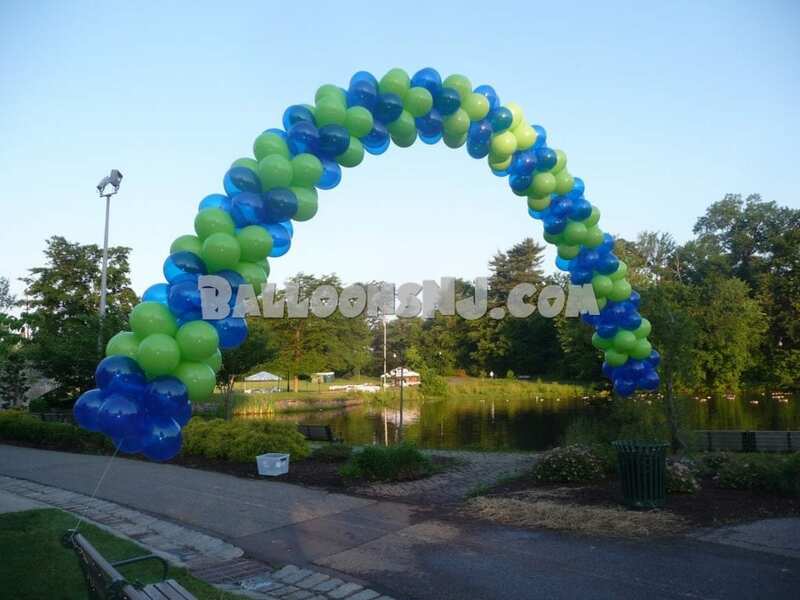 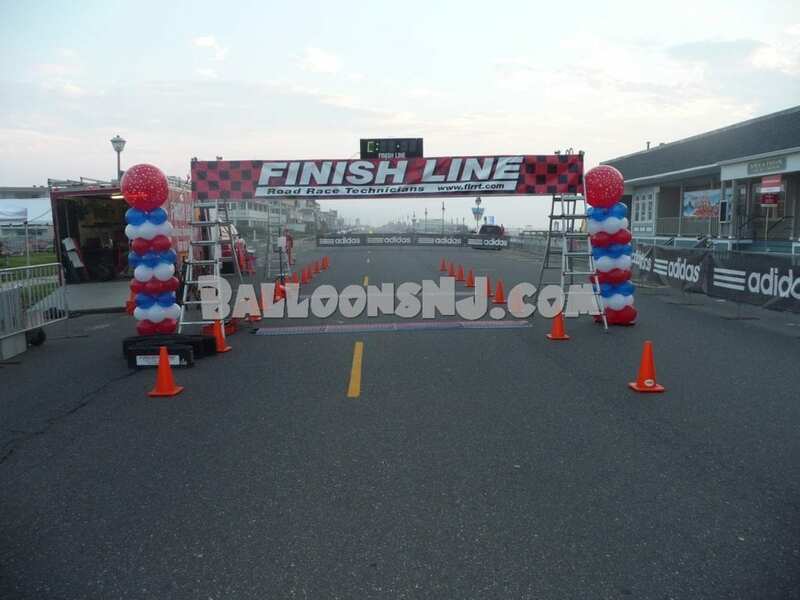 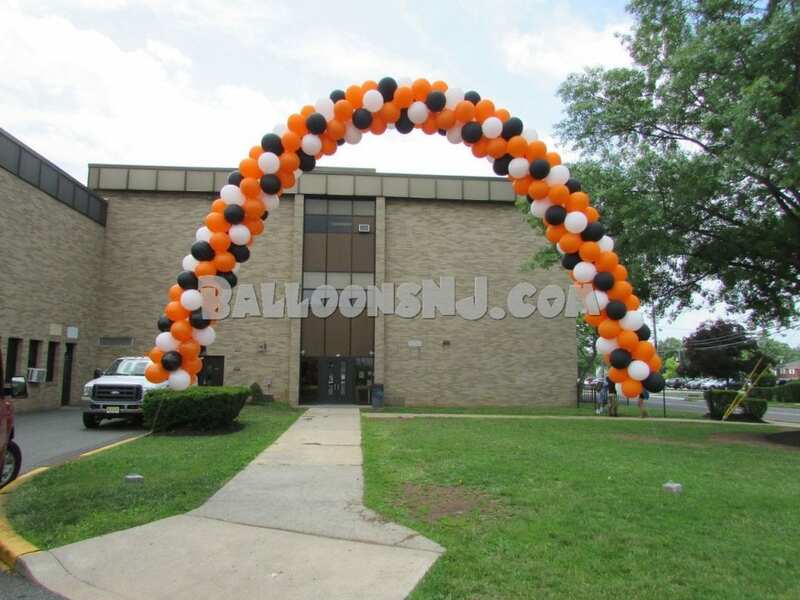 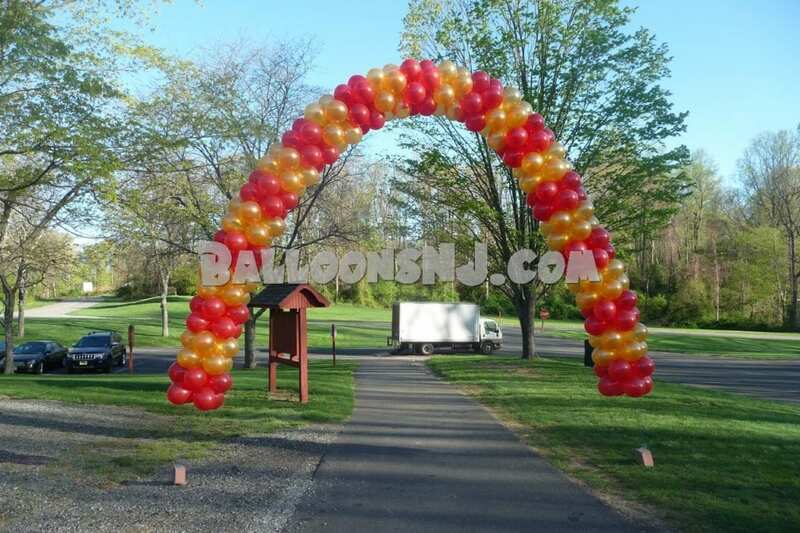 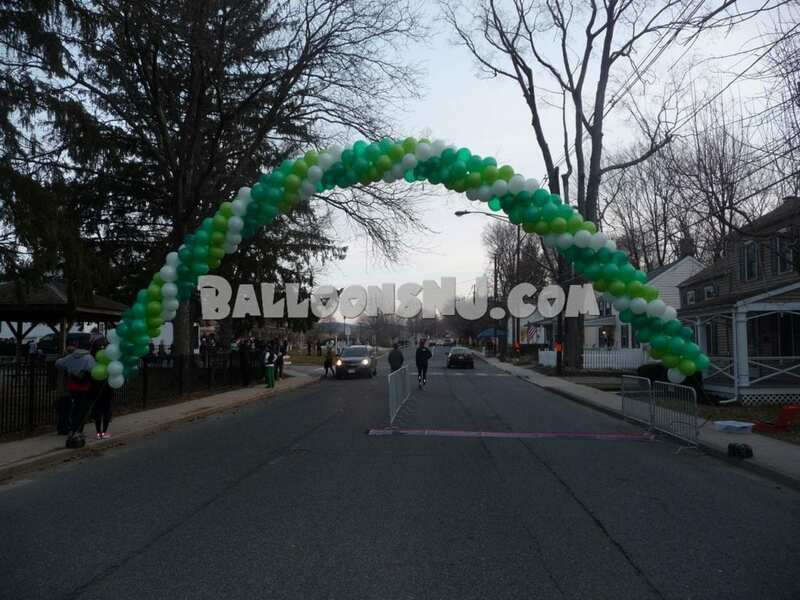 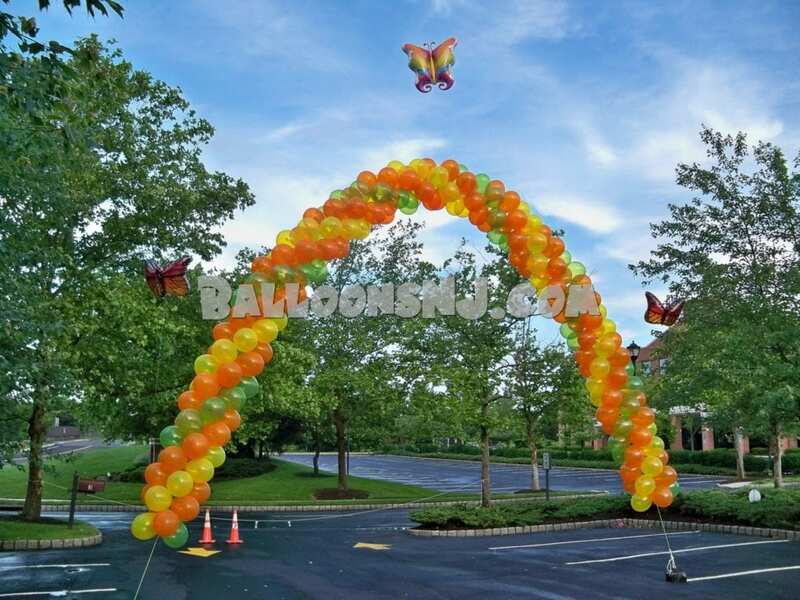 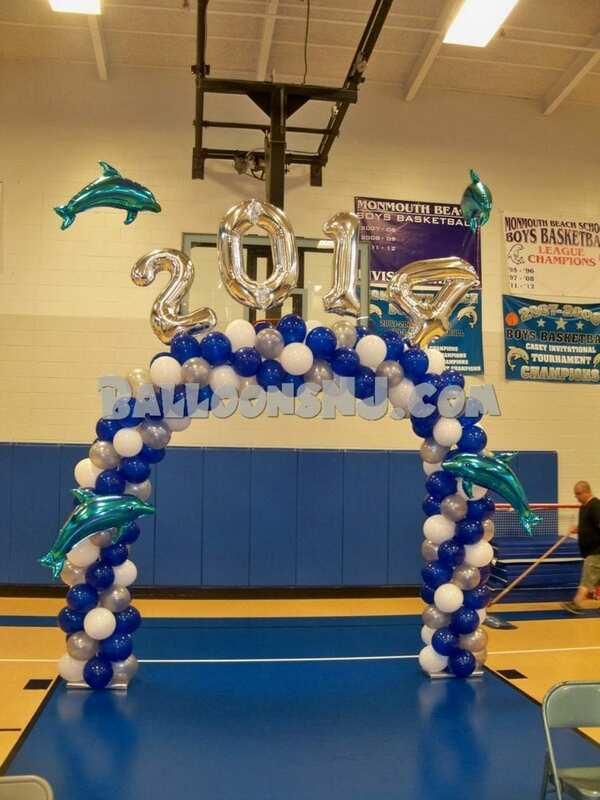 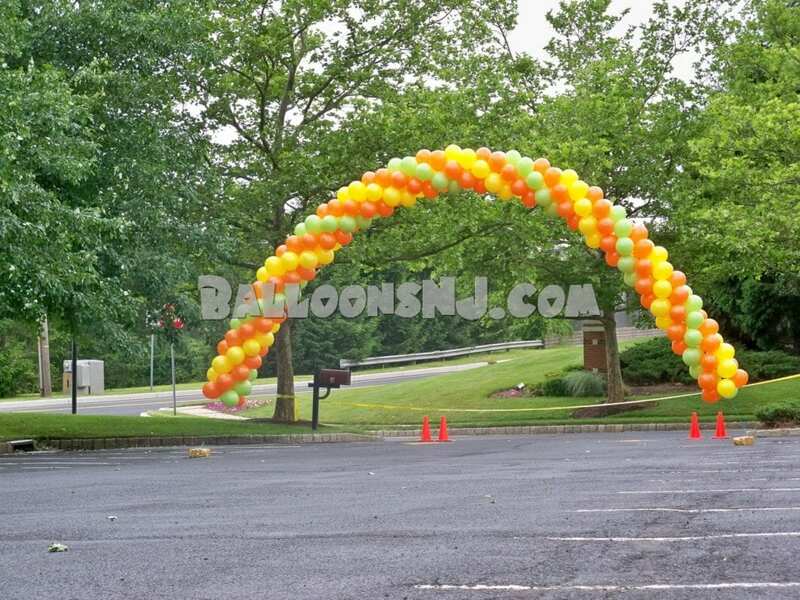 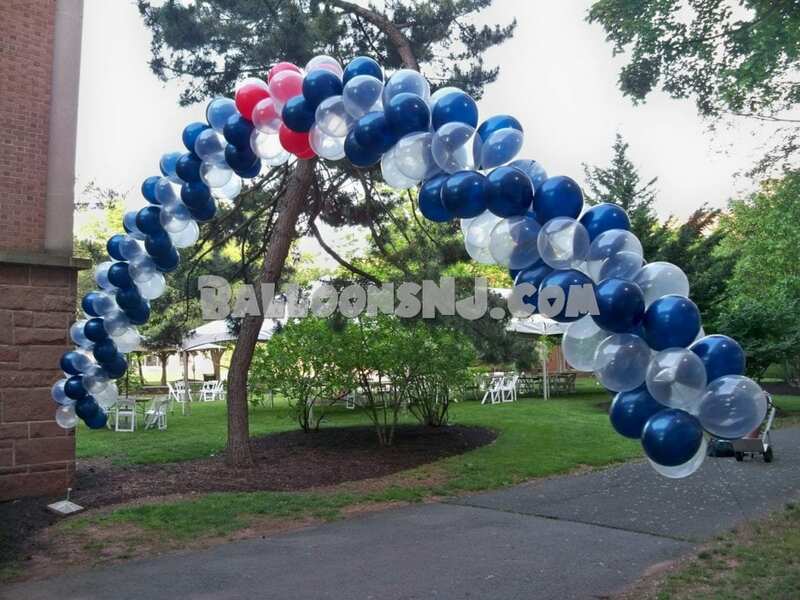 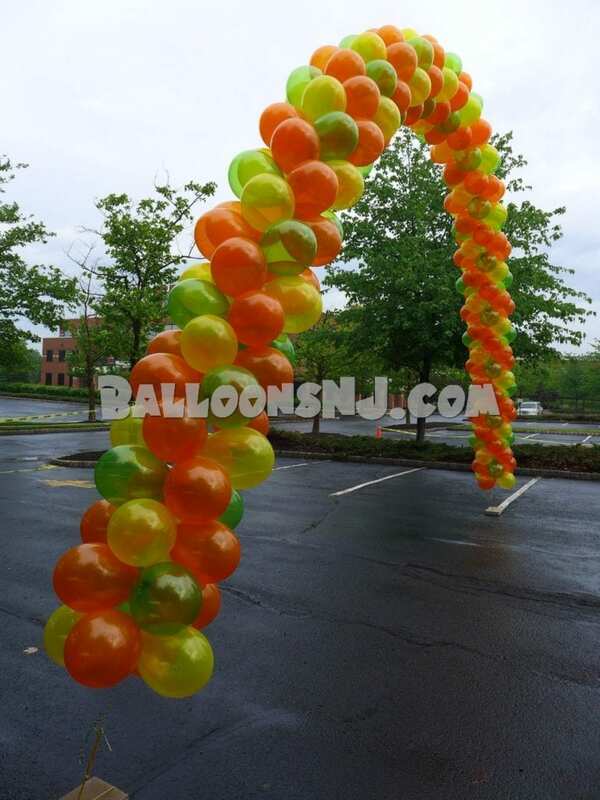 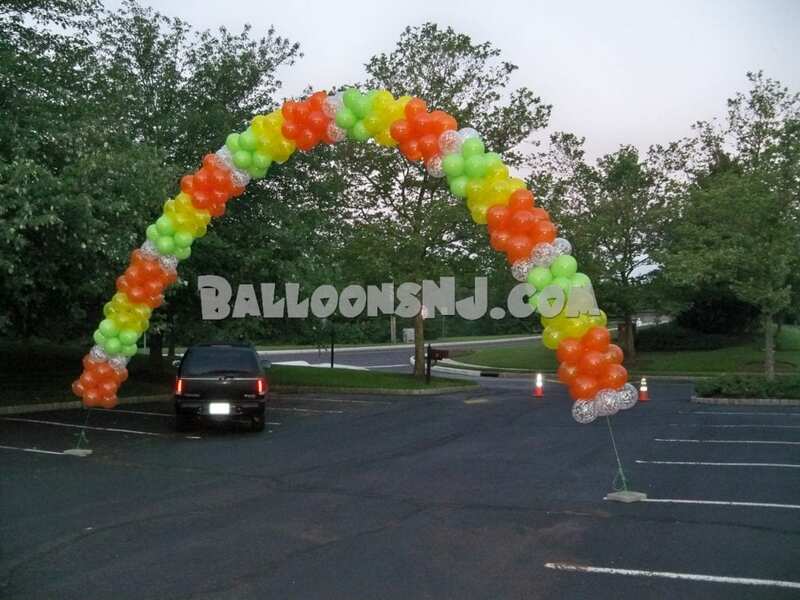 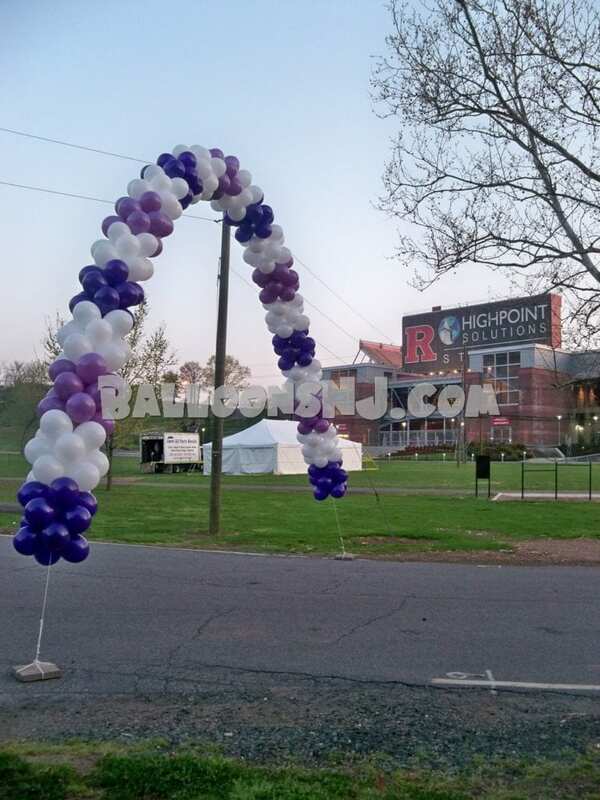 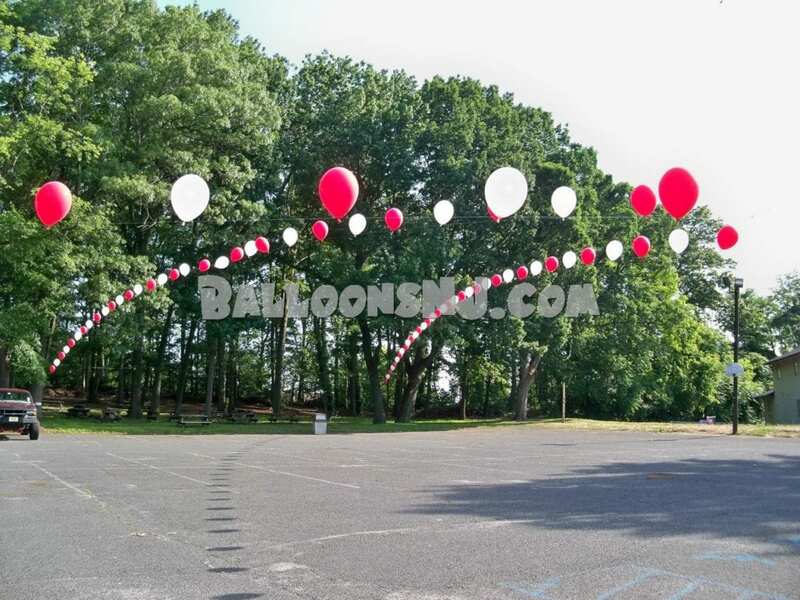 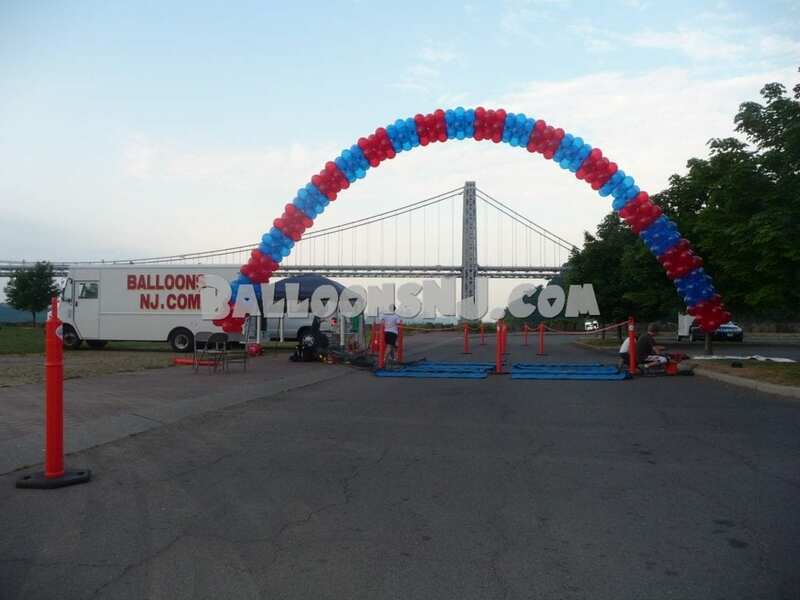 Balloon Line Arch – is just a line of balloons tied at two points. 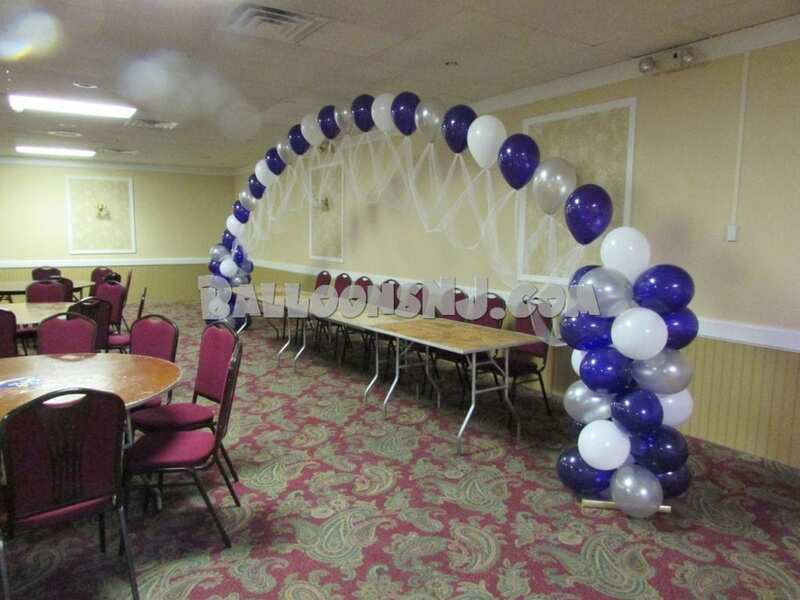 In the “Columns and Arch” and “Dance Floor Arch” examples above, line arches are tied to columns on both ends. 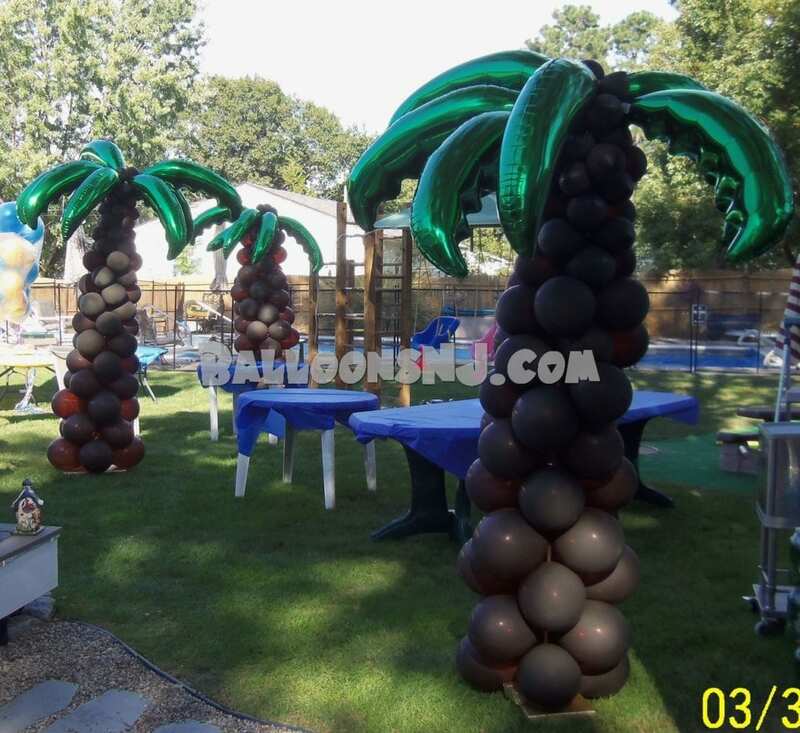 But they can also be tied to fence posts, trees and other convenient anchoring points. 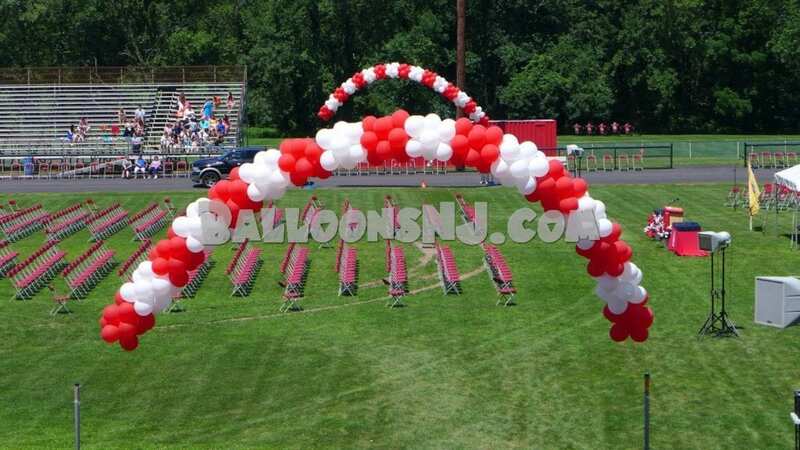 A “streamer” is just a line arch tied at one end, to a weight or anchor point, and loose on the other end to float. 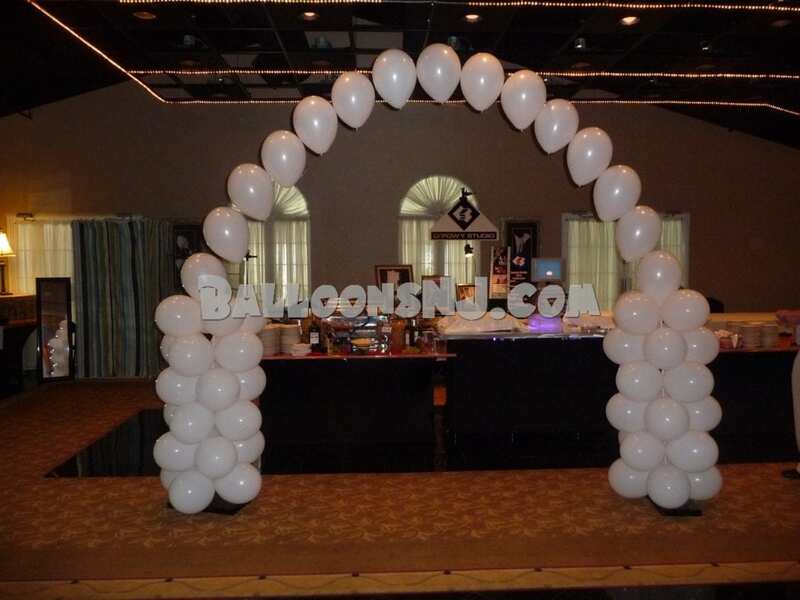 The term “arch” is used liberally here as the line might be stretched tight between two points or might be draped down from above and used with air-filled balloons to form a reverse-arch. 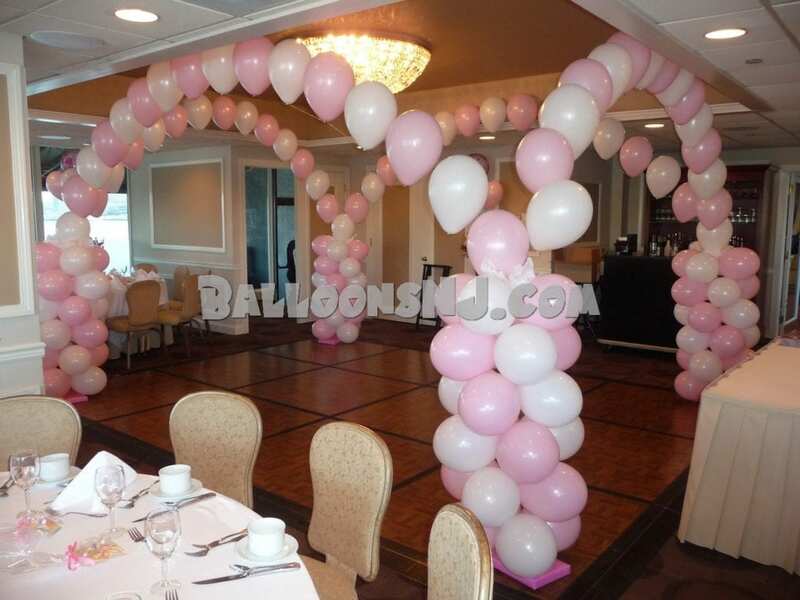 Single Line Arch – is single balloons tied along a line. 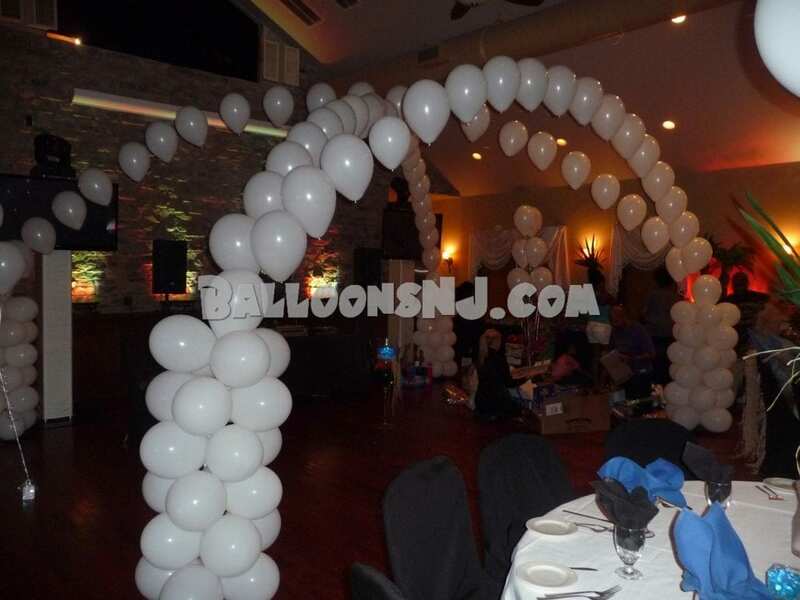 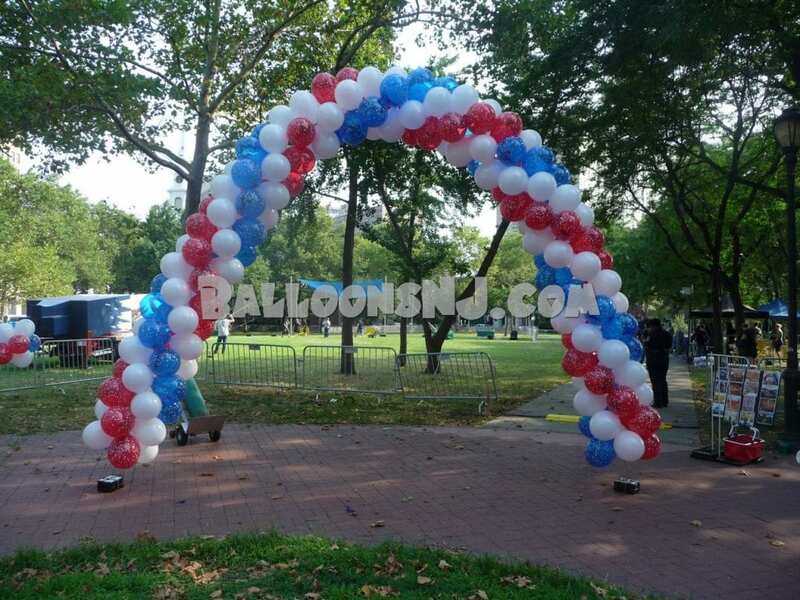 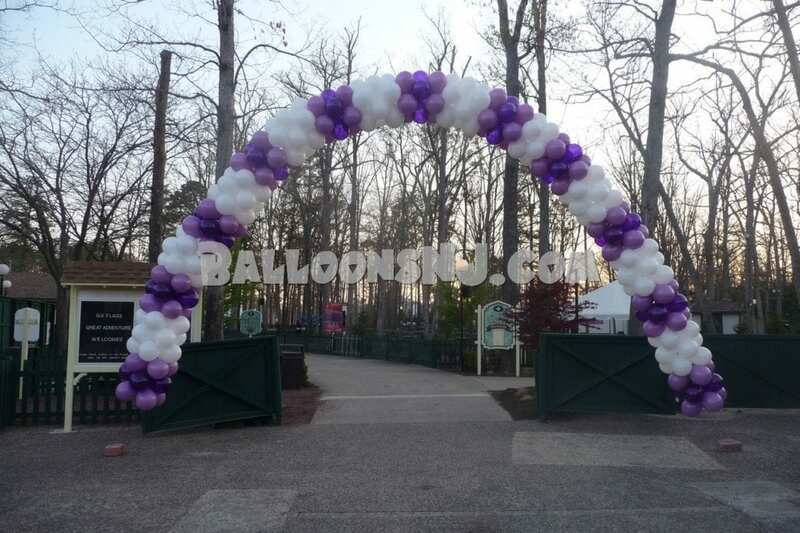 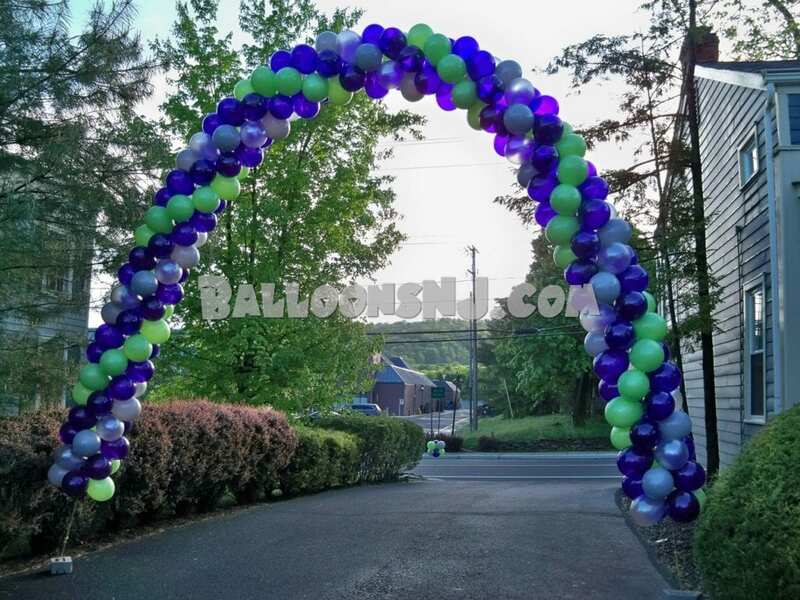 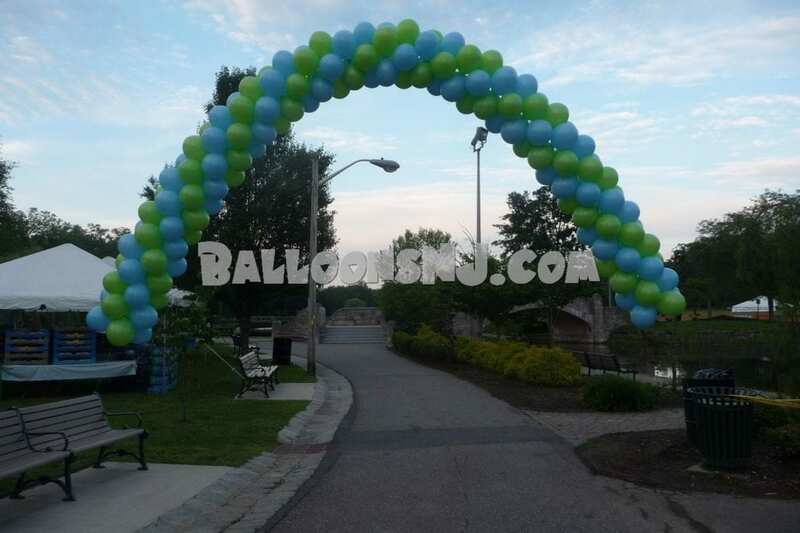 It is also called a “string of pearls” arch when the balloons are tightly positioned. 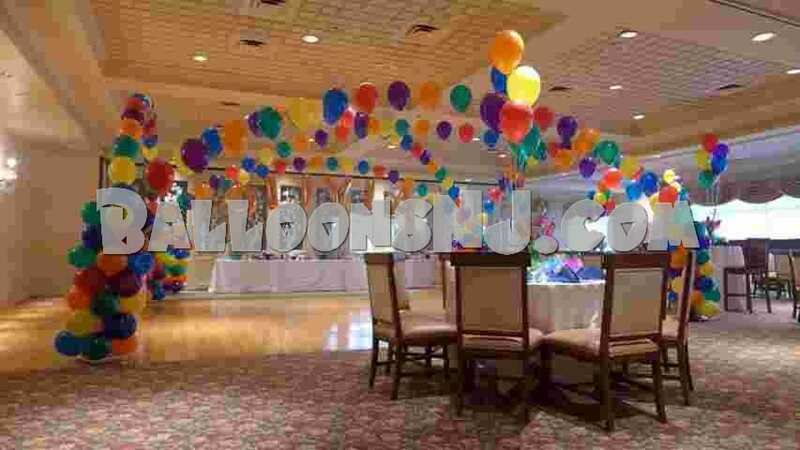 These are used in the “Columns Arch” and “Dance Floor Arch” as well. 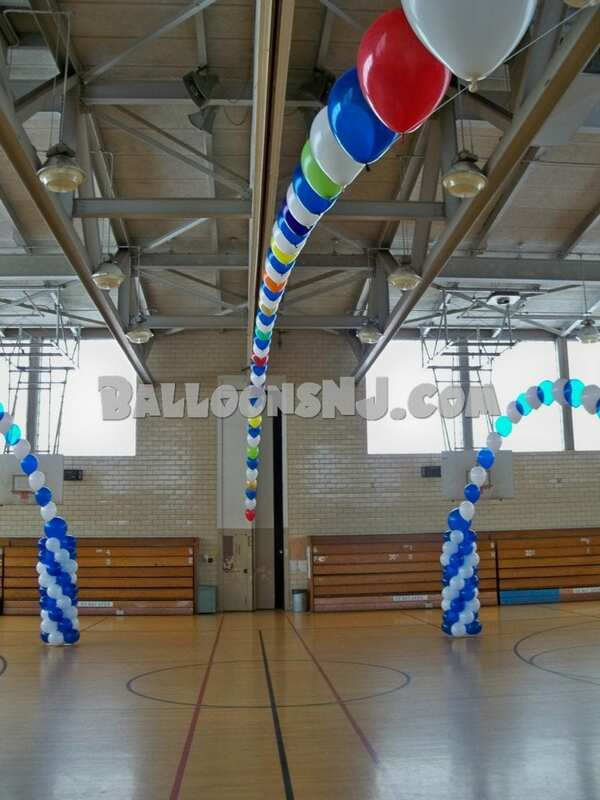 We have done lengths up to a 100 feet or so. 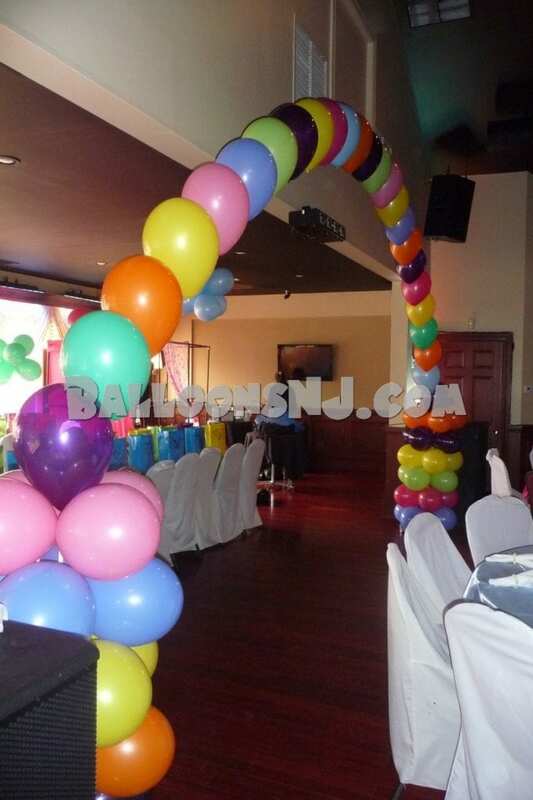 Cluster Line Arch – Clusters of balloons tied to a line at intervals to form an arch. 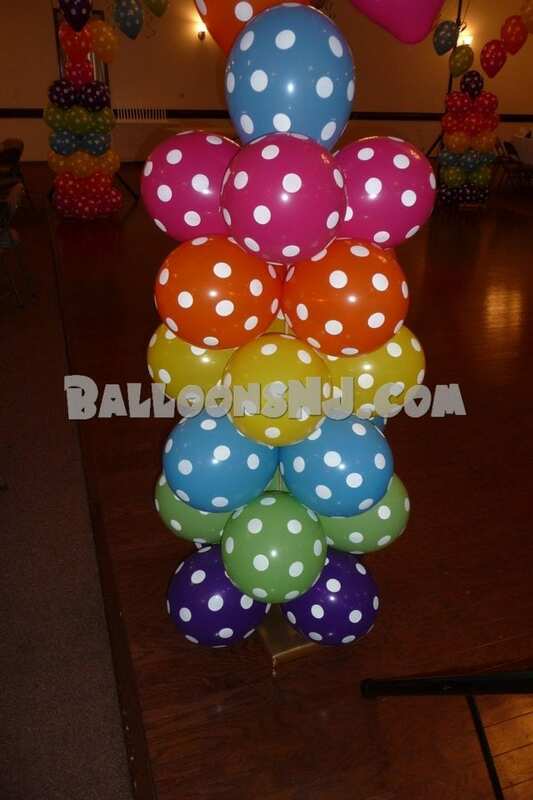 Clusters of two are called duplets, but the main cluster sizes used are of six balloons. 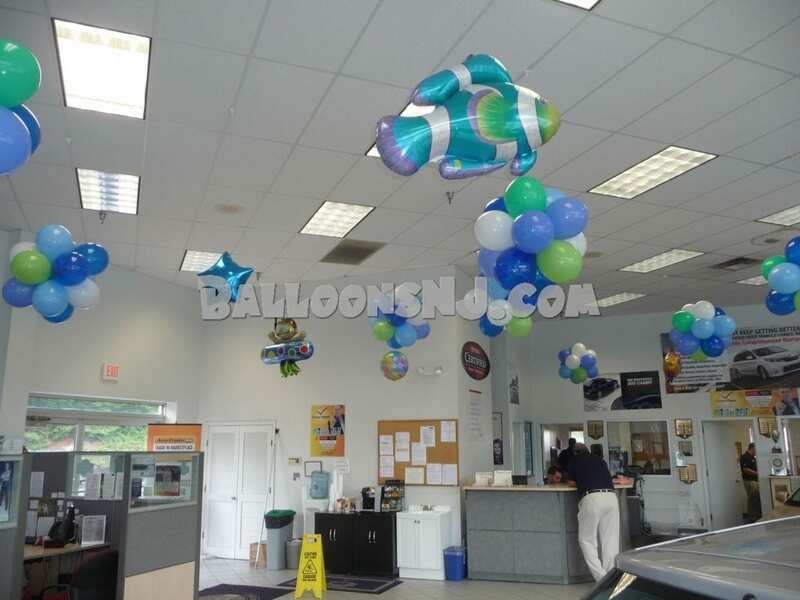 Occasionally large clusters of 12 balloons can be used. 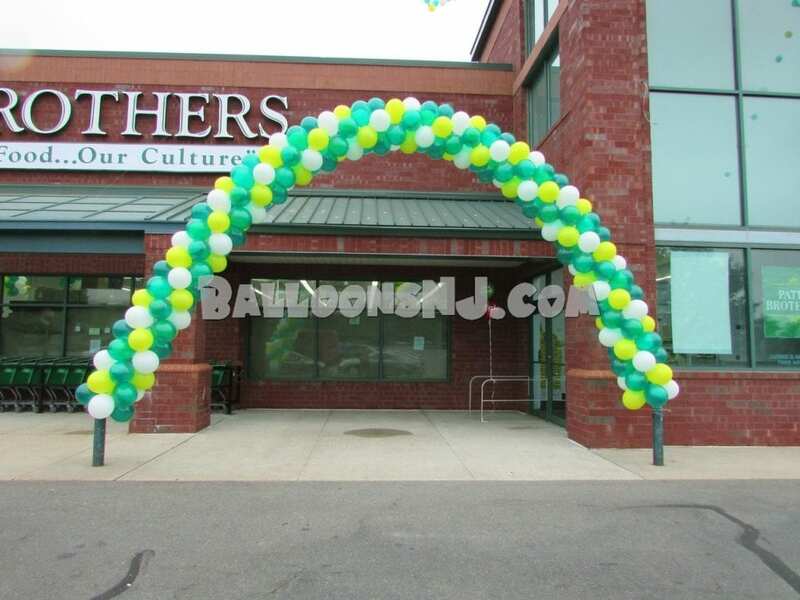 Balloon Streamer – is like a line arch in that it is single balloons or clusters tied along a line at intervals. 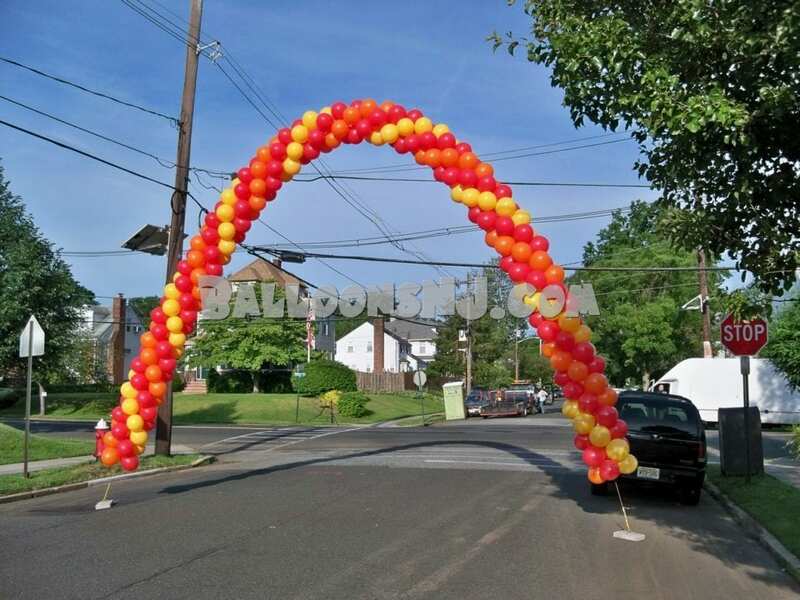 But this line is tied at a single point with the other end rising freely. 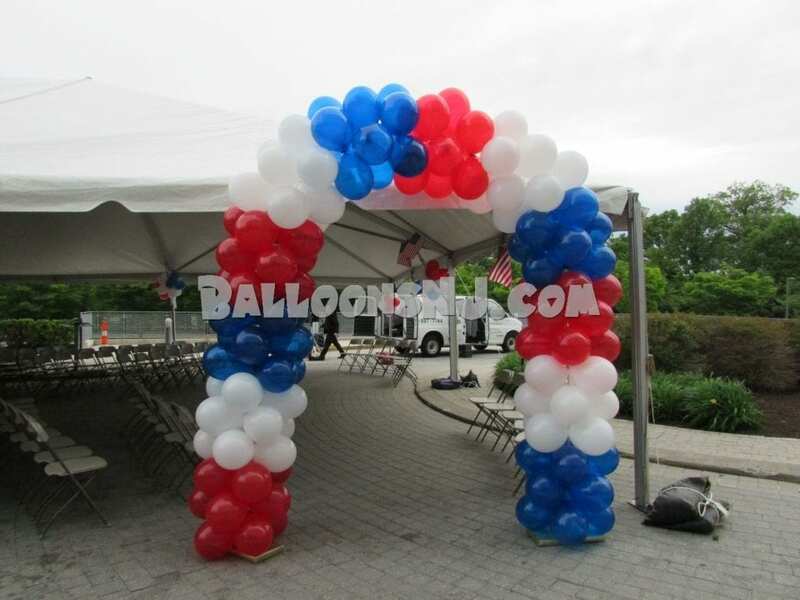 It is most often used tied to outer tent poles and on freely movable weights. 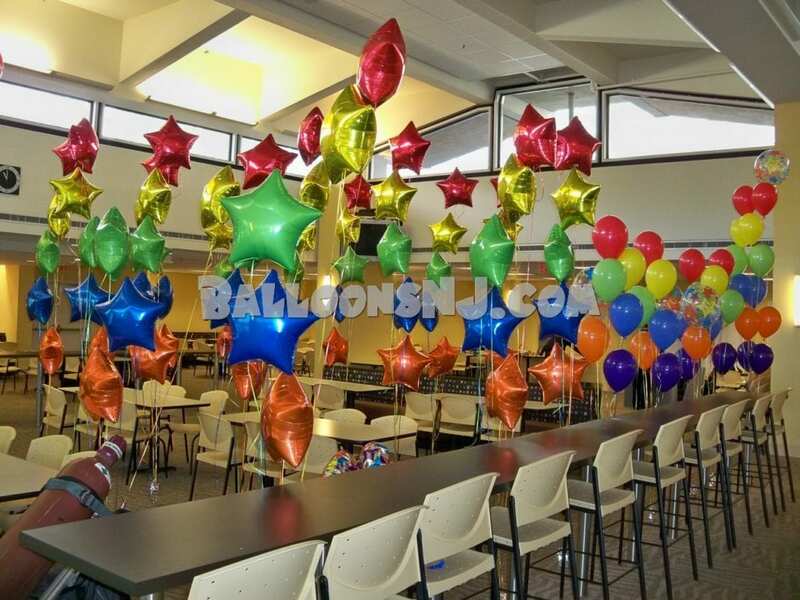 If you use single balloons it is a “single streamer” and if you use clusters it is a “cluster streamer”. 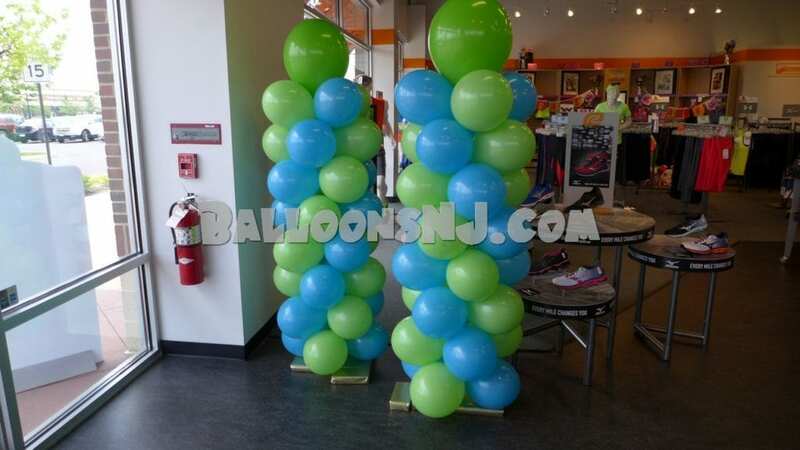 Hanging Clusters – look great in showrooms and retail locations and in tents. 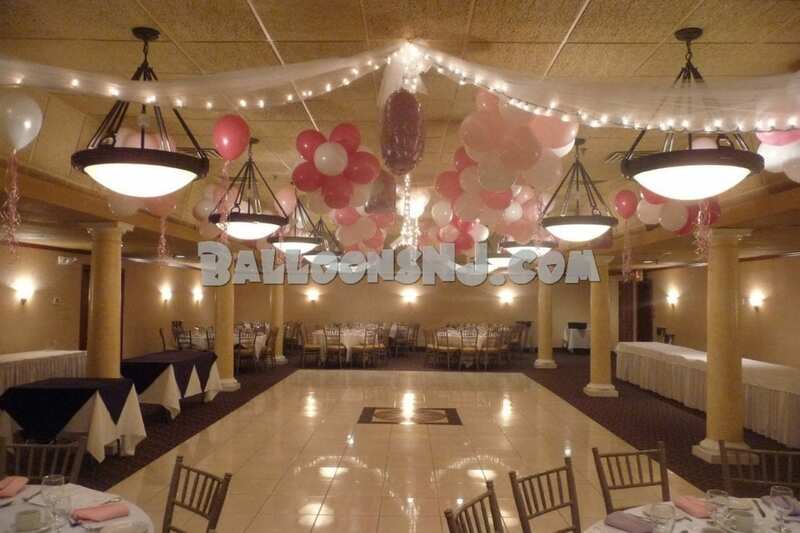 Over dance floors they require certain ceilings where we might attach clips. 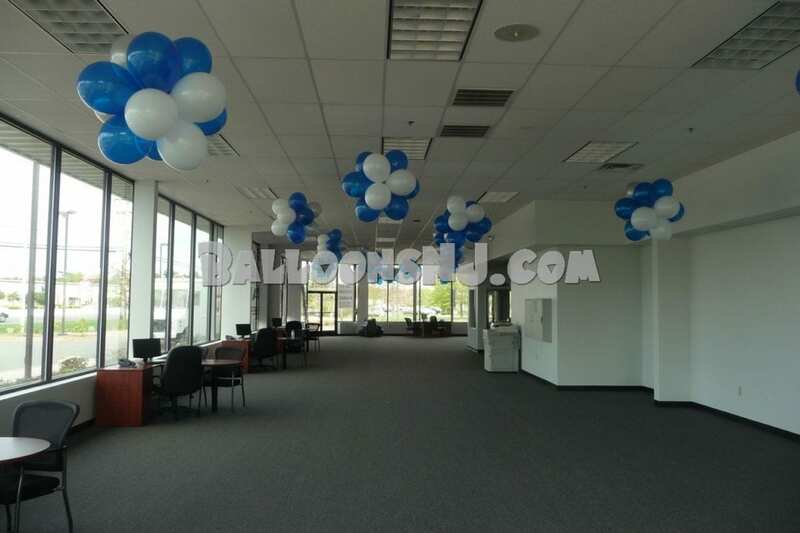 Drop ceilings are most common. 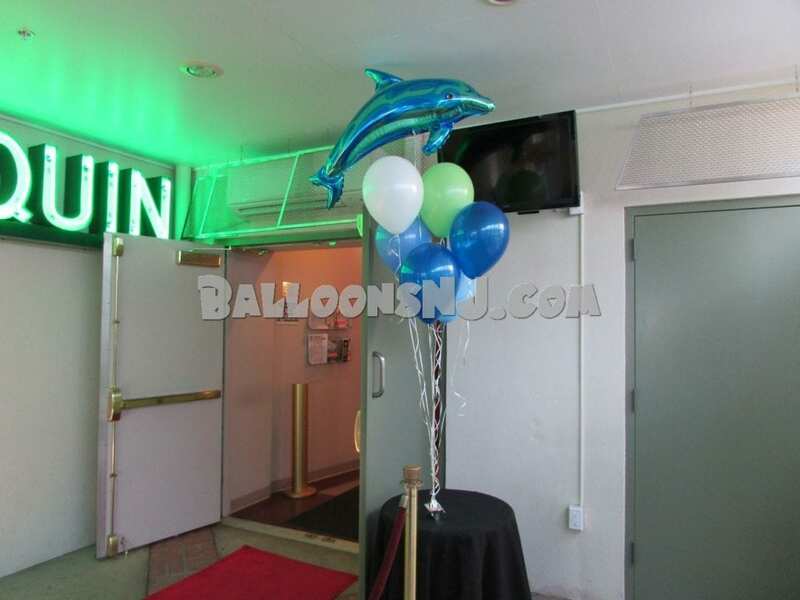 You also need the permission of the facility and that is rare. 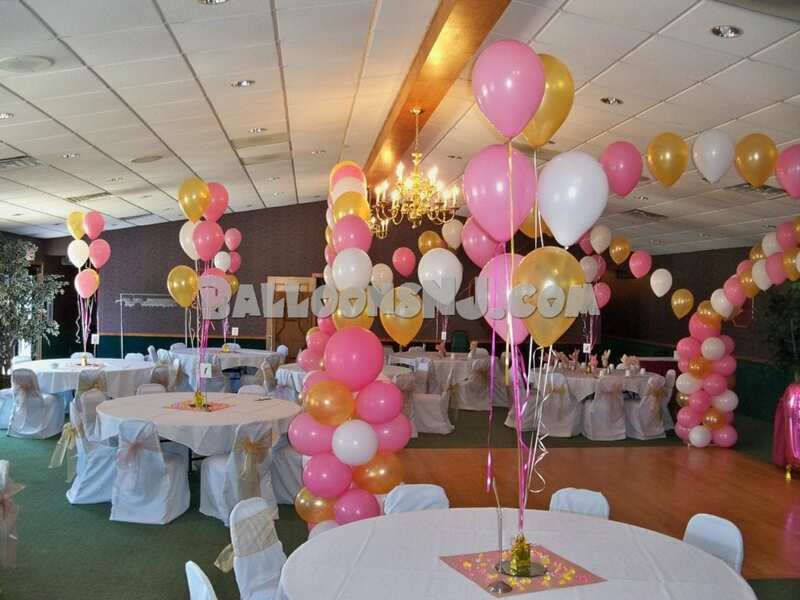 We can mimic this with helium-filled cluster centerpieces. 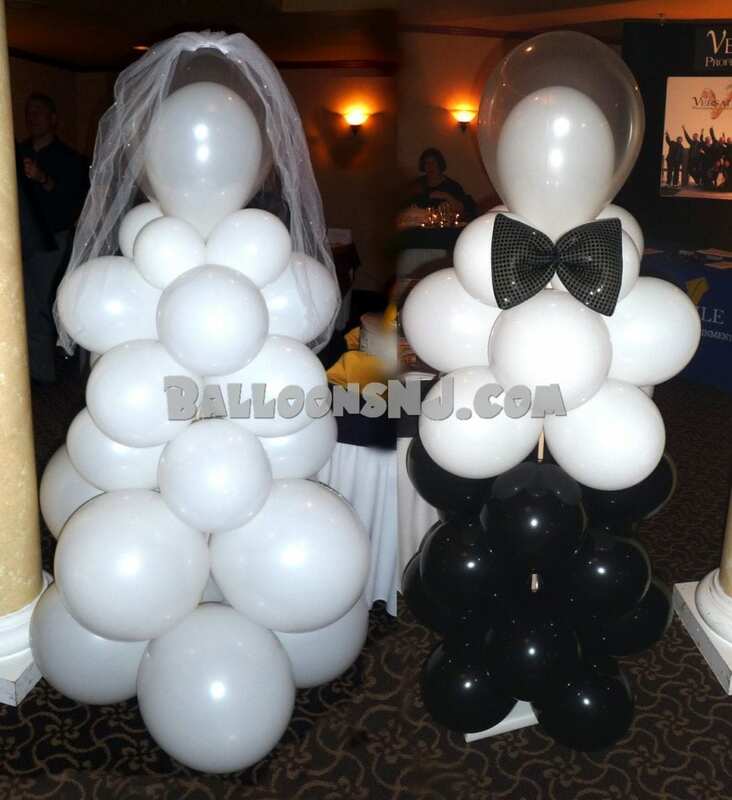 Balloon Sculptures – this is a catch-all decor type for us and it refers to all the stuff we do that doesn’t fall neatly into the other categories. 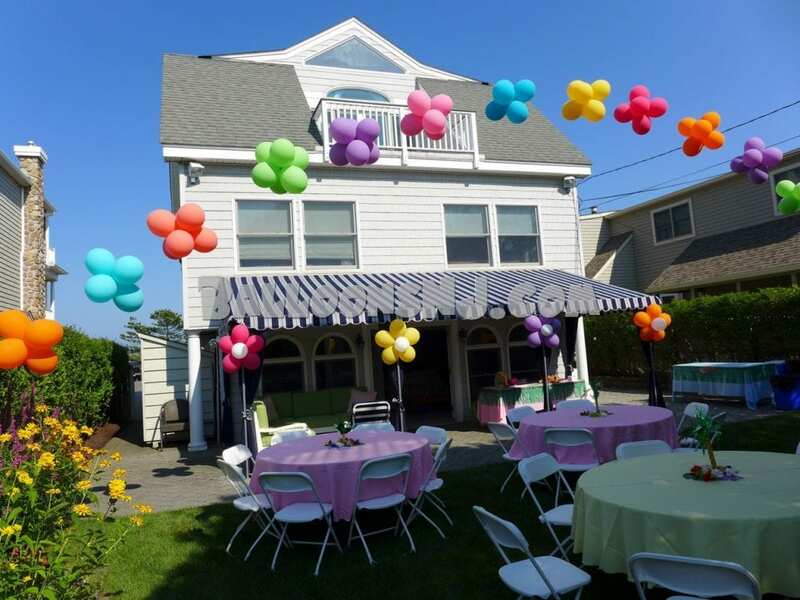 Balloon daisies tied to railings, fence posts, tent poles is one example. 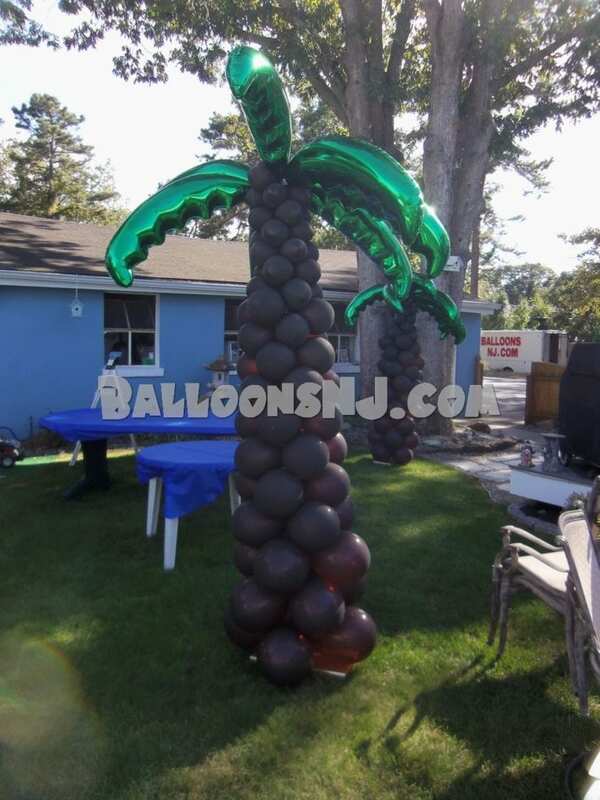 Balloon palm trees are columns.. and sculptures.